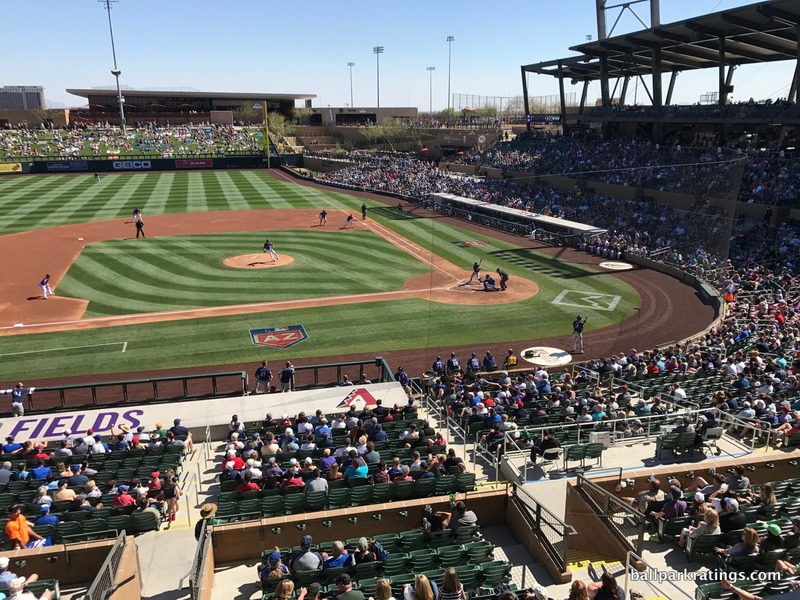 IMPORTANT NOTE: Ratings and ranking have now been posted based on attendance at 2018 spring training. 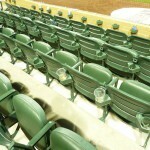 New reviews have not been written, and most reviews from 2011 will be partially rewritten. 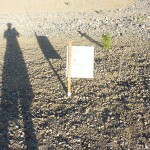 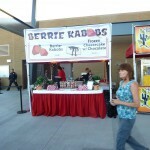 Photo Gallery has been added. 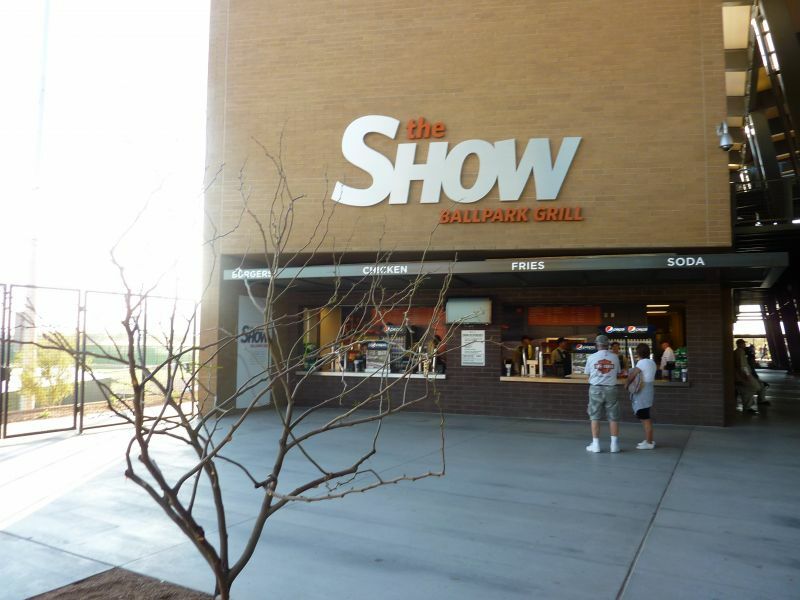 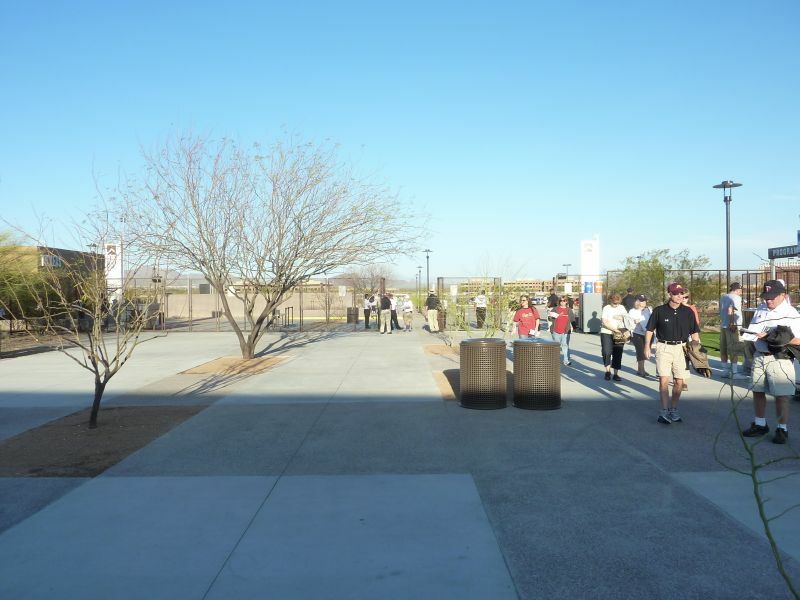 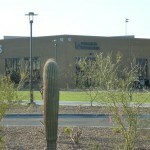 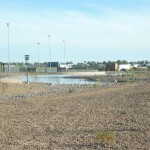 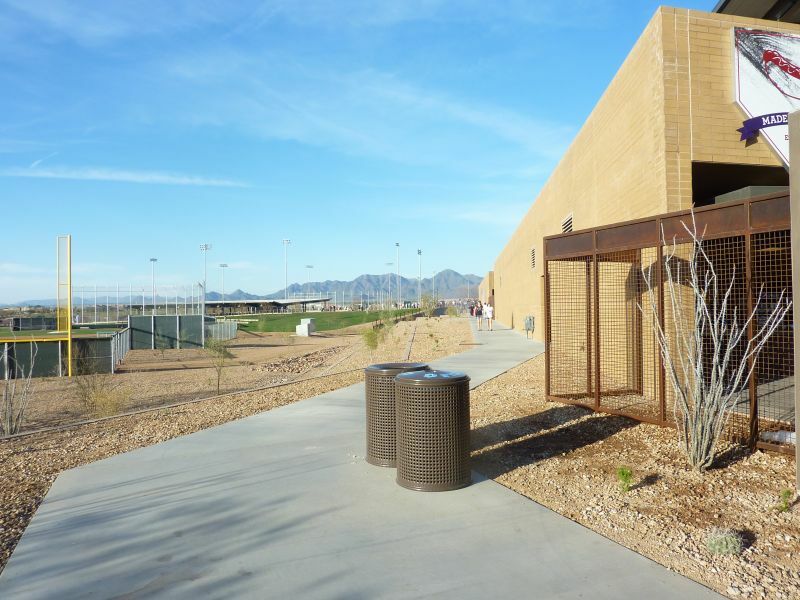 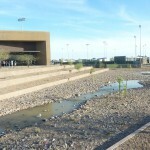 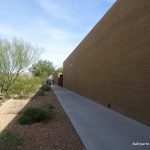 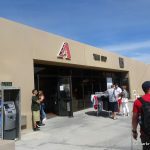 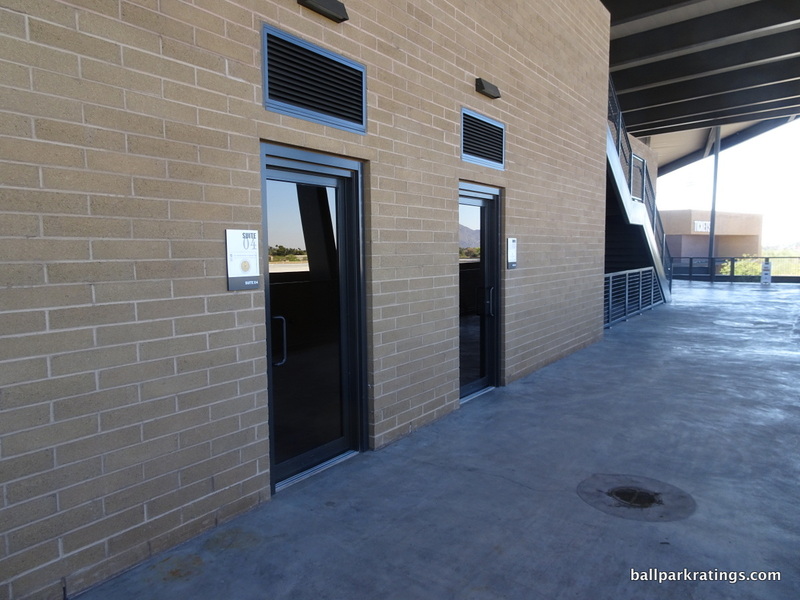 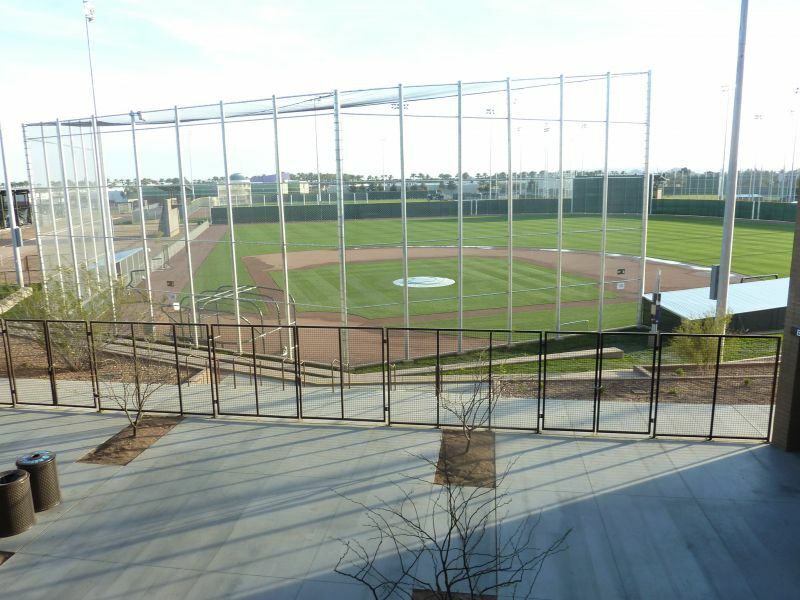 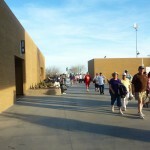 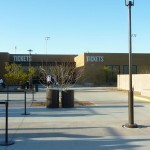 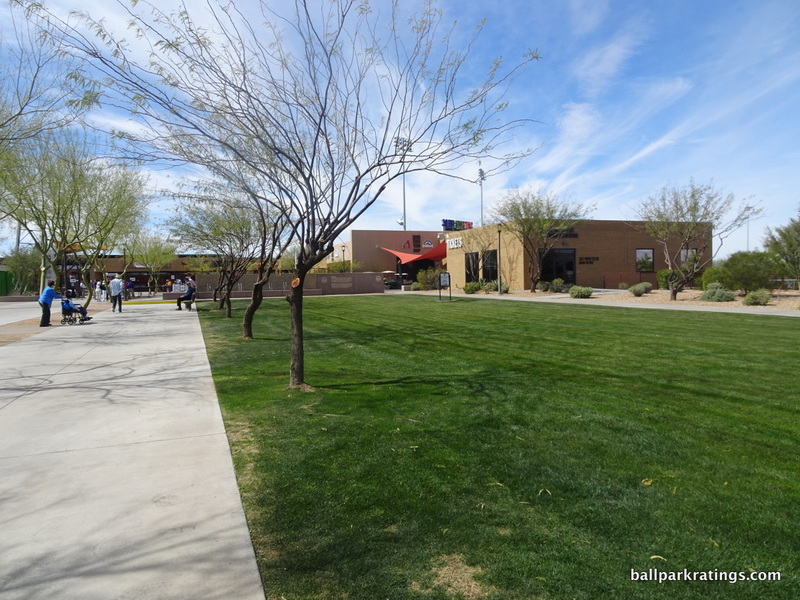 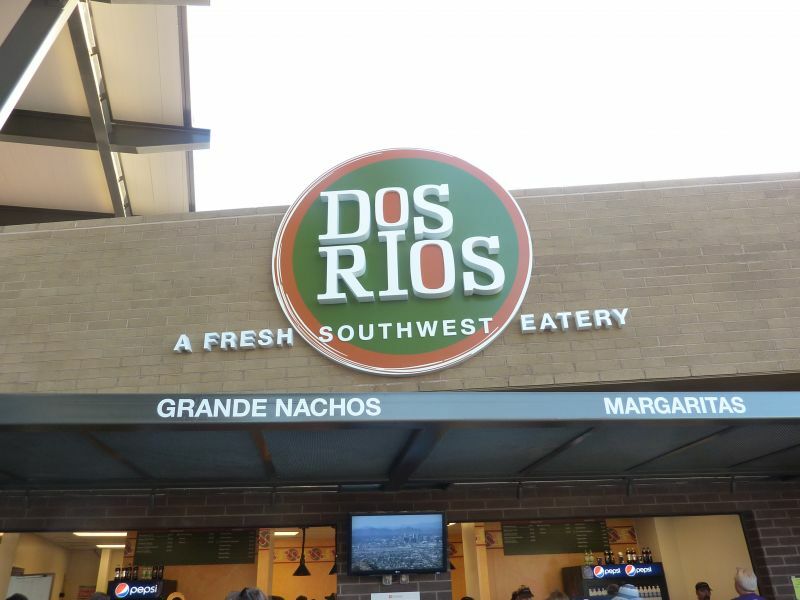 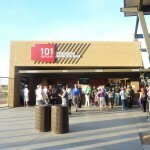 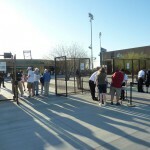 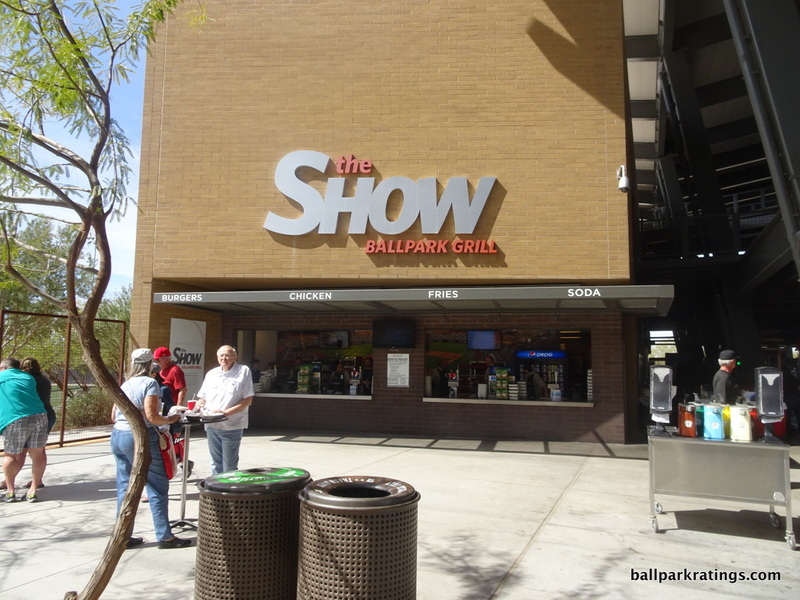 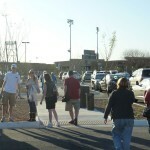 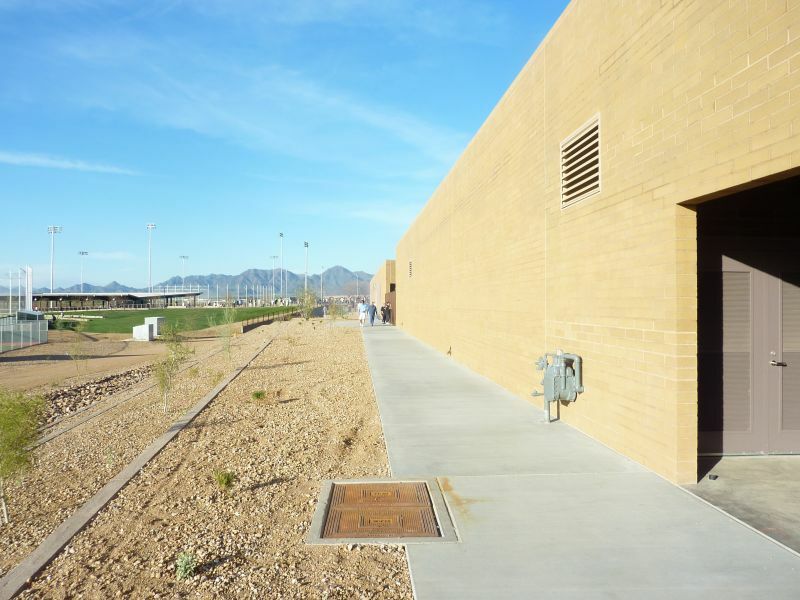 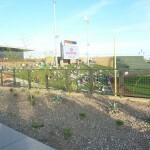 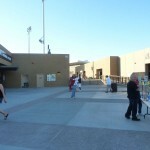 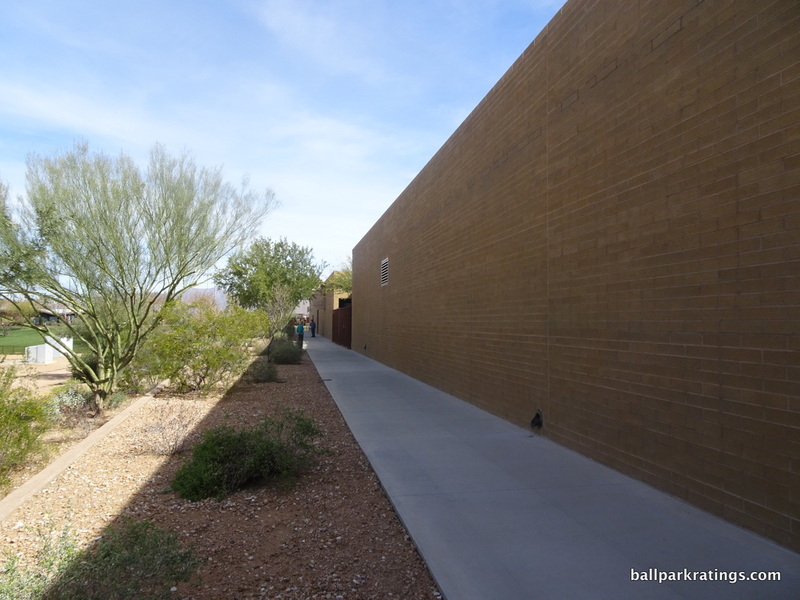 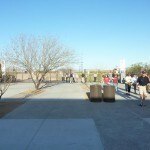 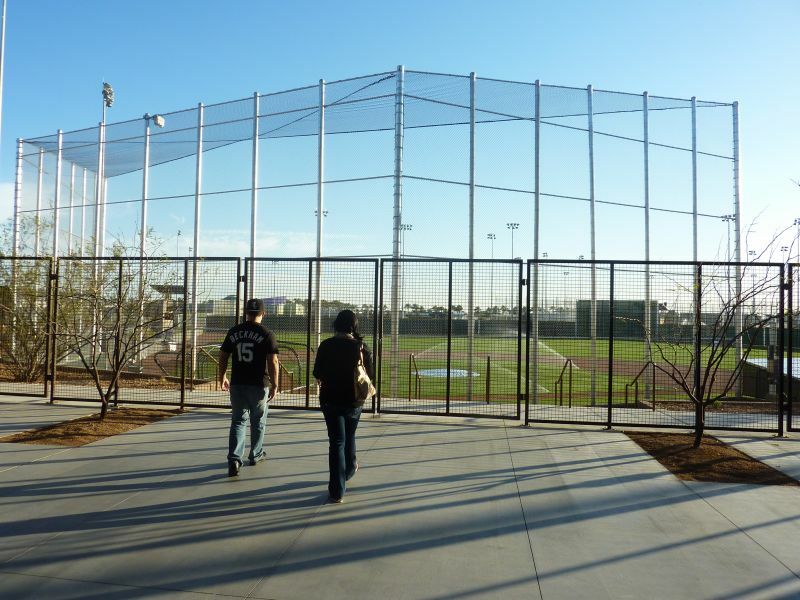 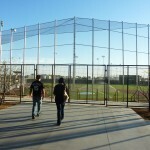 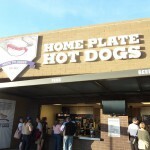 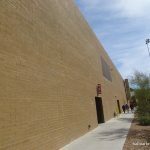 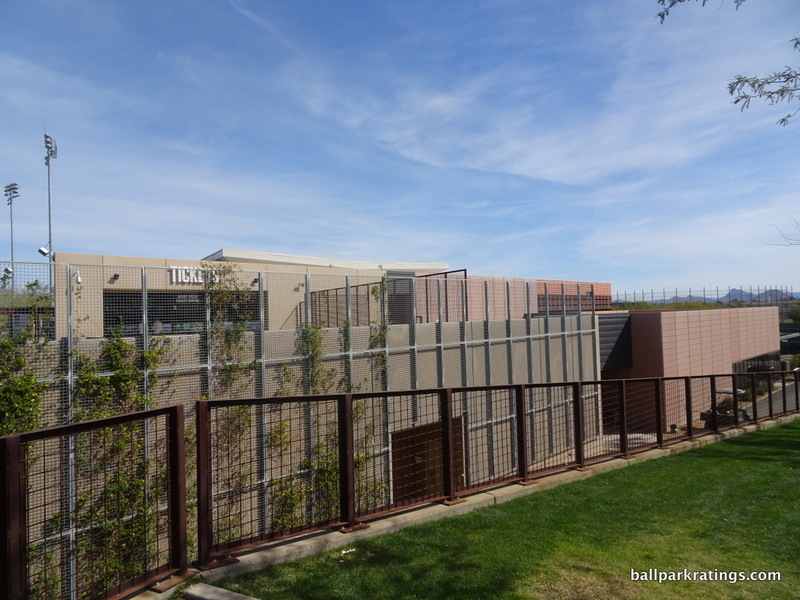 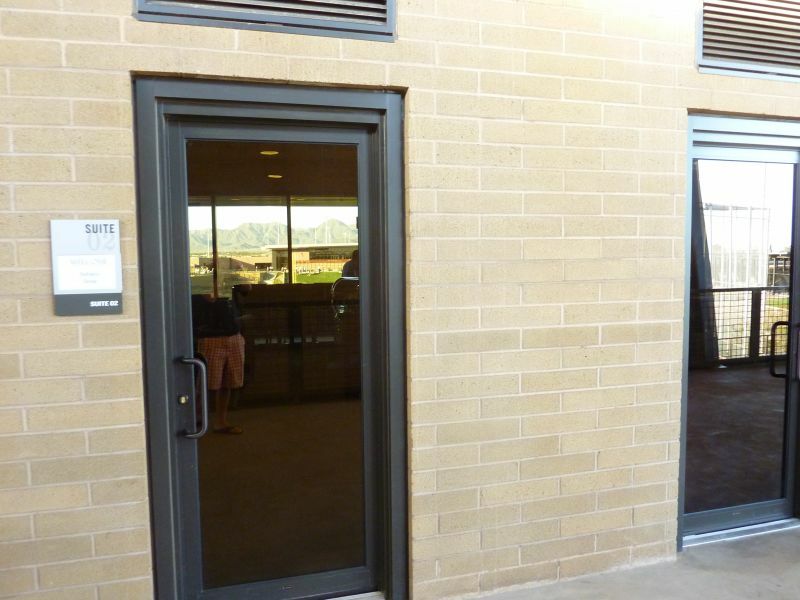 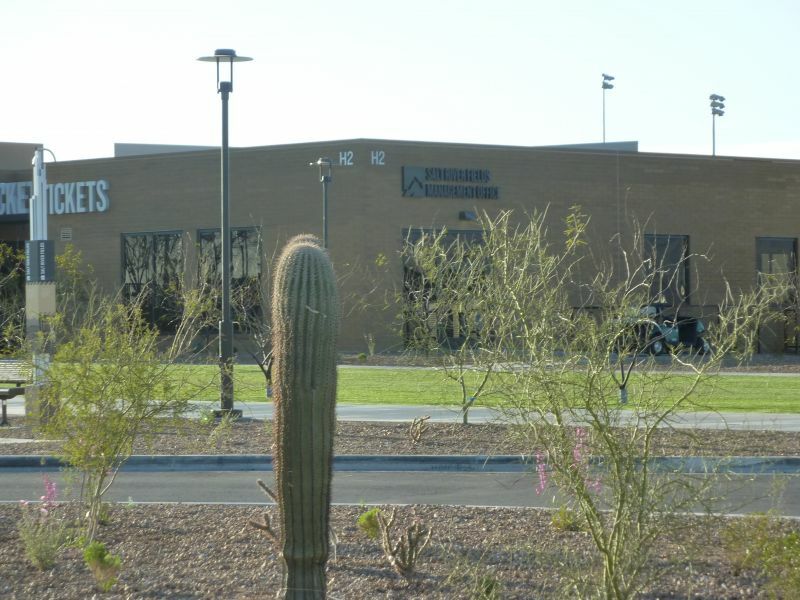 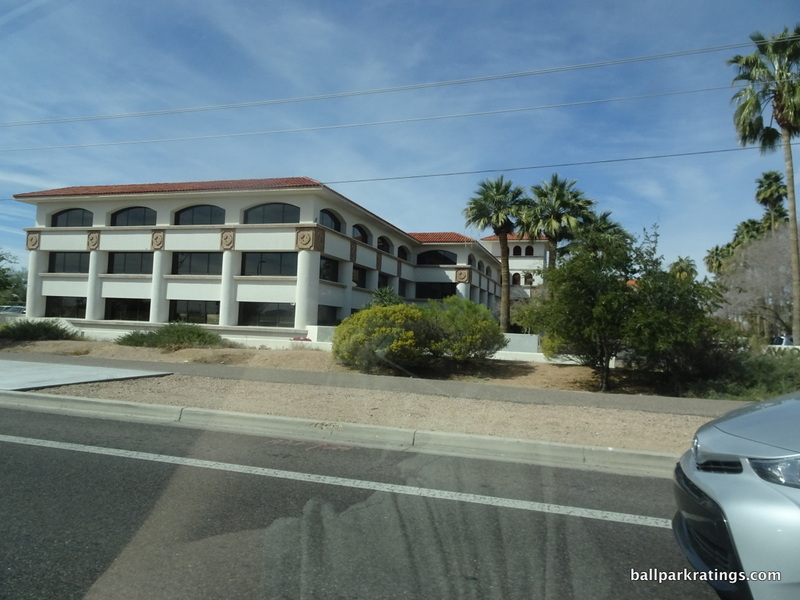 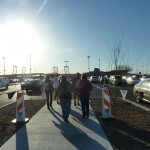 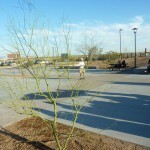 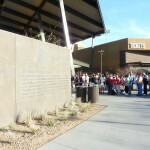 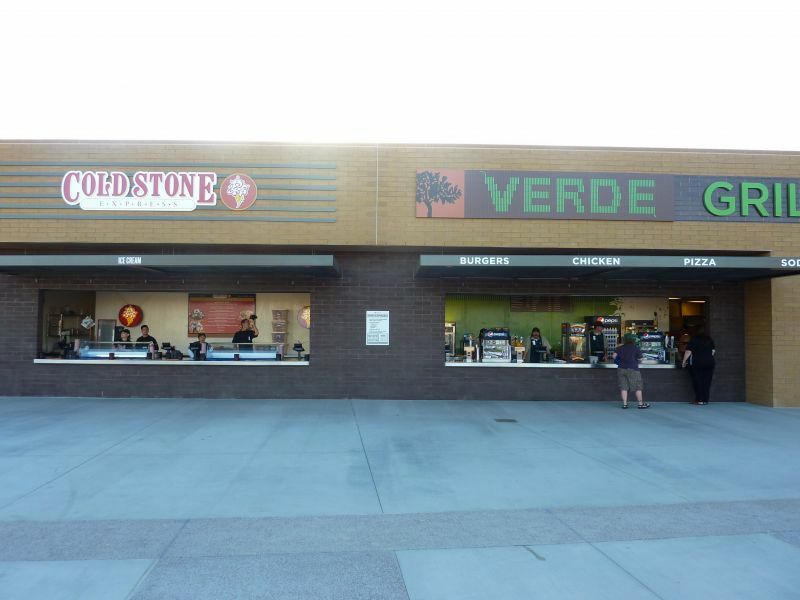 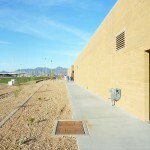 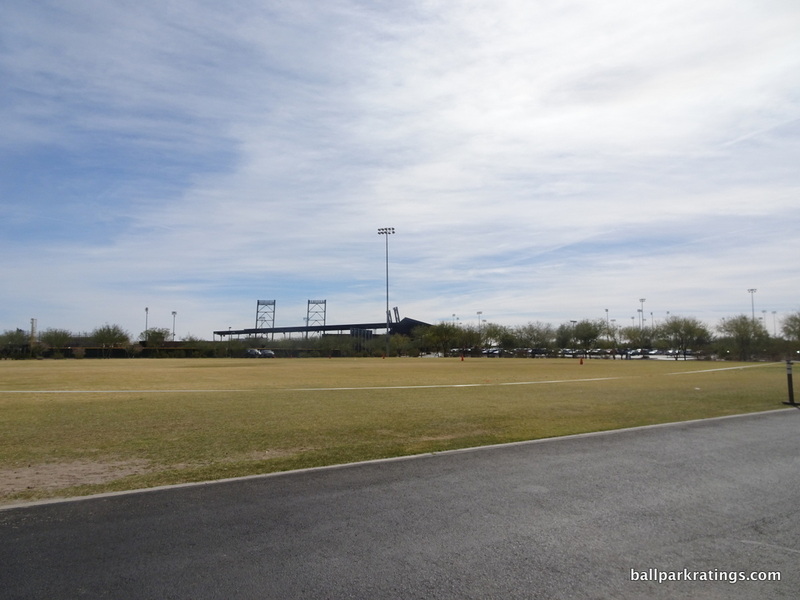 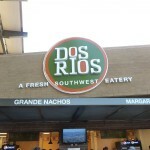 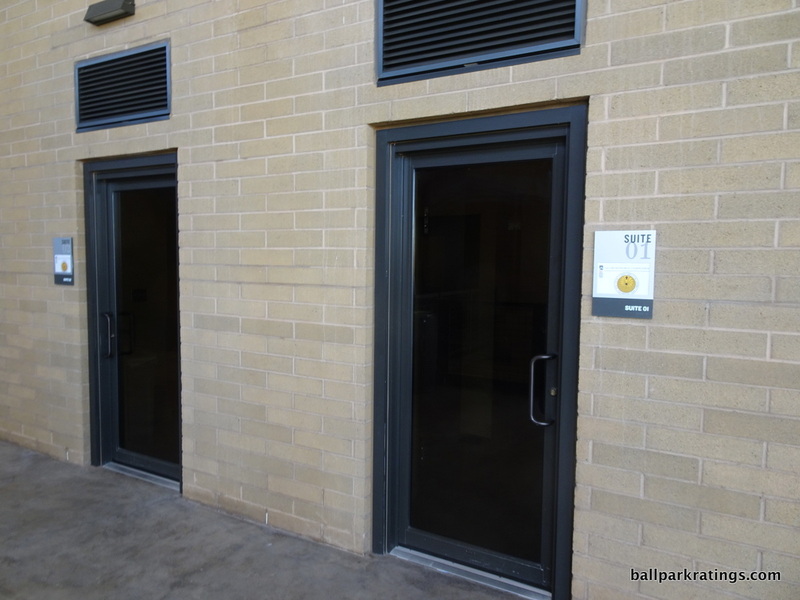 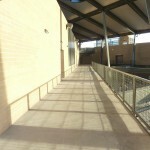 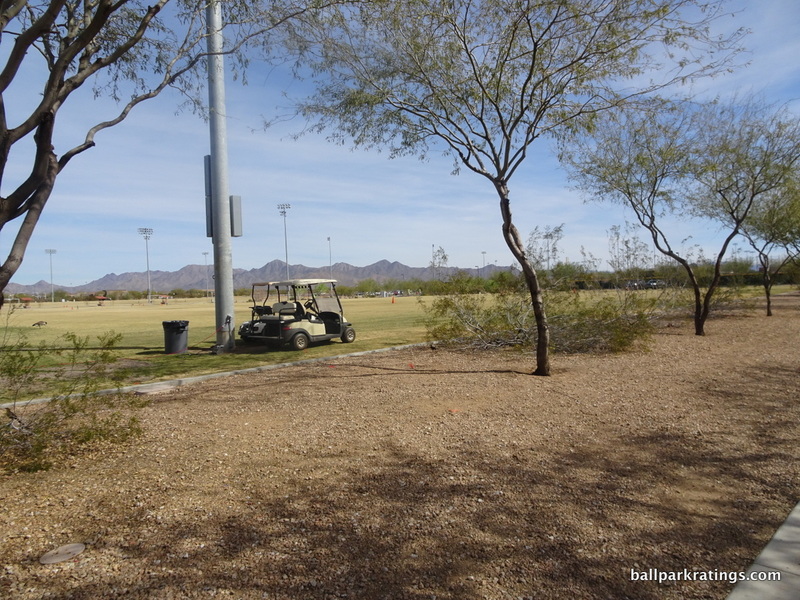 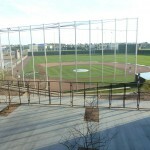 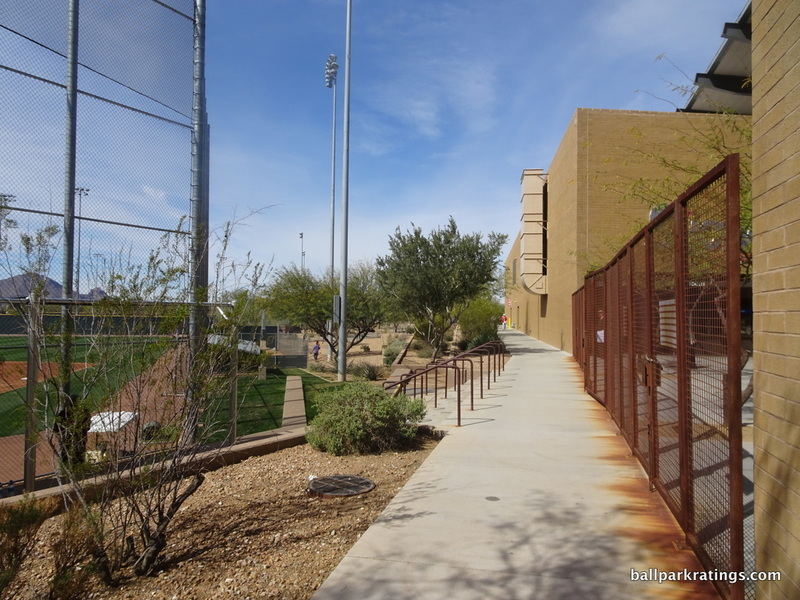 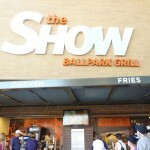 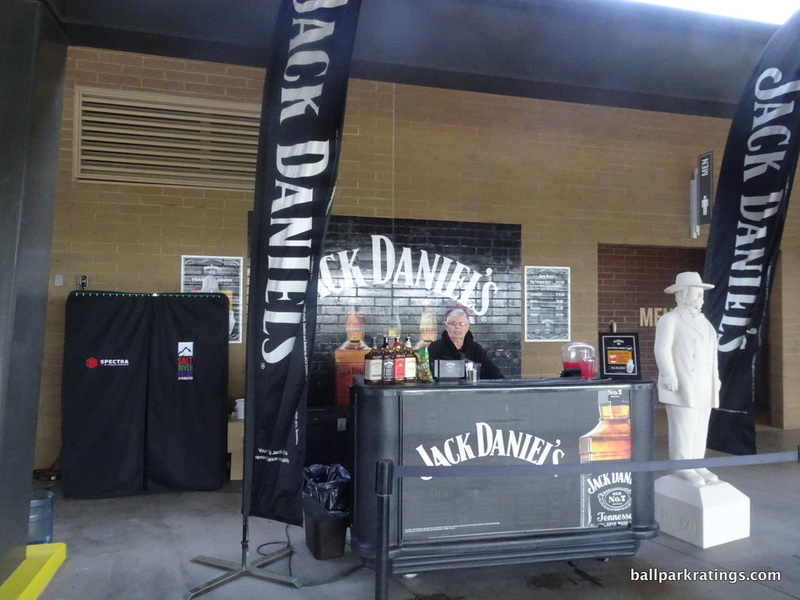 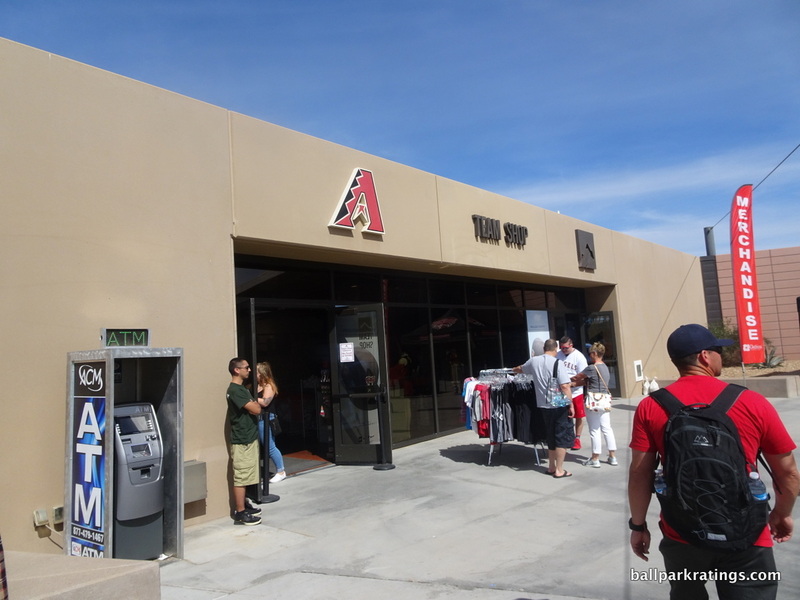 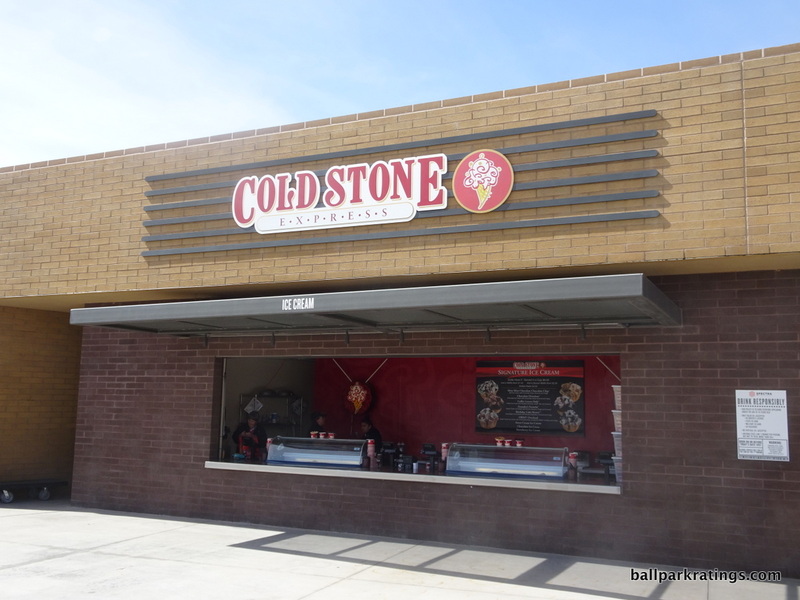 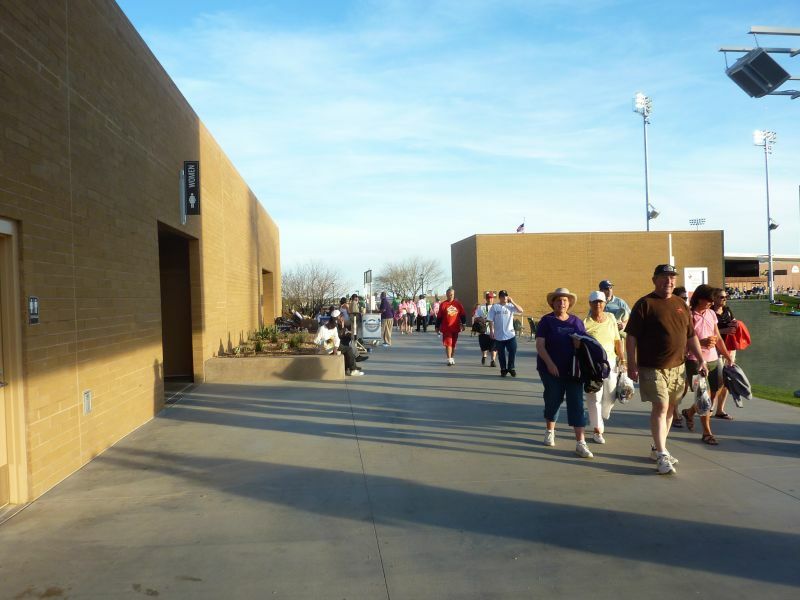 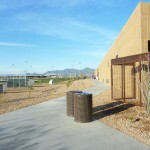 Before spring training 2011, I remember approaching this new facility with distinct ambivalence. 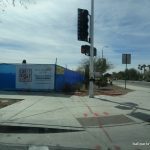 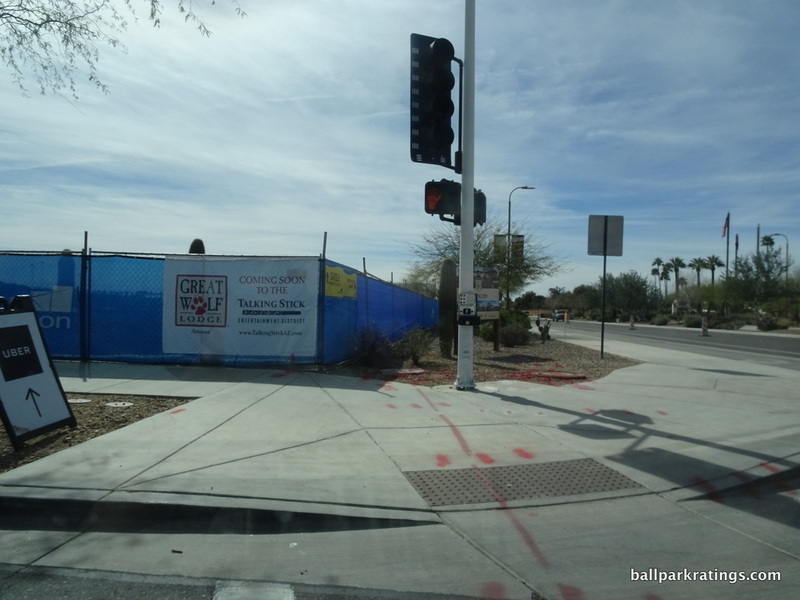 I knew it was supposed to be the next big thing, the one that was even going to top Camelback Ranch. 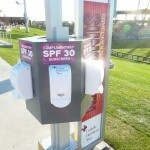 I knew its amenities and design were going to exceed anything I’ve seen before. 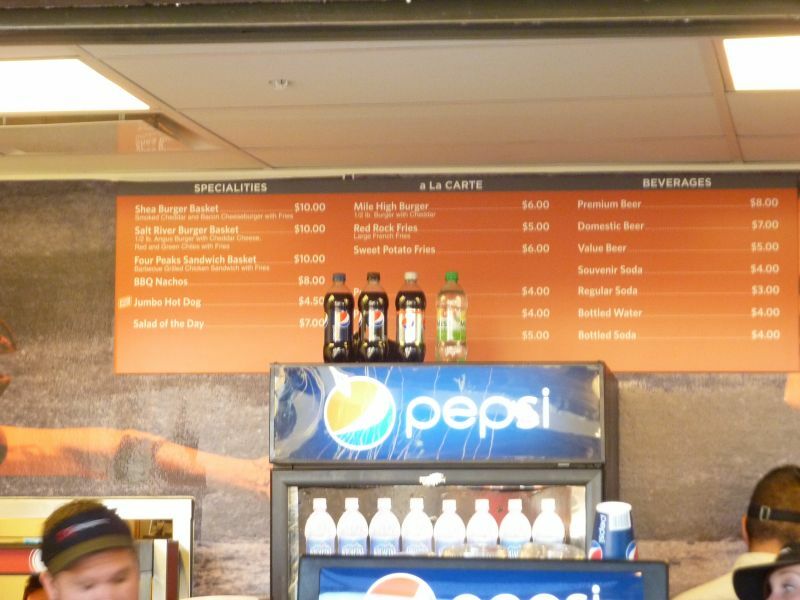 Of course it’s going to wow me now, but how much is that really worth? 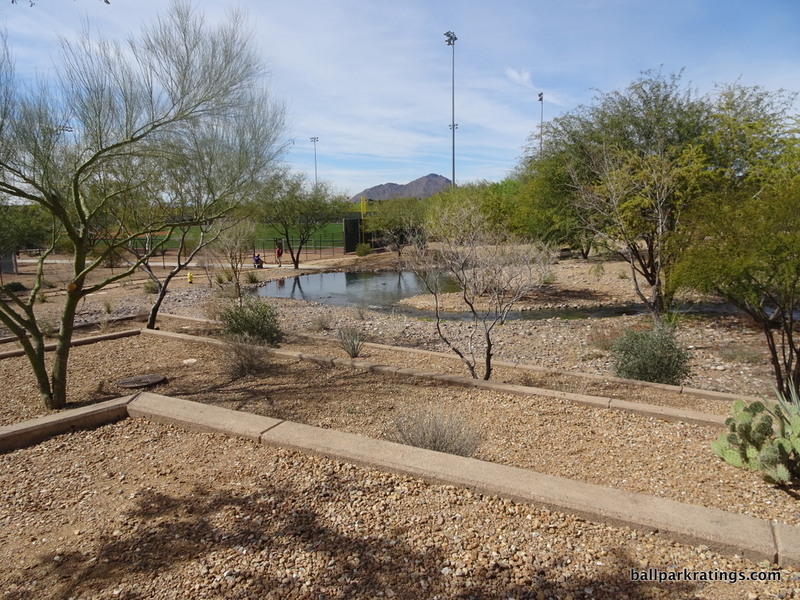 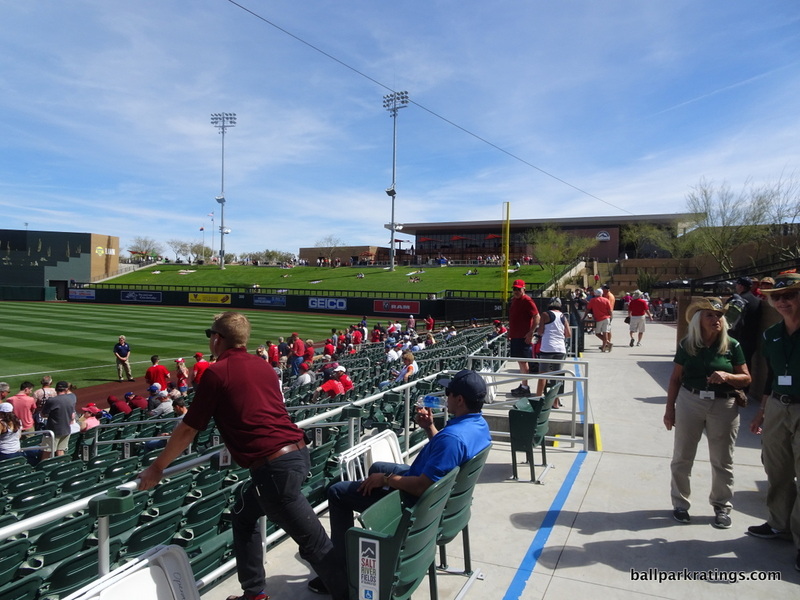 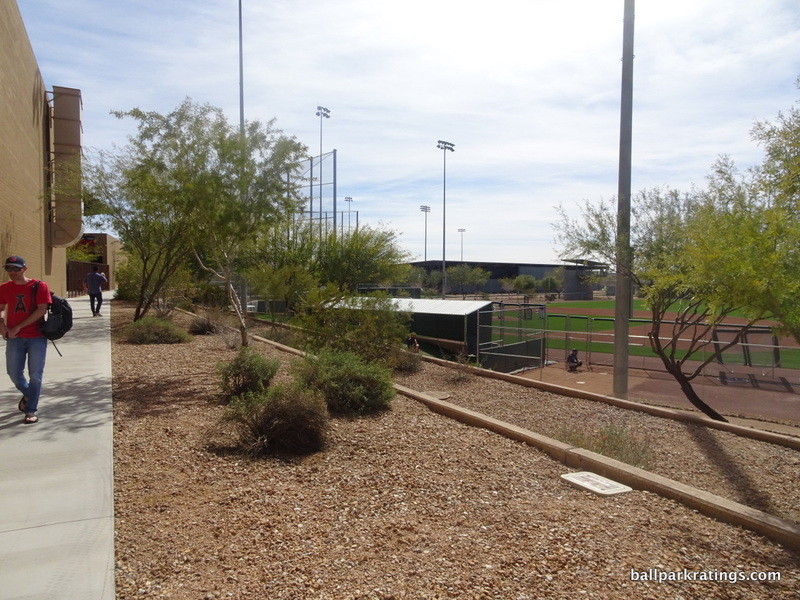 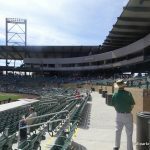 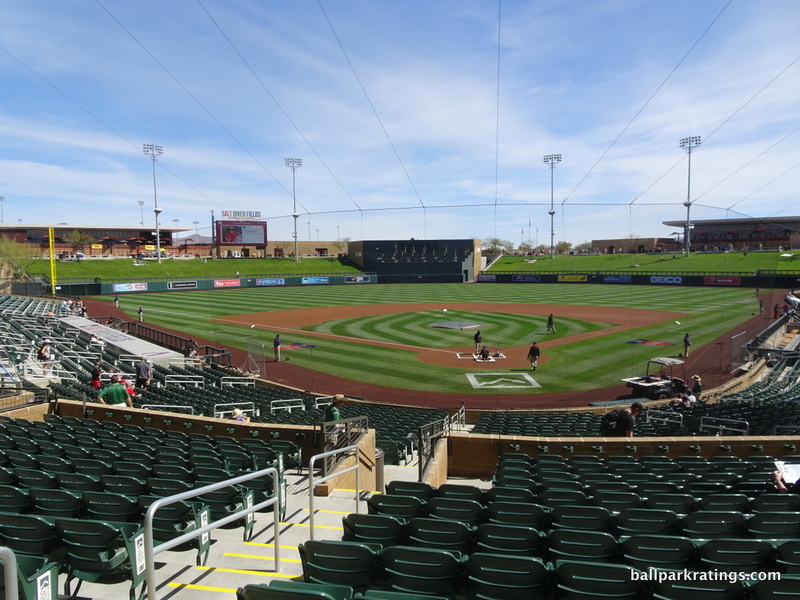 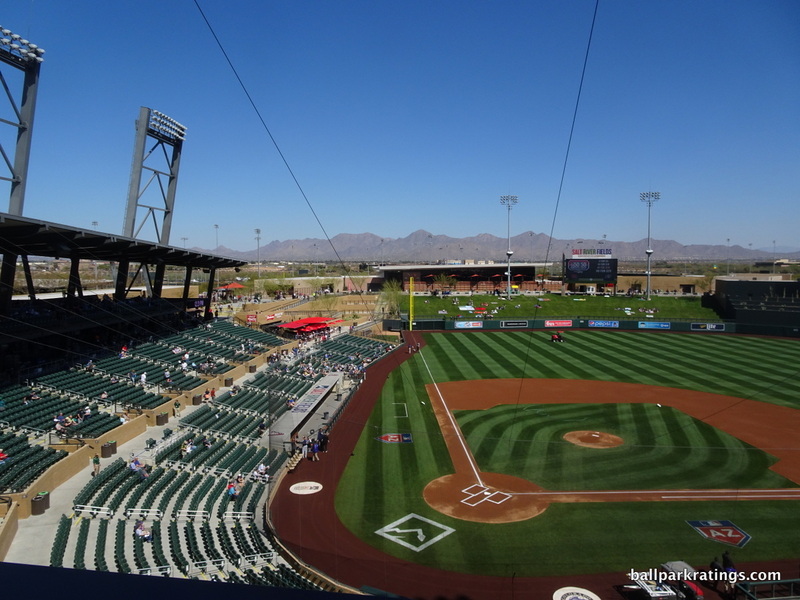 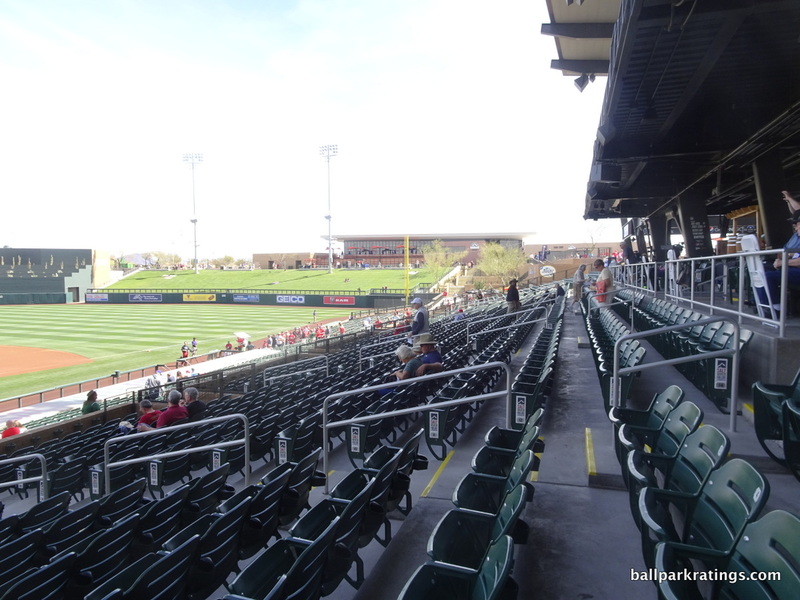 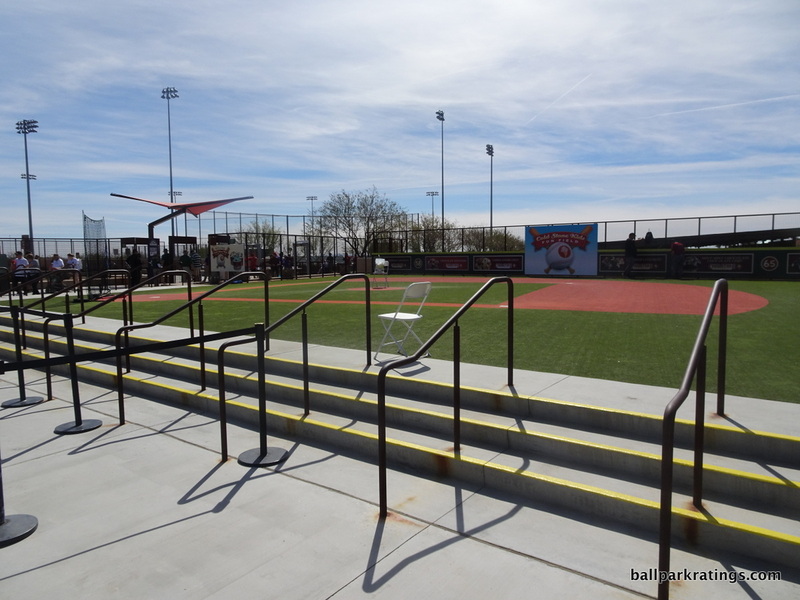 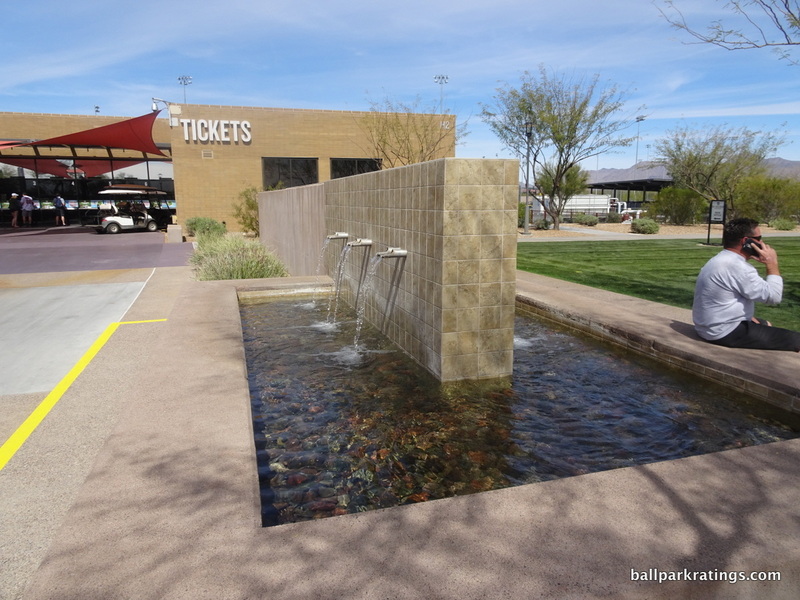 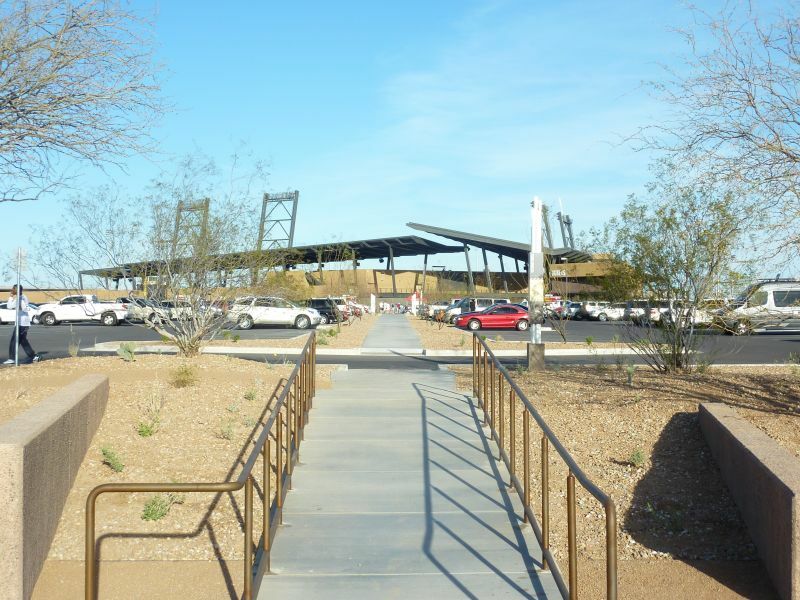 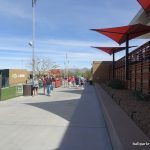 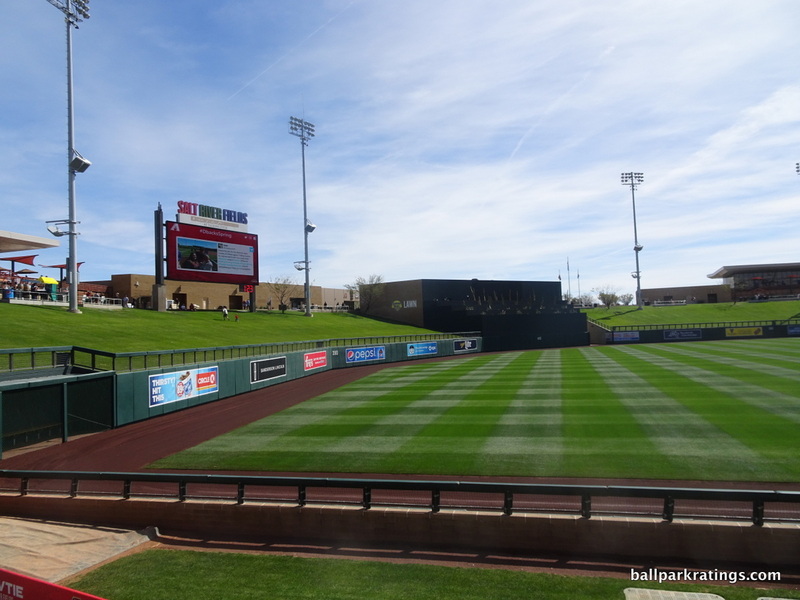 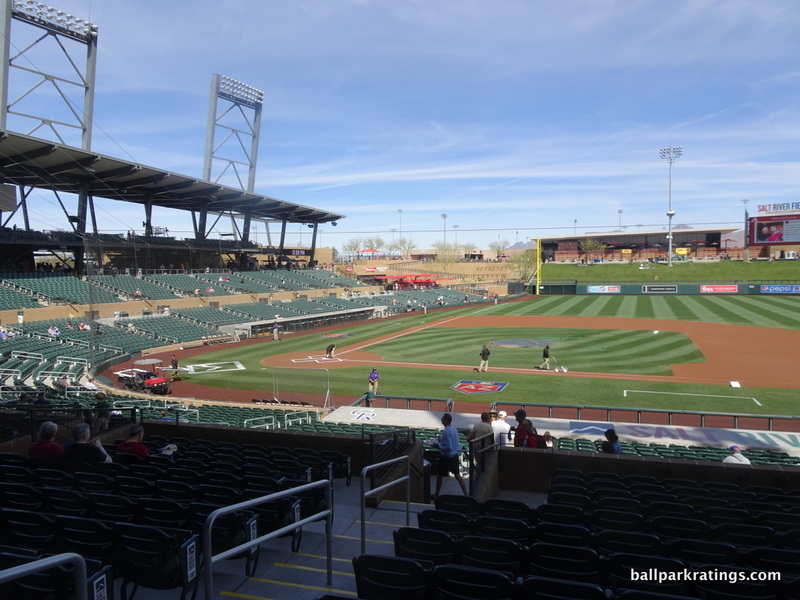 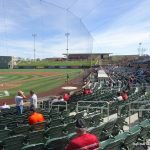 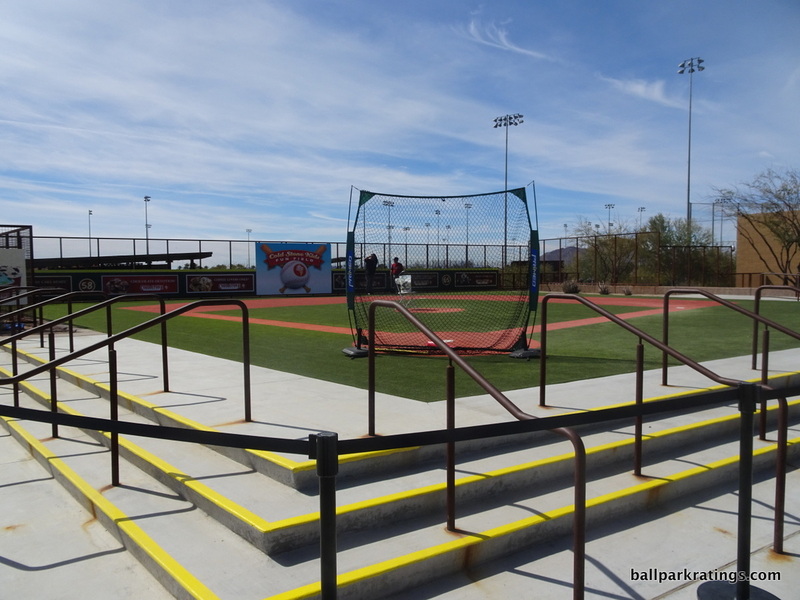 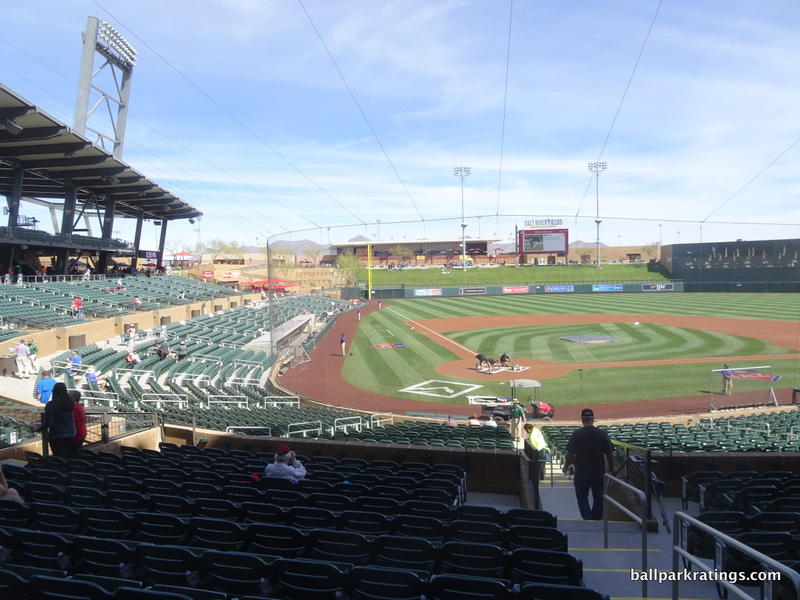 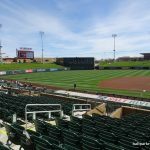 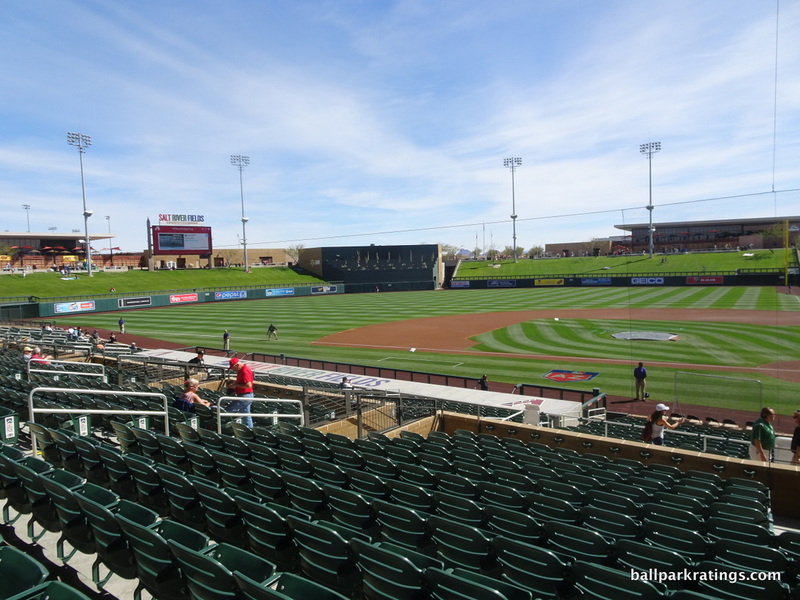 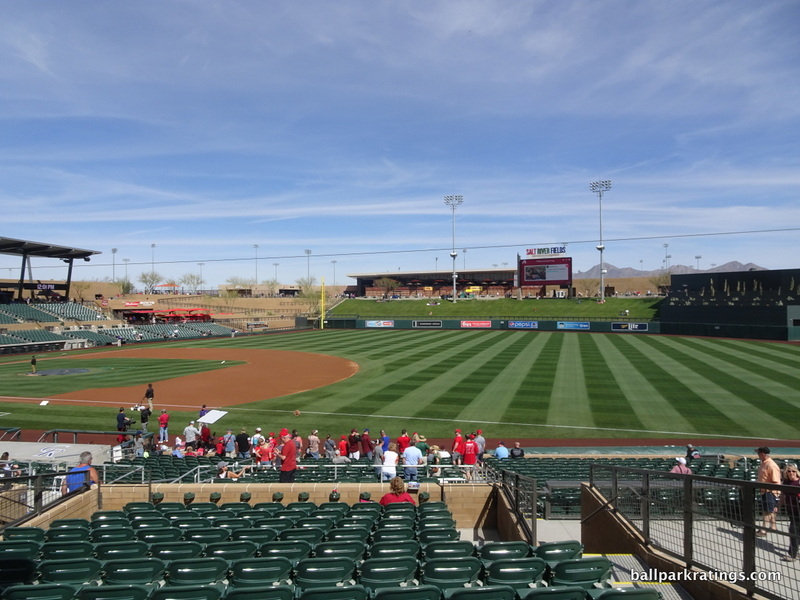 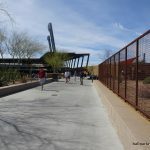 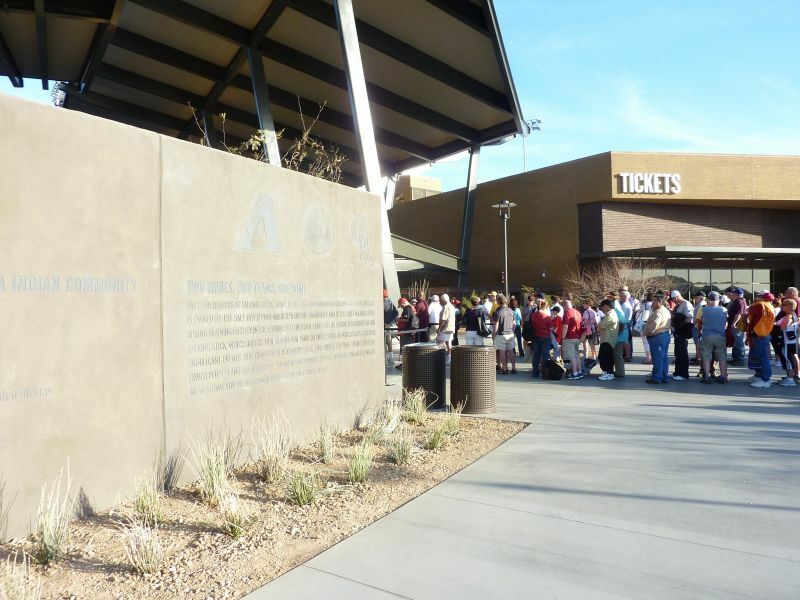 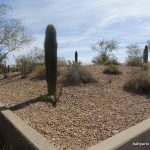 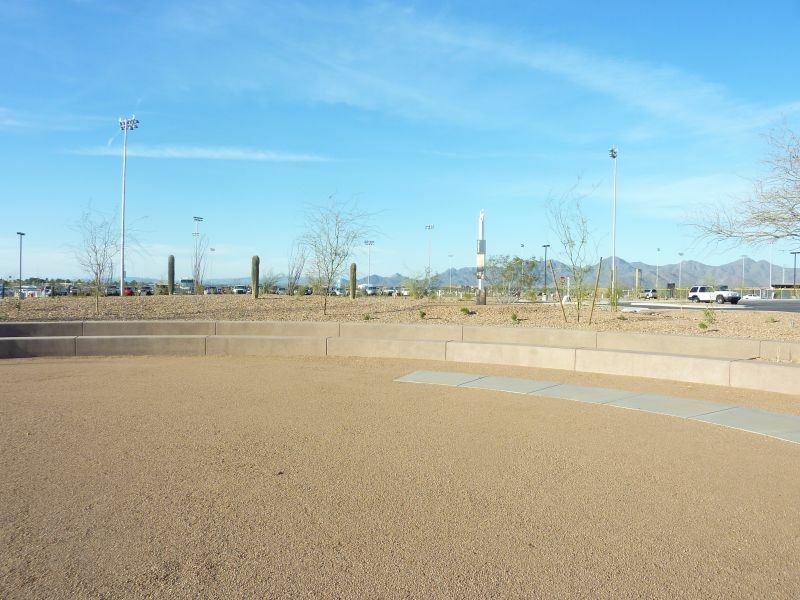 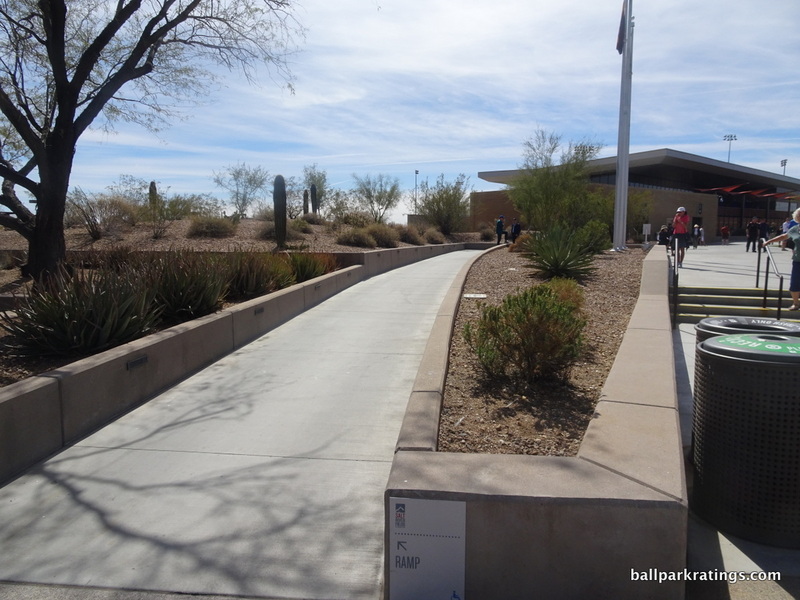 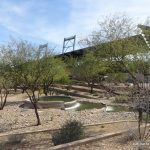 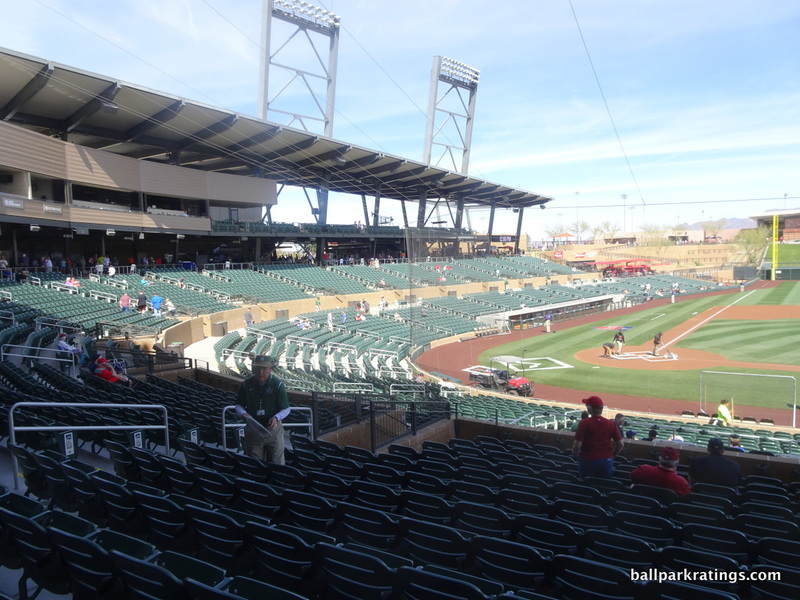 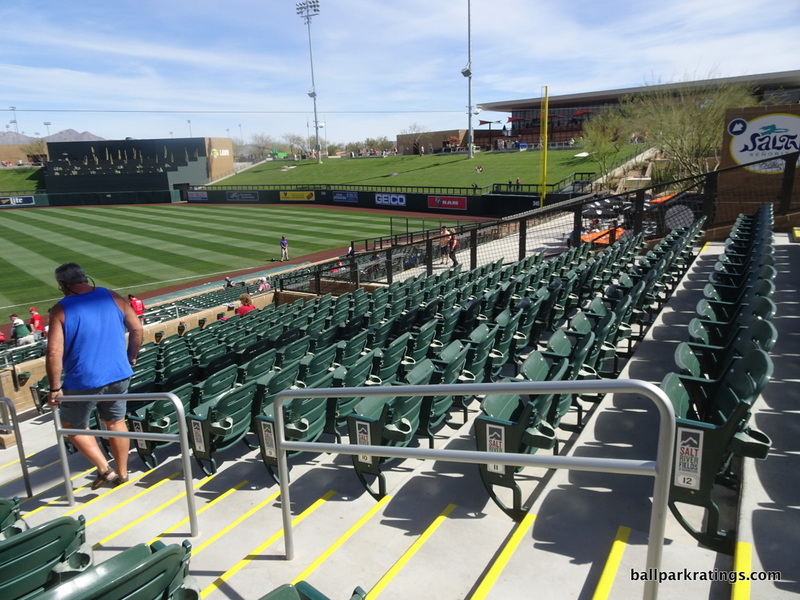 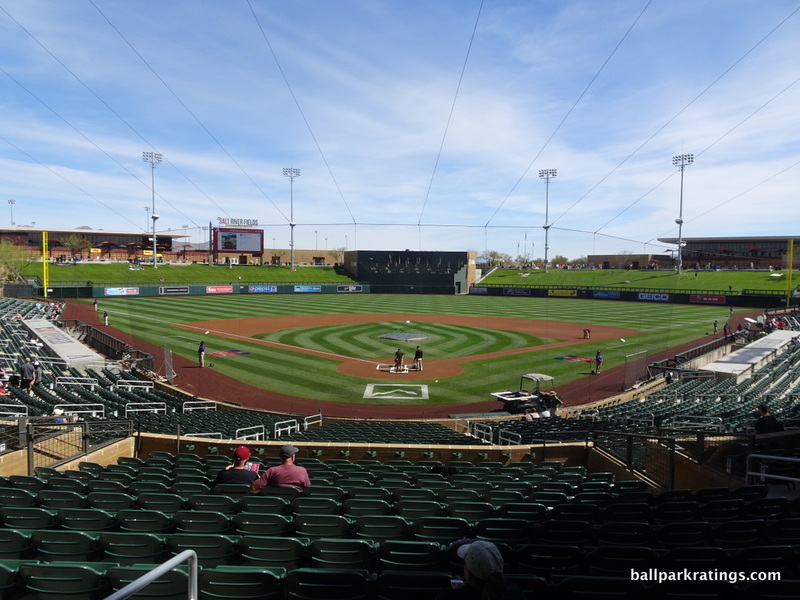 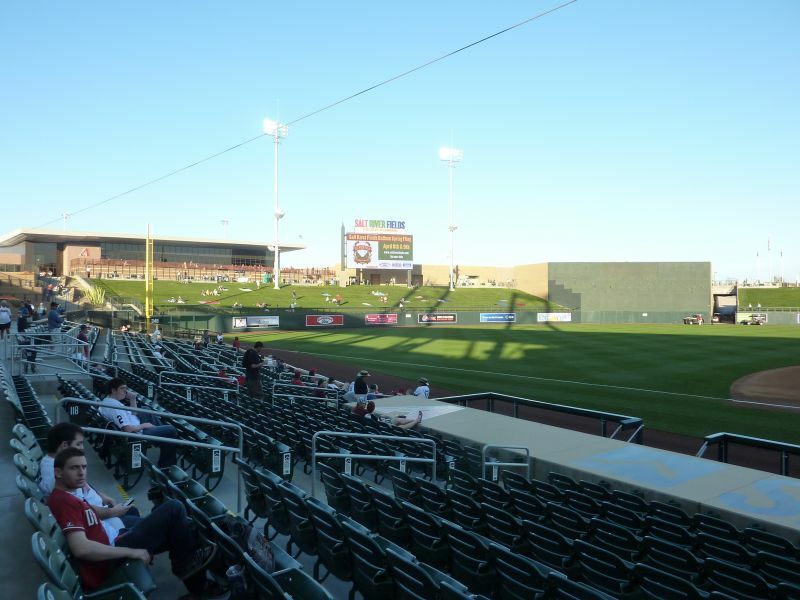 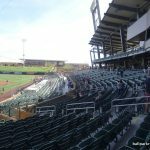 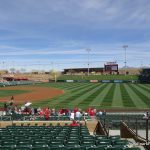 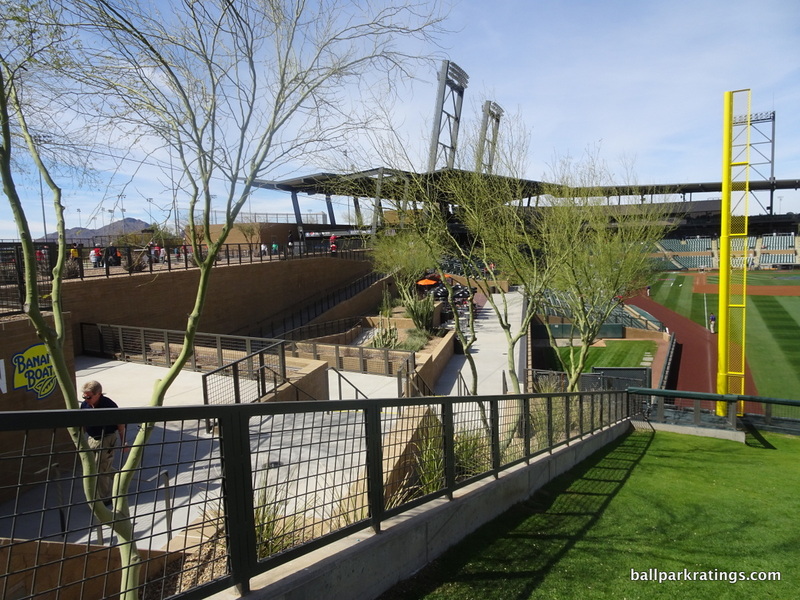 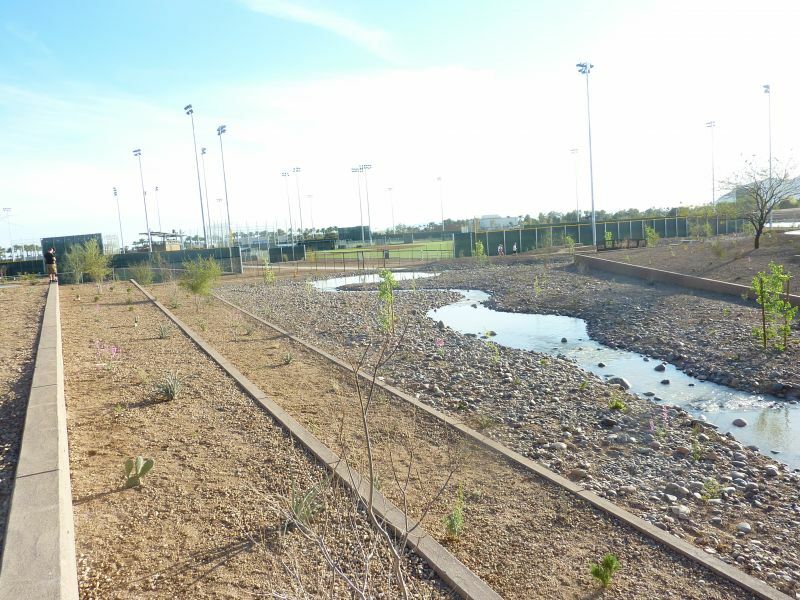 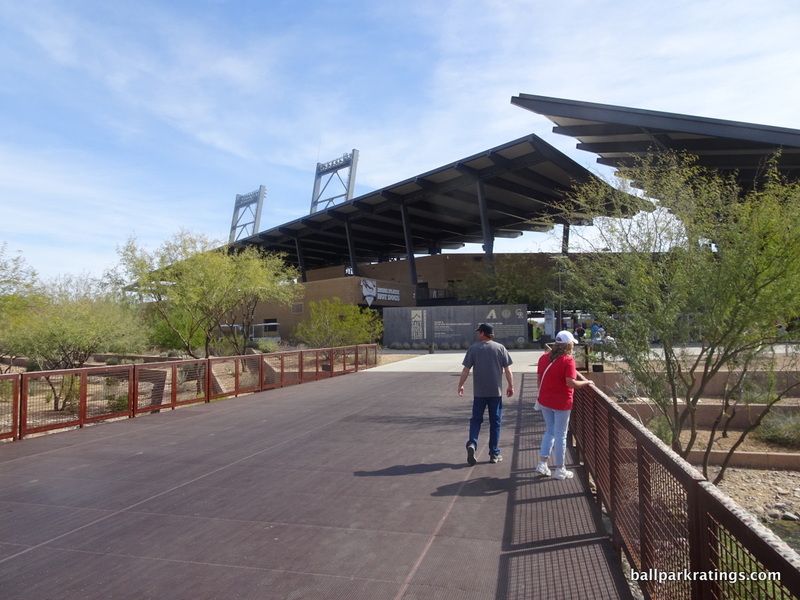 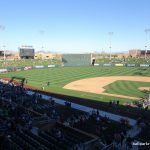 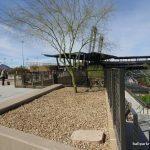 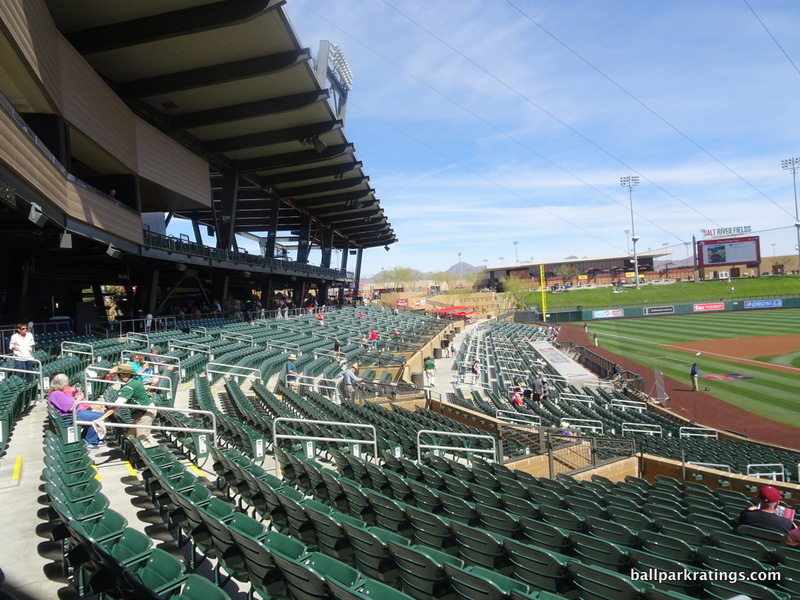 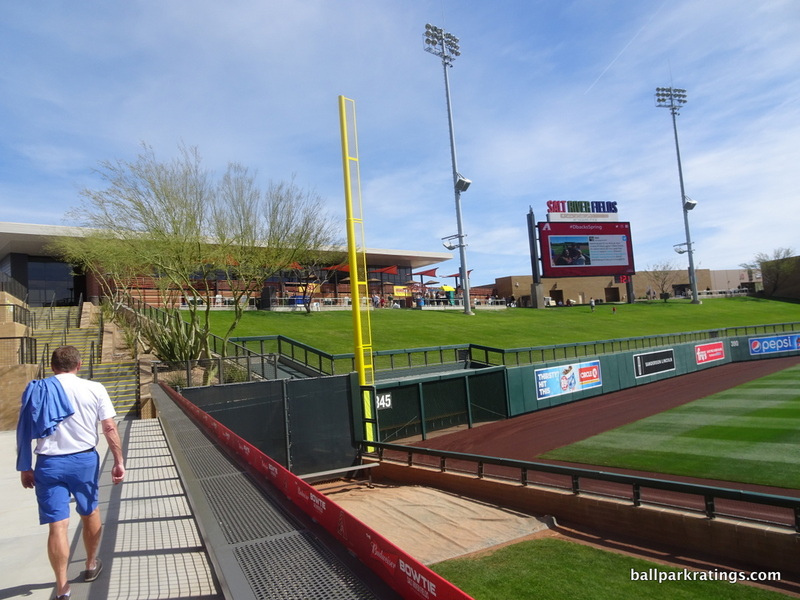 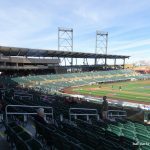 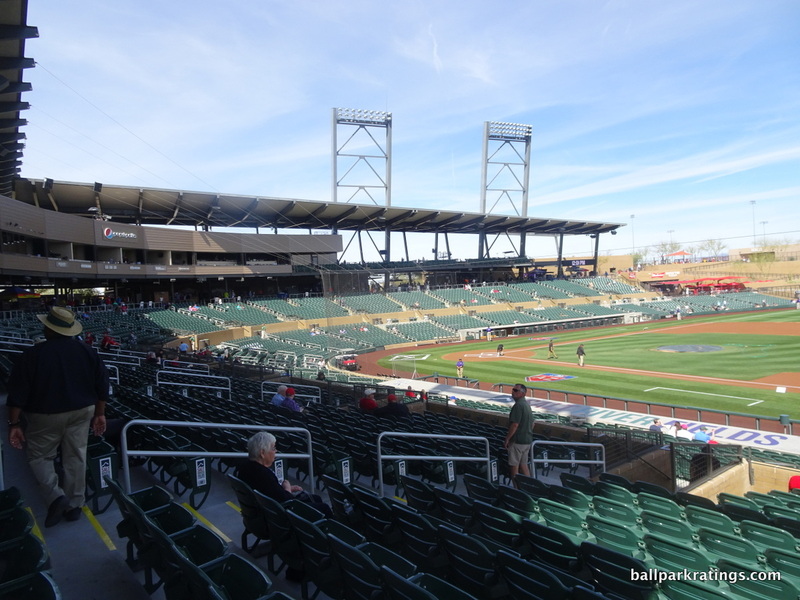 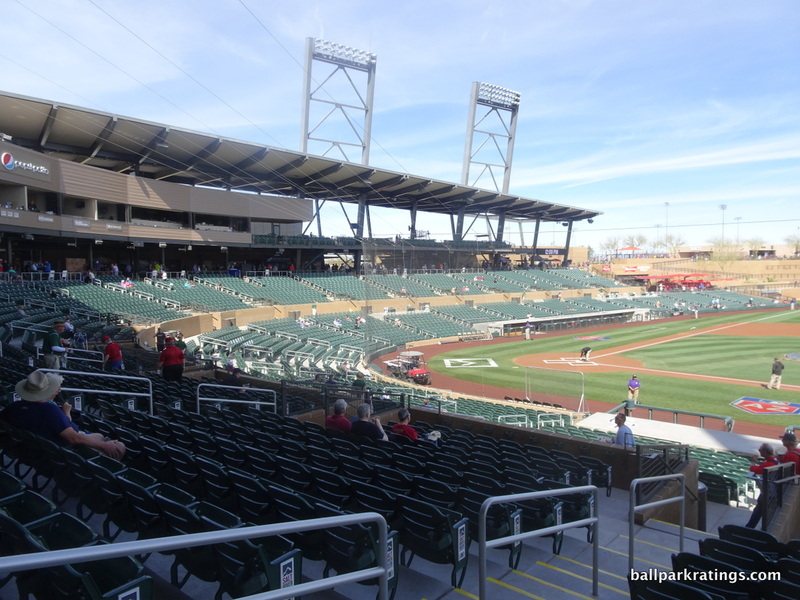 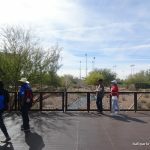 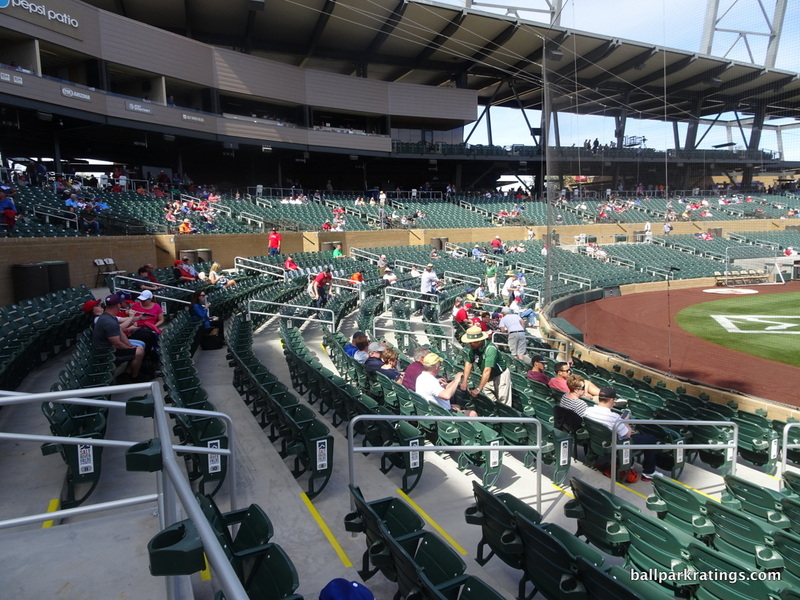 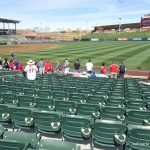 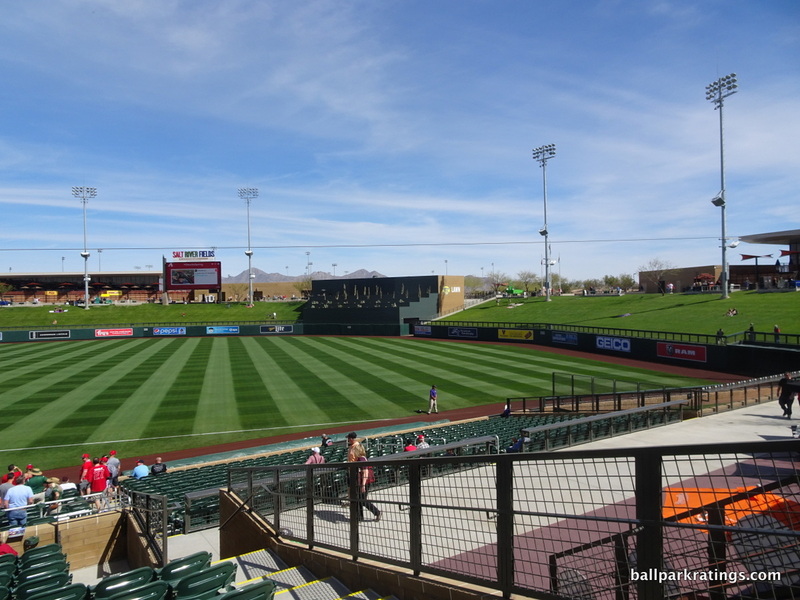 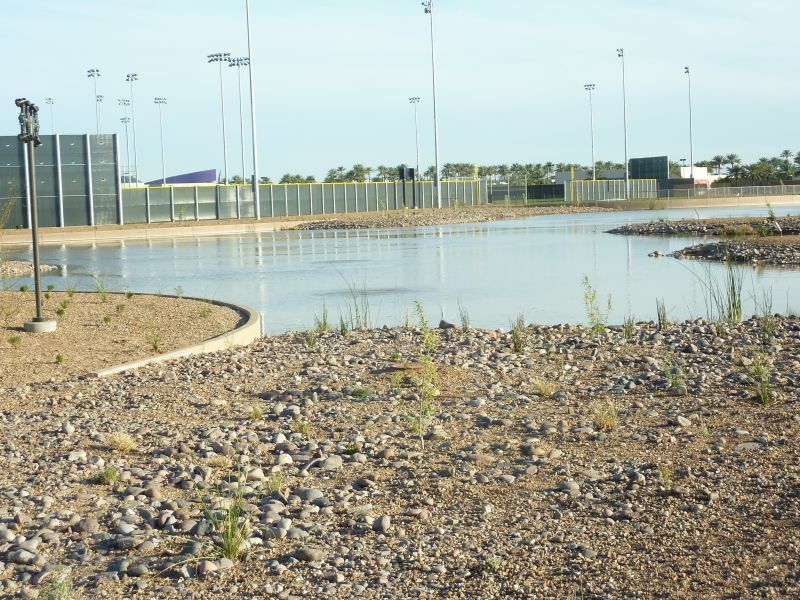 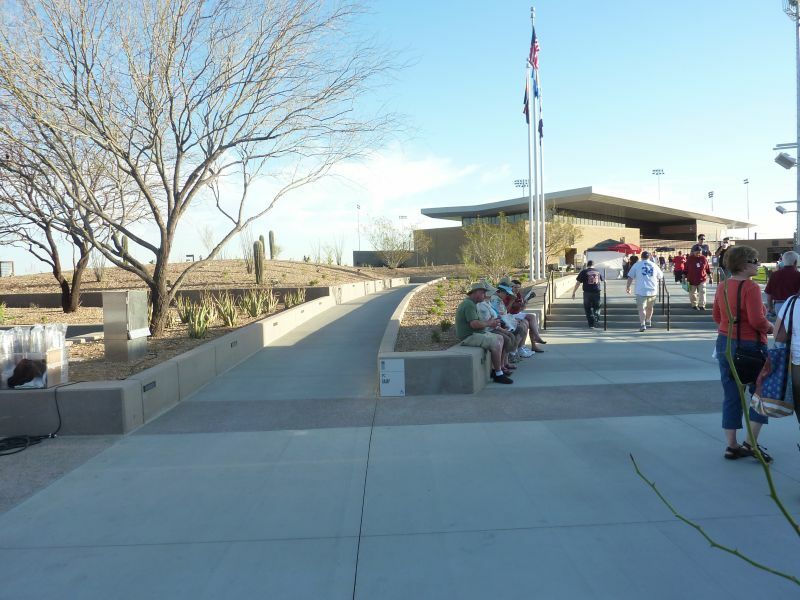 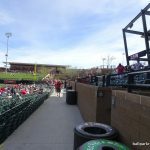 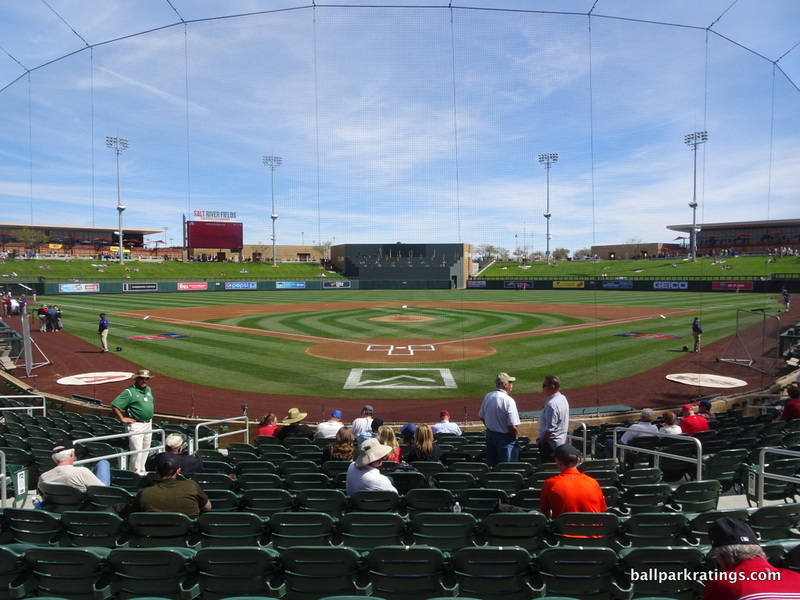 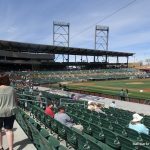 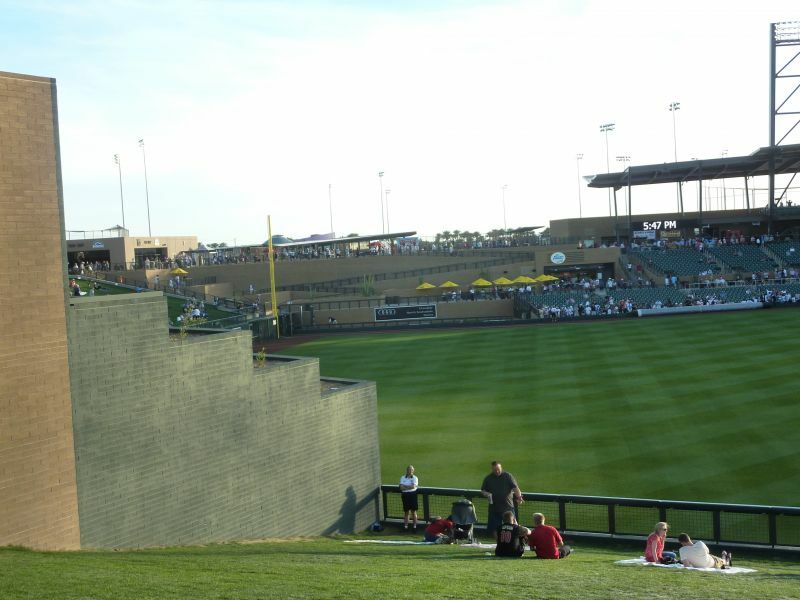 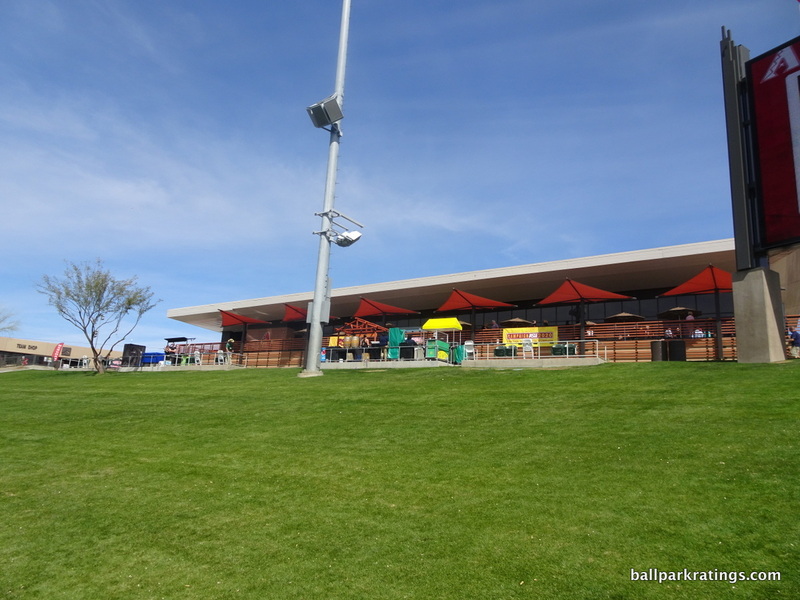 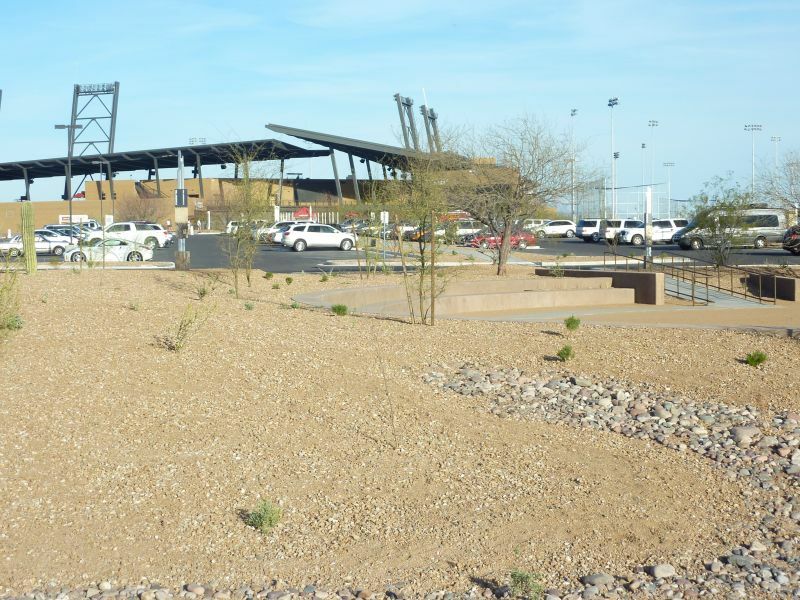 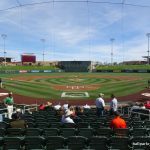 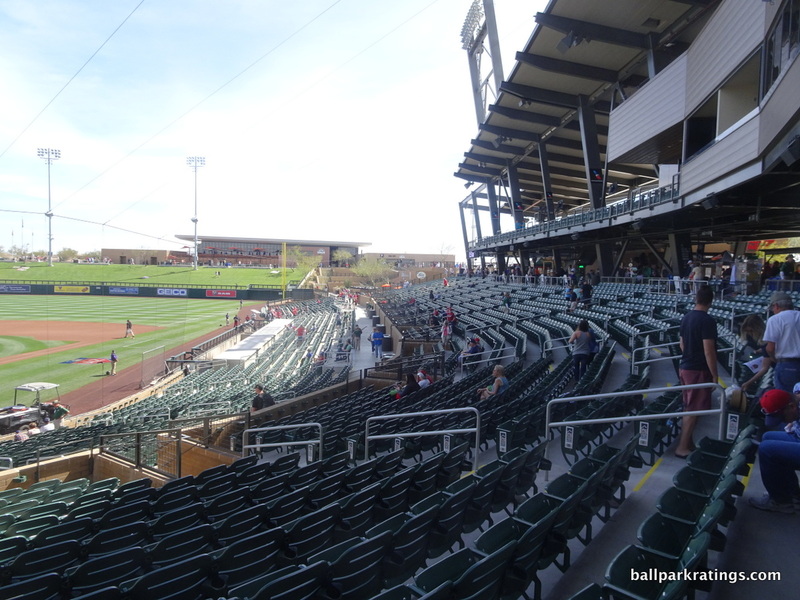 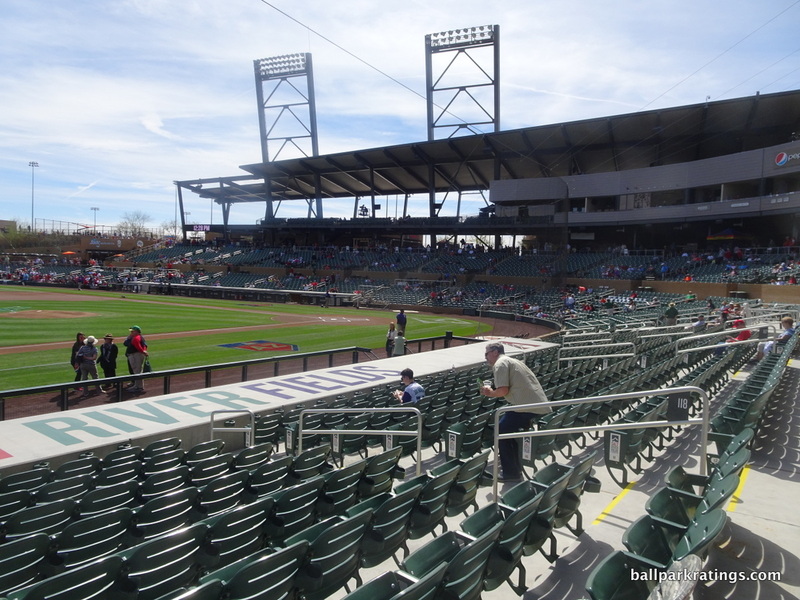 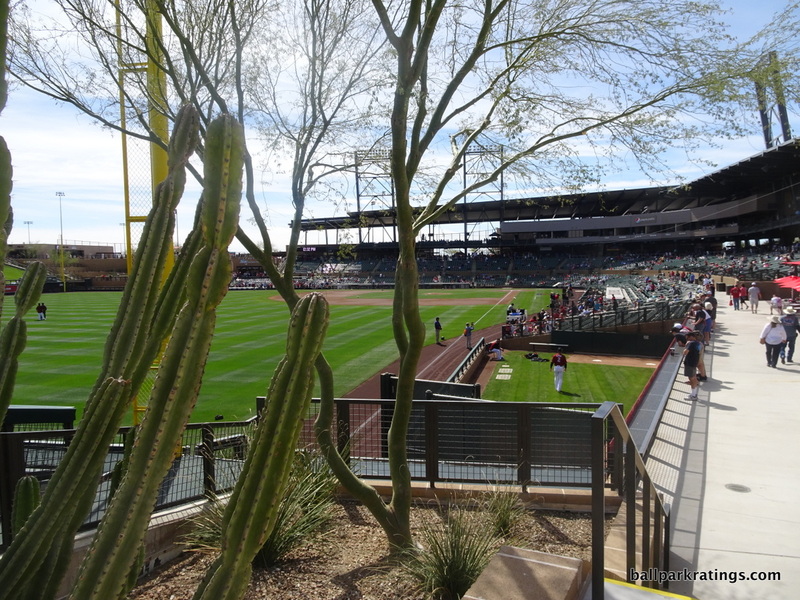 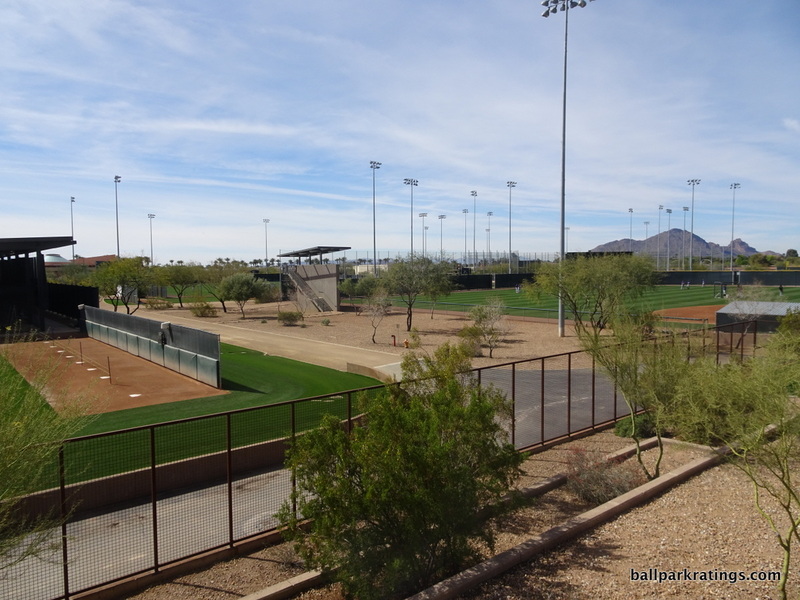 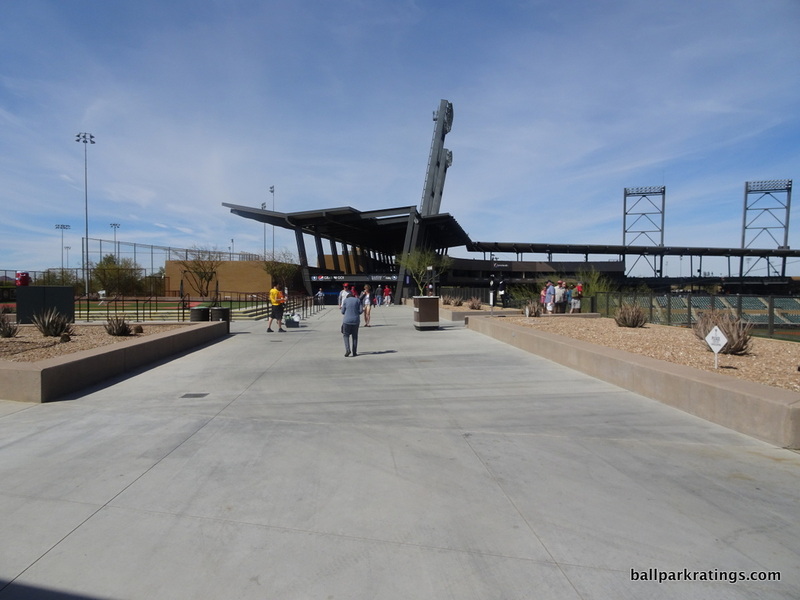 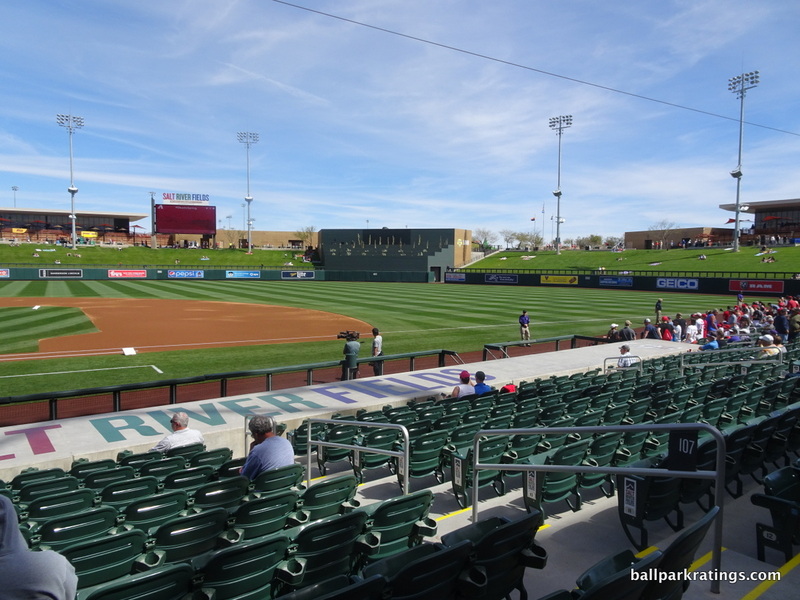 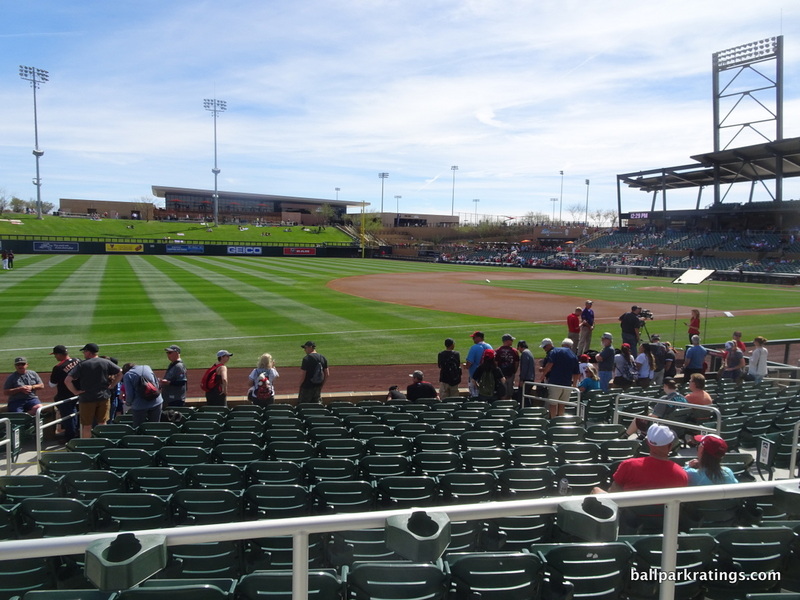 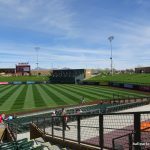 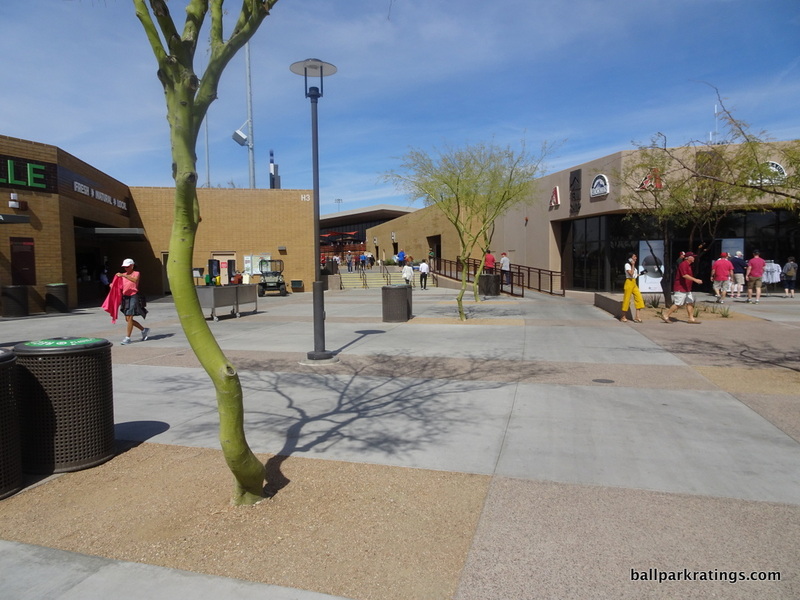 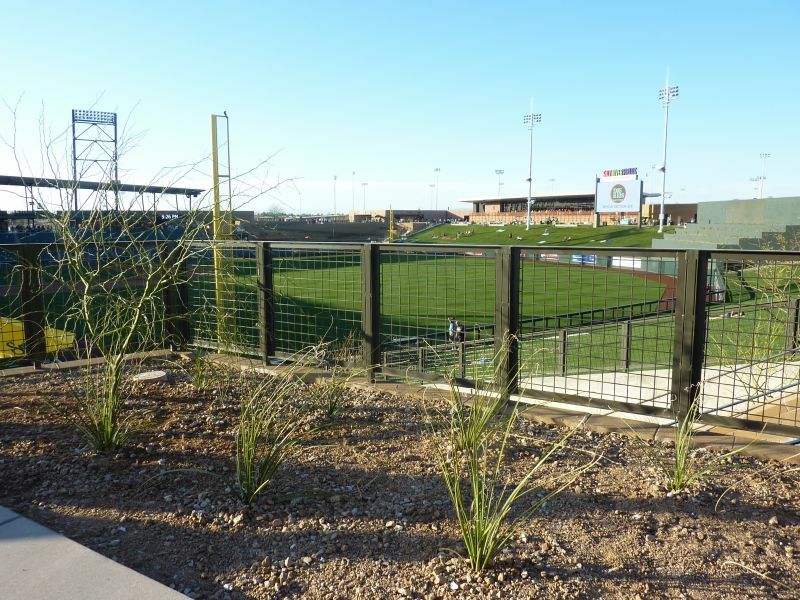 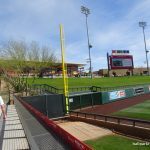 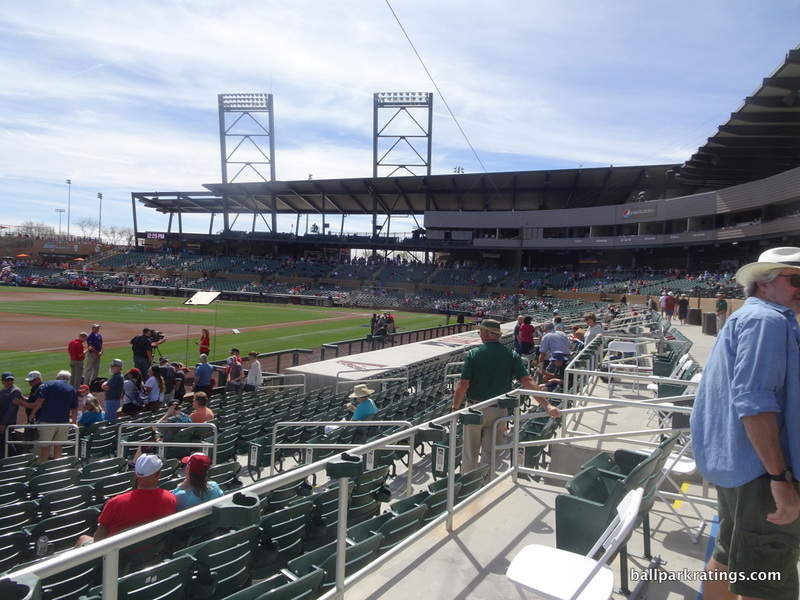 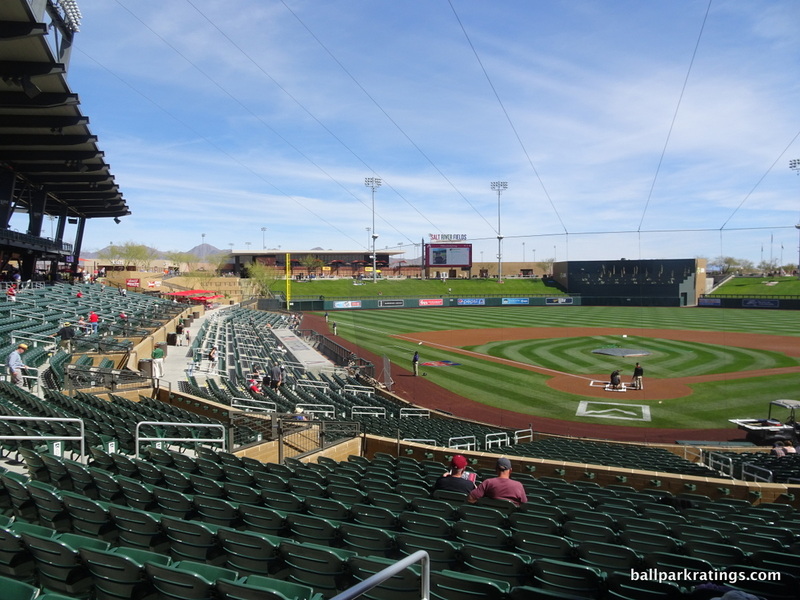 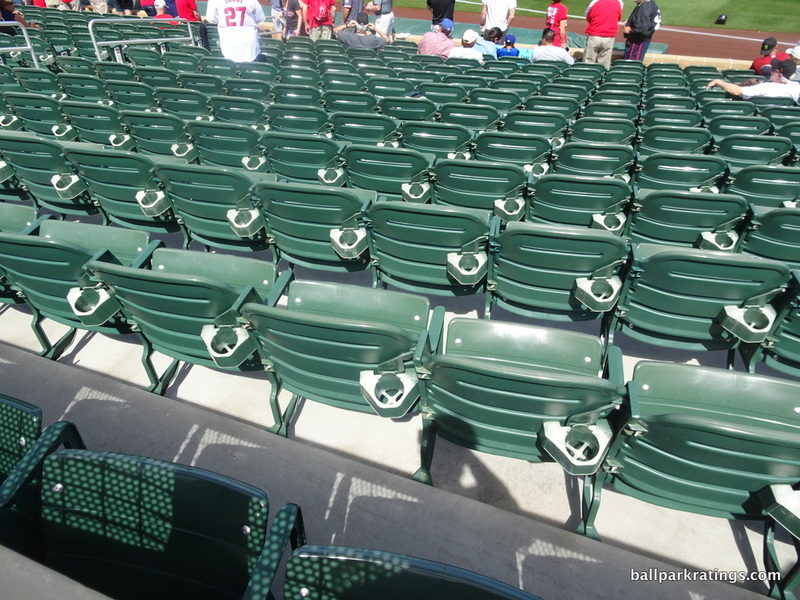 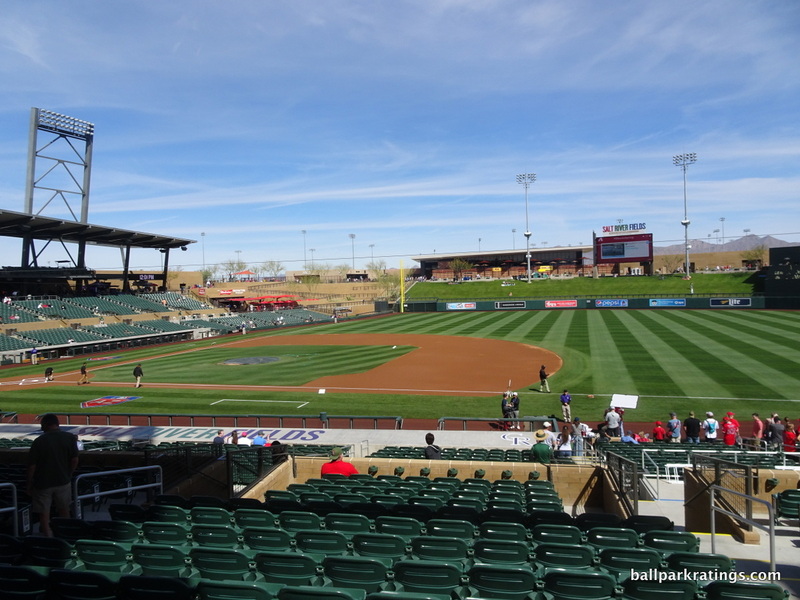 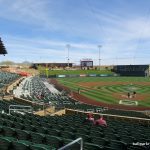 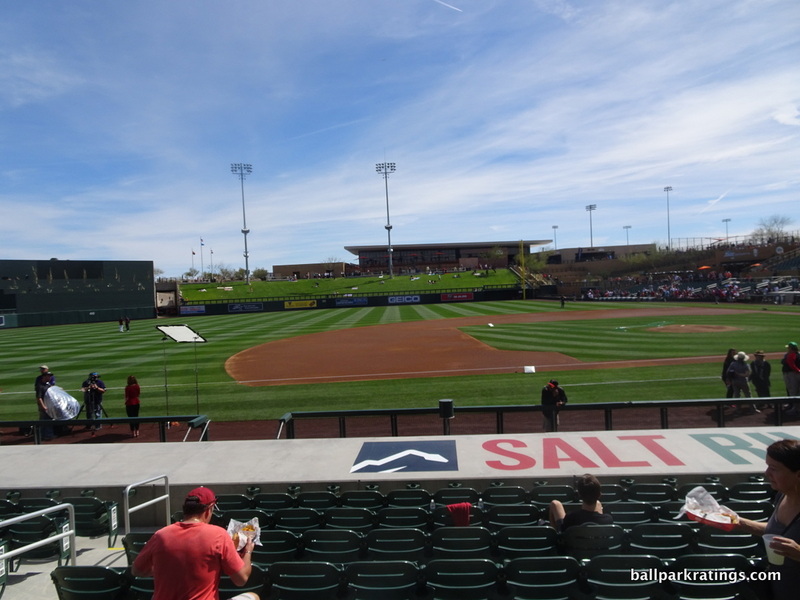 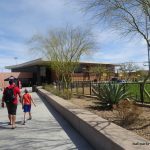 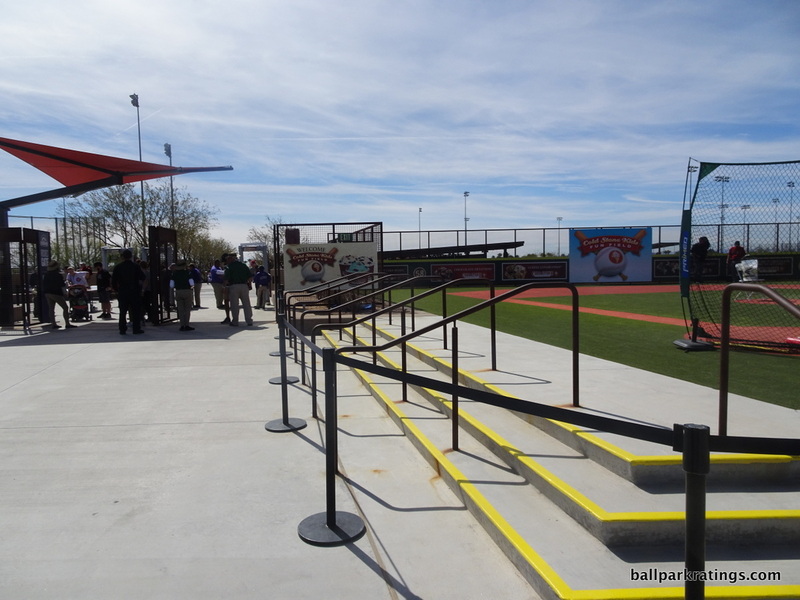 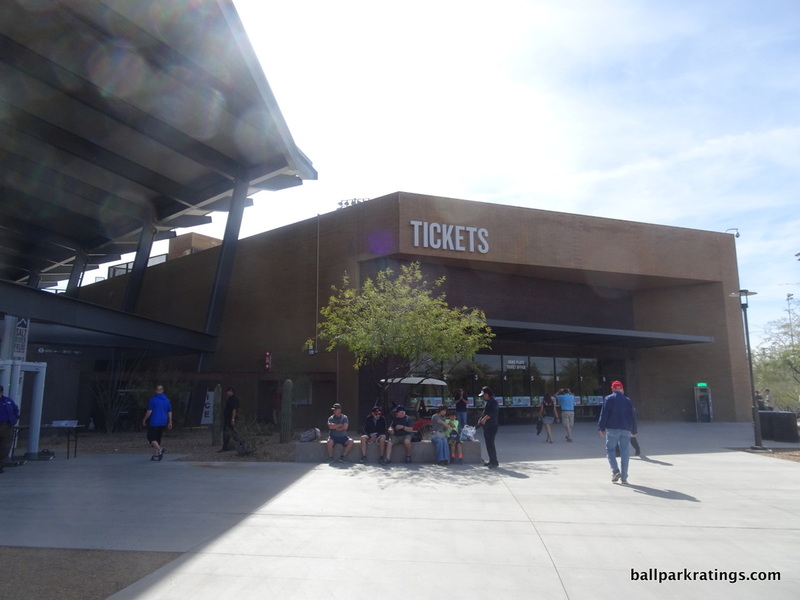 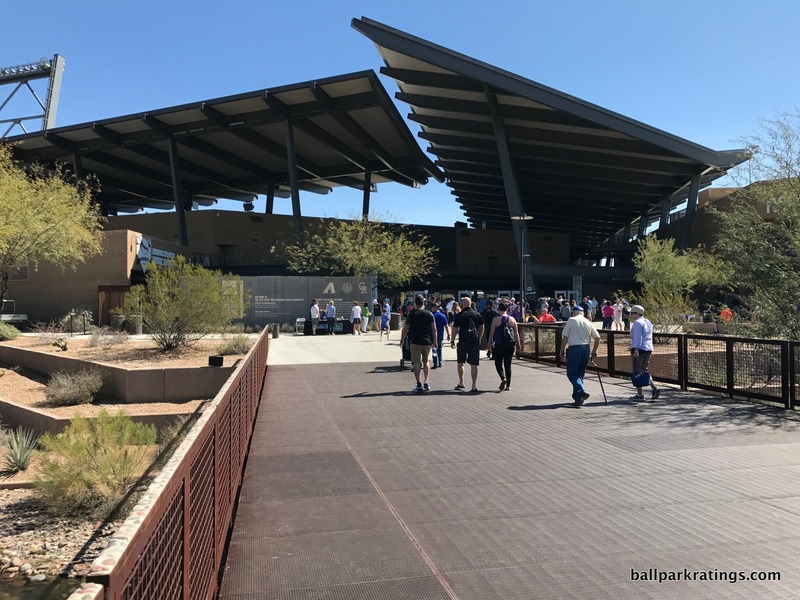 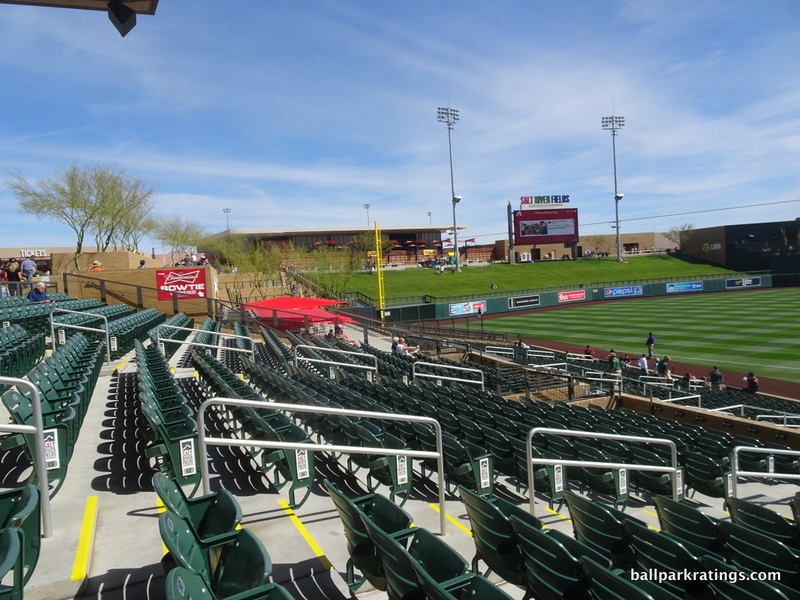 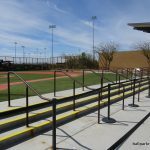 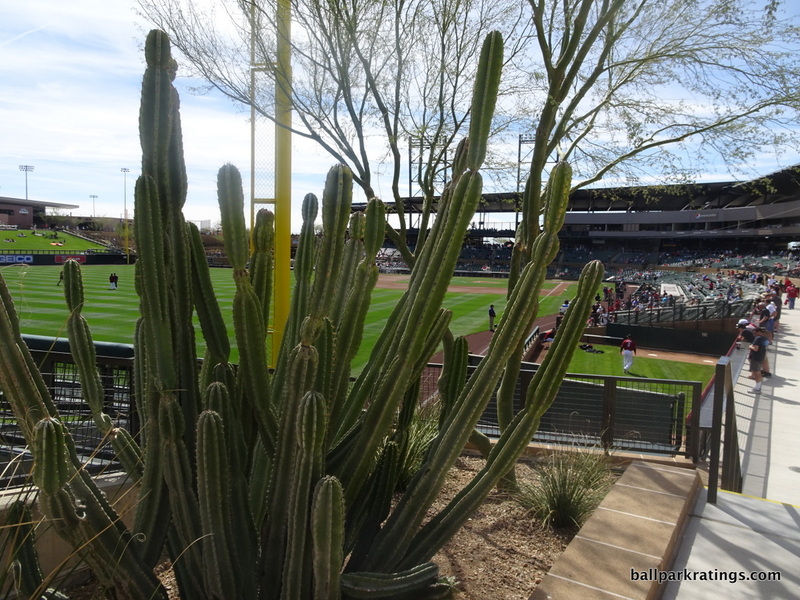 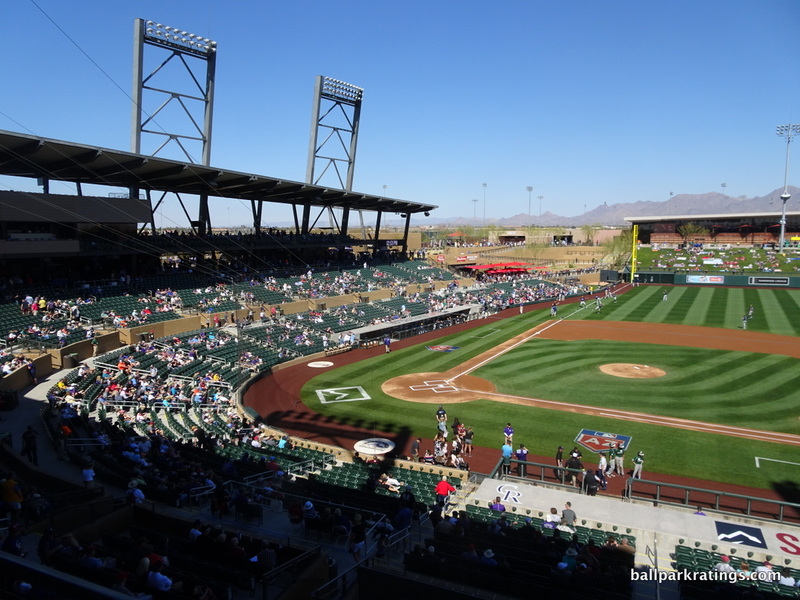 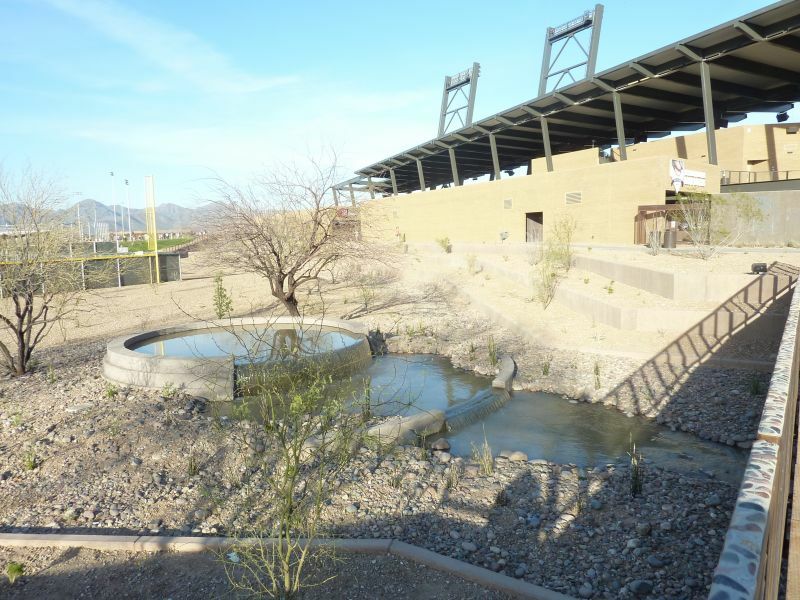 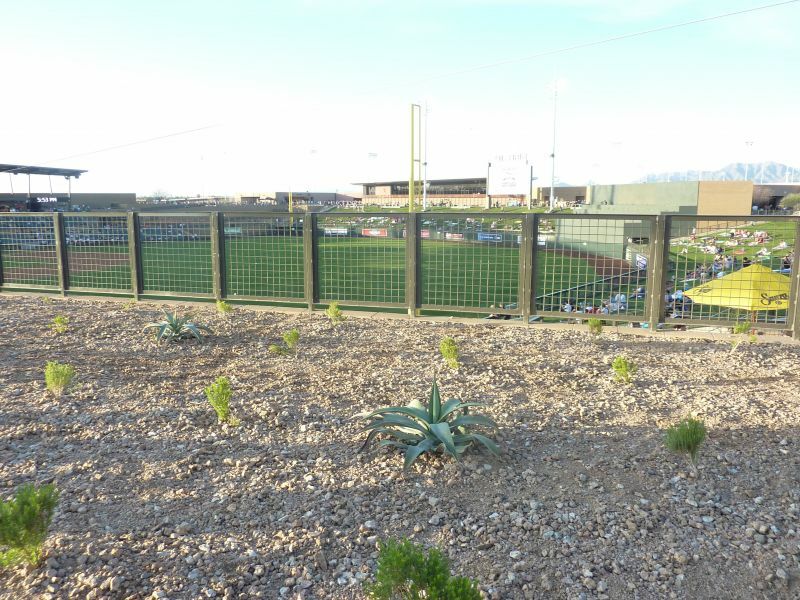 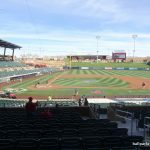 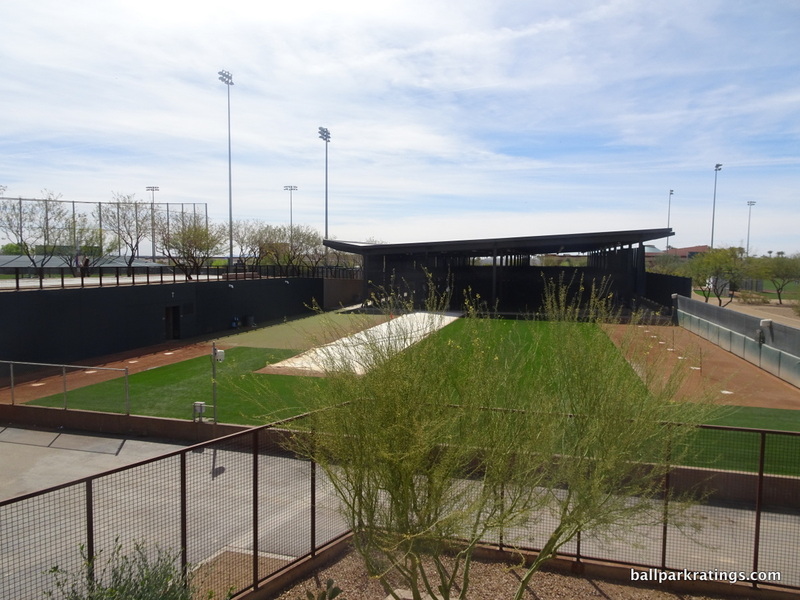 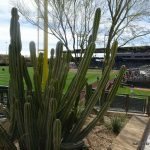 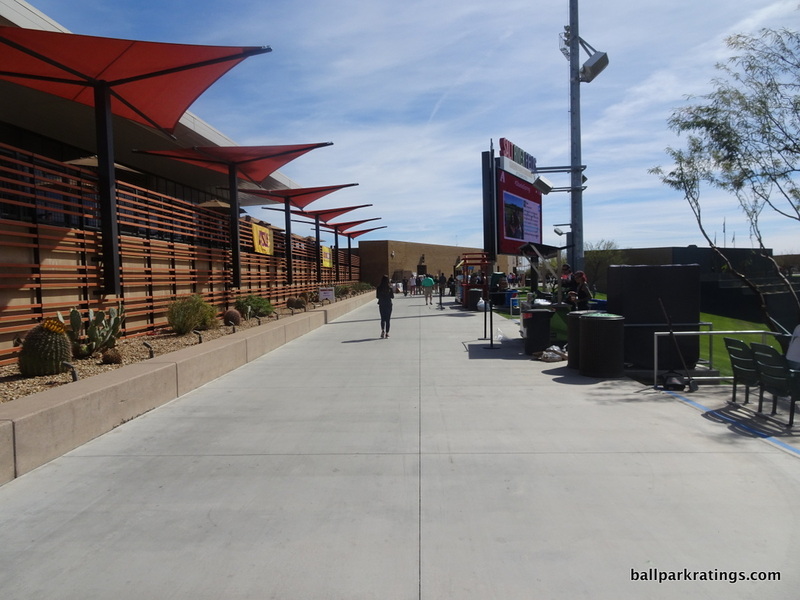 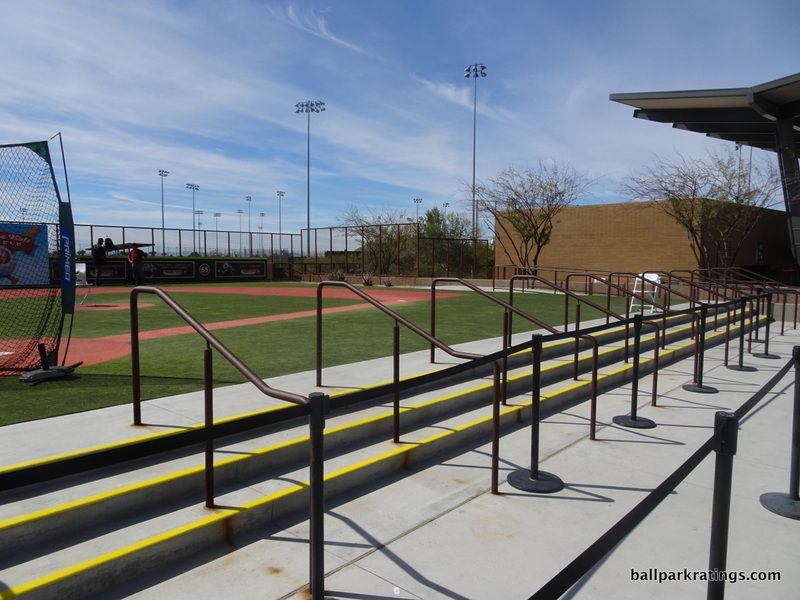 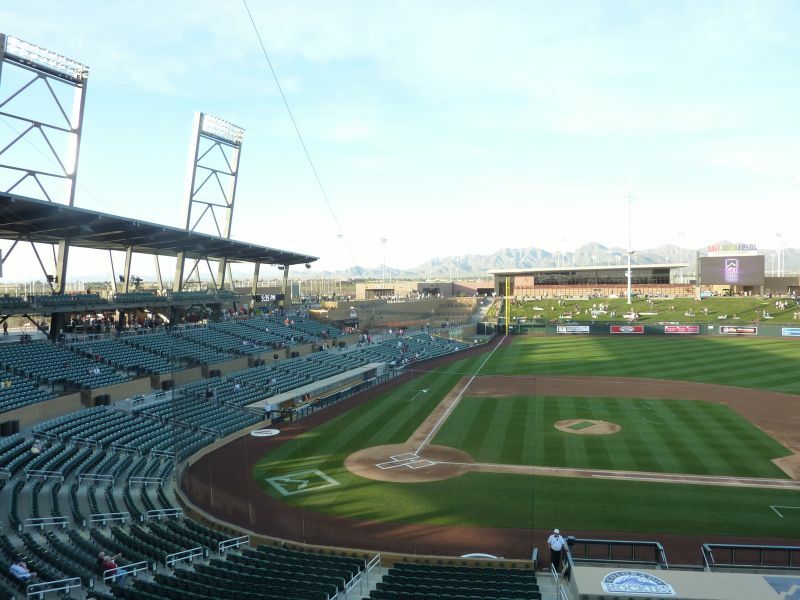 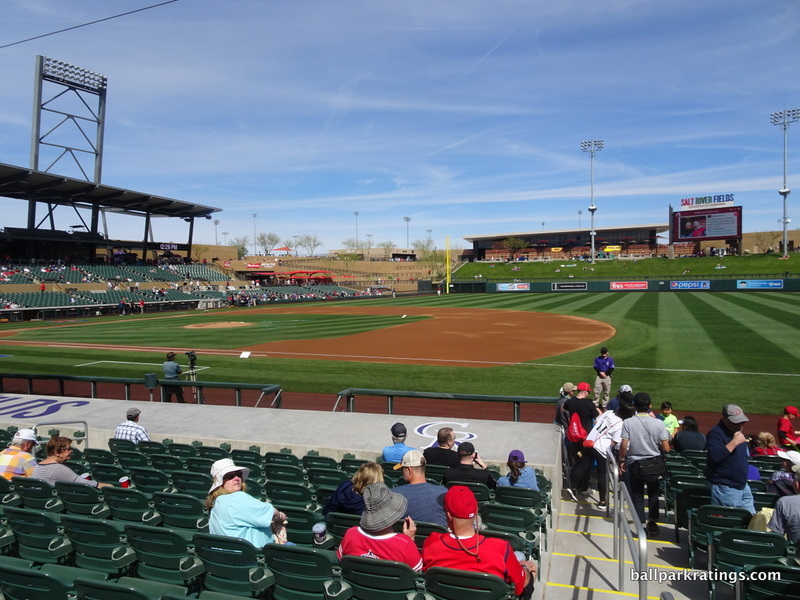 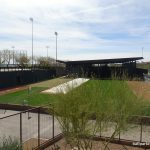 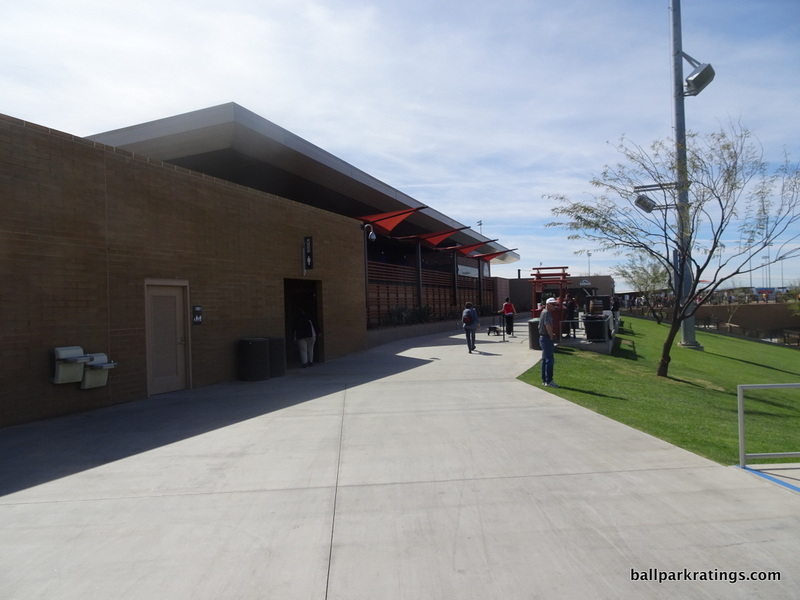 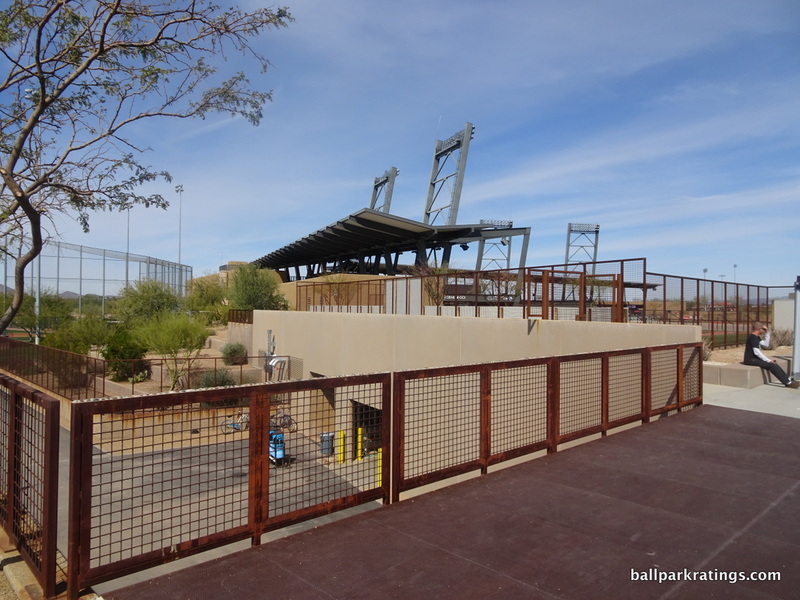 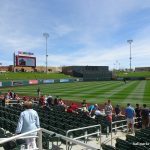 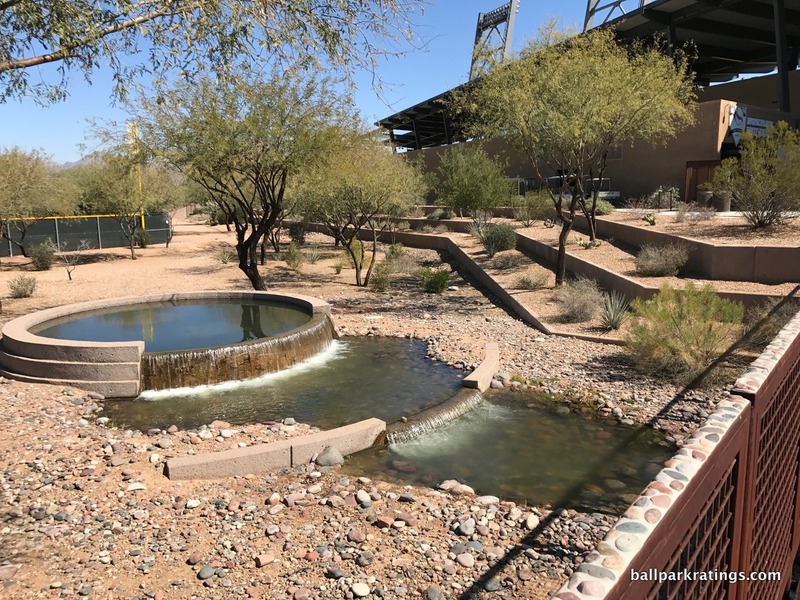 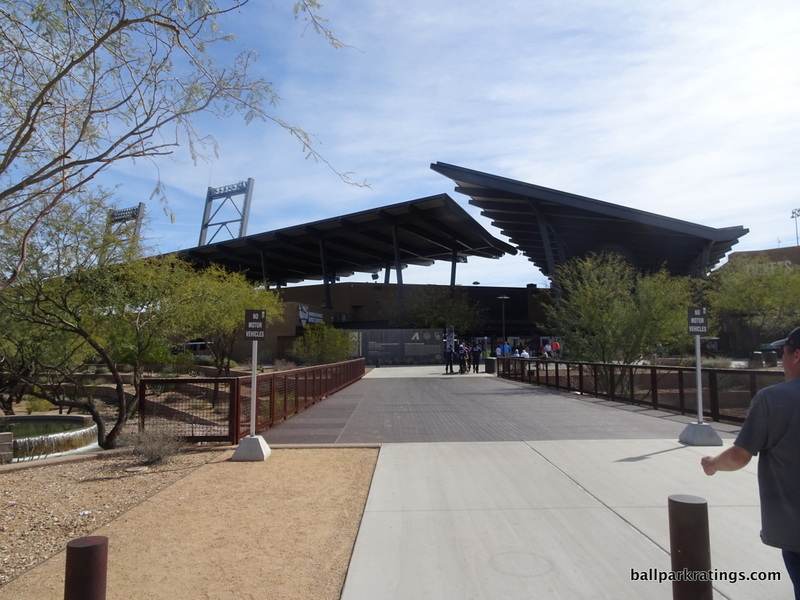 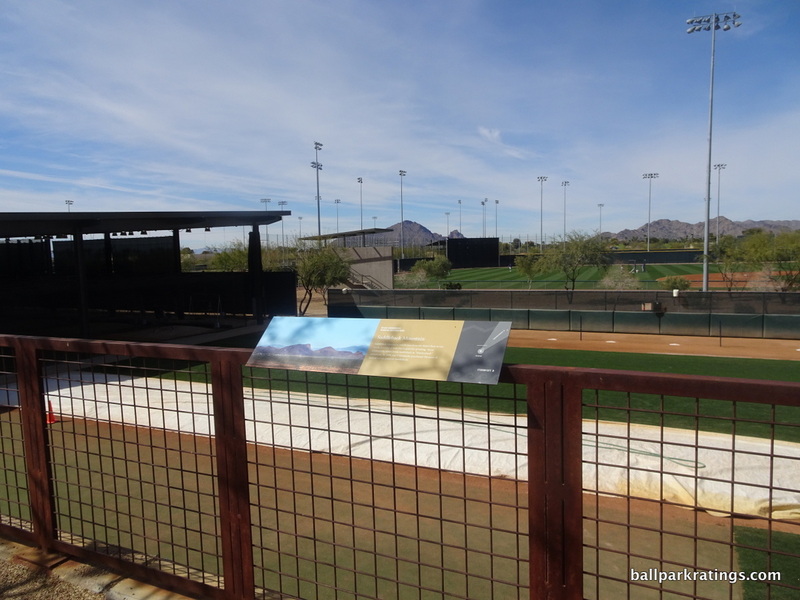 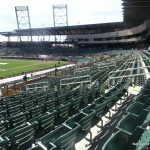 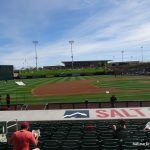 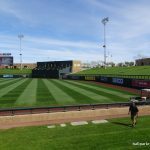 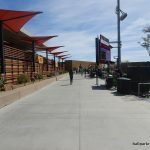 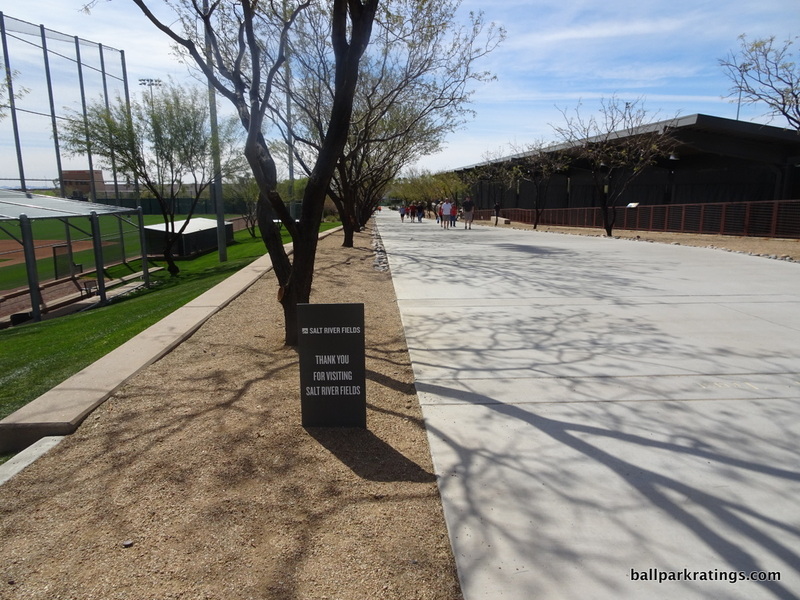 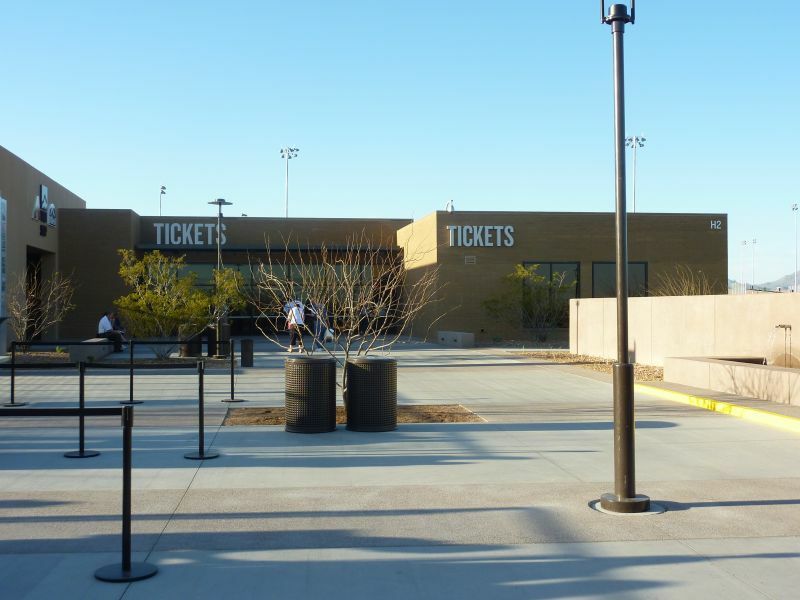 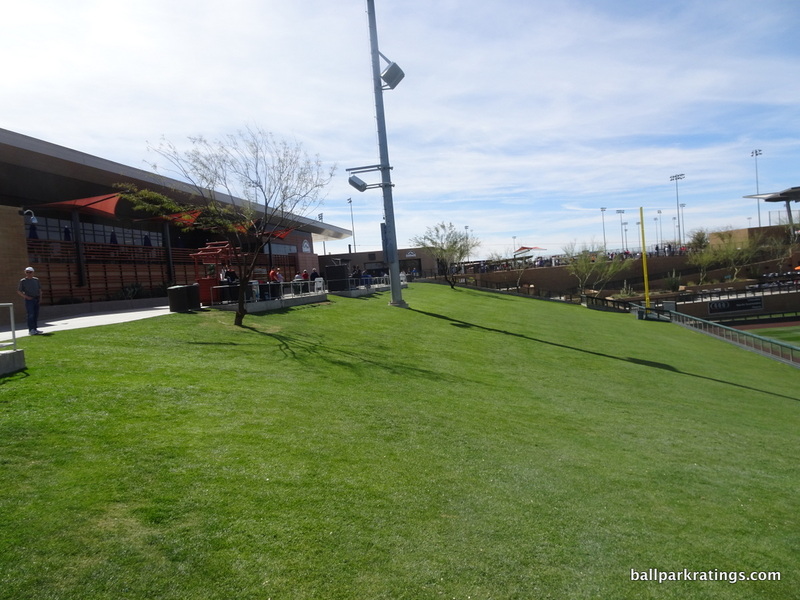 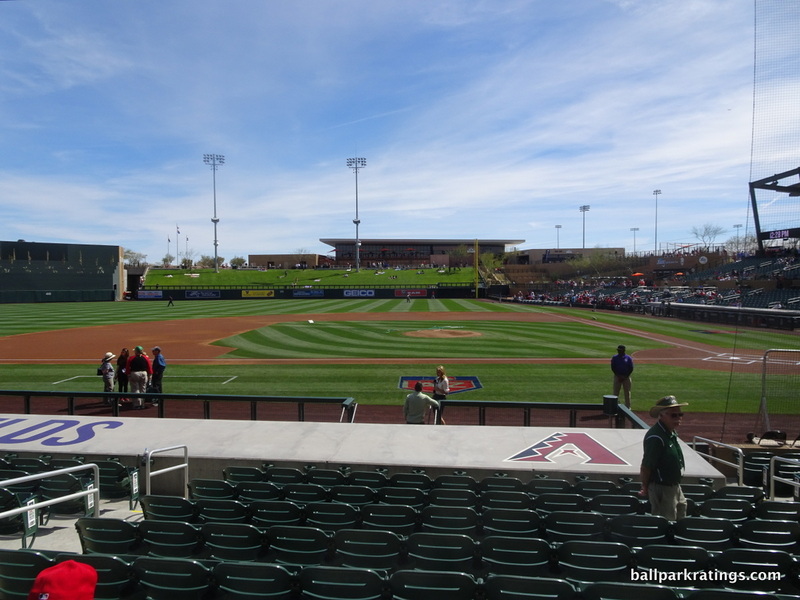 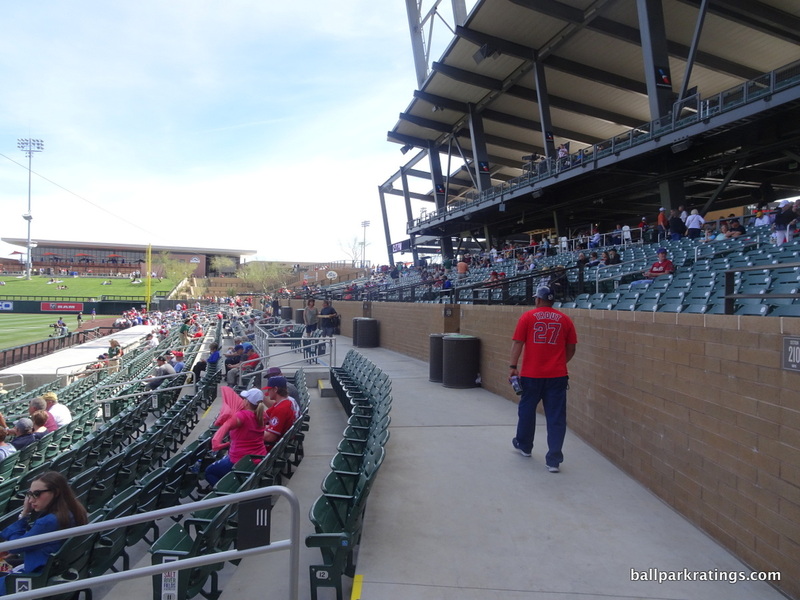 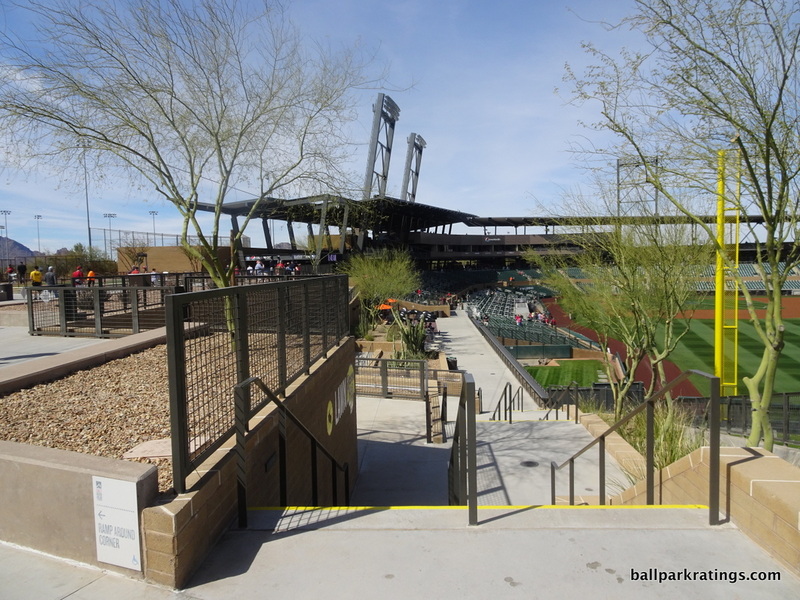 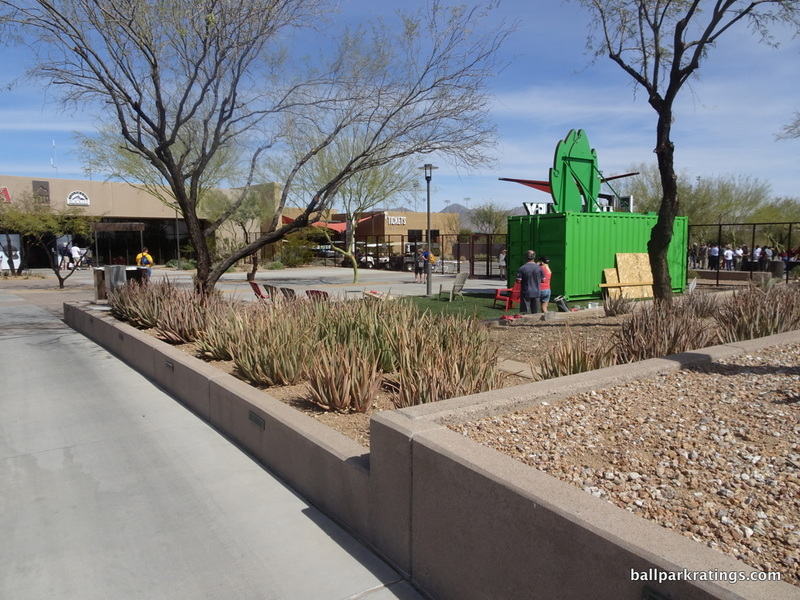 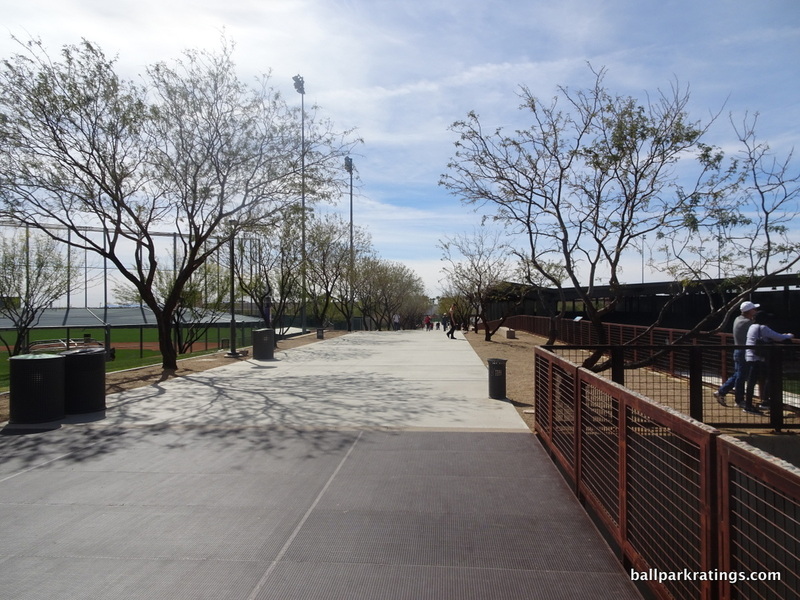 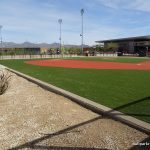 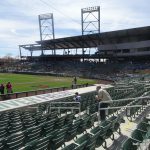 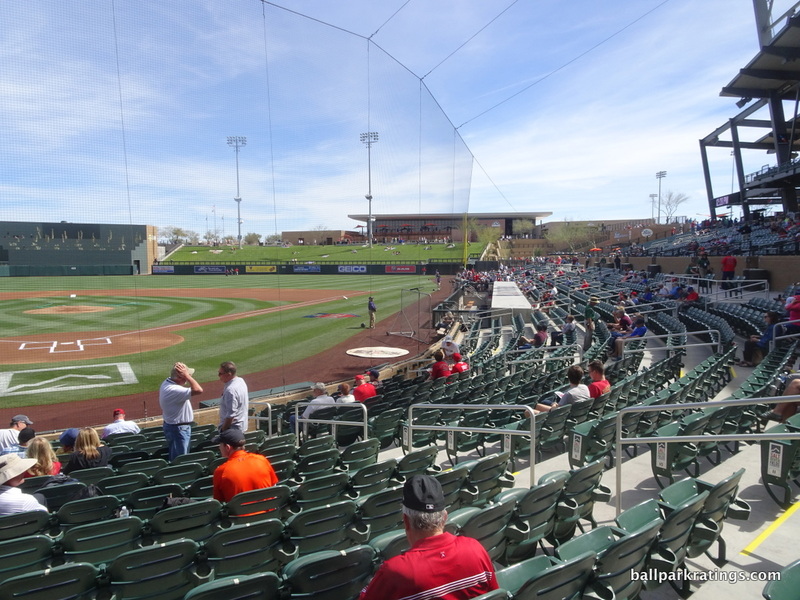 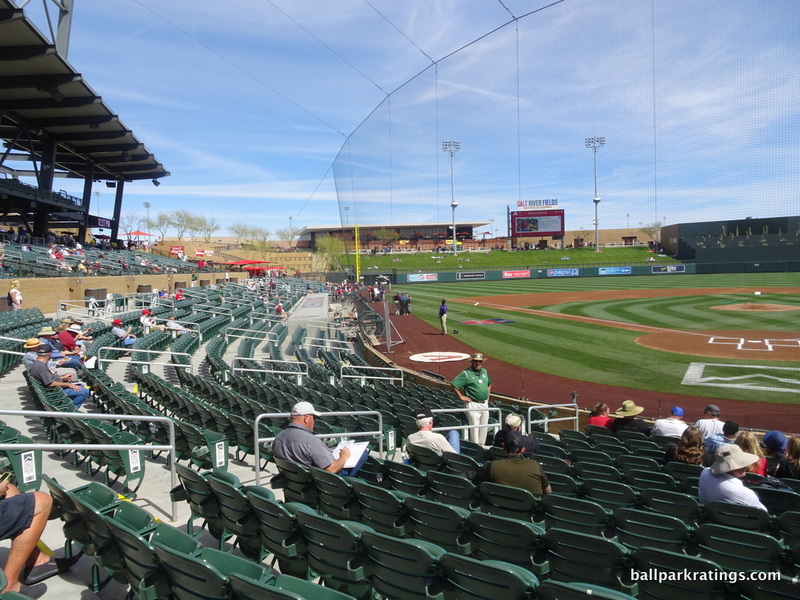 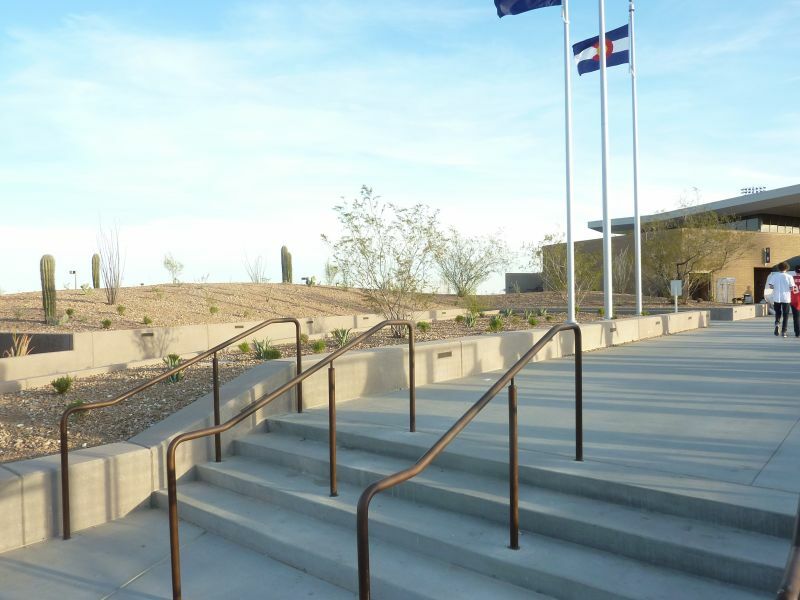 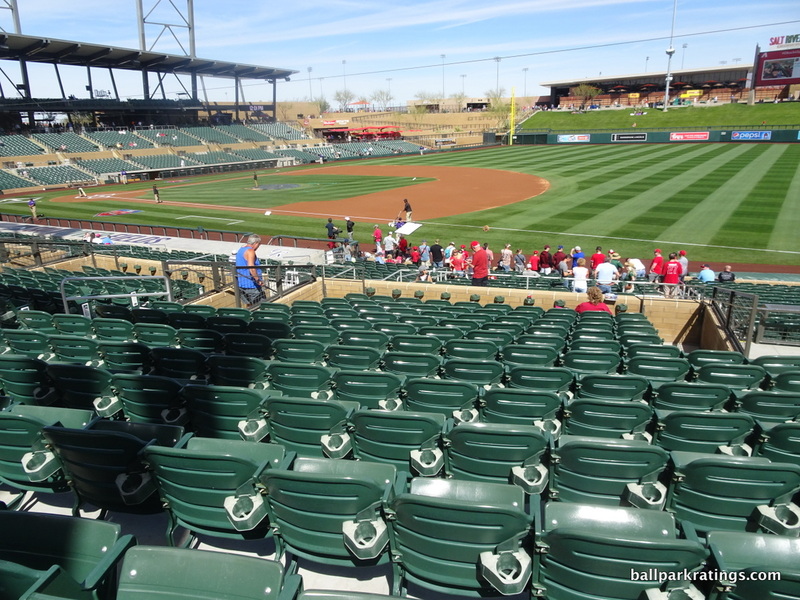 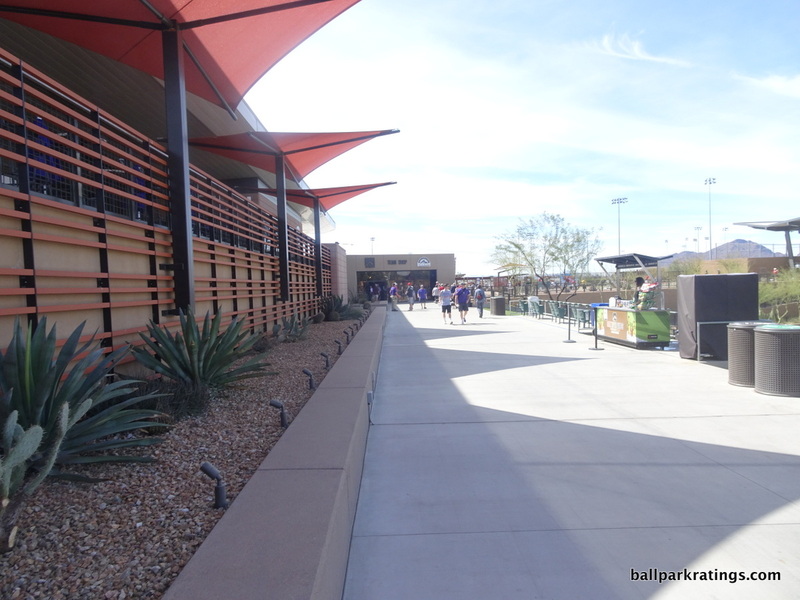 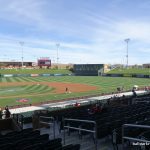 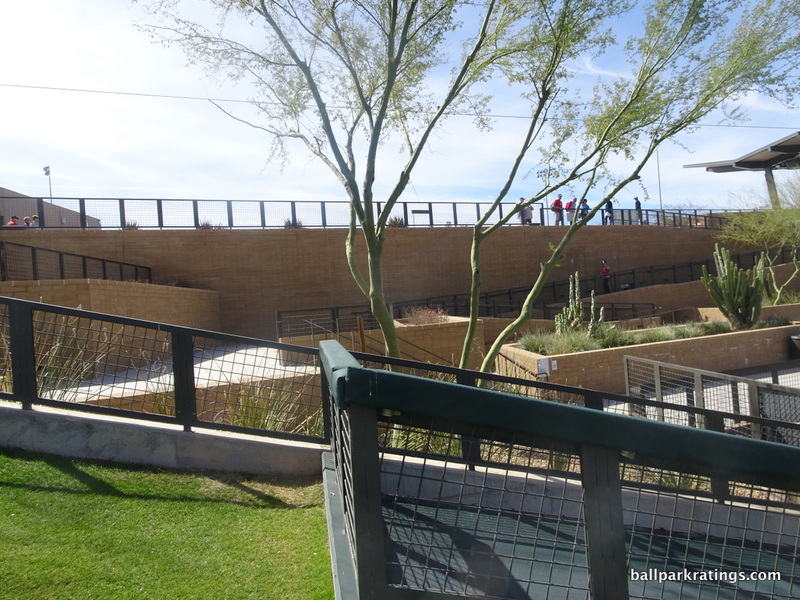 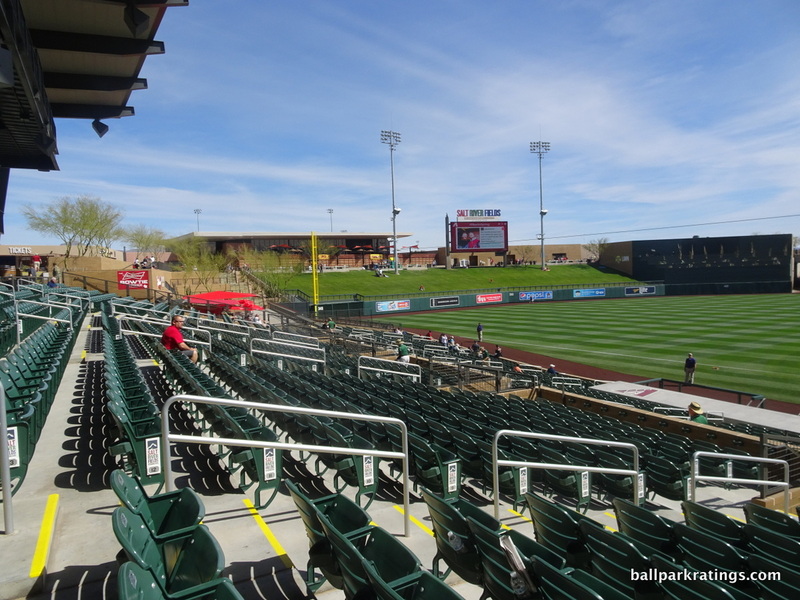 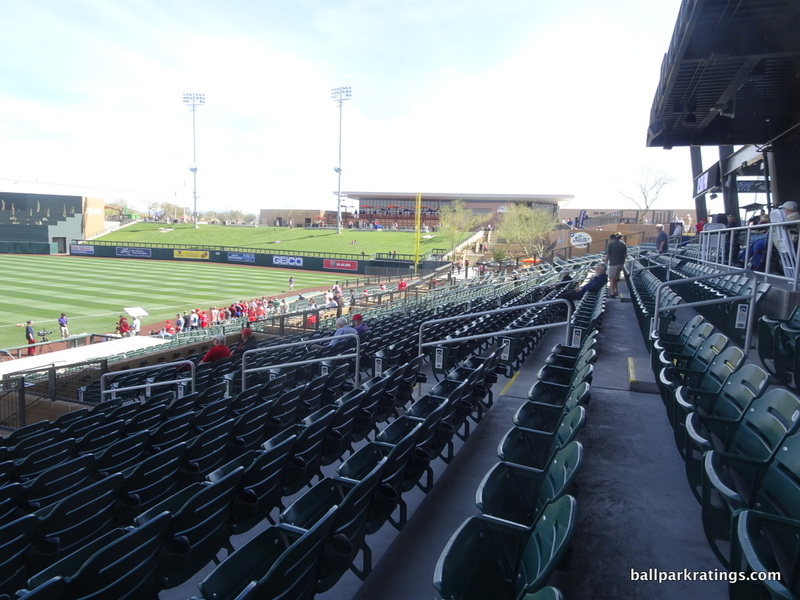 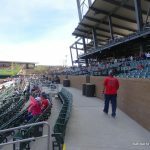 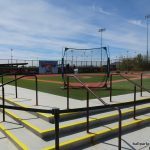 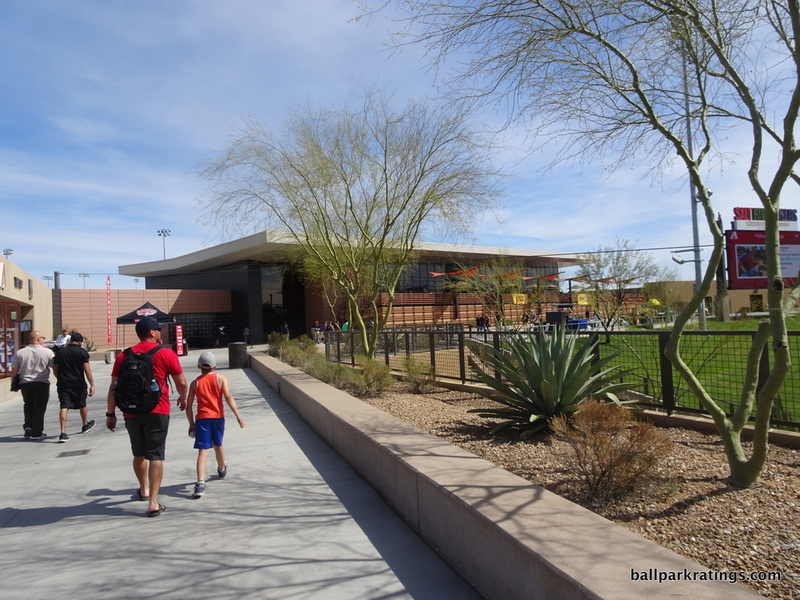 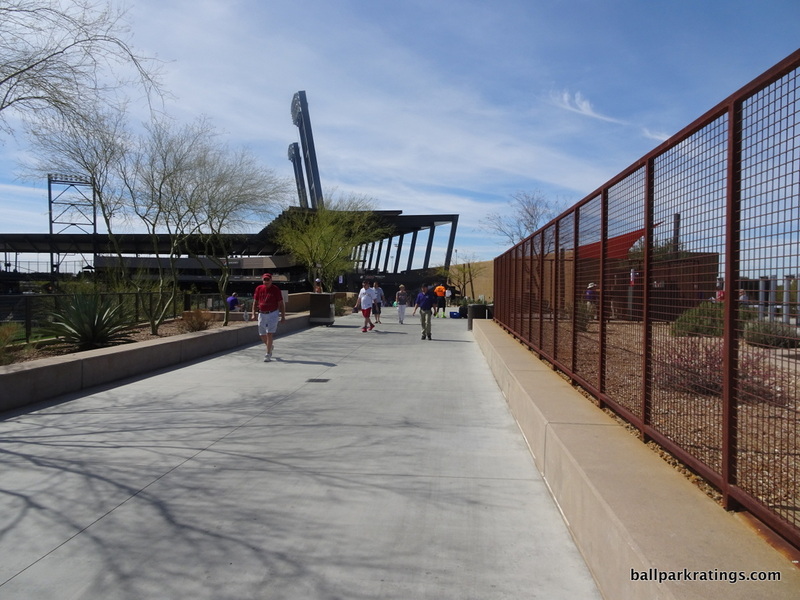 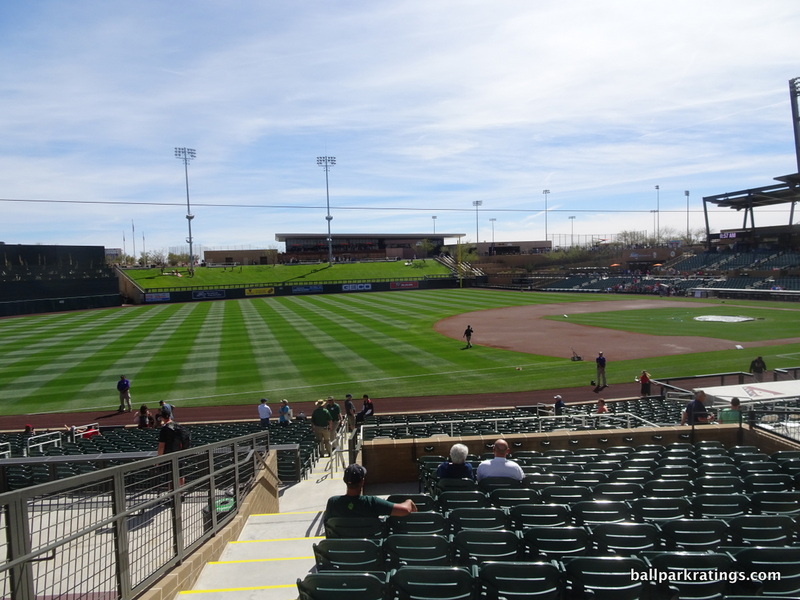 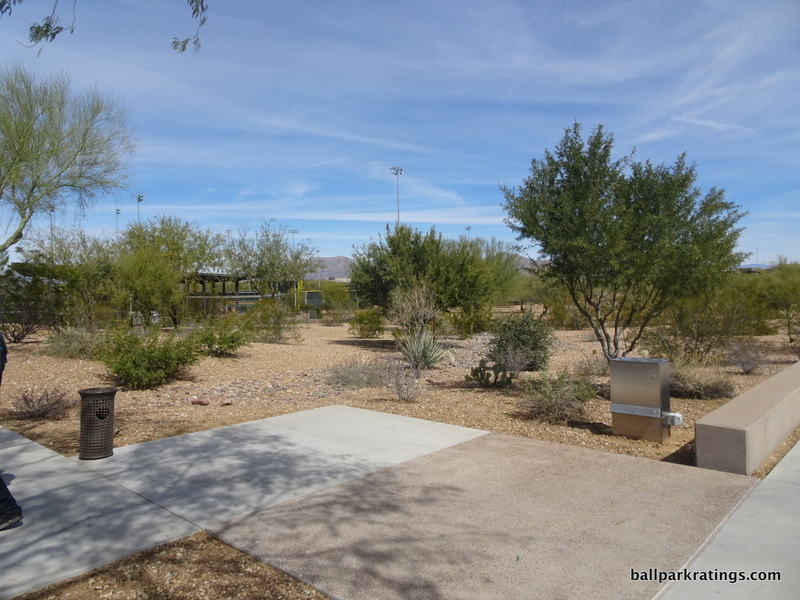 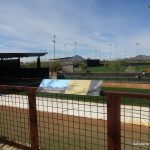 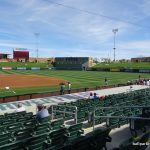 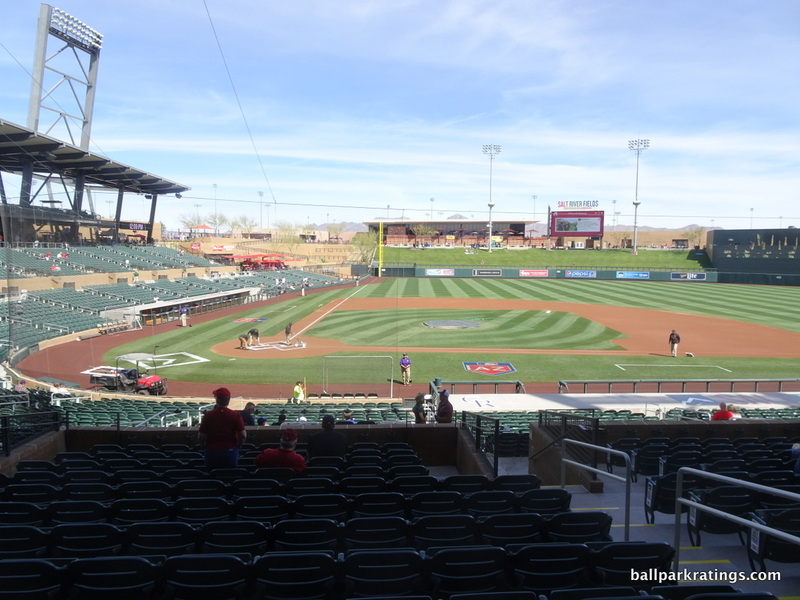 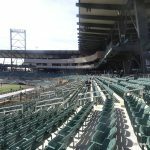 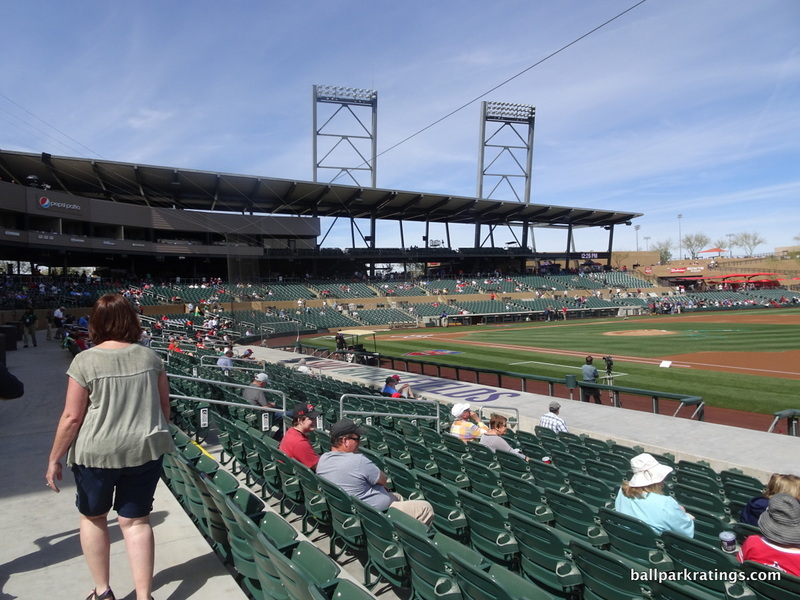 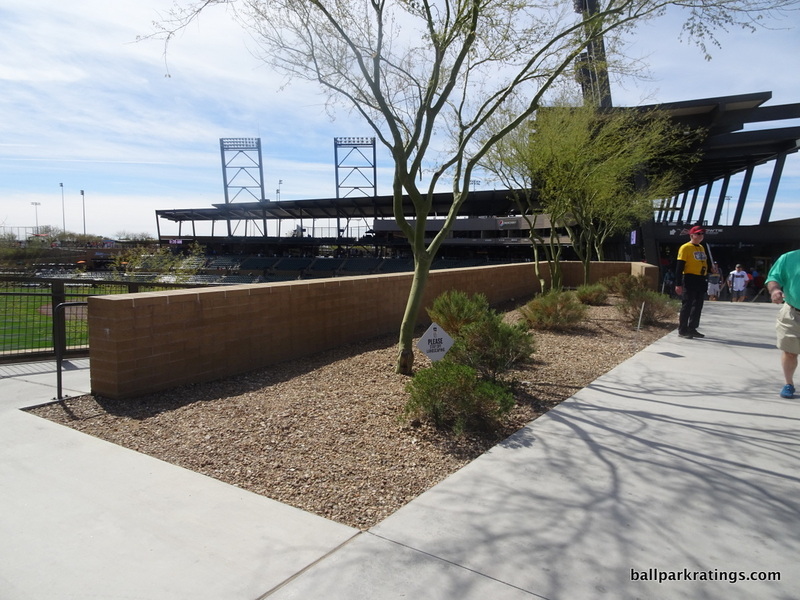 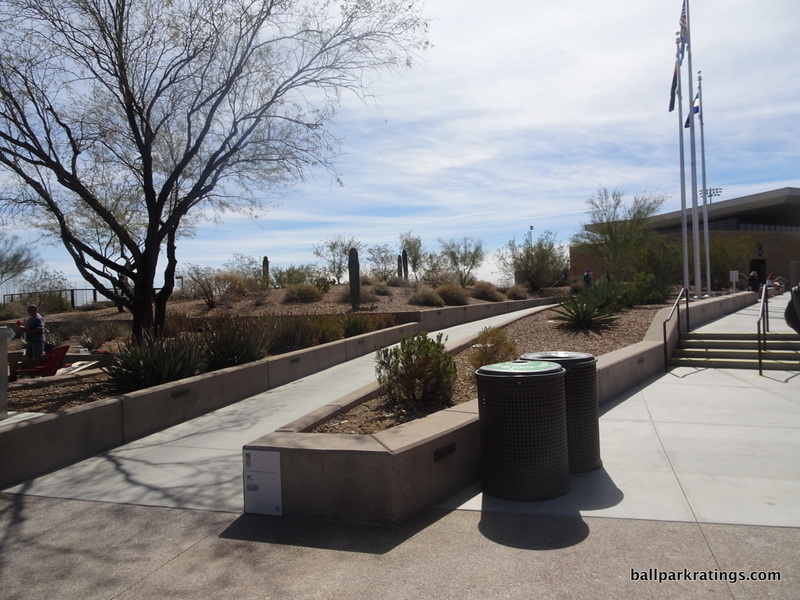 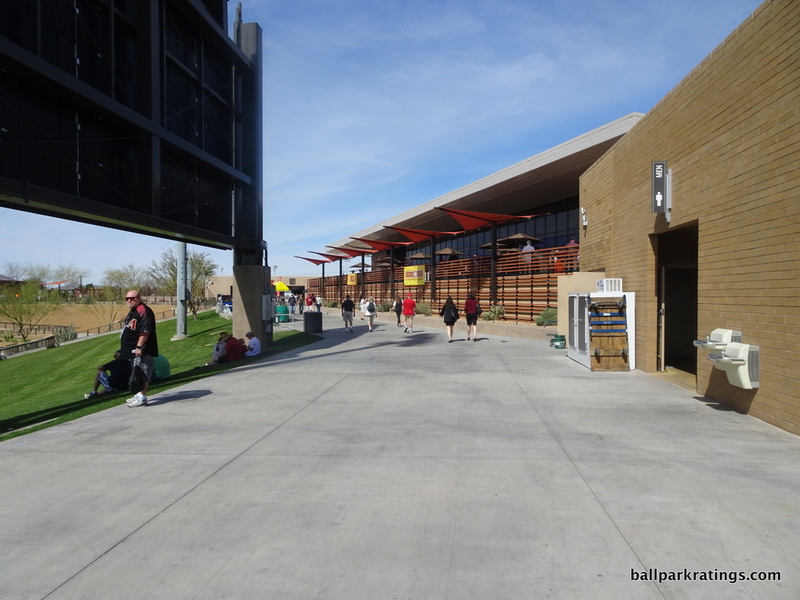 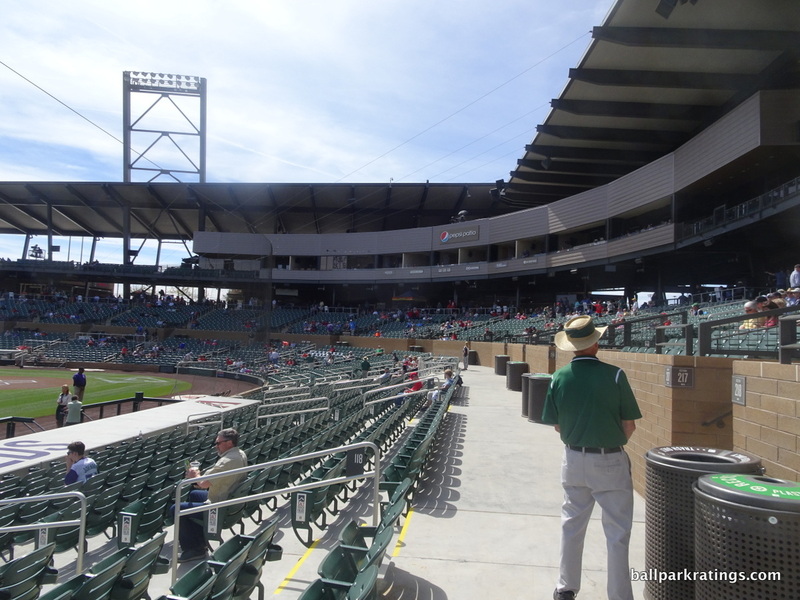 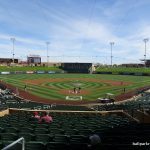 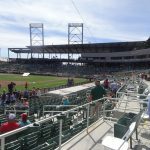 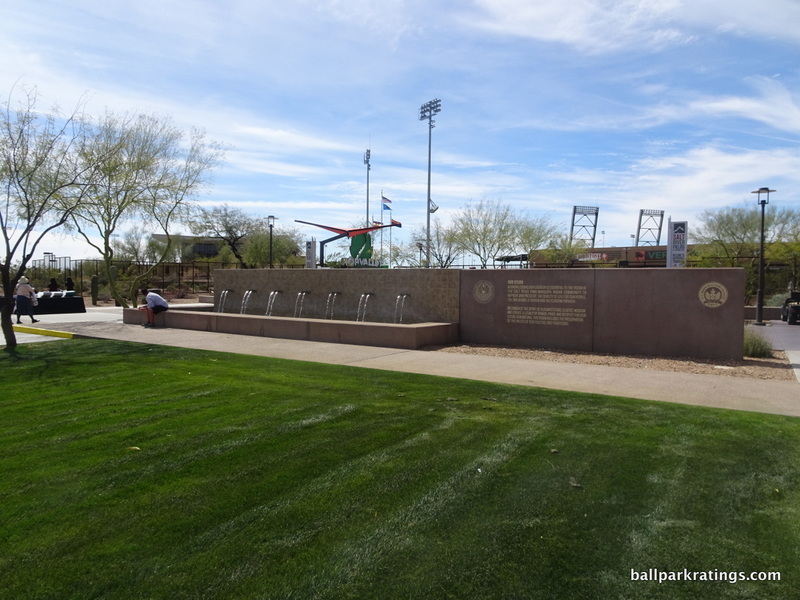 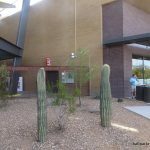 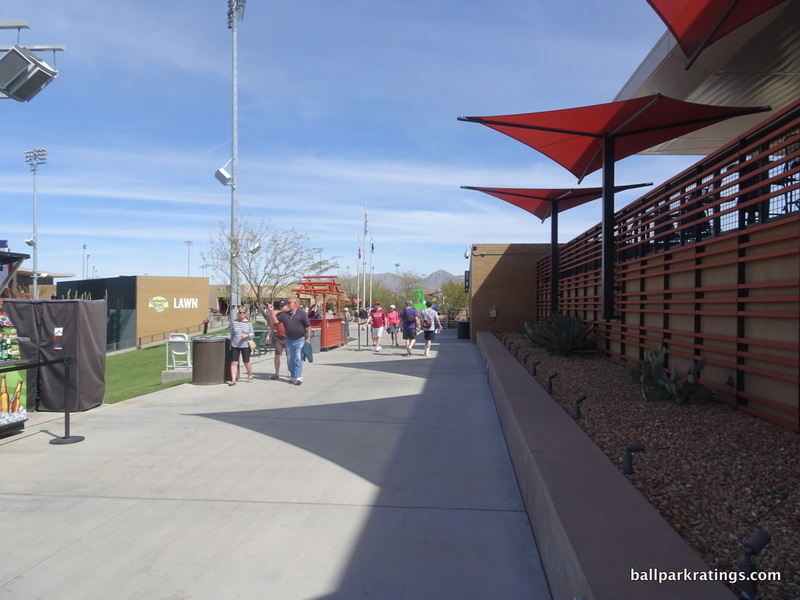 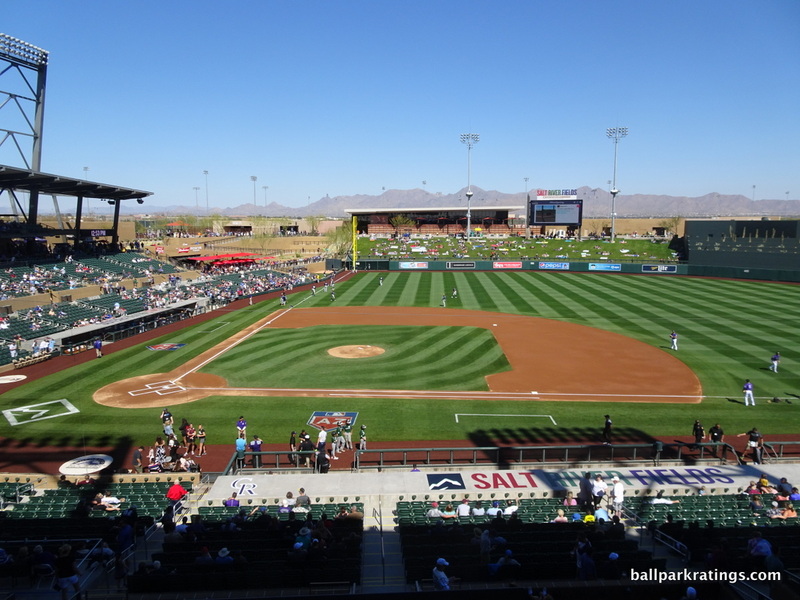 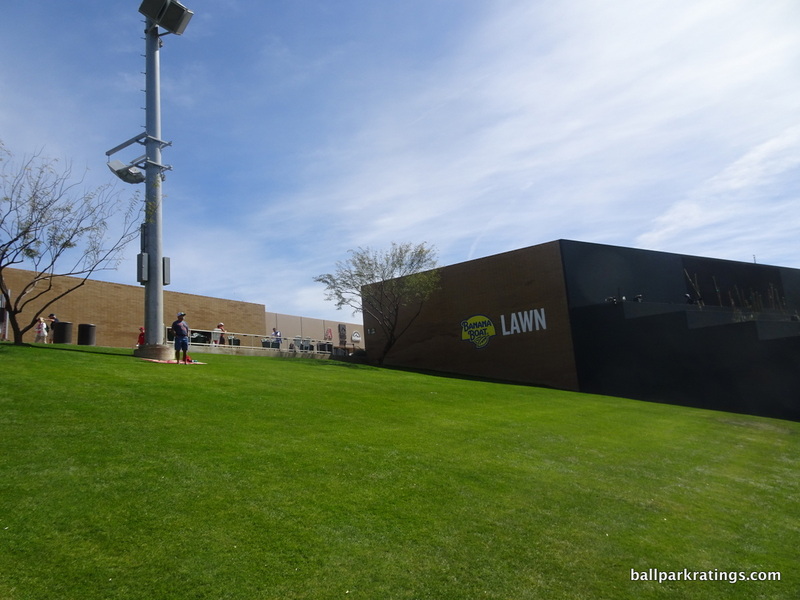 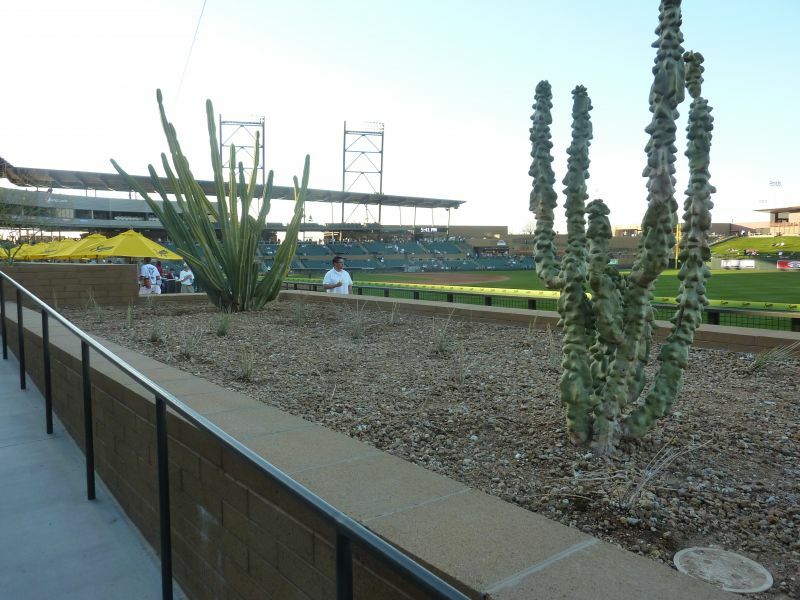 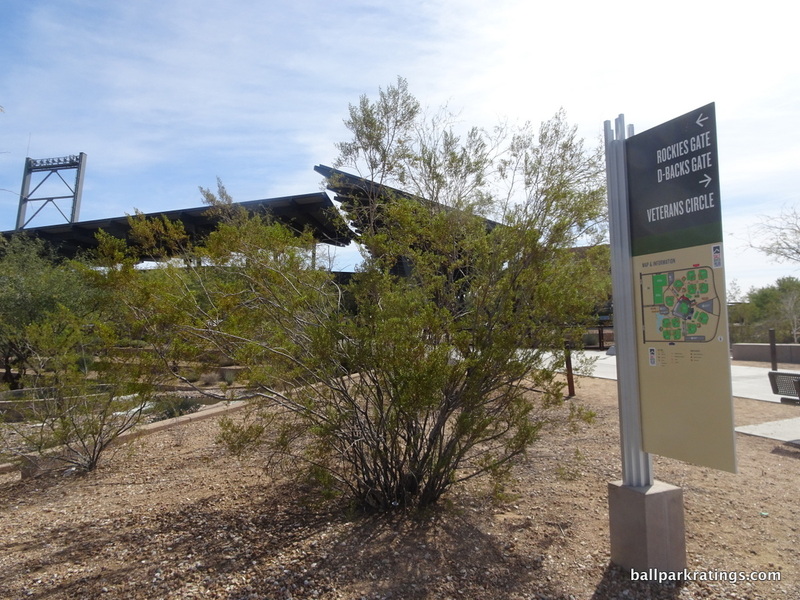 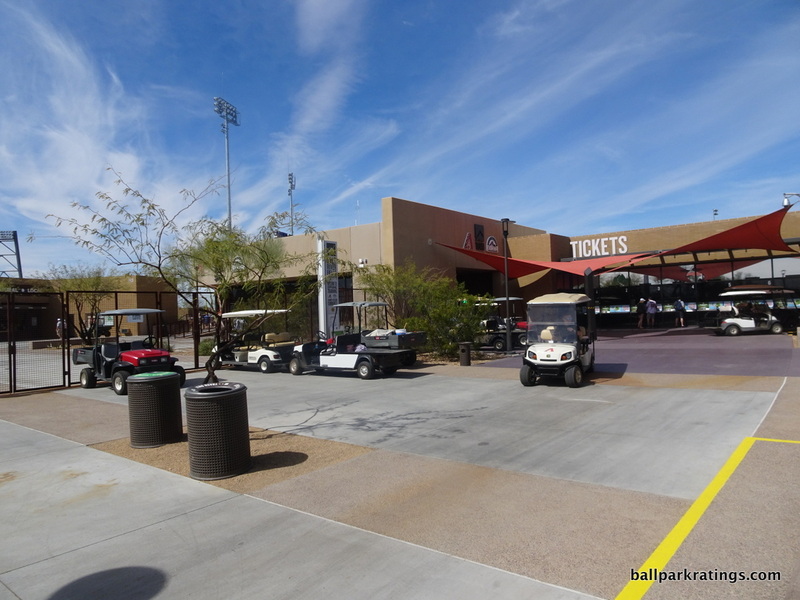 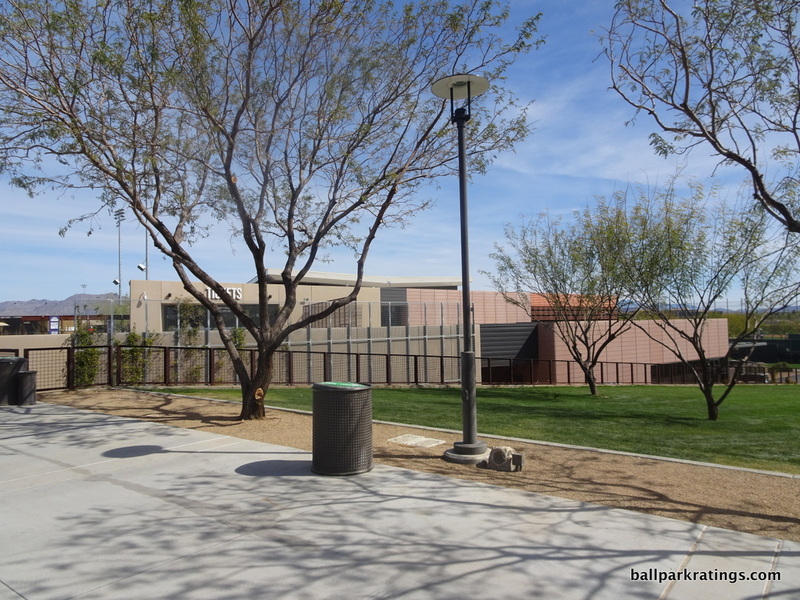 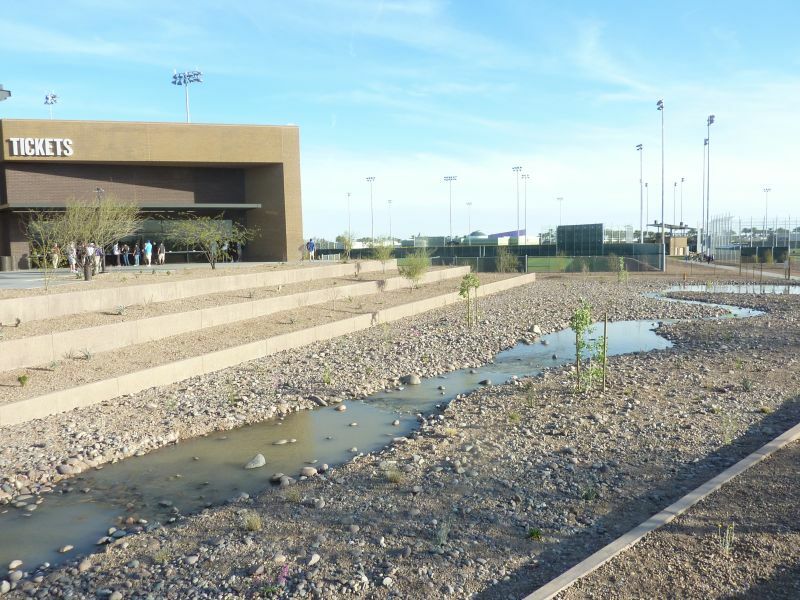 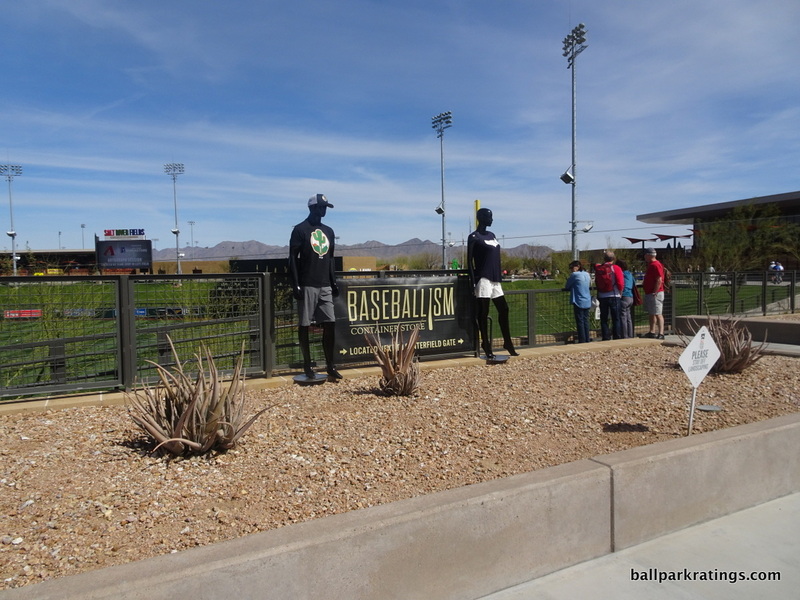 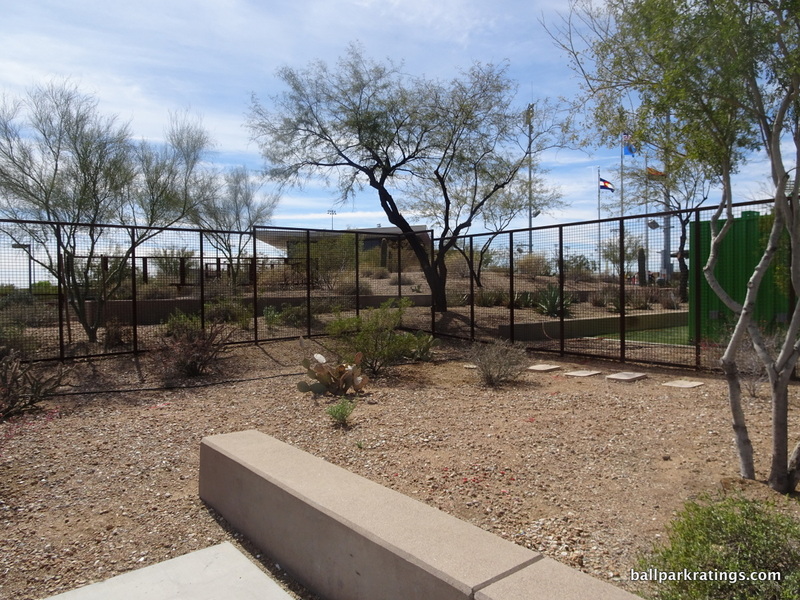 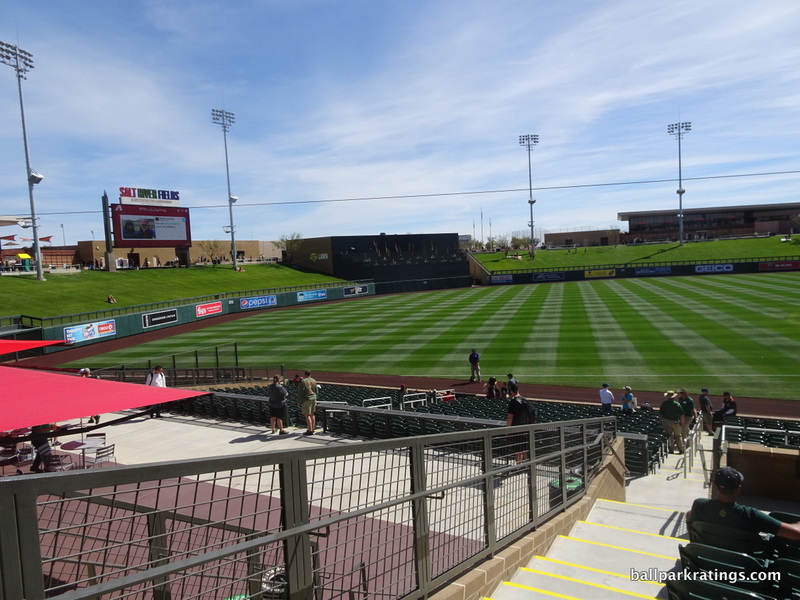 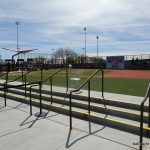 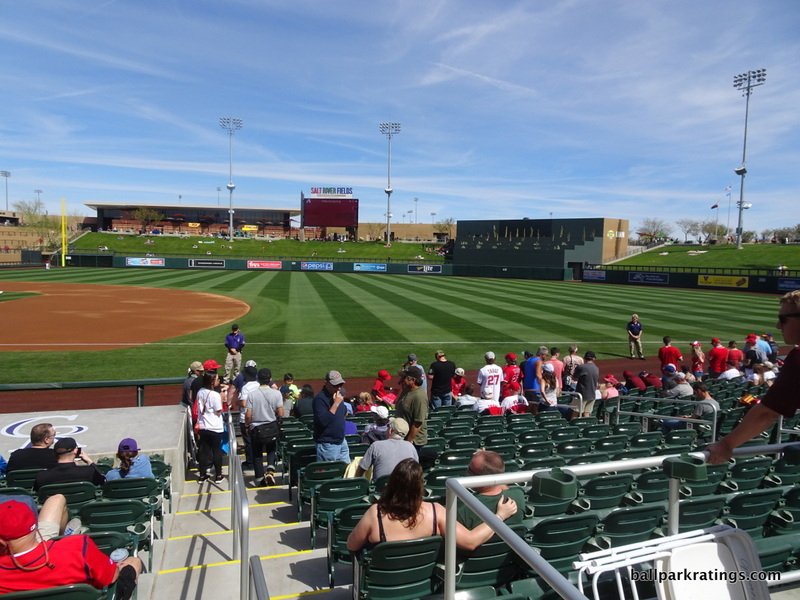 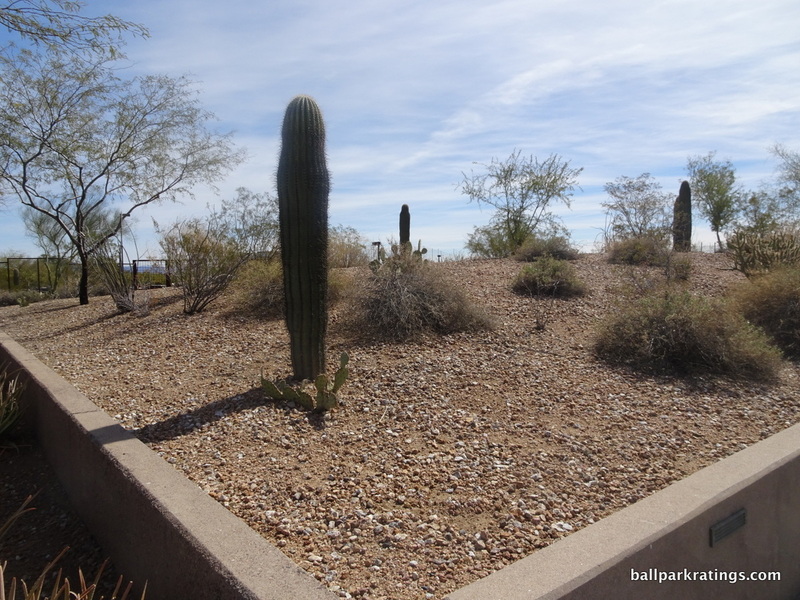 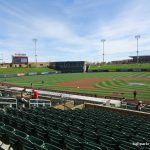 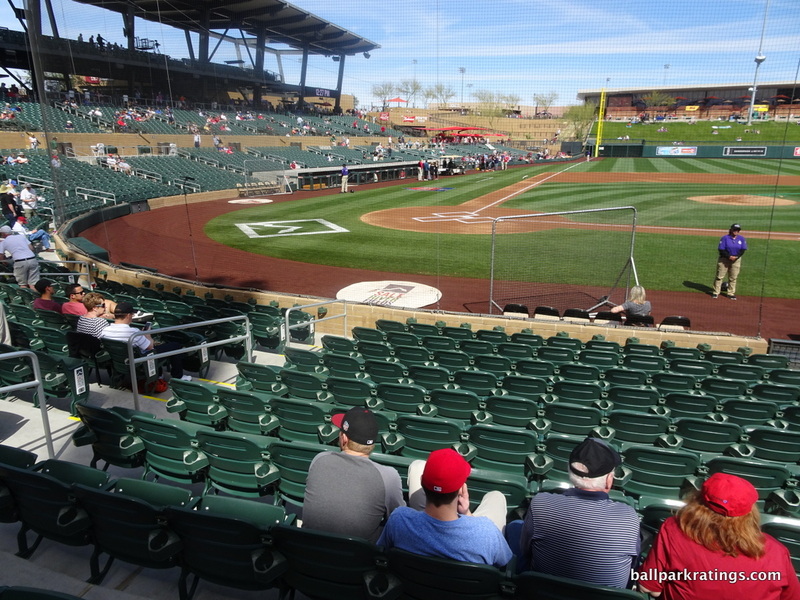 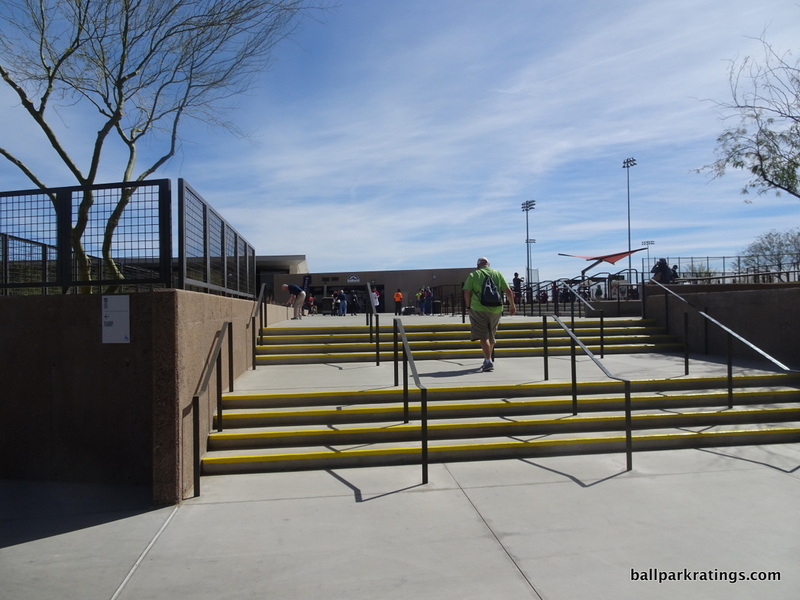 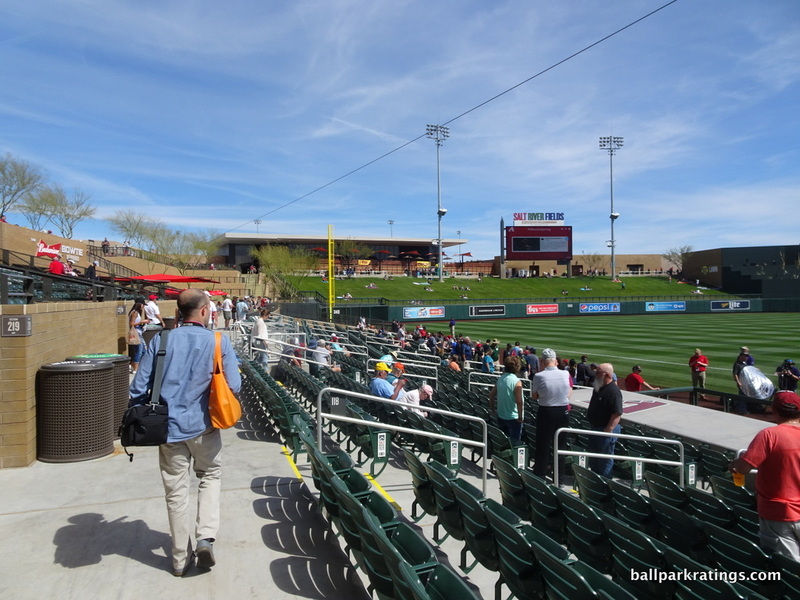 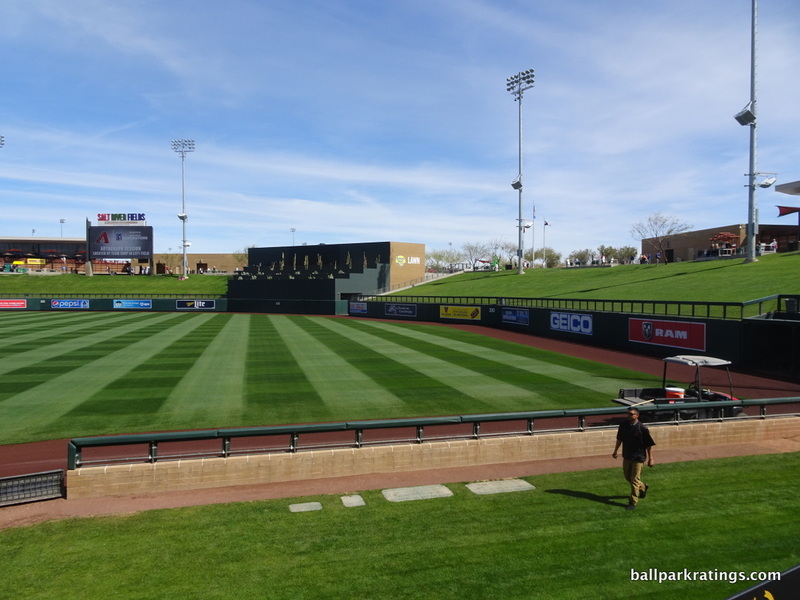 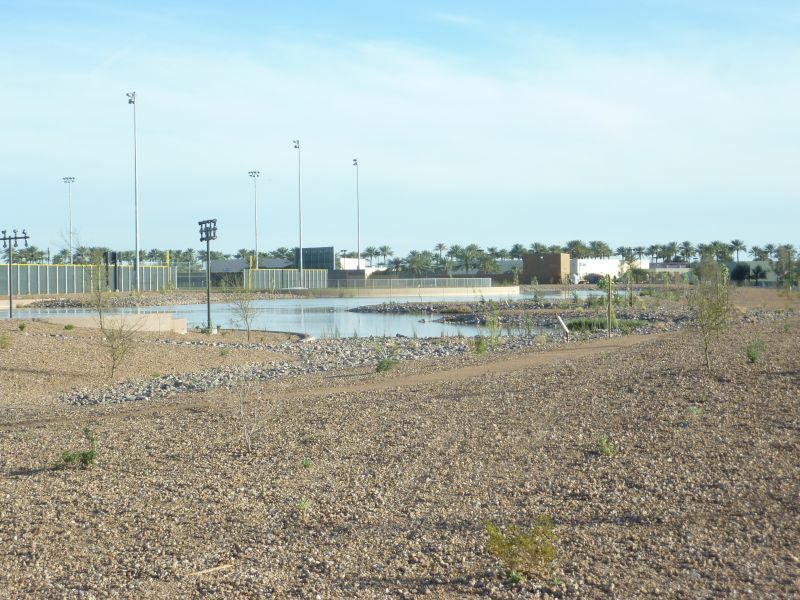 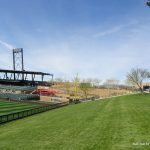 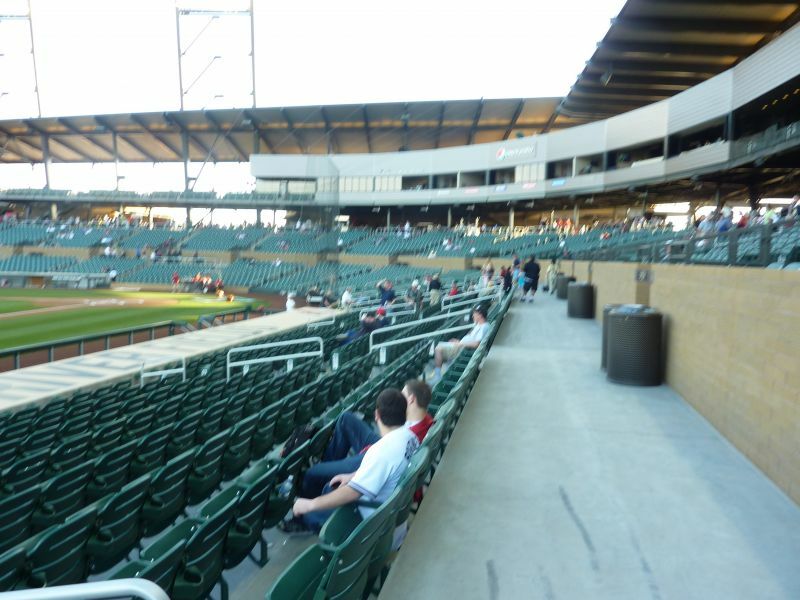 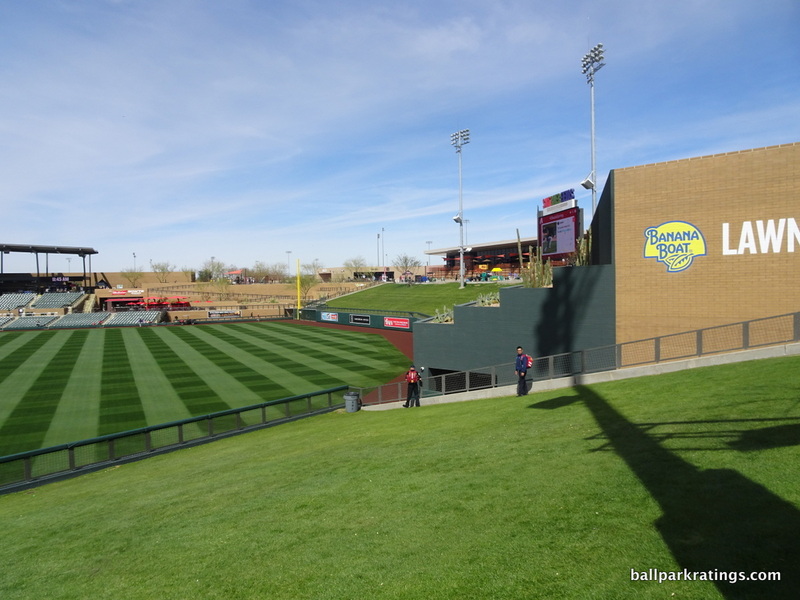 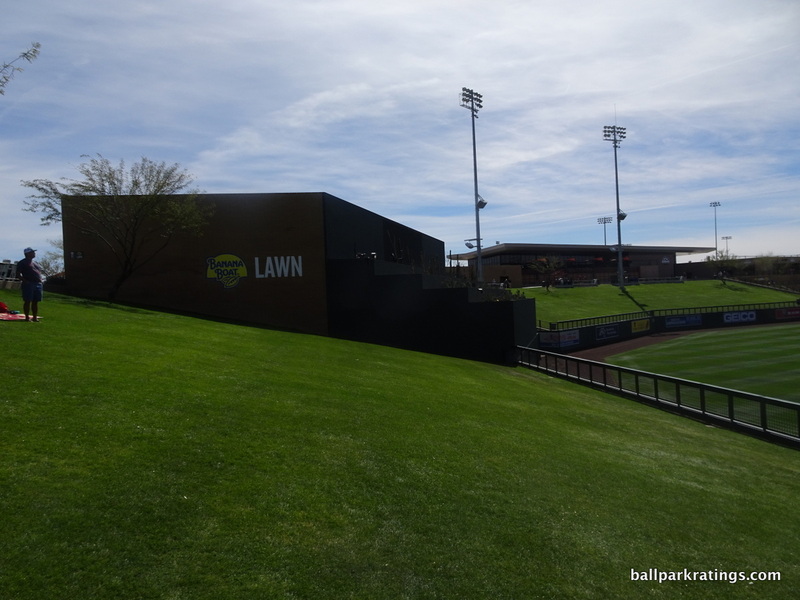 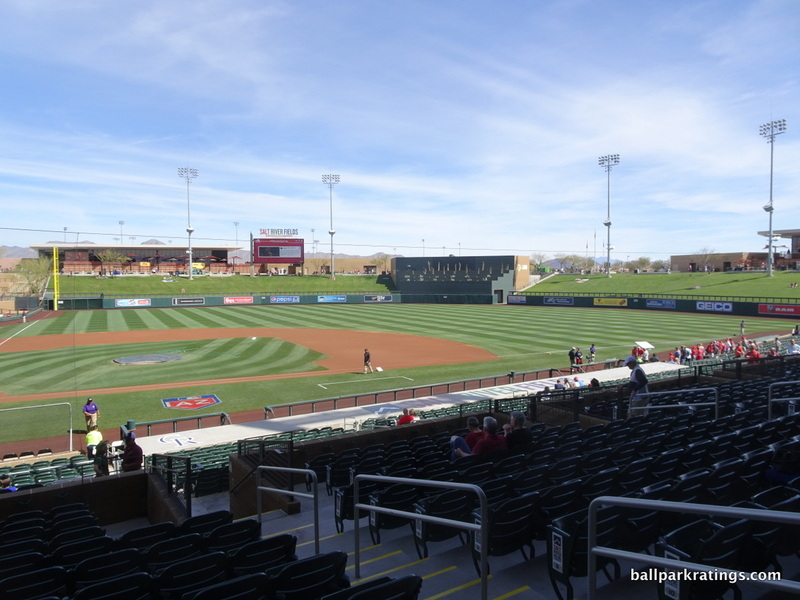 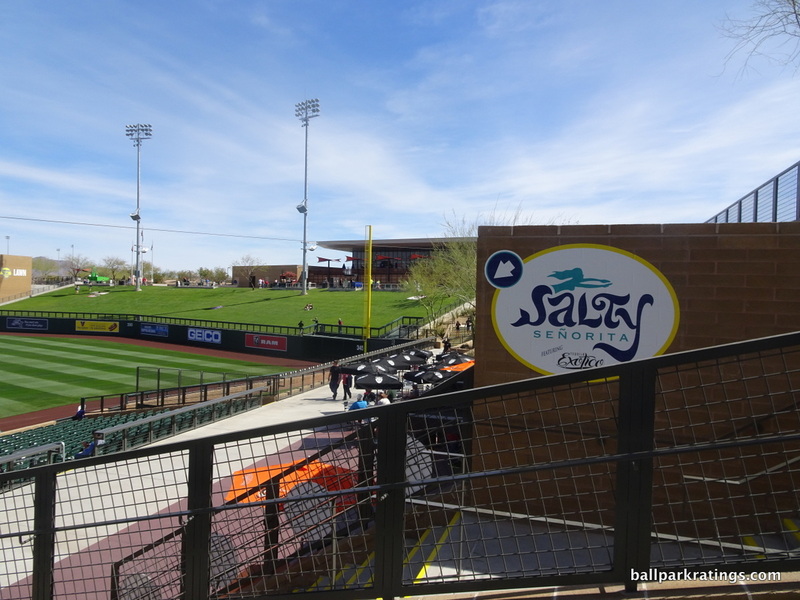 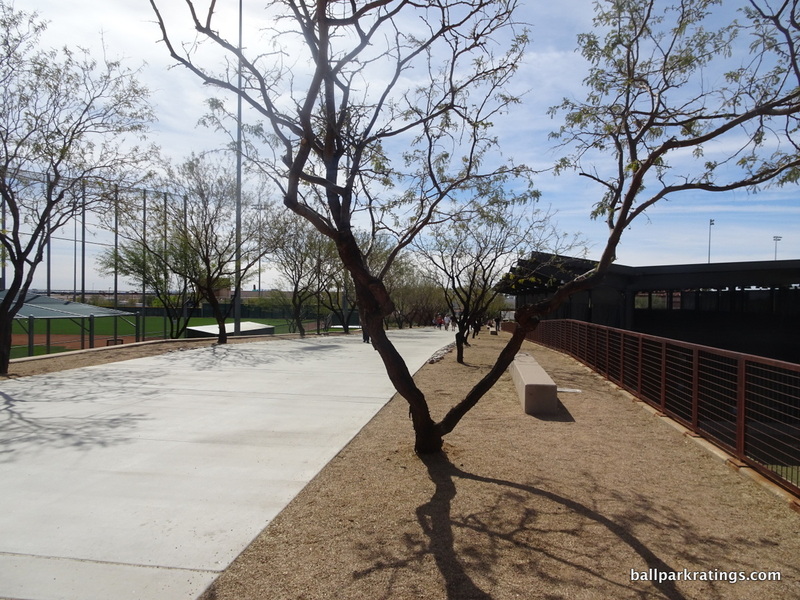 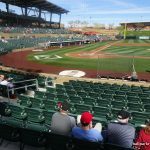 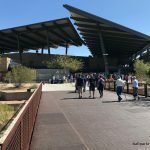 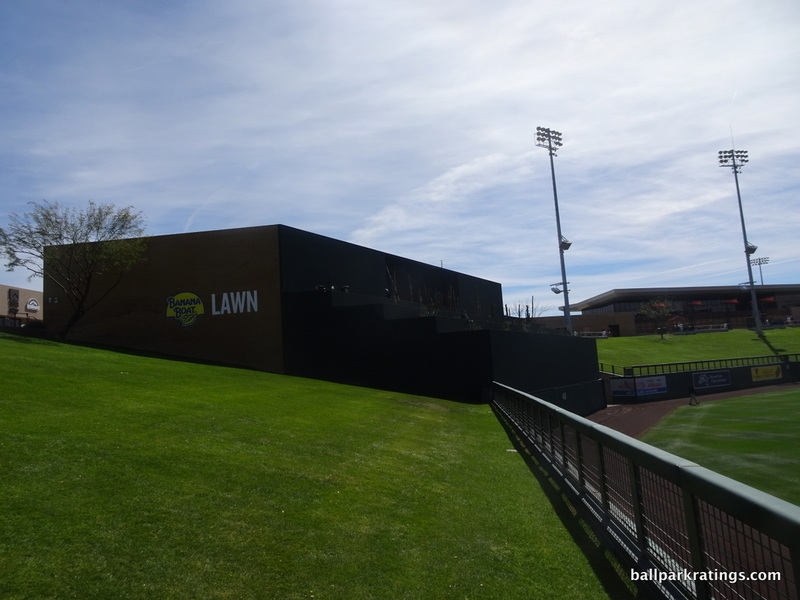 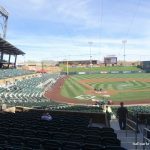 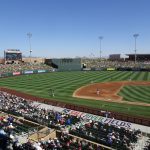 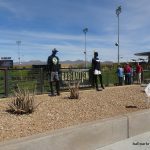 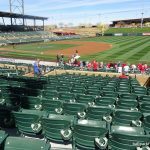 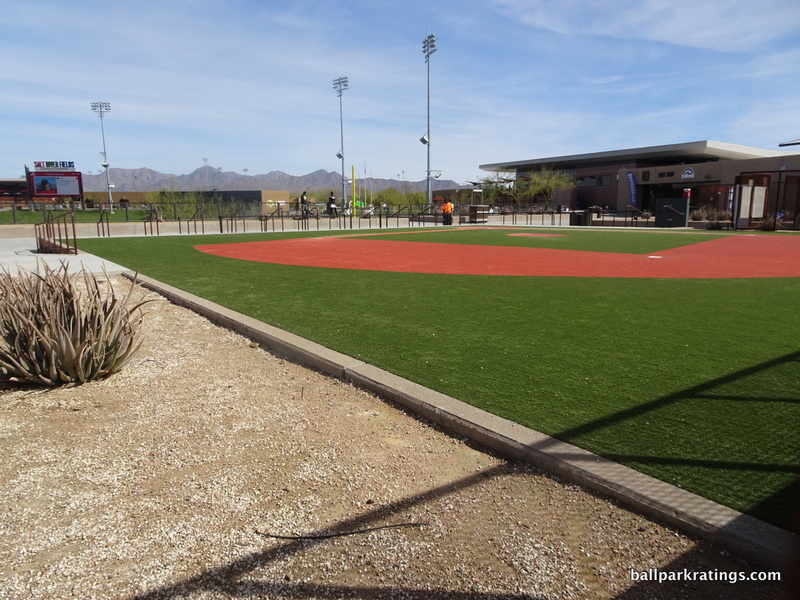 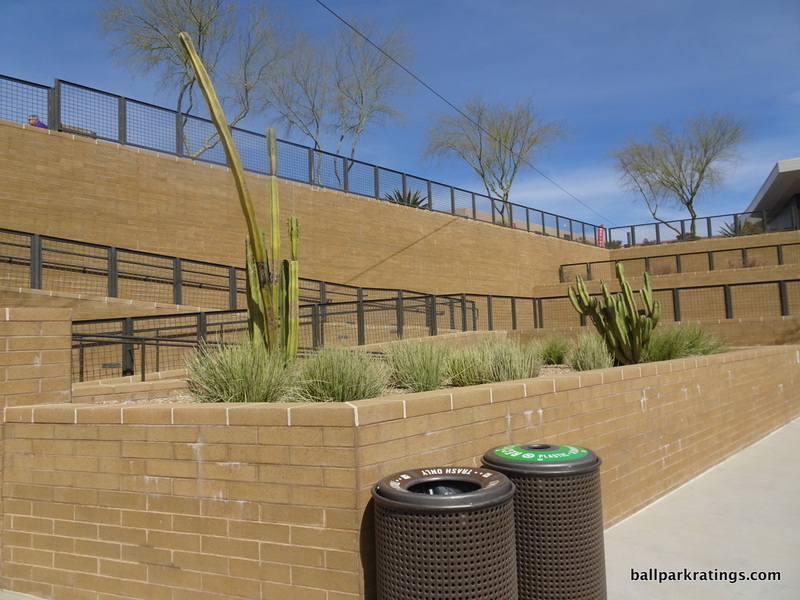 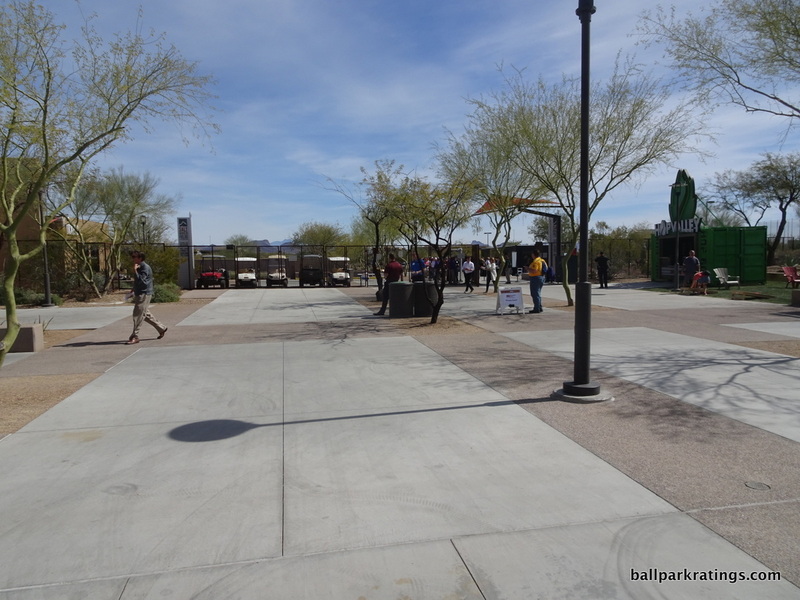 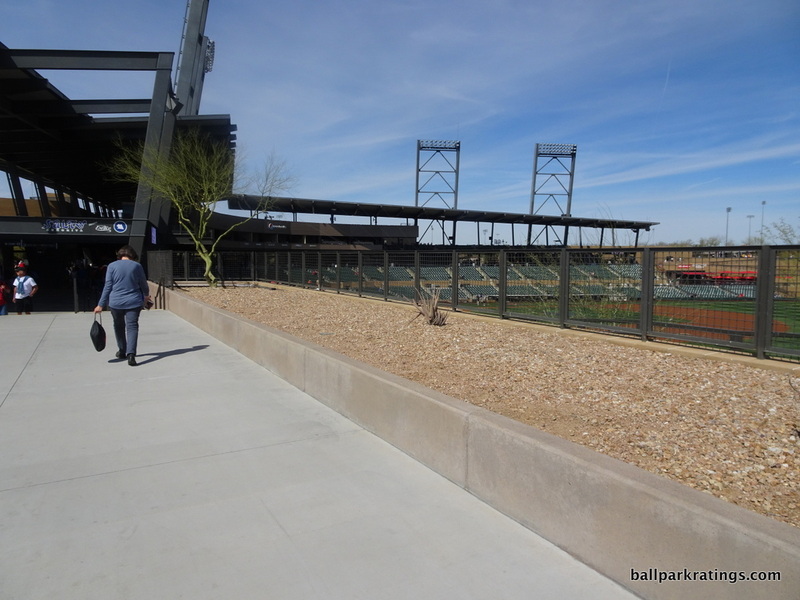 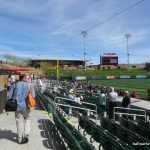 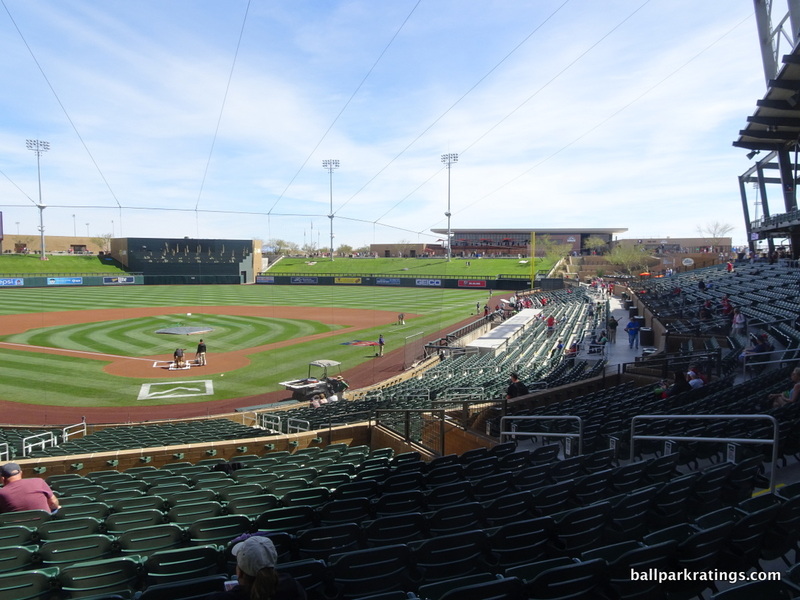 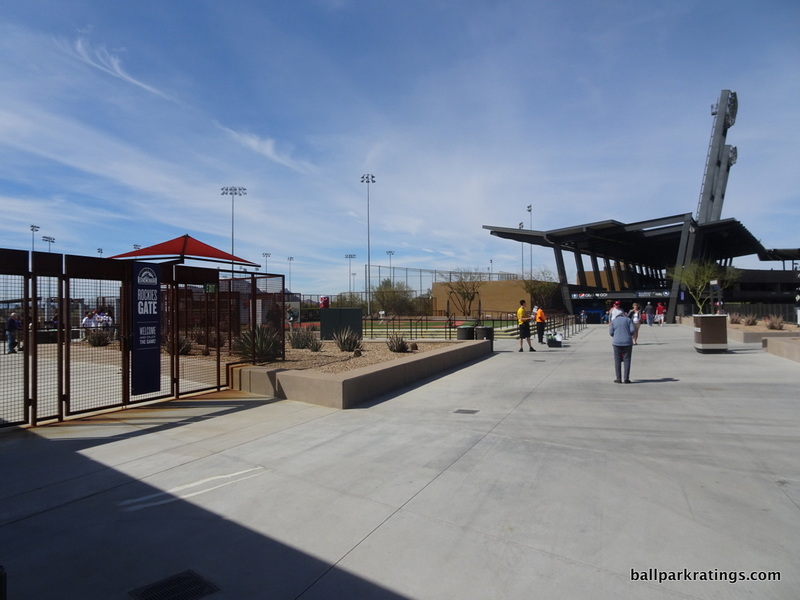 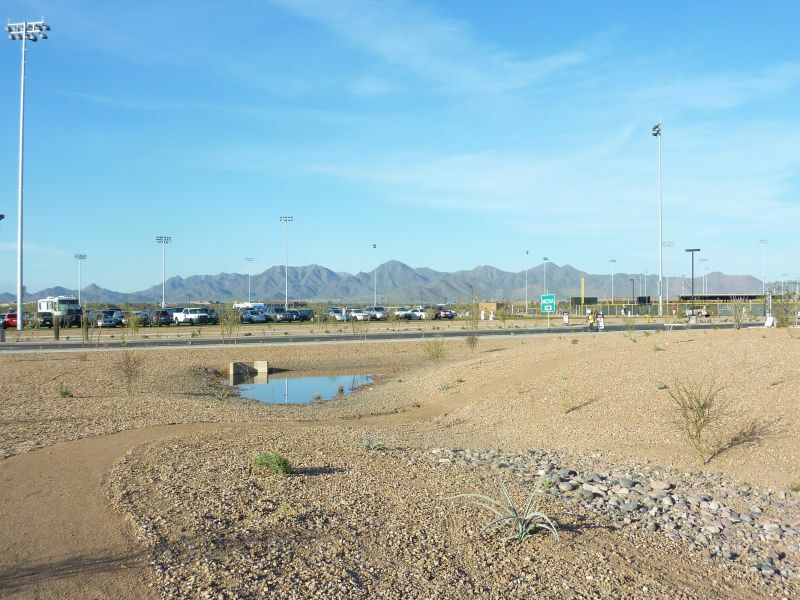 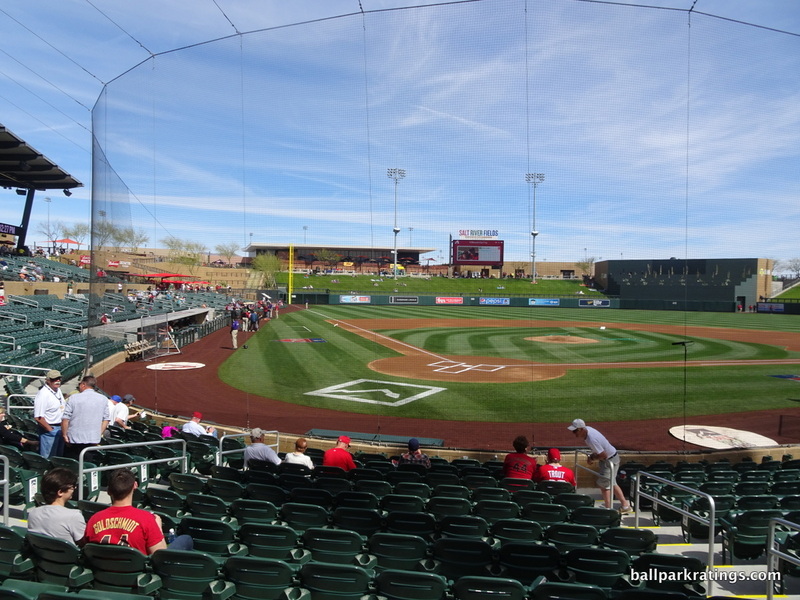 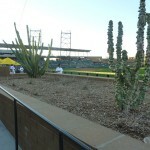 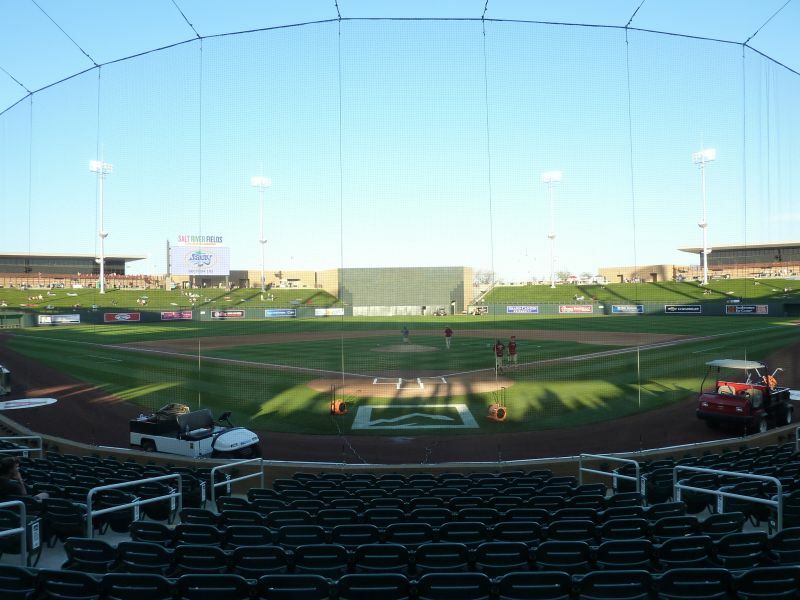 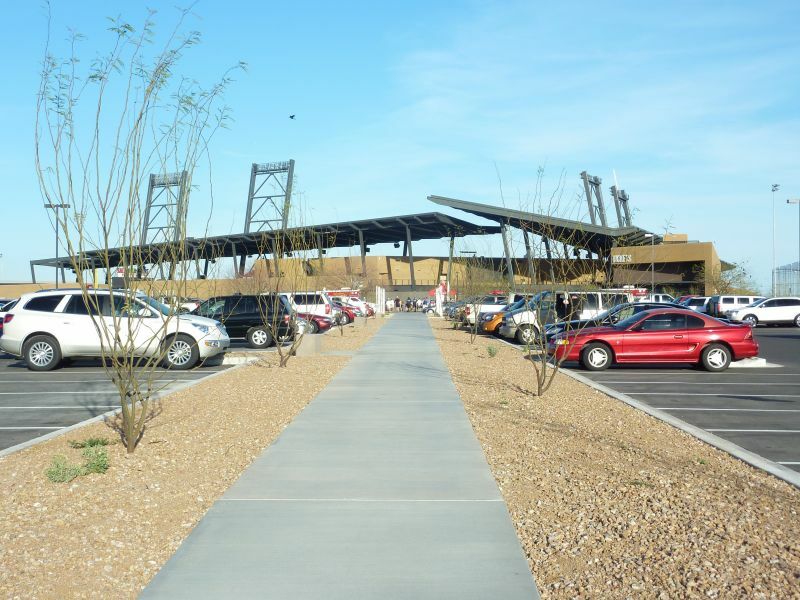 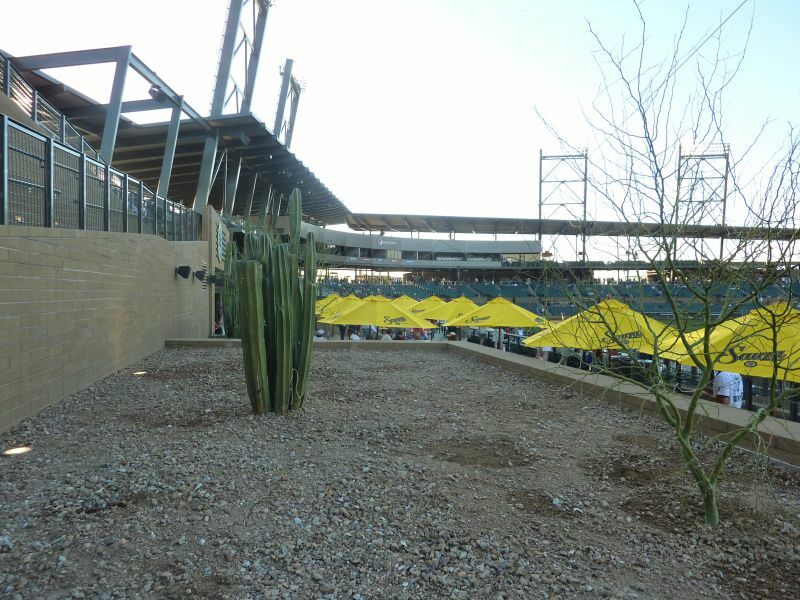 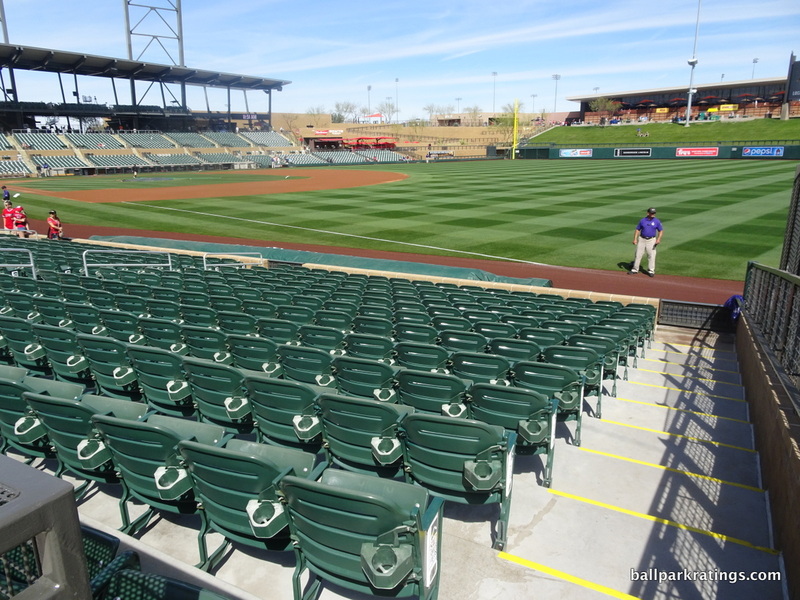 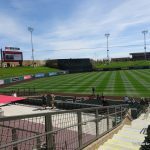 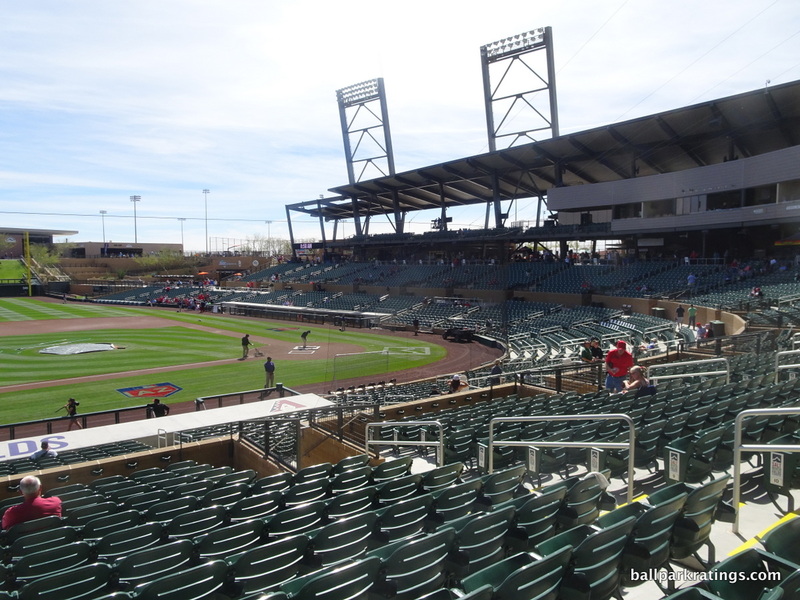 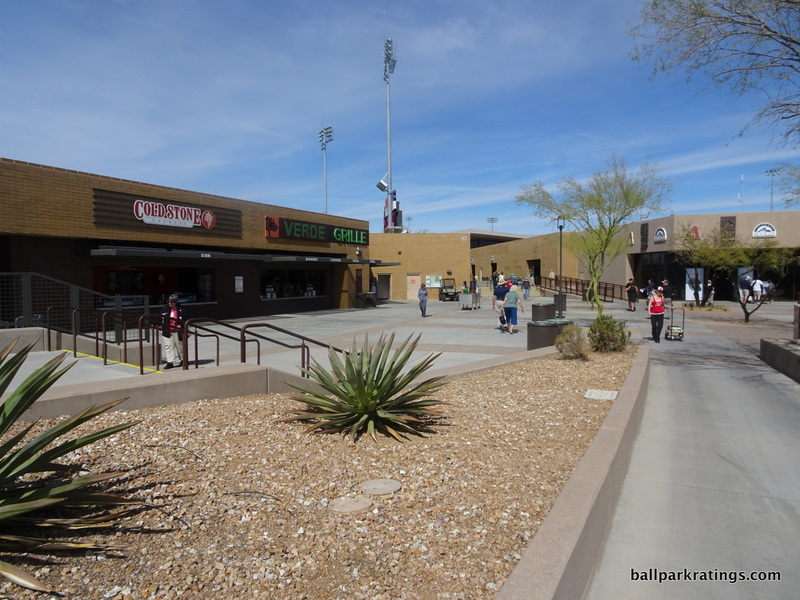 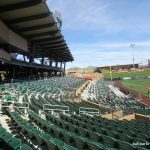 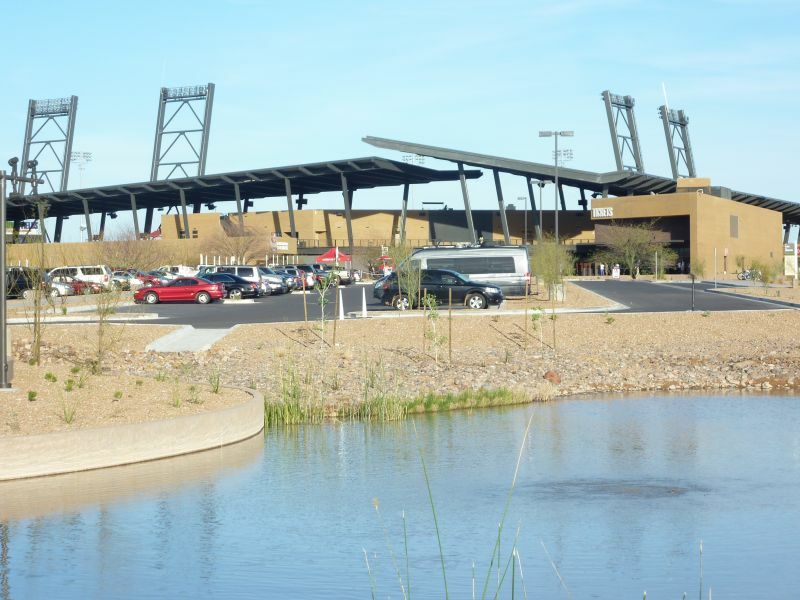 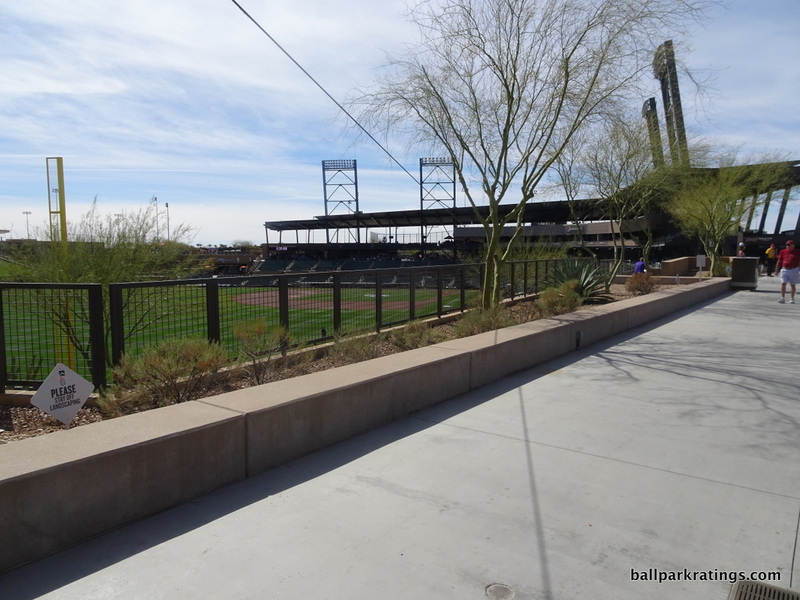 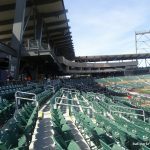 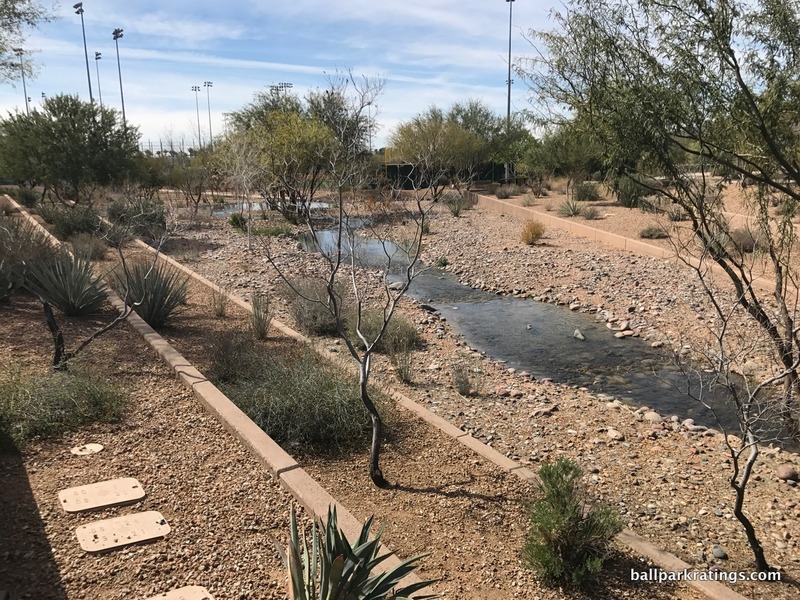 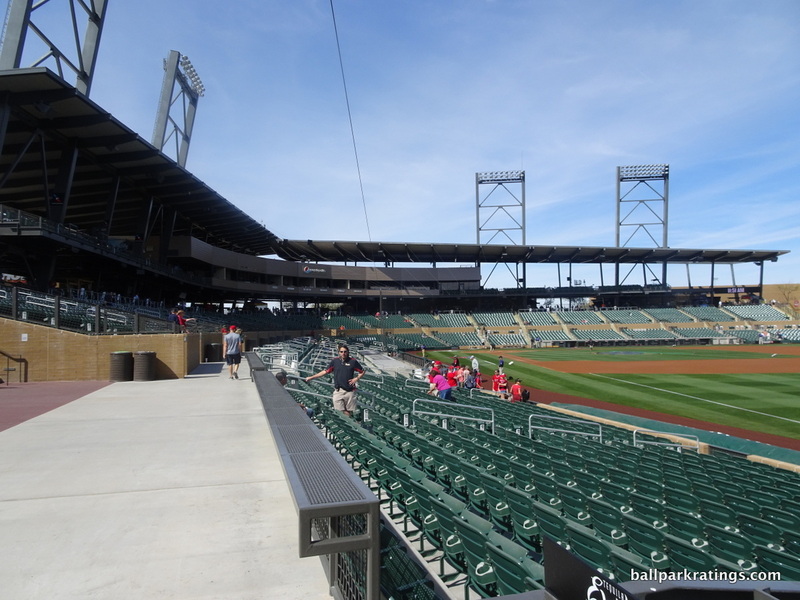 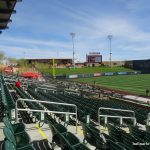 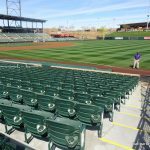 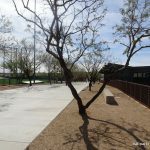 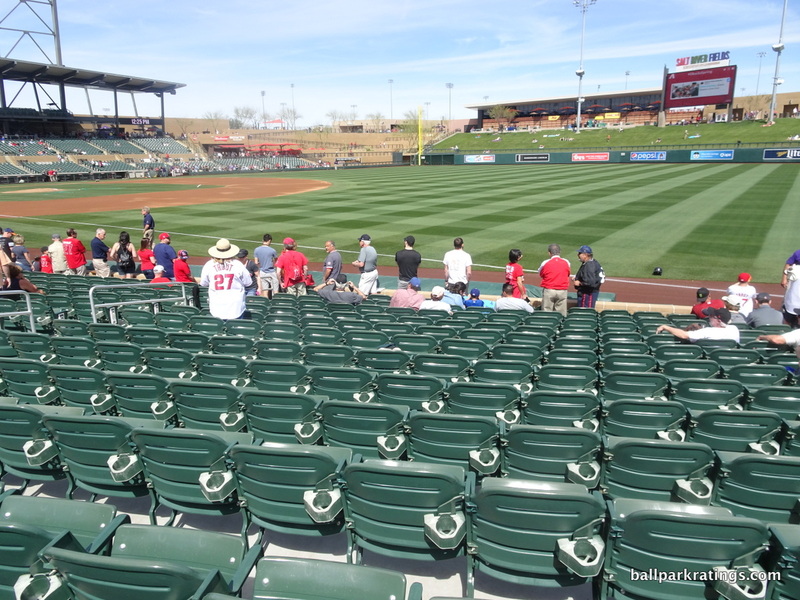 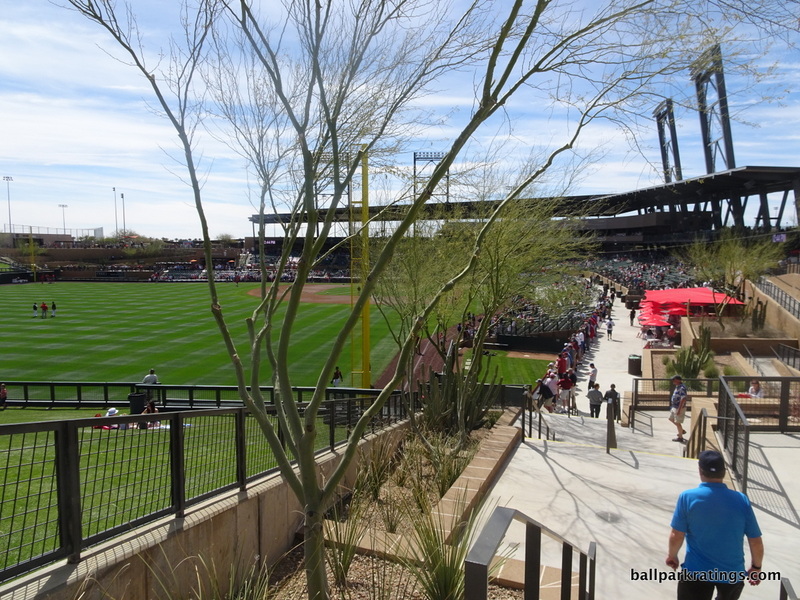 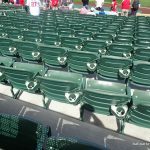 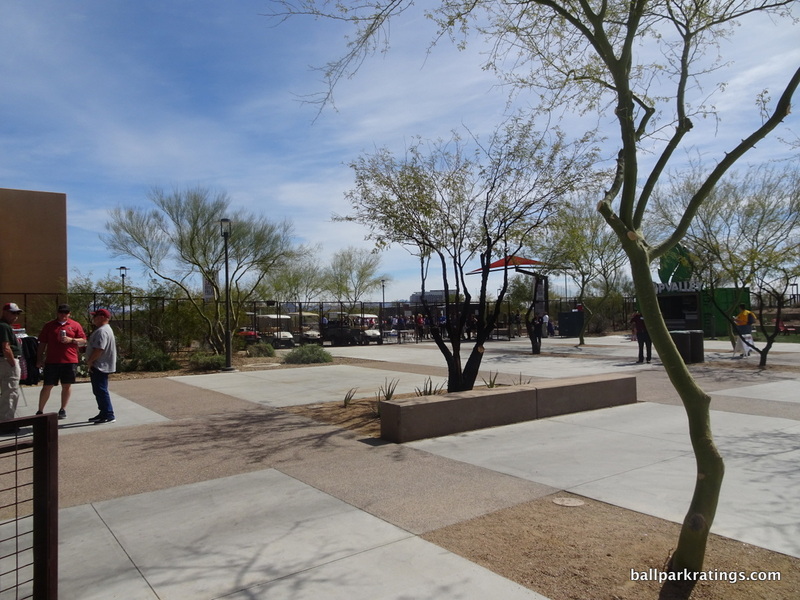 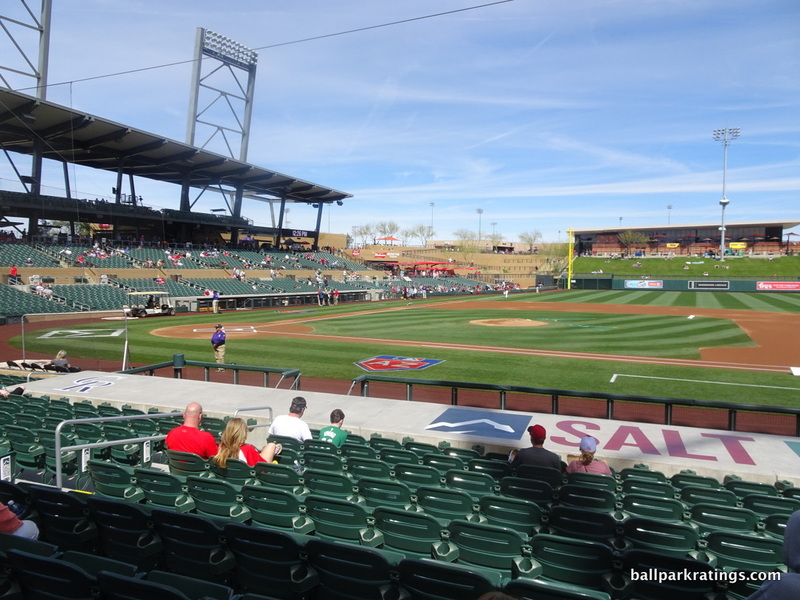 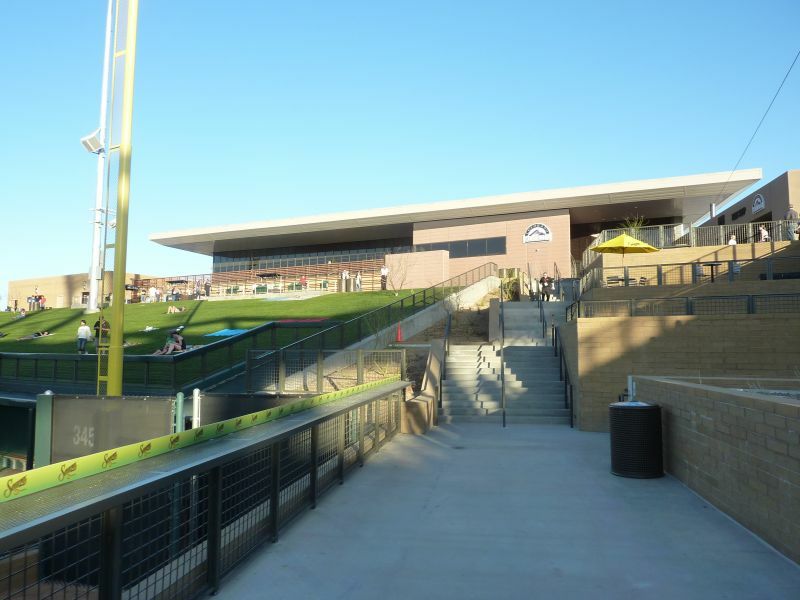 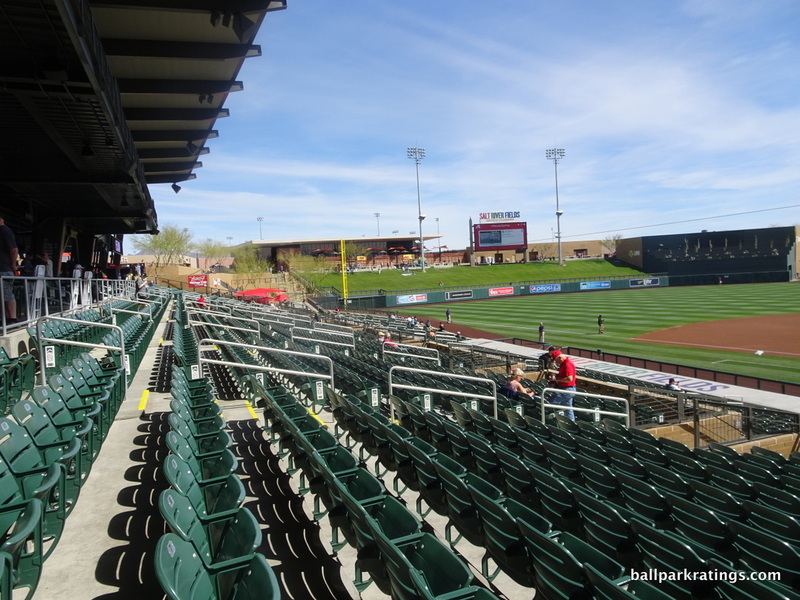 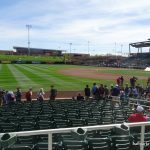 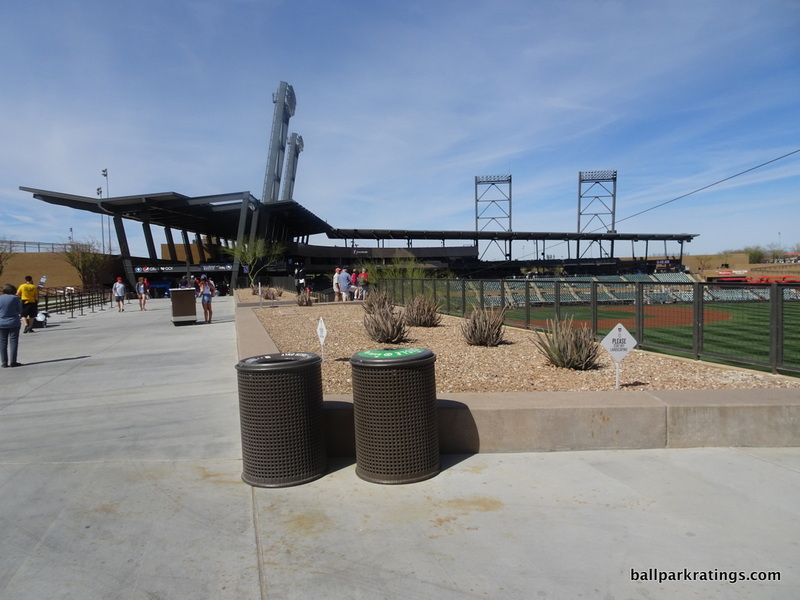 As you may know by now, I’m critical of the fact that many of these new Cactus League ballparks not only fail to stand out with a distinct personality, but also fail to represent the teams that play within them. 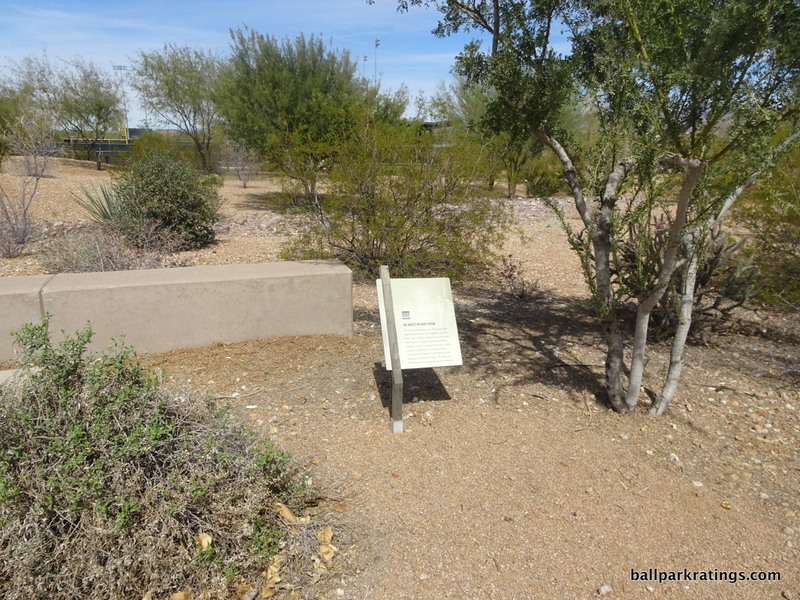 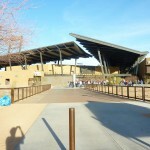 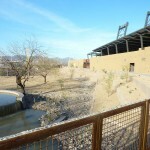 It didn’t seem to have the uniqueness and brilliant design concept of Camelback Ranch. 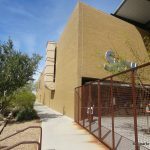 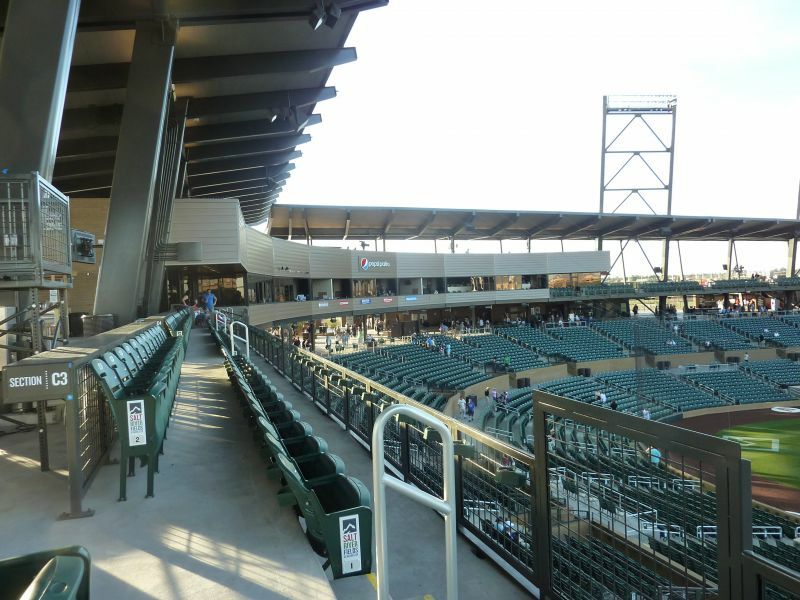 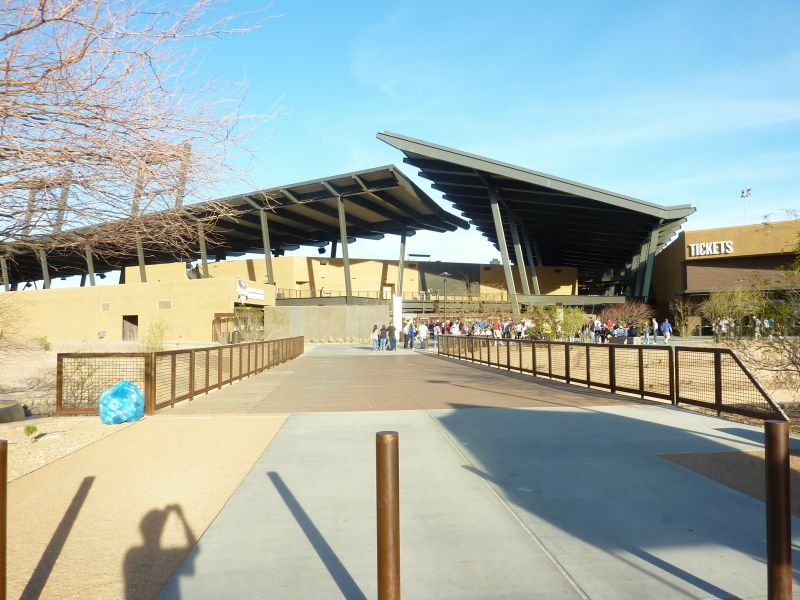 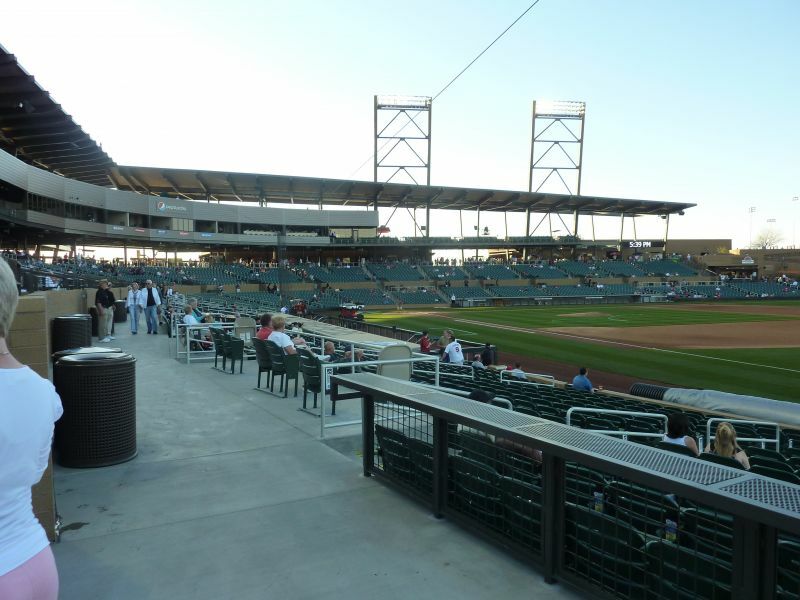 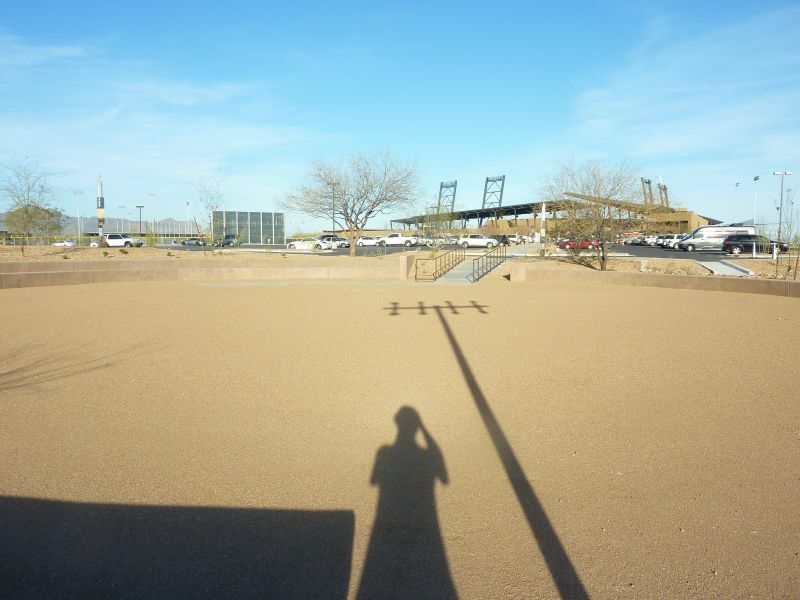 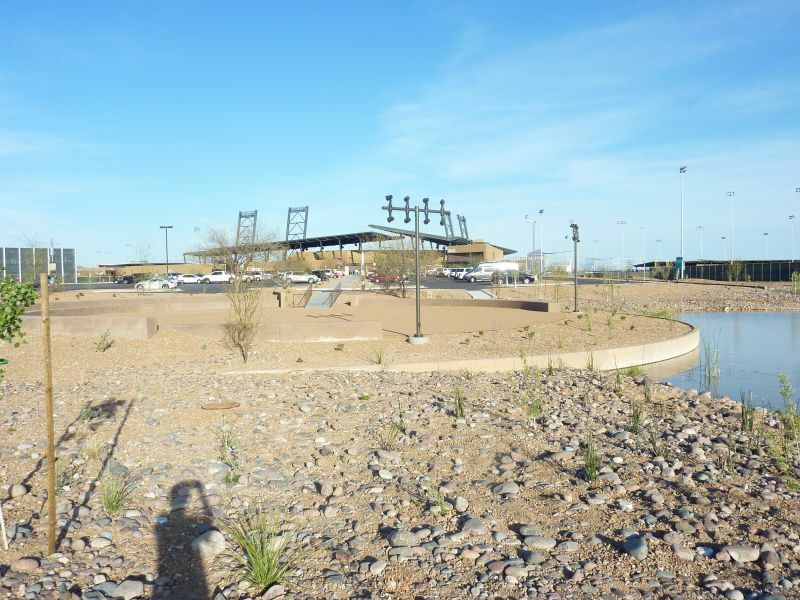 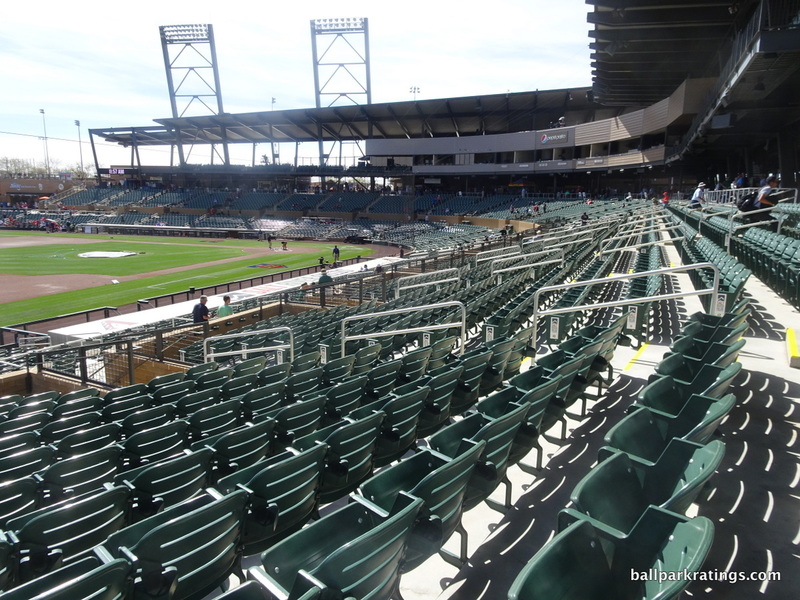 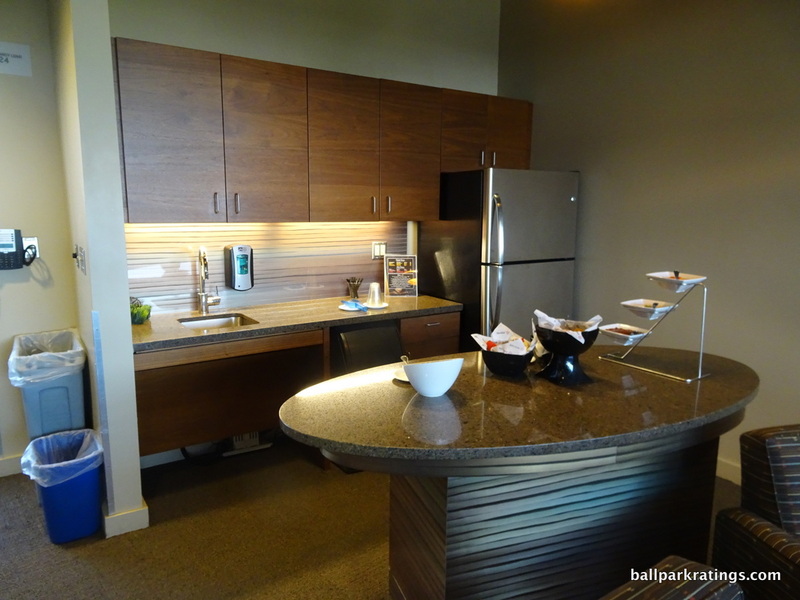 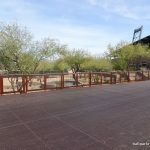 Salt River Fields at Talking Stick looked like a state-of-the-art Southwest cookie cutter, albeit right when the design capabilities were hitting their peak. 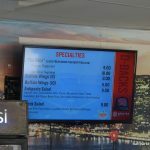 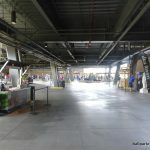 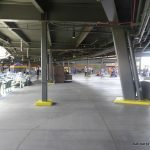 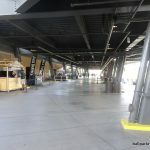 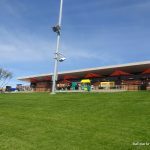 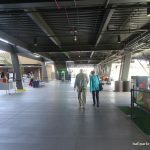 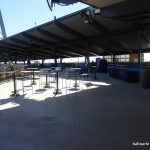 There comes a point when the level of innovation and sheer amount of money pumped into the aesthetic beauty can’t surpass the fact that not only does the facility lack charm, but has no tangible connection to the team that plays there or the fans that go there, unlike jetBlue Park or the renovated Ed Smith Stadium, which also opened the same year and clearly had Oriole character. 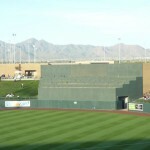 They can build as many of these as they want, but what is going to make one of them stand out 10 years later? 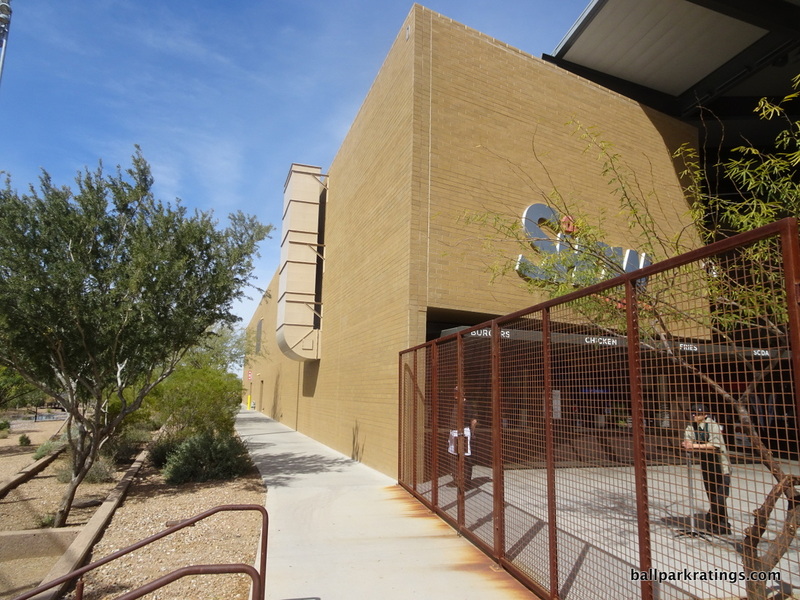 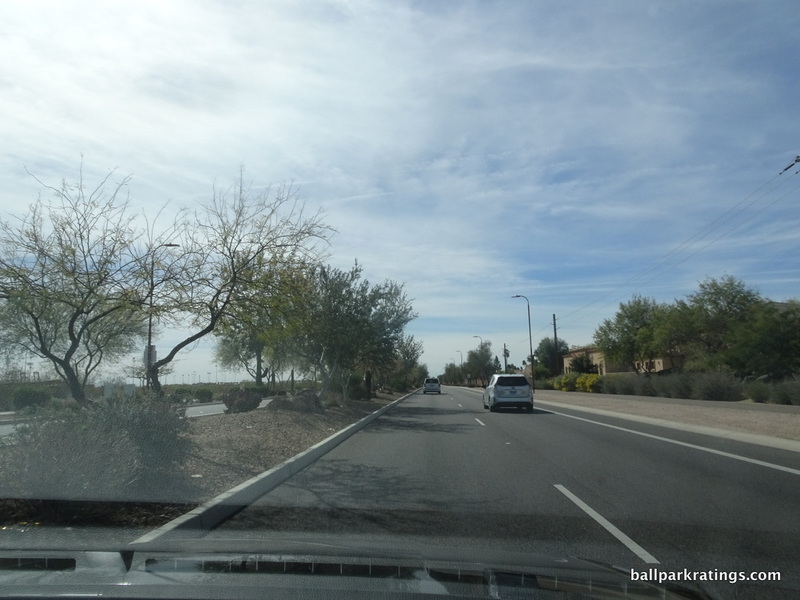 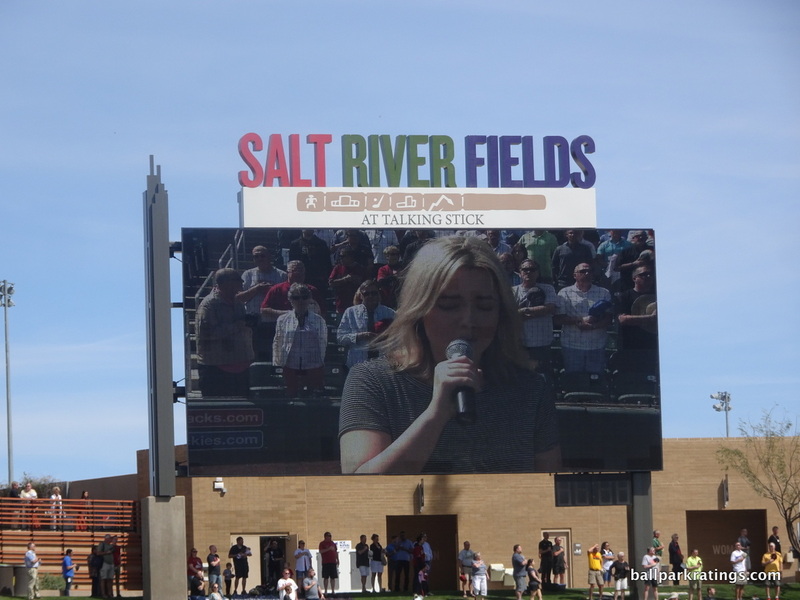 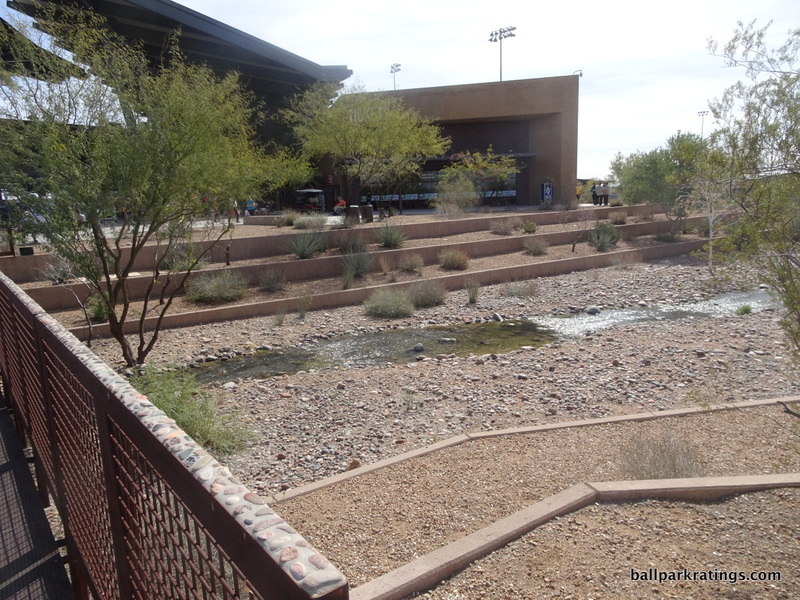 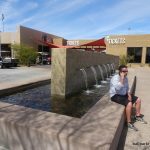 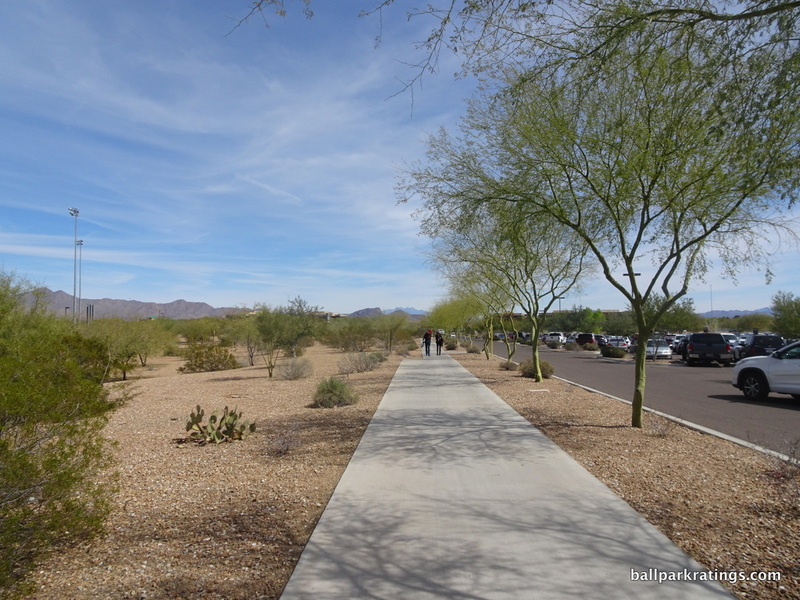 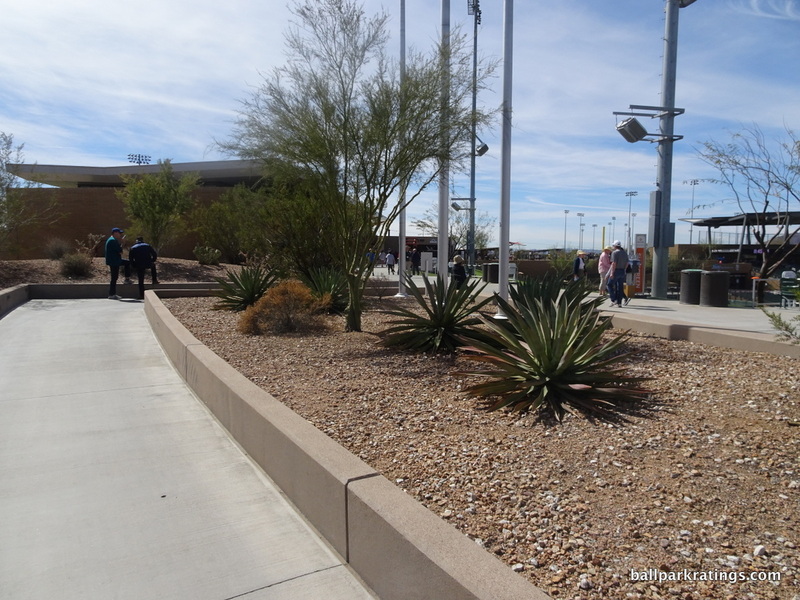 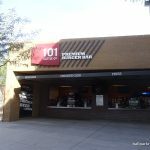 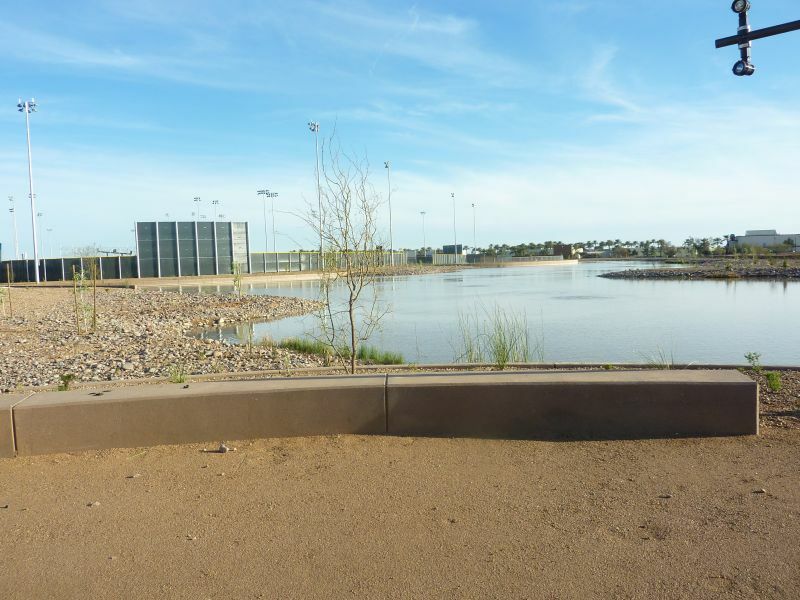 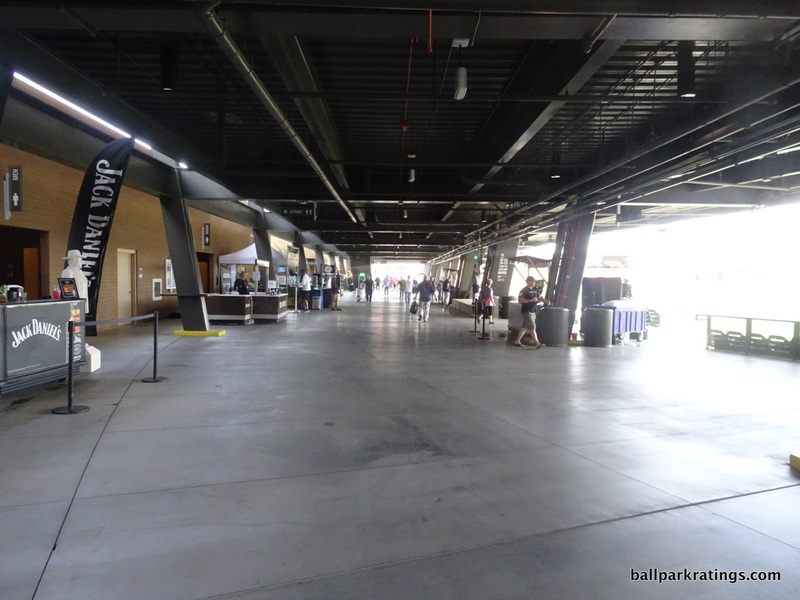 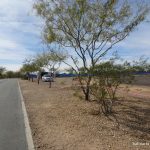 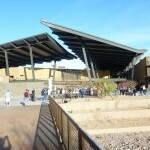 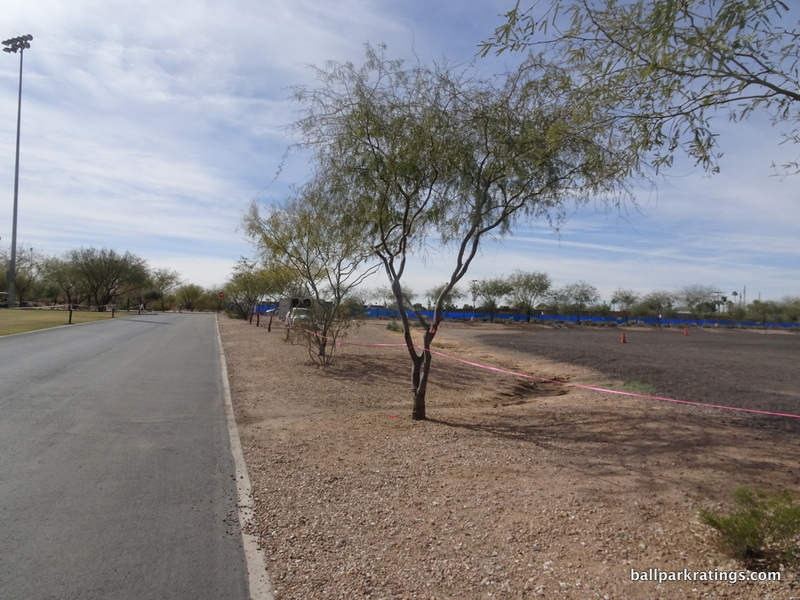 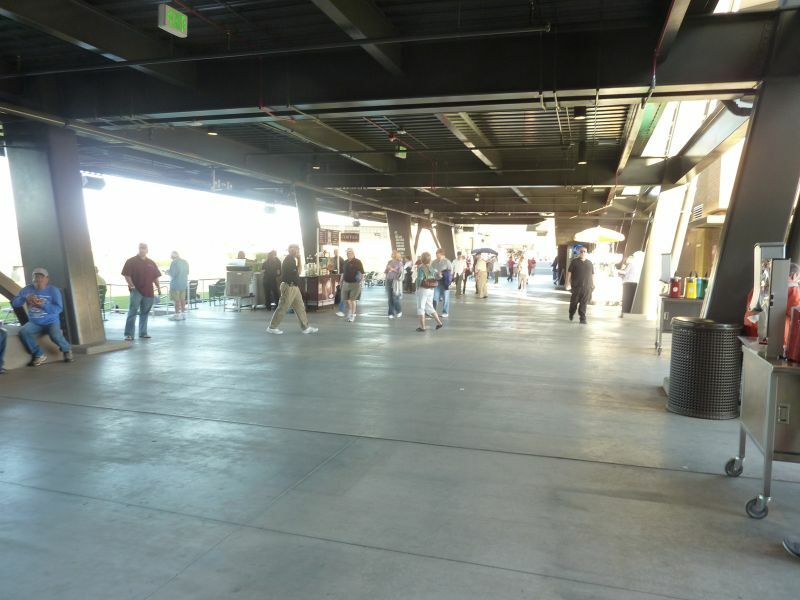 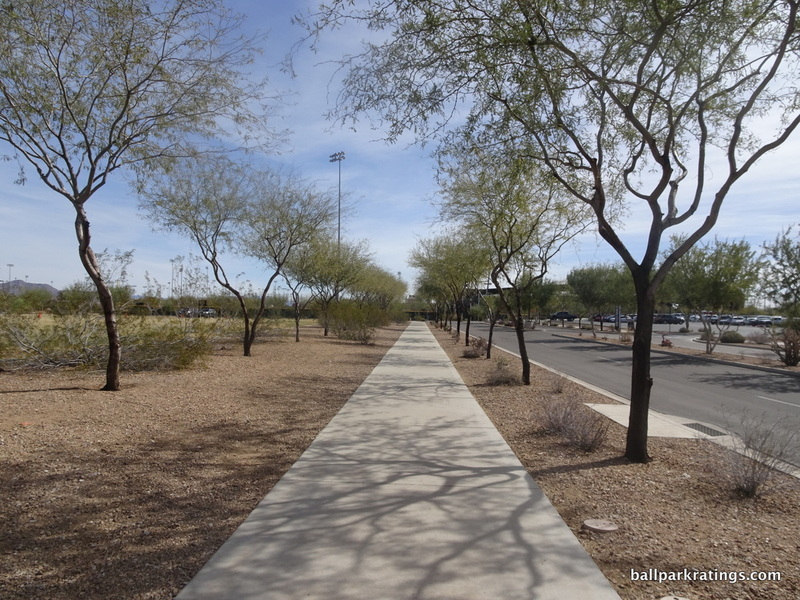 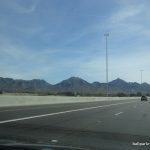 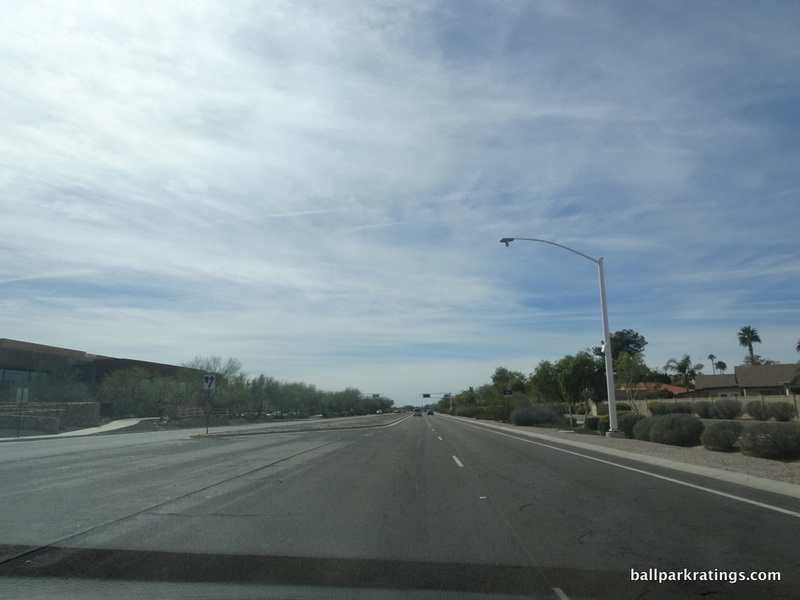 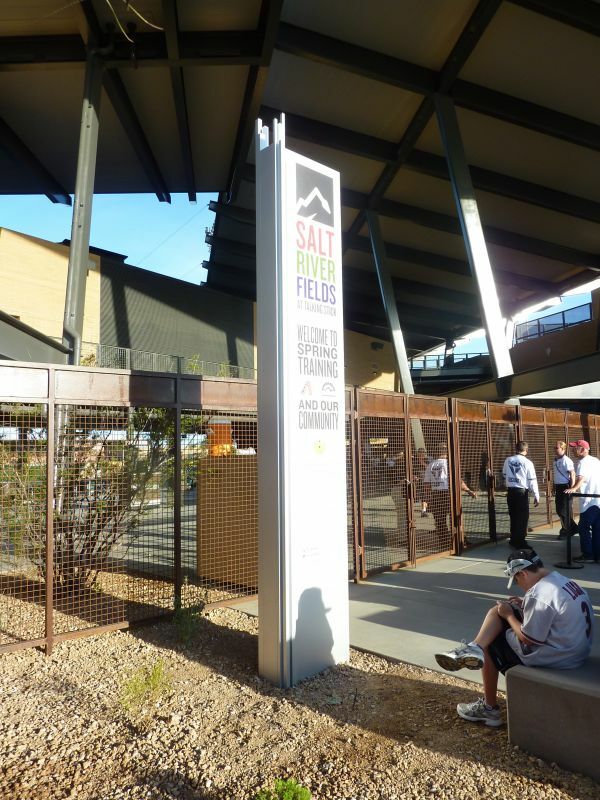 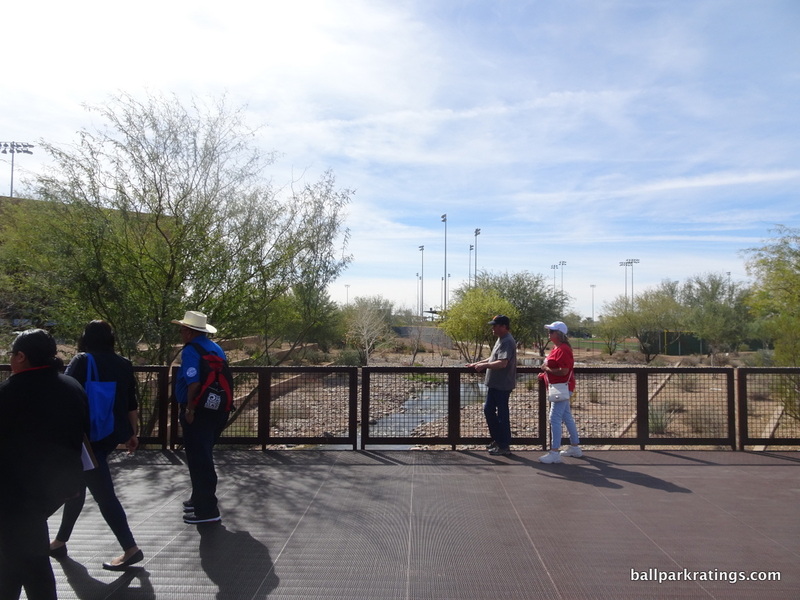 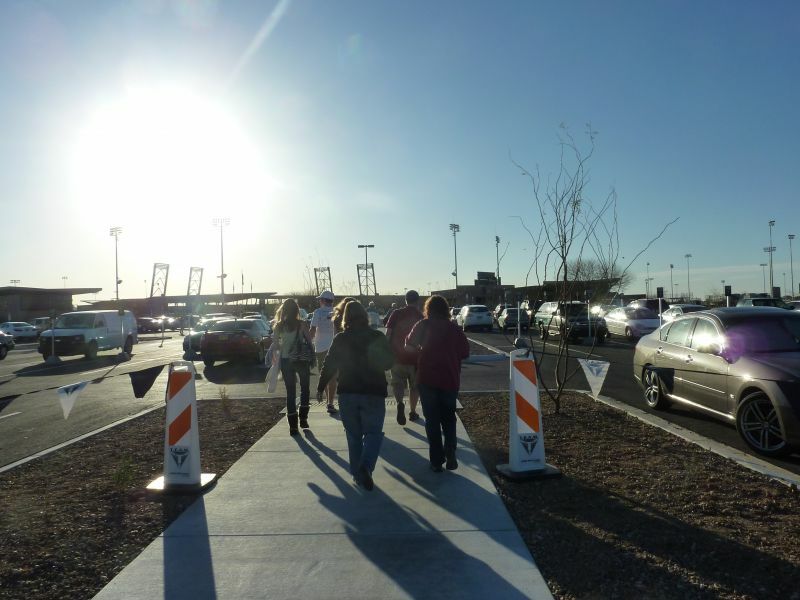 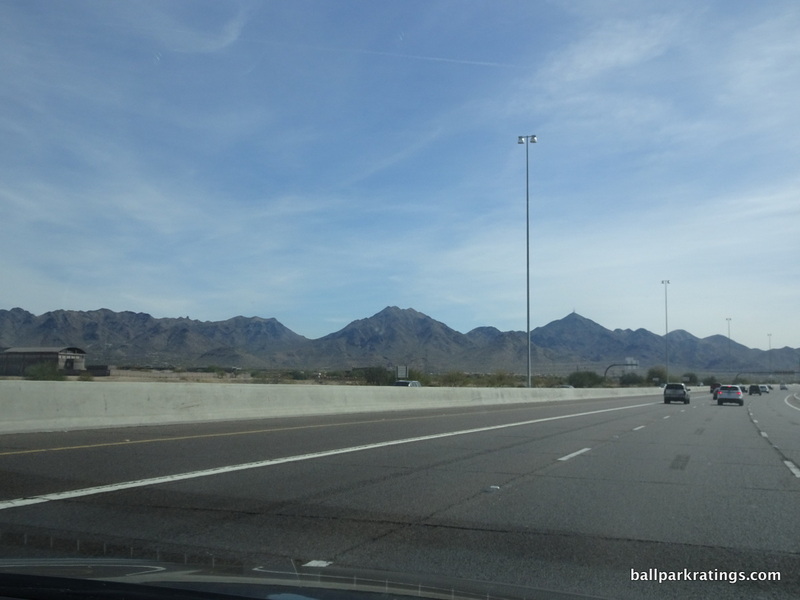 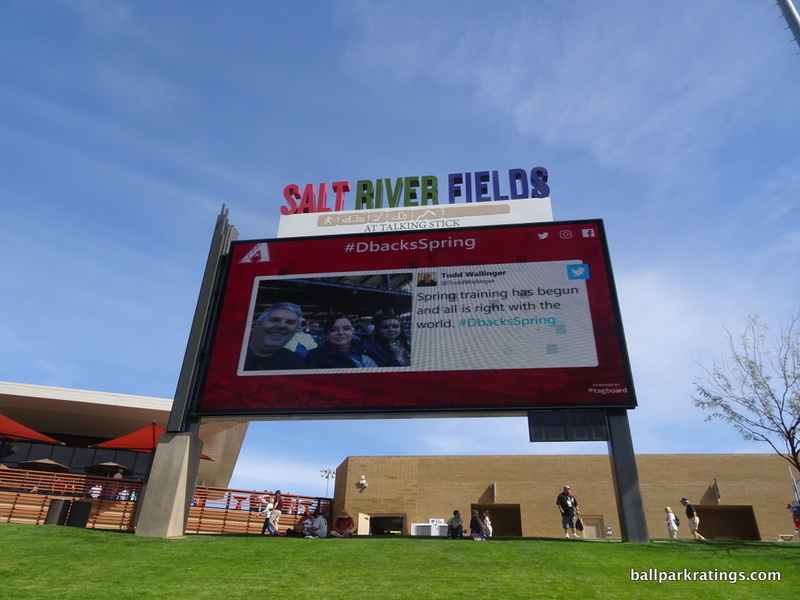 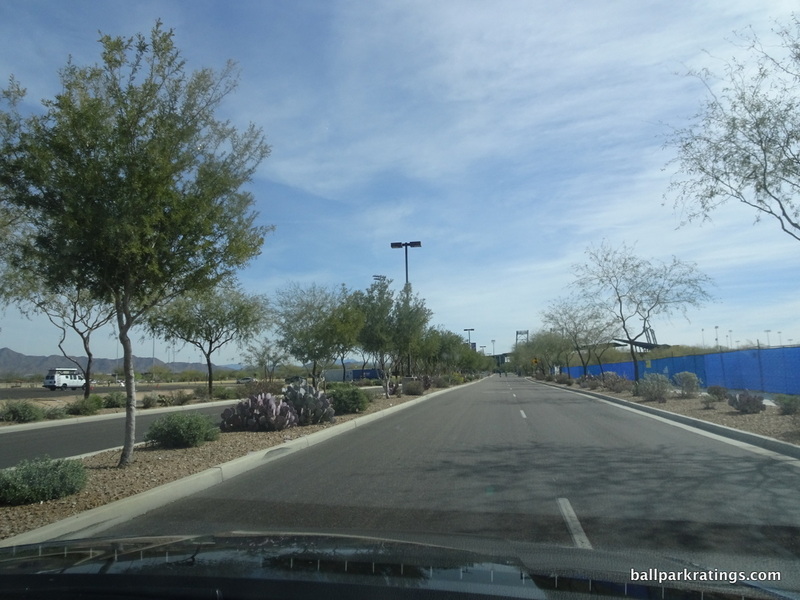 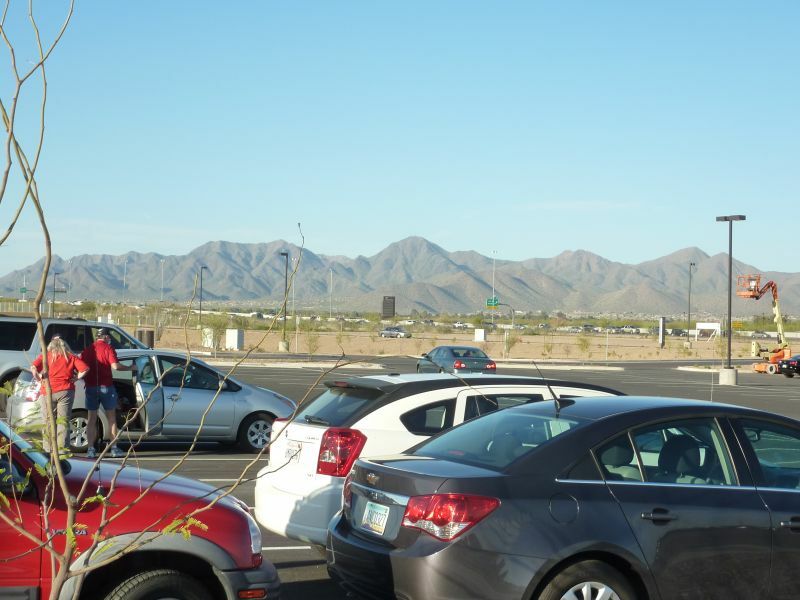 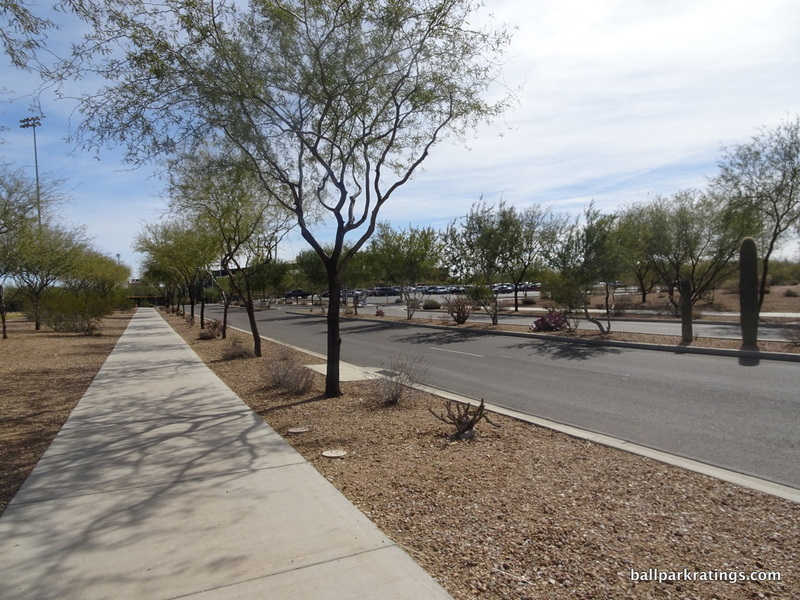 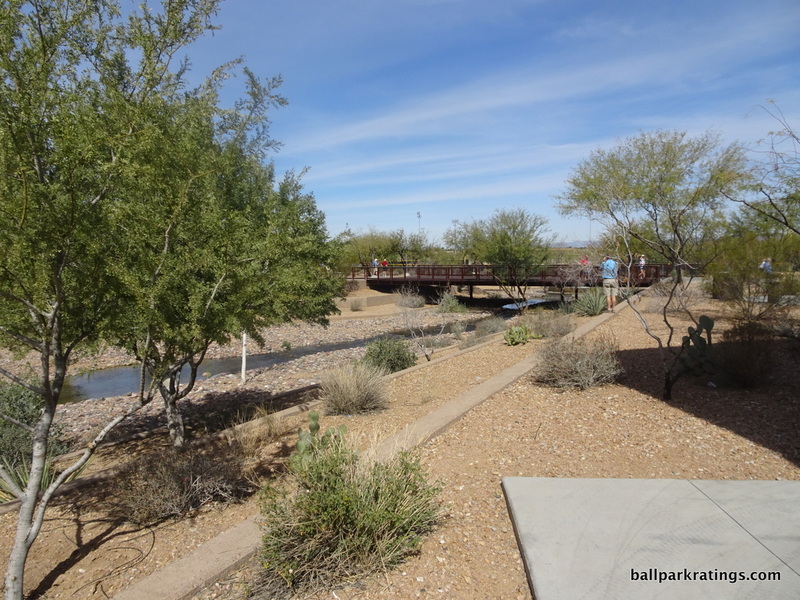 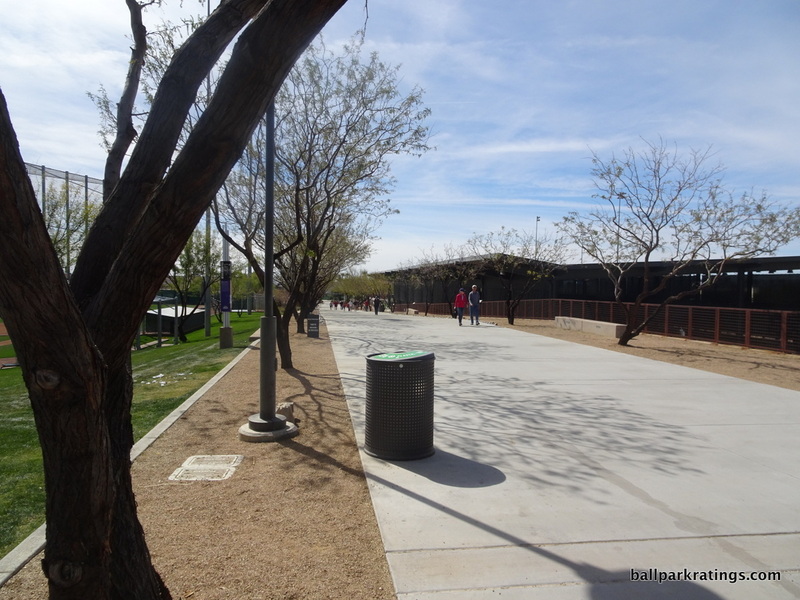 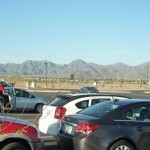 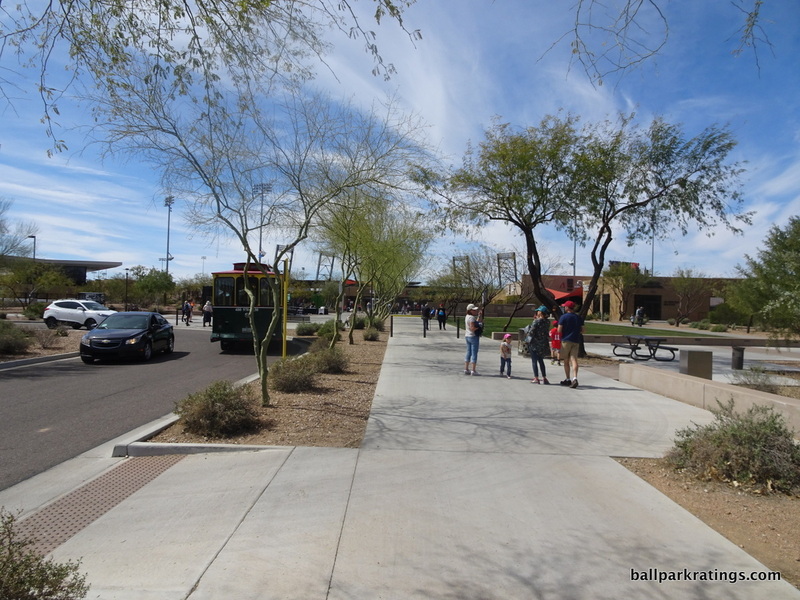 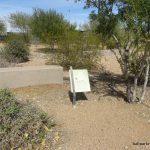 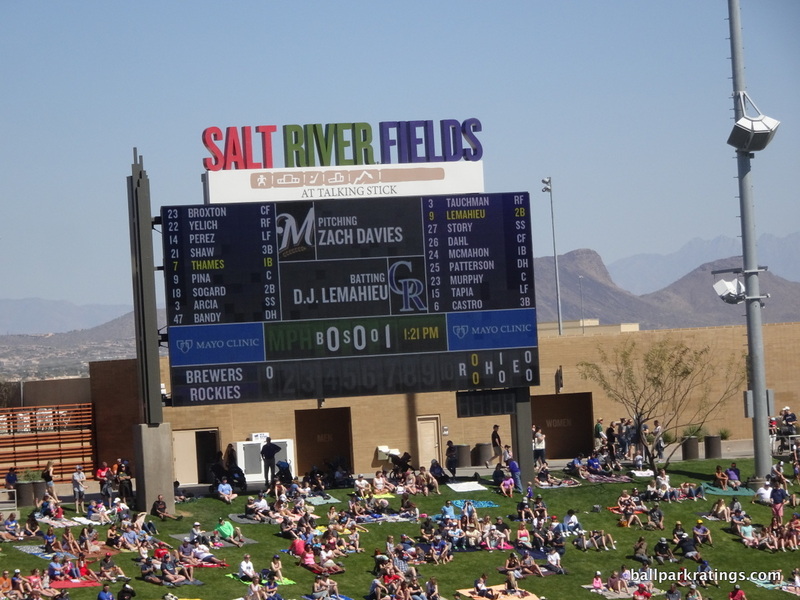 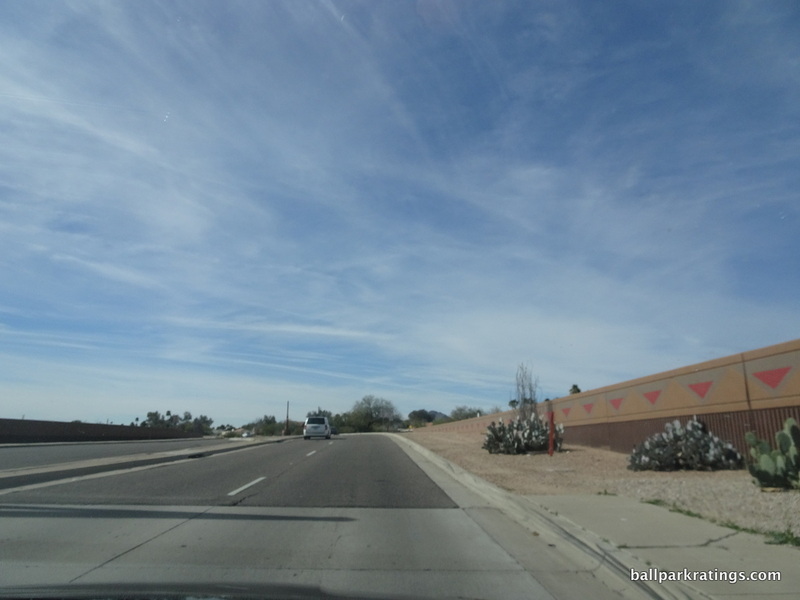 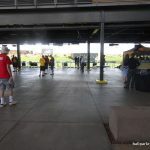 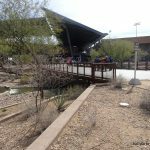 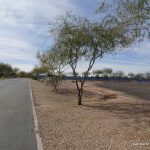 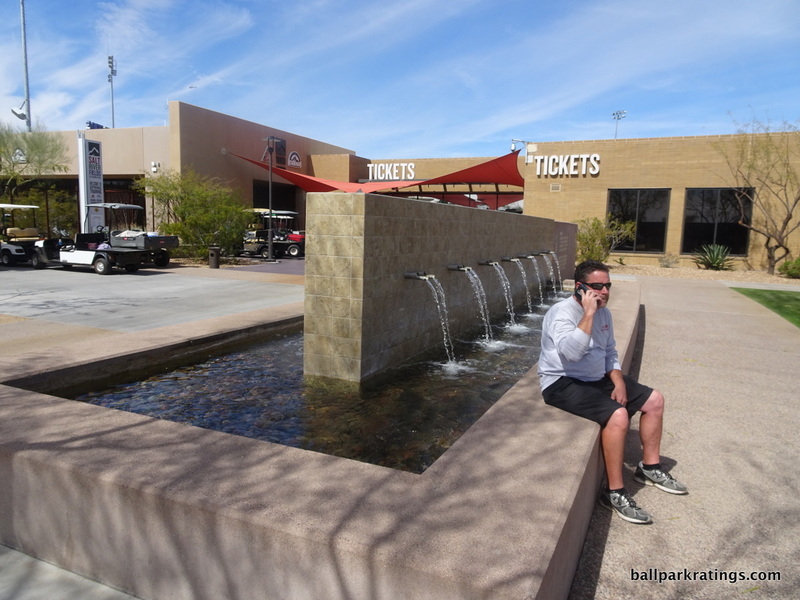 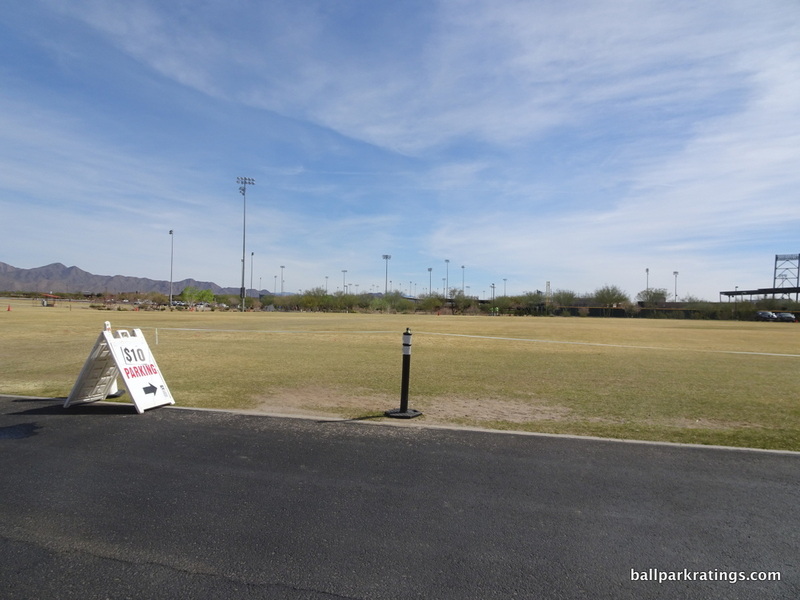 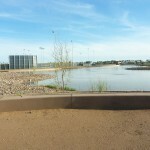 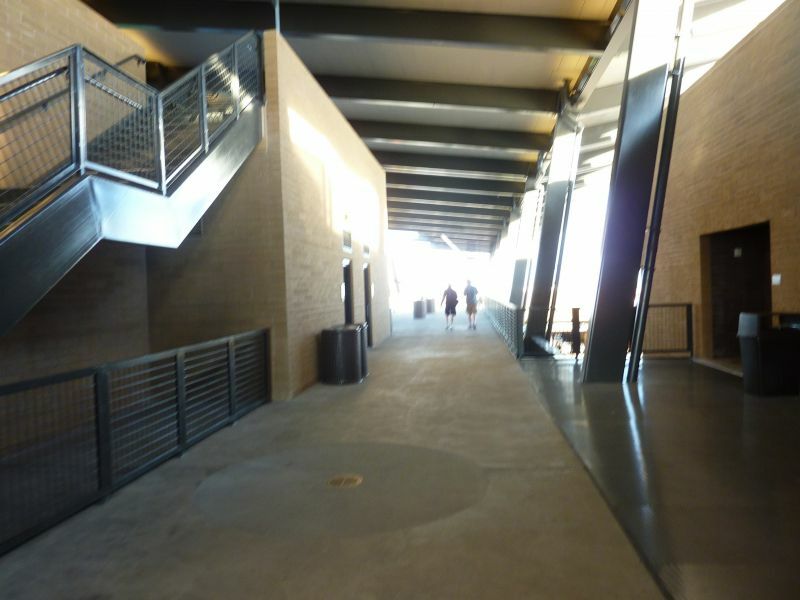 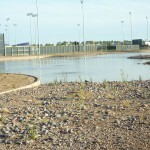 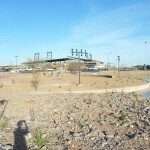 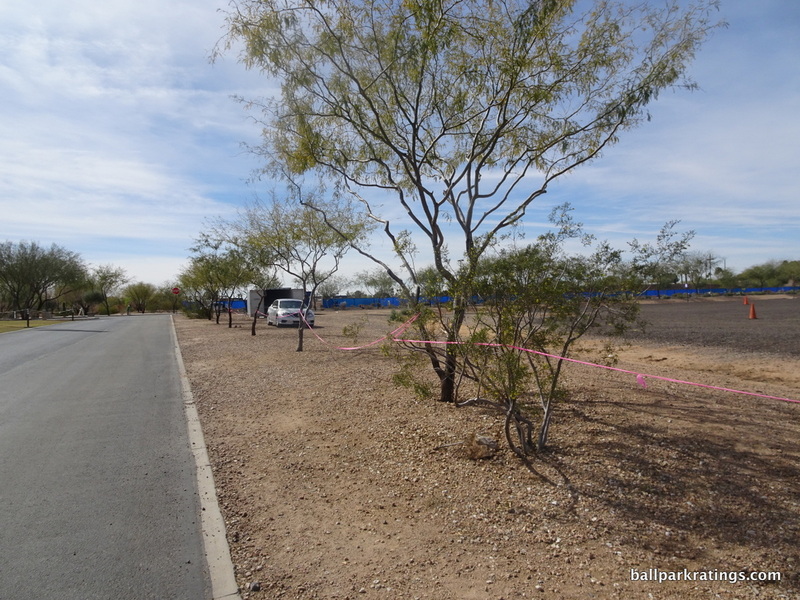 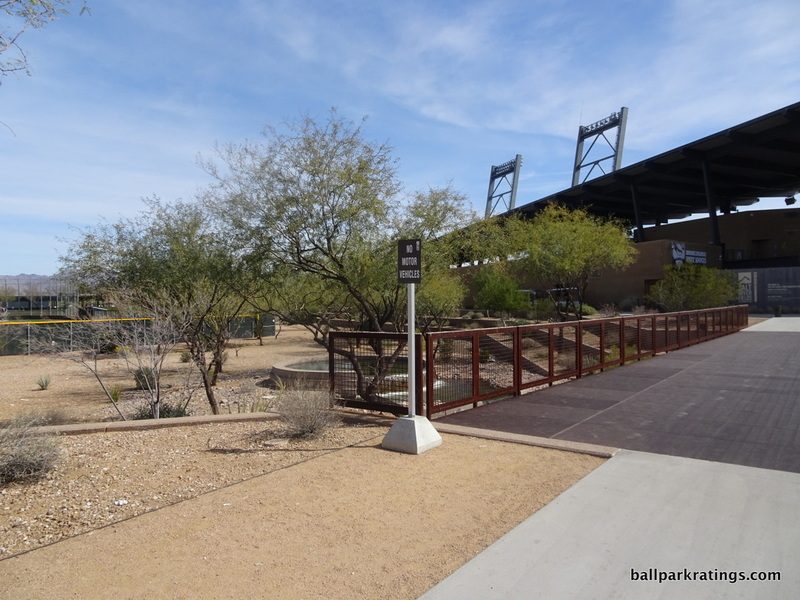 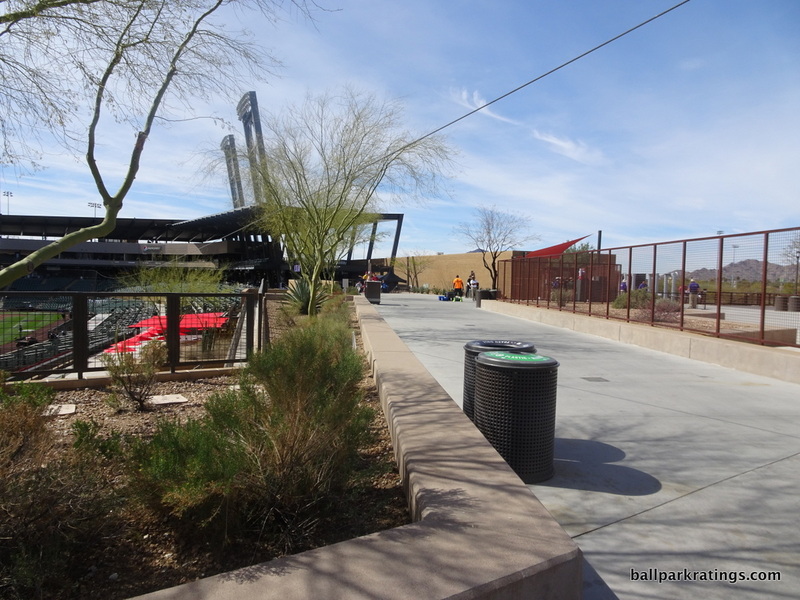 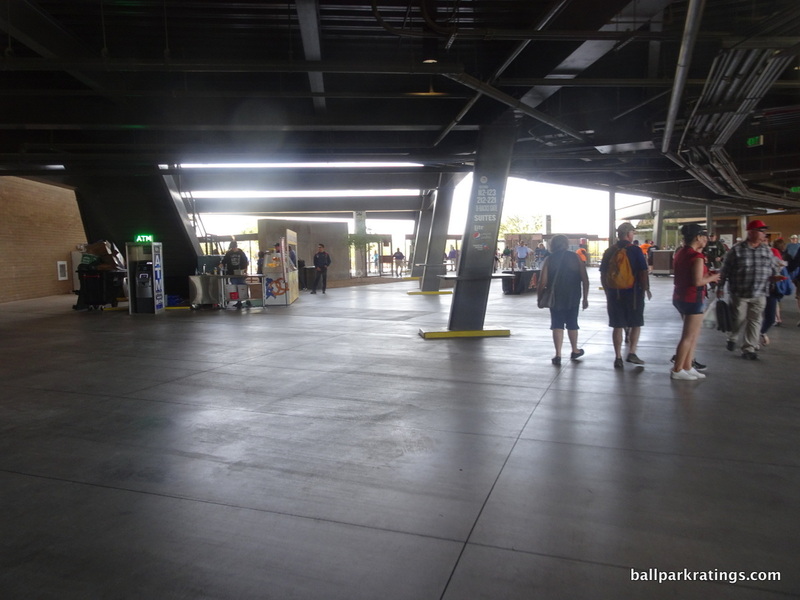 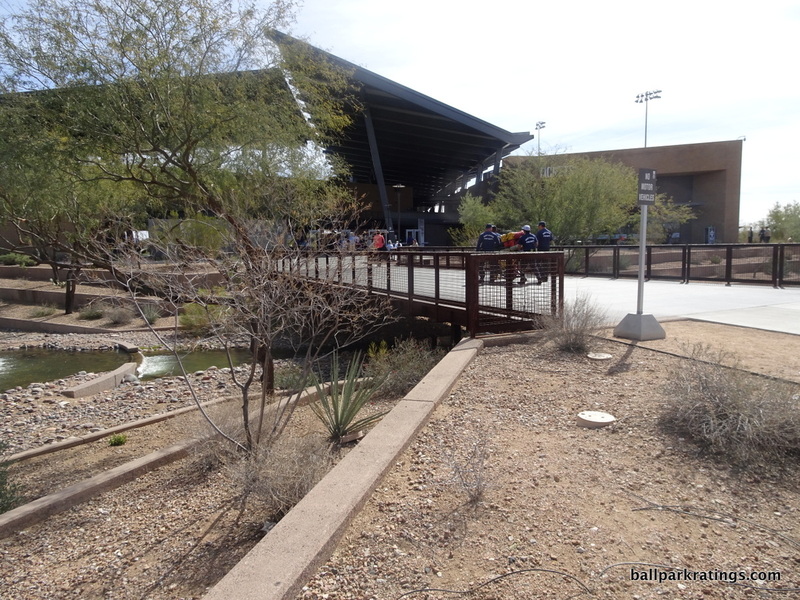 Luckily, for Salt River Fields at Talking Stick, we haven’t reached that point yet, because Talking Stick was so damn great, I just didn’t really care. 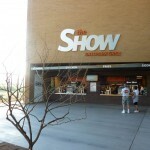 I was totally blown away. 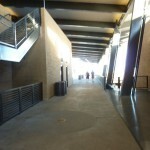 I was a believer. 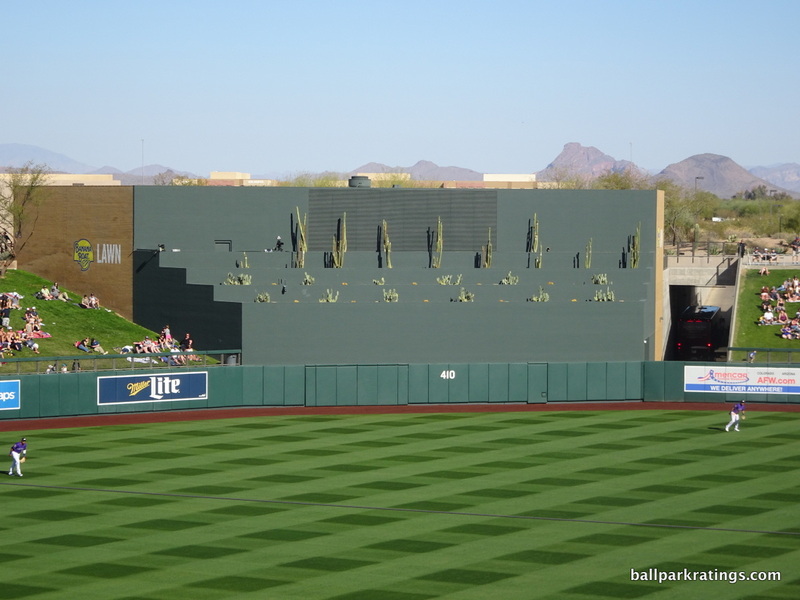 I love looking at preliminary ballpark rendering, which usually make a ballpark look better than it turns out to be; this was a rare case when the renderings and the preliminary design details actually undersold the ballpark. 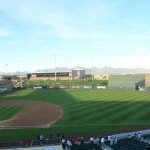 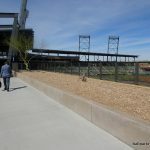 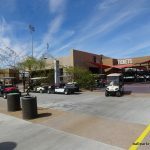 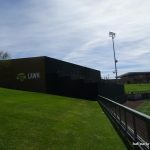 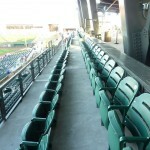 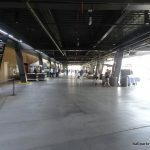 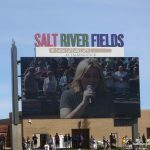 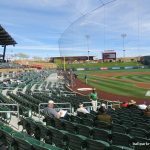 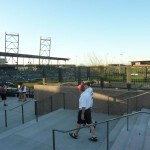 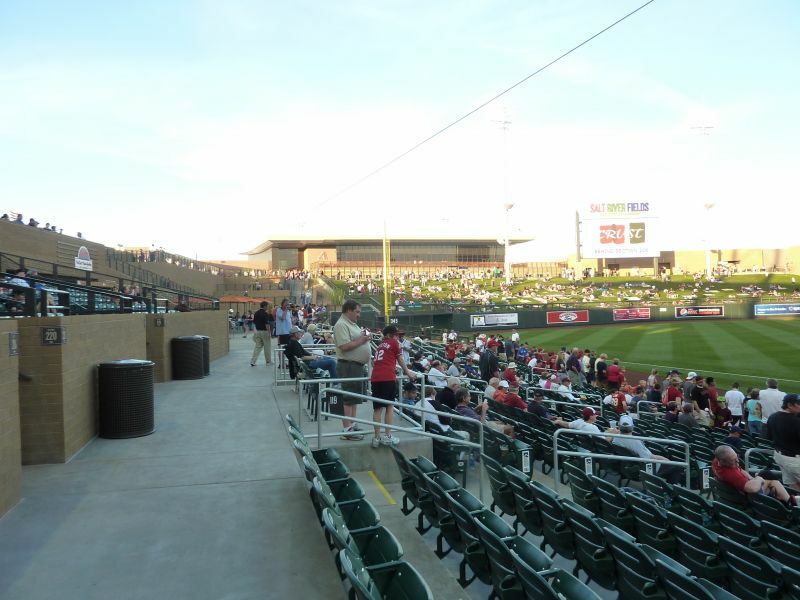 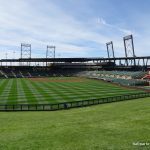 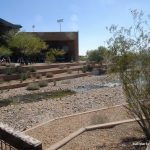 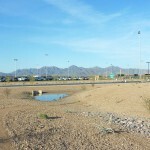 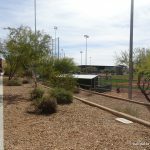 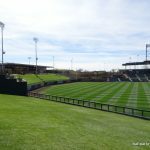 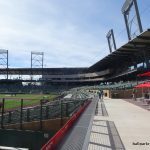 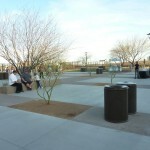 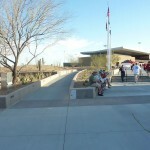 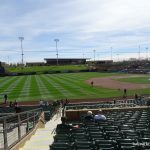 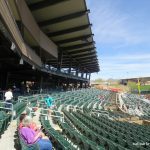 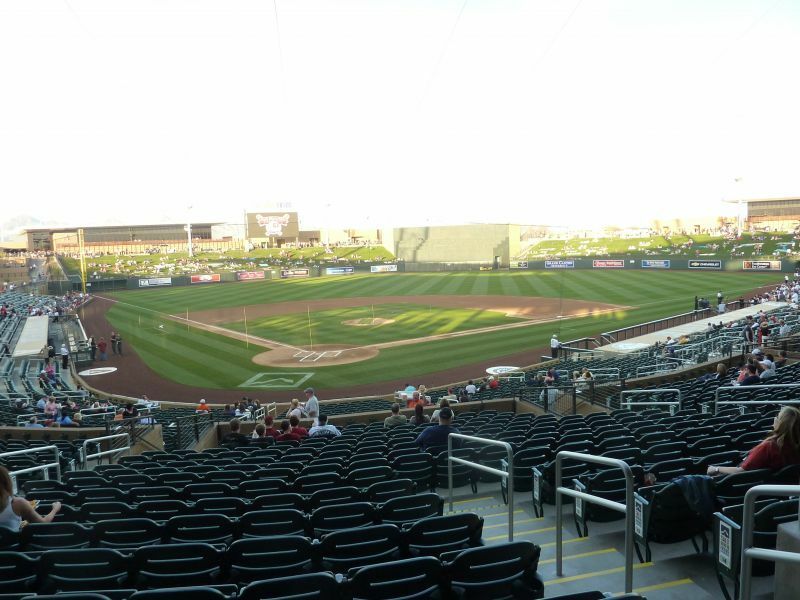 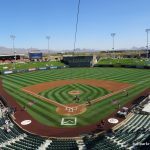 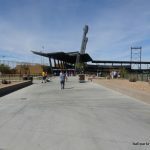 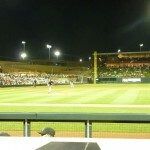 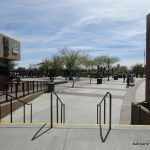 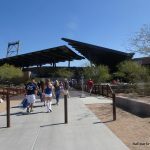 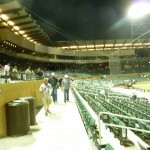 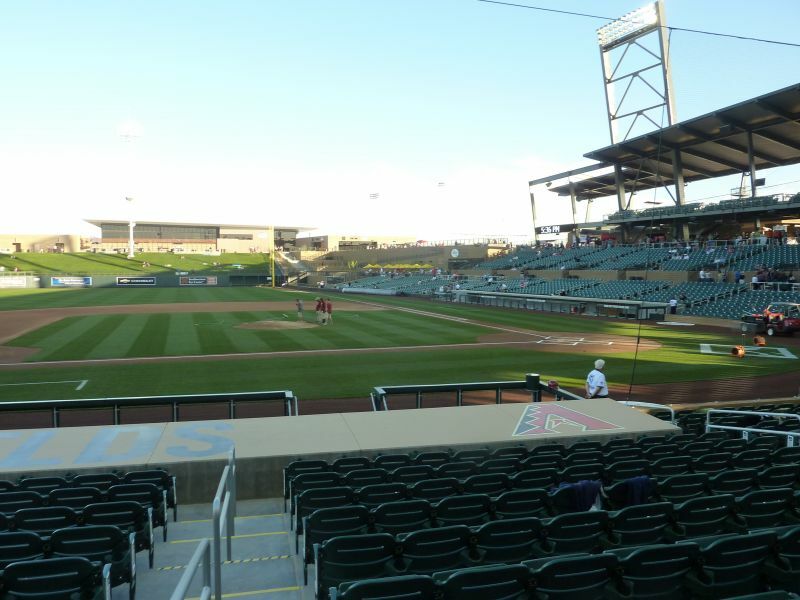 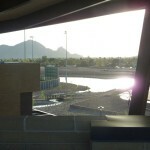 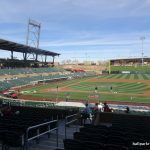 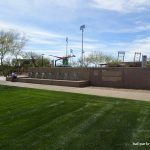 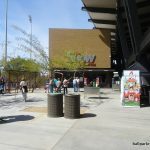 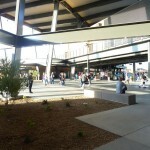 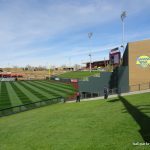 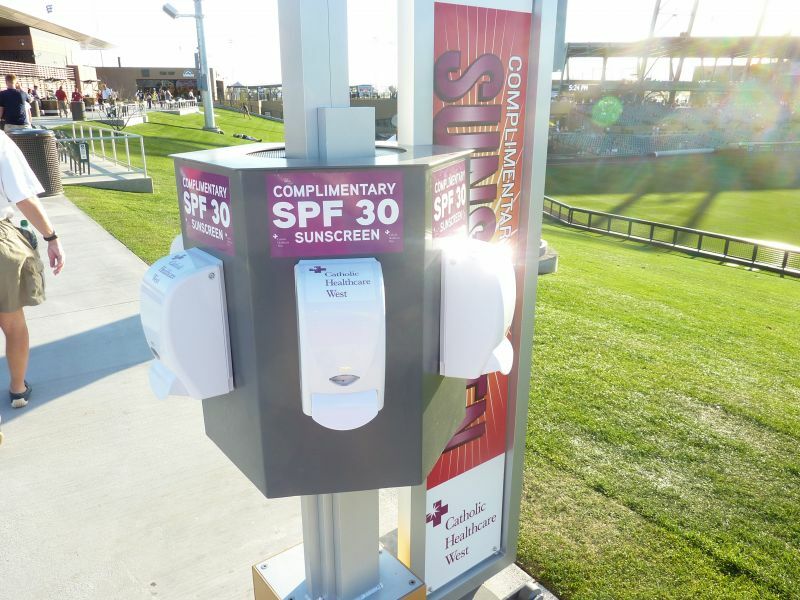 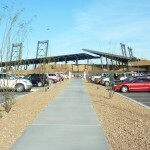 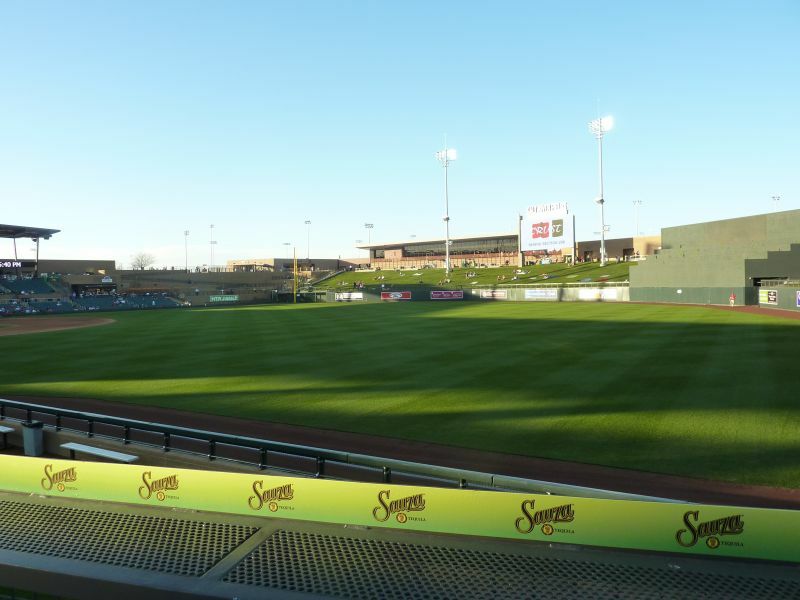 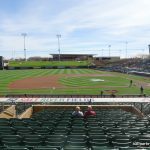 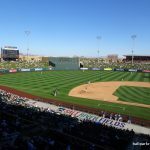 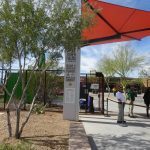 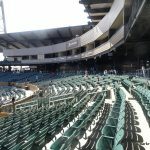 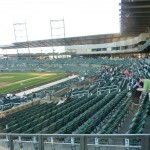 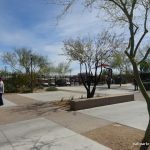 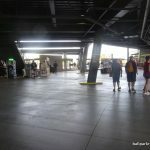 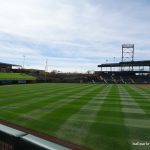 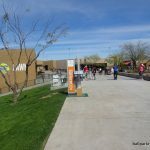 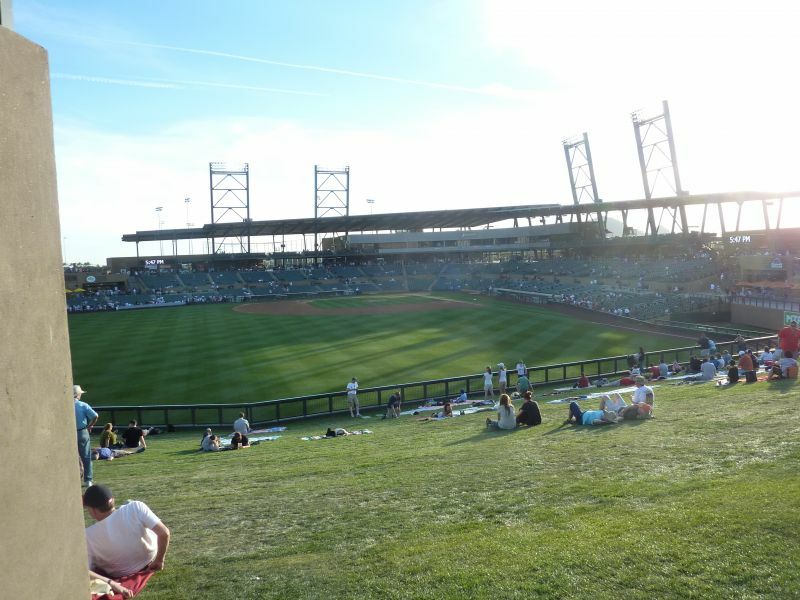 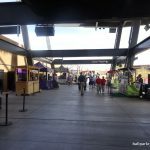 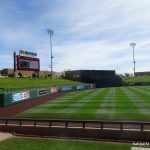 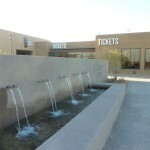 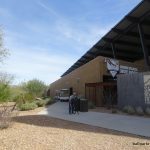 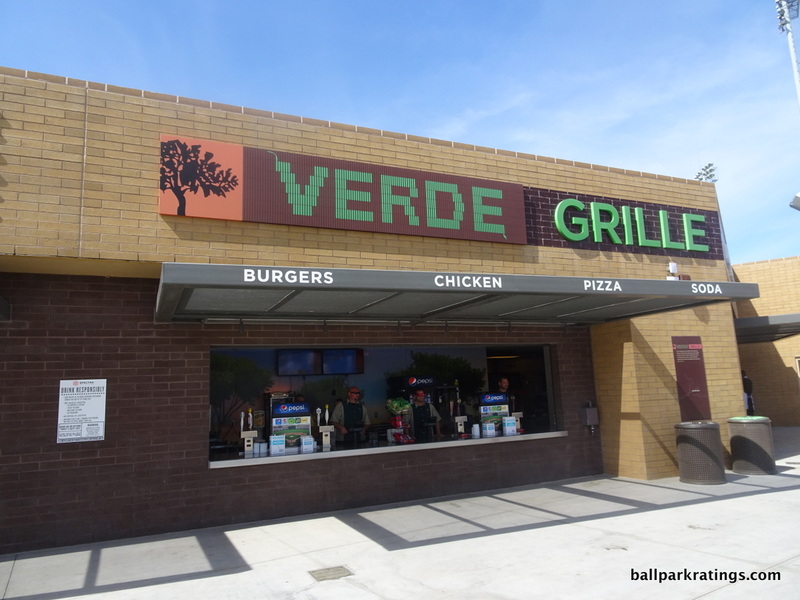 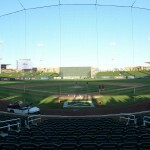 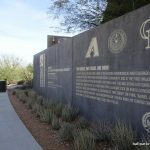 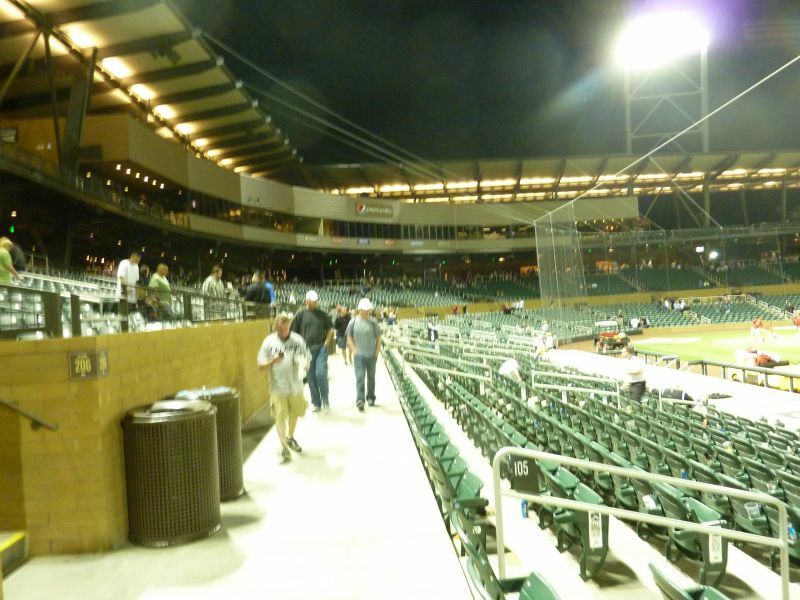 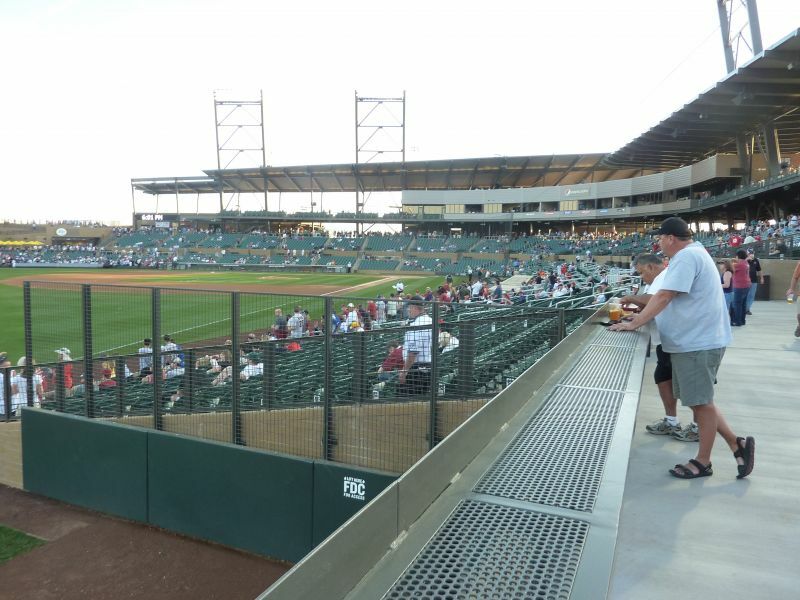 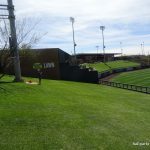 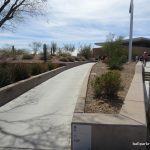 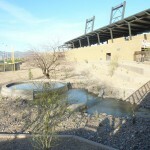 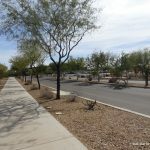 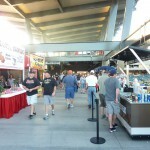 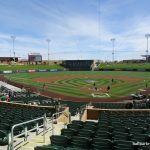 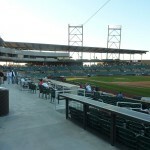 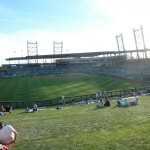 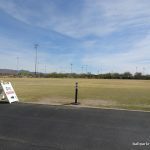 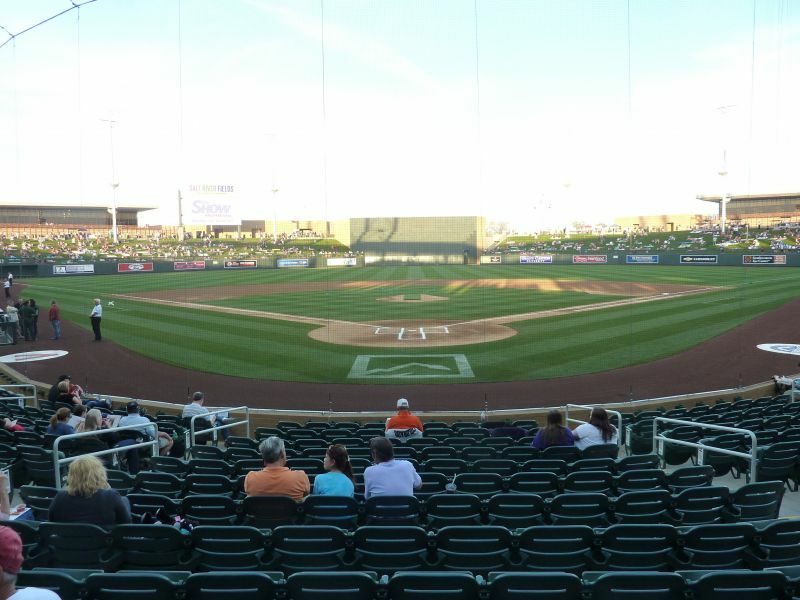 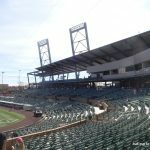 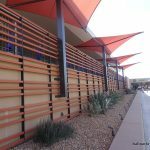 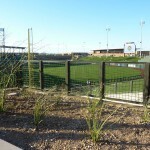 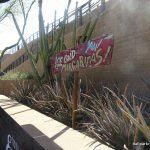 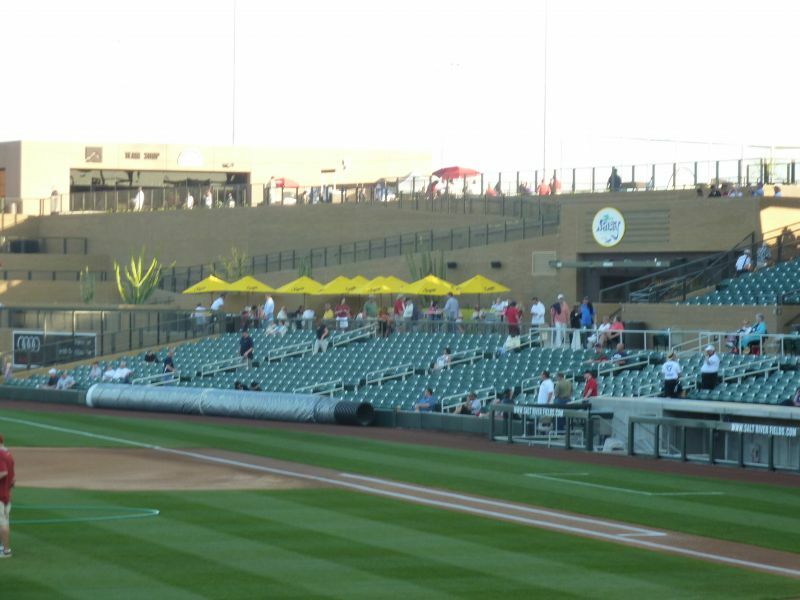 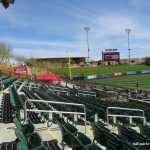 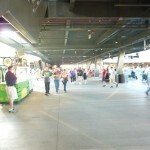 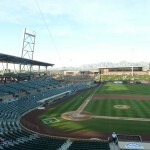 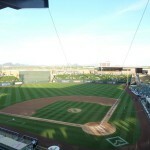 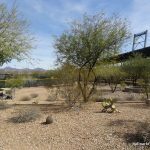 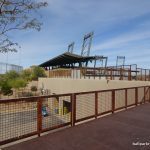 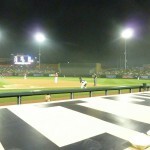 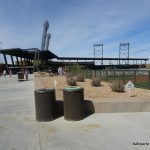 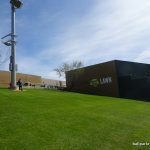 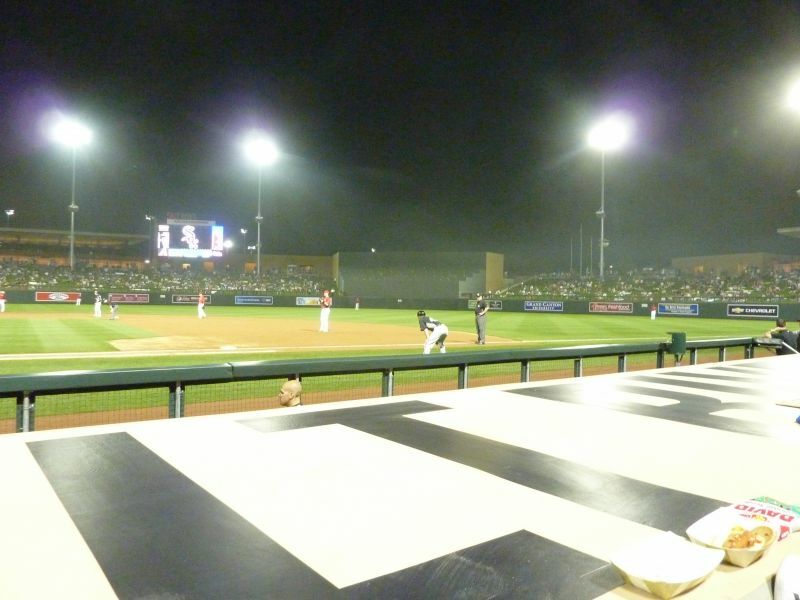 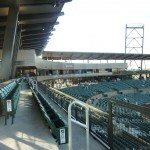 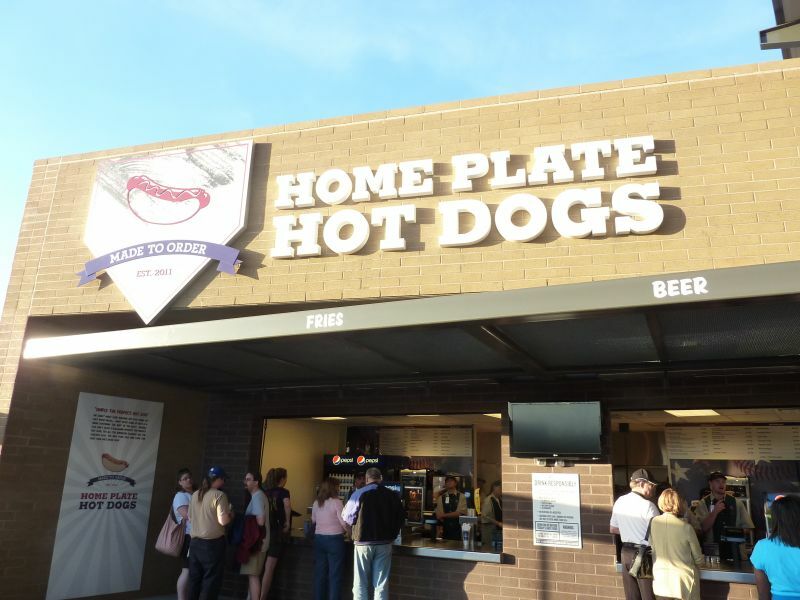 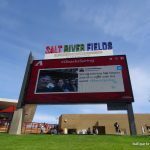 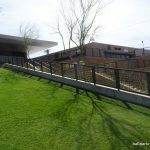 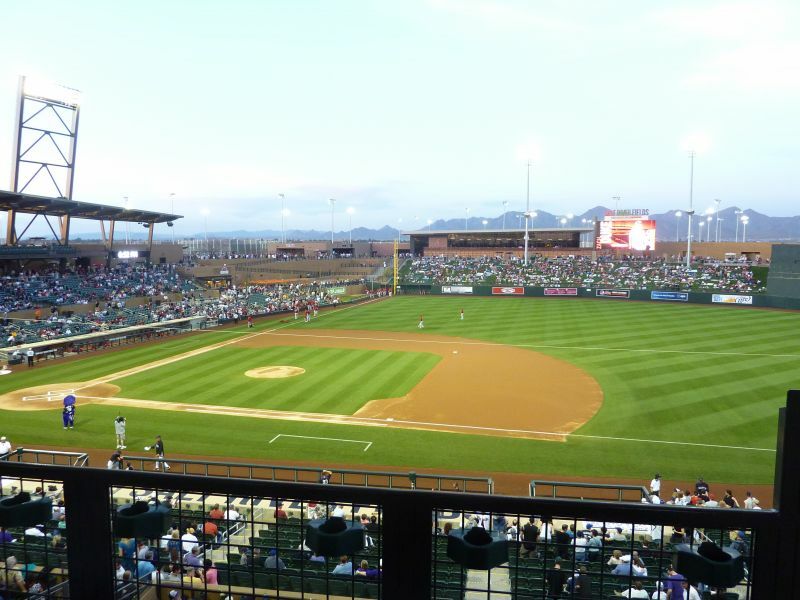 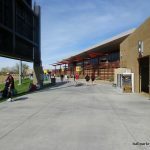 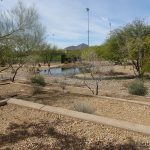 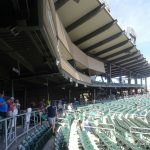 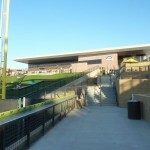 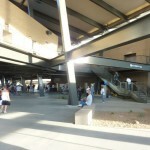 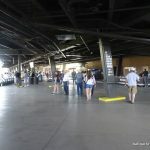 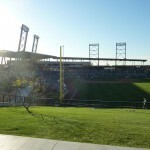 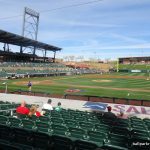 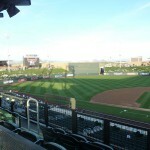 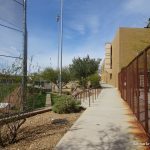 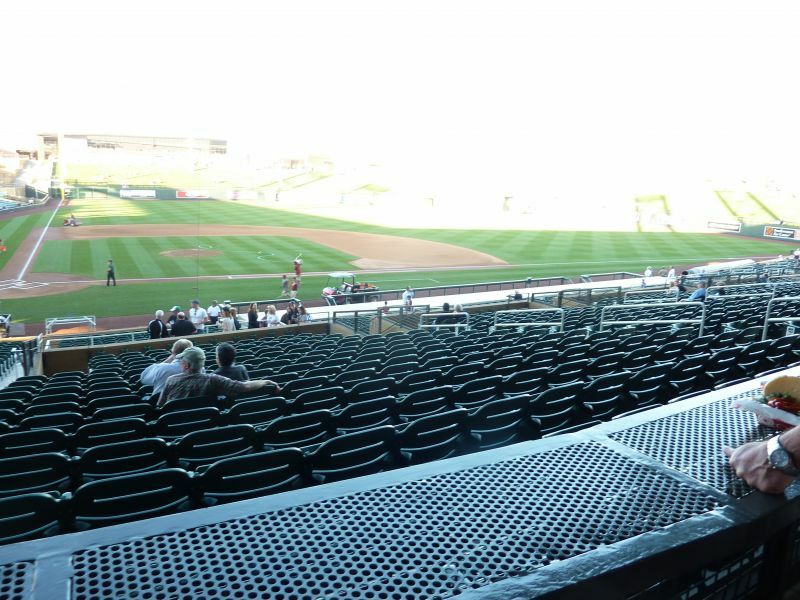 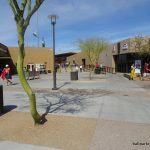 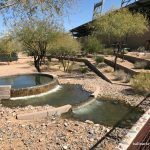 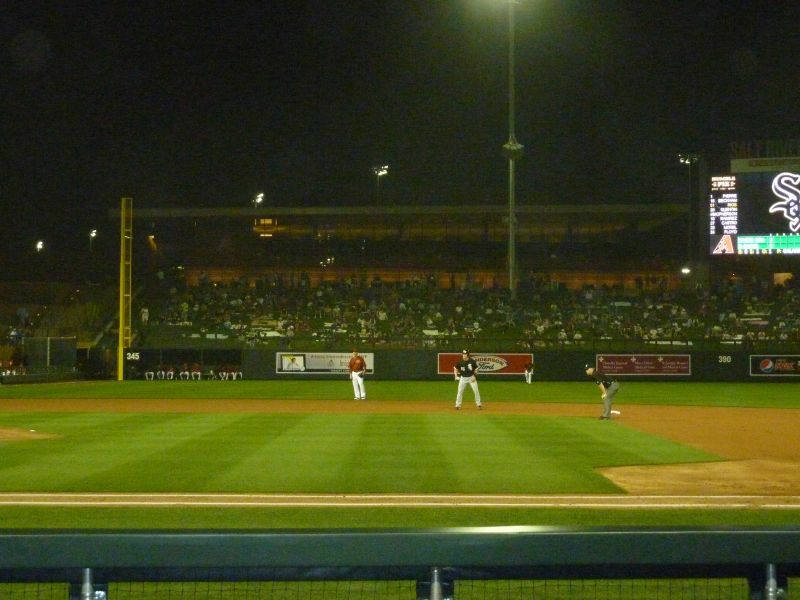 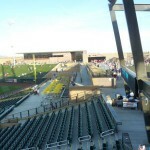 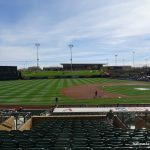 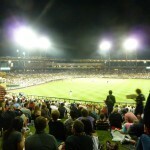 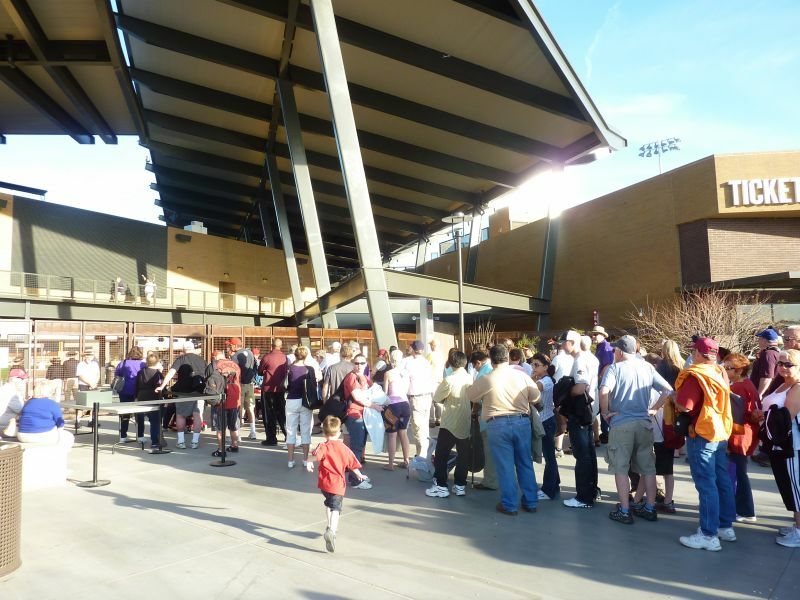 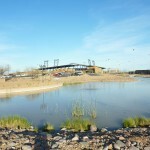 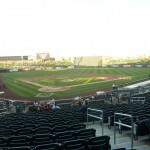 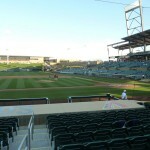 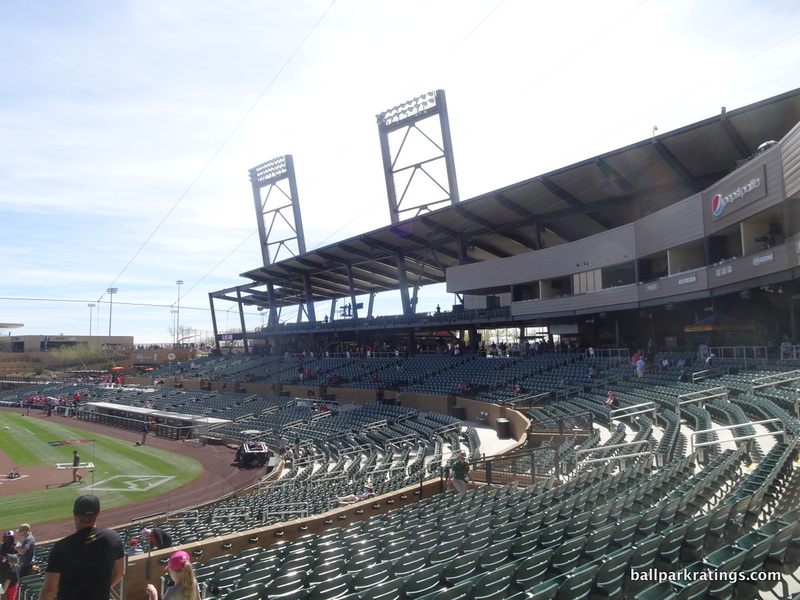 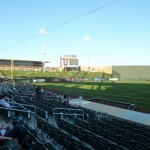 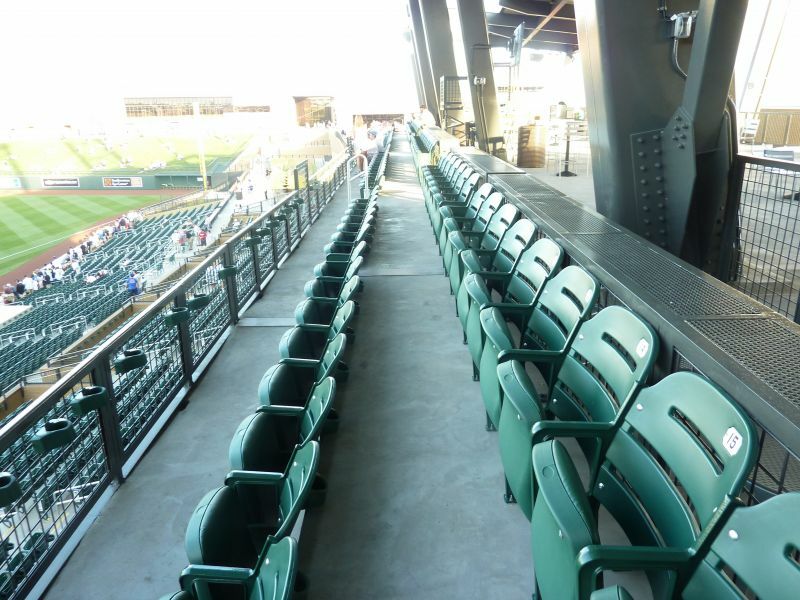 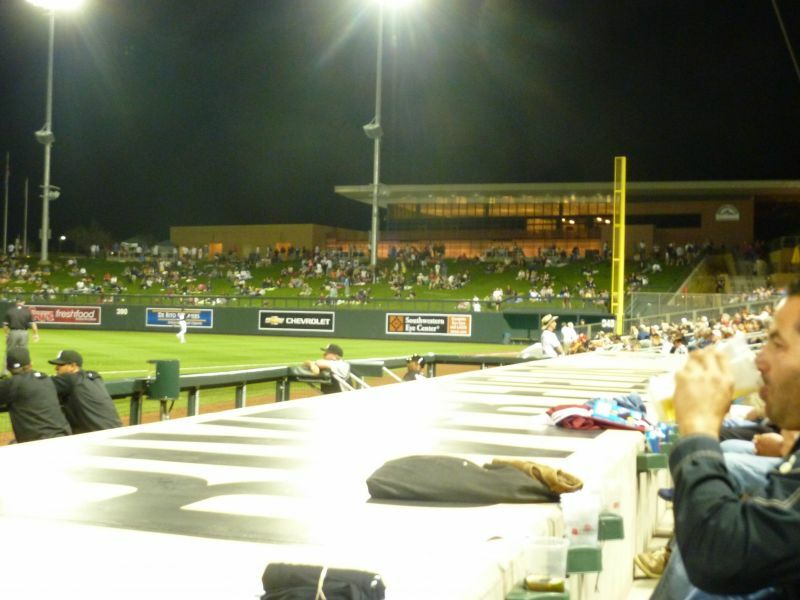 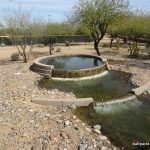 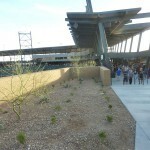 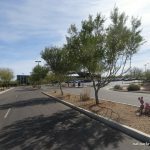 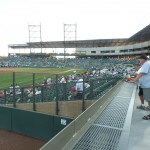 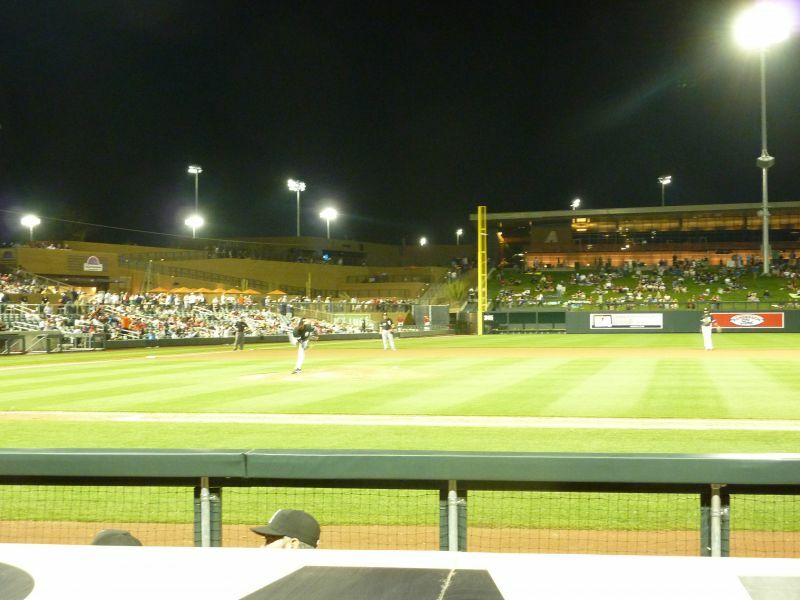 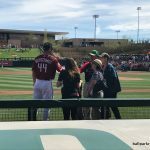 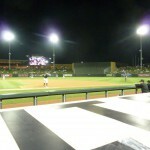 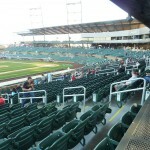 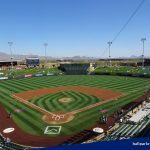 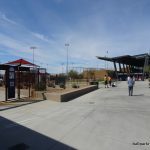 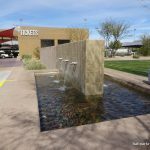 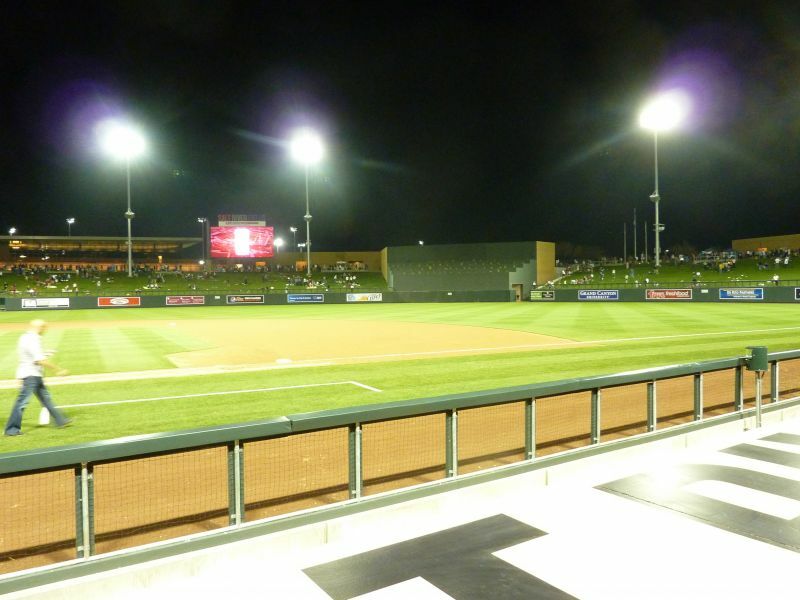 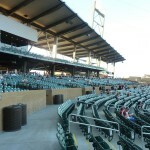 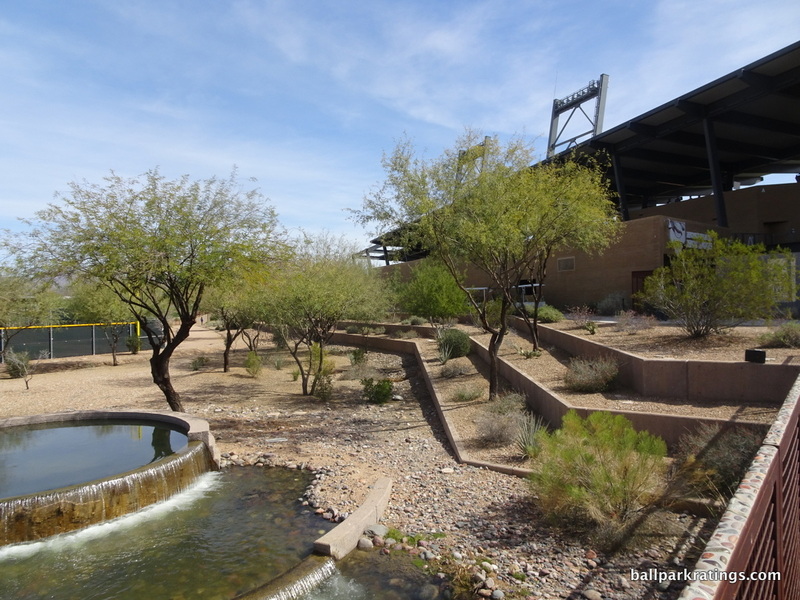 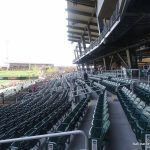 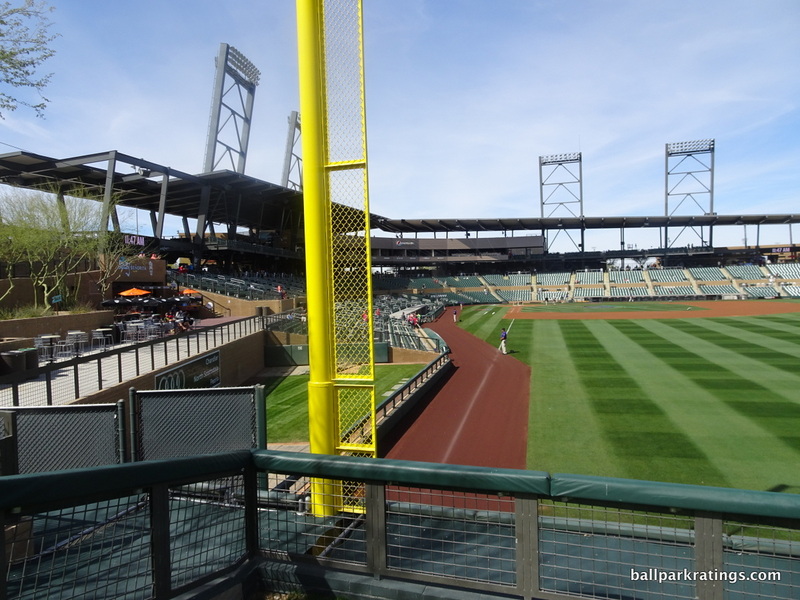 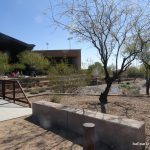 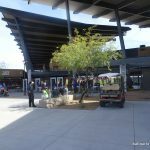 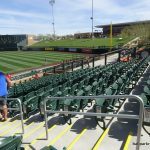 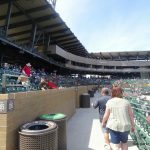 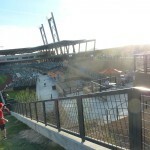 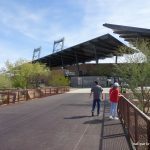 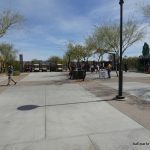 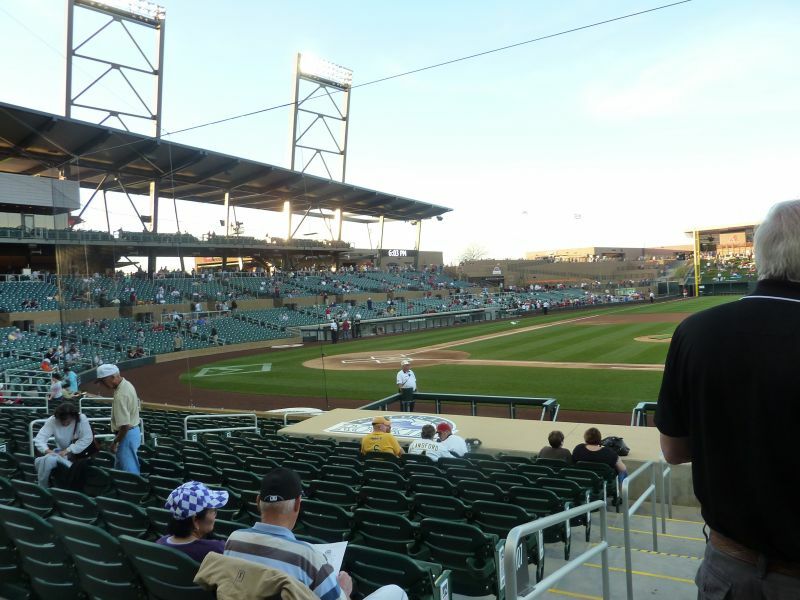 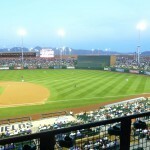 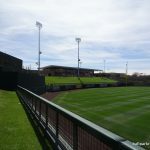 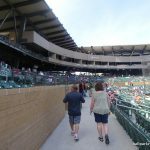 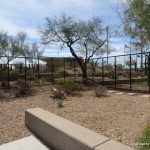 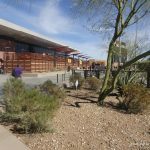 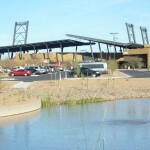 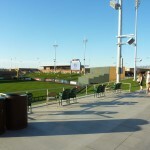 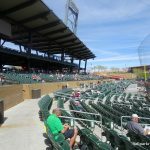 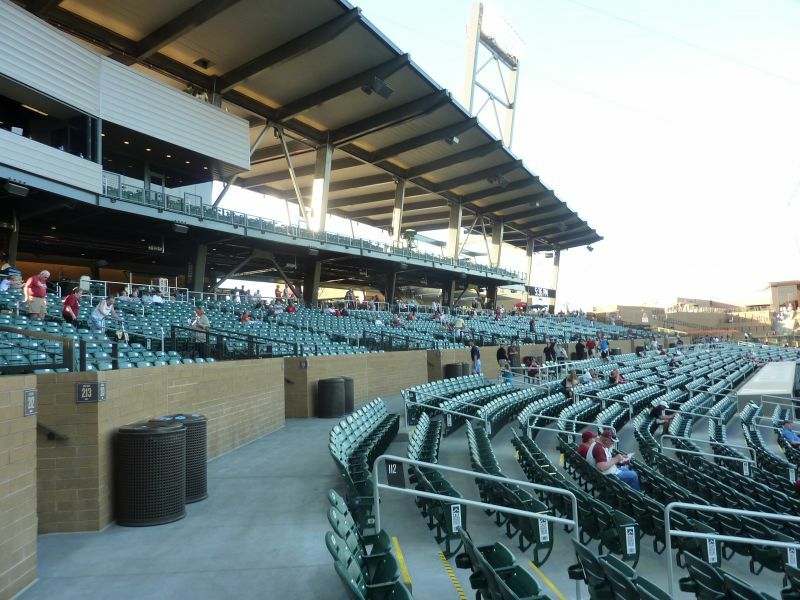 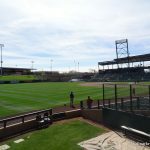 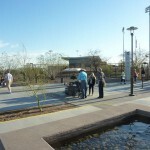 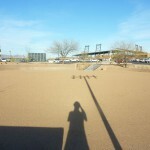 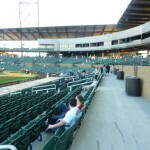 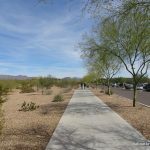 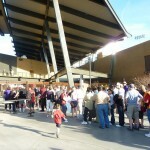 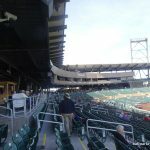 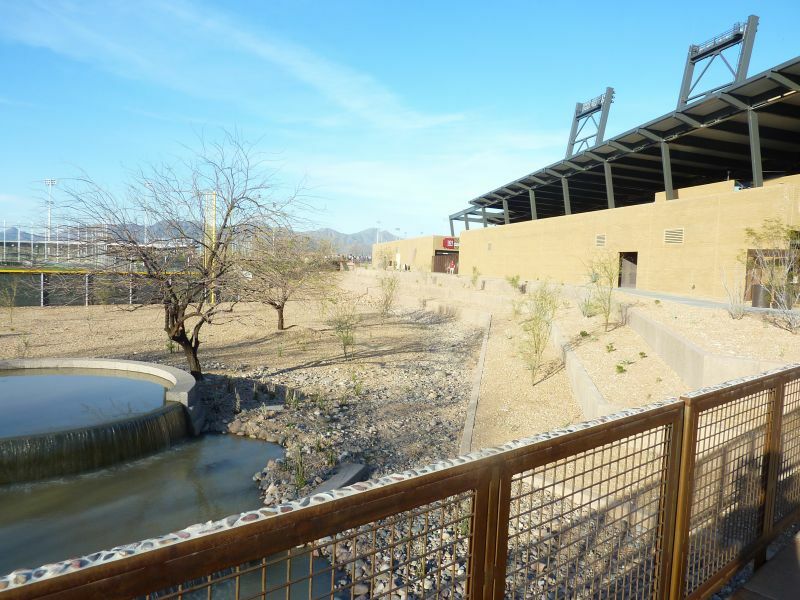 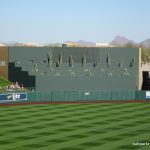 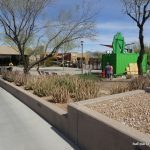 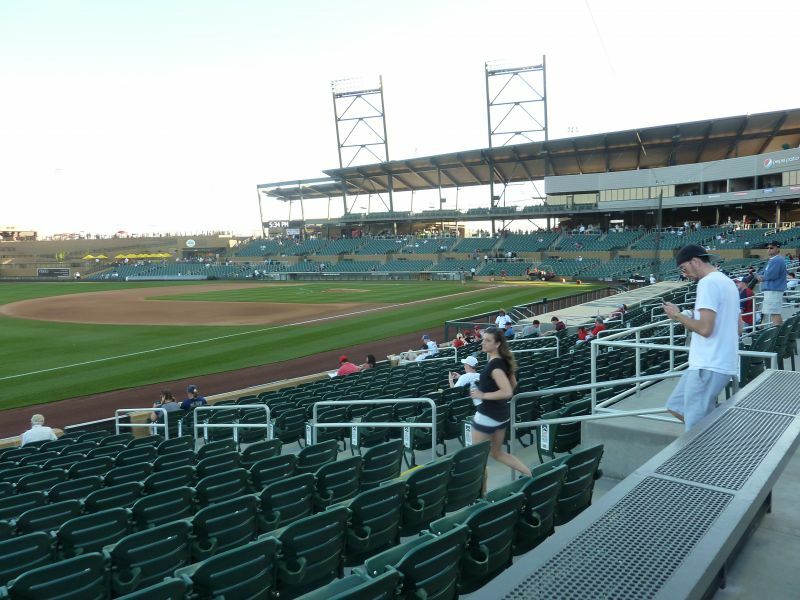 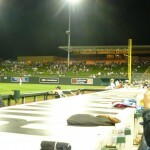 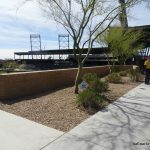 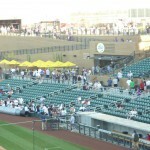 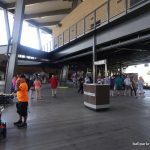 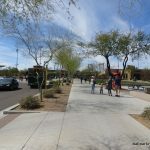 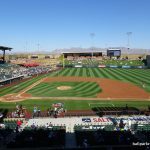 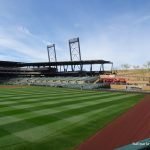 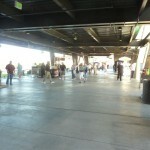 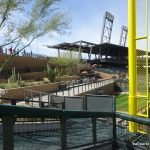 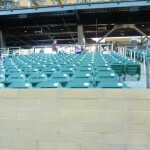 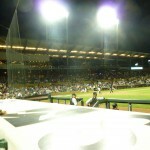 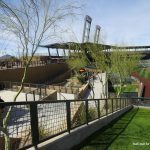 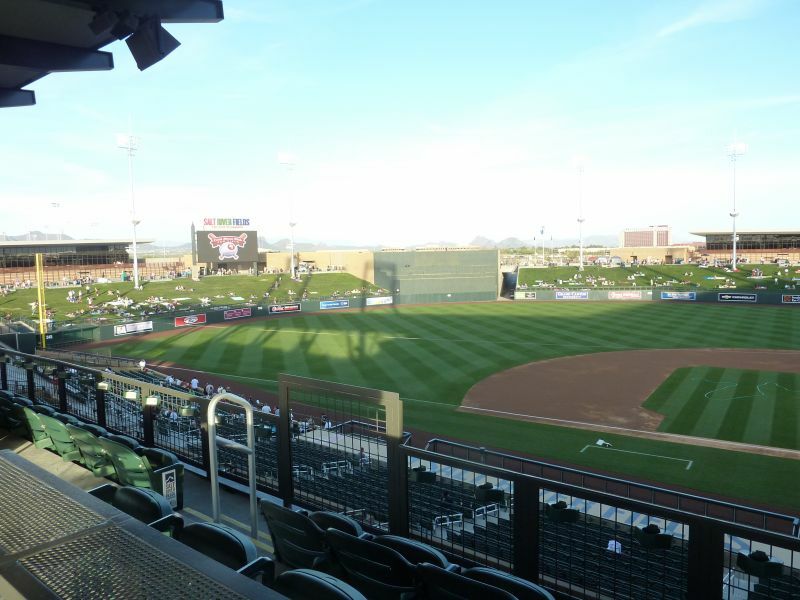 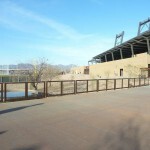 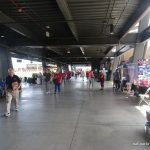 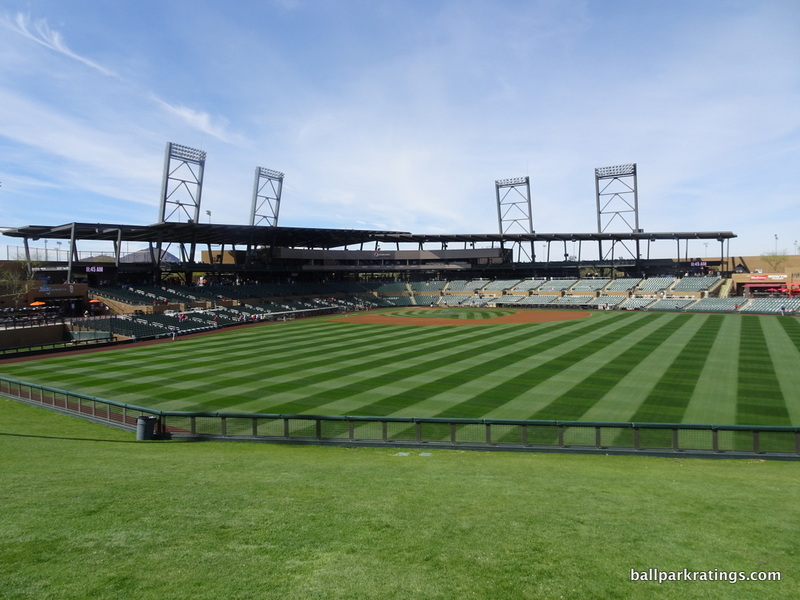 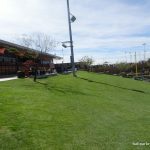 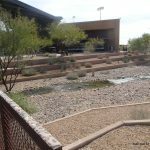 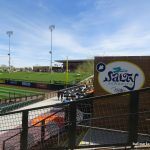 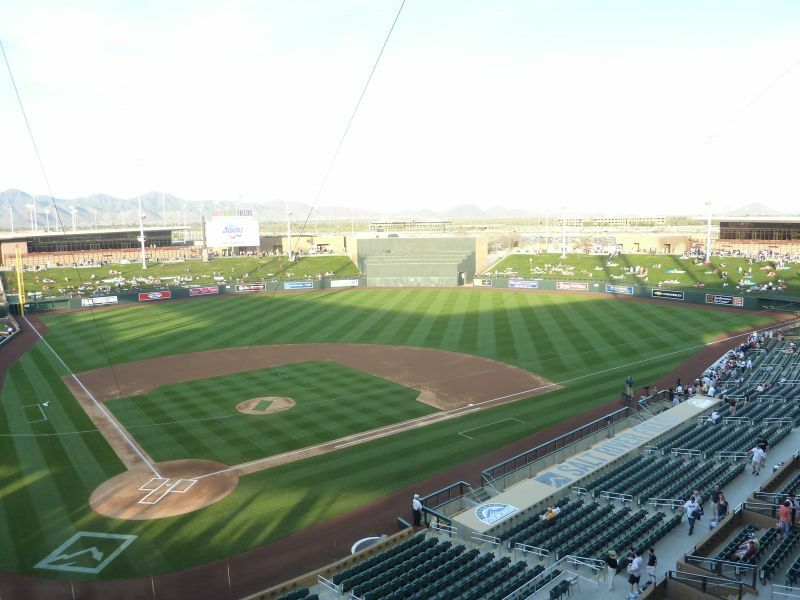 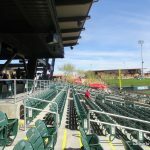 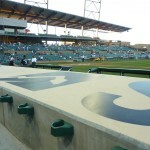 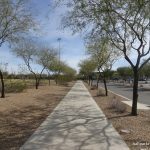 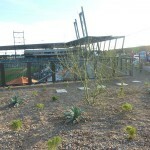 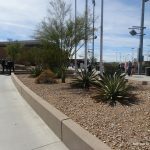 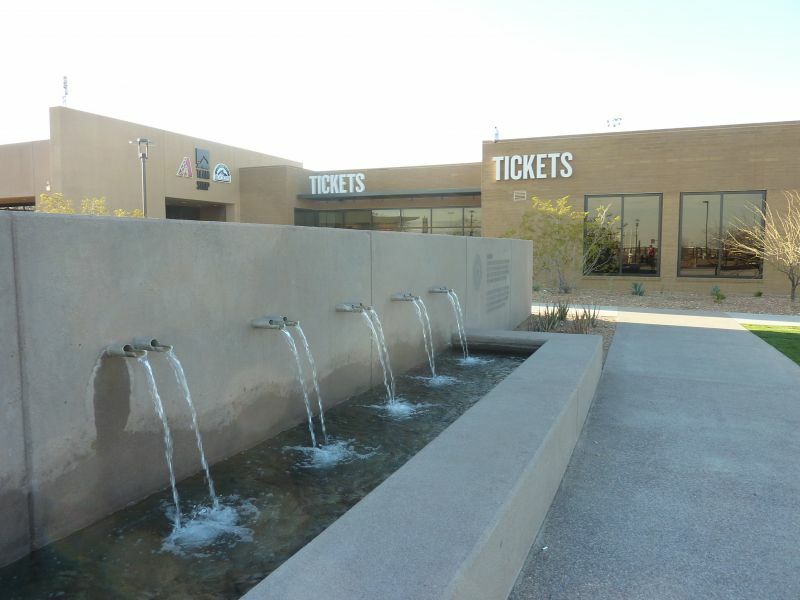 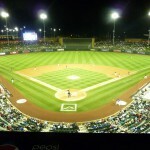 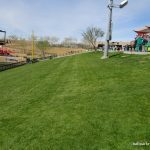 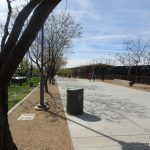 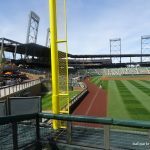 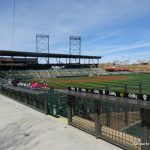 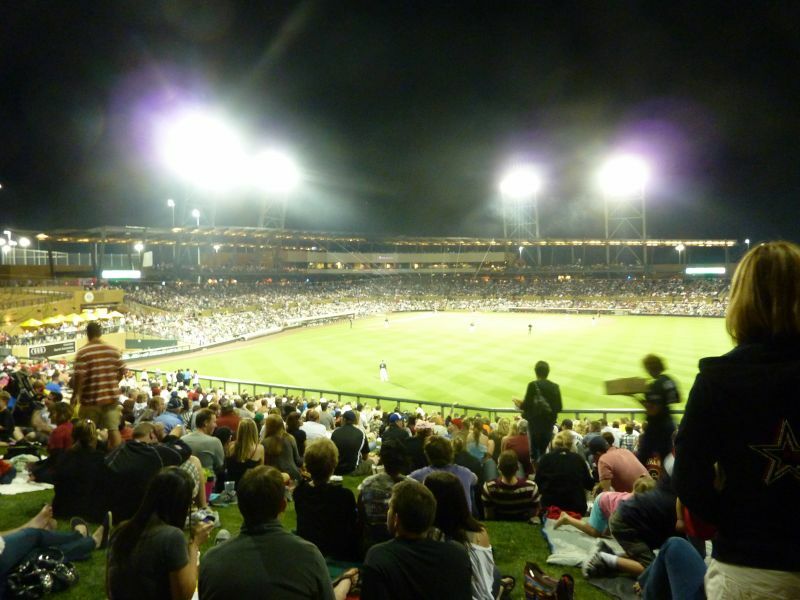 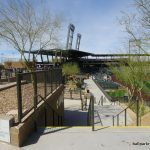 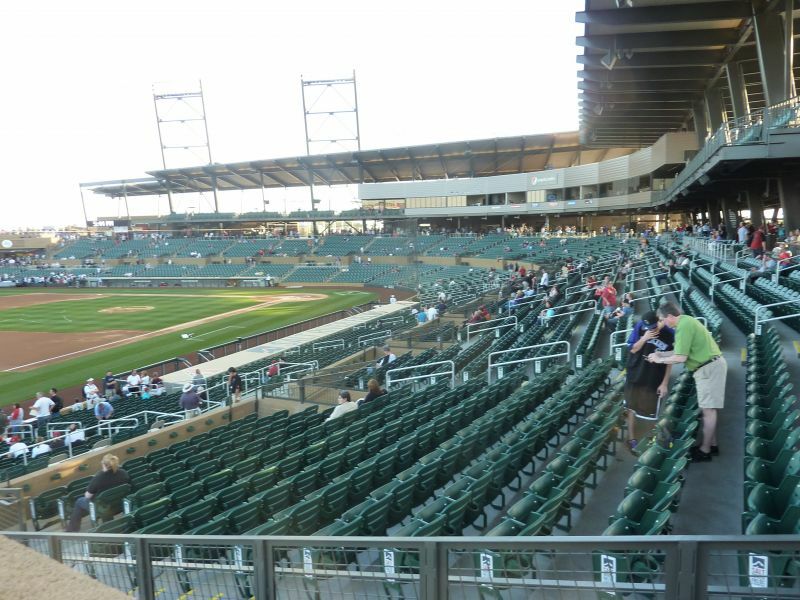 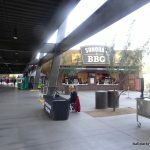 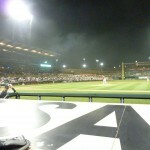 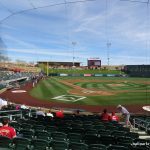 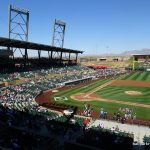 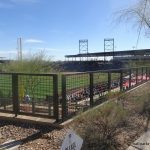 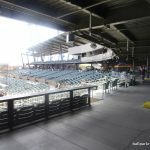 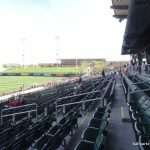 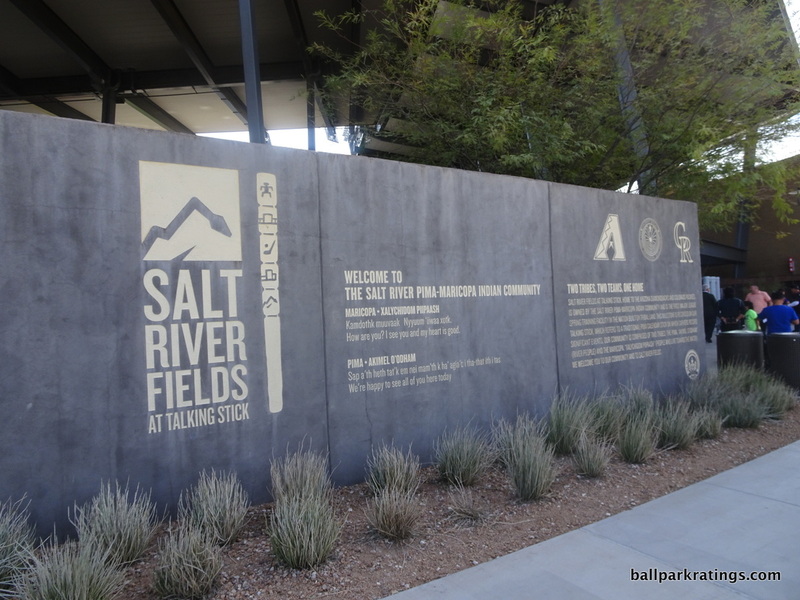 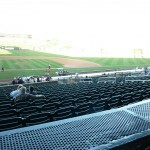 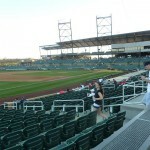 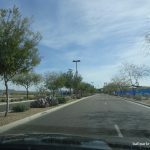 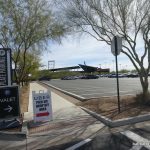 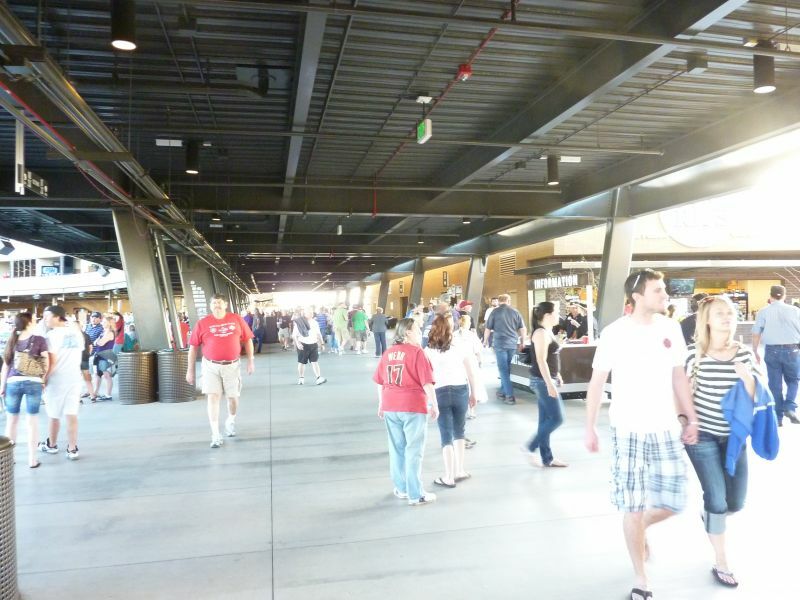 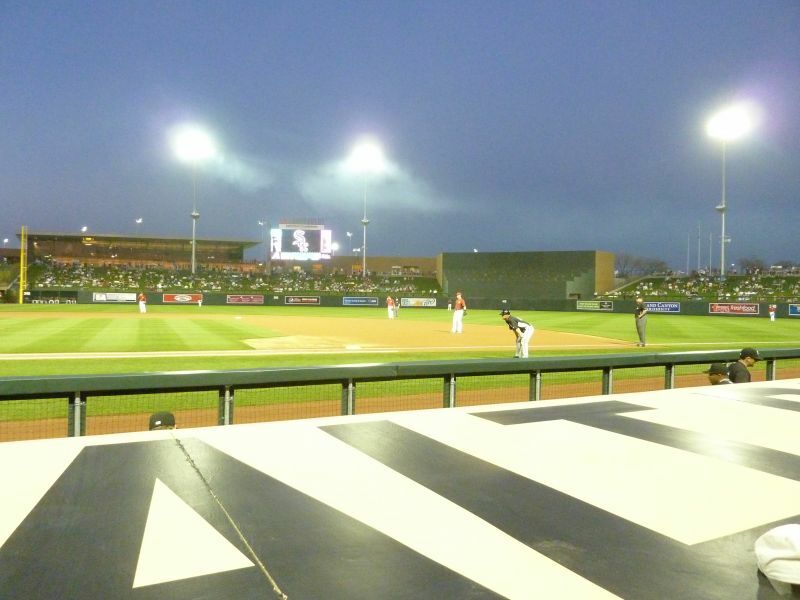 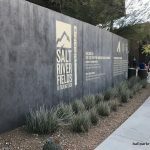 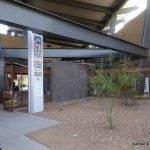 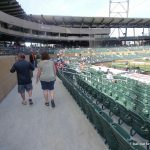 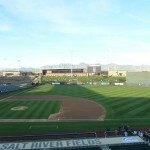 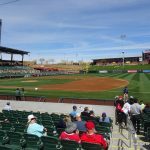 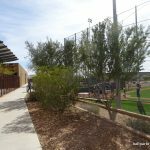 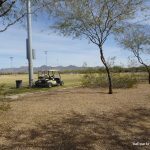 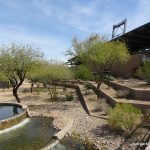 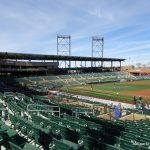 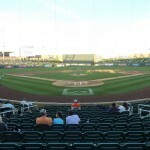 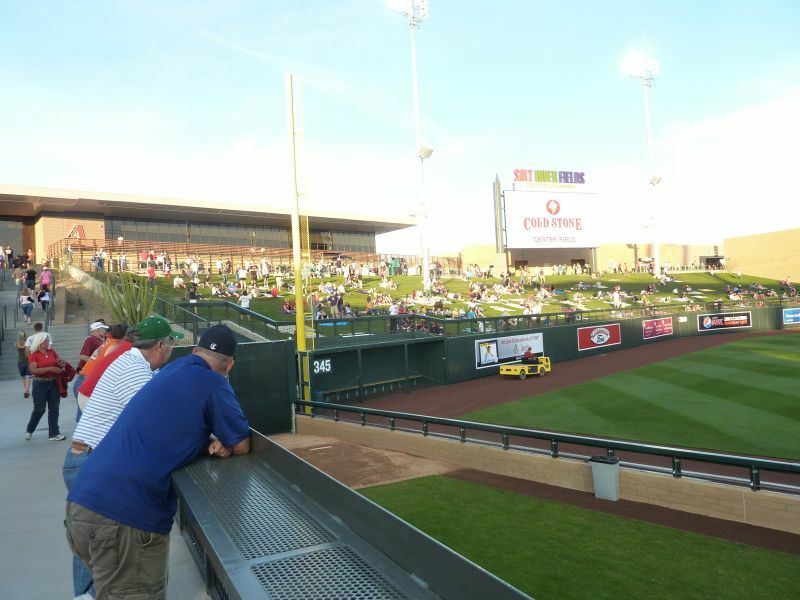 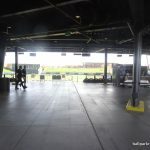 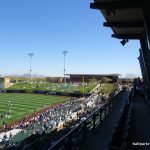 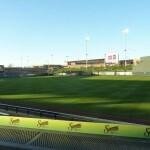 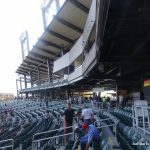 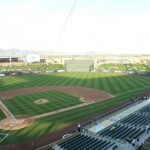 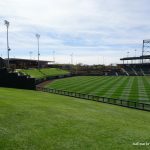 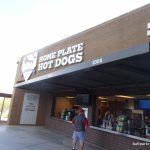 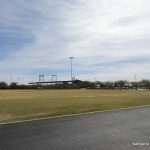 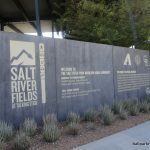 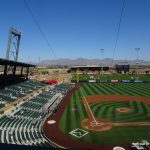 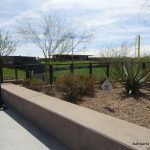 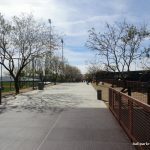 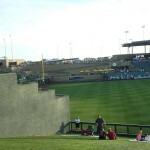 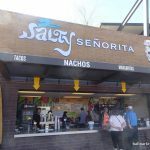 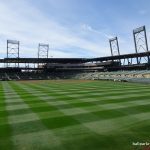 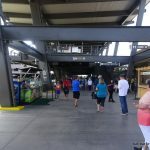 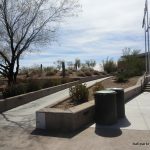 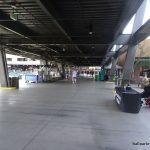 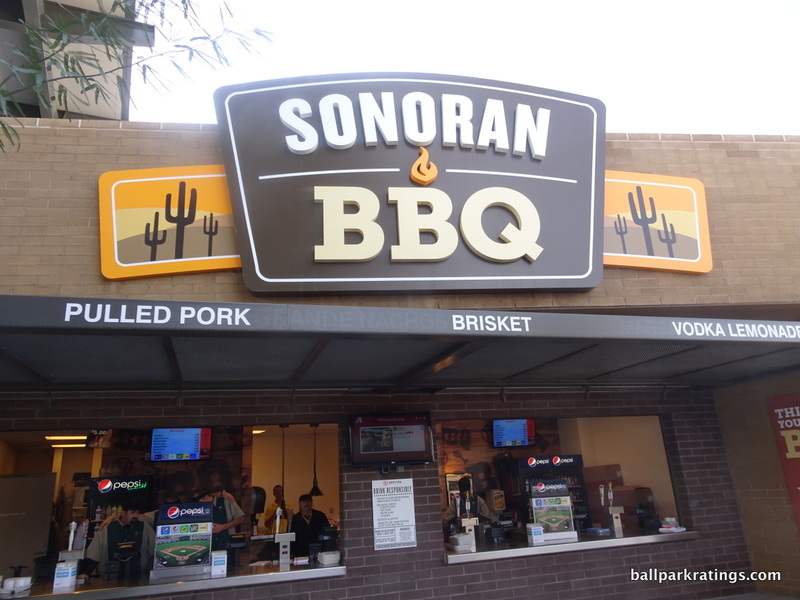 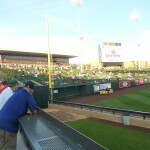 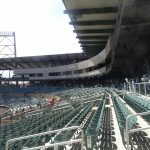 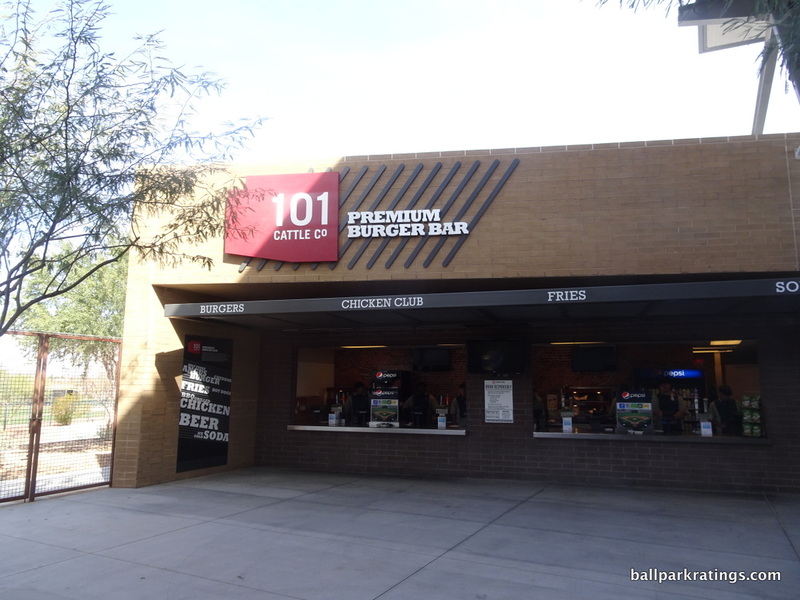 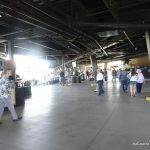 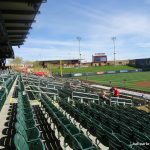 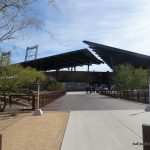 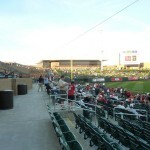 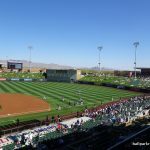 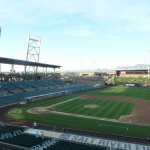 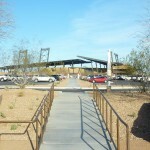 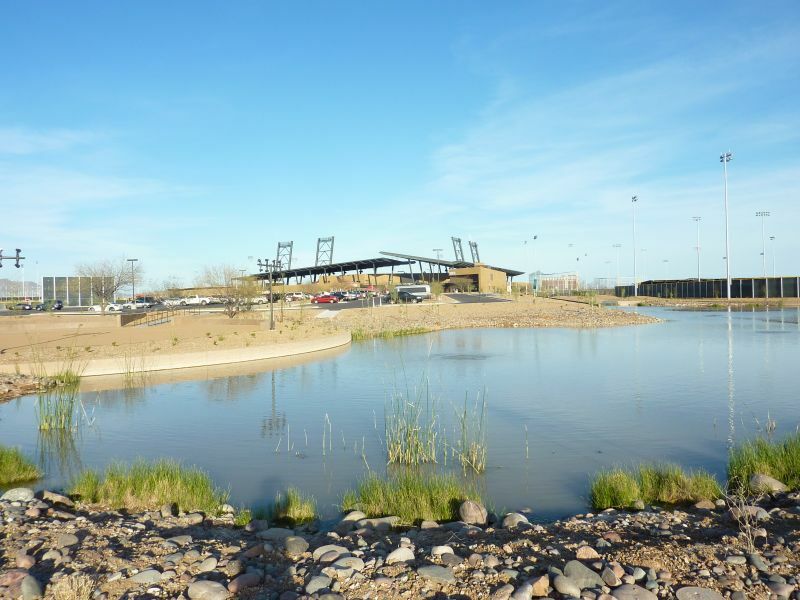 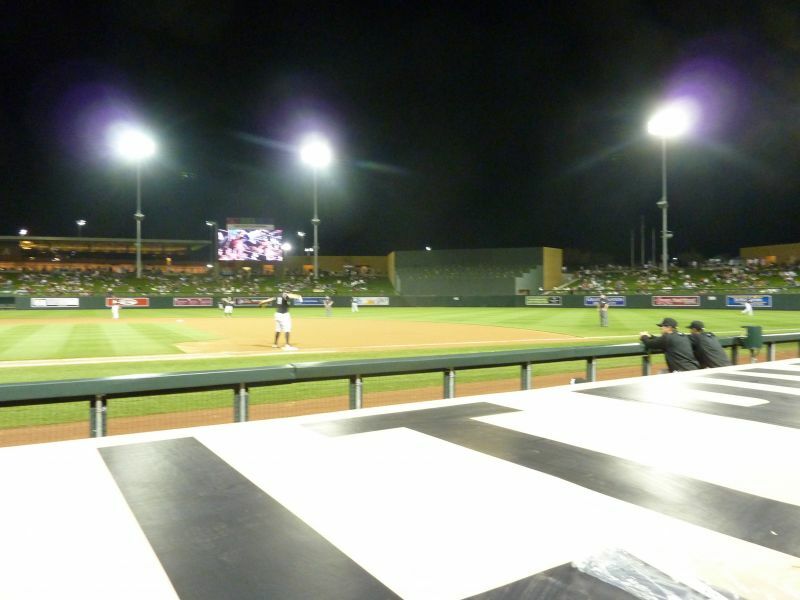 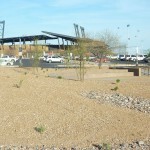 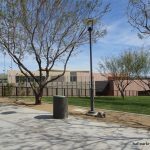 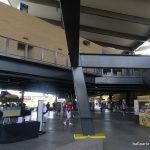 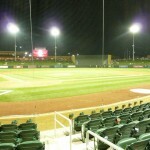 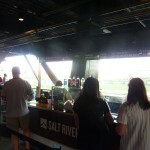 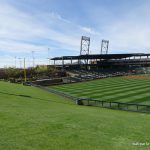 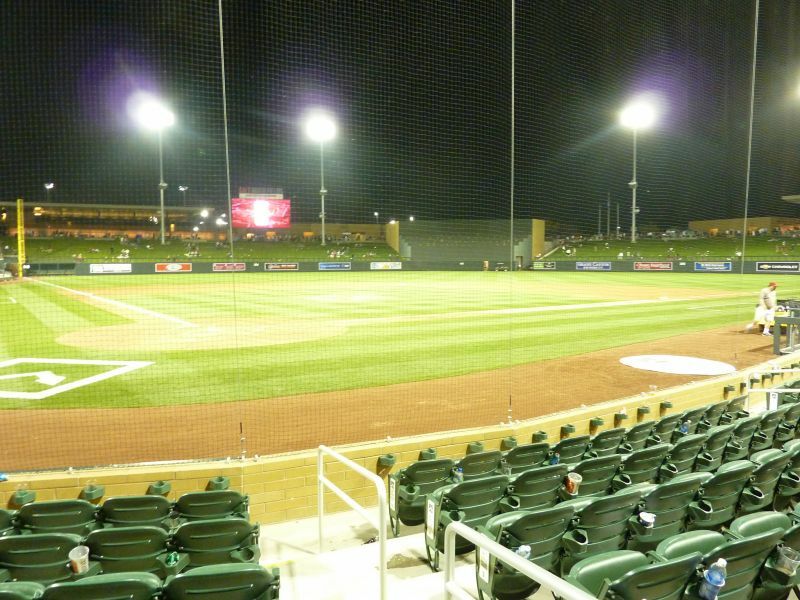 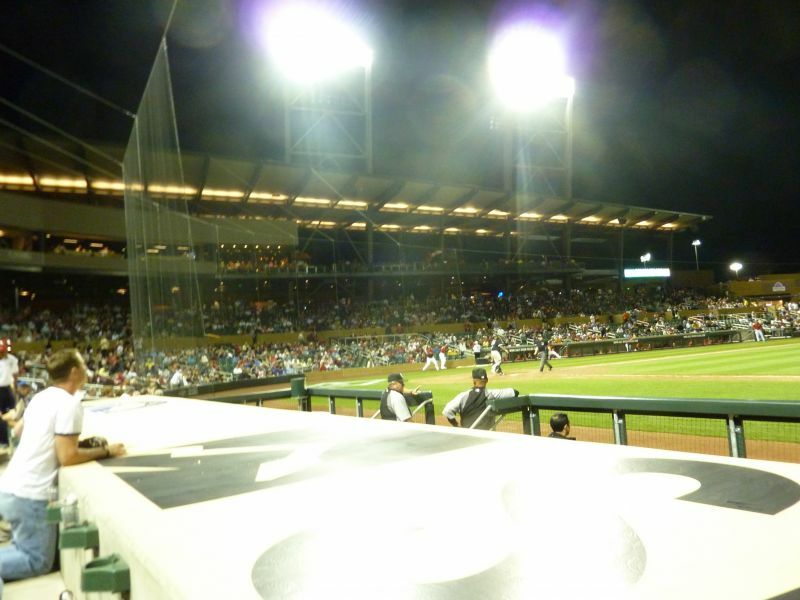 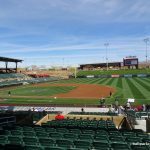 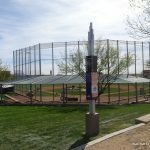 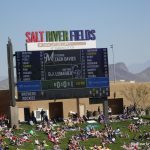 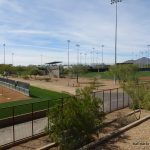 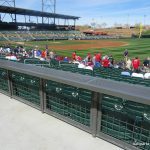 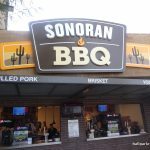 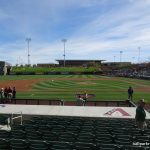 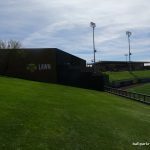 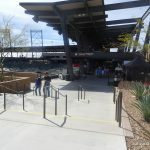 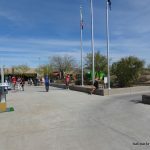 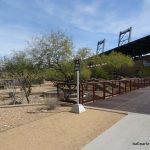 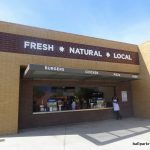 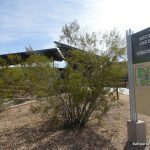 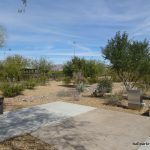 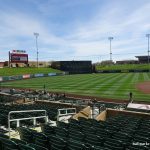 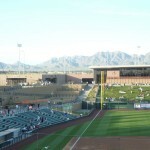 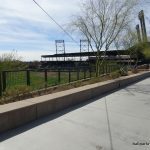 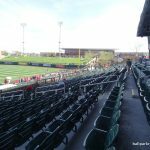 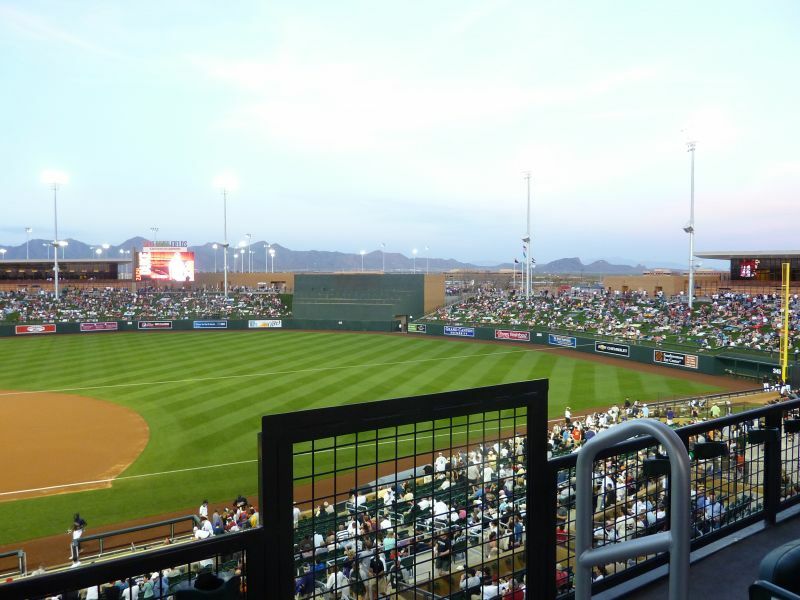 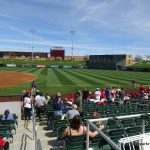 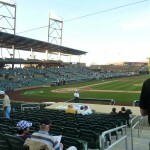 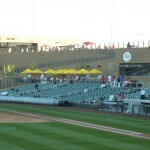 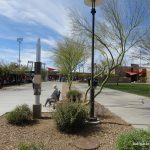 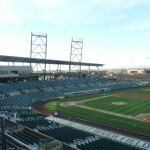 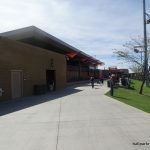 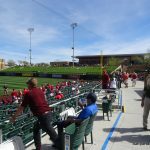 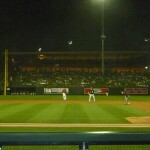 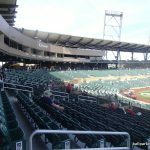 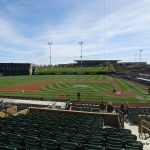 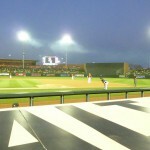 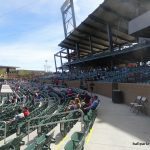 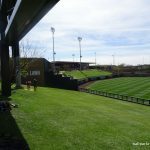 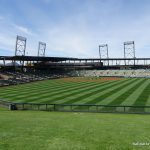 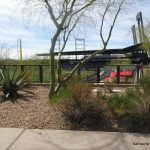 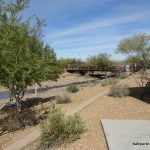 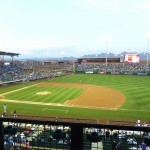 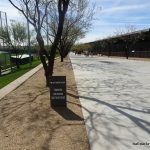 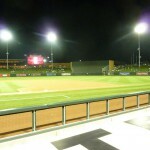 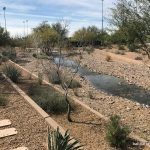 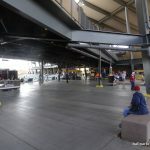 Despite not having the wonderfully unique aesthetics of Camelback Ranch, Salt River Fields is attractive enough, while completely blowing every other ballpark ever built out of the water in terms of innovative design ideas. 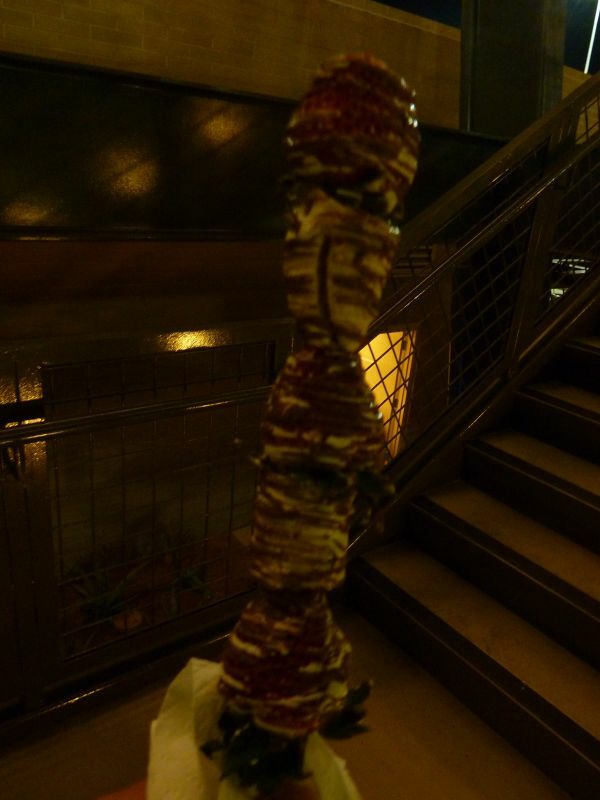 While there are many to name, two stick out in my mind. 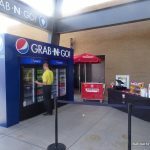 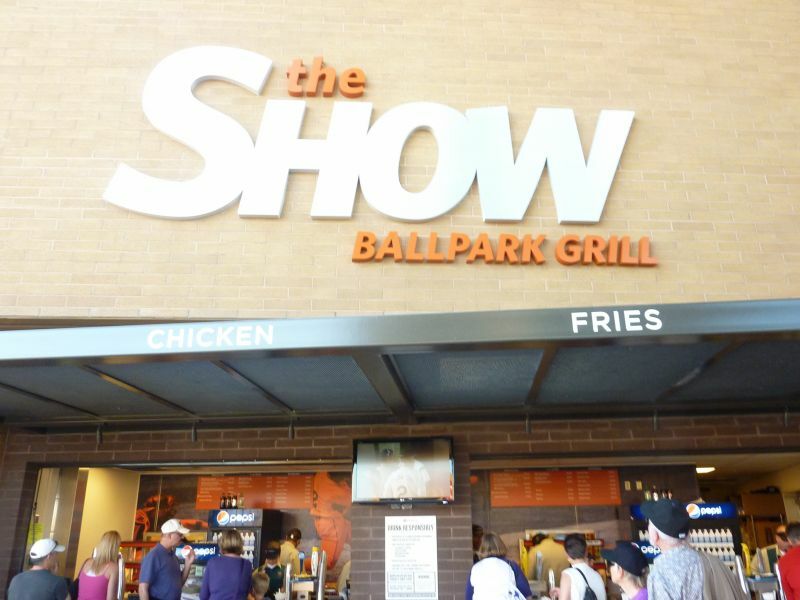 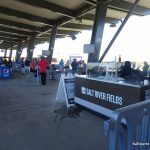 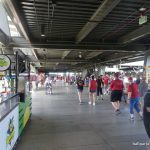 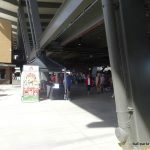 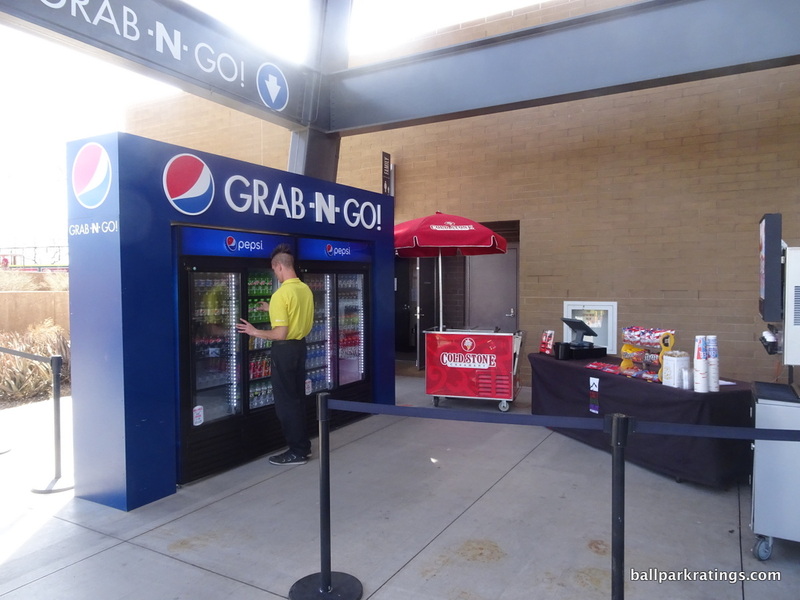 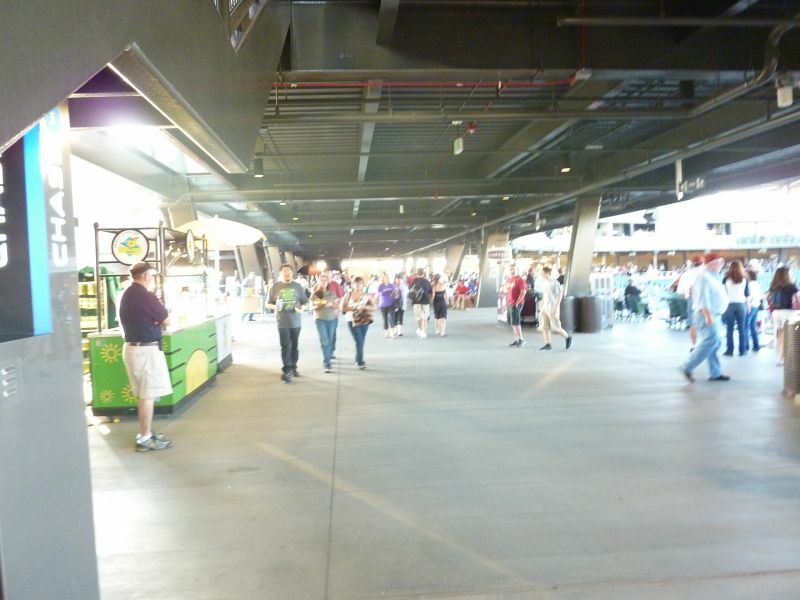 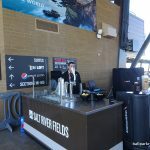 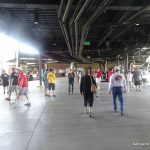 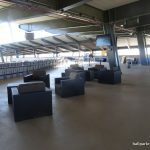 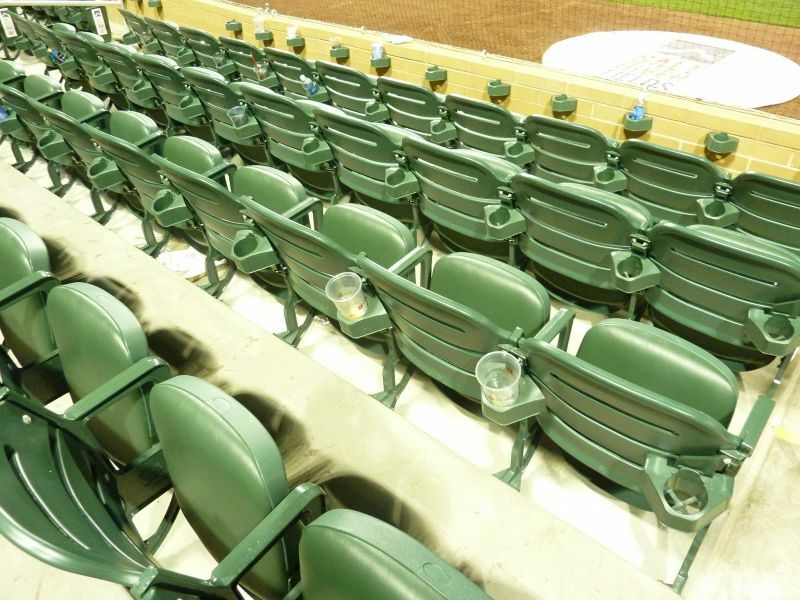 First of all, the idea of integrating concession stands with tables and chairs down the left and right field lines in the cross aisle is simply brilliant. 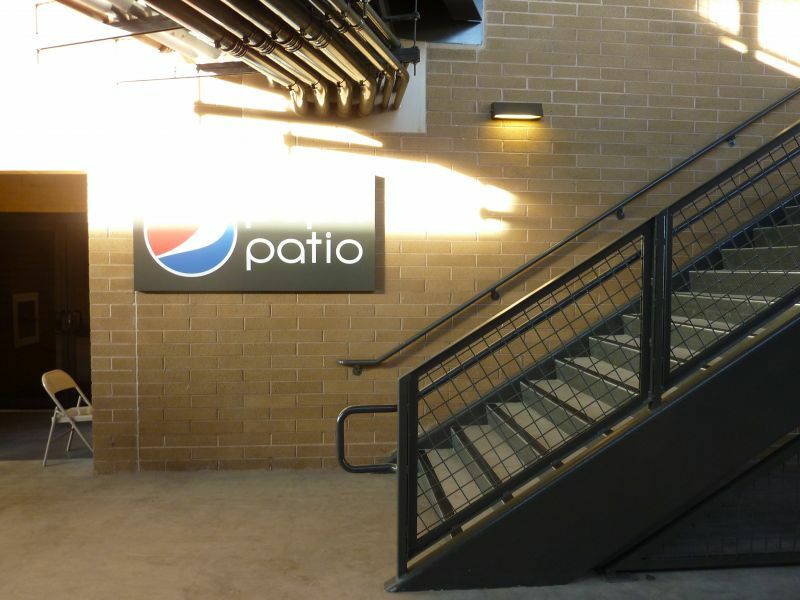 It’s an excellent use of space. 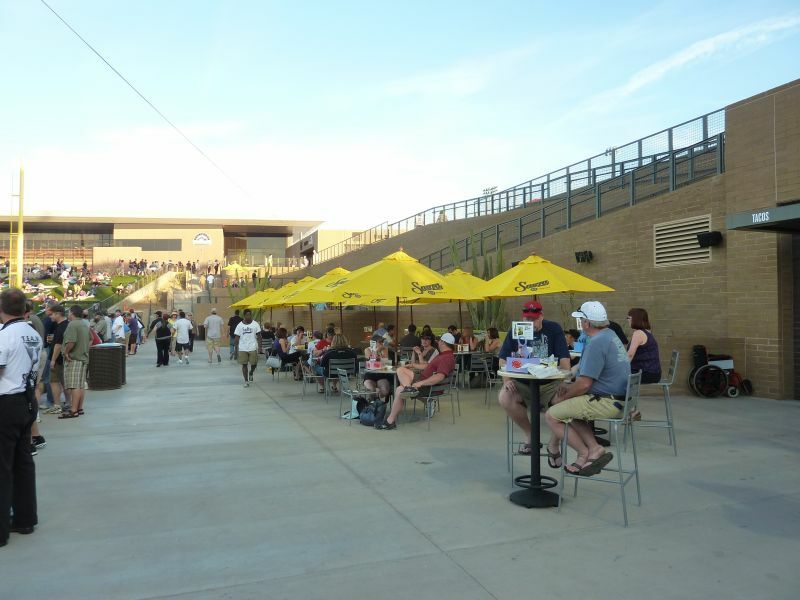 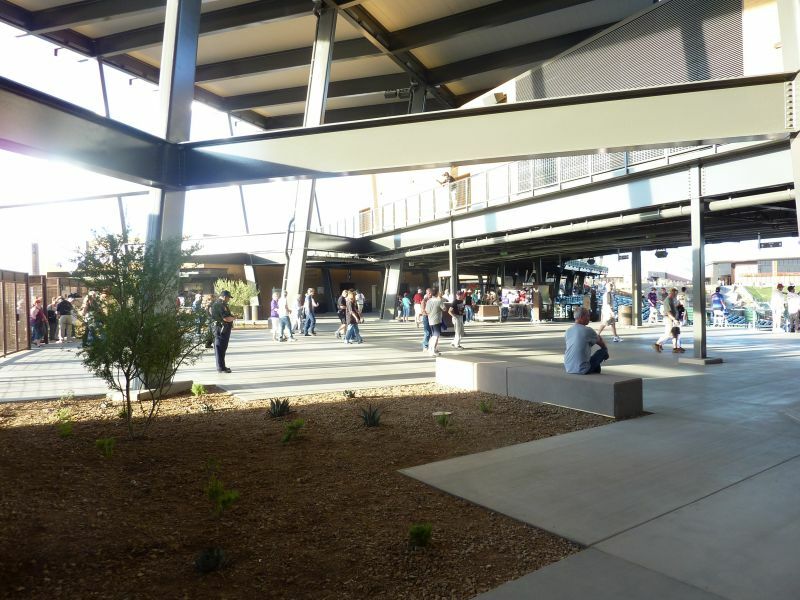 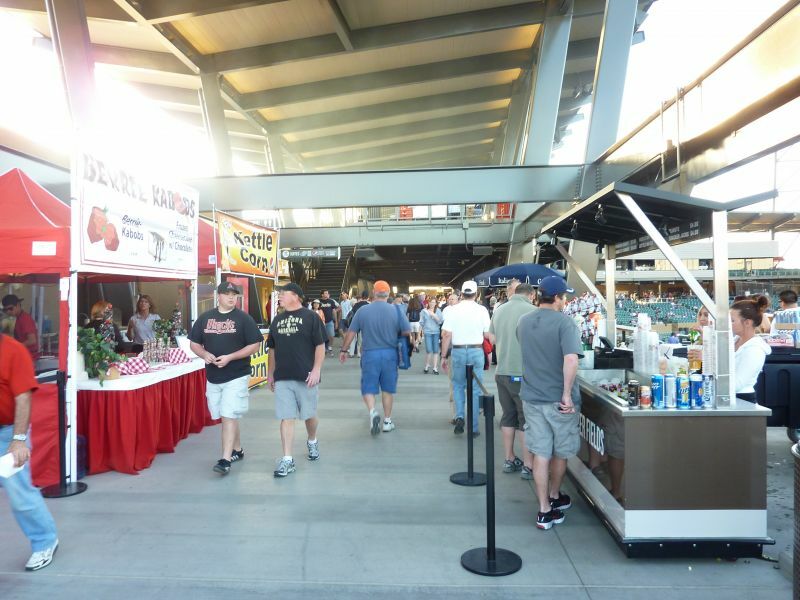 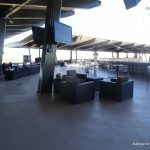 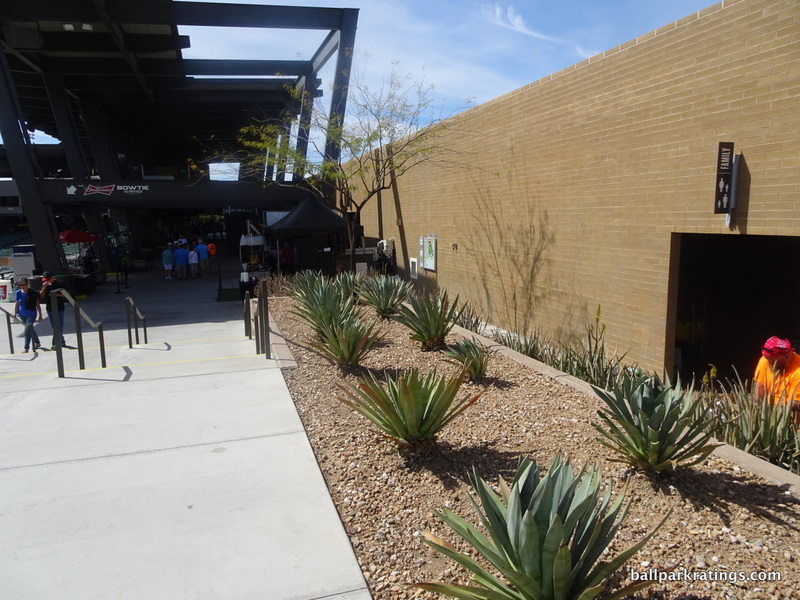 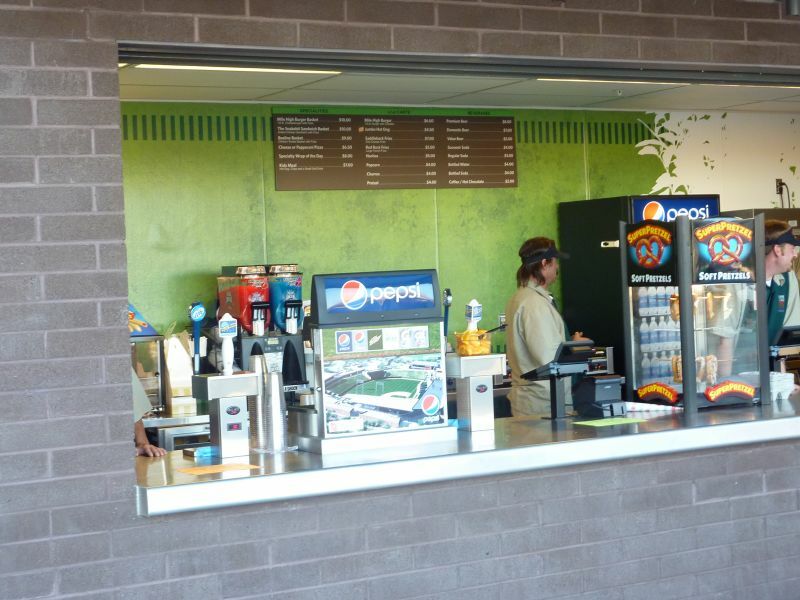 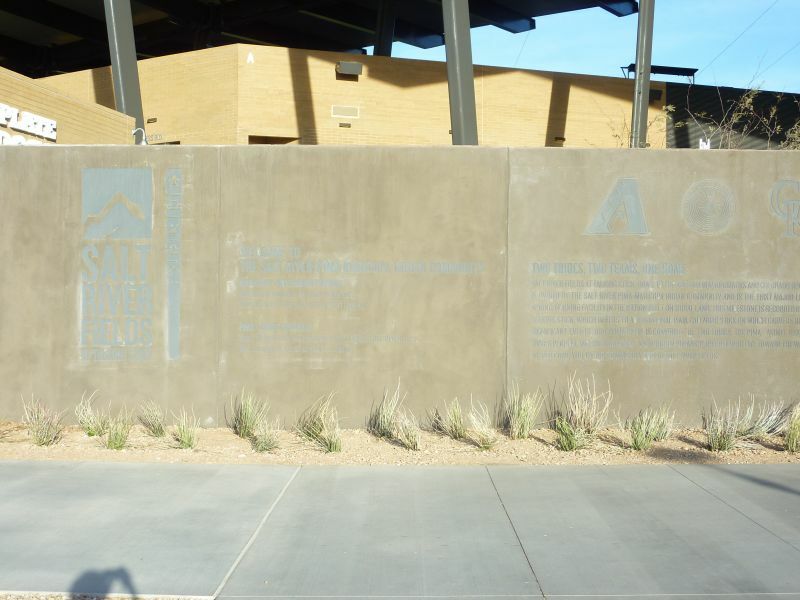 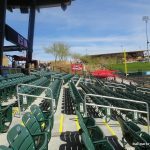 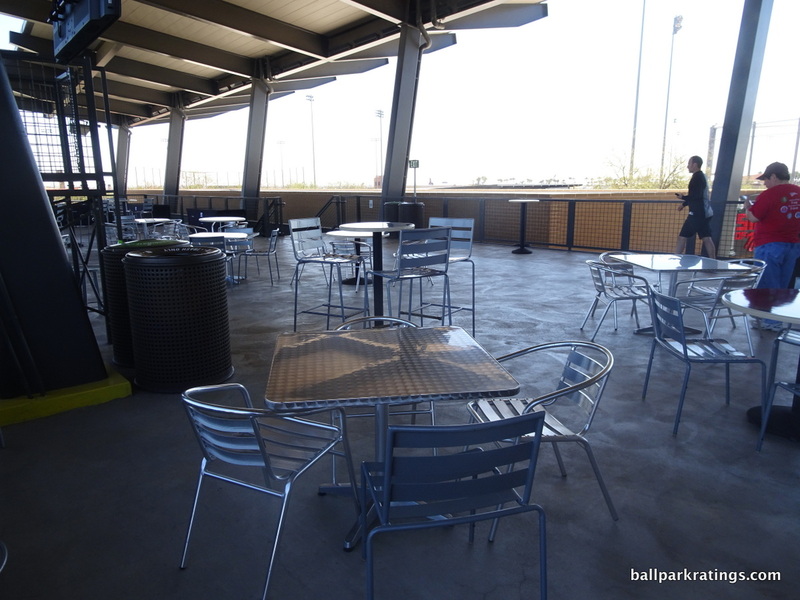 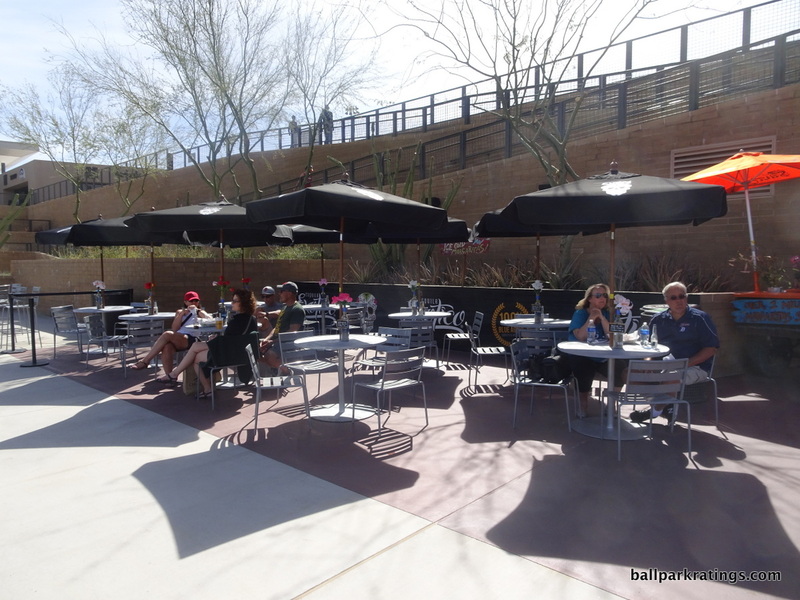 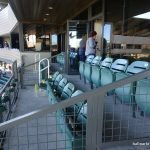 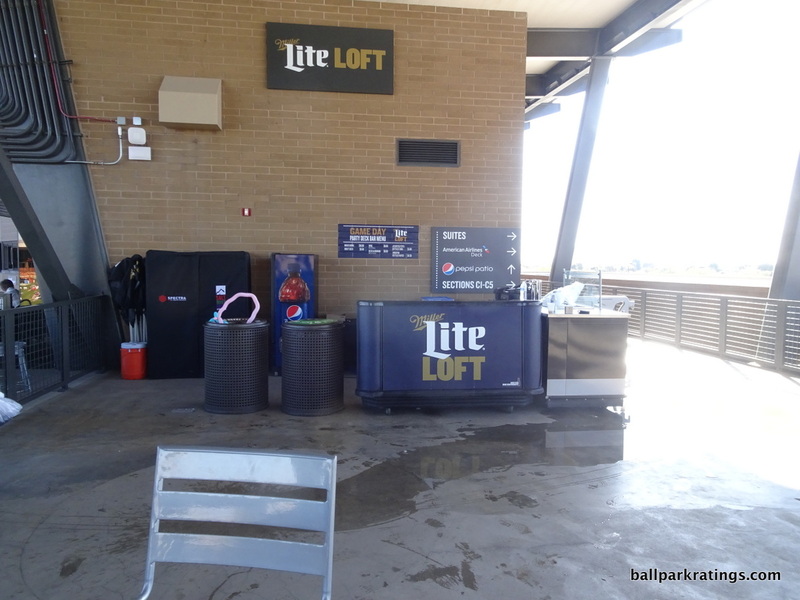 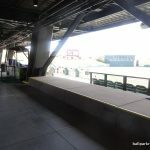 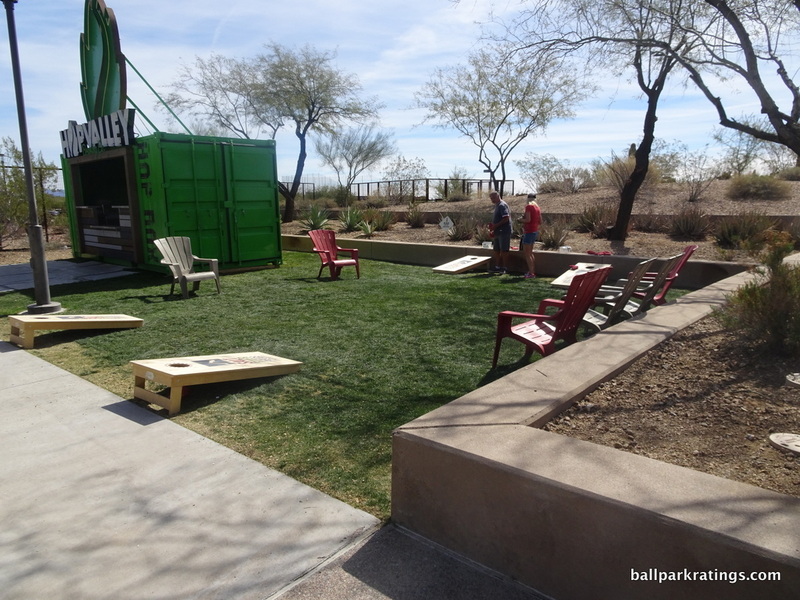 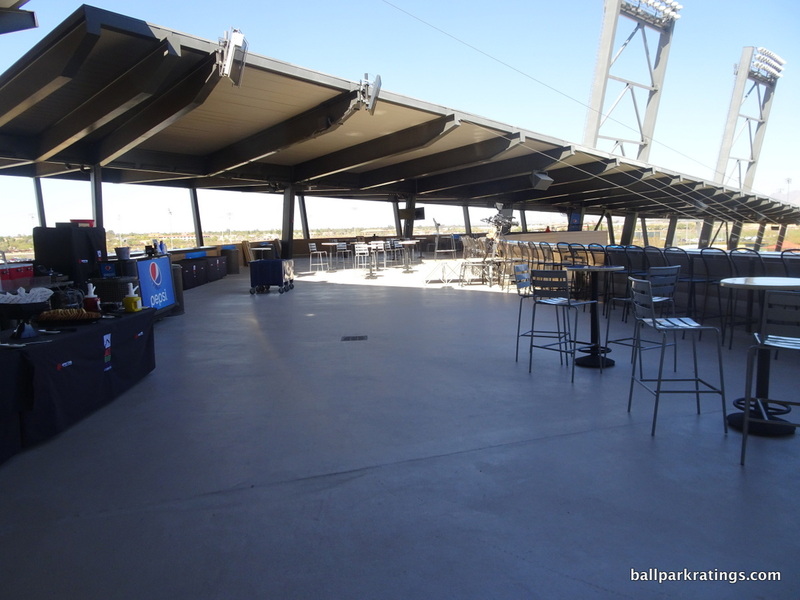 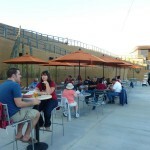 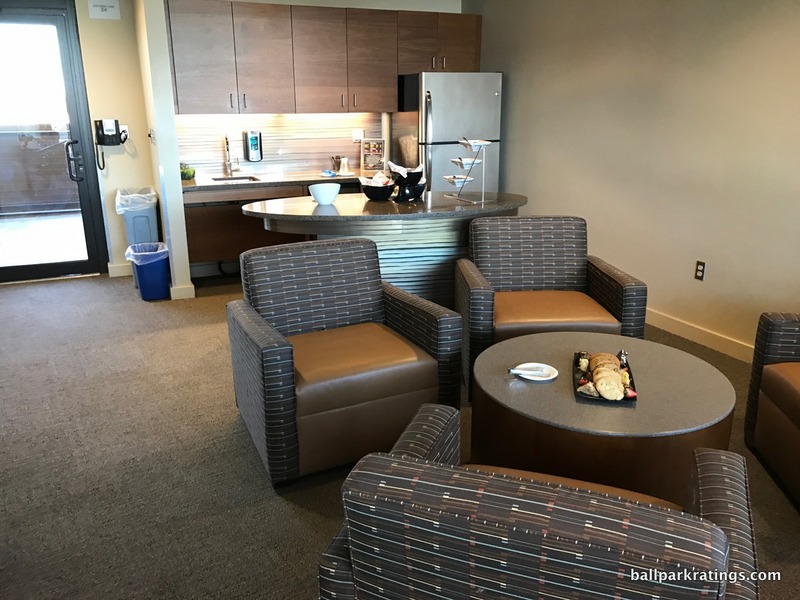 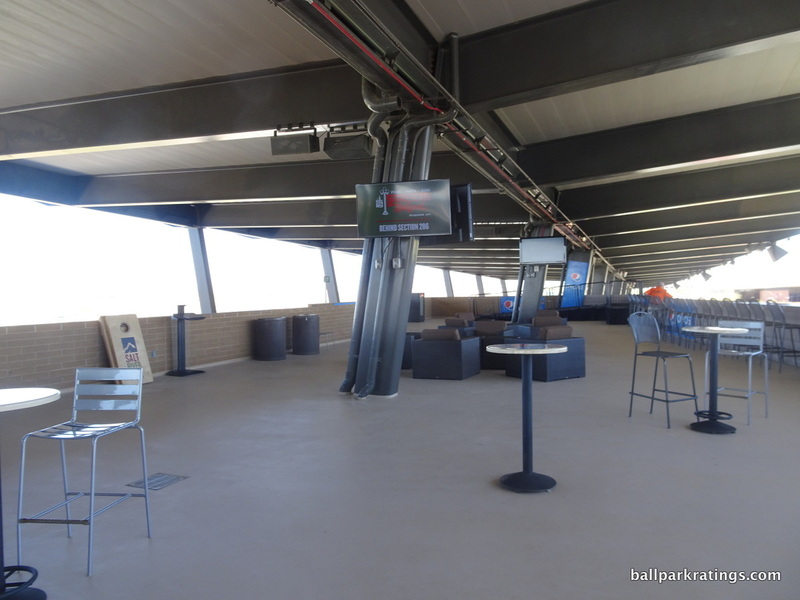 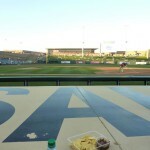 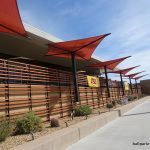 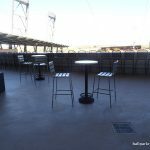 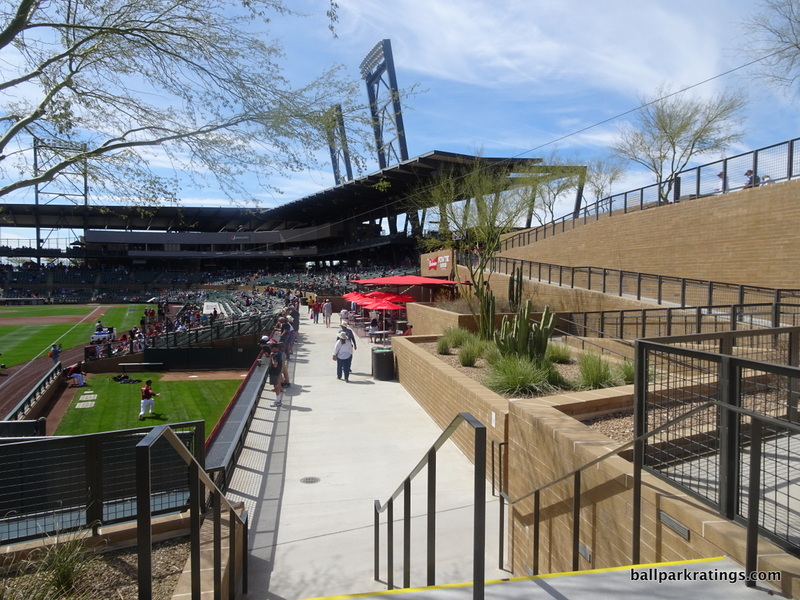 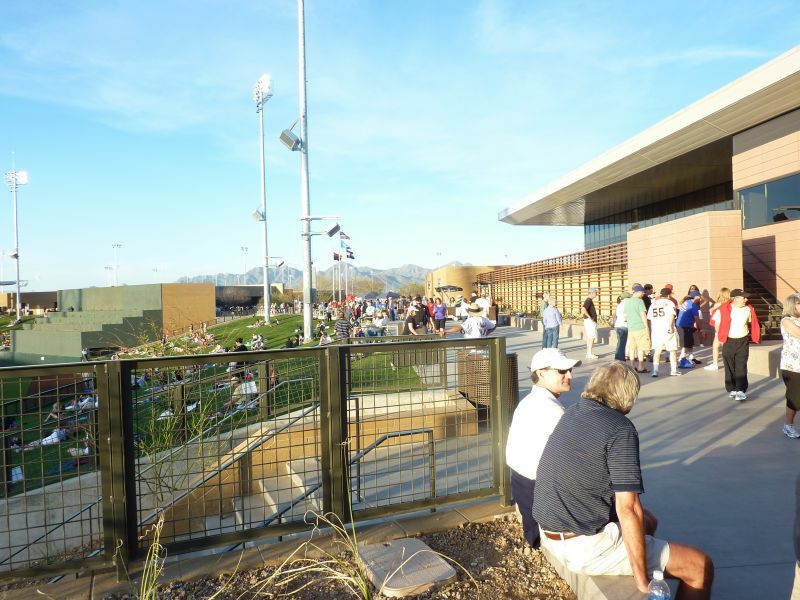 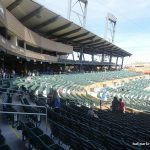 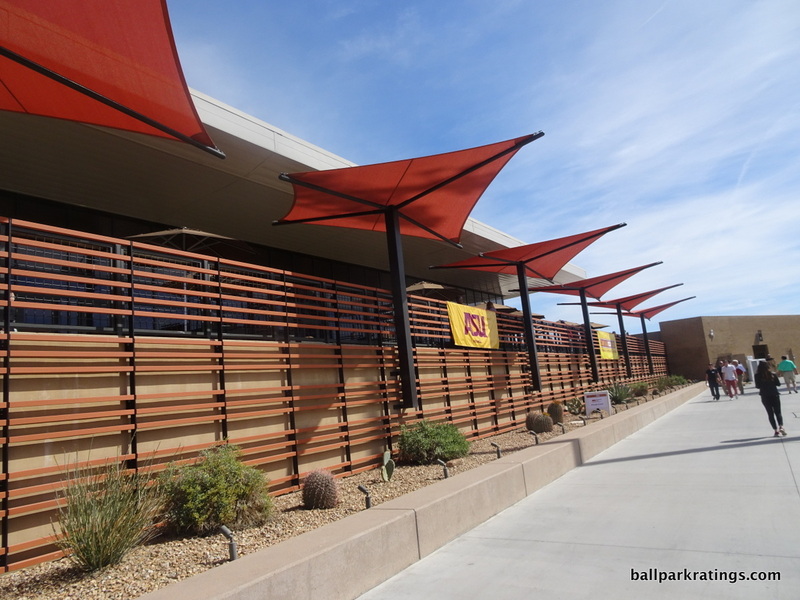 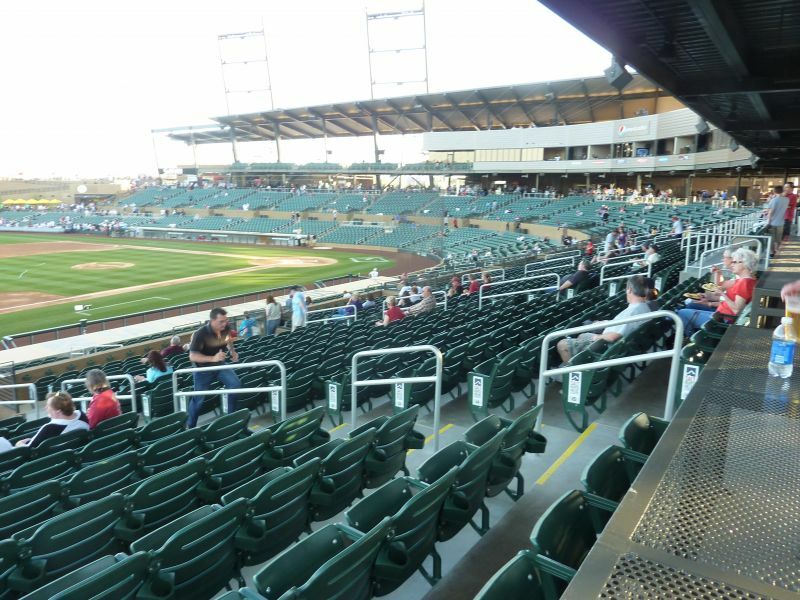 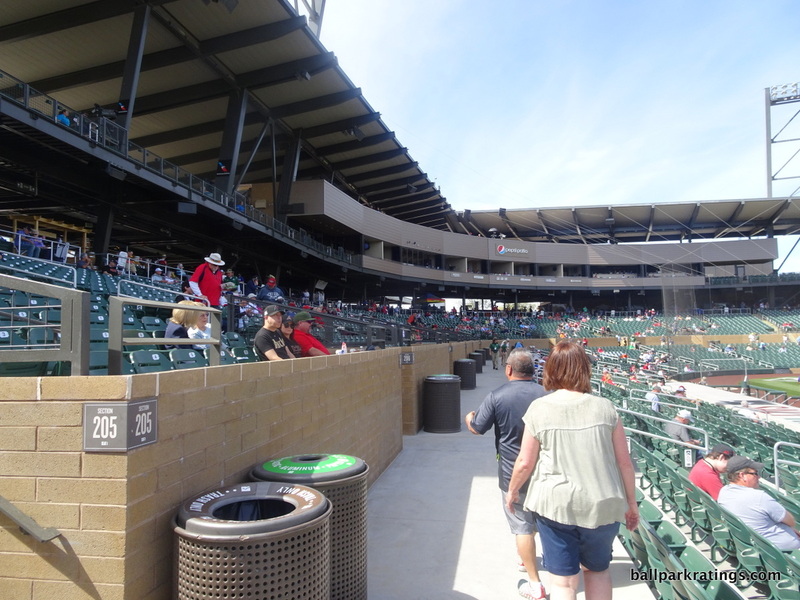 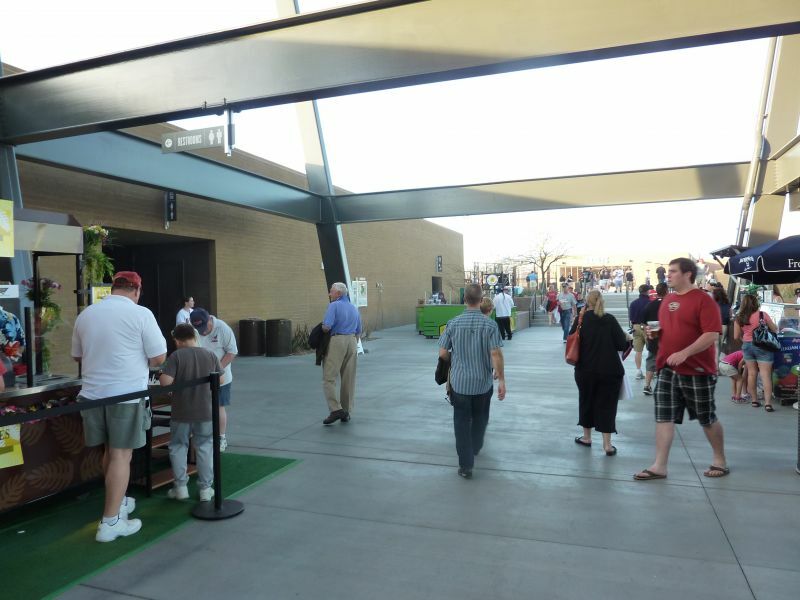 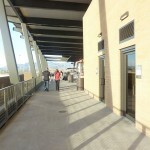 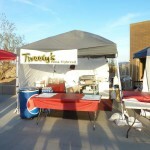 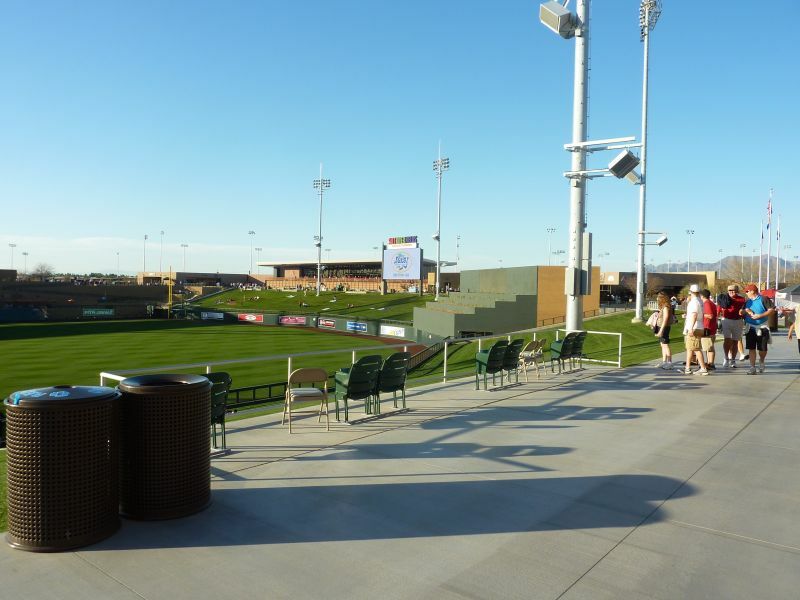 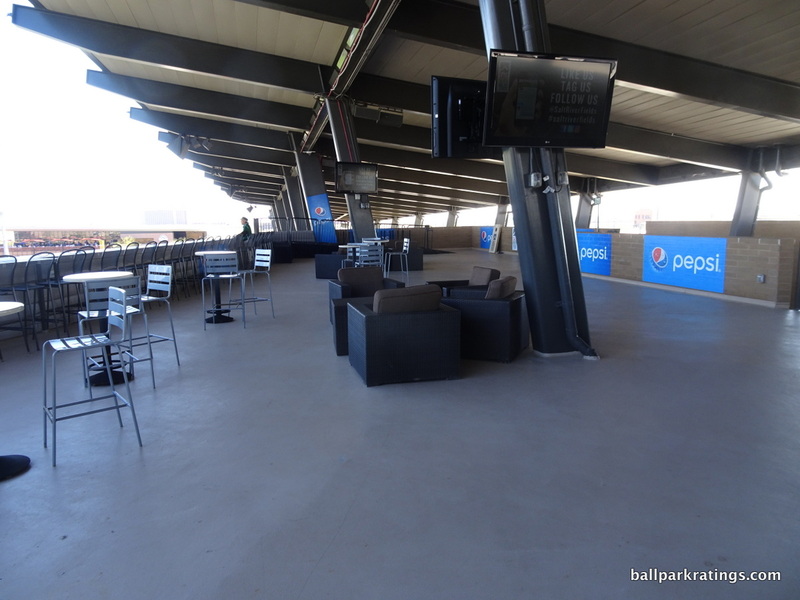 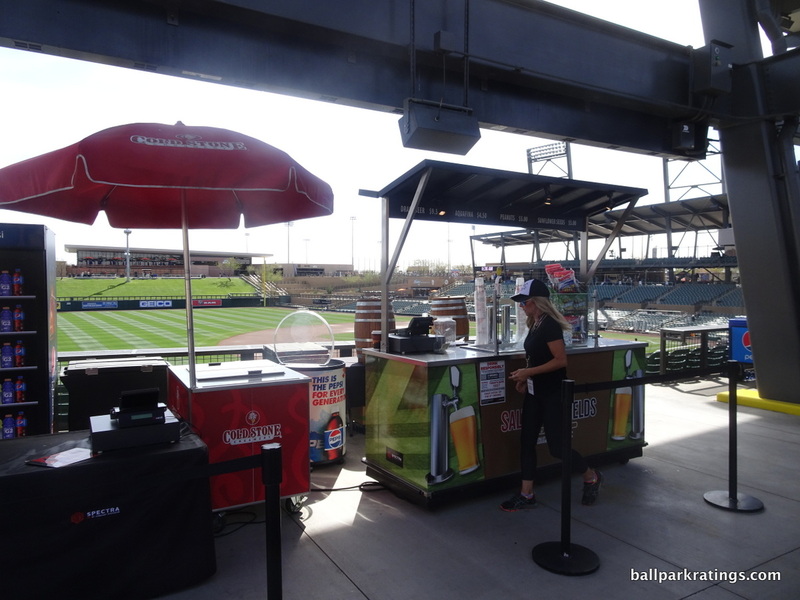 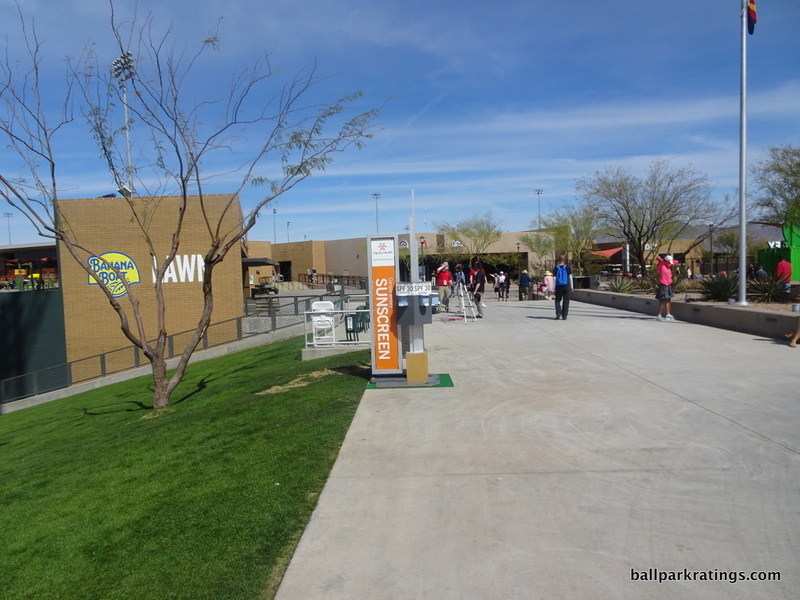 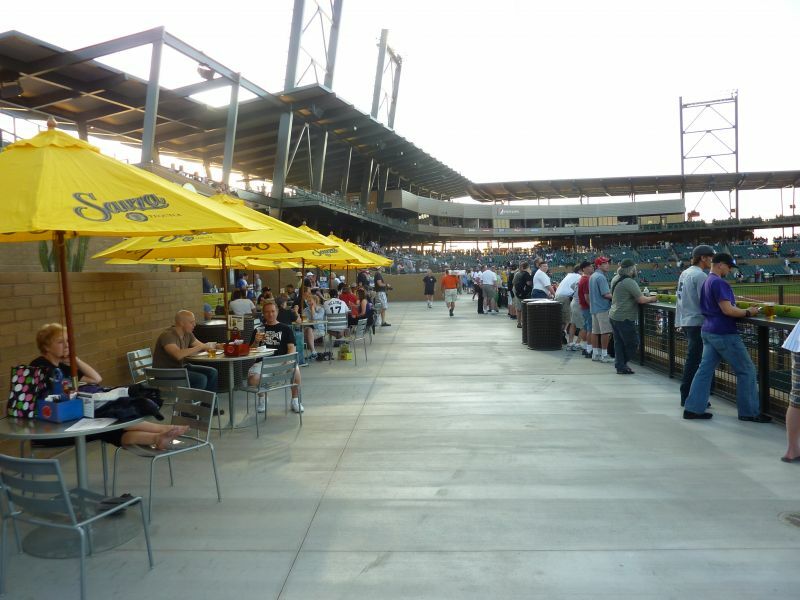 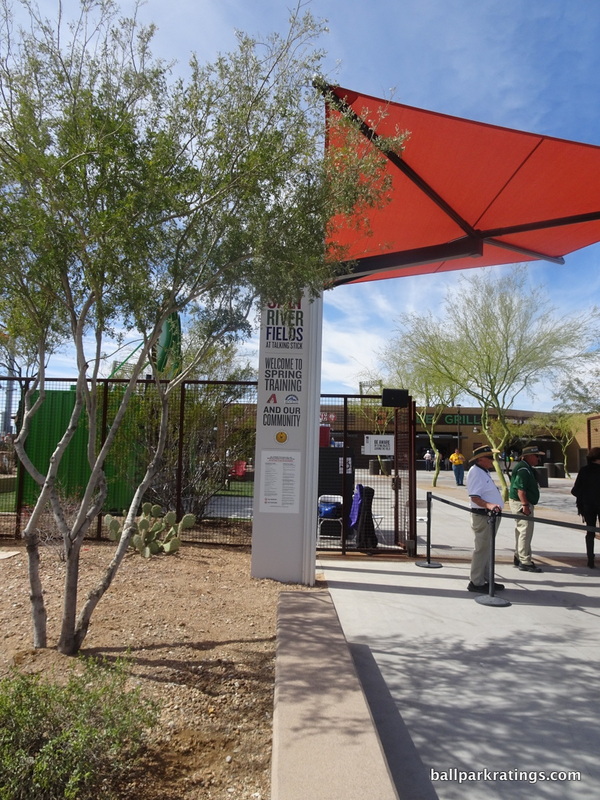 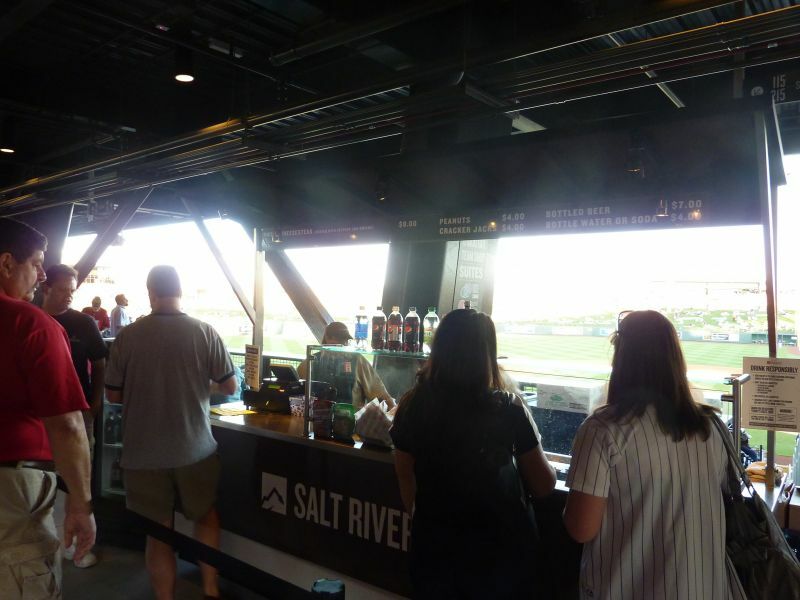 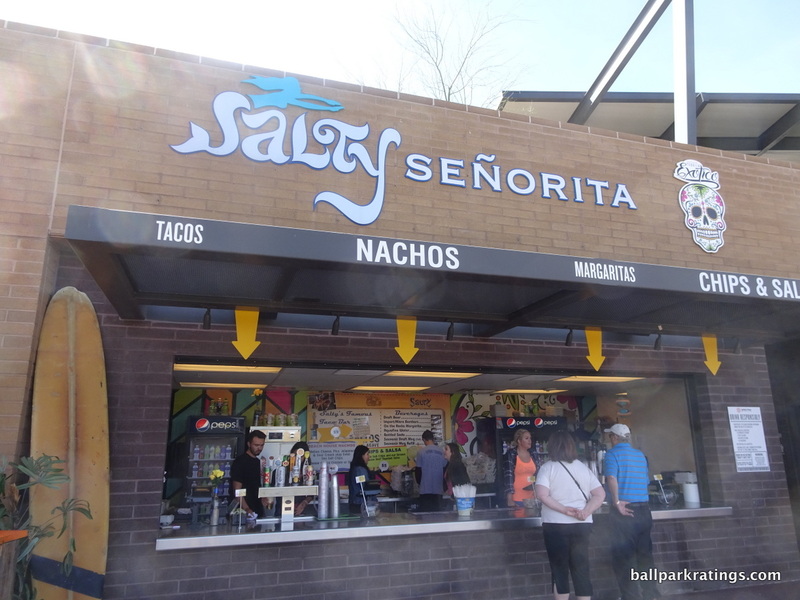 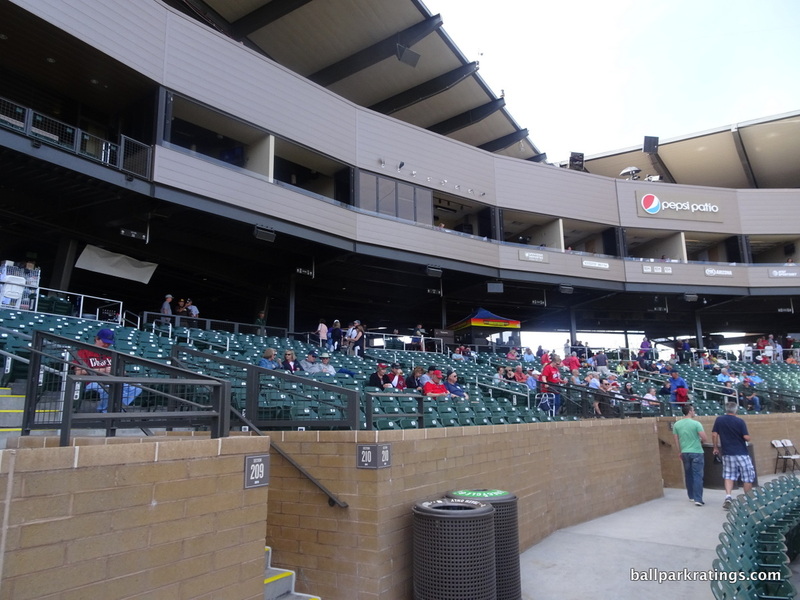 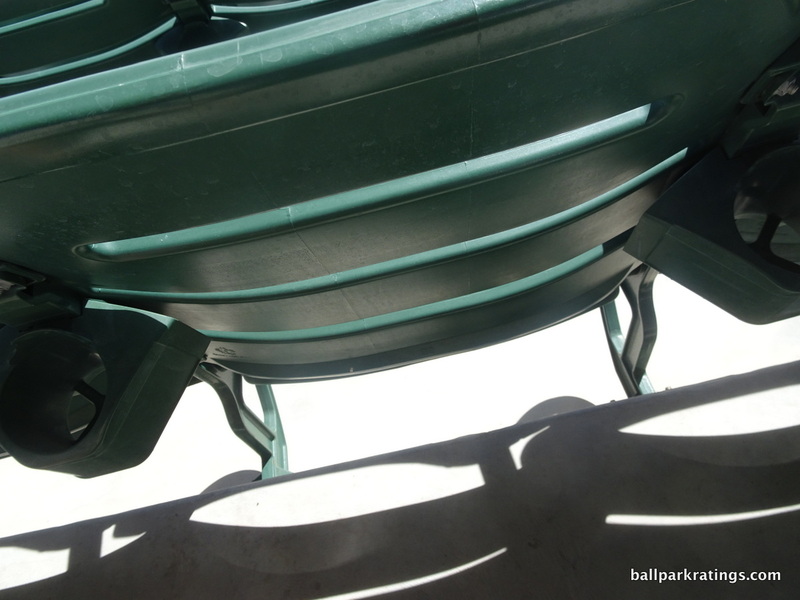 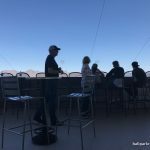 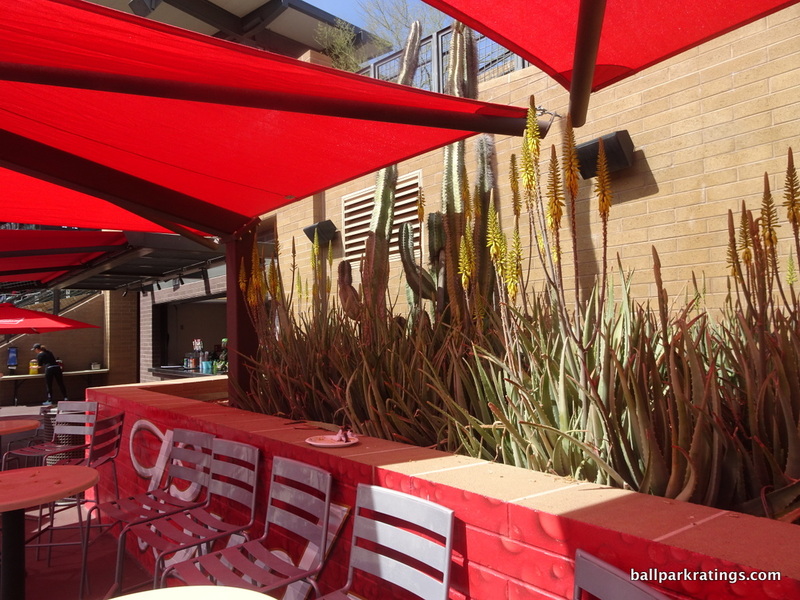 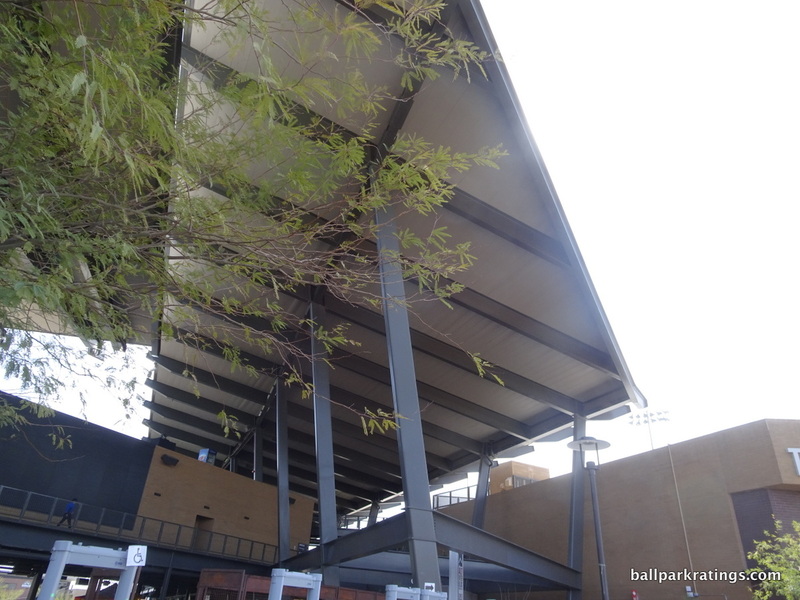 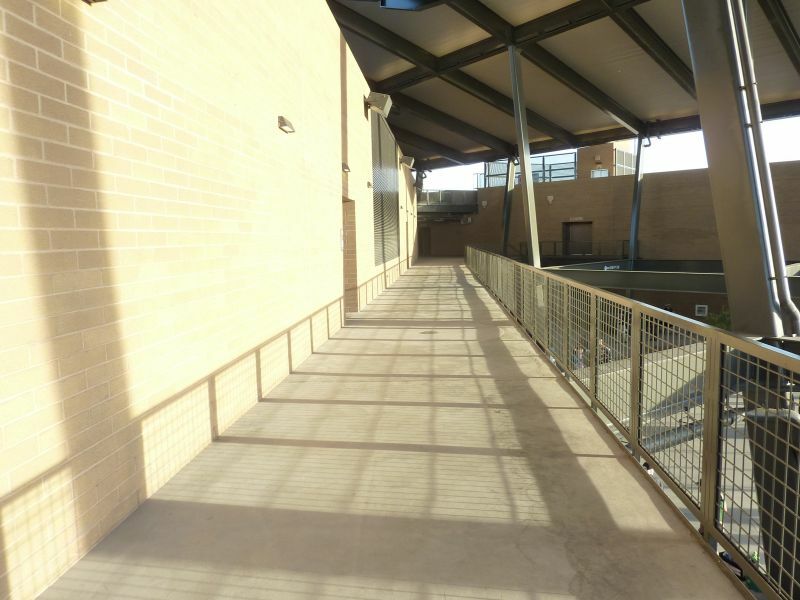 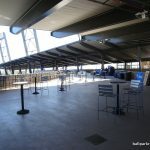 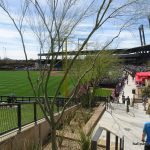 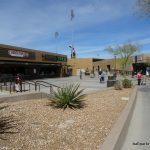 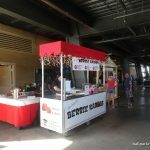 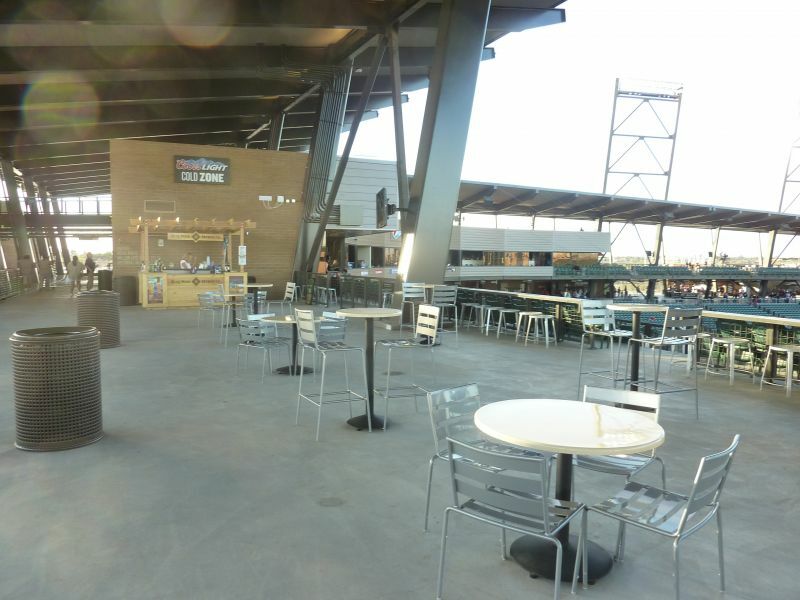 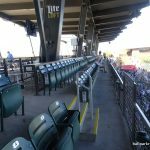 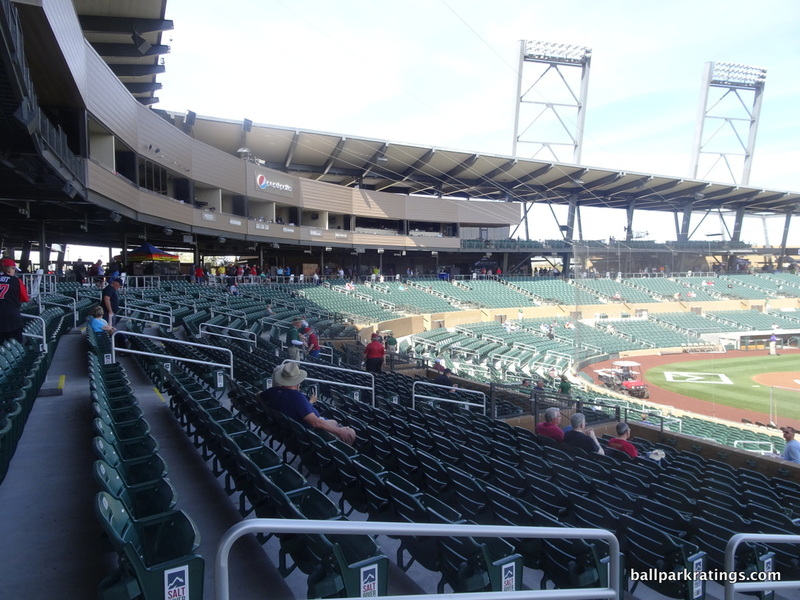 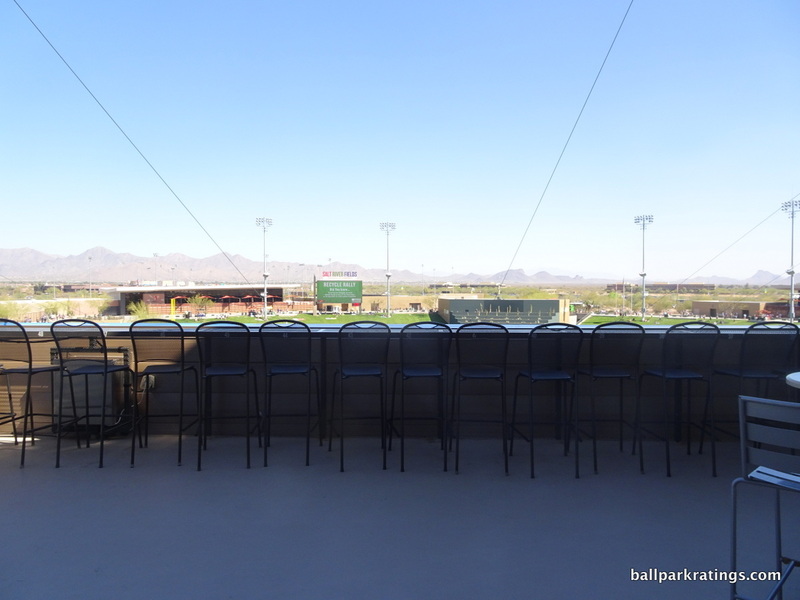 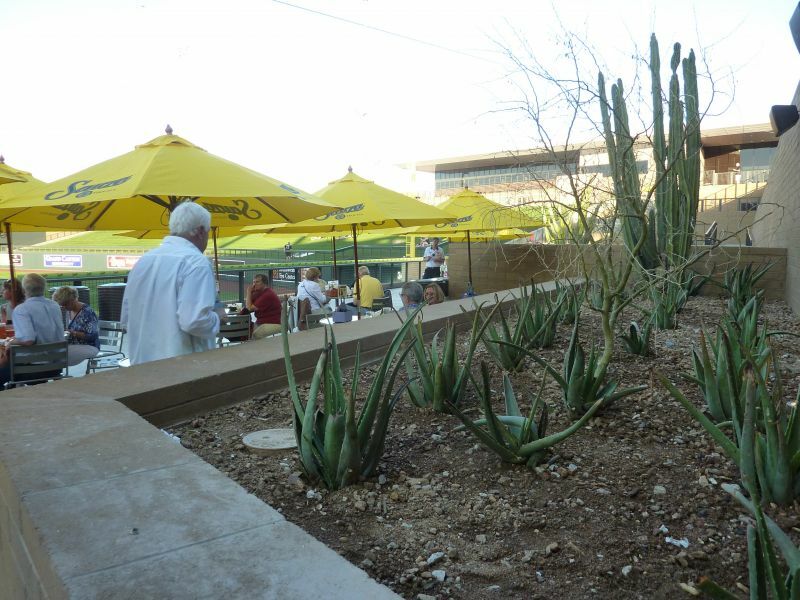 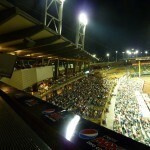 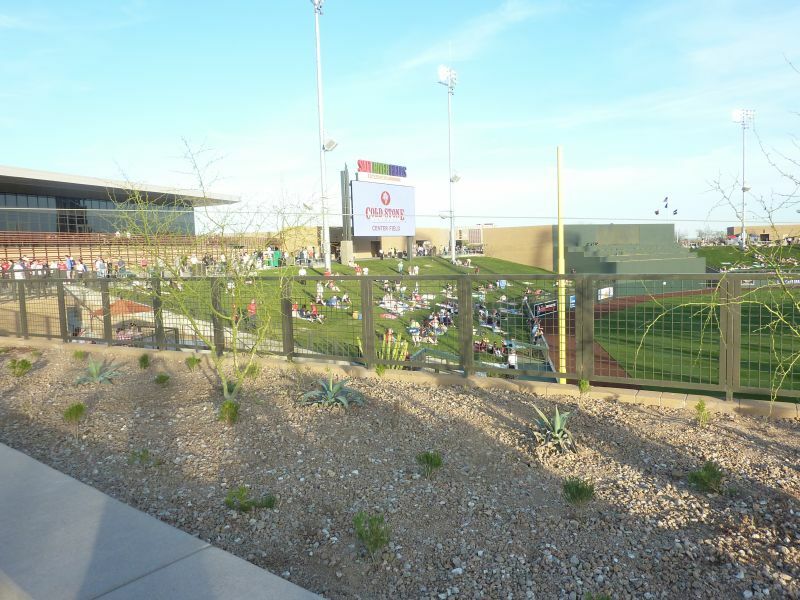 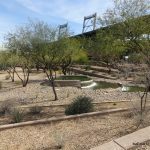 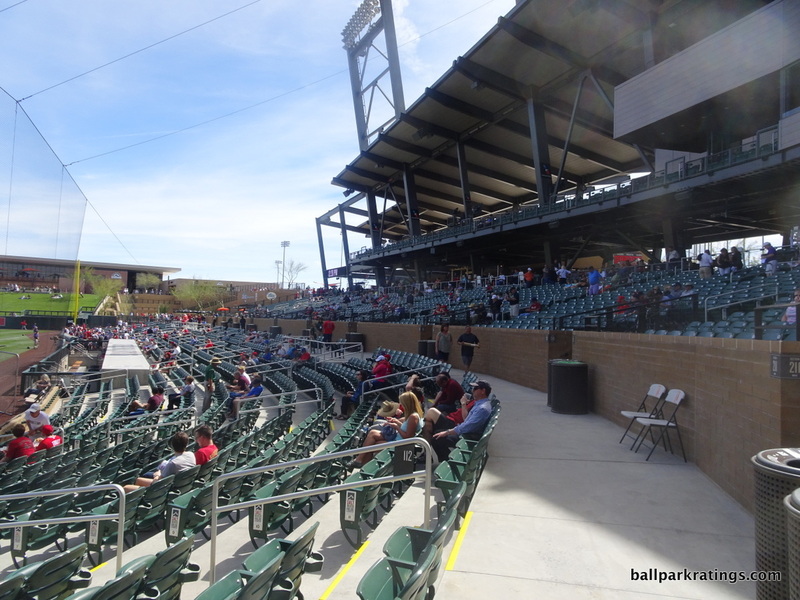 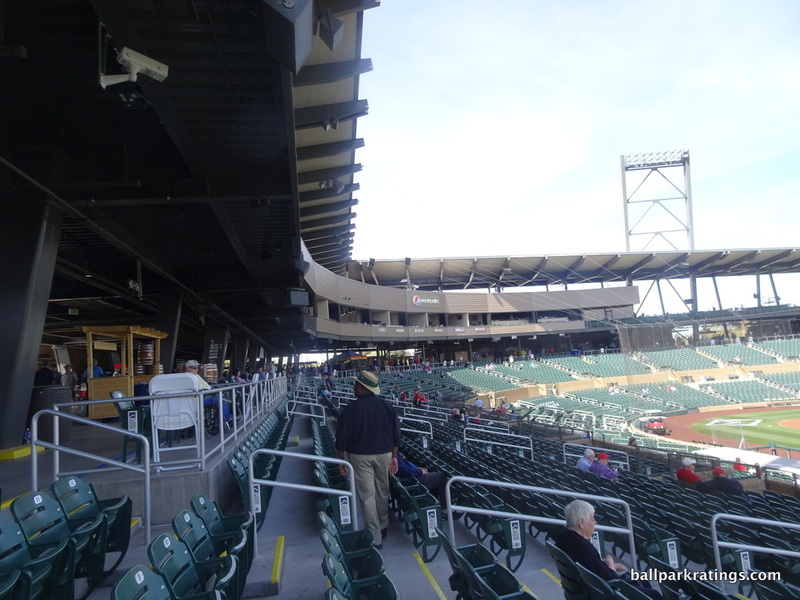 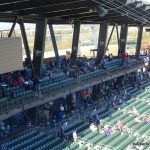 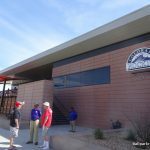 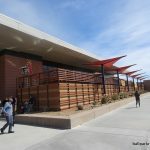 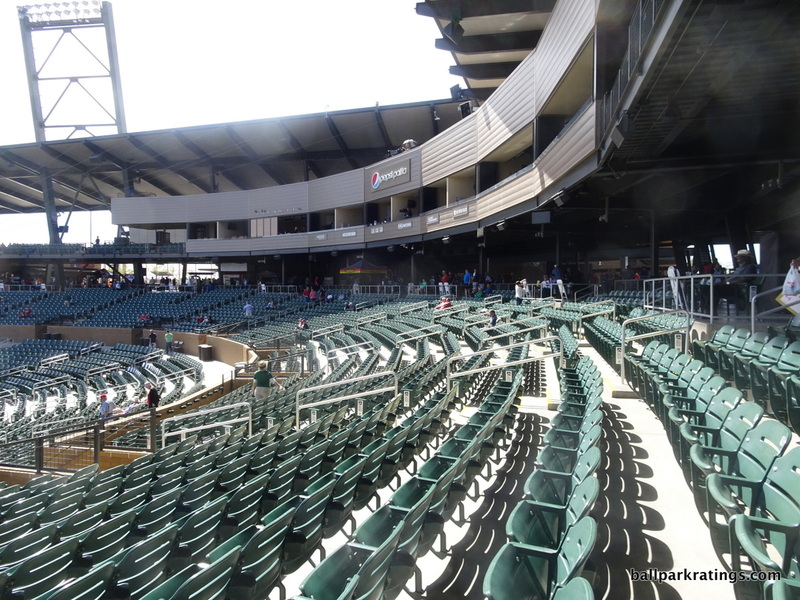 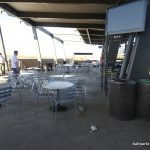 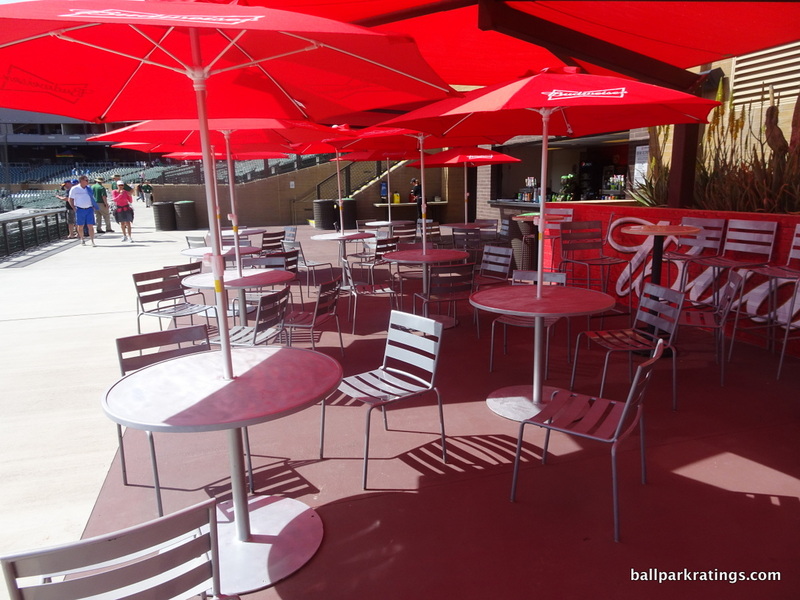 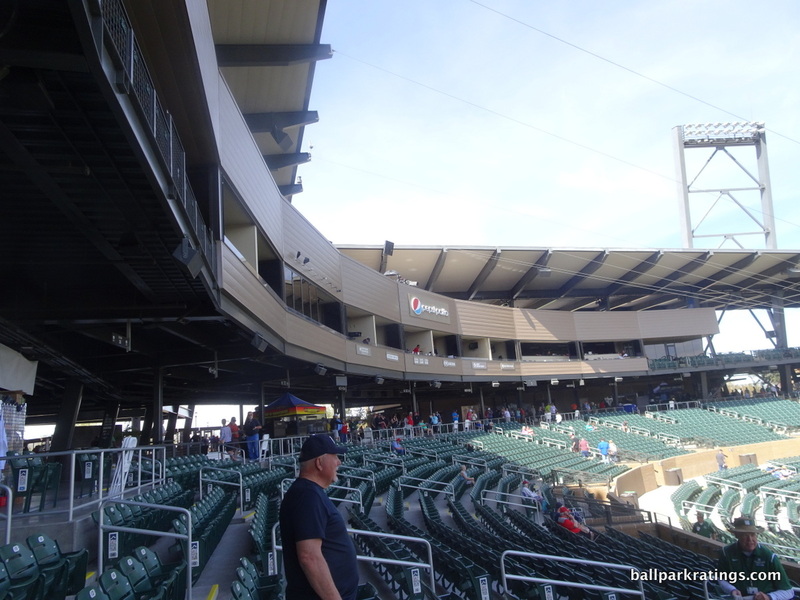 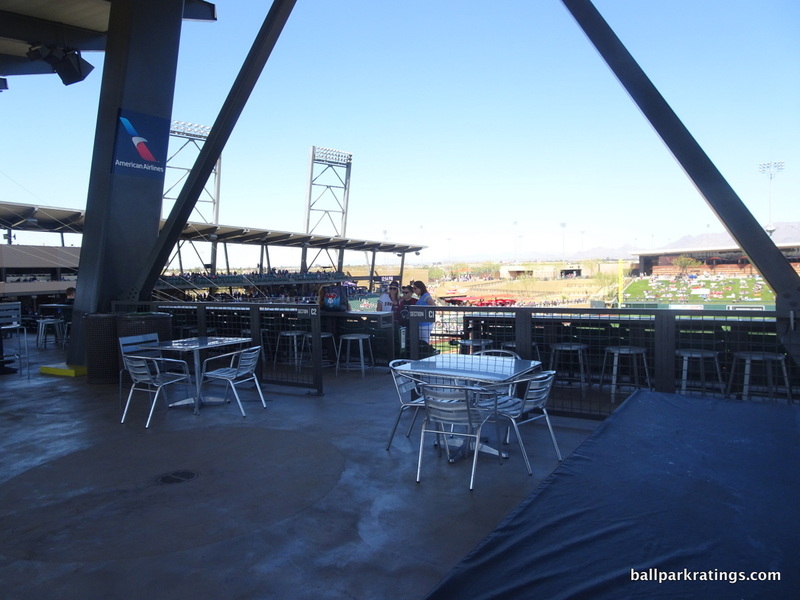 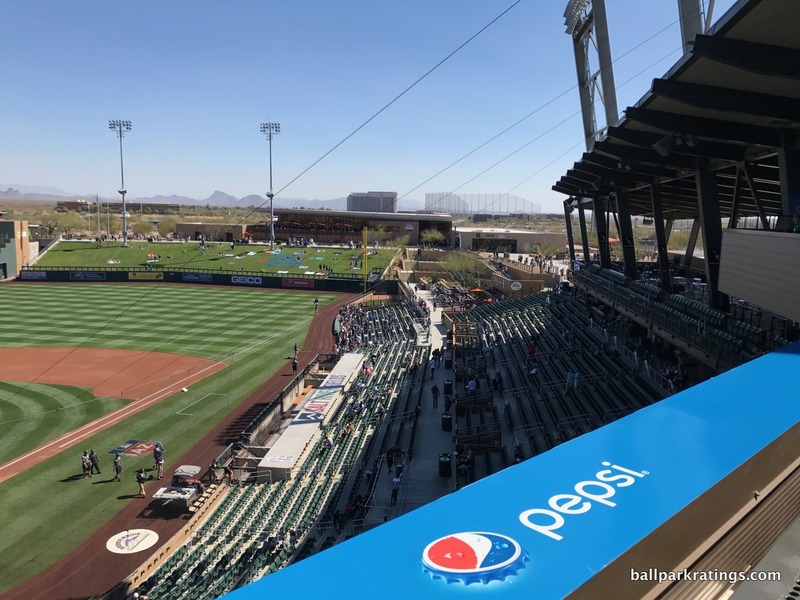 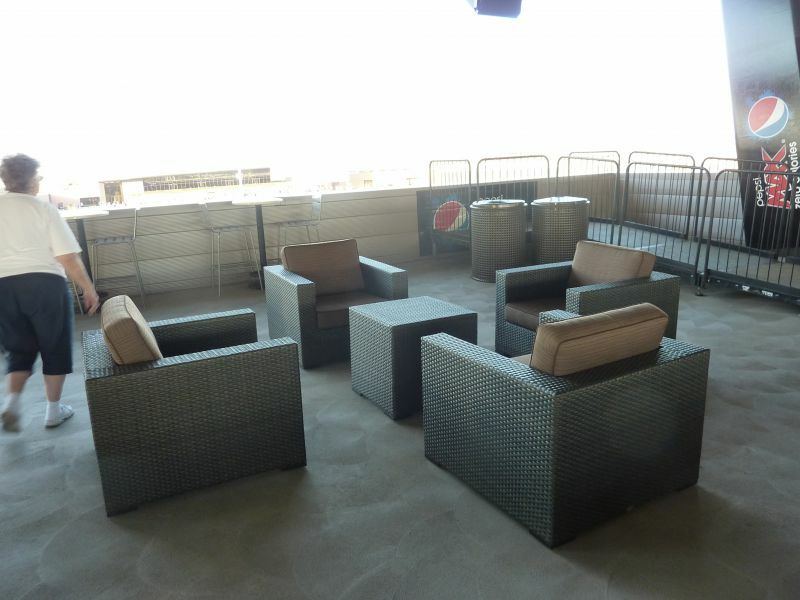 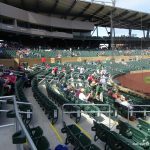 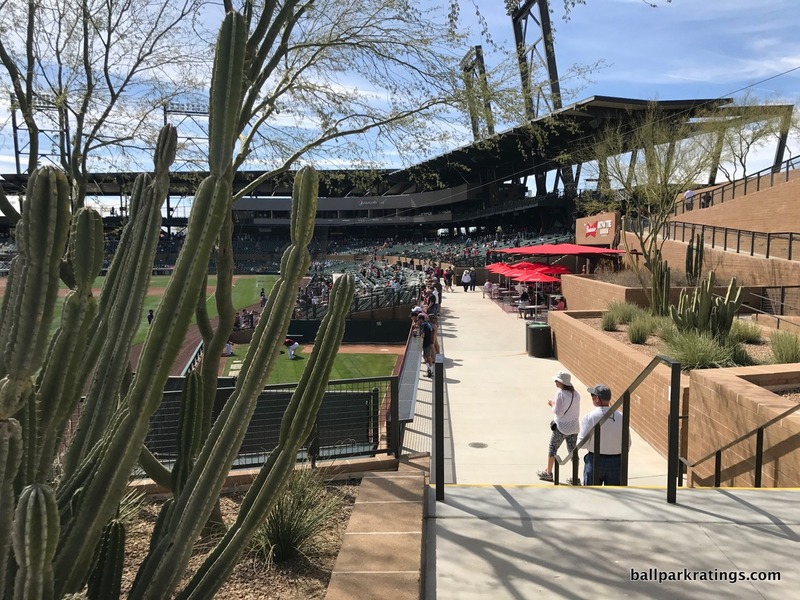 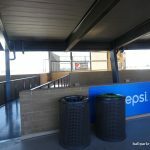 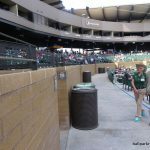 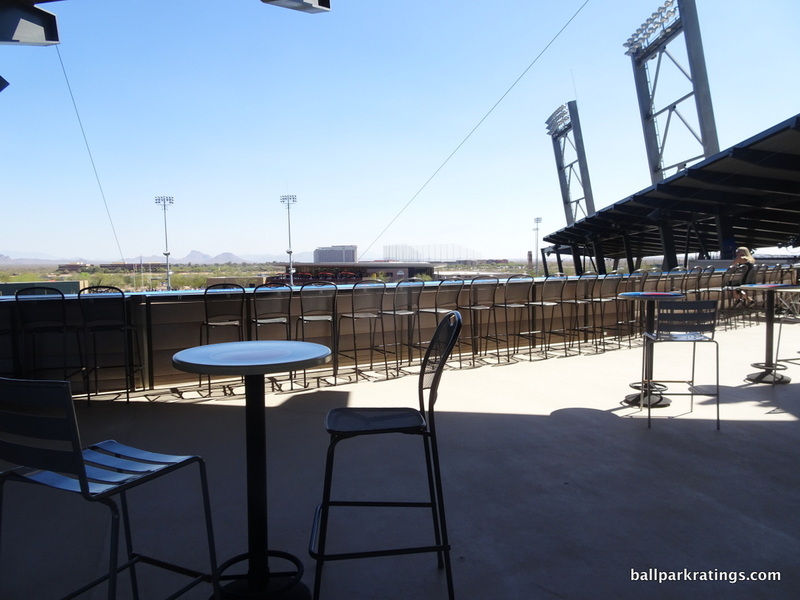 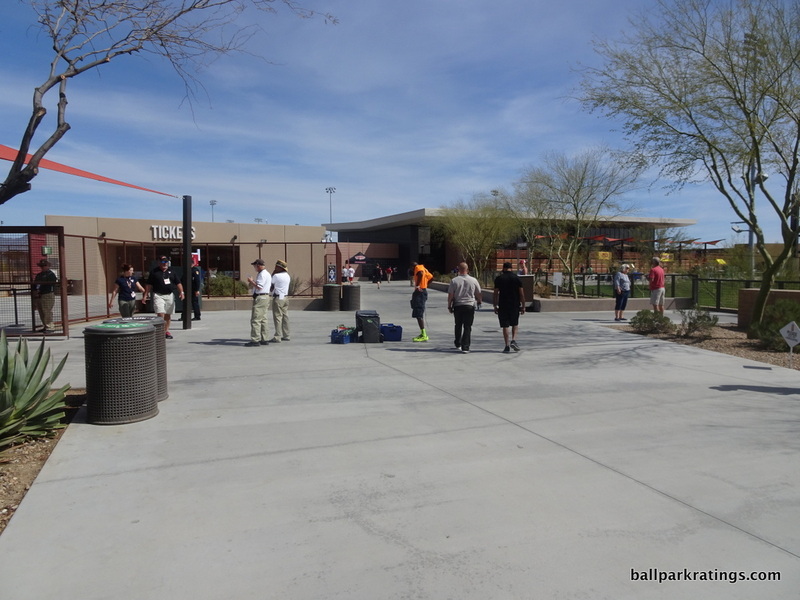 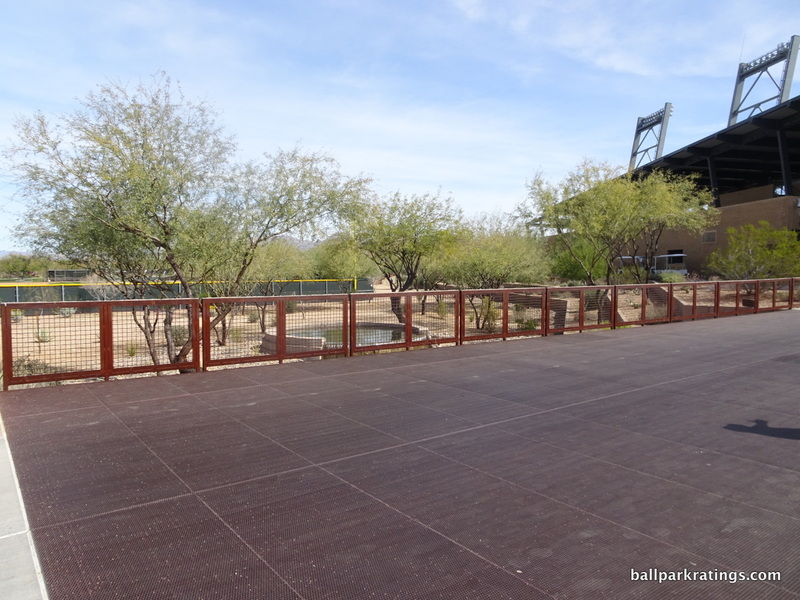 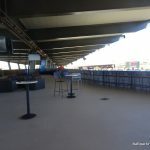 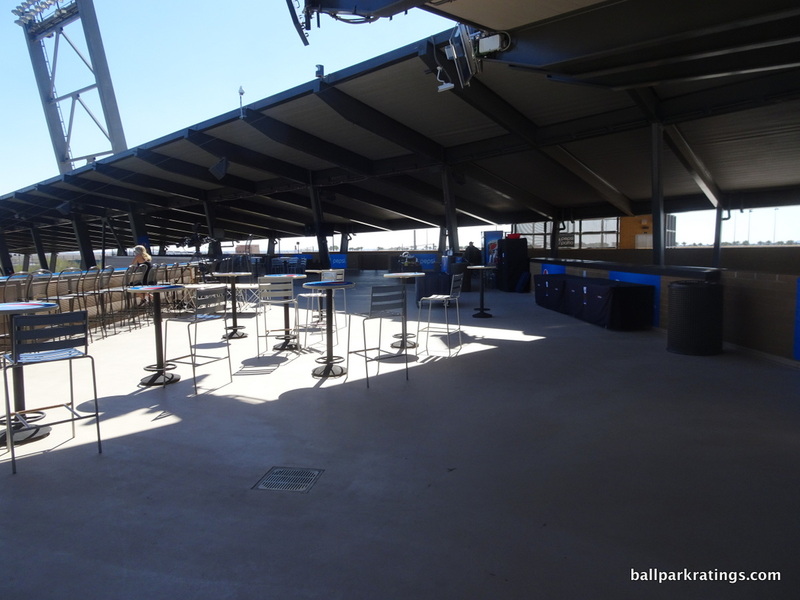 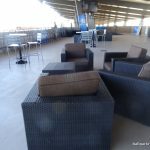 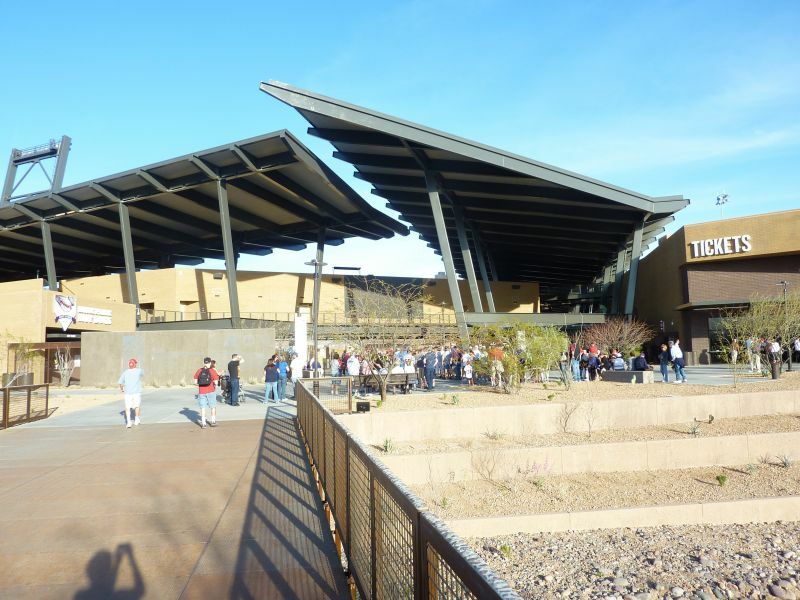 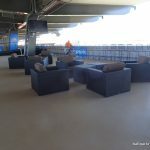 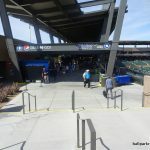 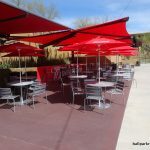 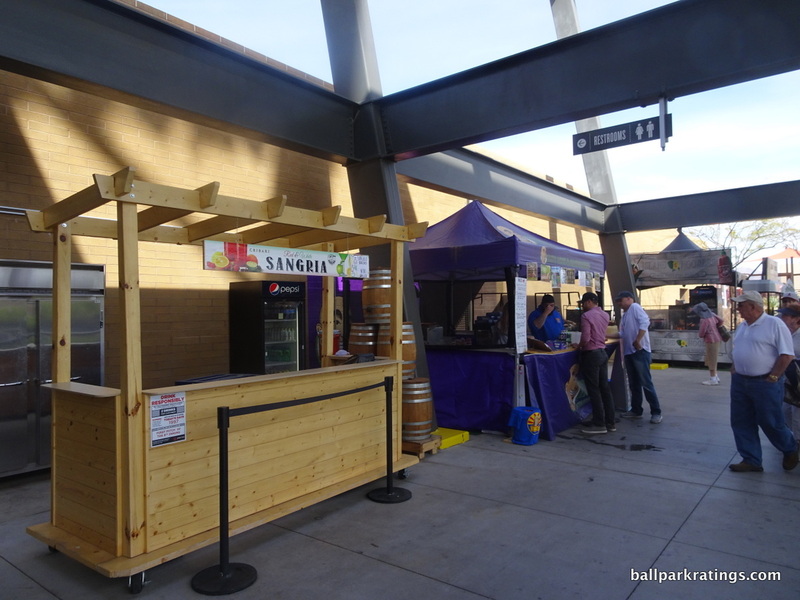 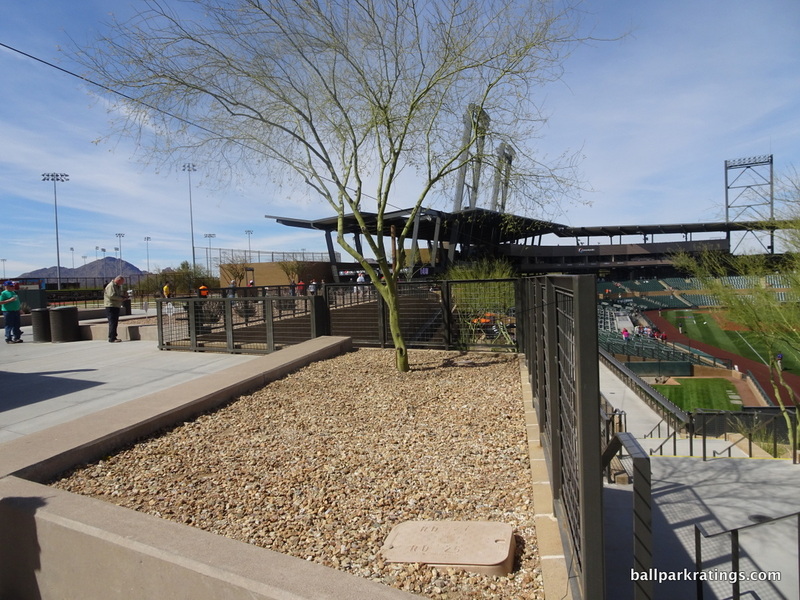 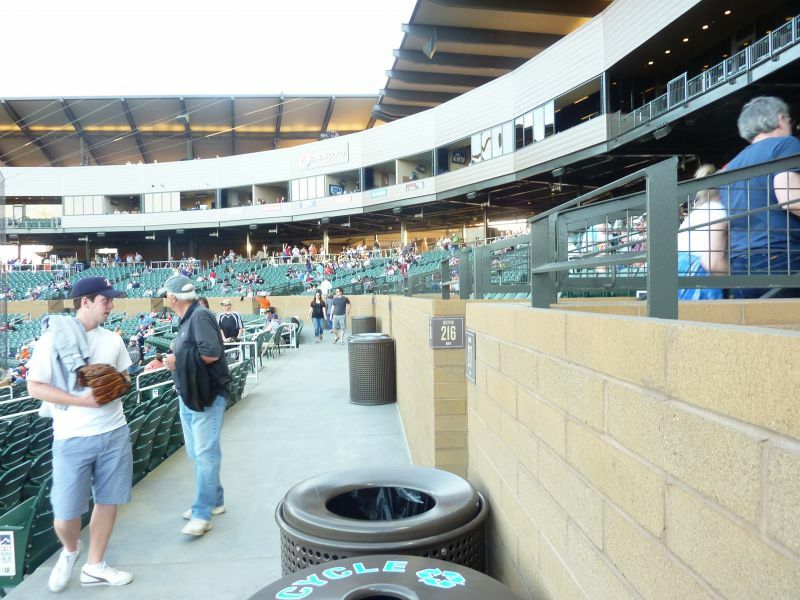 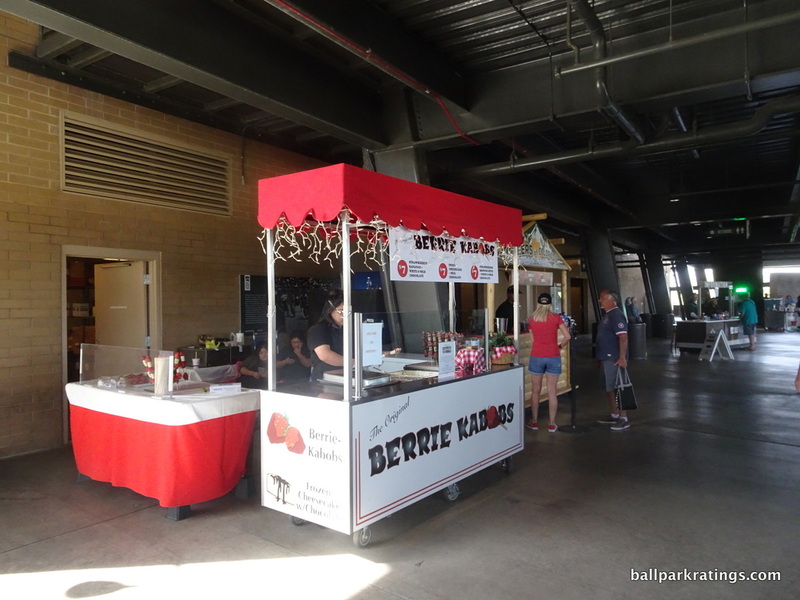 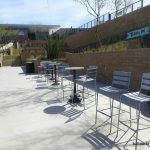 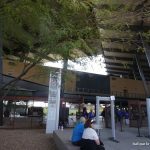 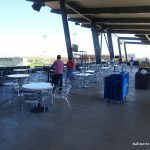 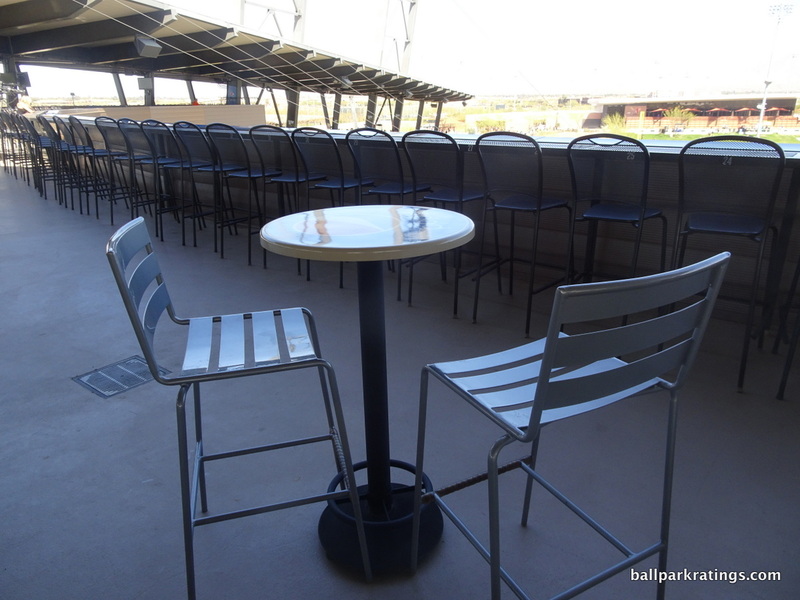 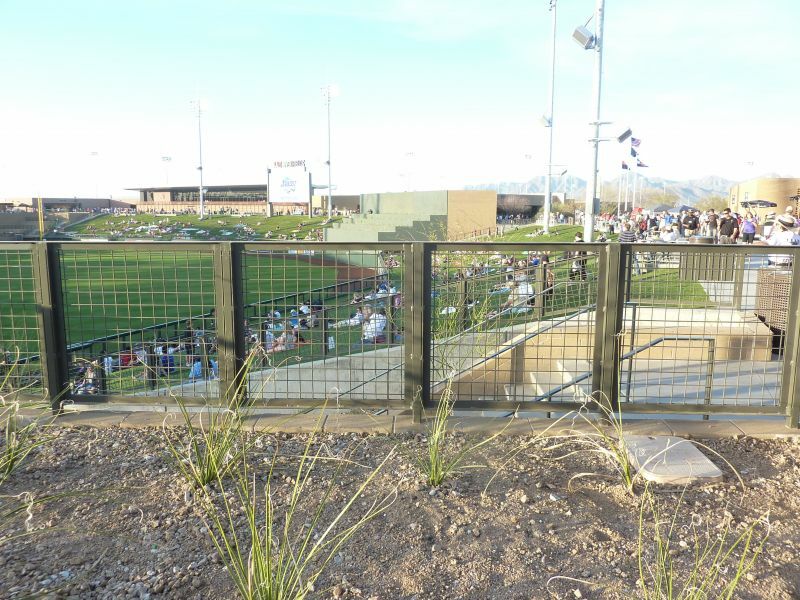 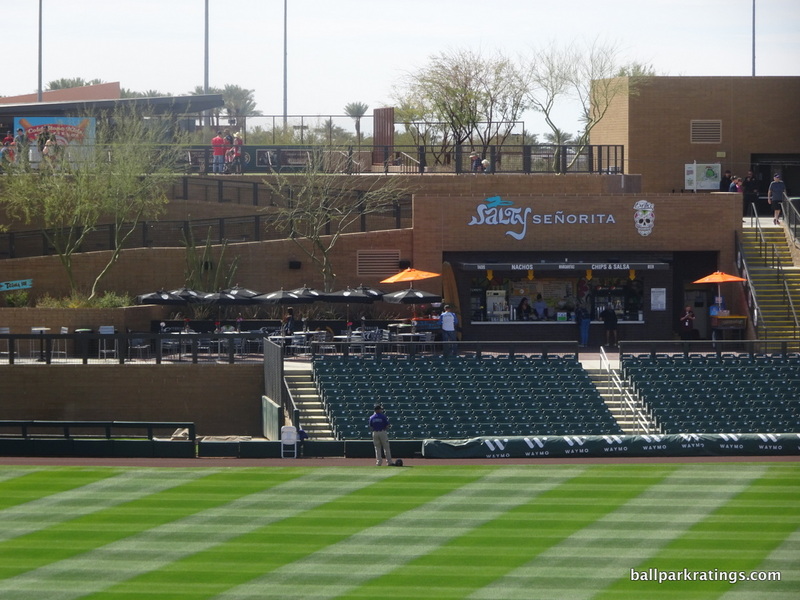 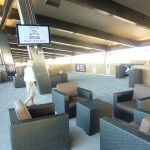 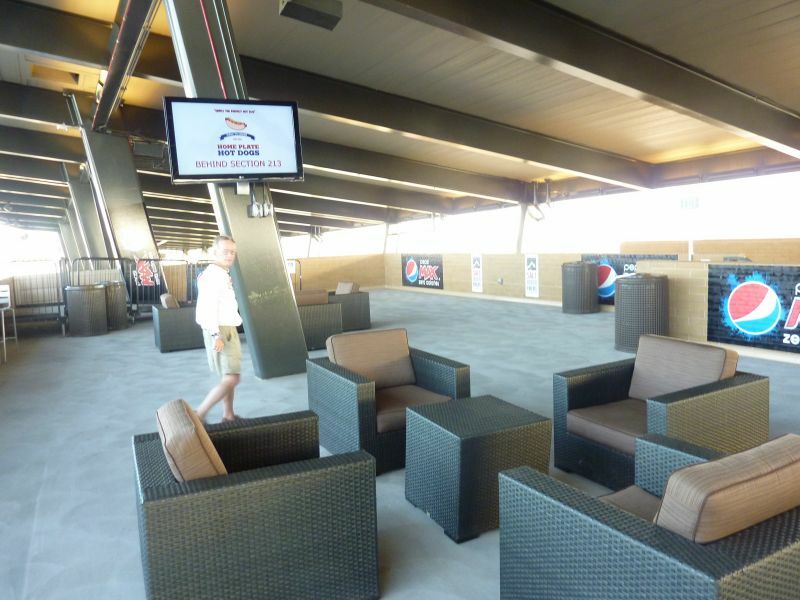 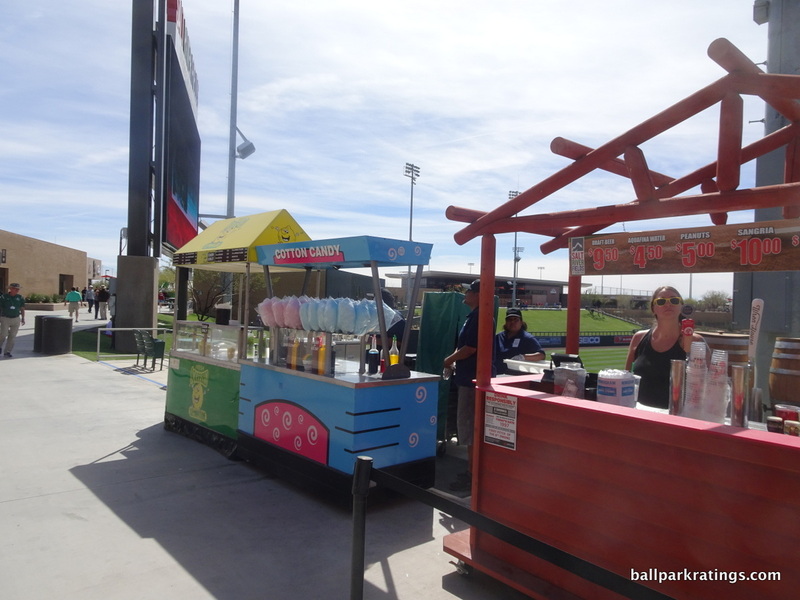 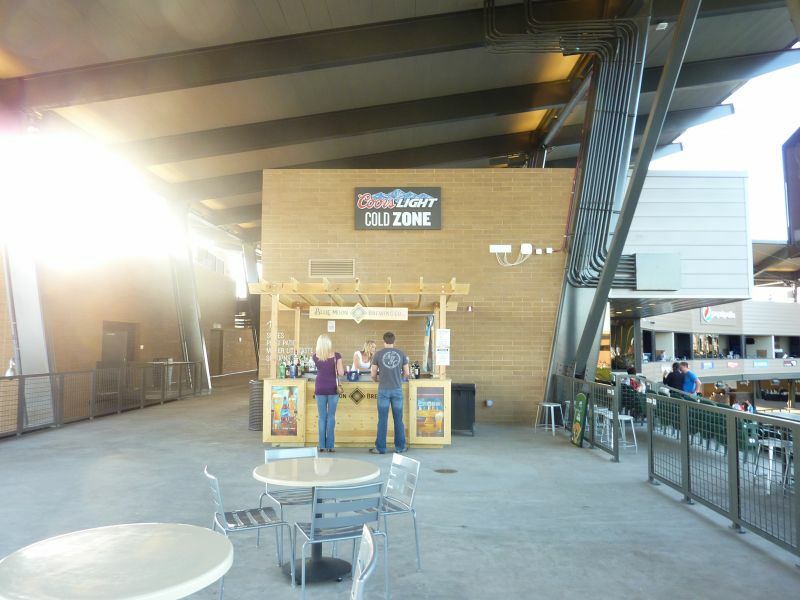 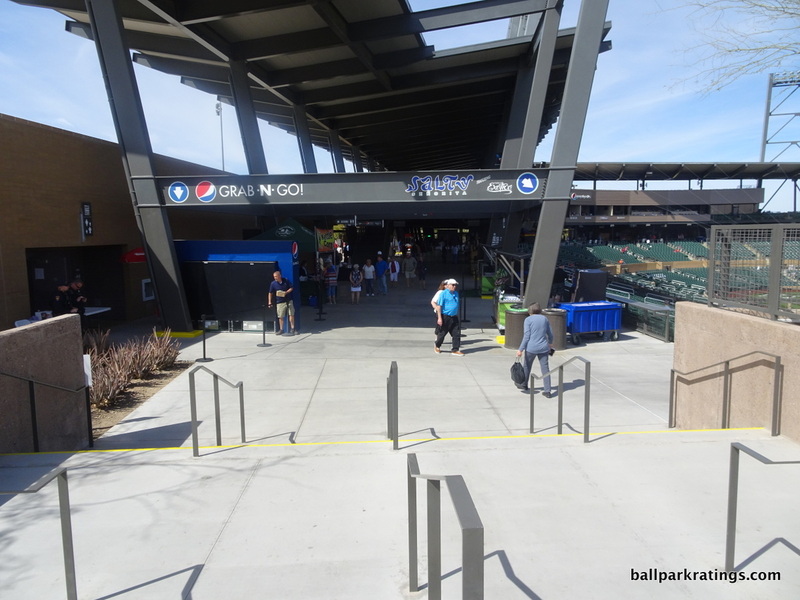 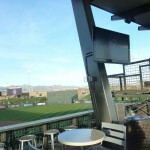 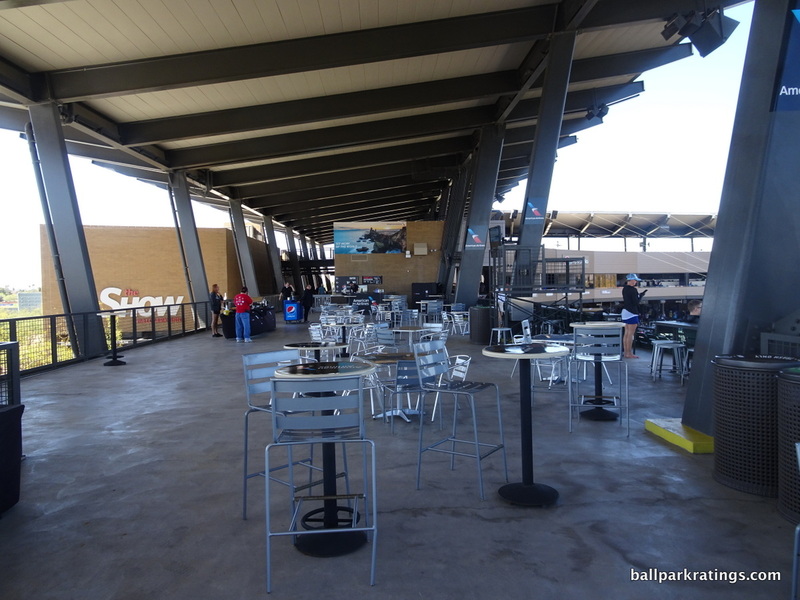 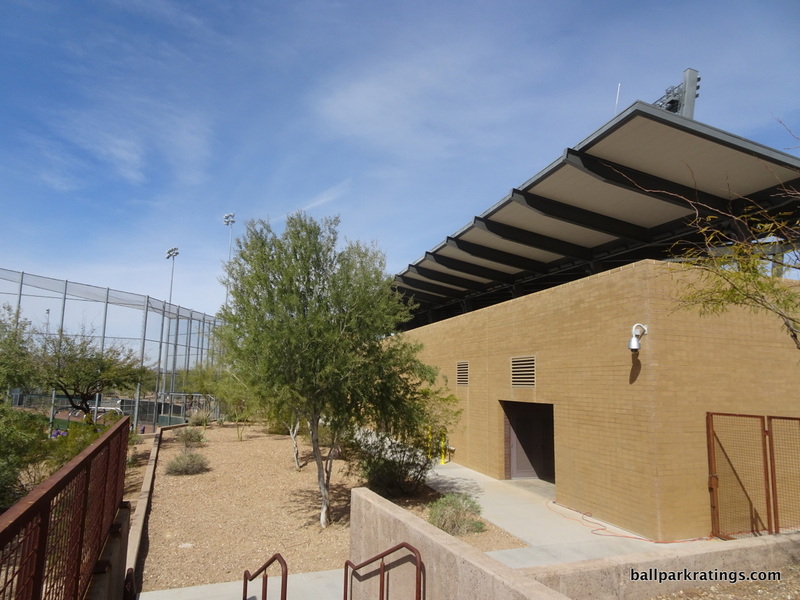 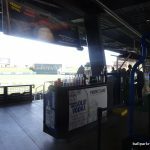 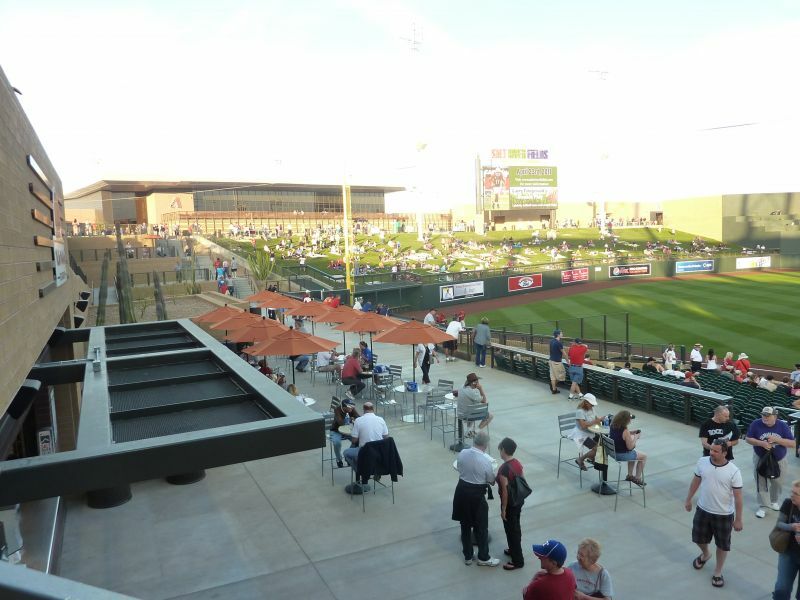 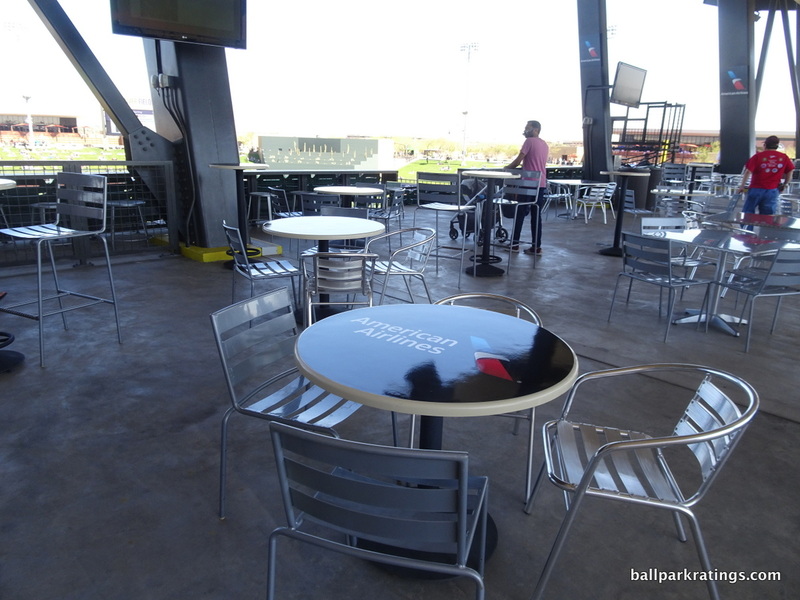 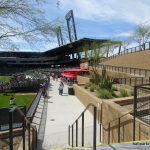 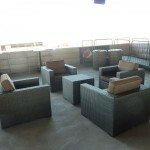 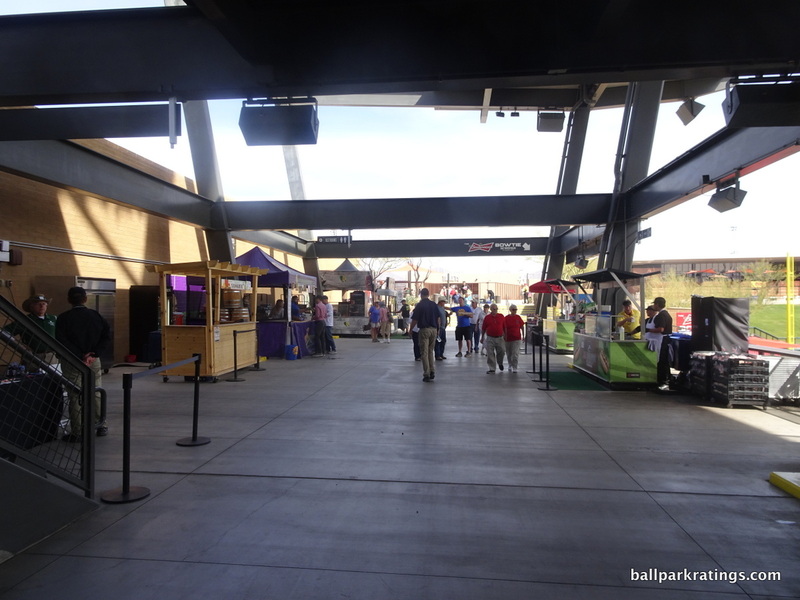 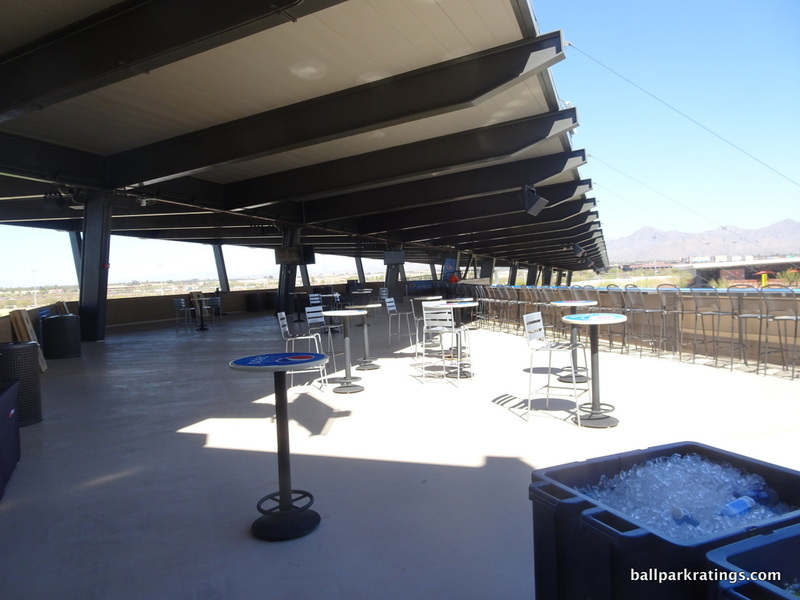 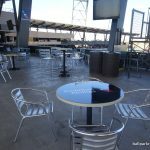 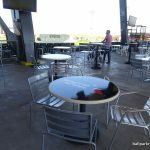 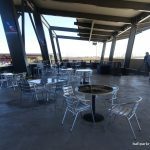 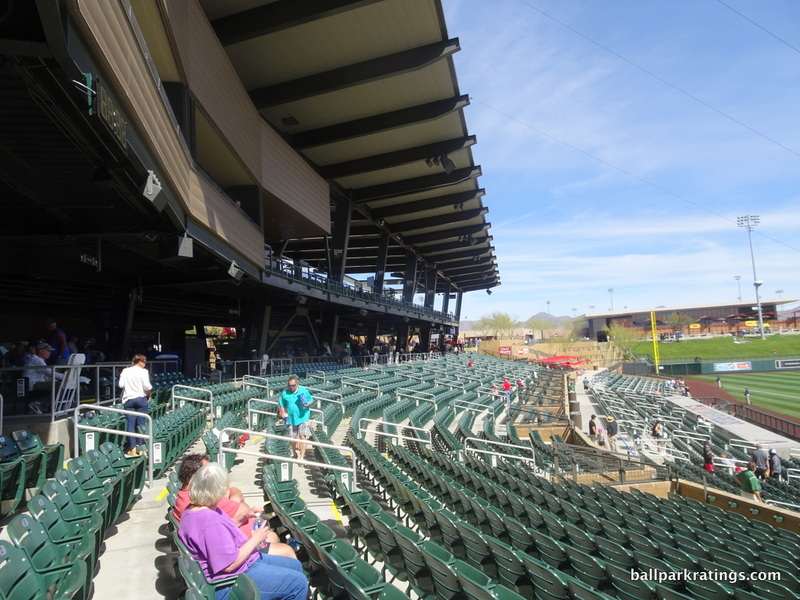 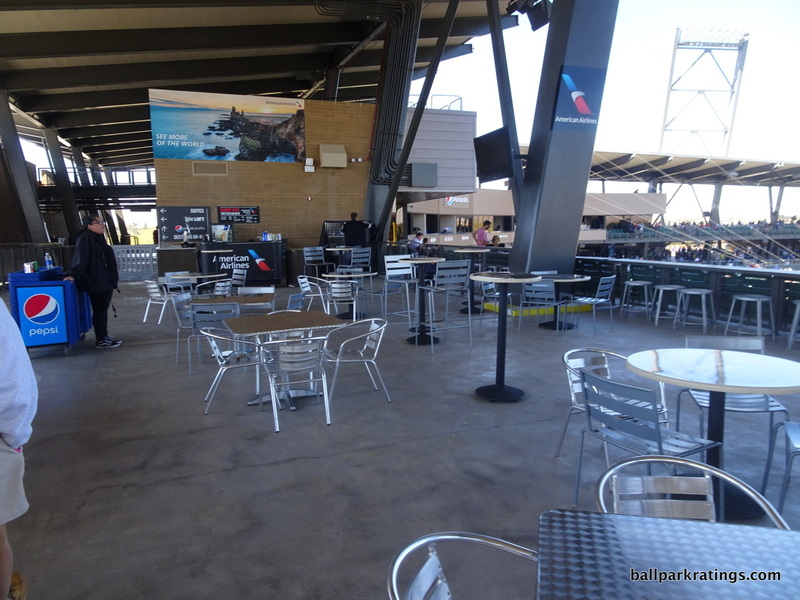 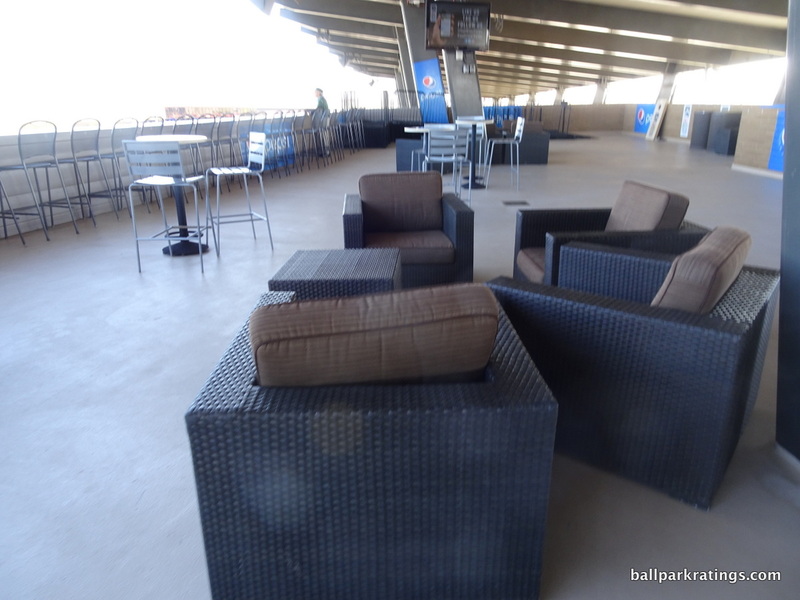 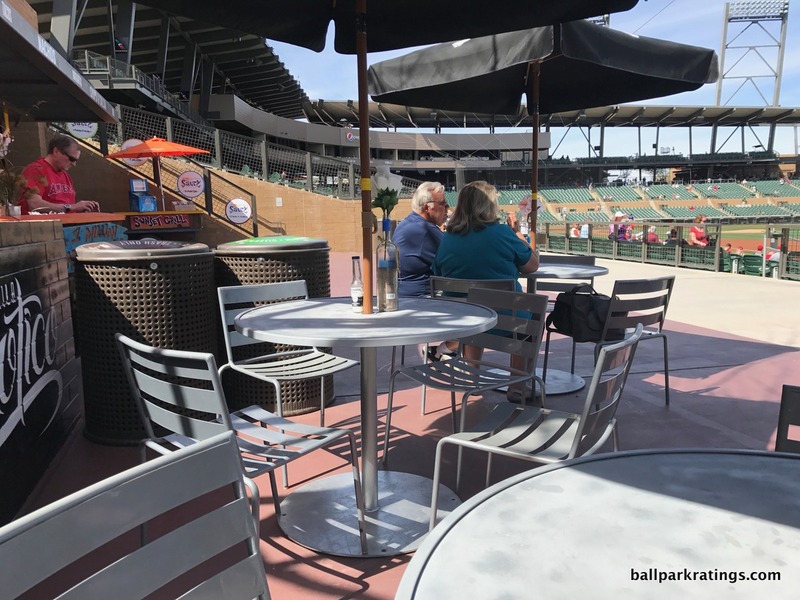 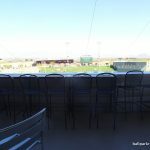 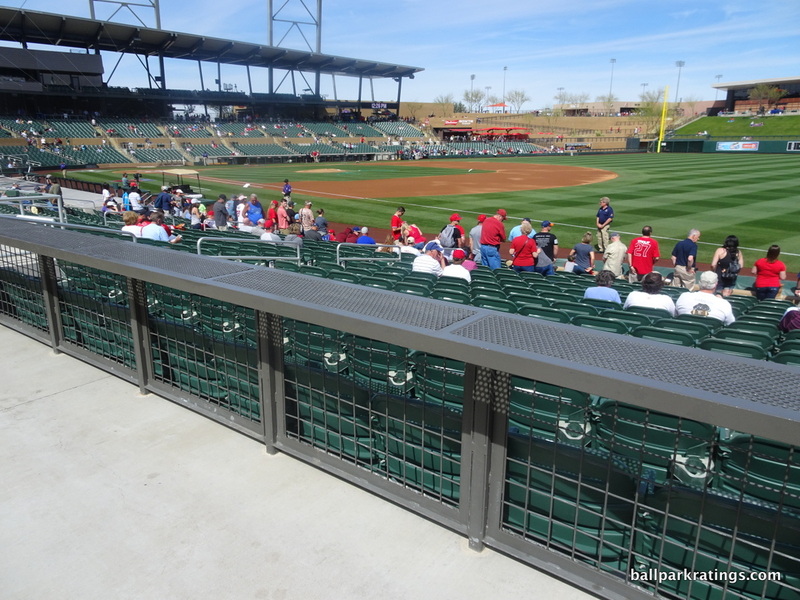 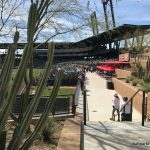 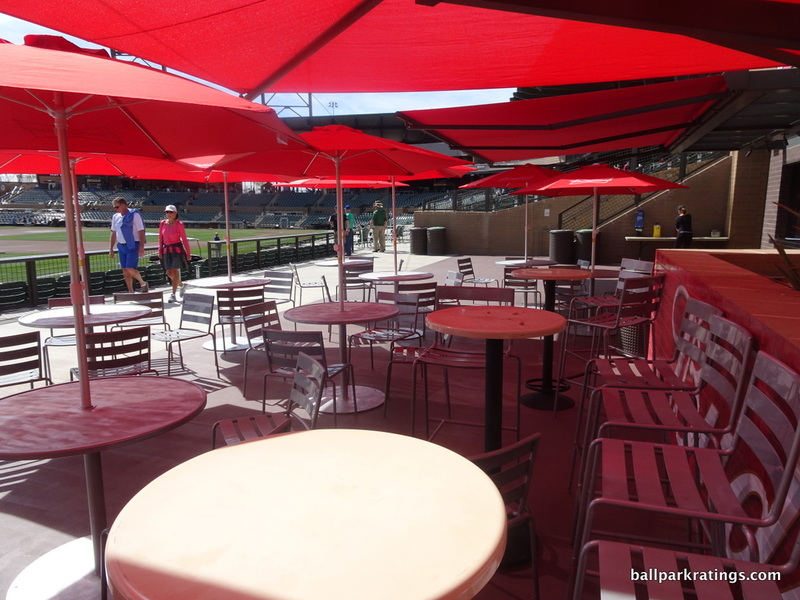 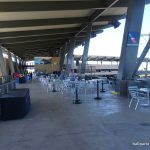 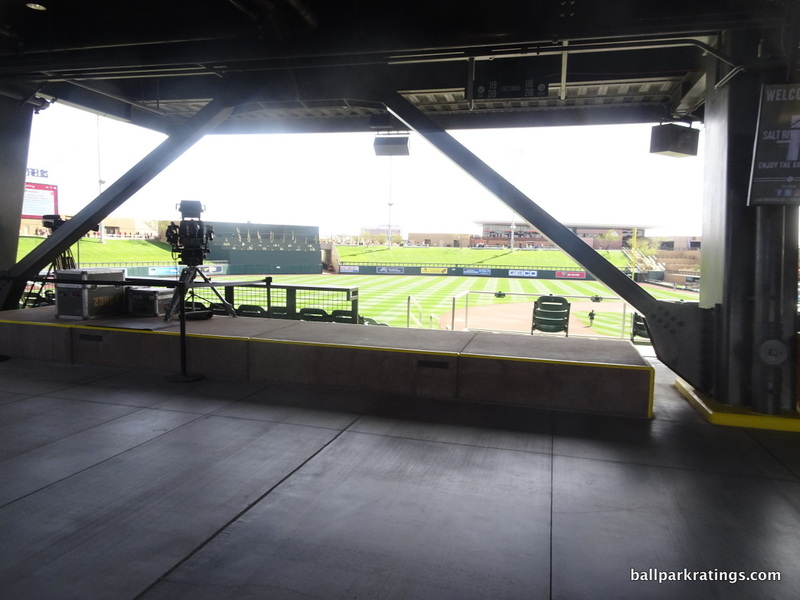 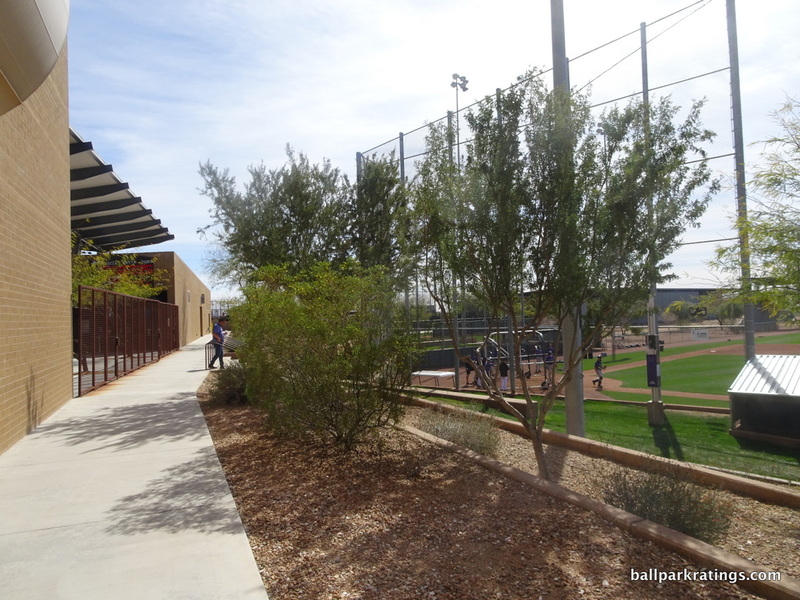 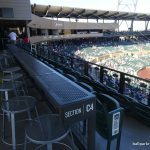 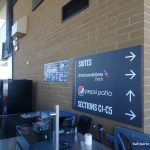 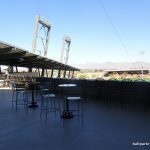 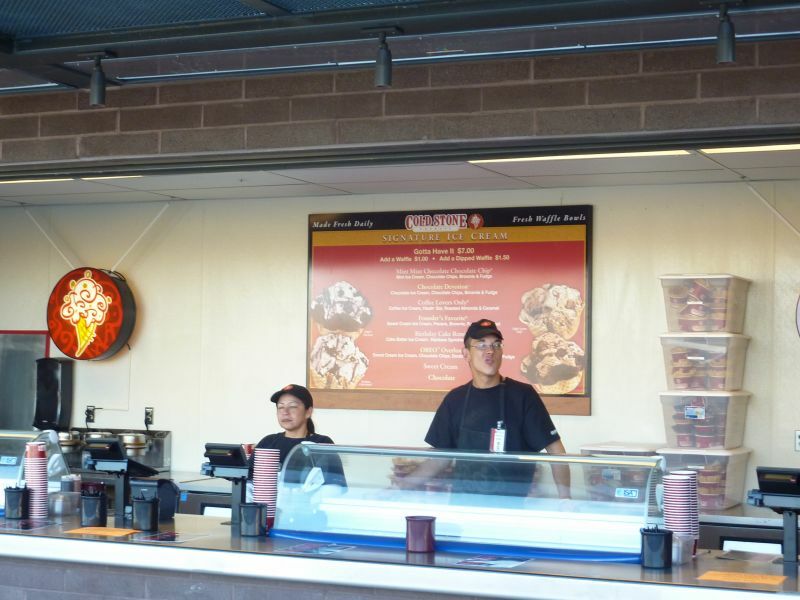 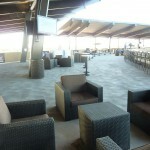 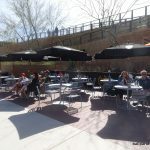 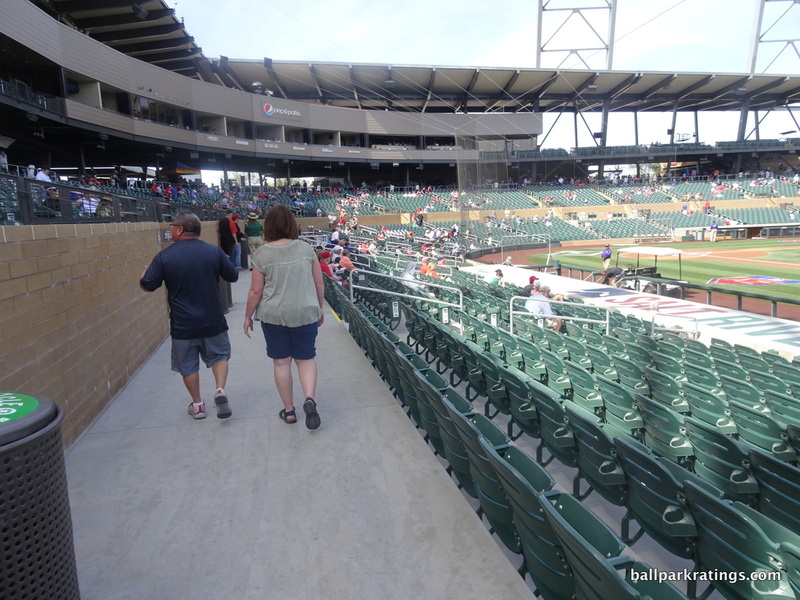 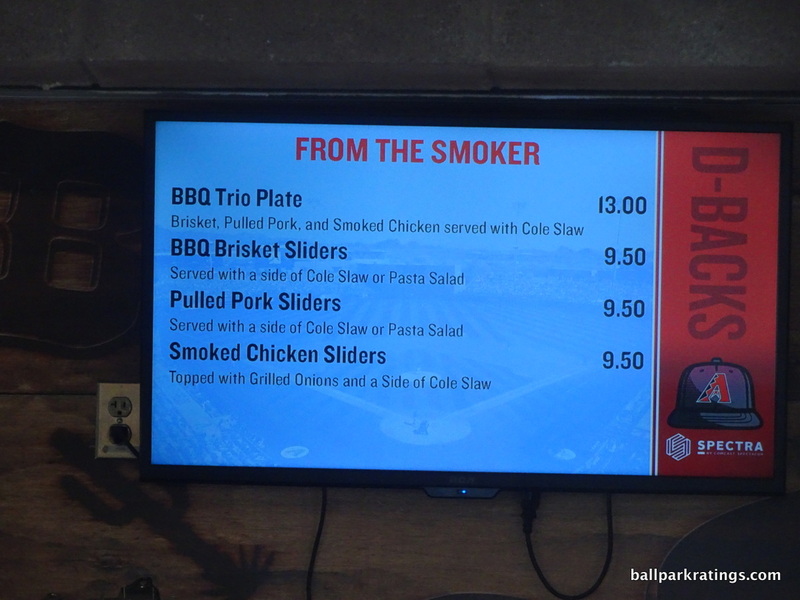 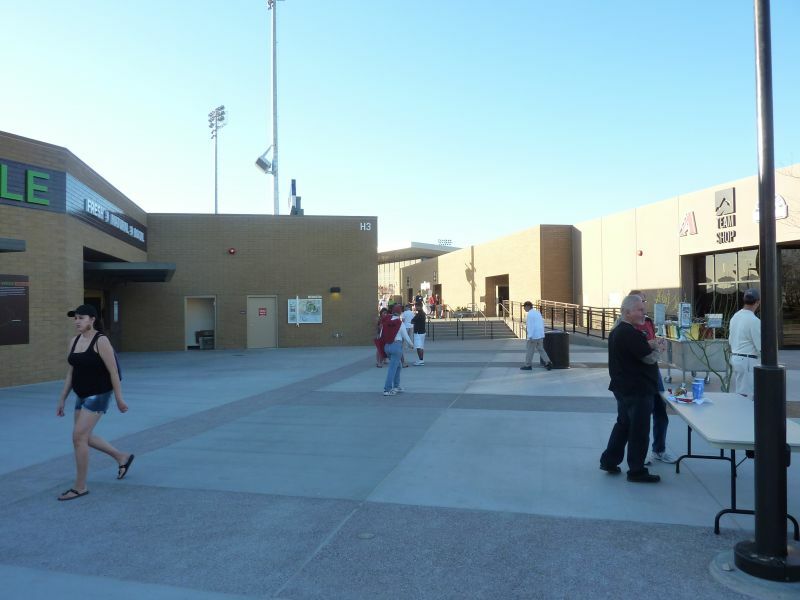 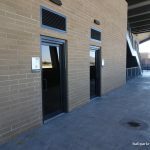 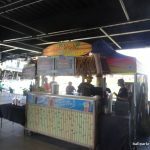 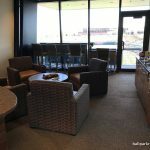 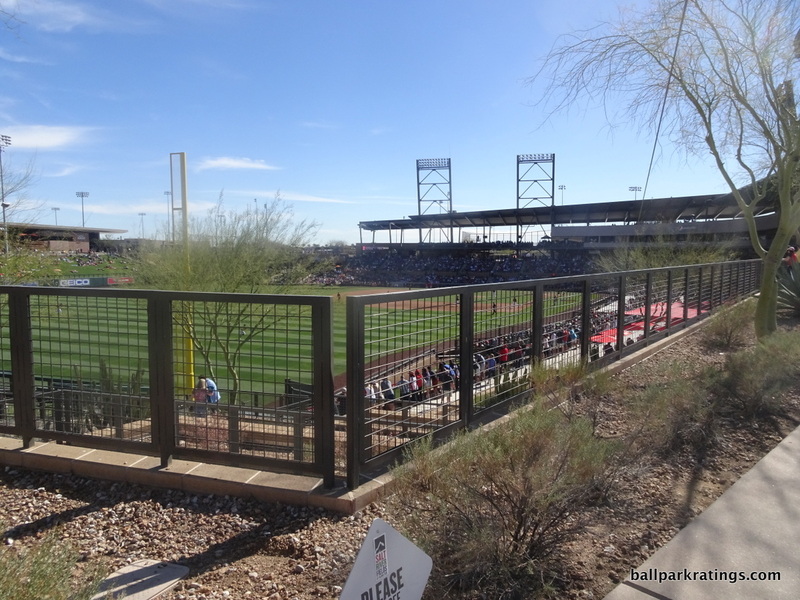 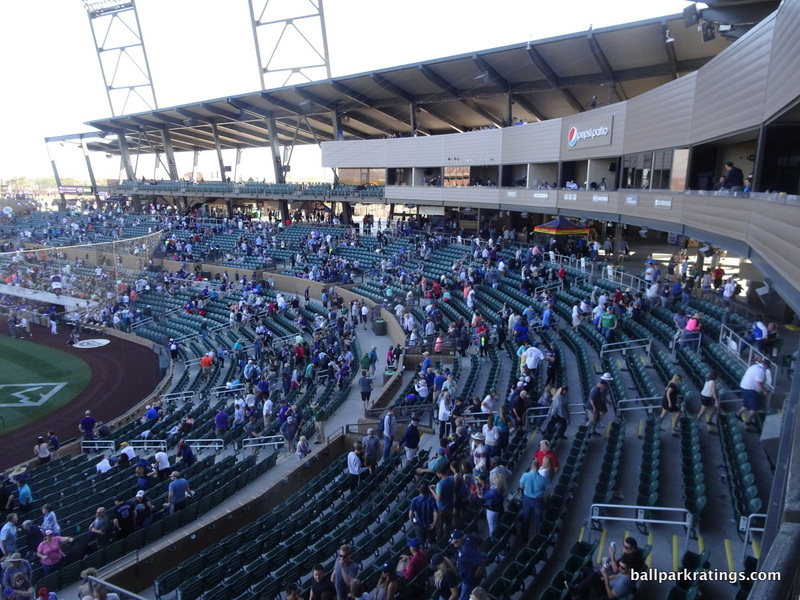 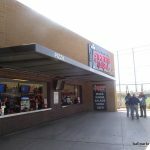 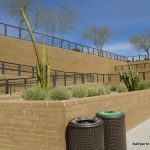 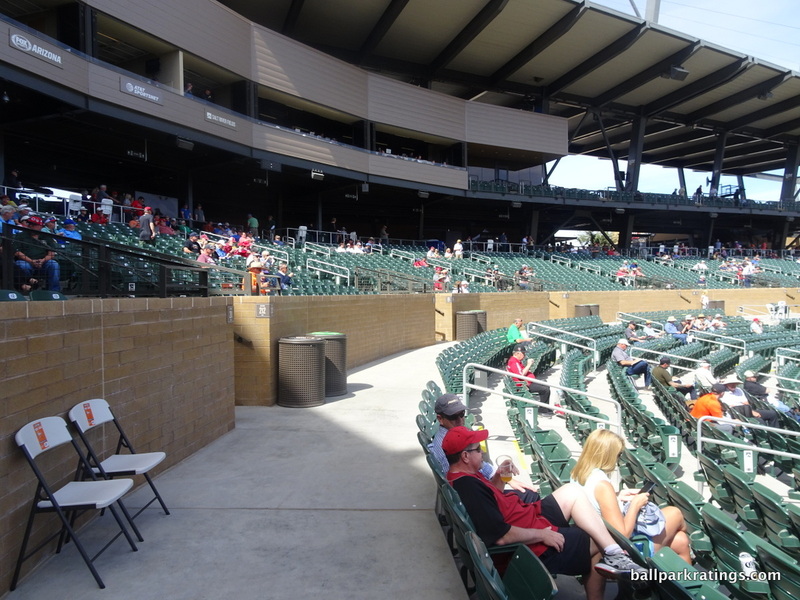 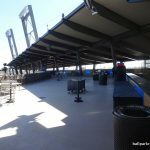 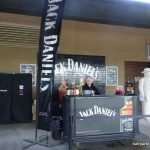 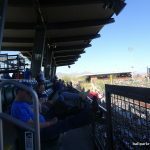 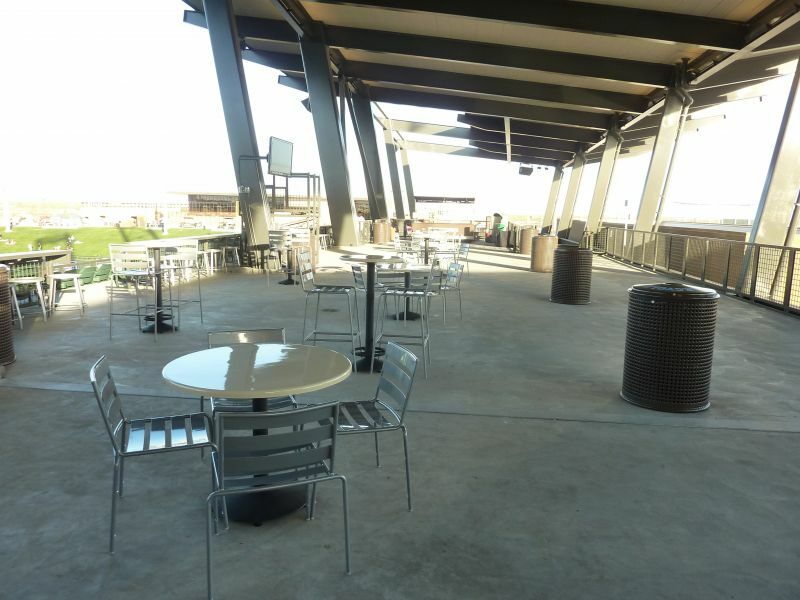 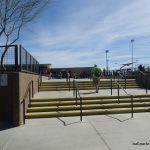 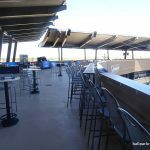 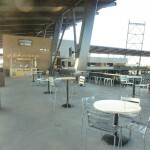 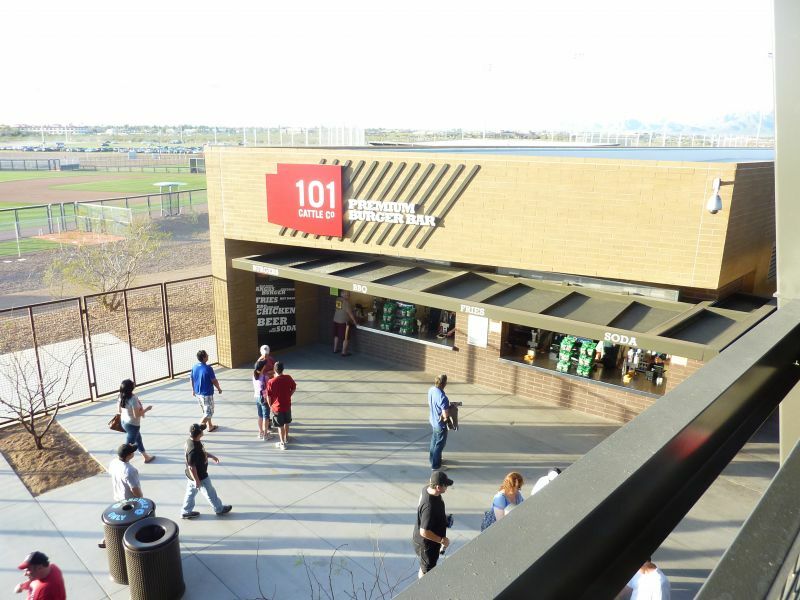 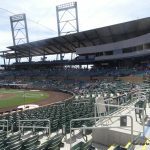 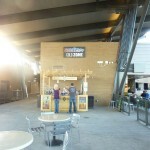 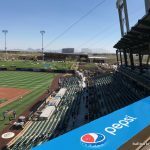 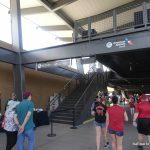 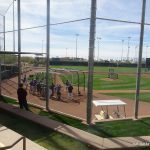 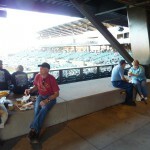 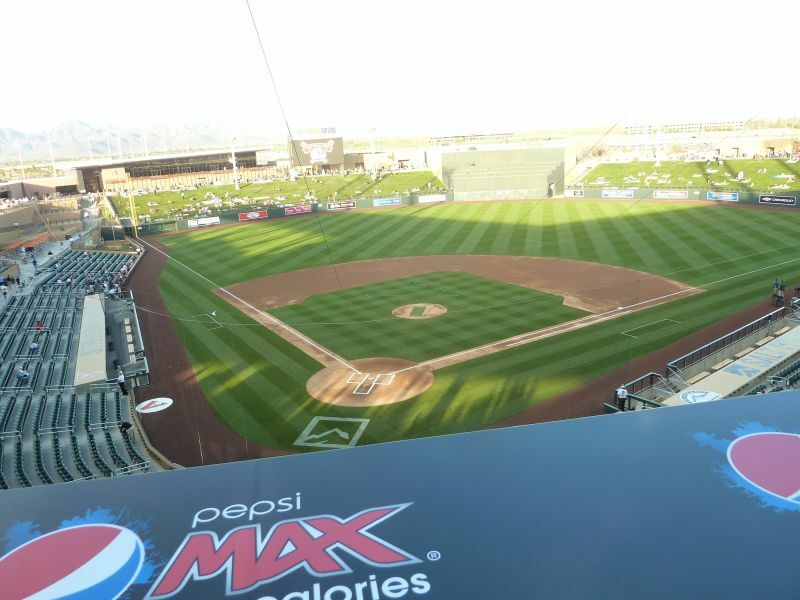 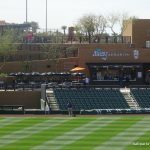 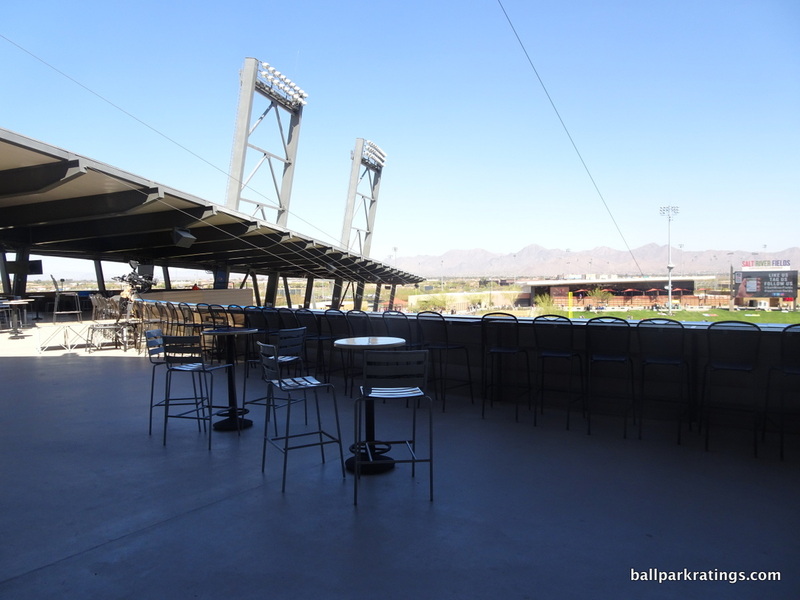 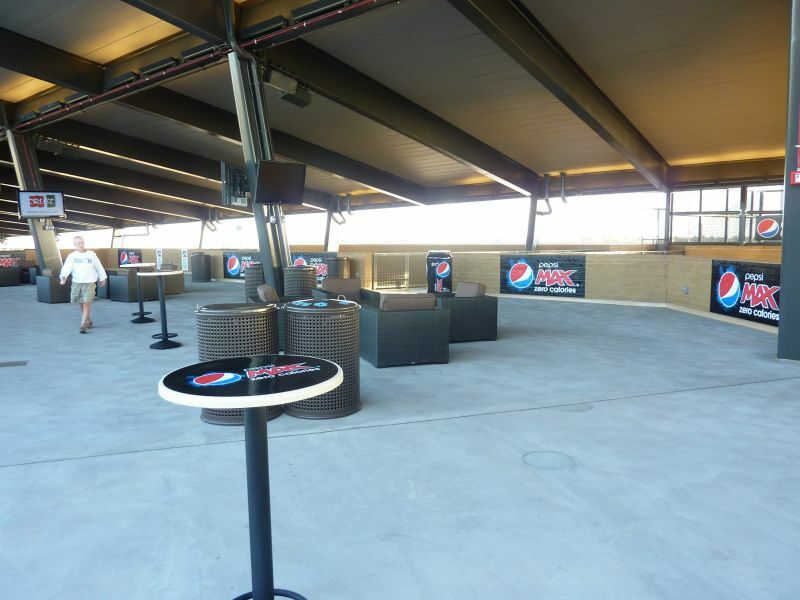 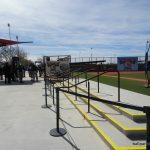 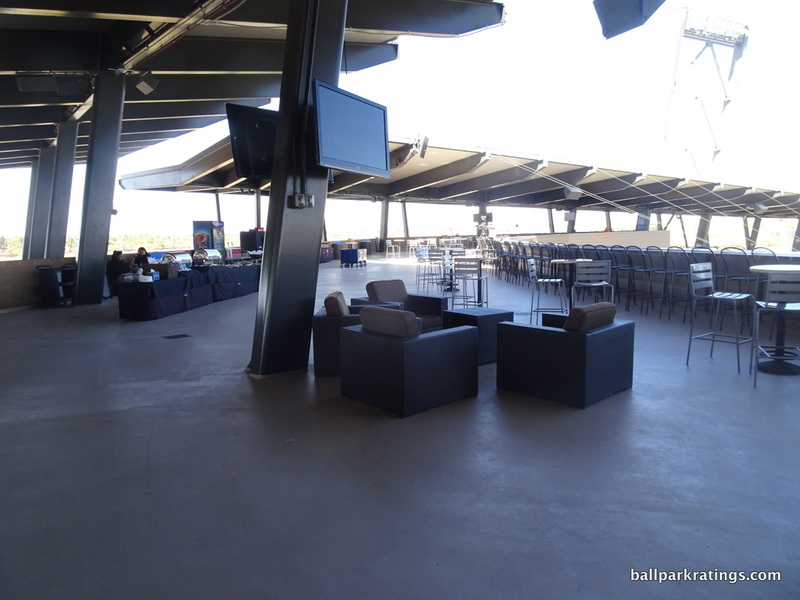 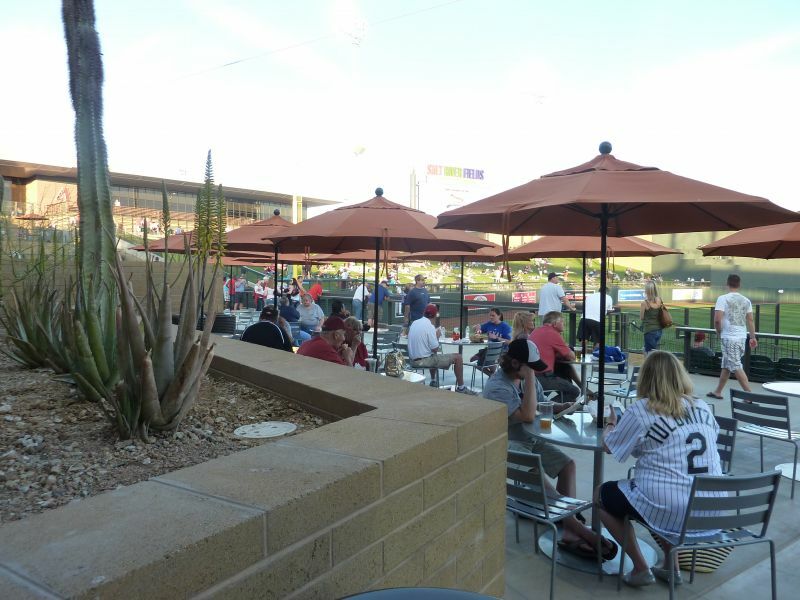 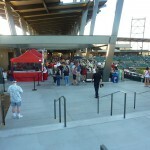 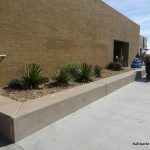 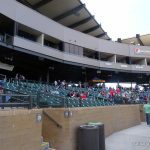 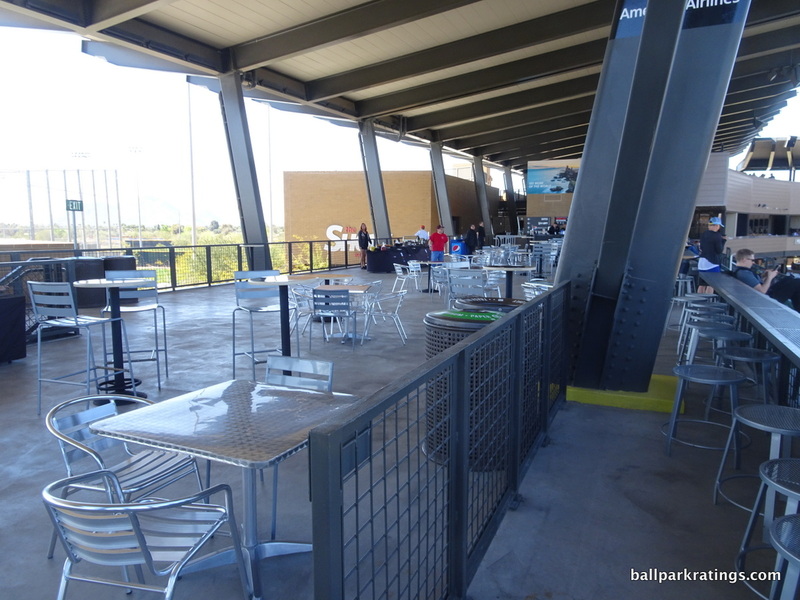 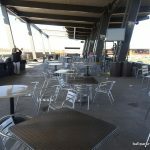 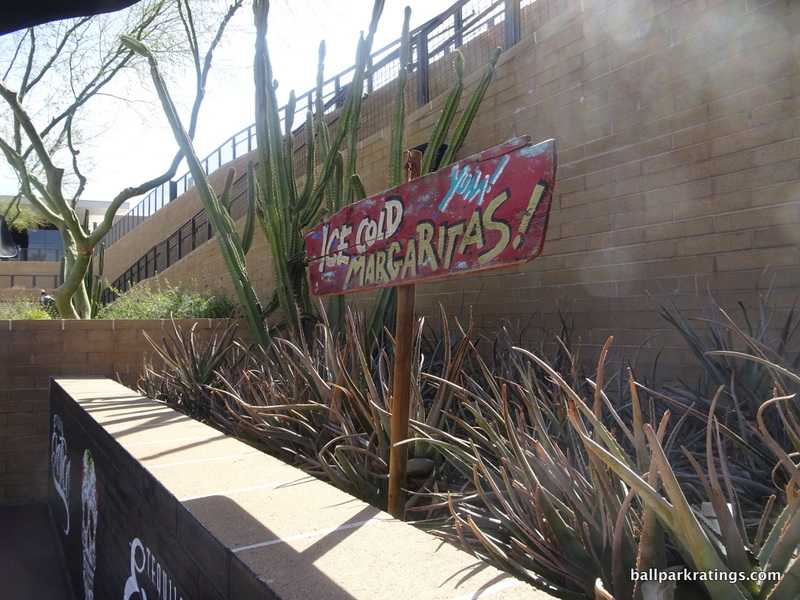 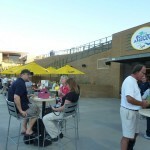 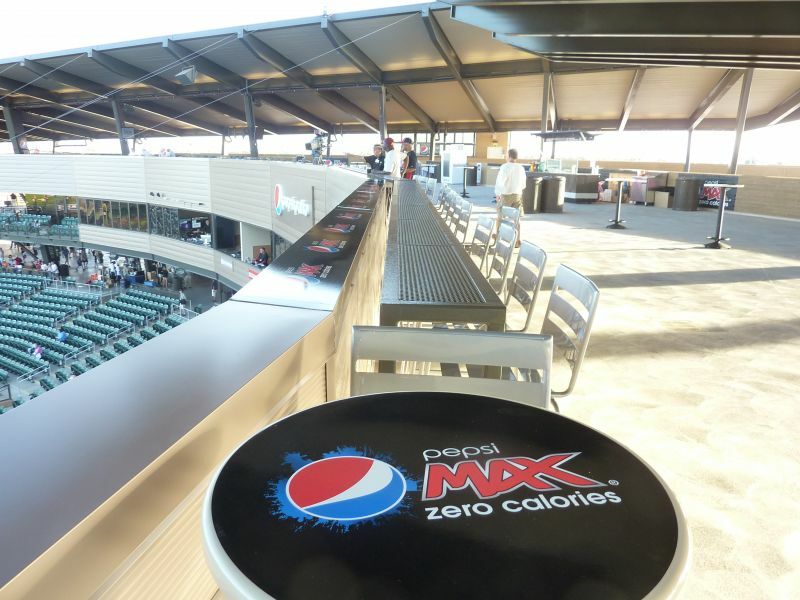 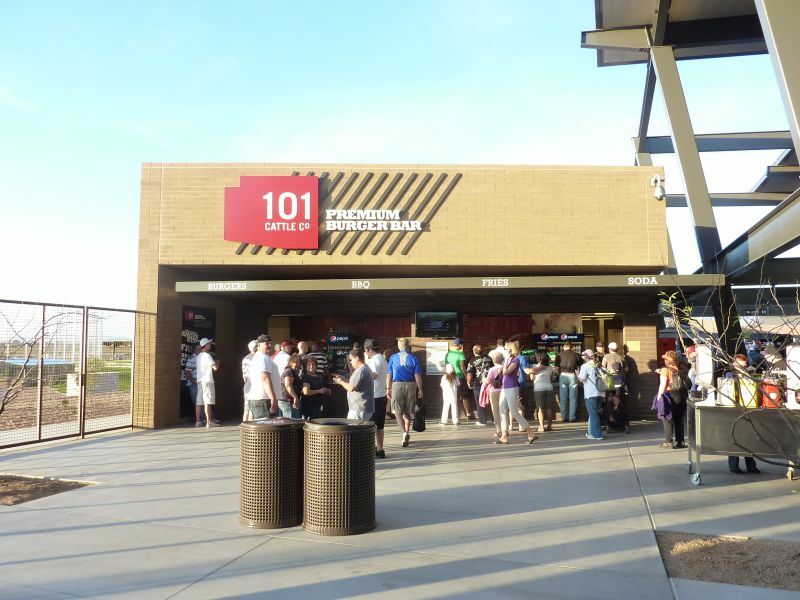 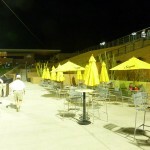 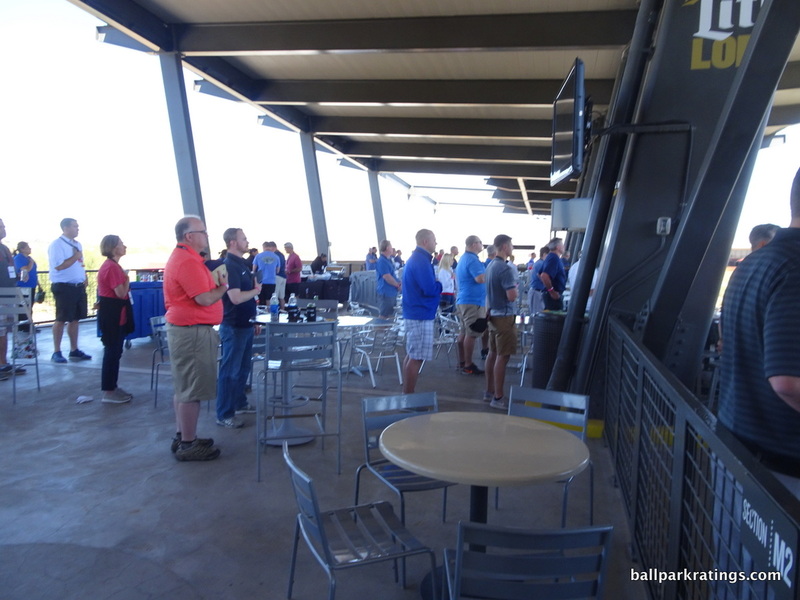 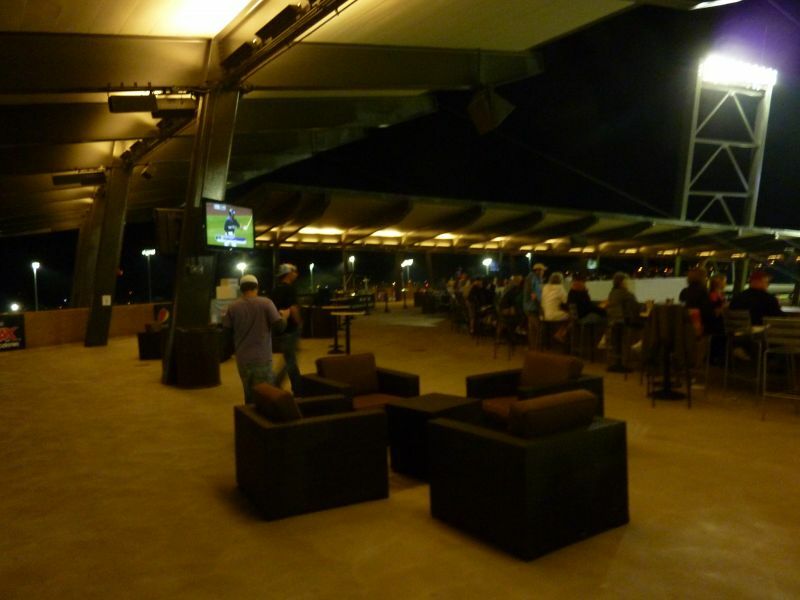 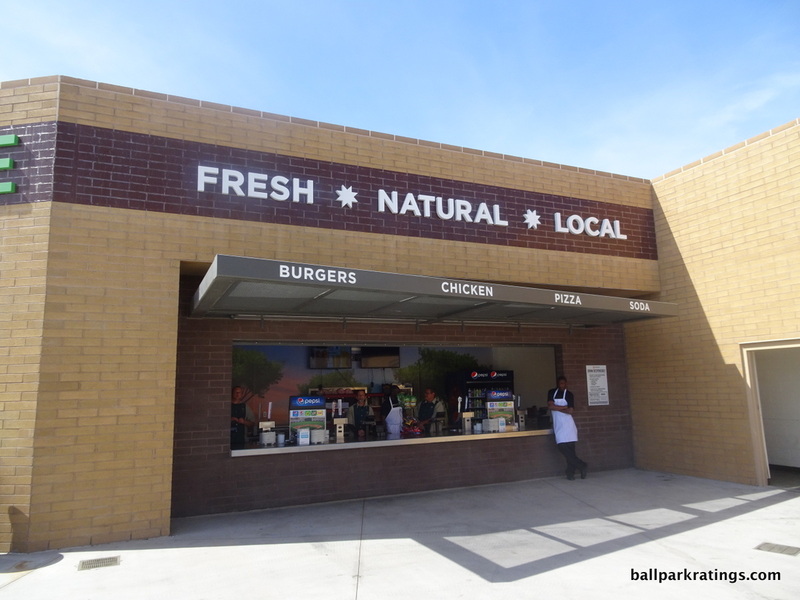 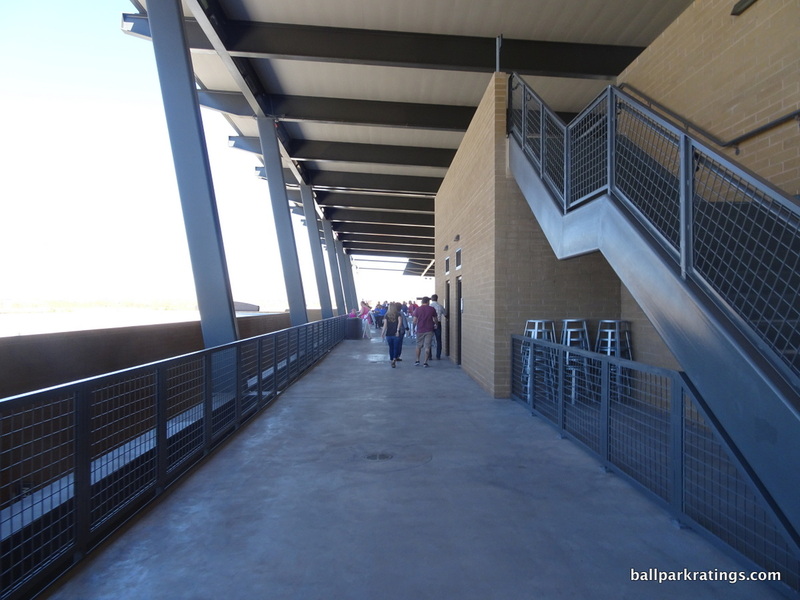 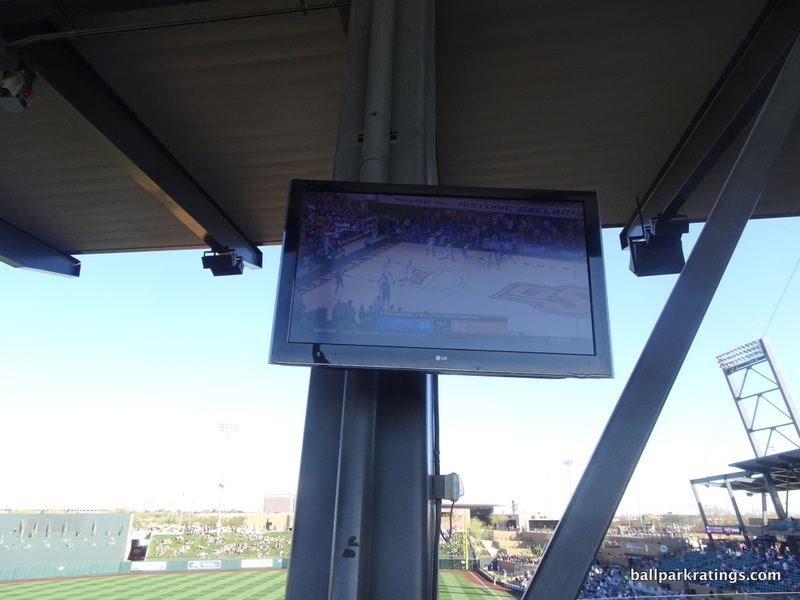 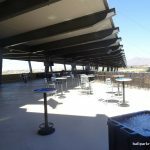 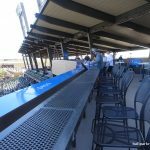 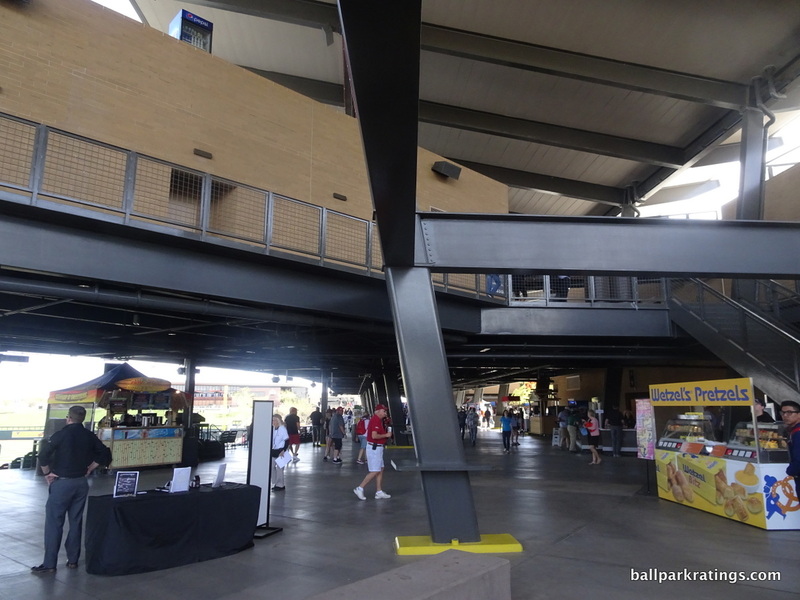 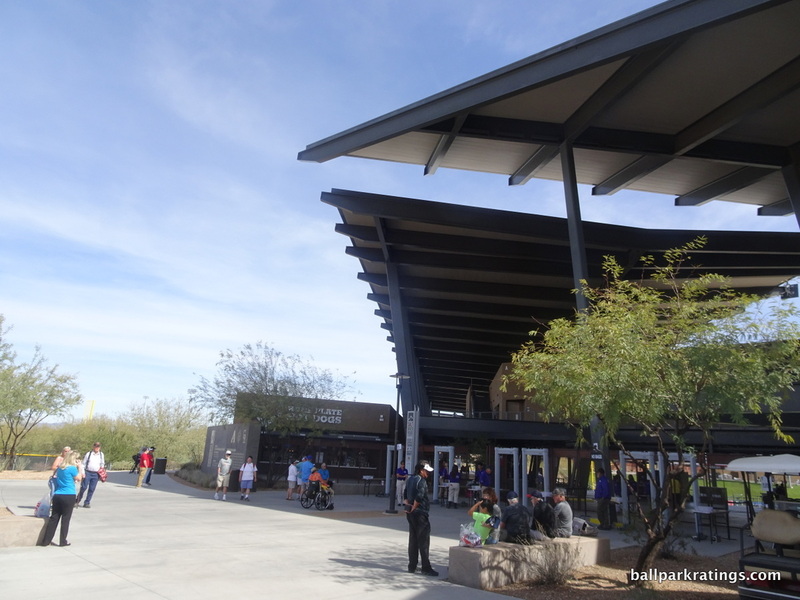 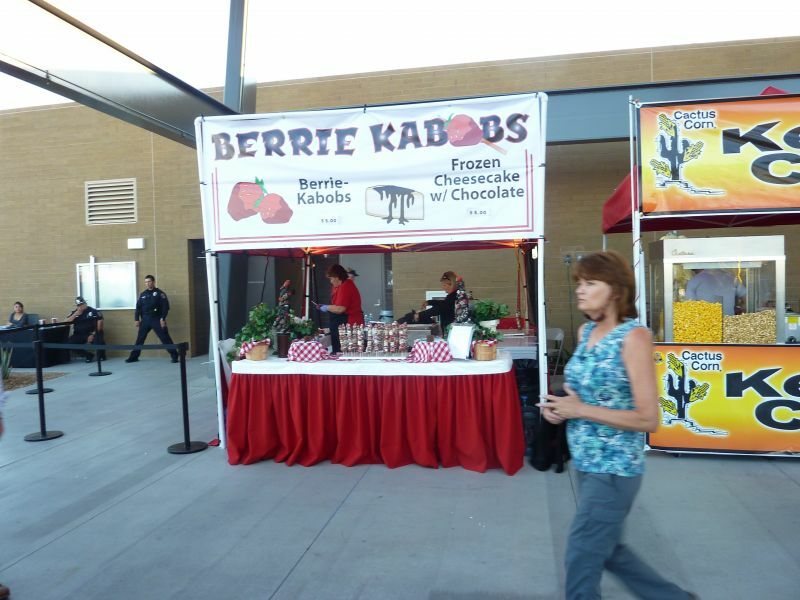 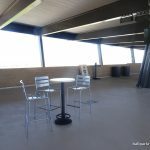 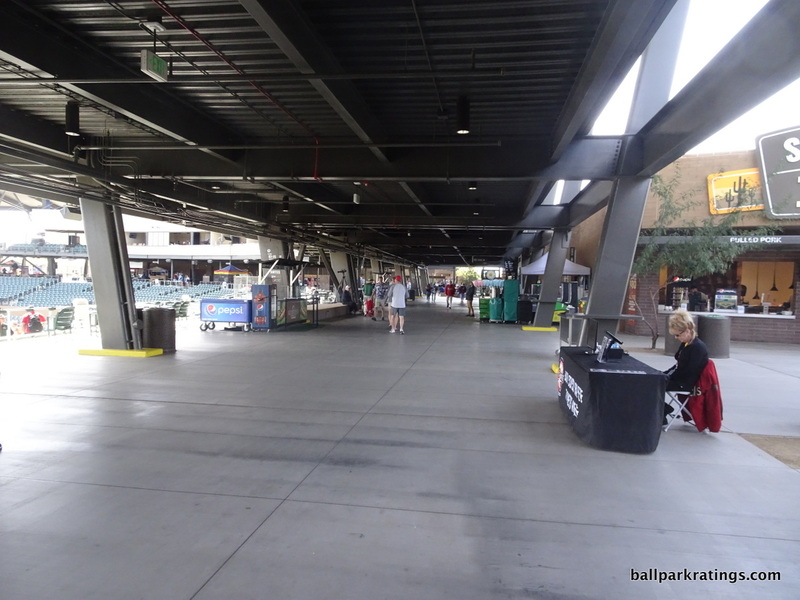 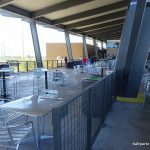 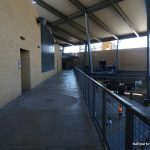 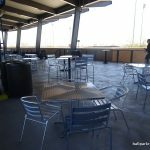 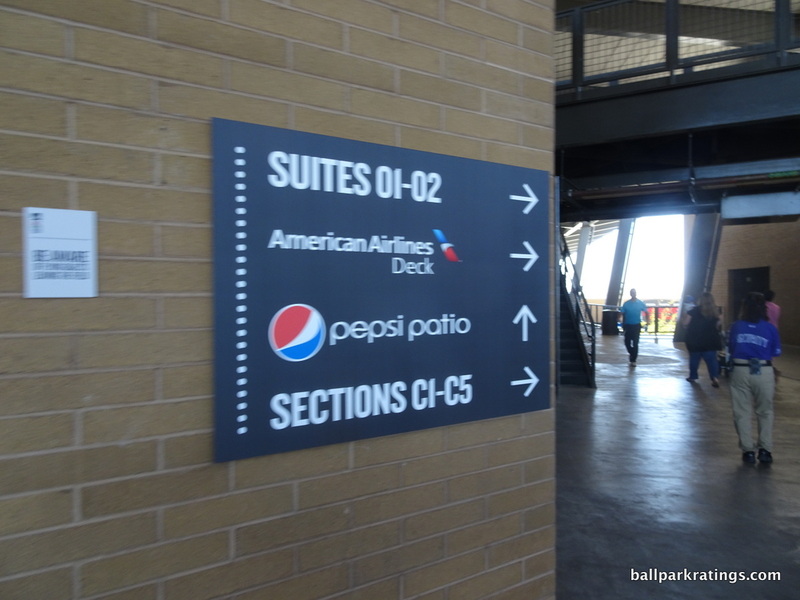 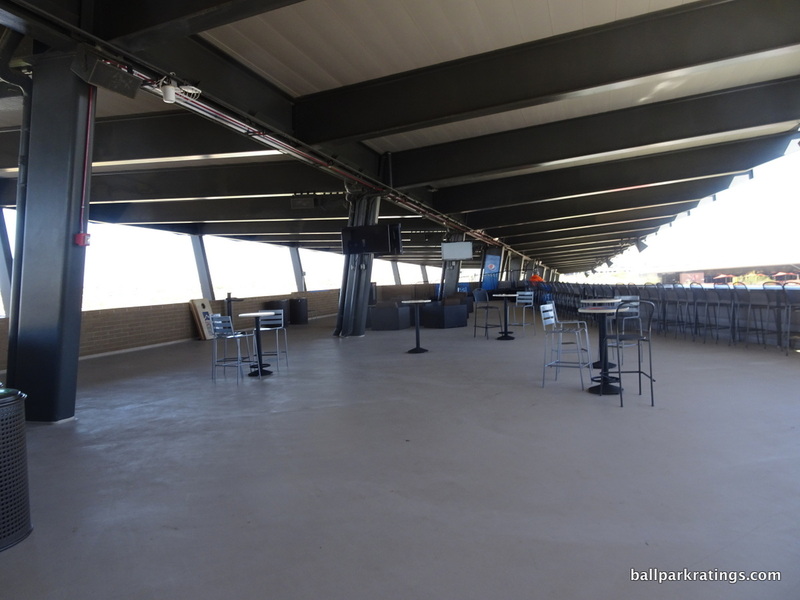 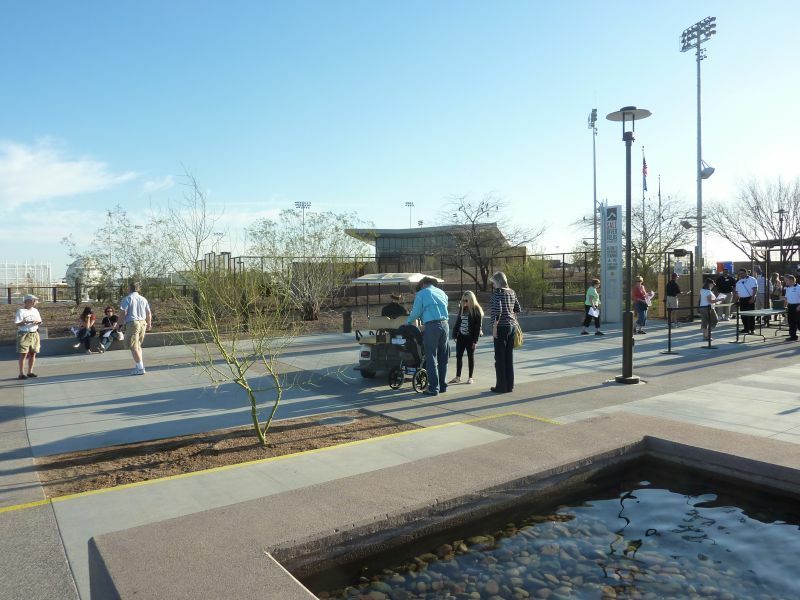 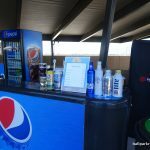 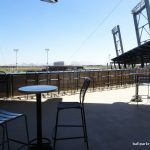 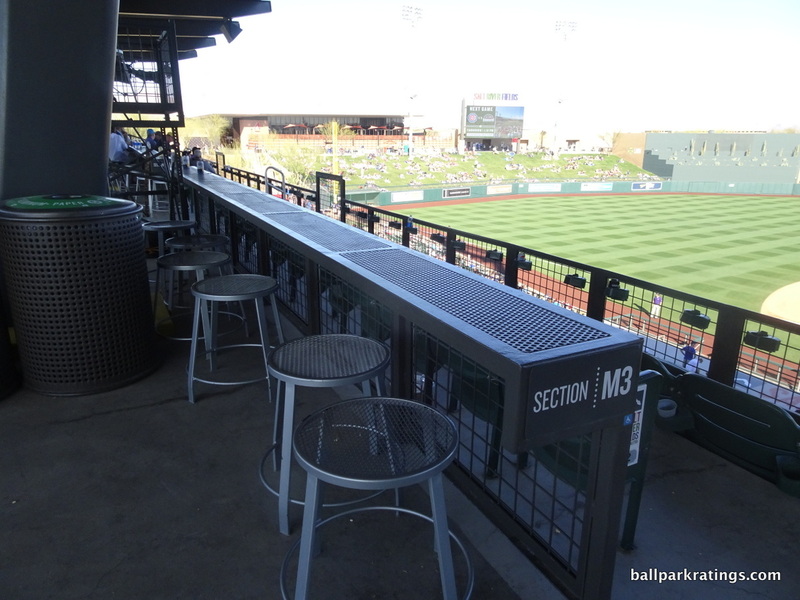 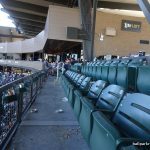 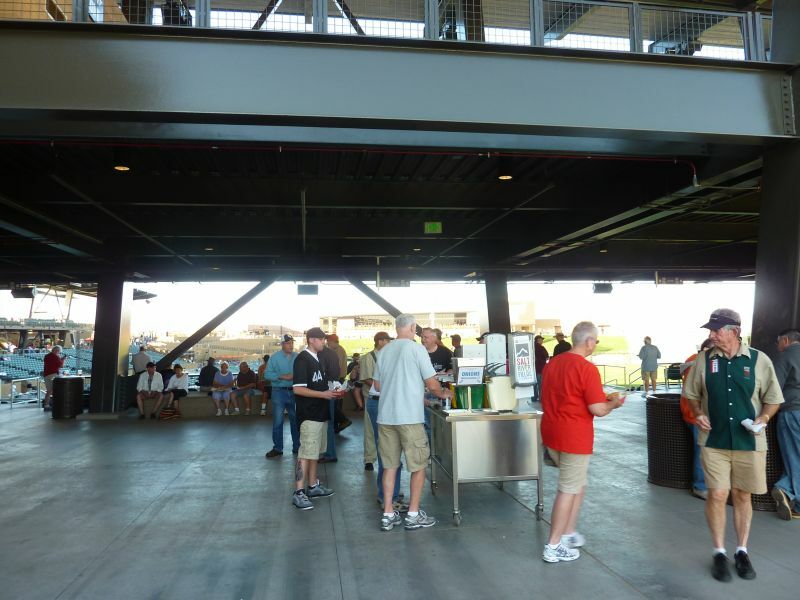 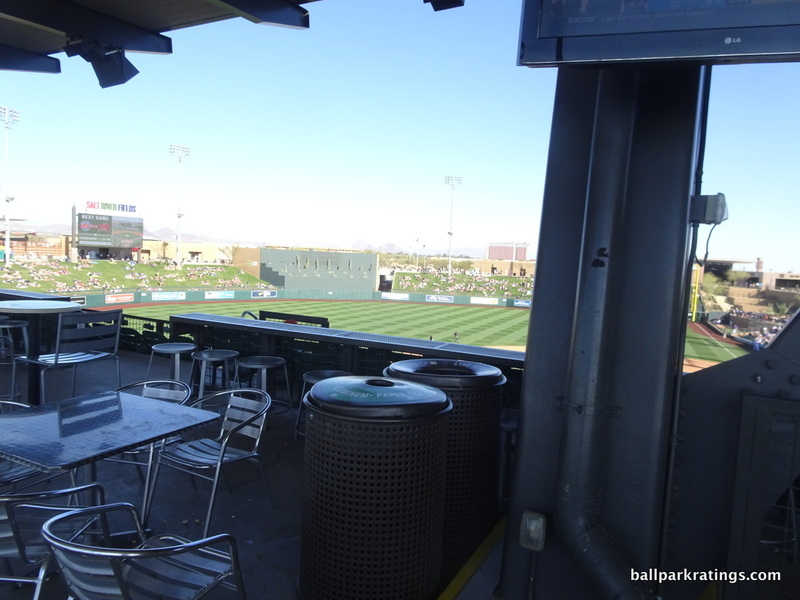 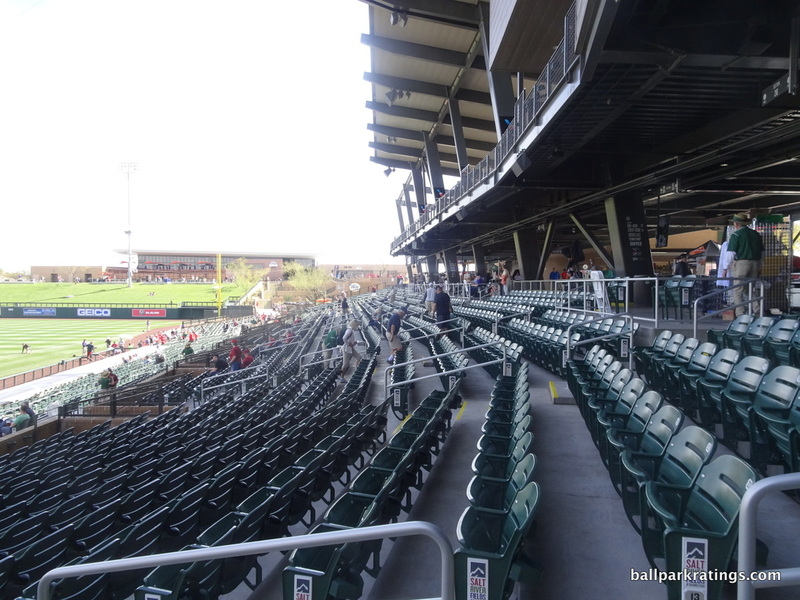 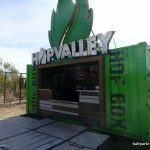 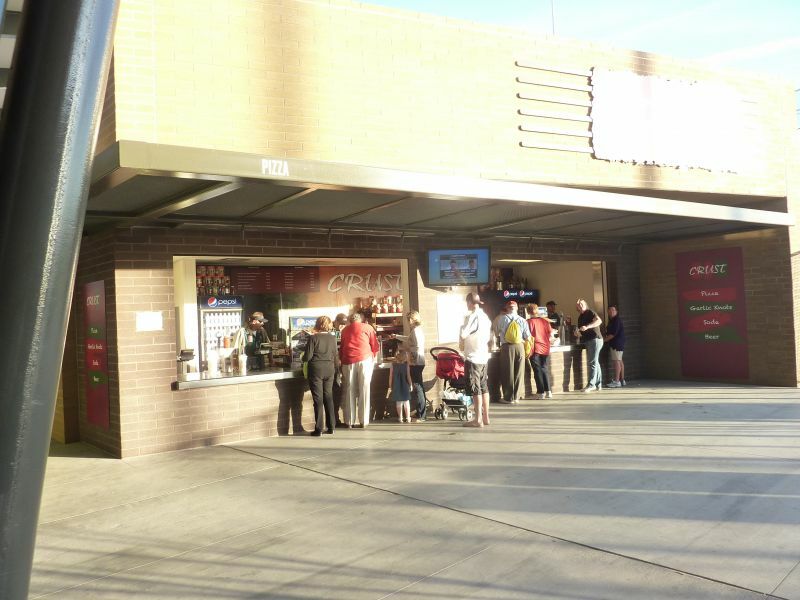 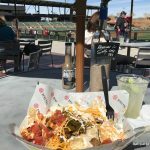 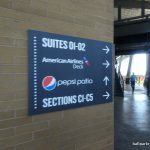 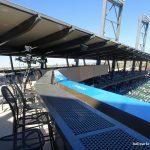 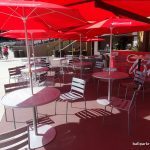 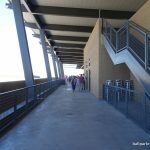 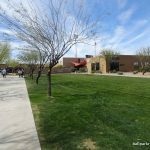 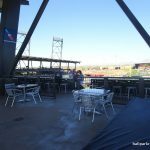 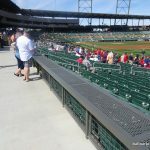 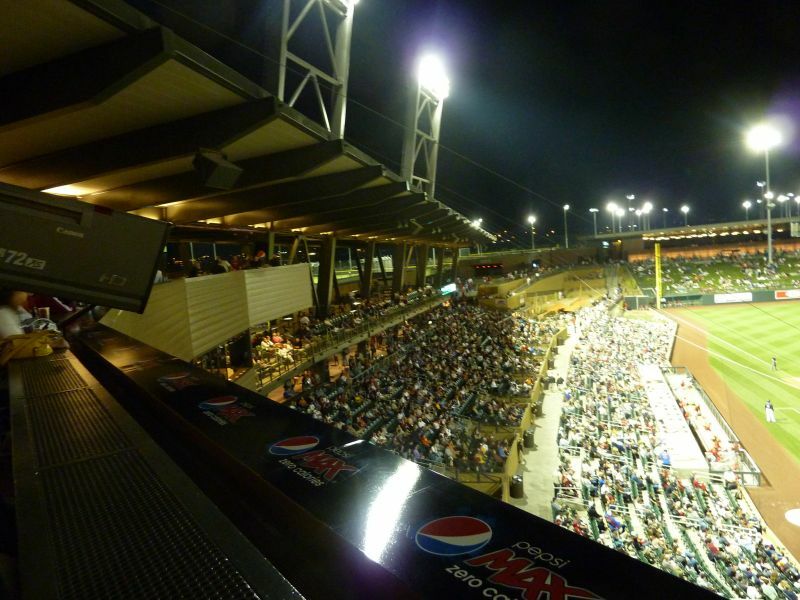 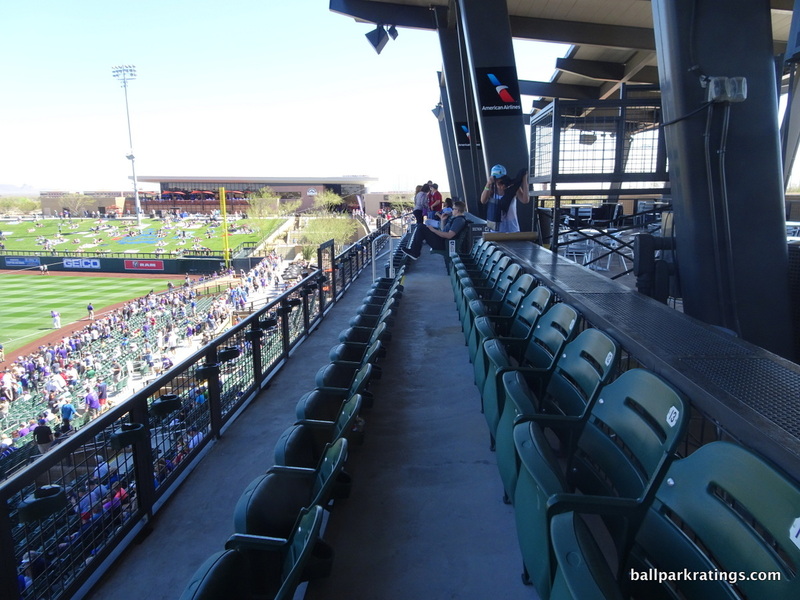 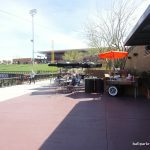 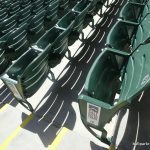 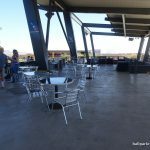 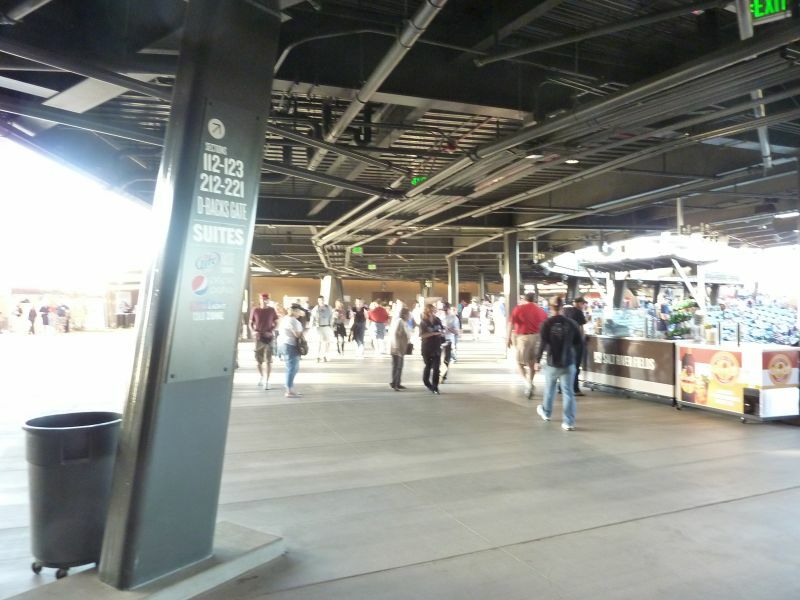 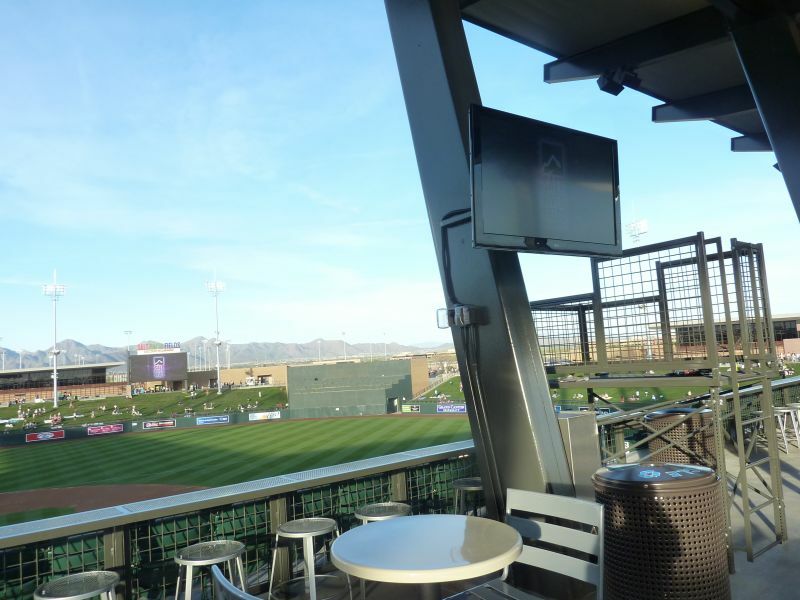 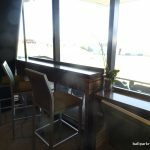 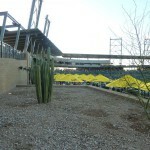 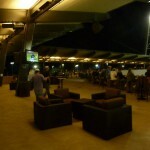 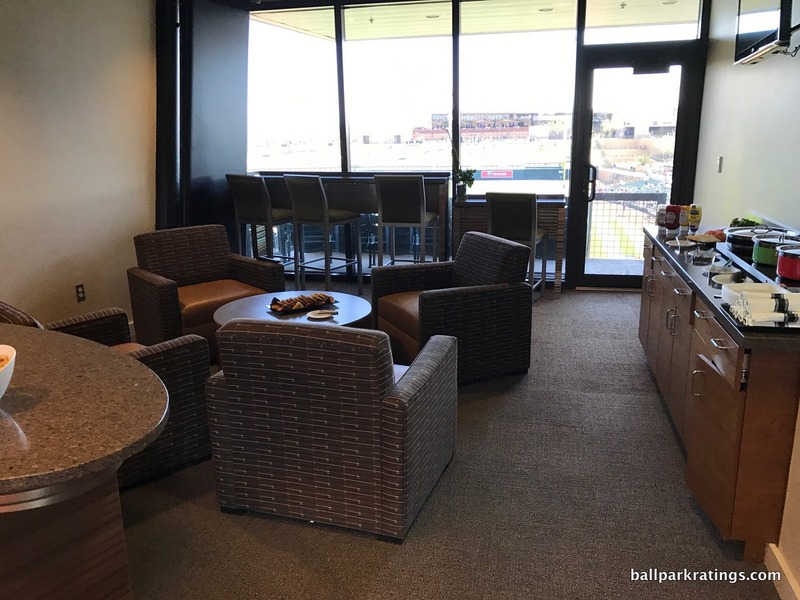 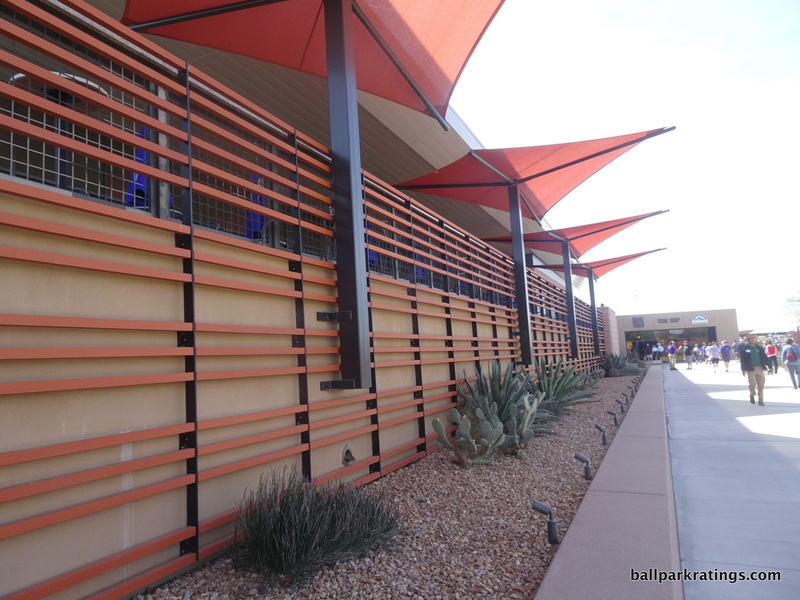 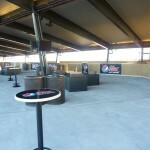 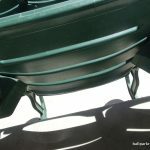 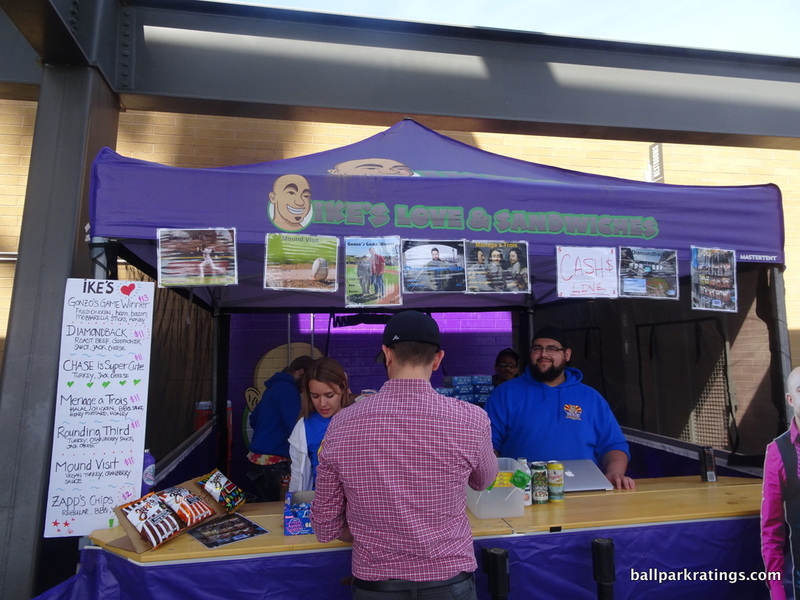 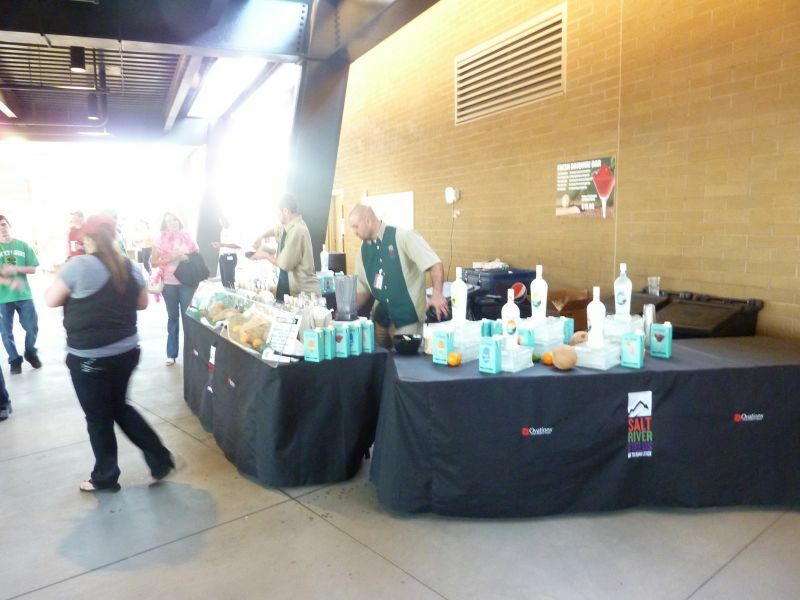 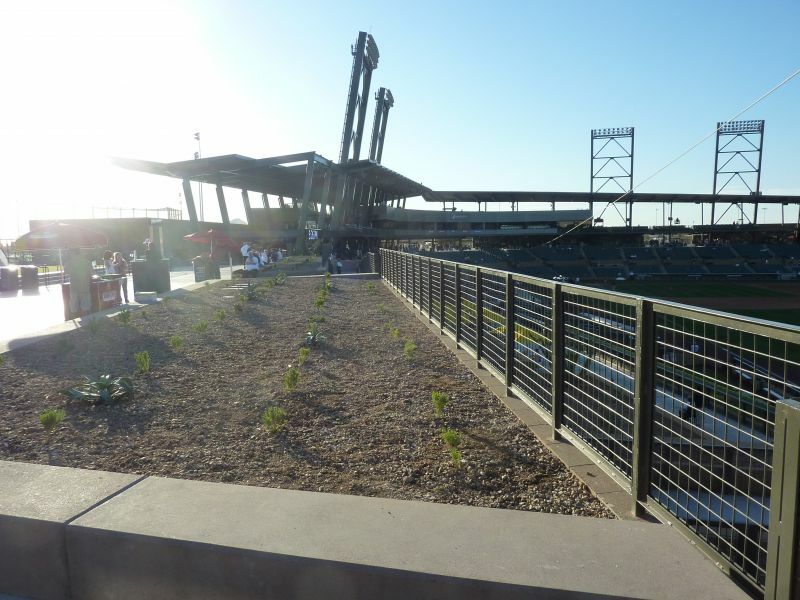 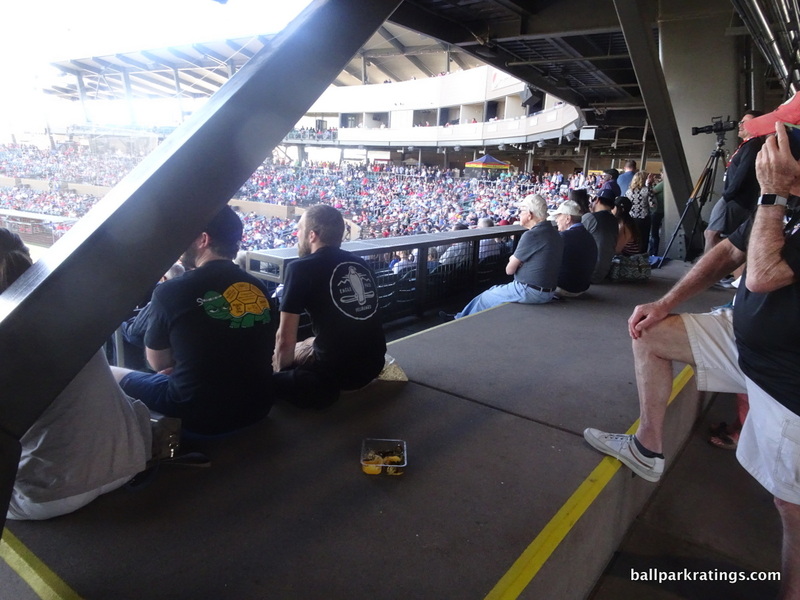 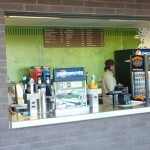 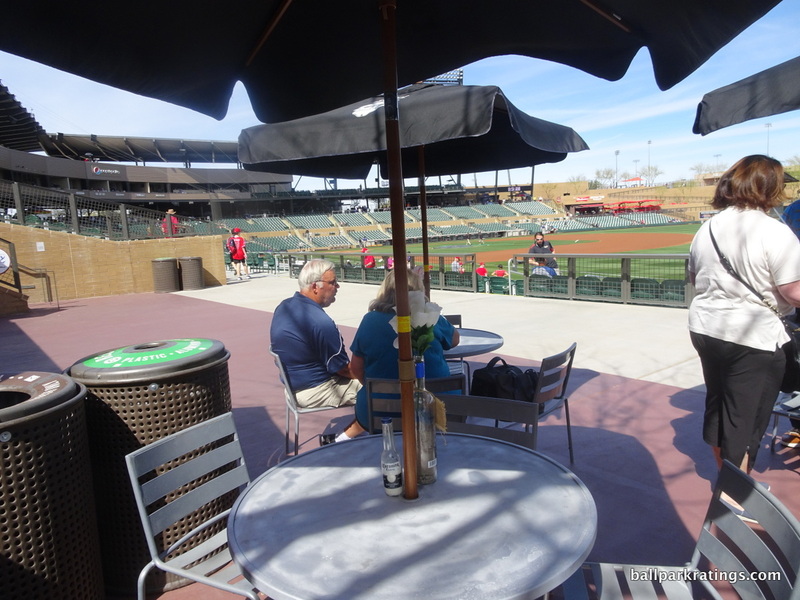 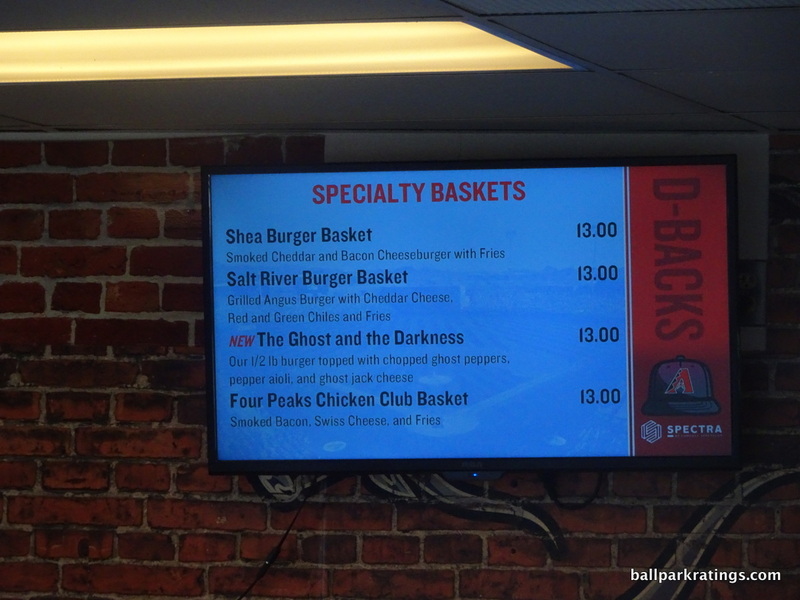 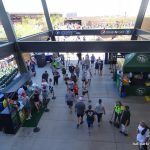 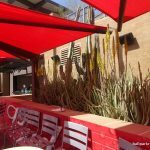 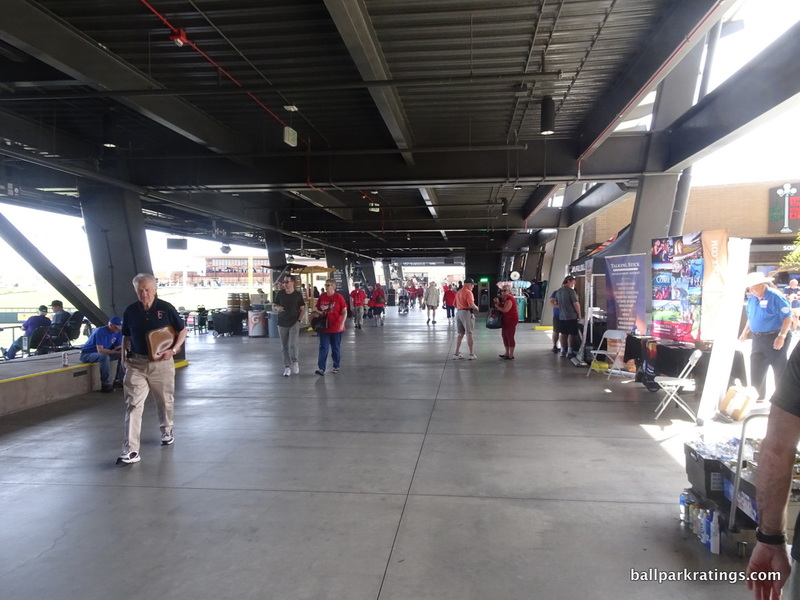 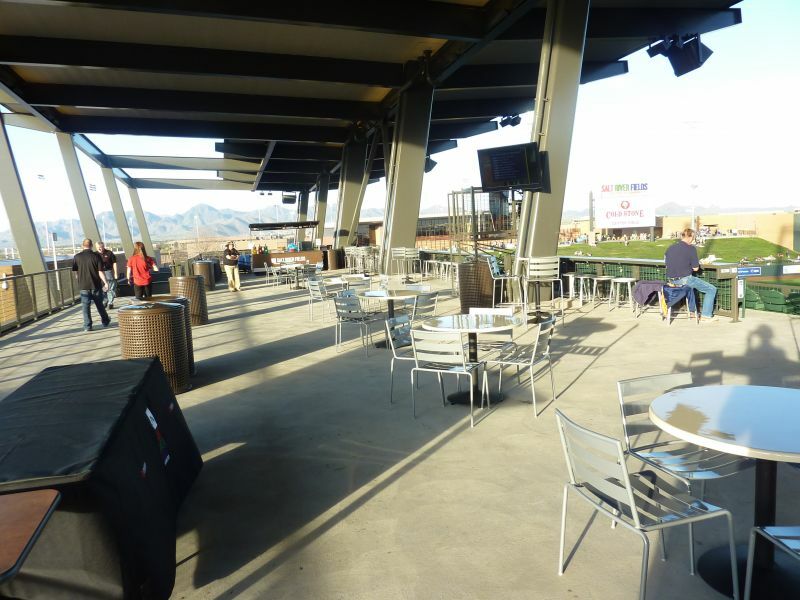 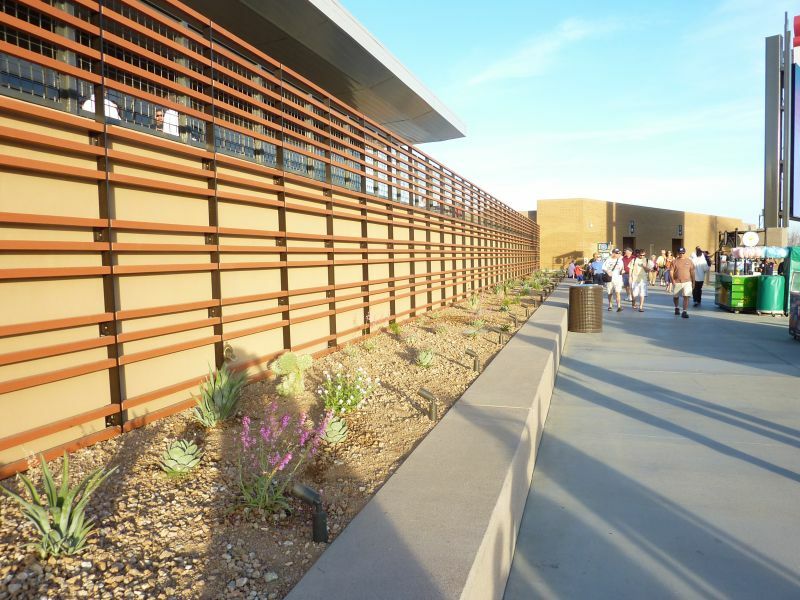 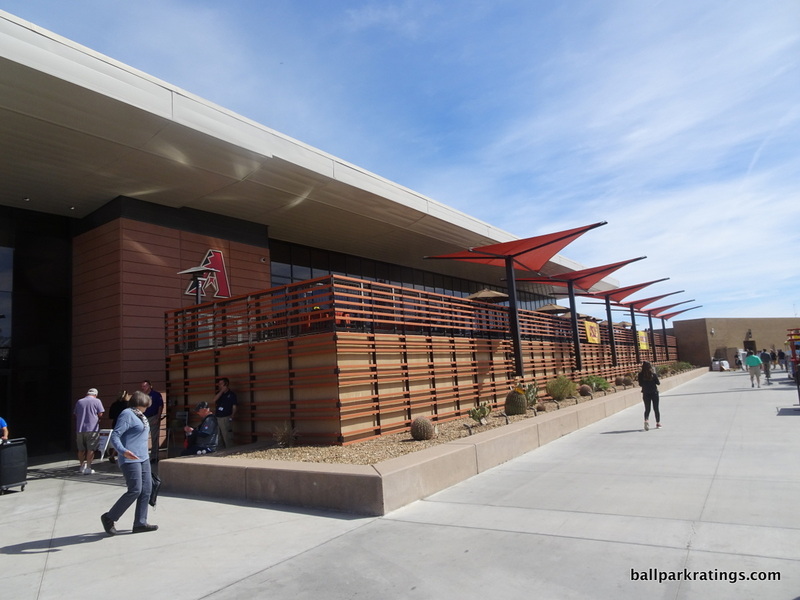 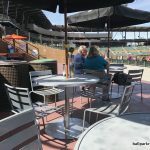 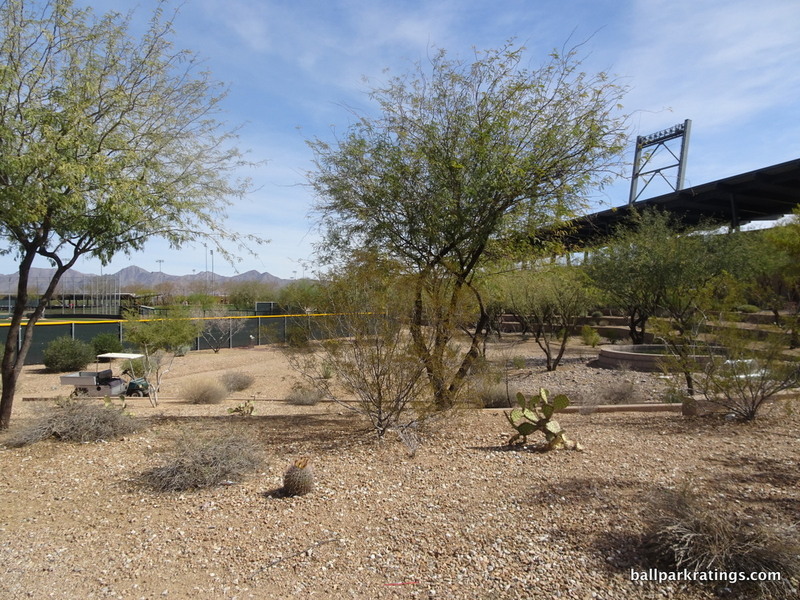 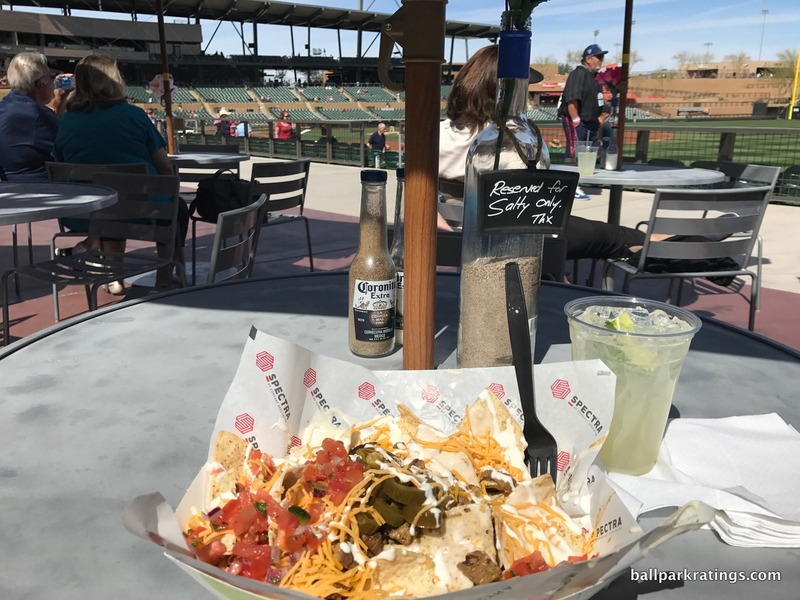 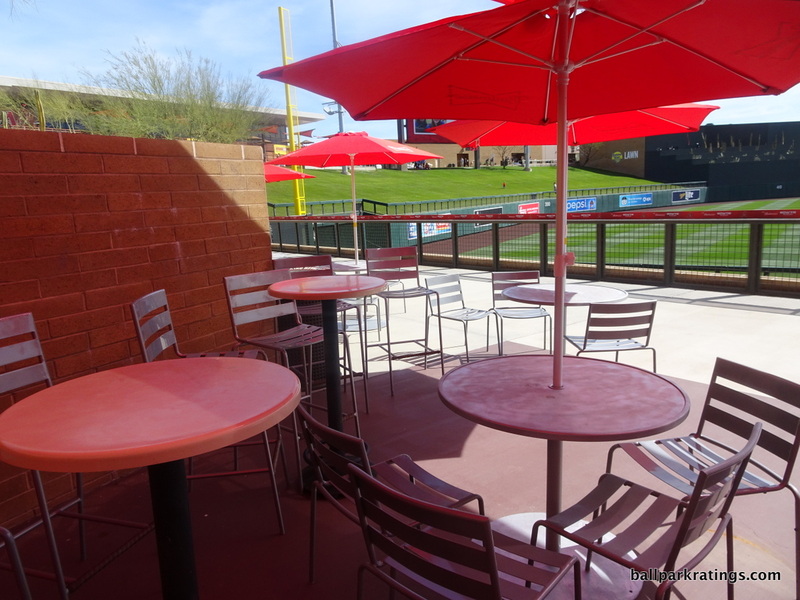 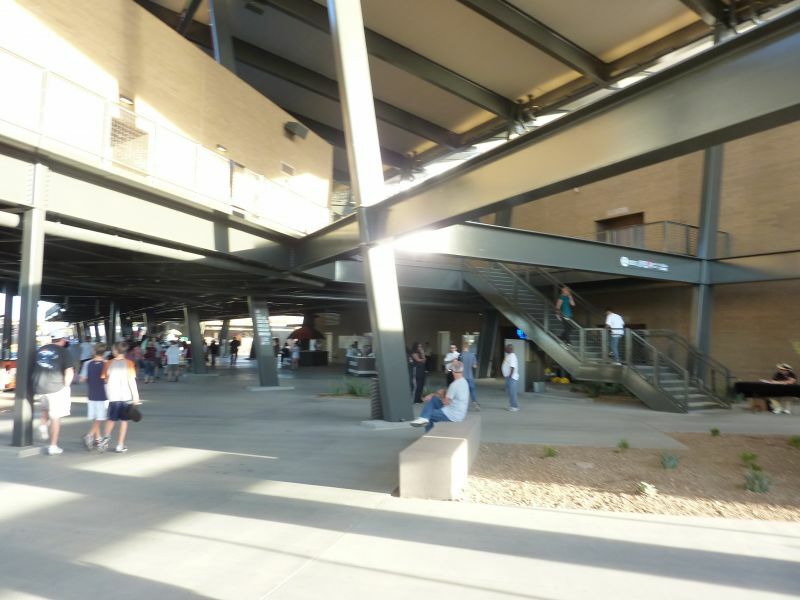 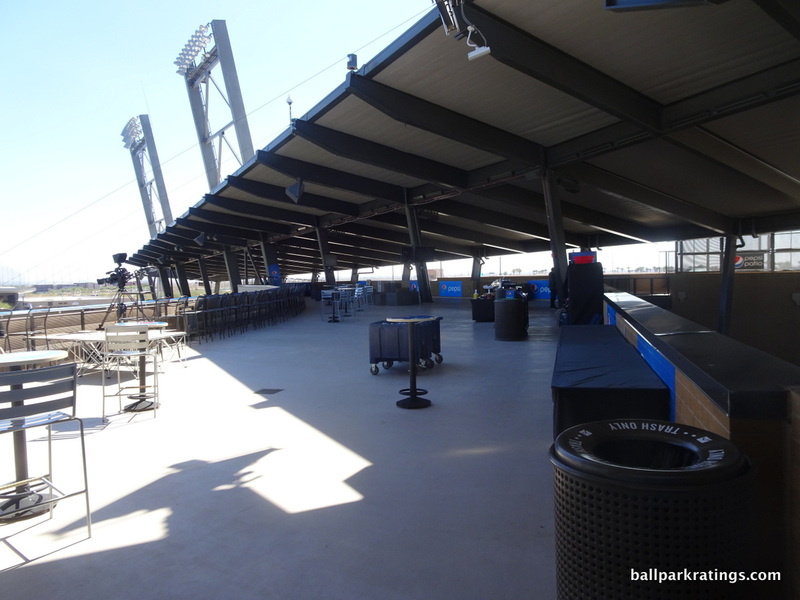 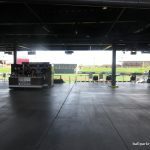 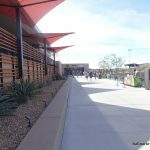 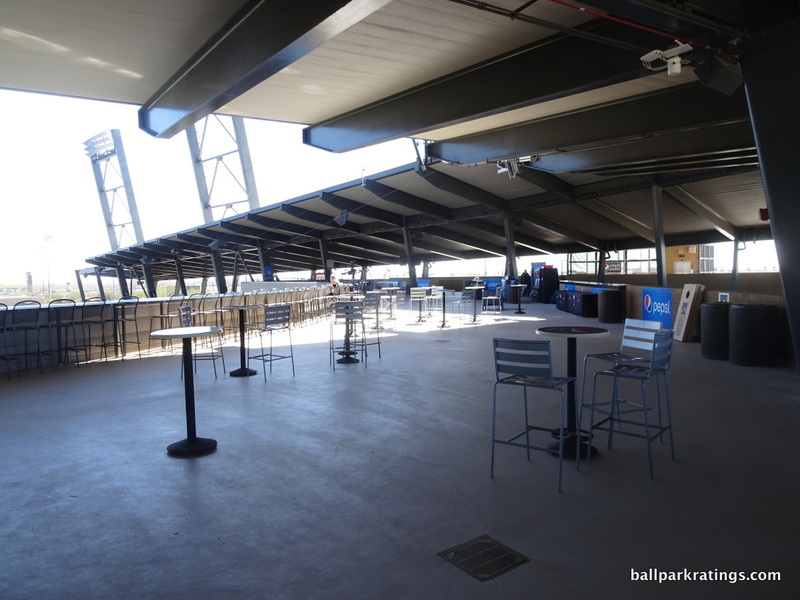 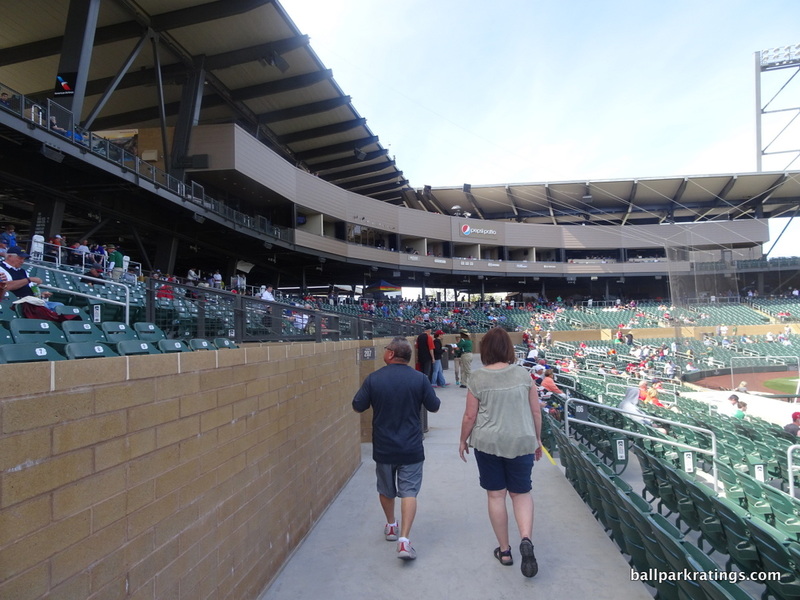 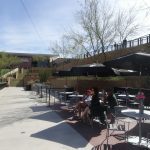 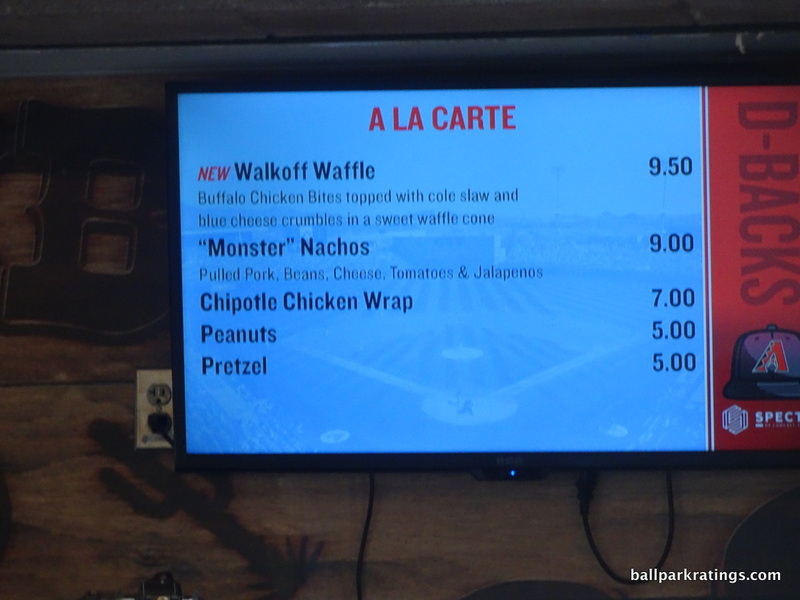 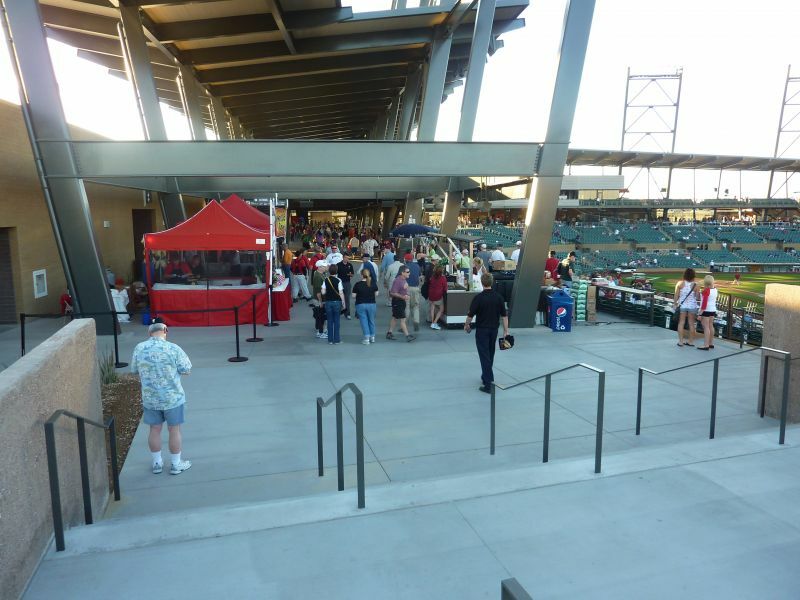 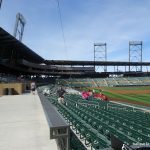 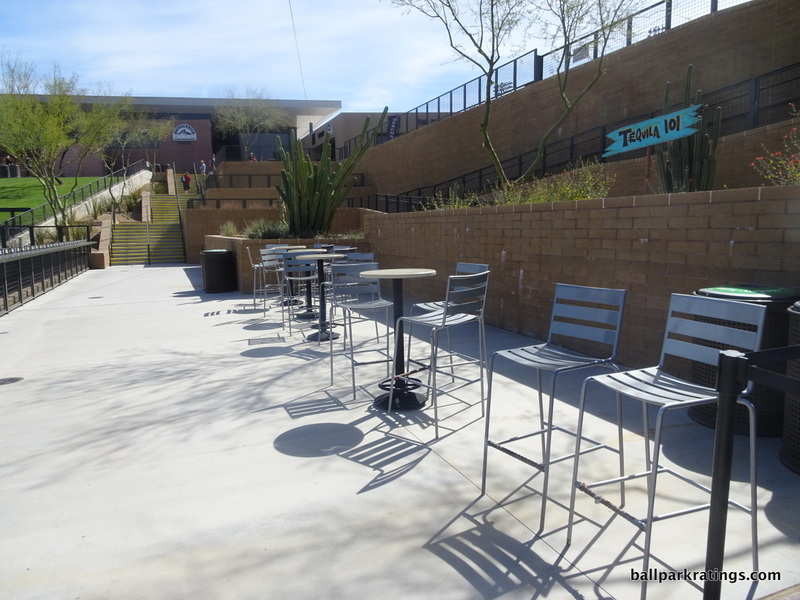 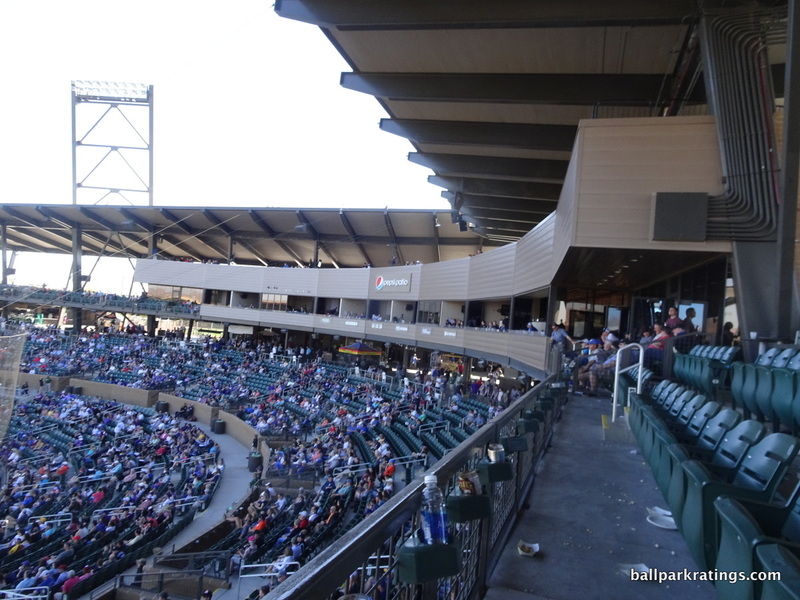 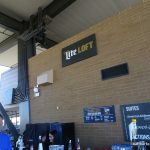 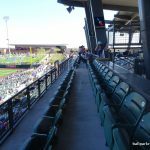 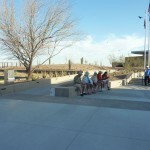 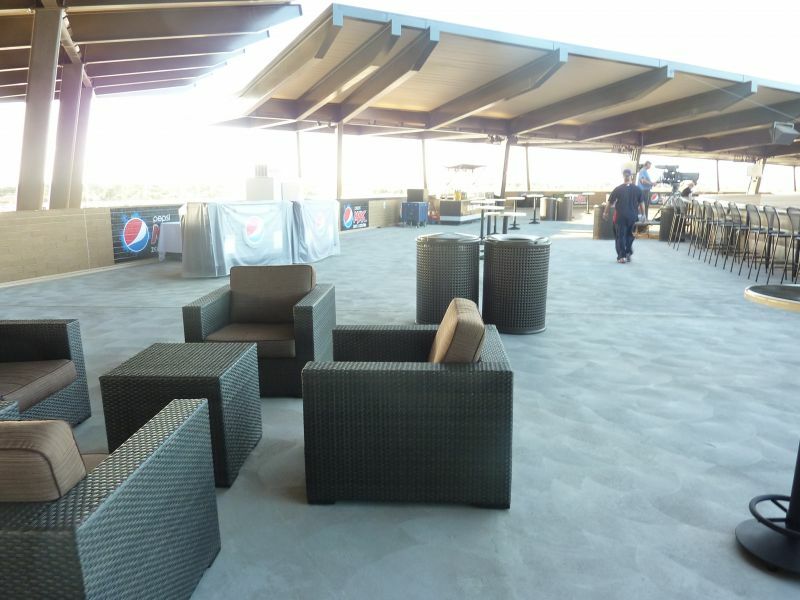 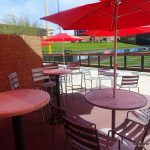 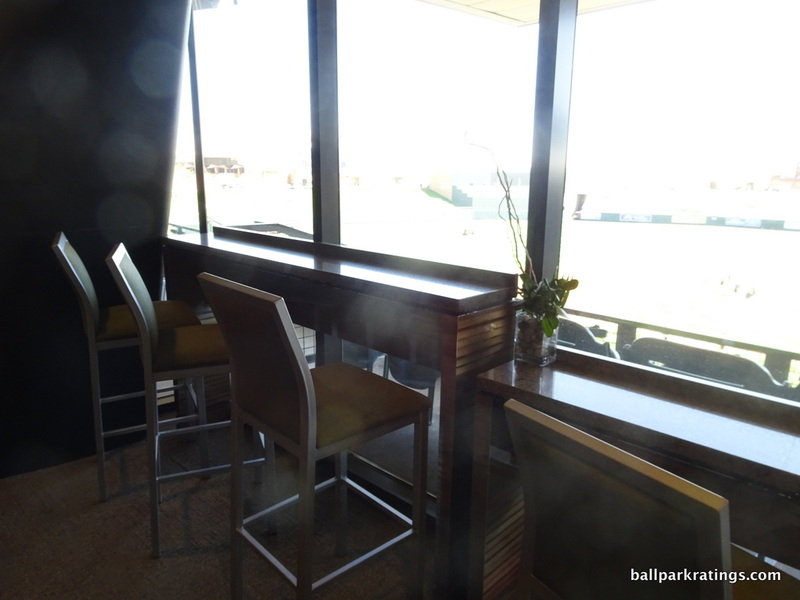 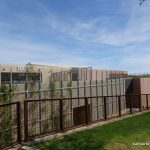 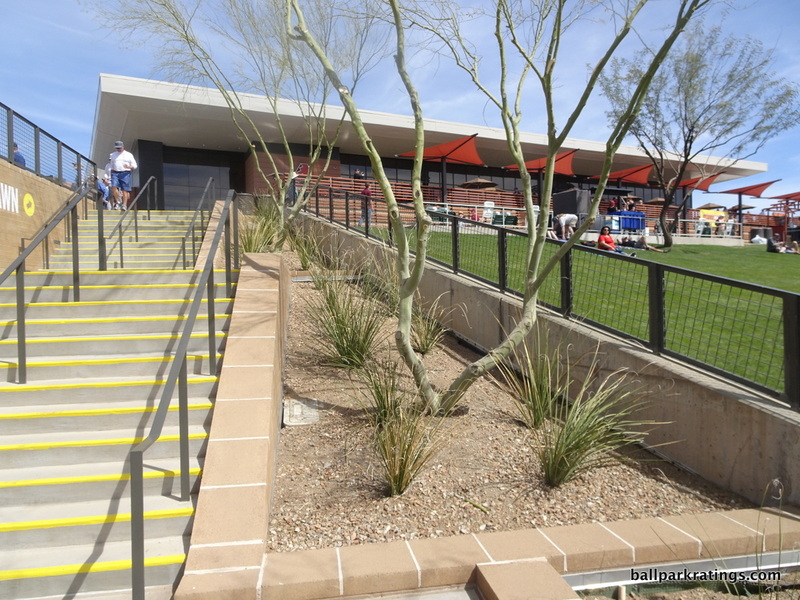 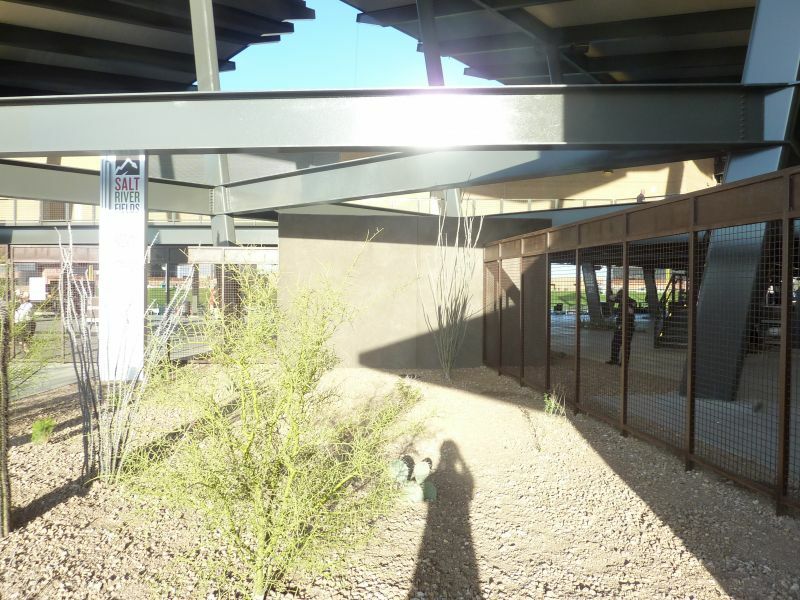 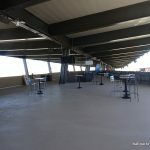 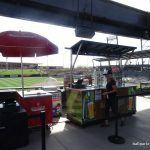 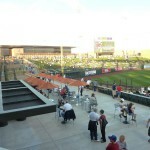 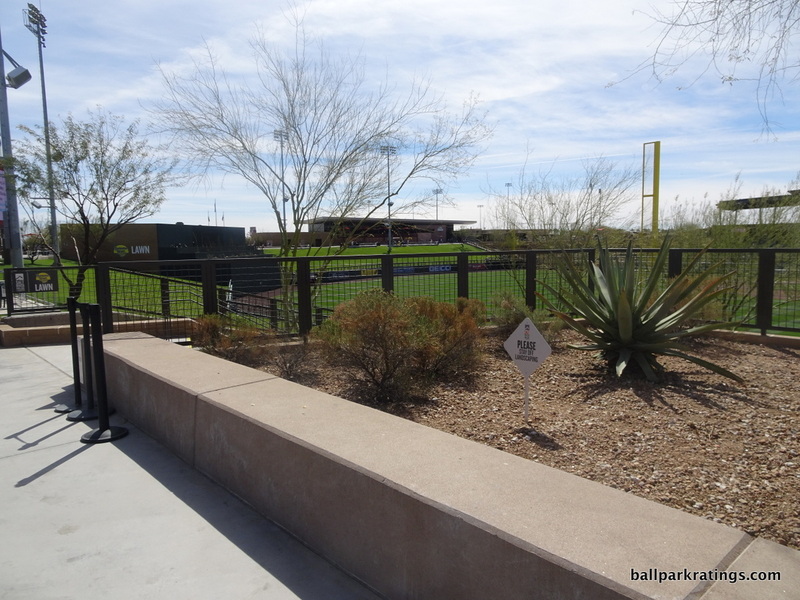 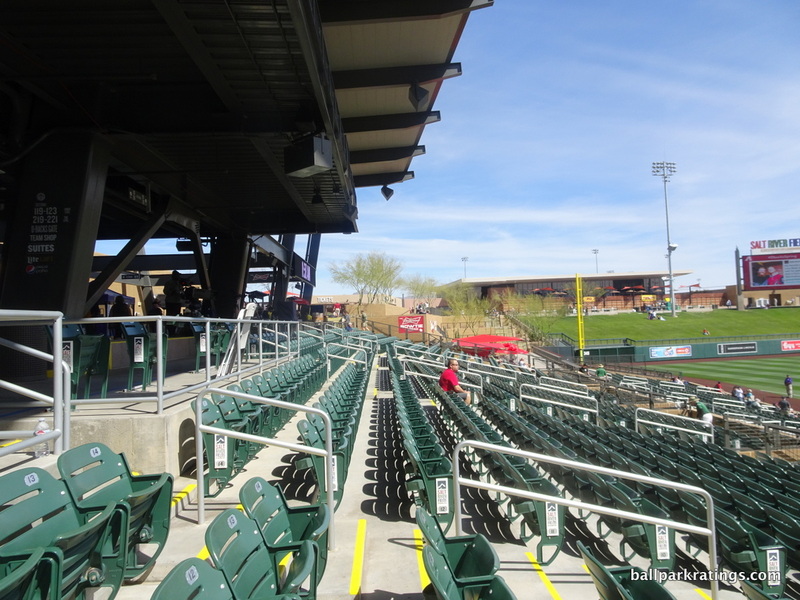 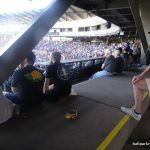 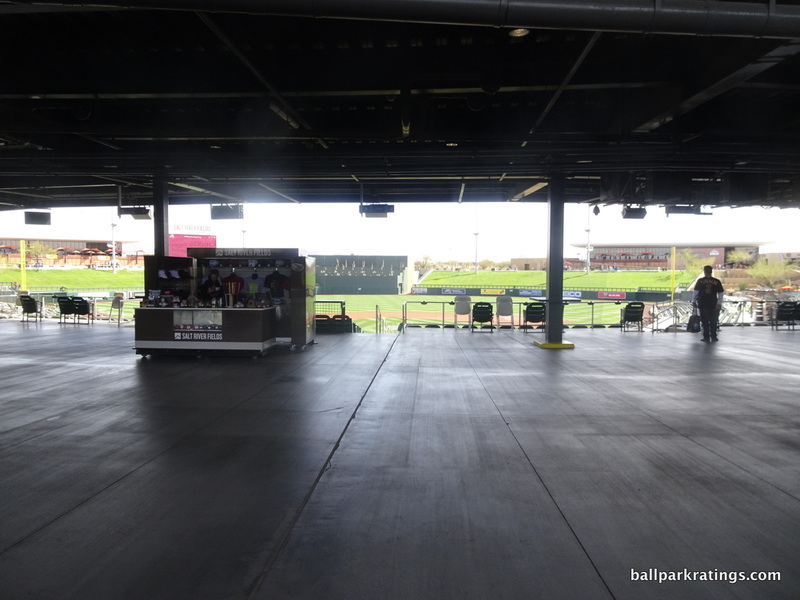 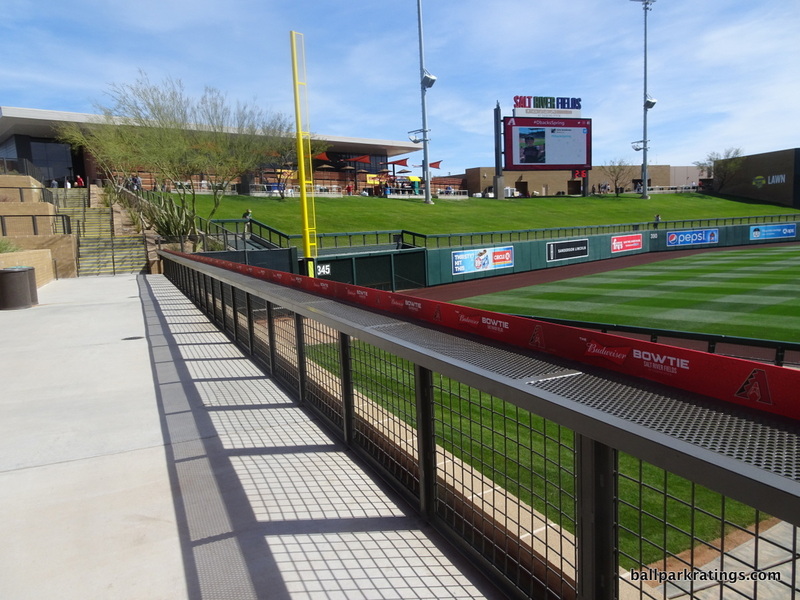 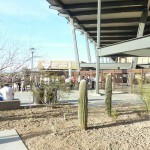 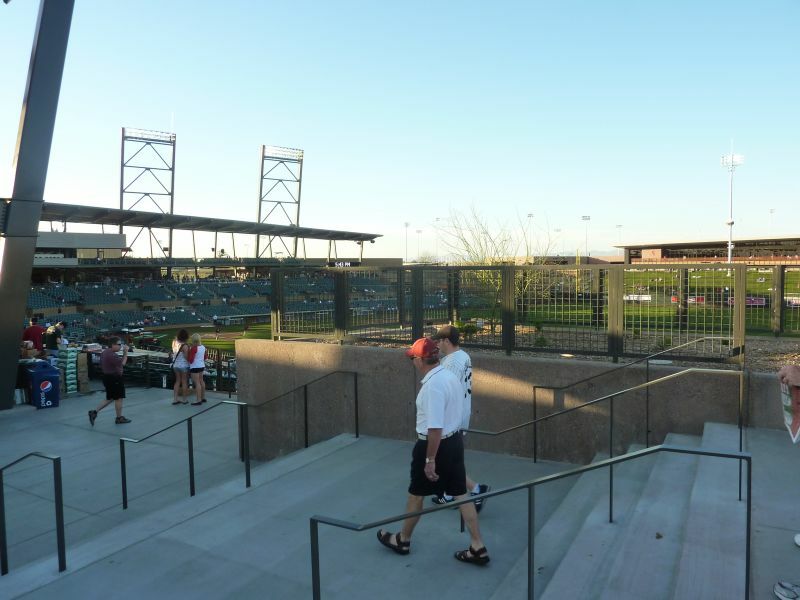 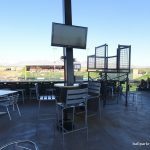 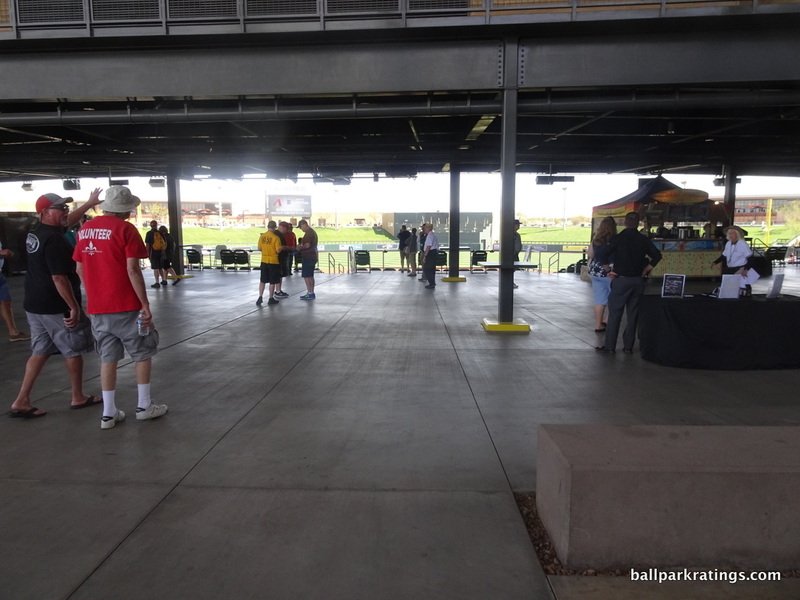 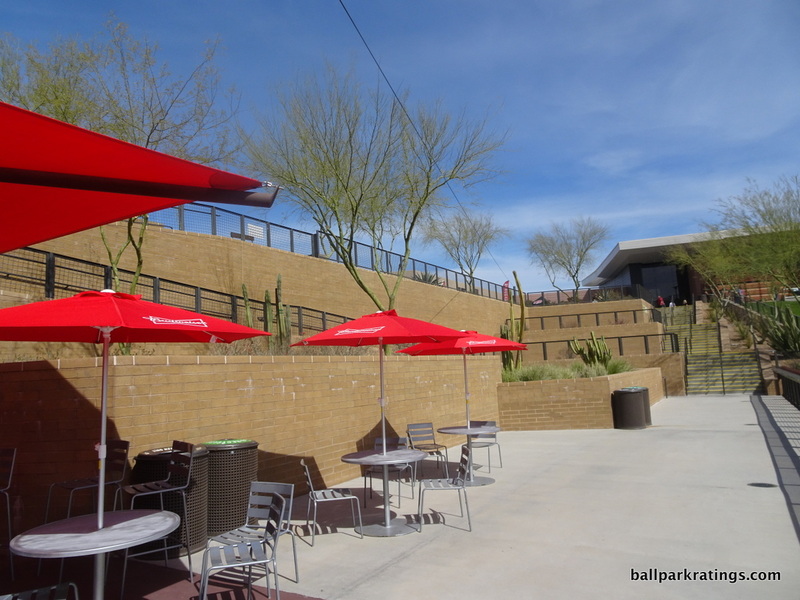 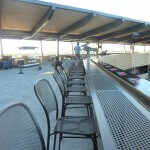 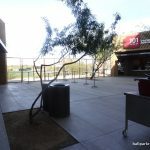 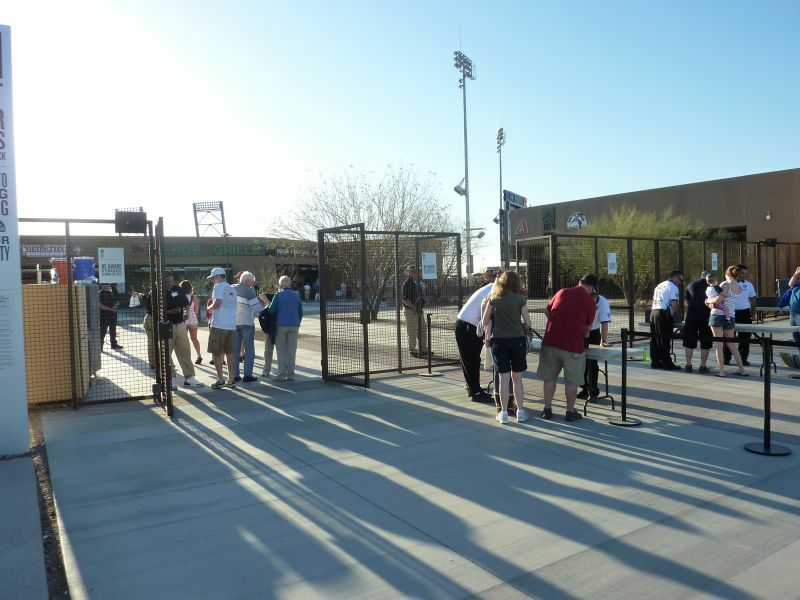 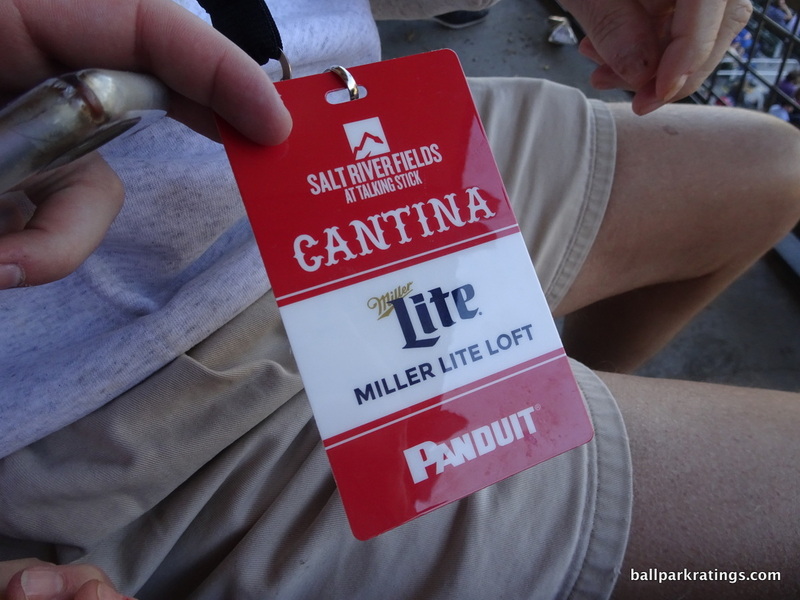 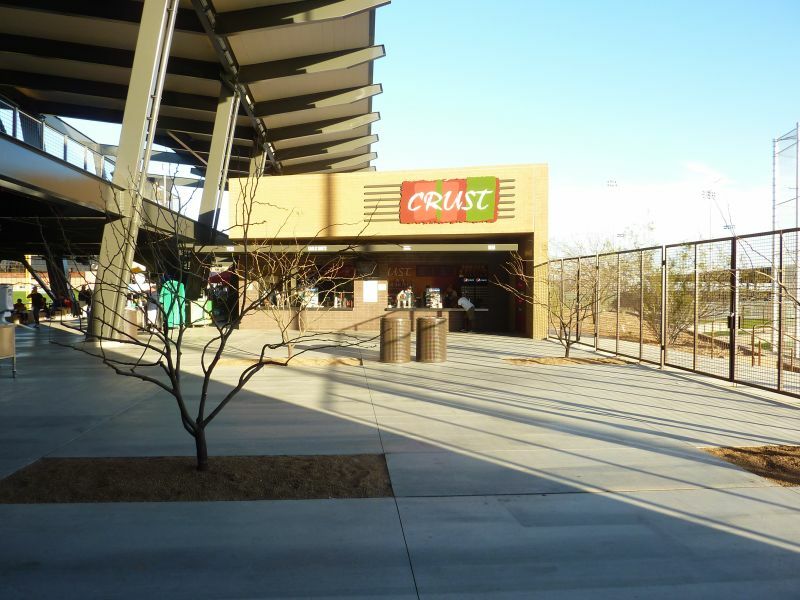 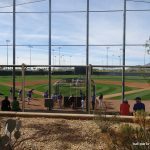 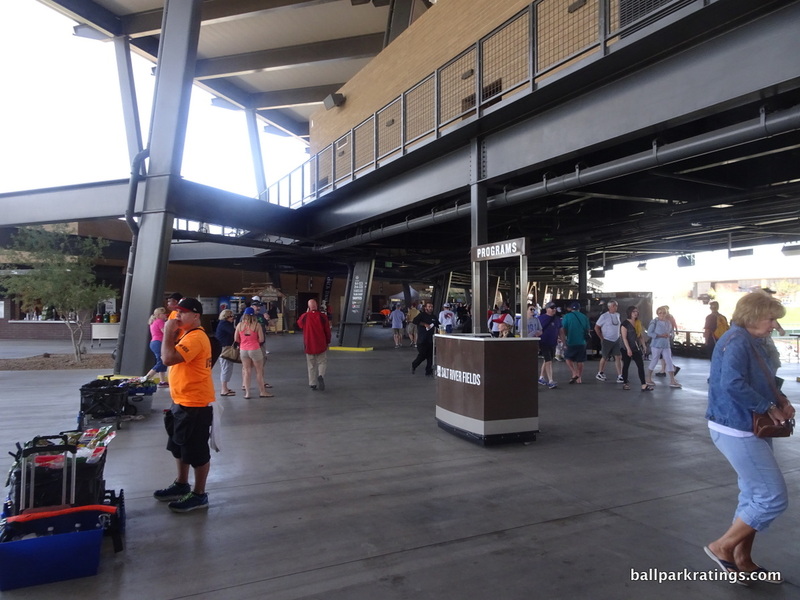 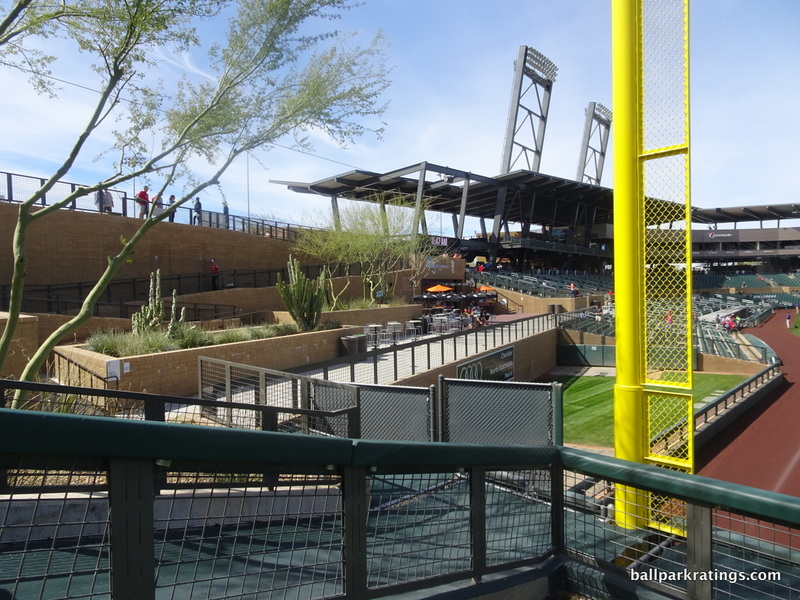 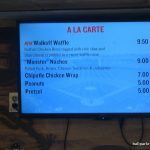 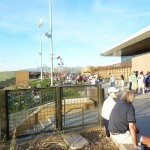 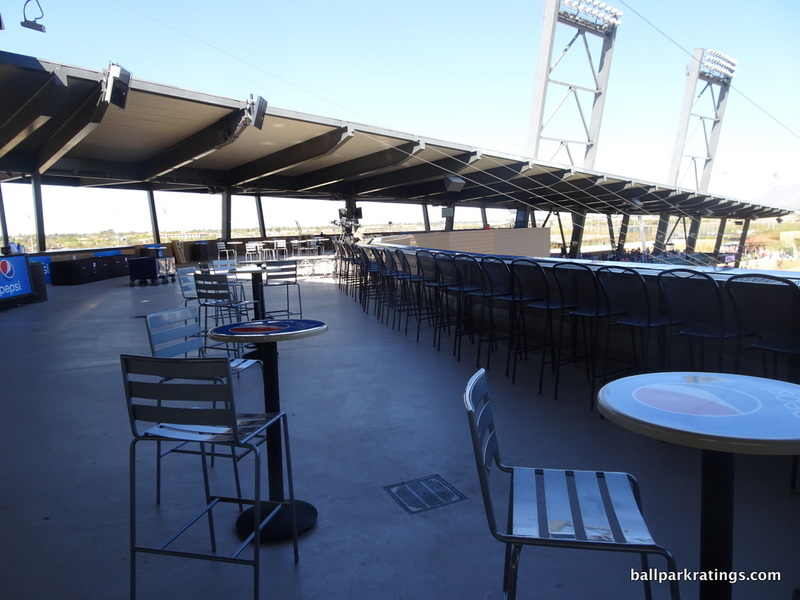 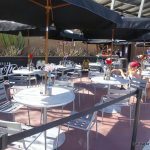 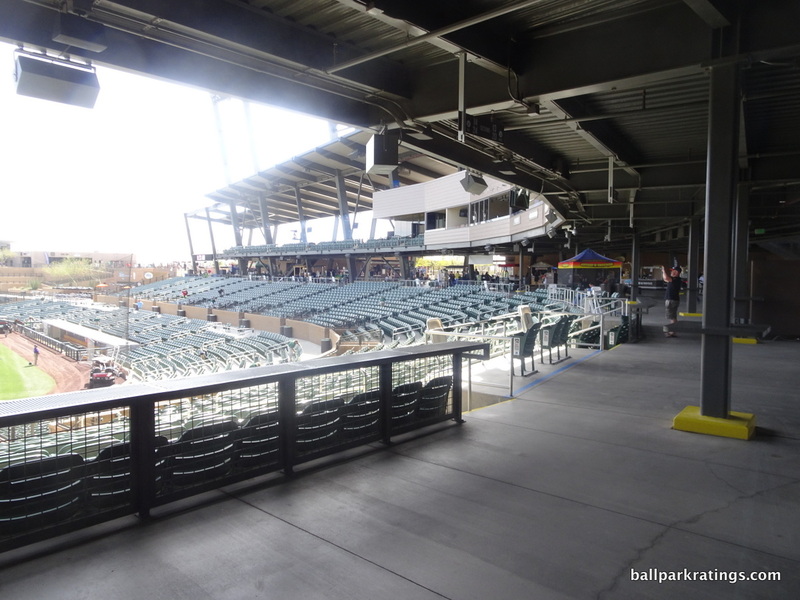 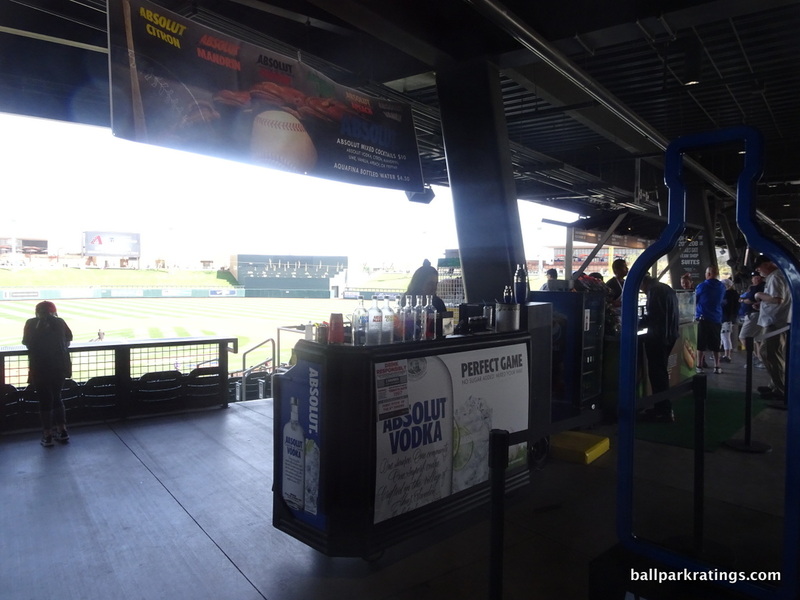 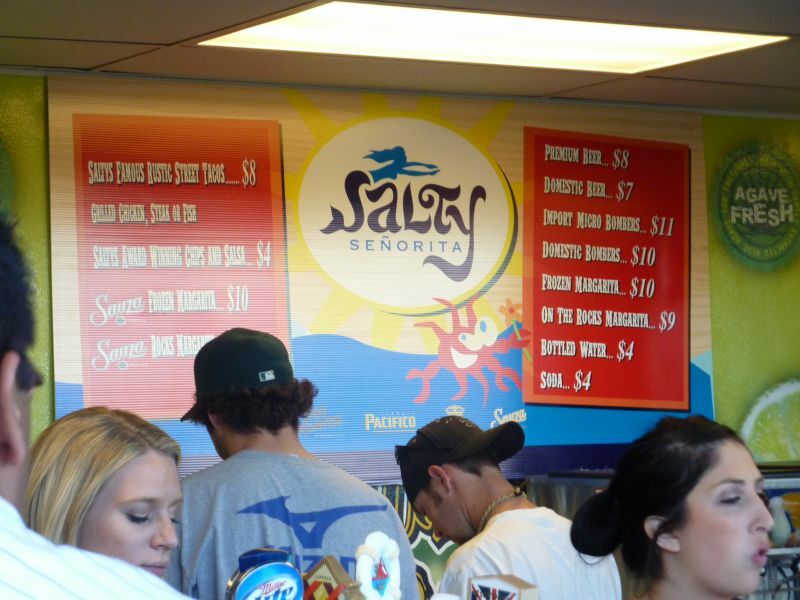 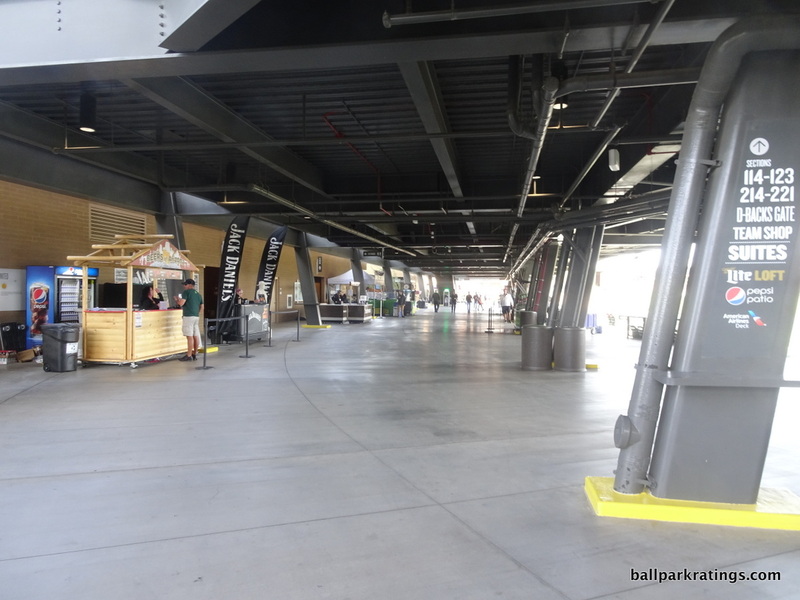 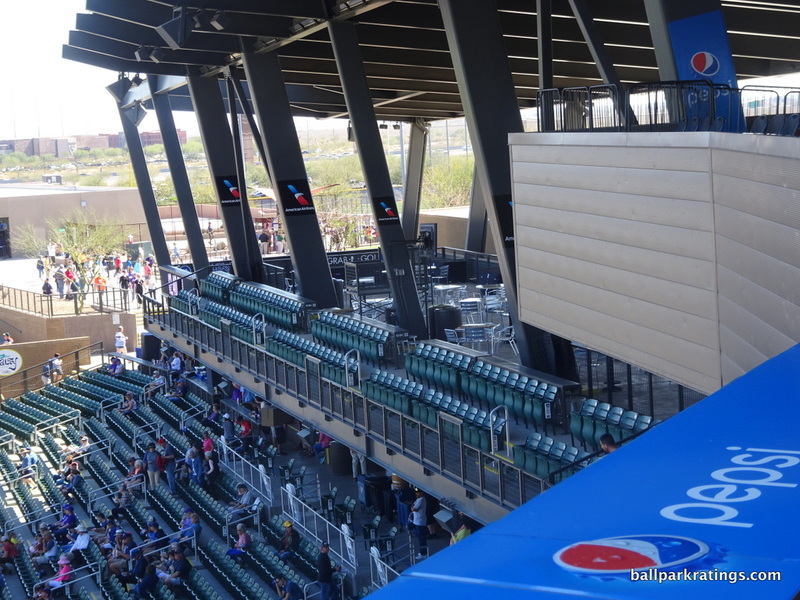 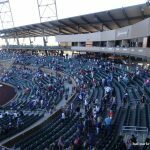 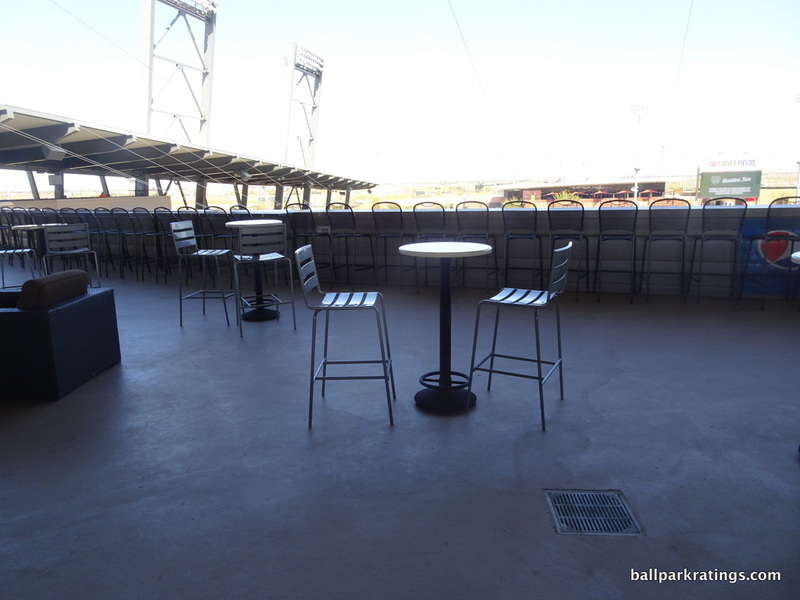 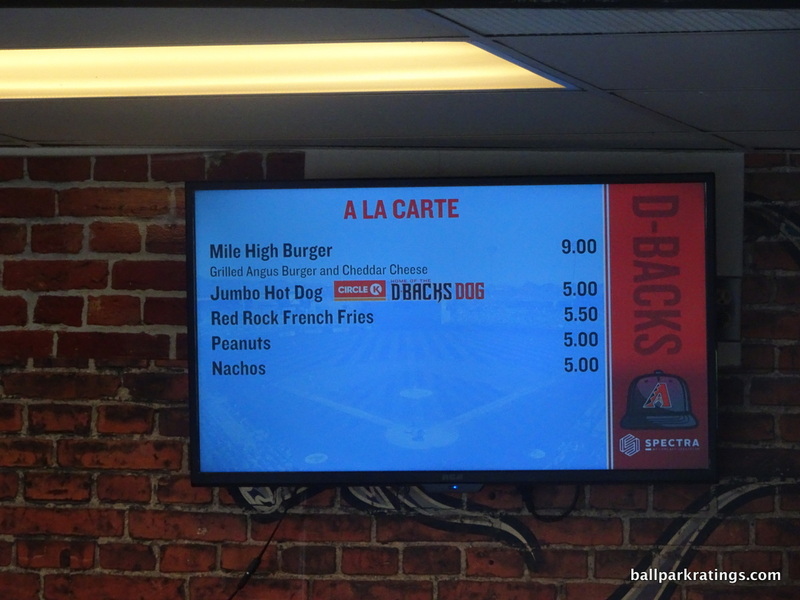 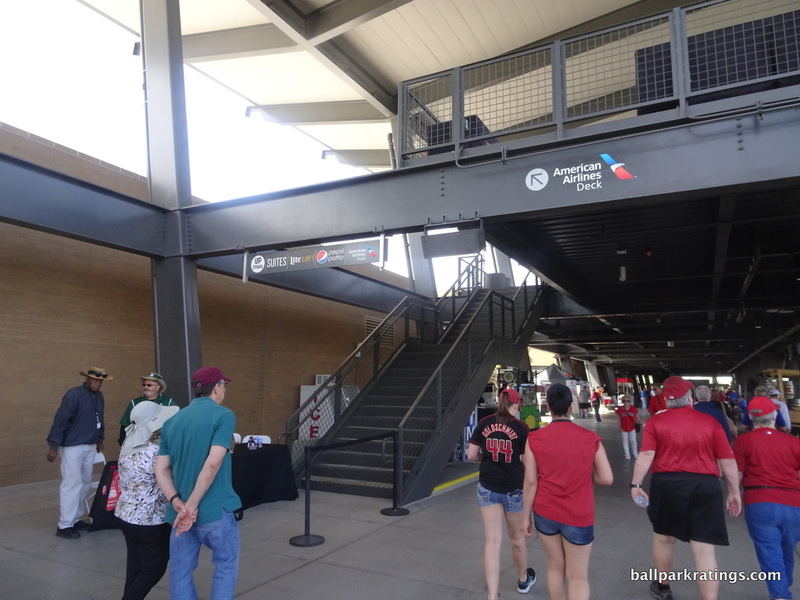 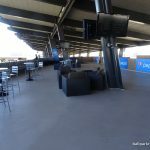 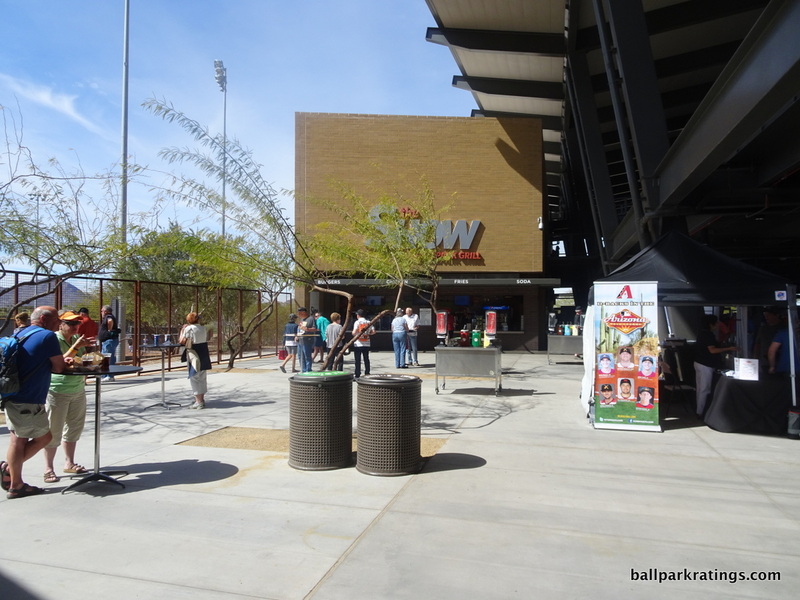 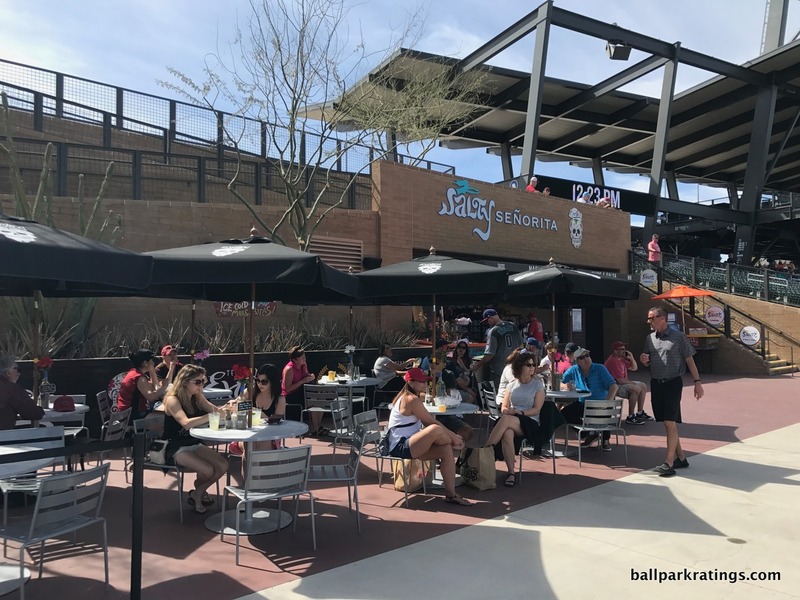 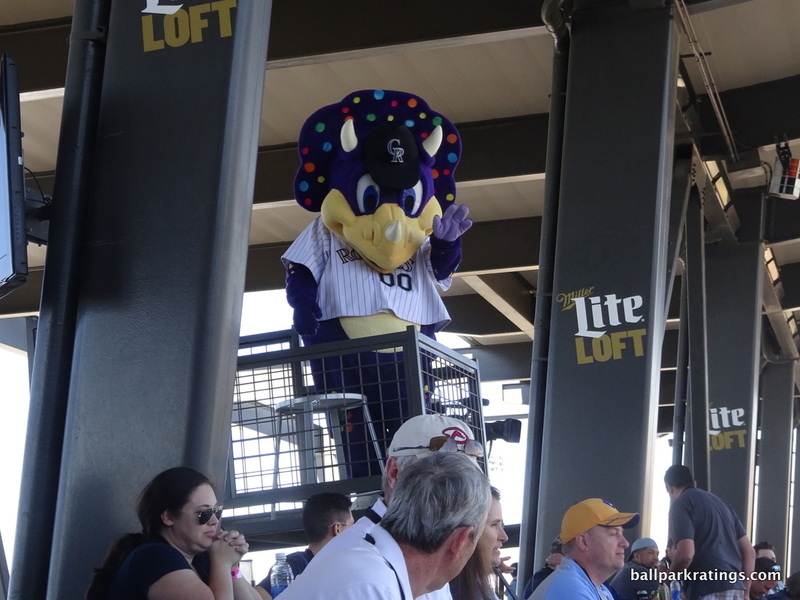 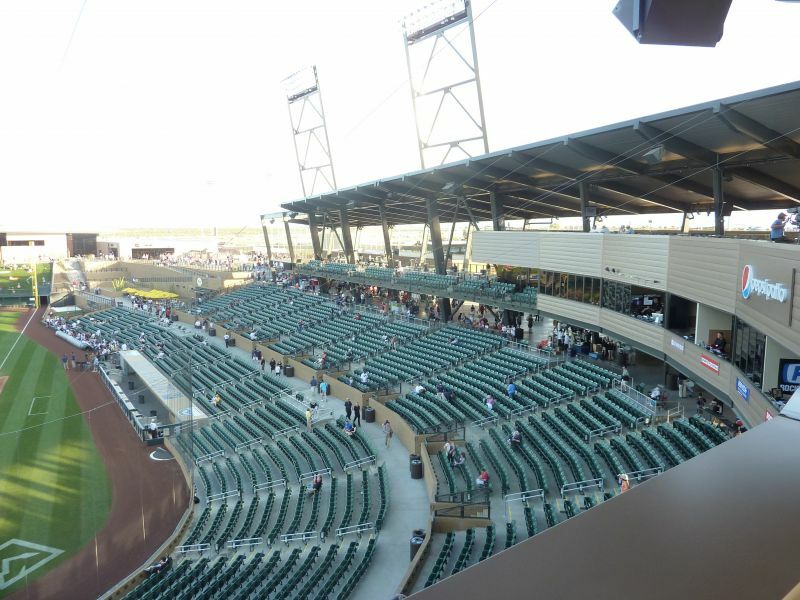 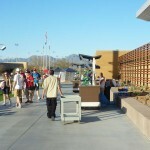 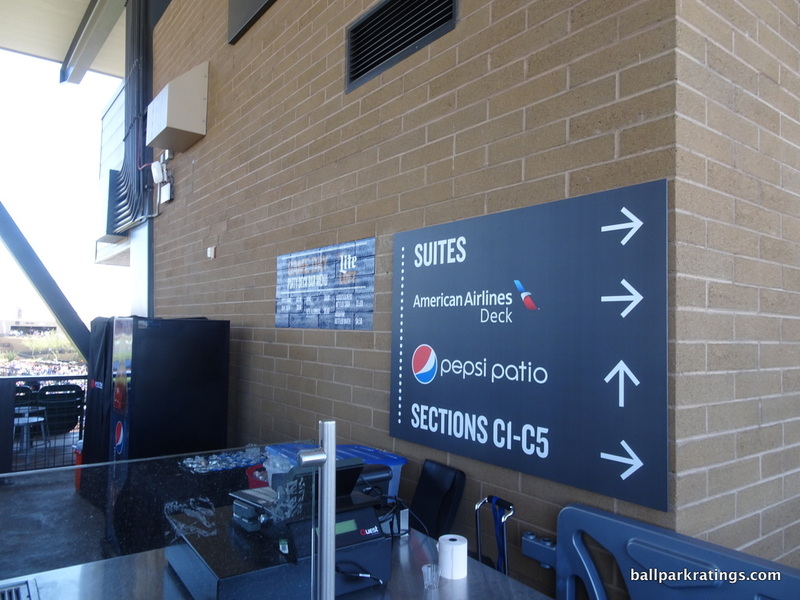 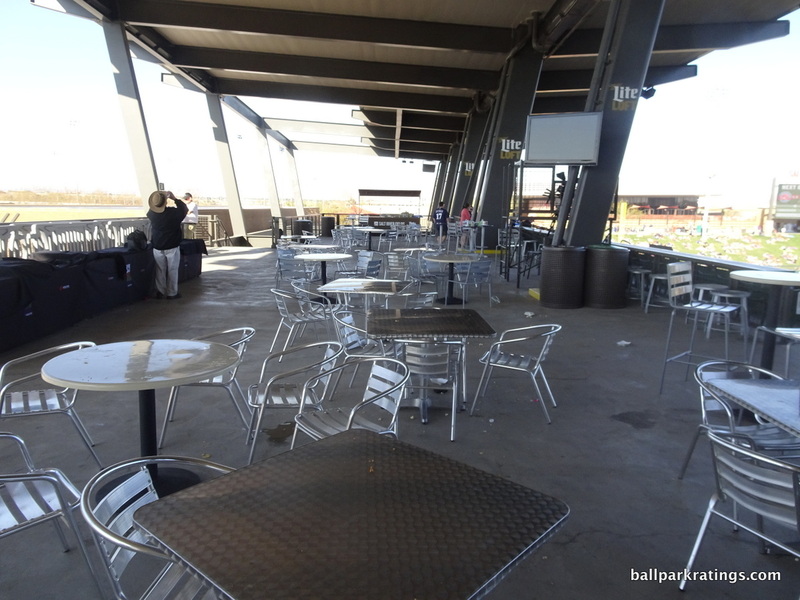 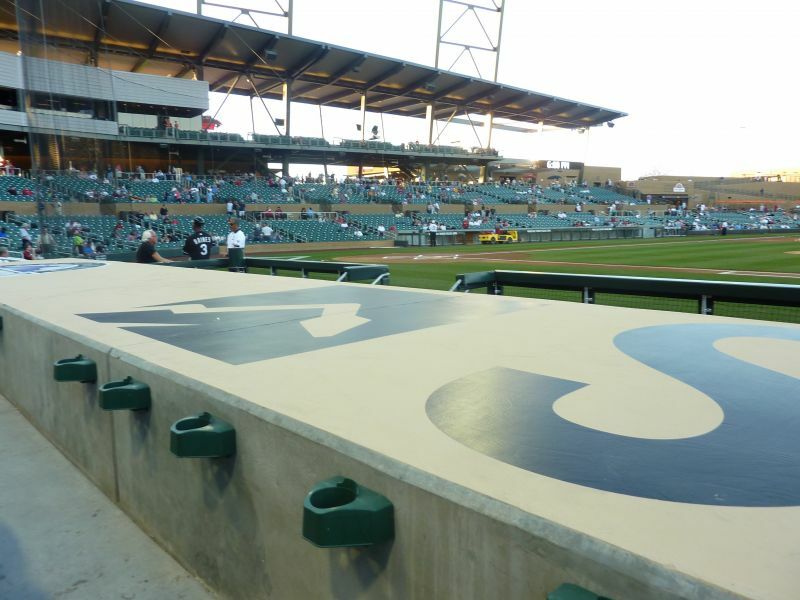 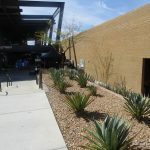 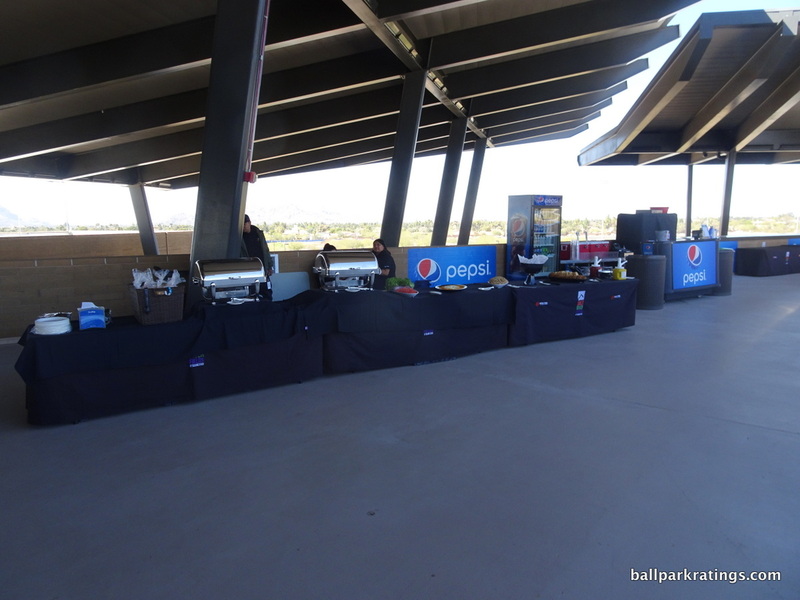 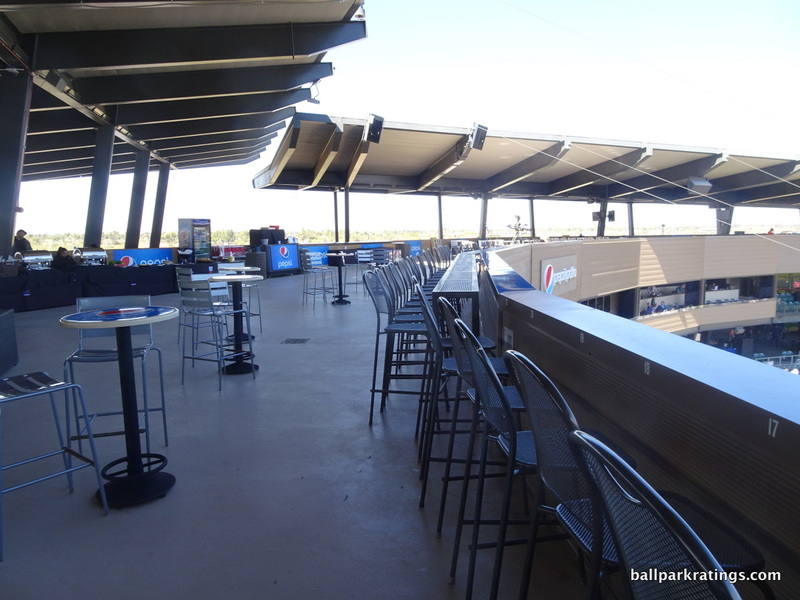 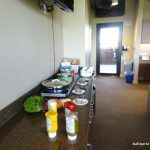 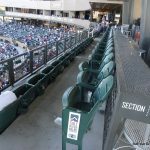 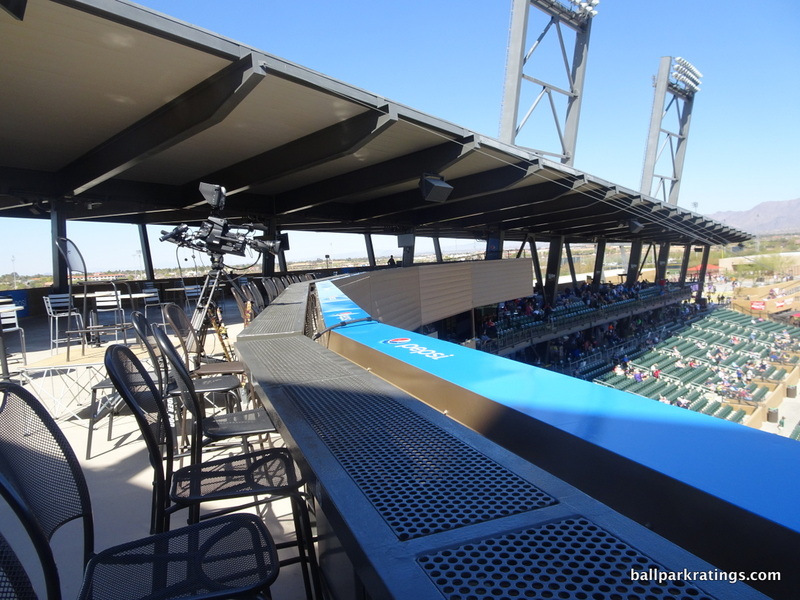 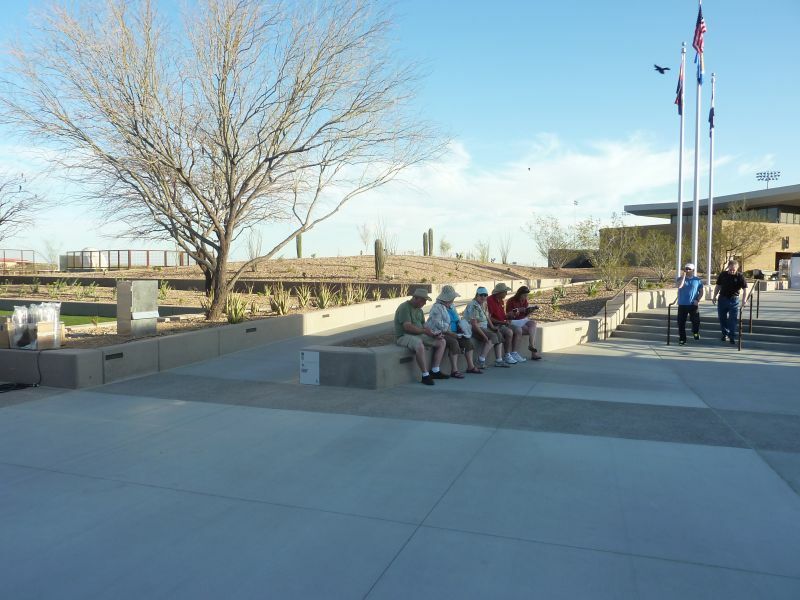 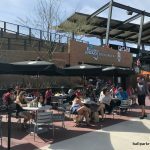 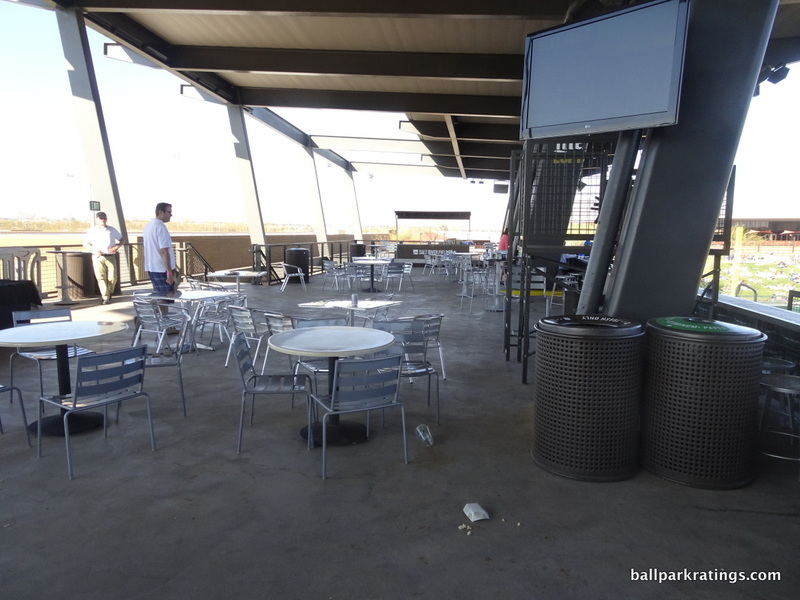 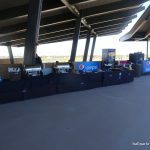 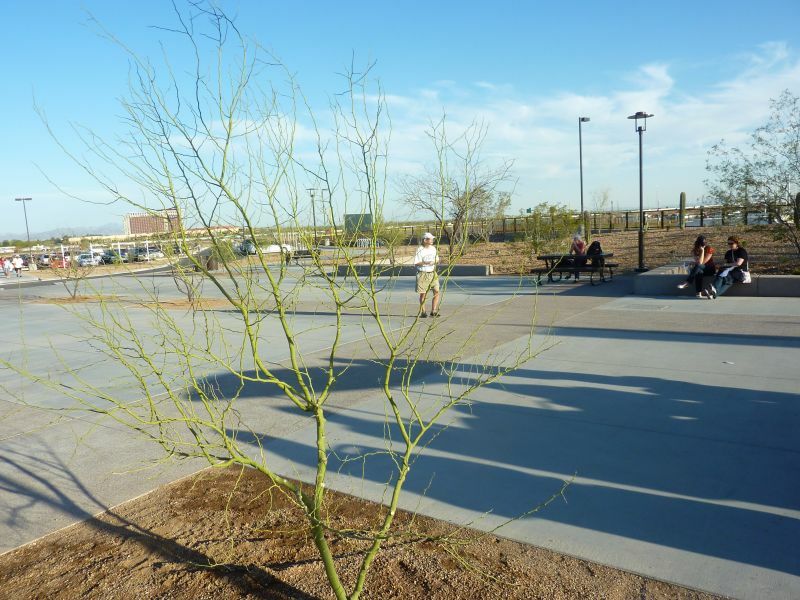 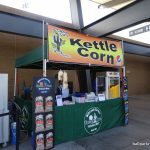 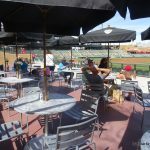 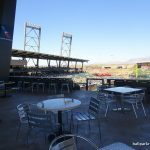 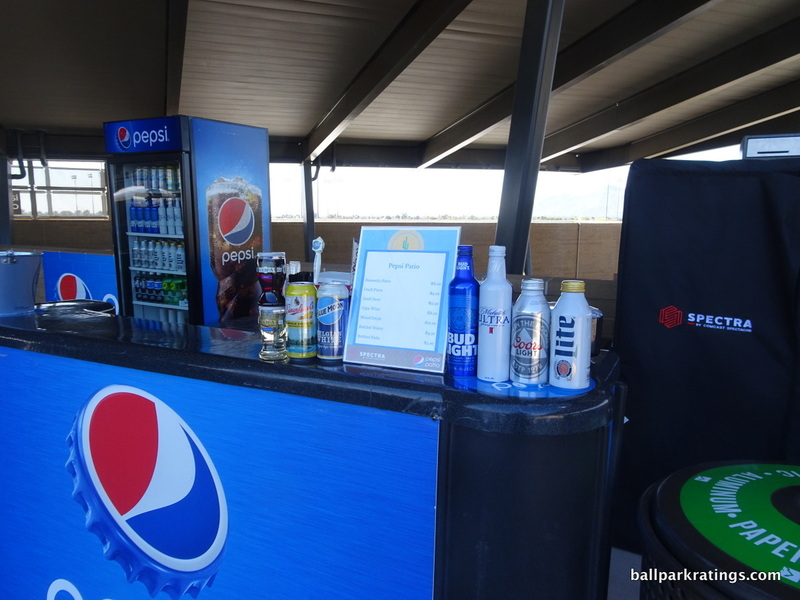 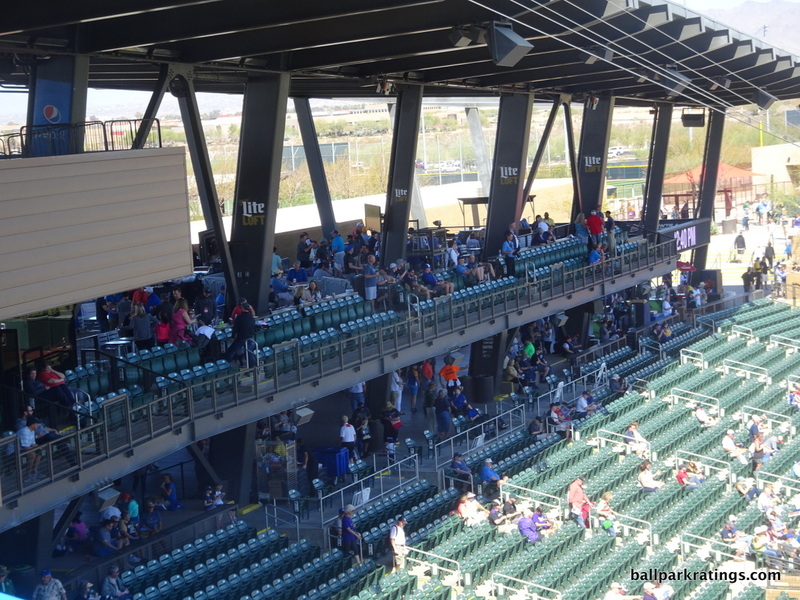 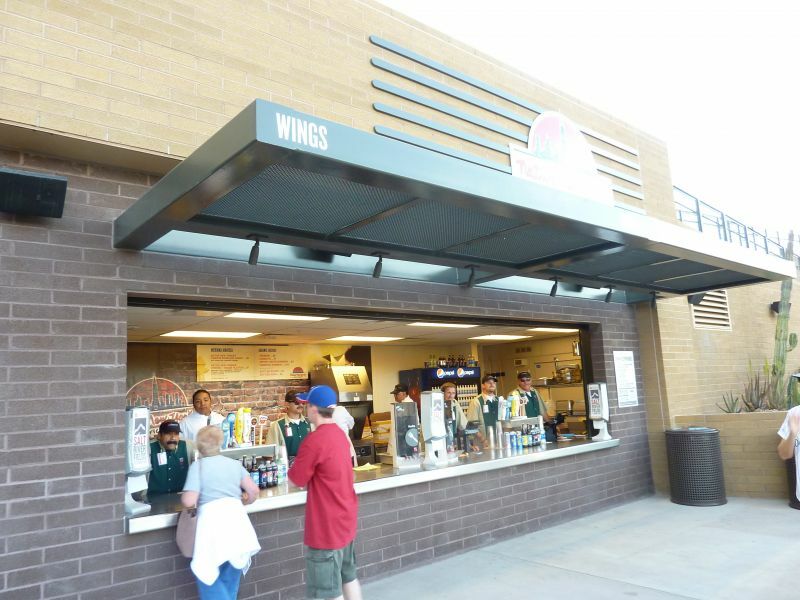 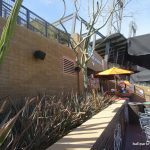 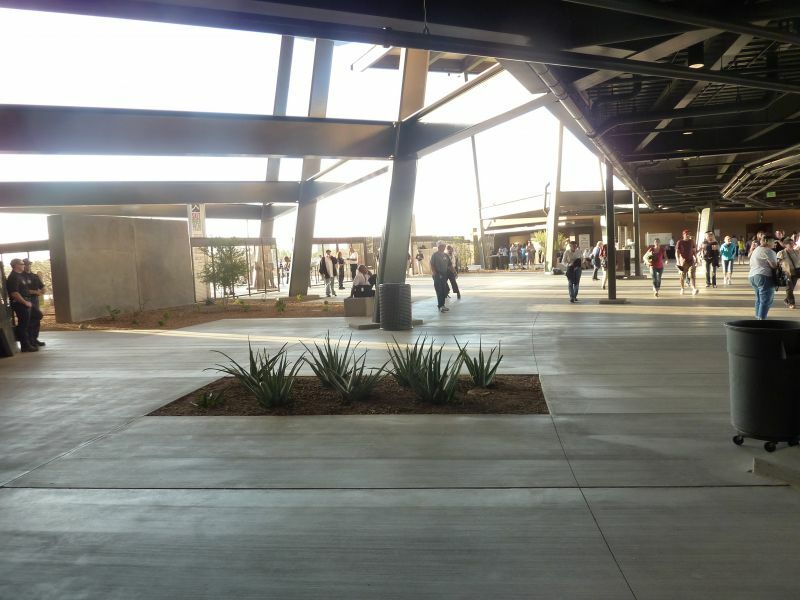 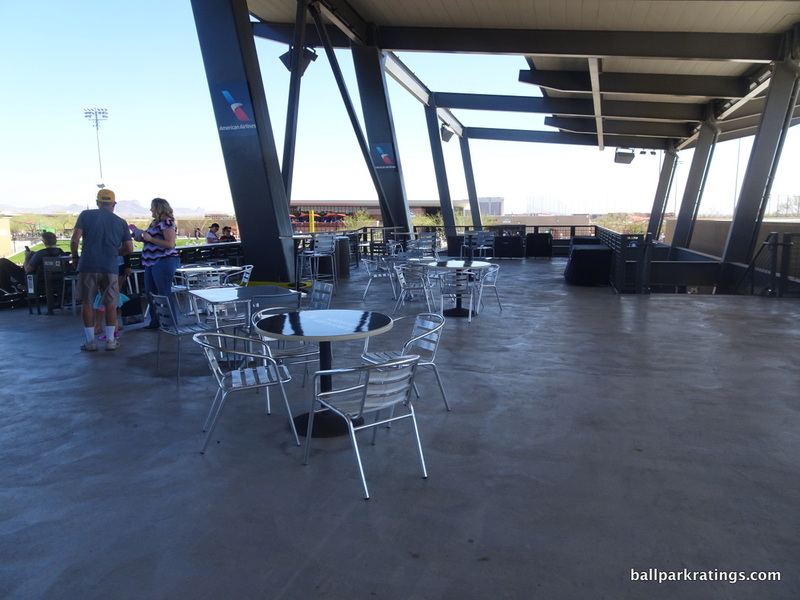 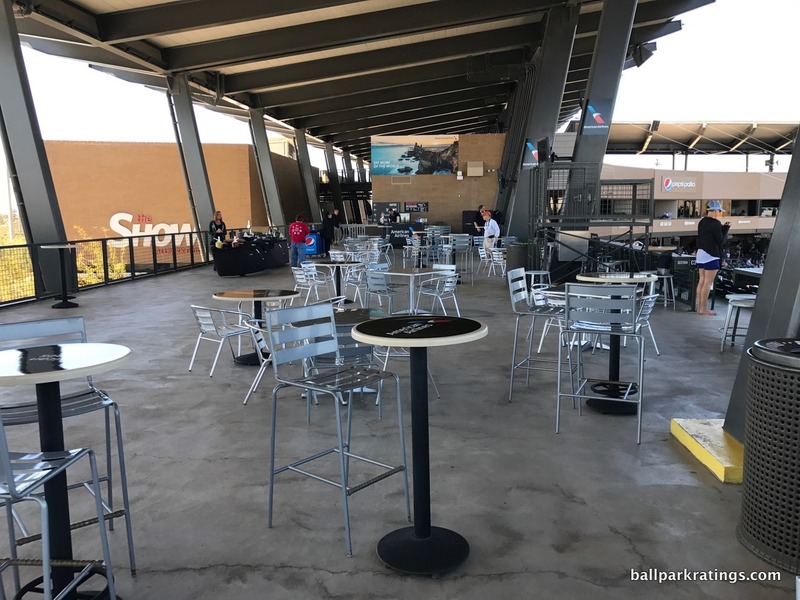 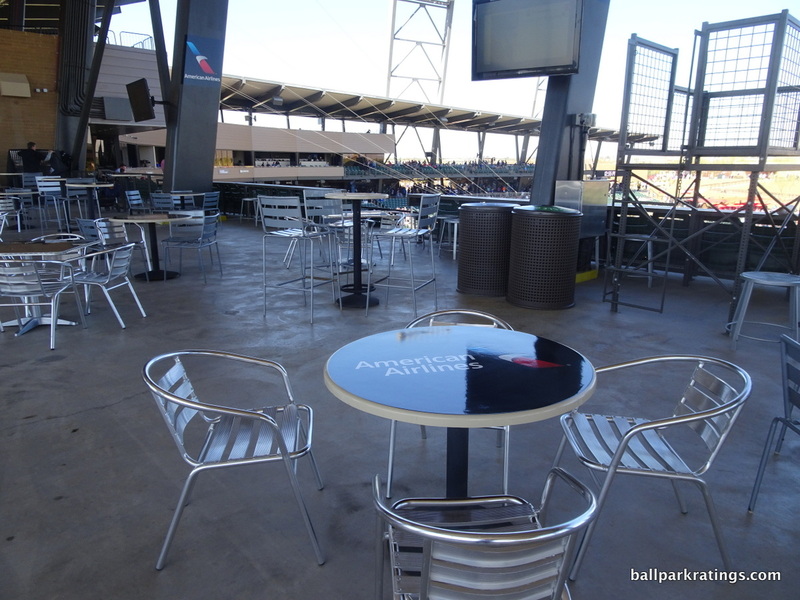 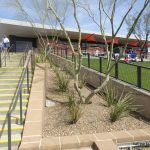 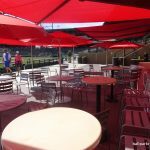 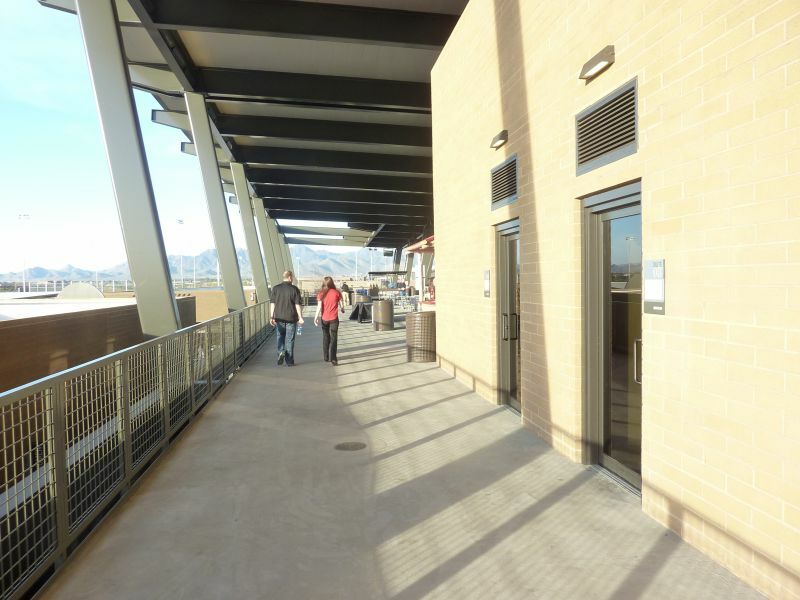 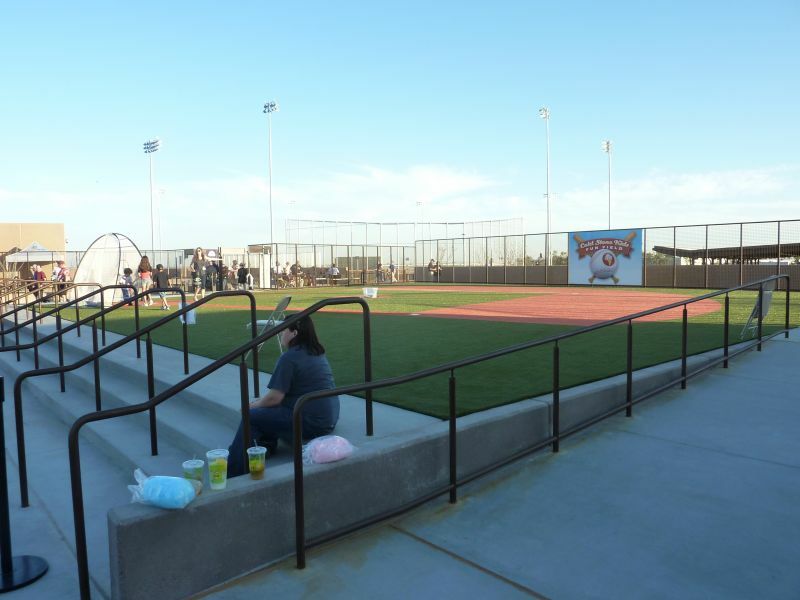 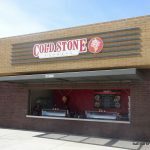 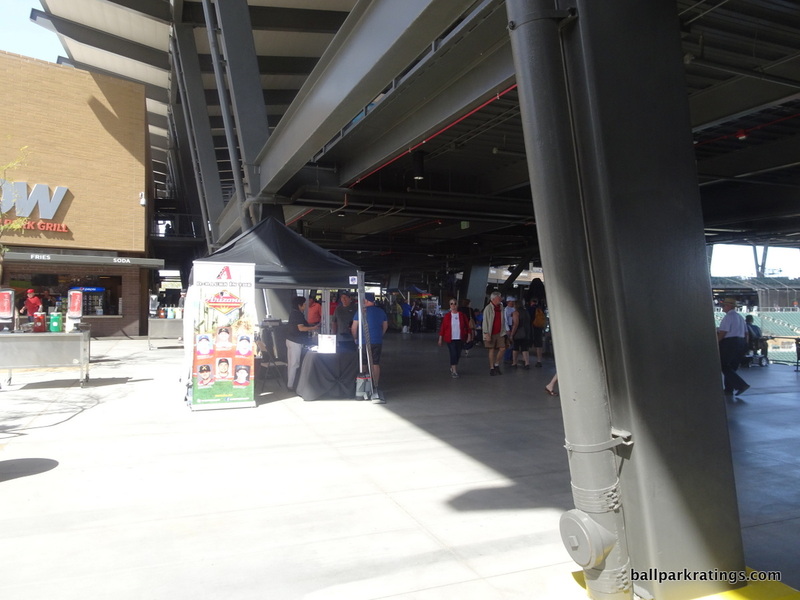 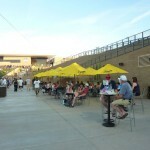 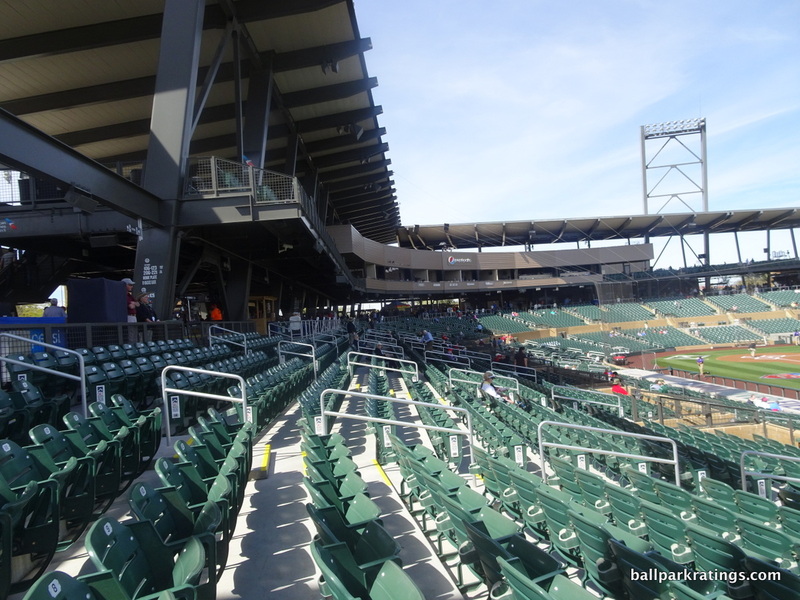 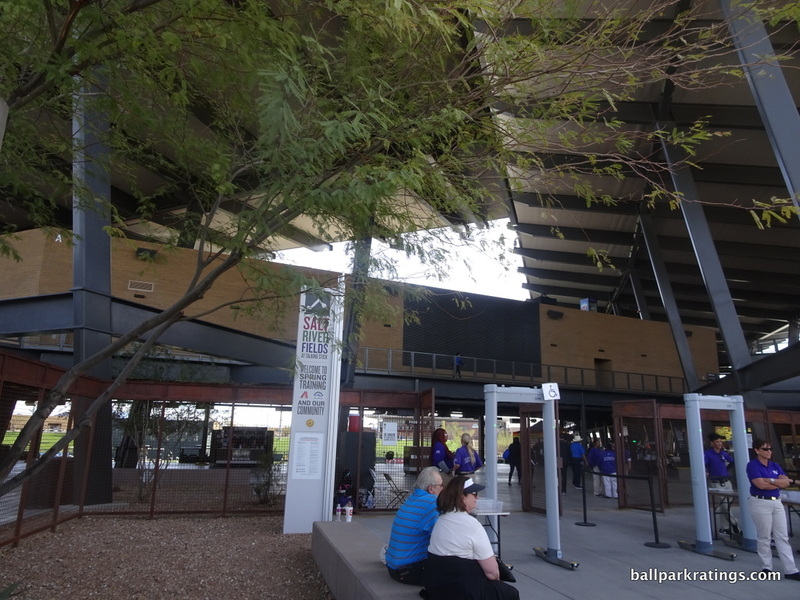 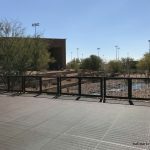 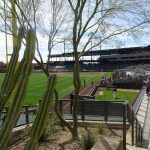 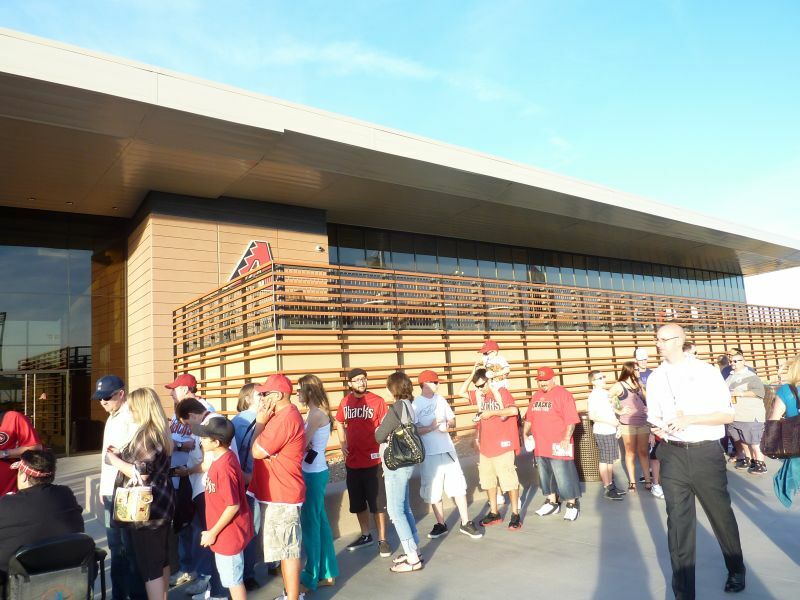 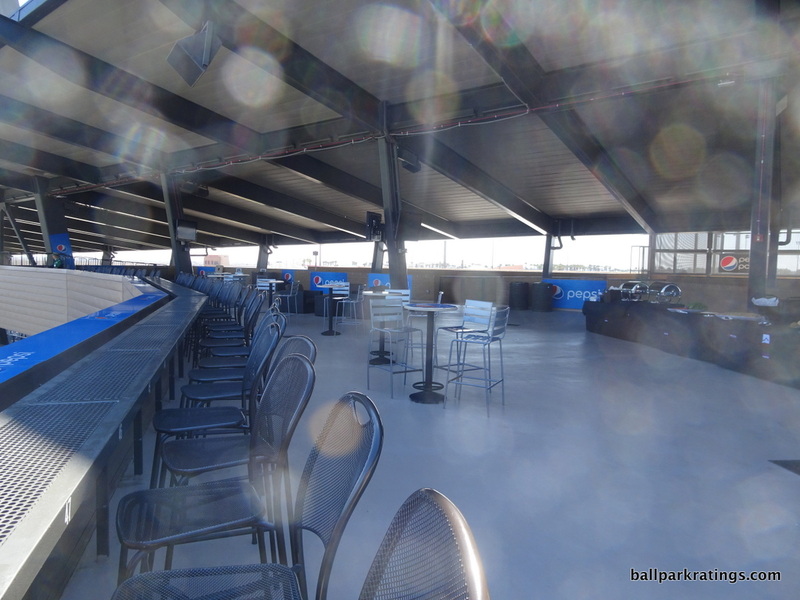 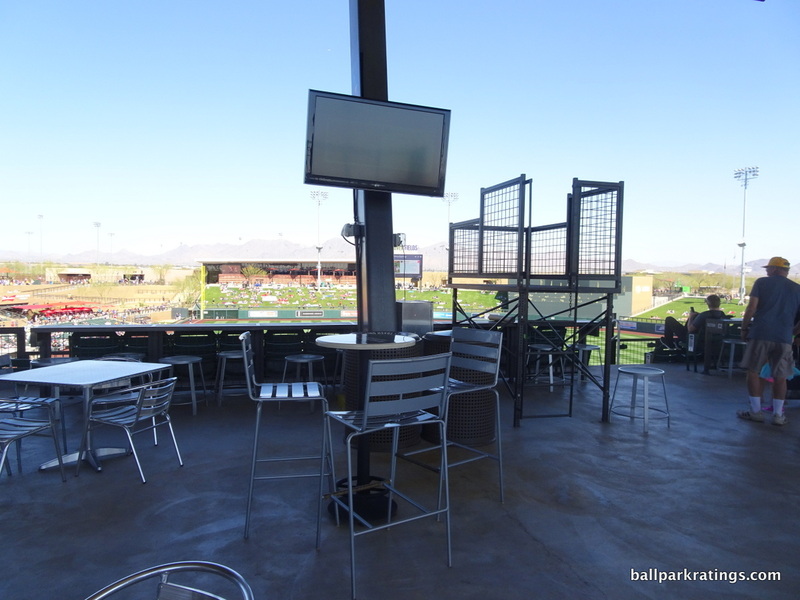 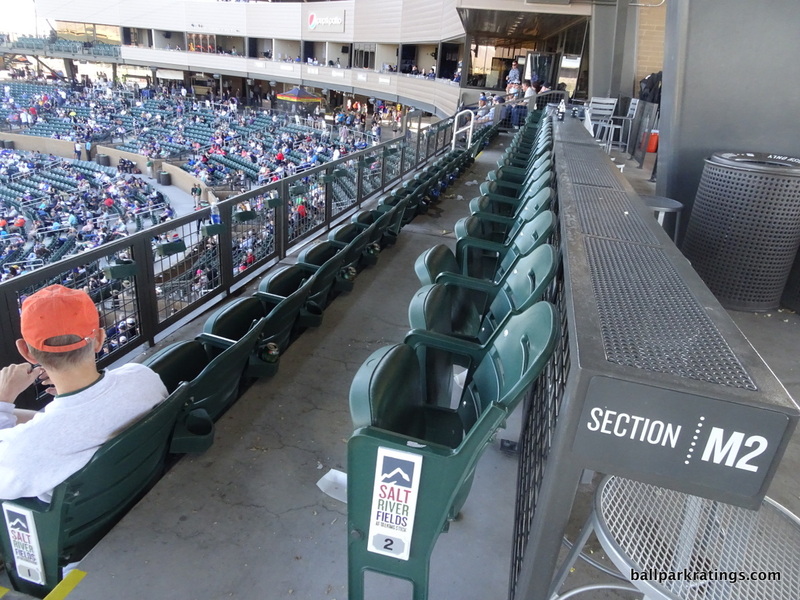 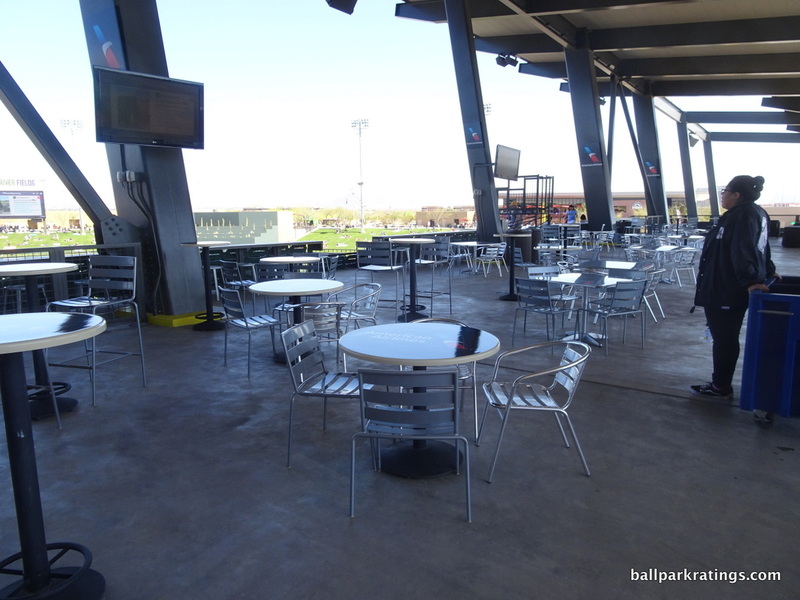 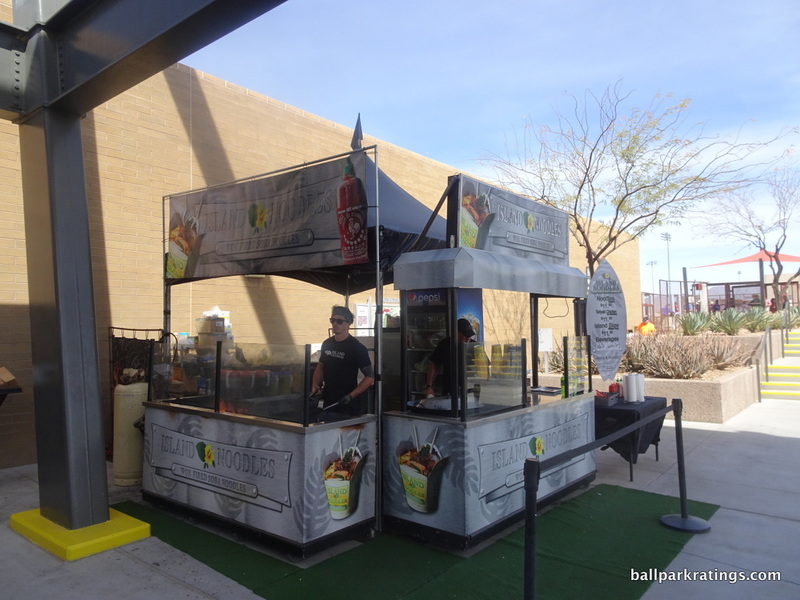 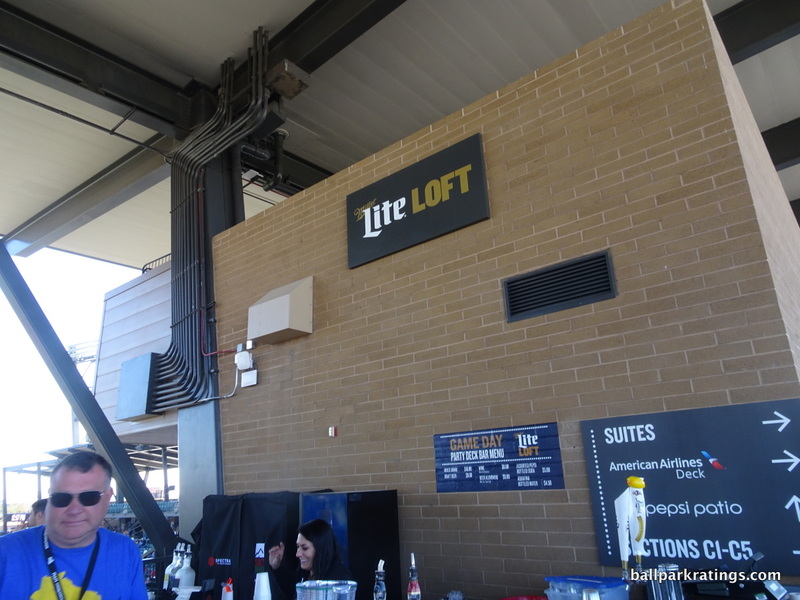 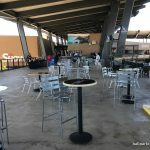 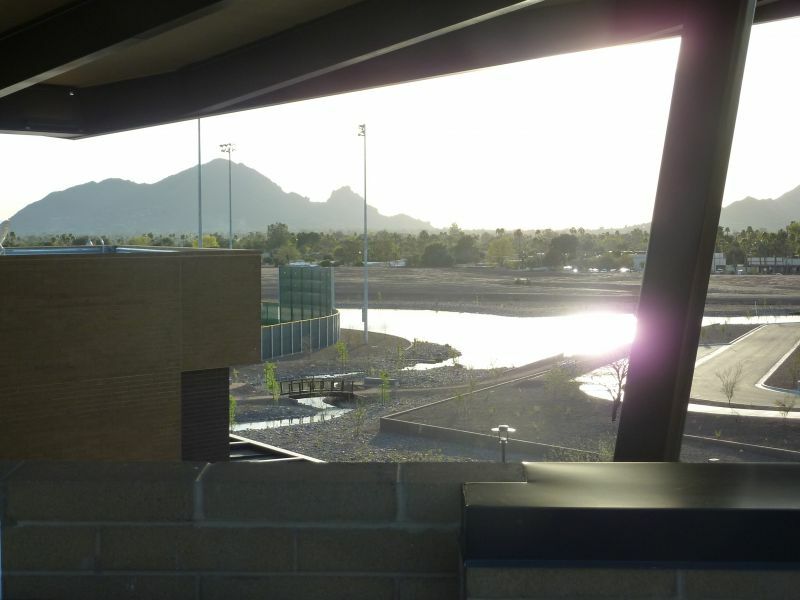 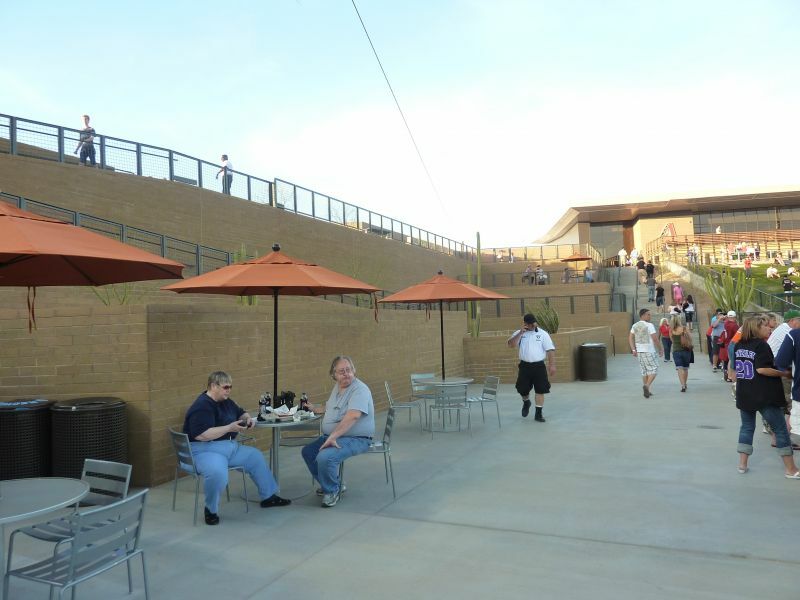 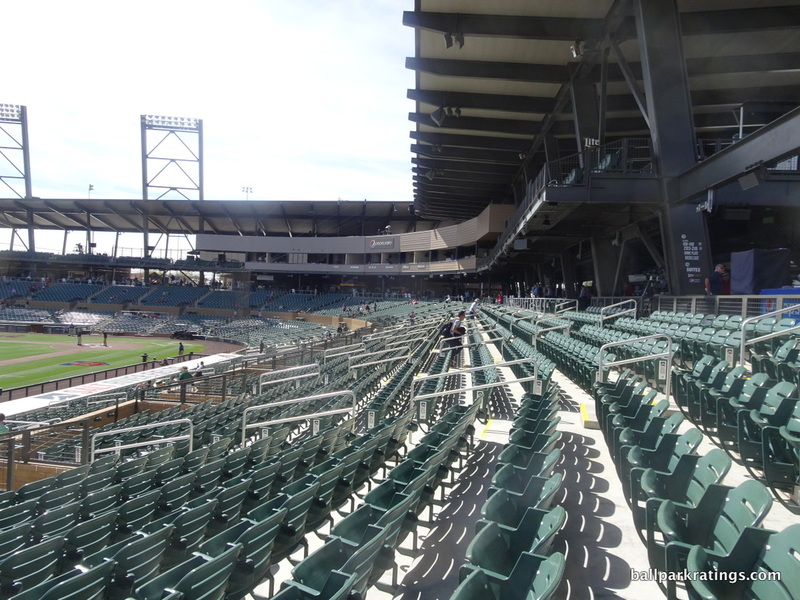 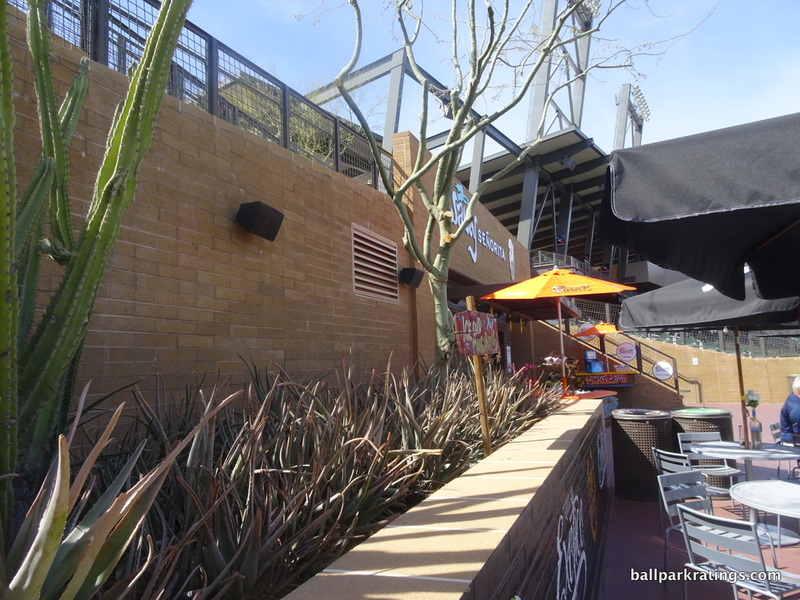 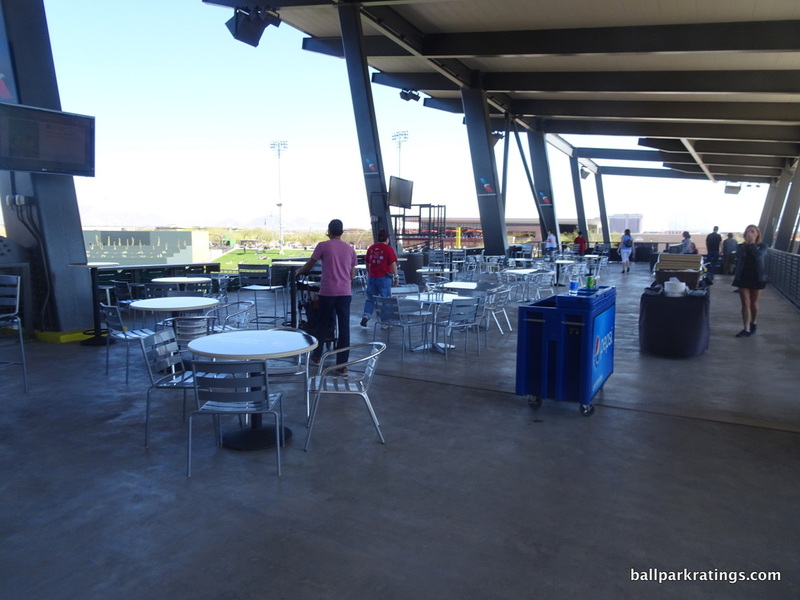 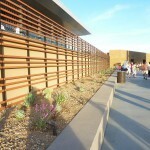 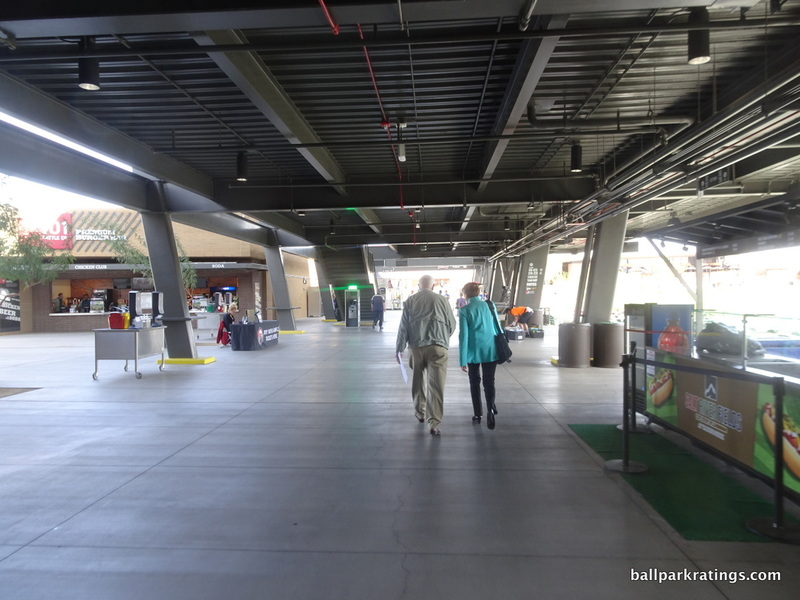 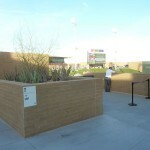 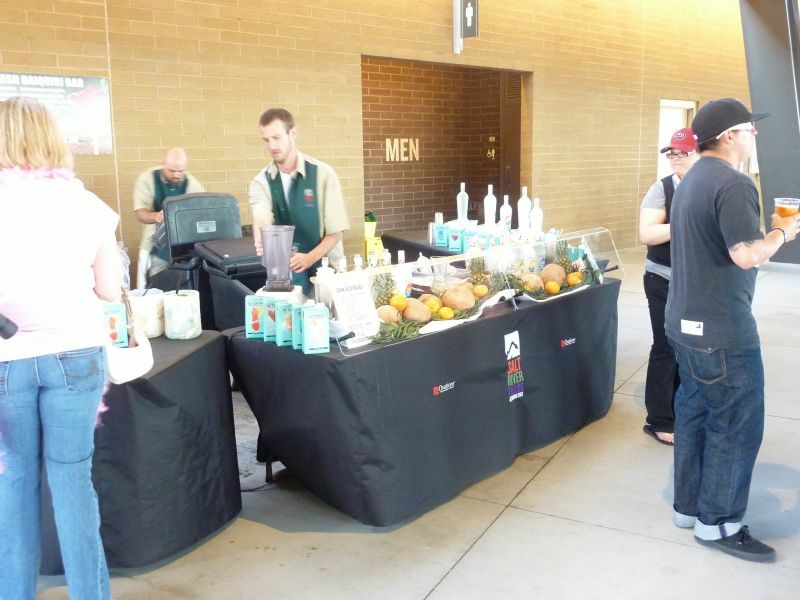 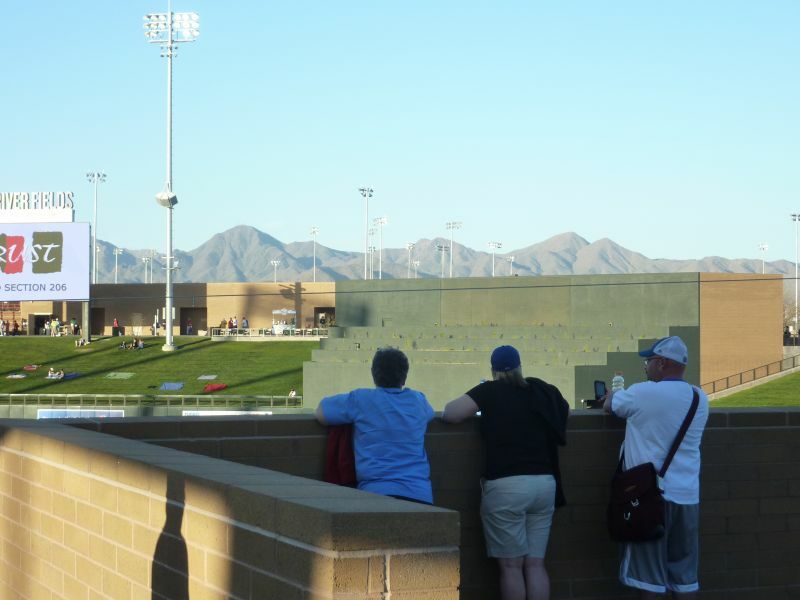 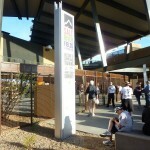 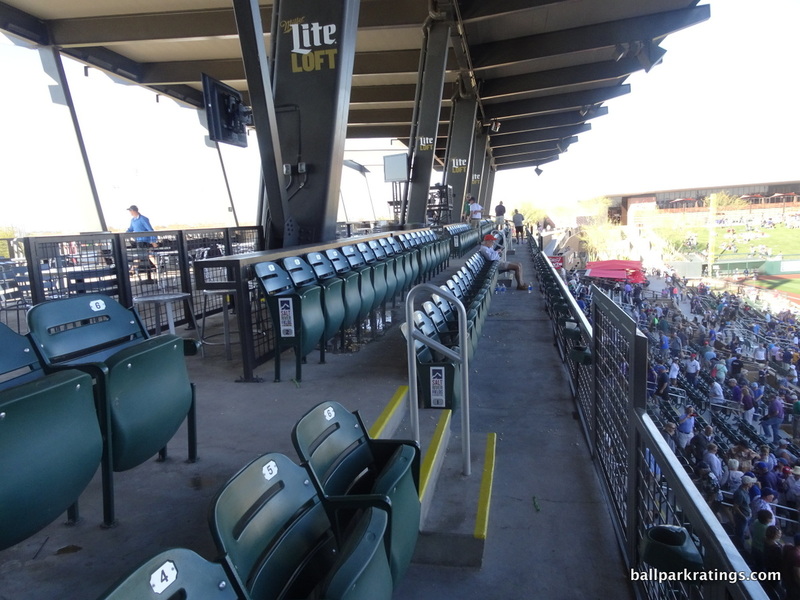 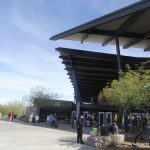 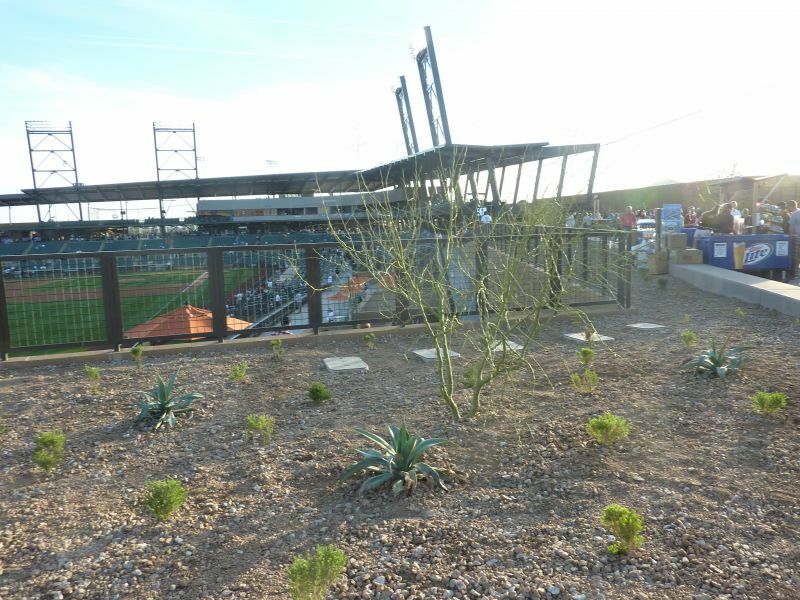 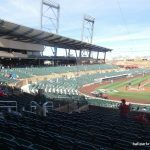 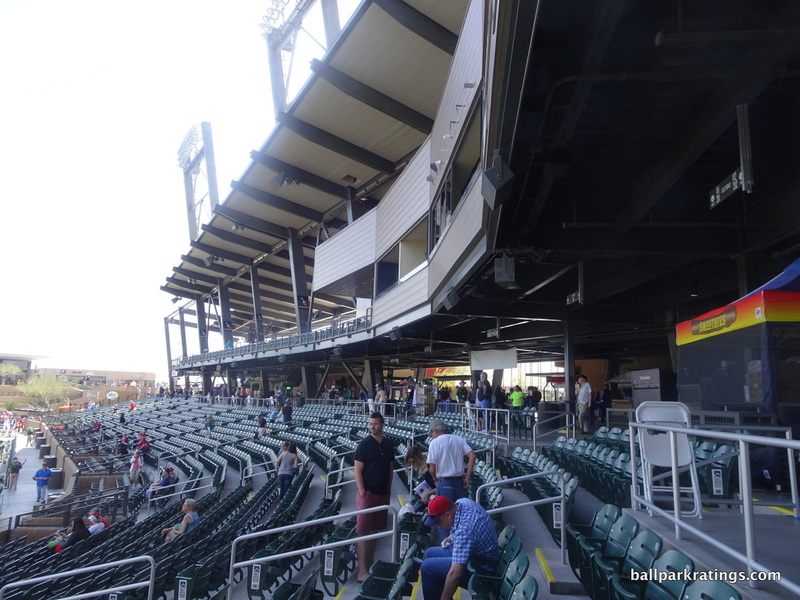 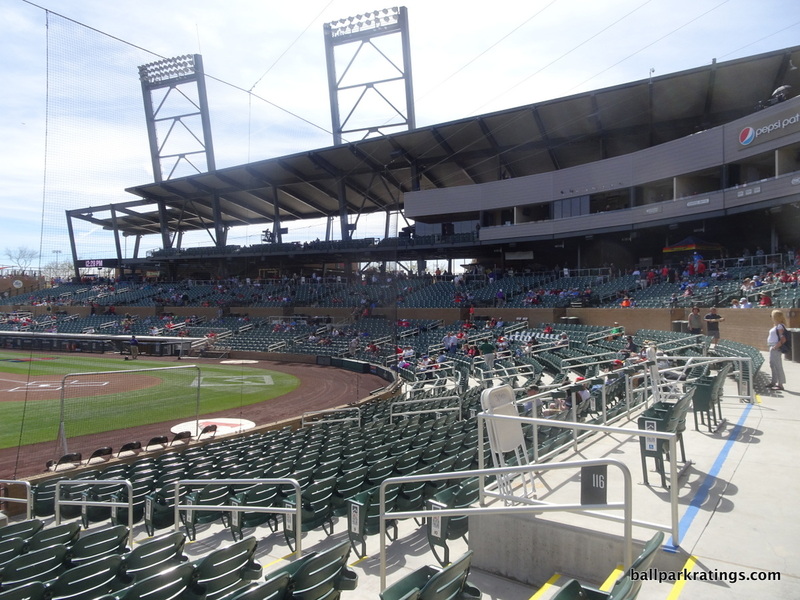 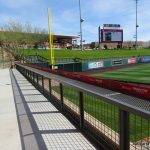 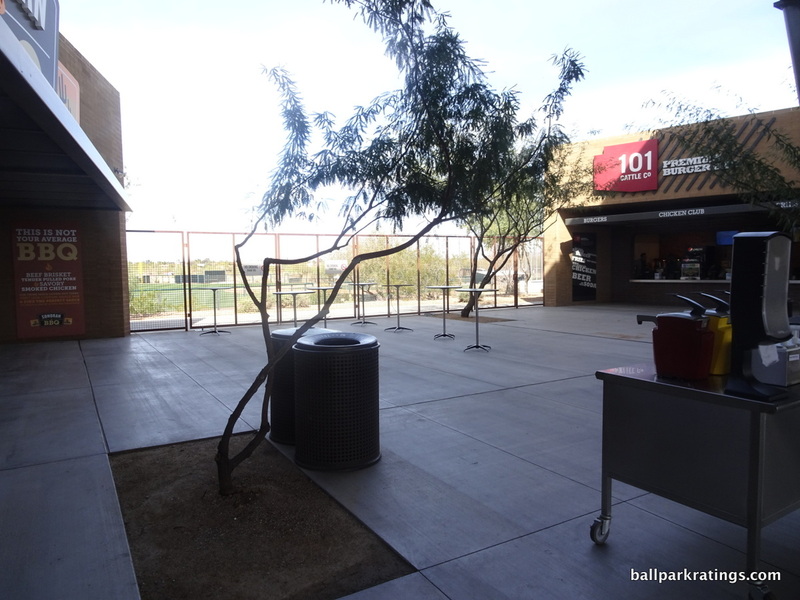 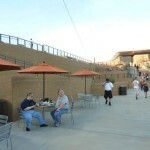 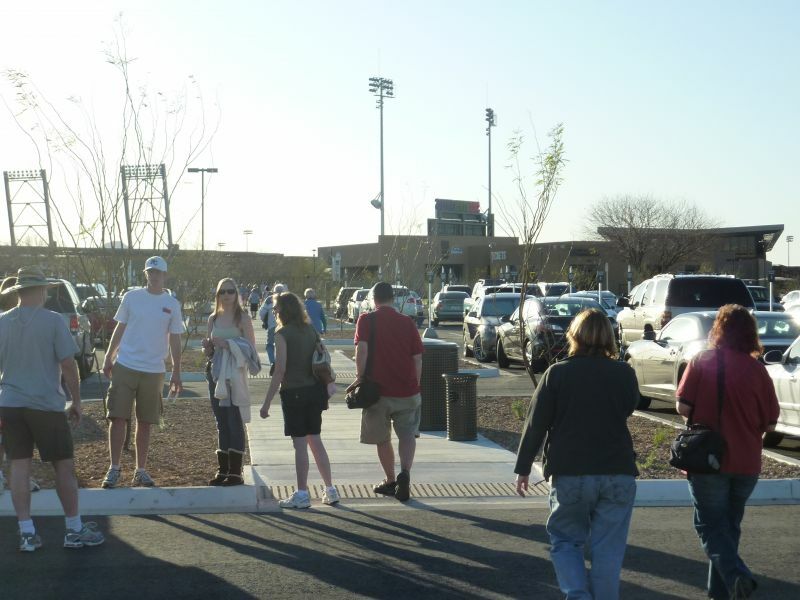 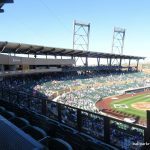 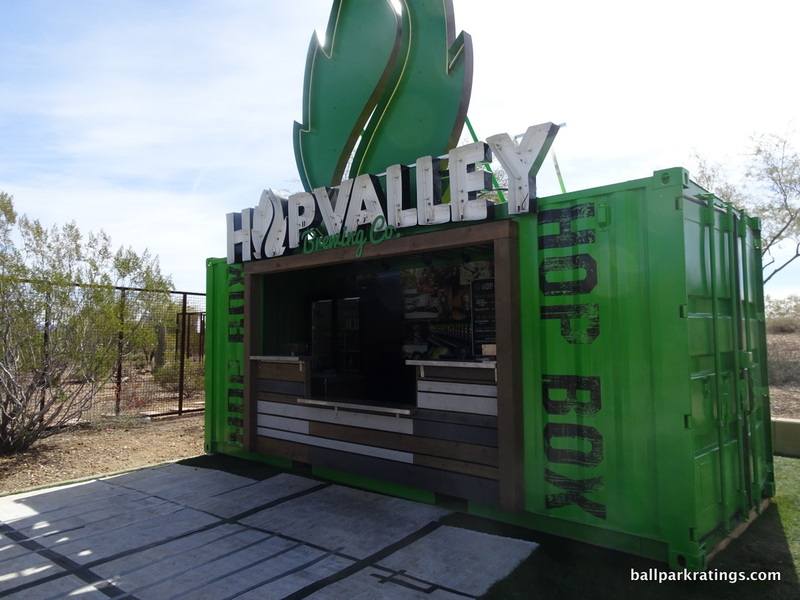 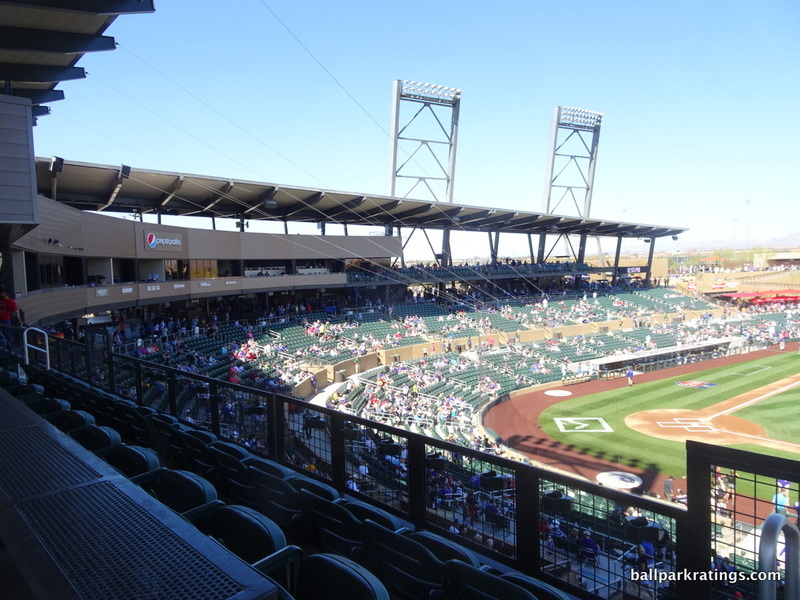 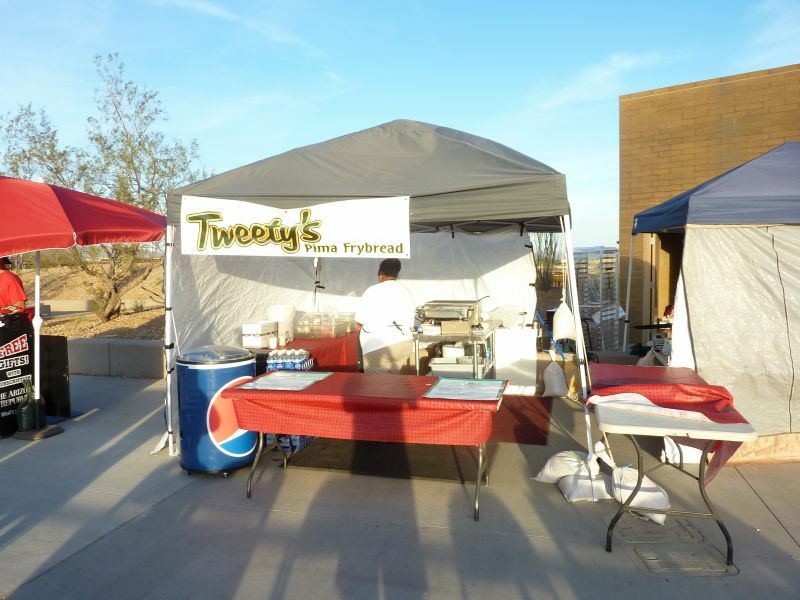 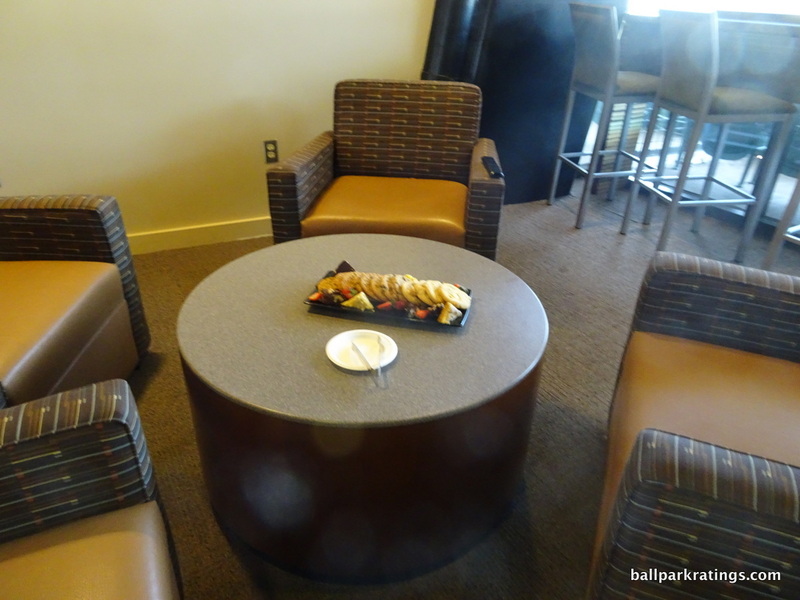 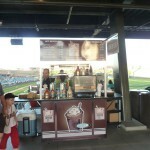 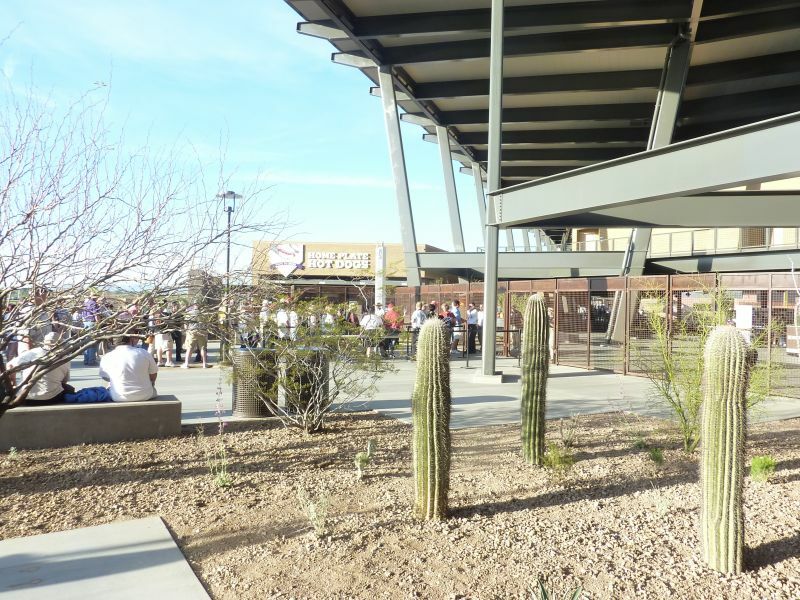 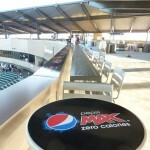 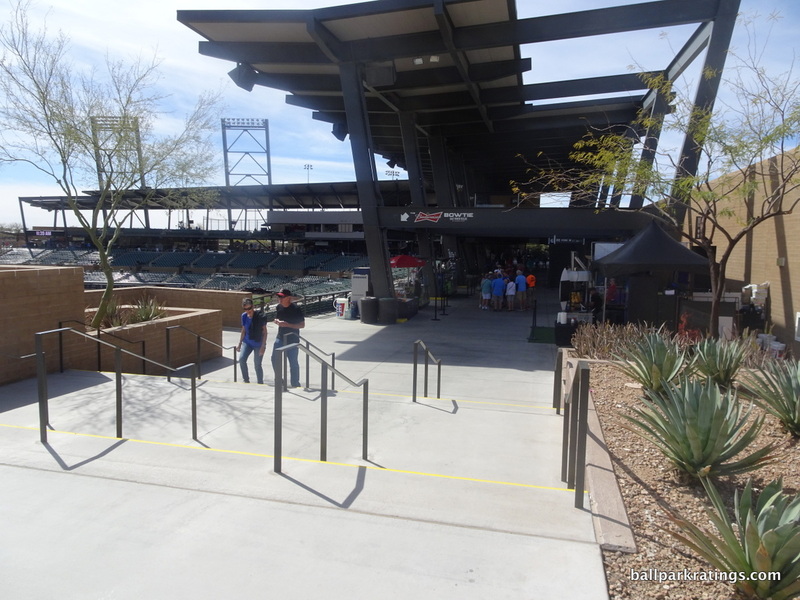 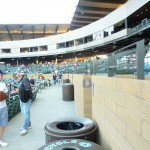 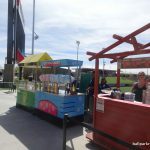 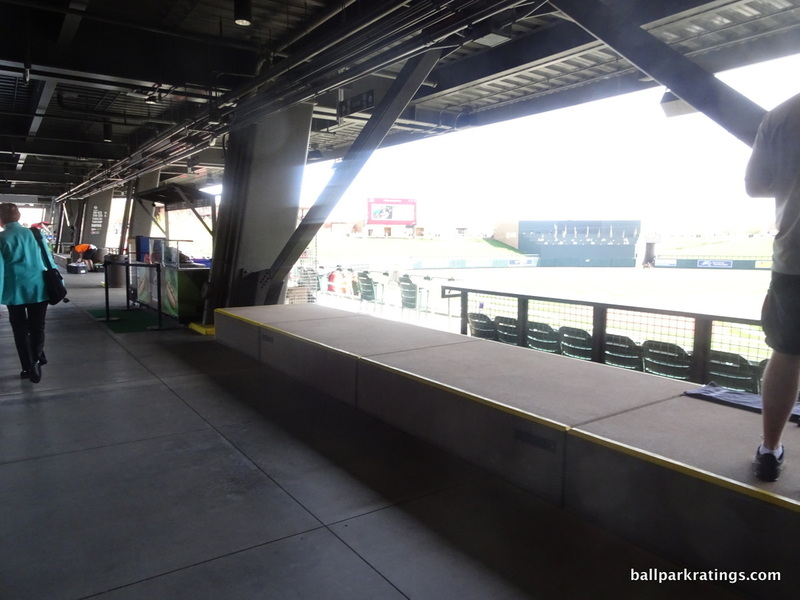 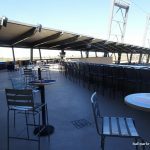 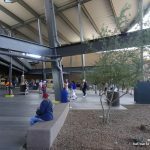 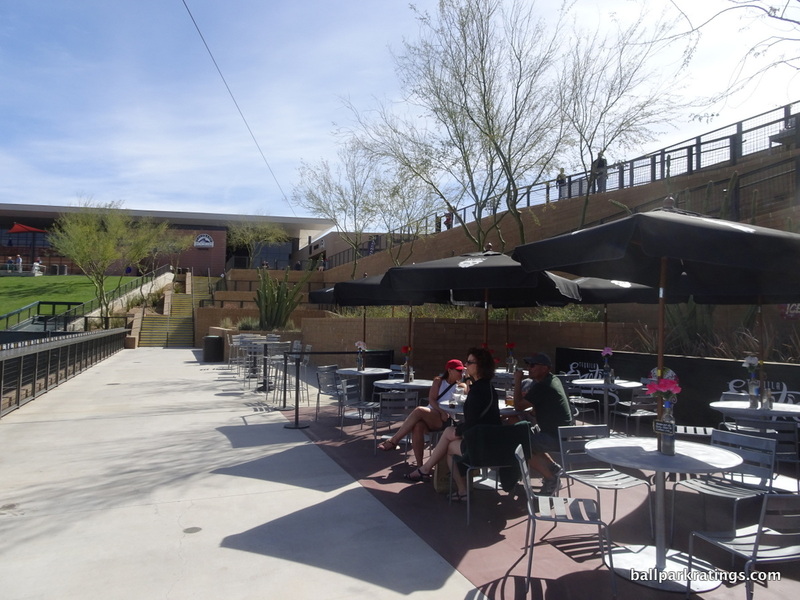 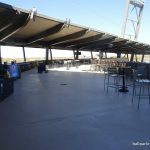 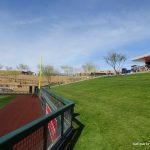 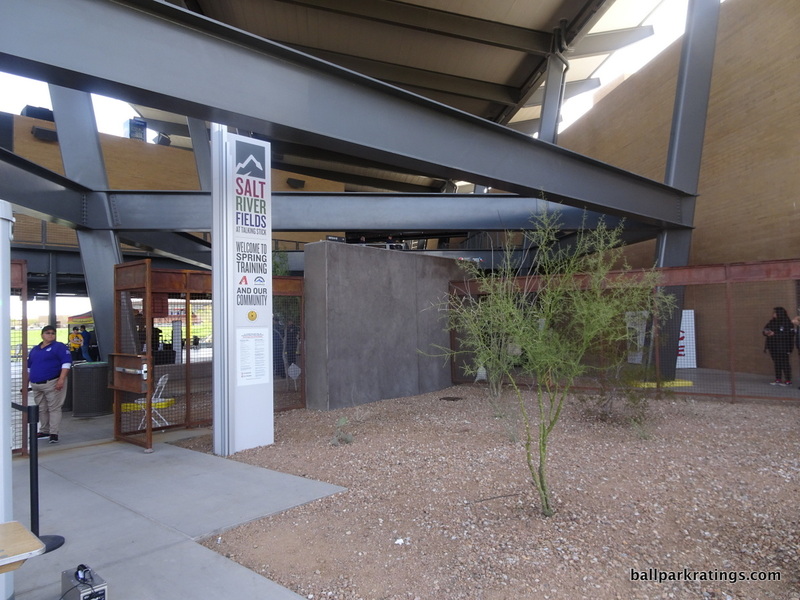 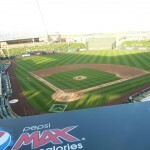 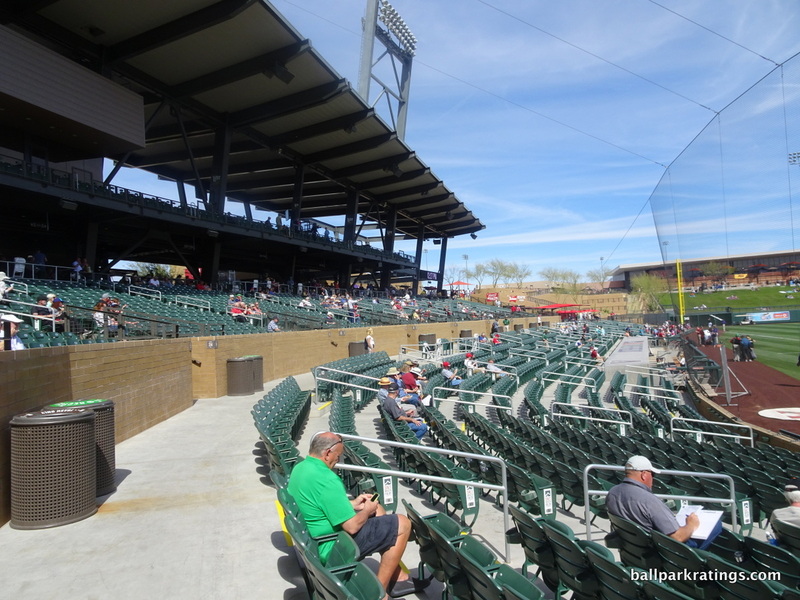 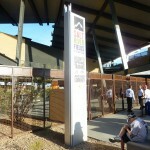 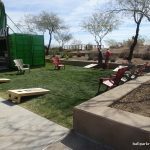 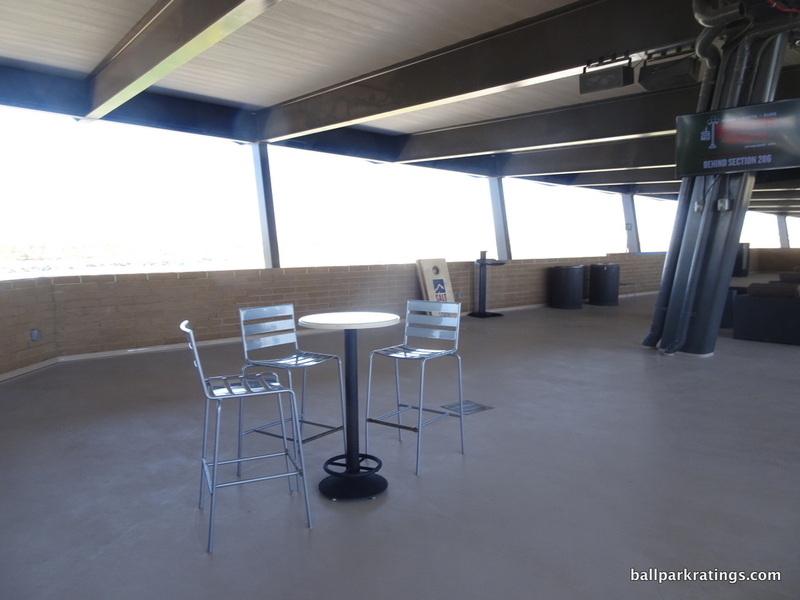 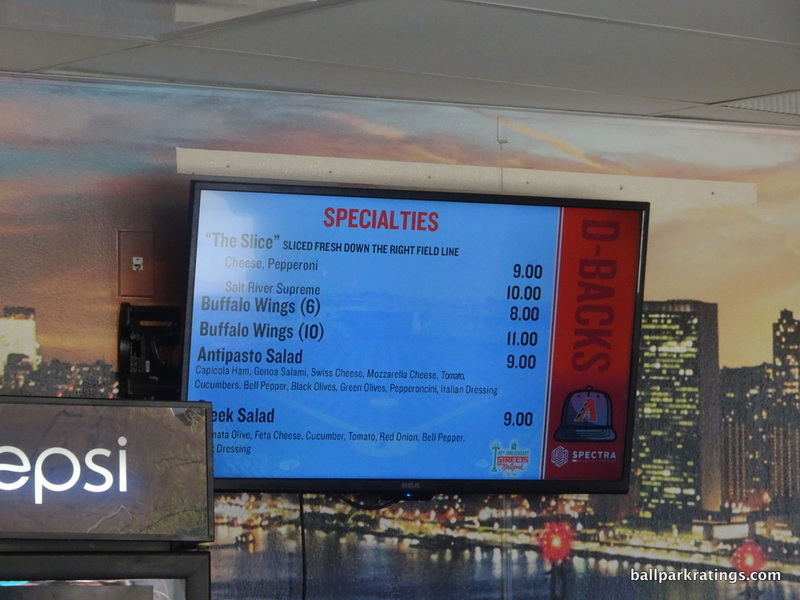 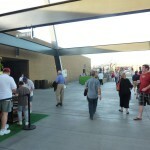 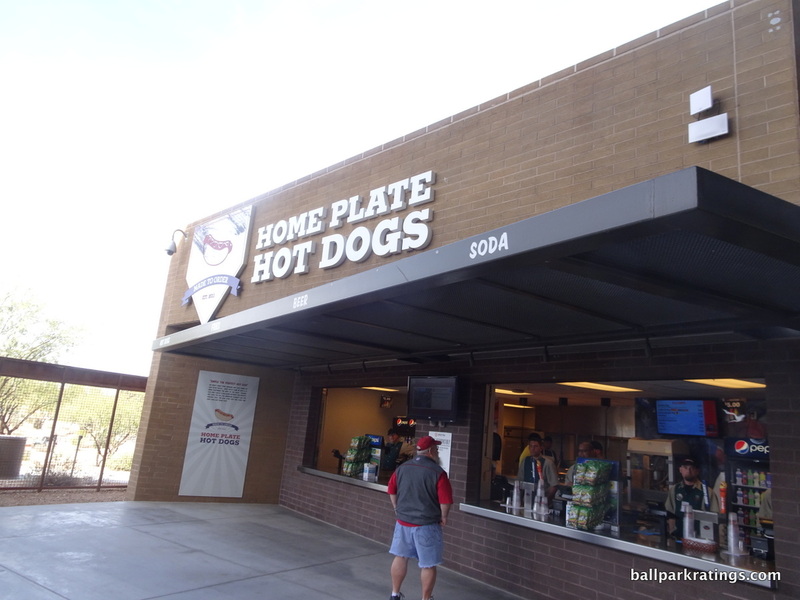 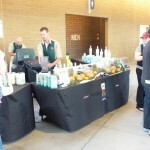 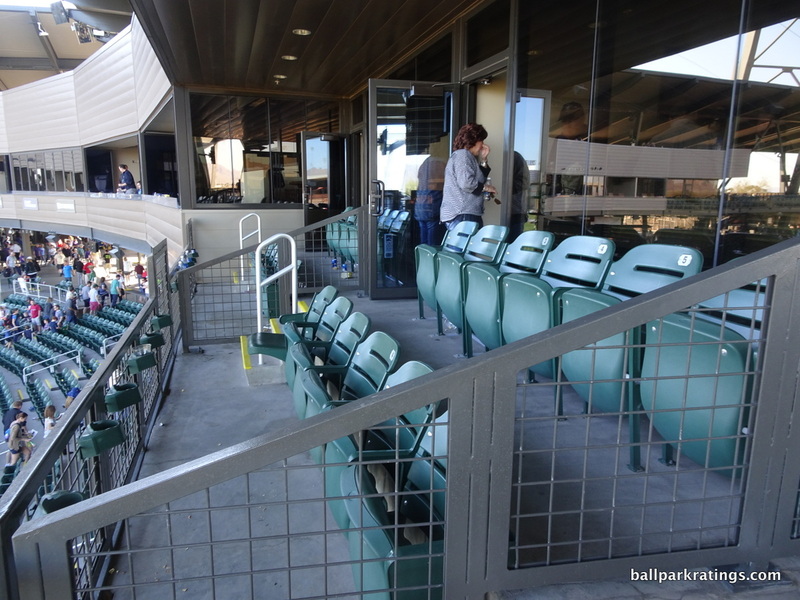 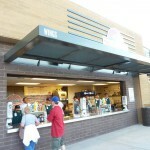 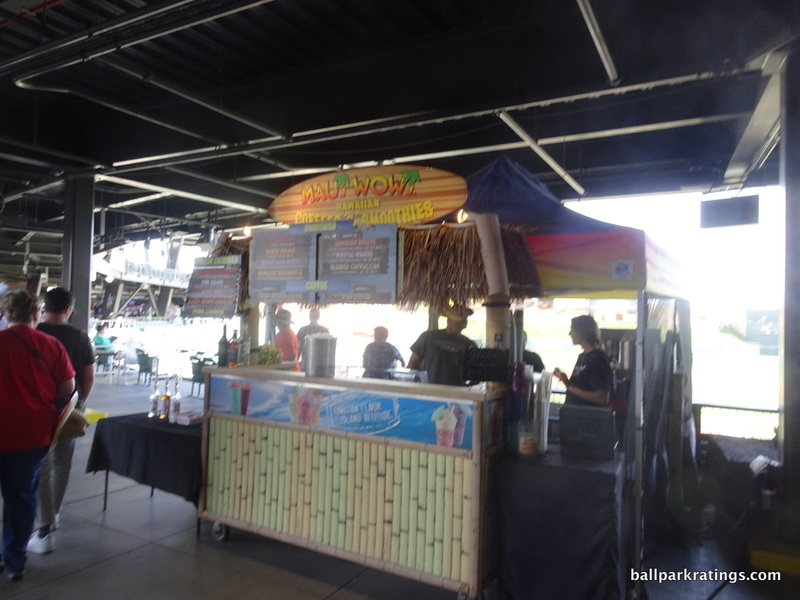 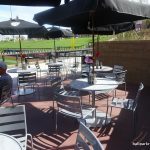 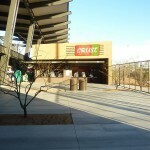 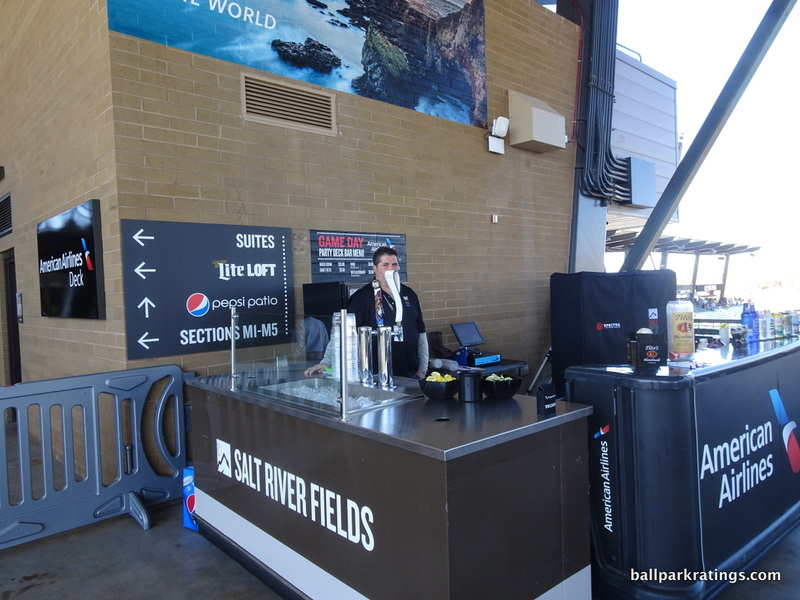 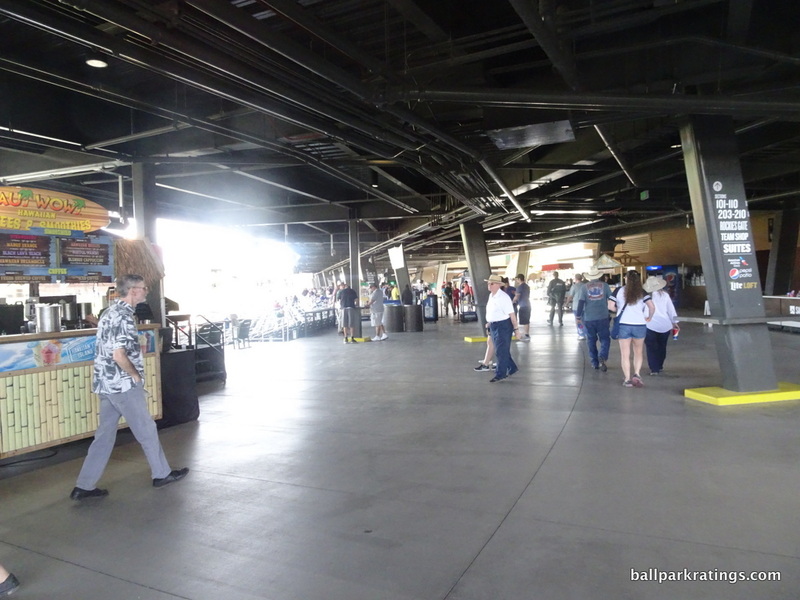 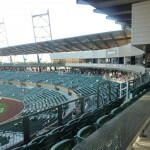 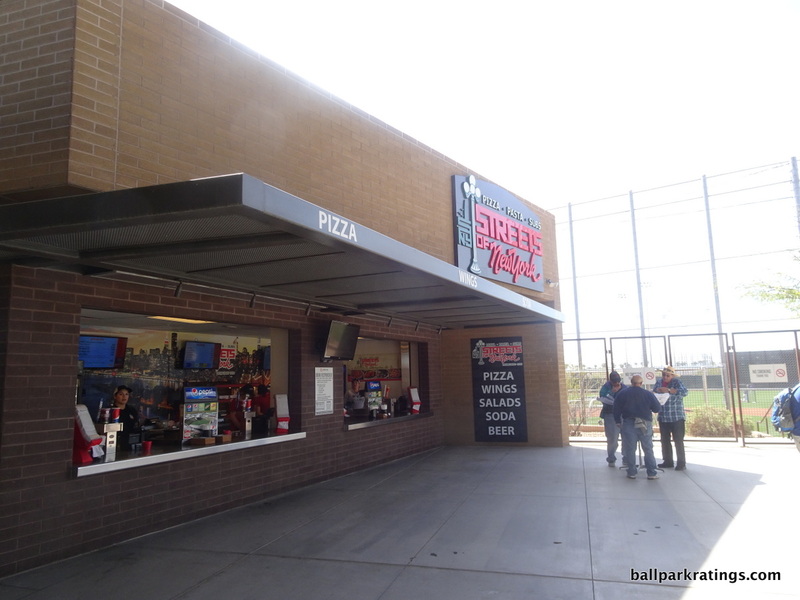 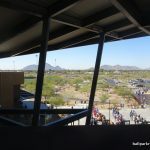 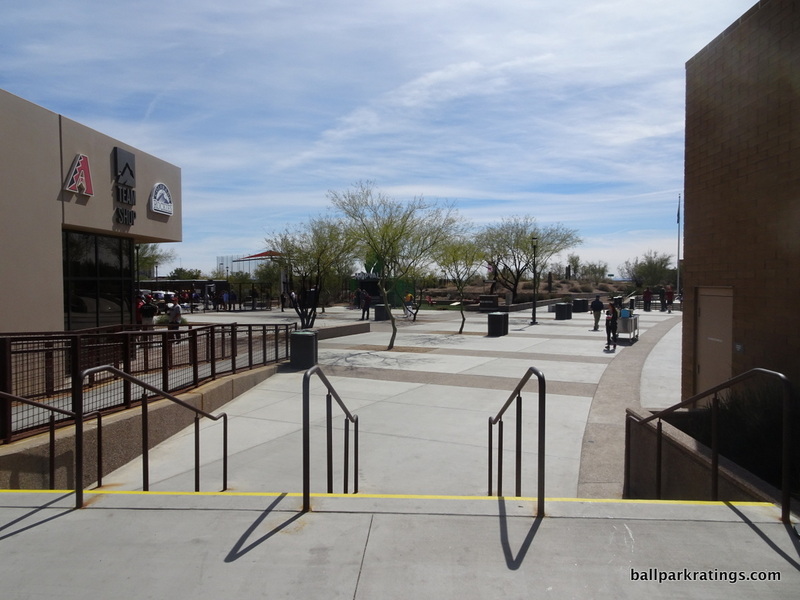 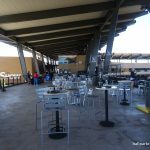 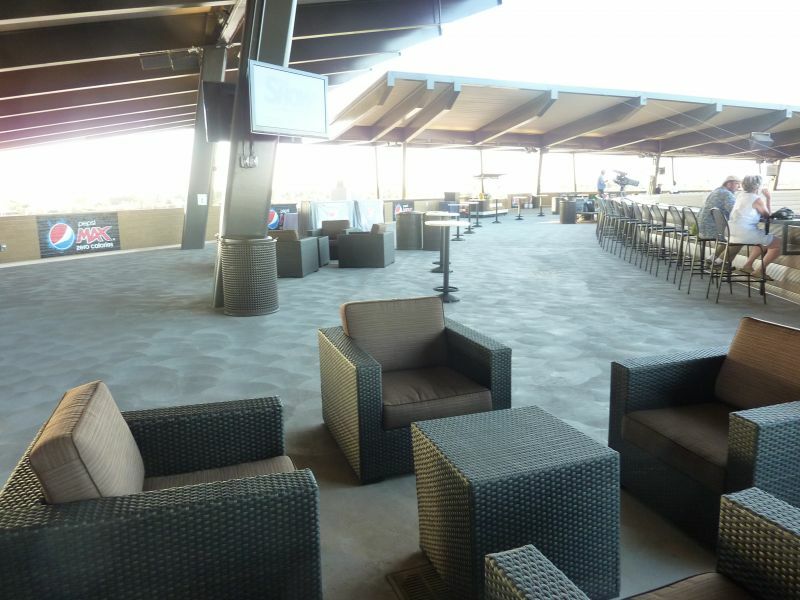 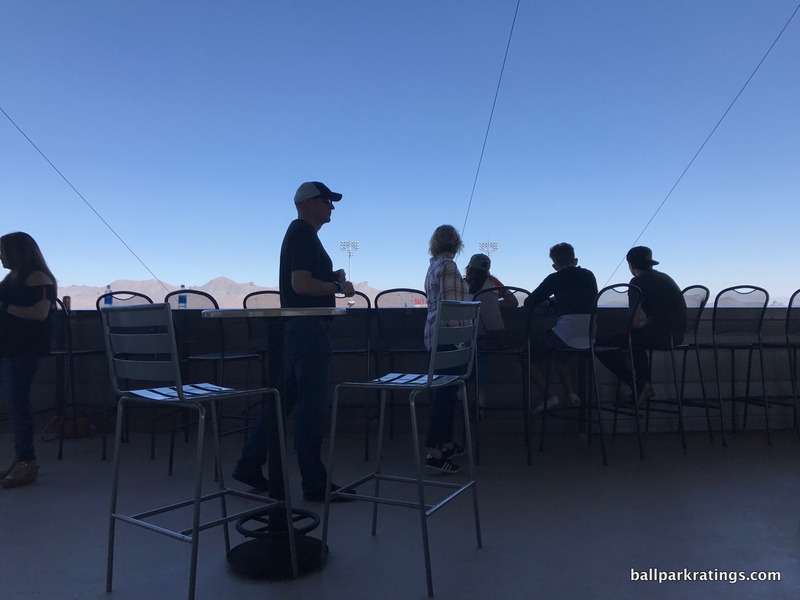 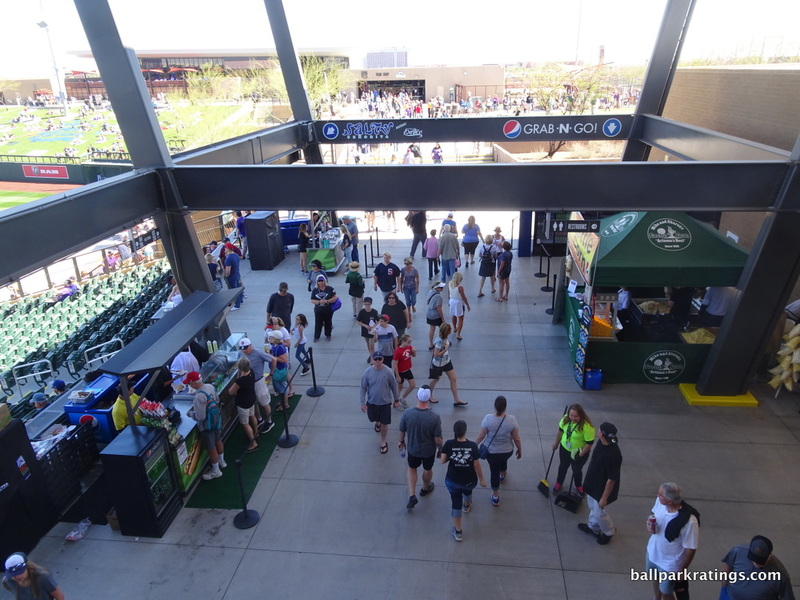 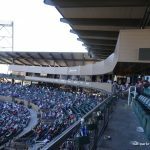 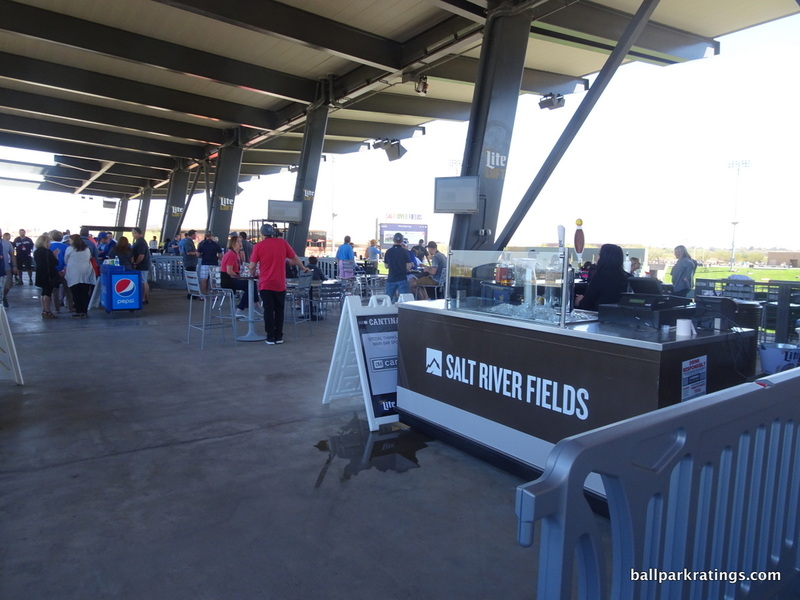 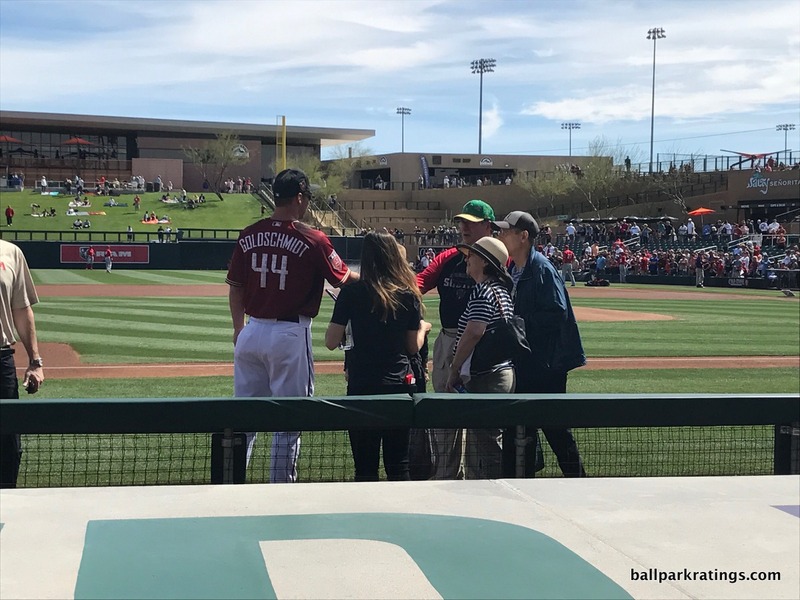 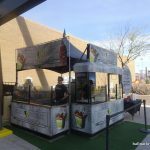 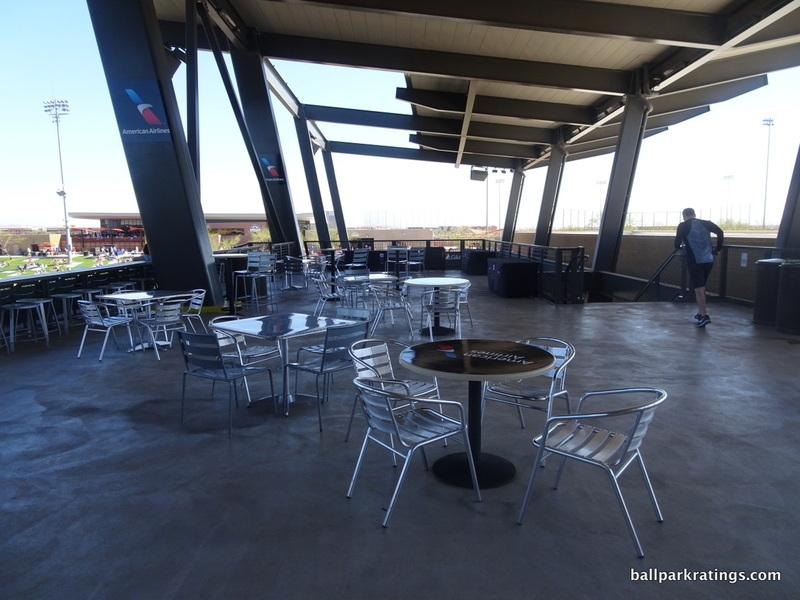 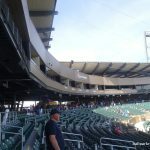 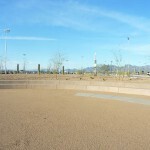 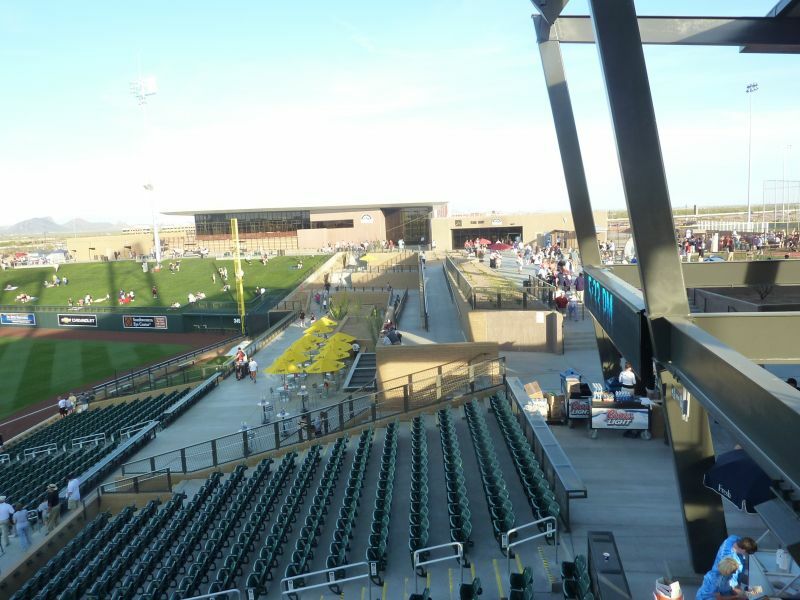 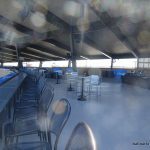 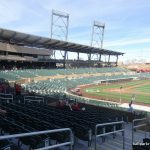 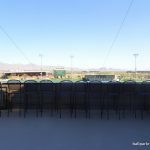 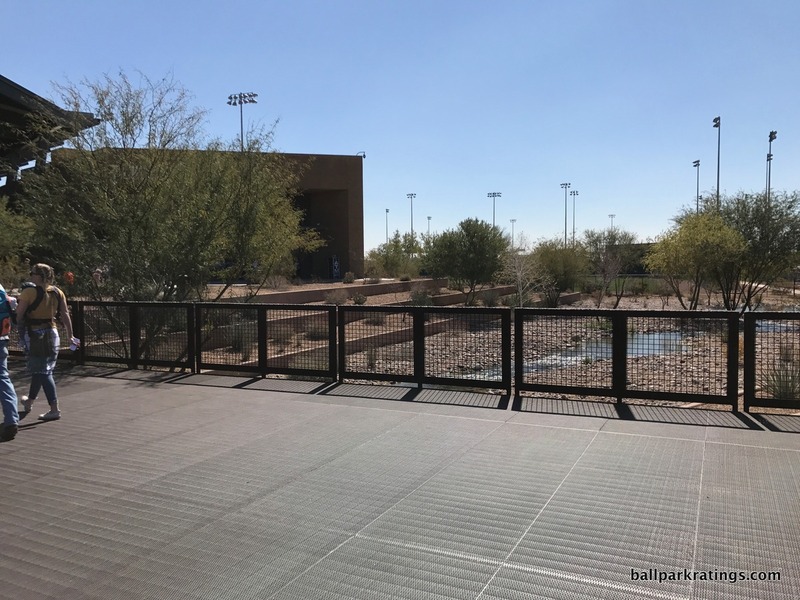 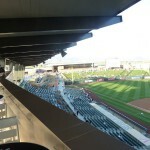 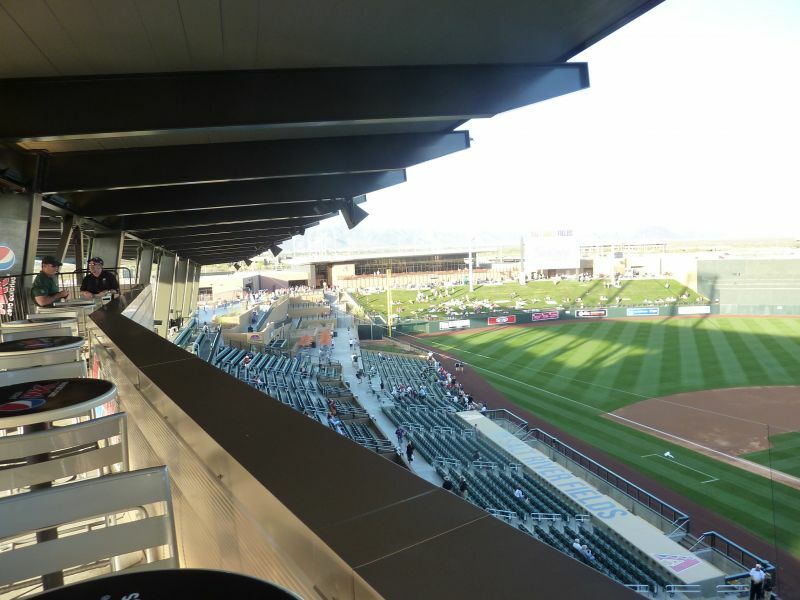 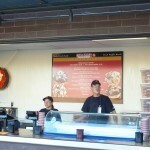 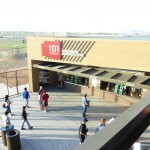 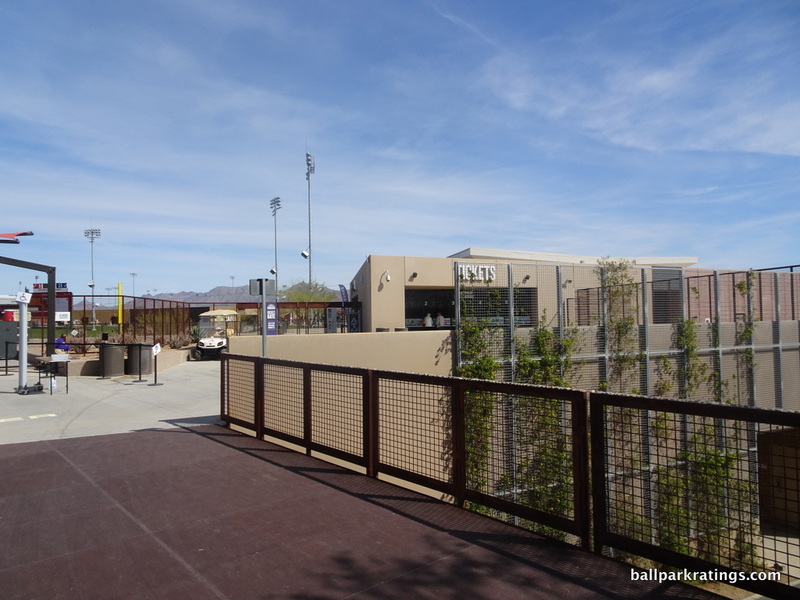 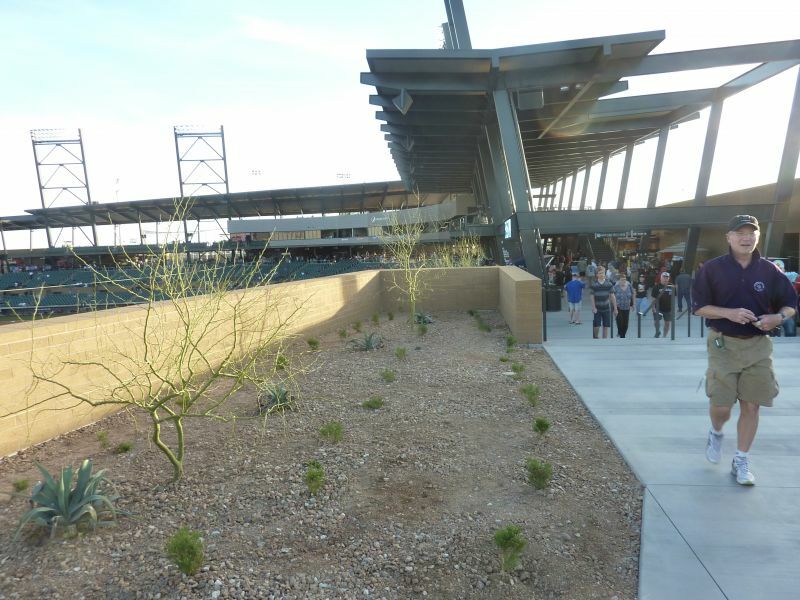 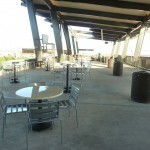 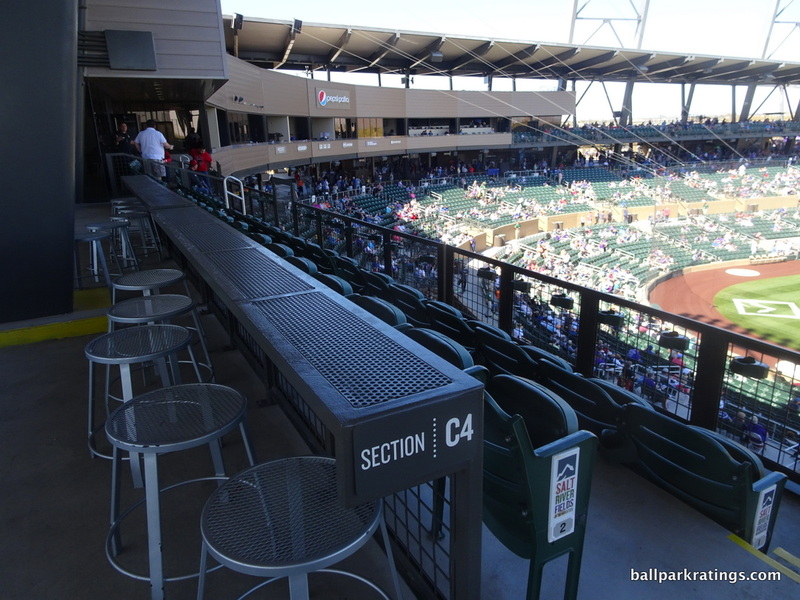 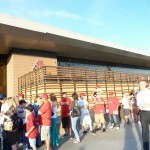 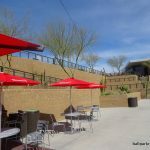 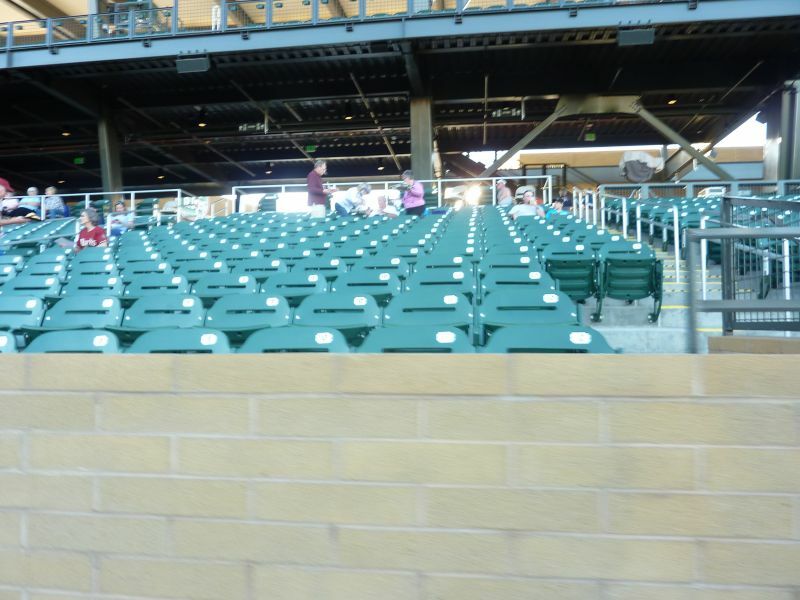 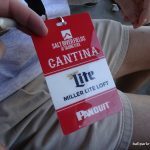 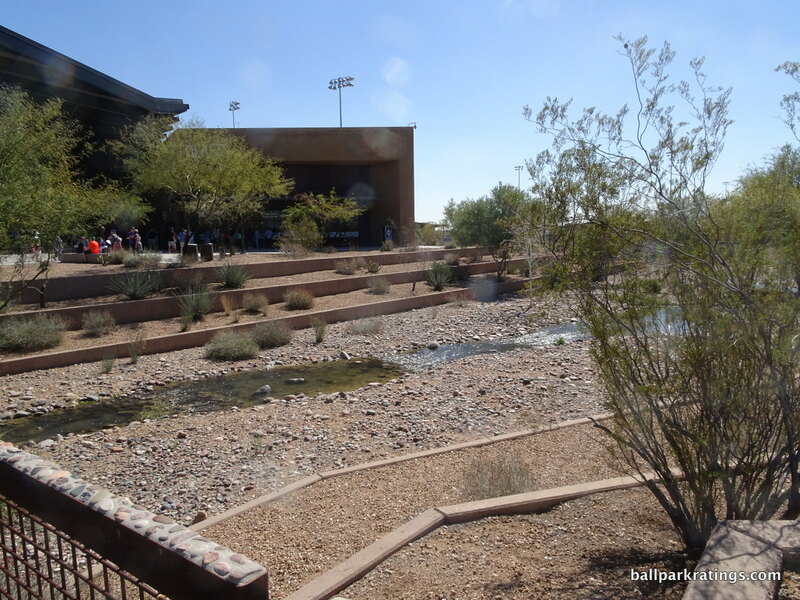 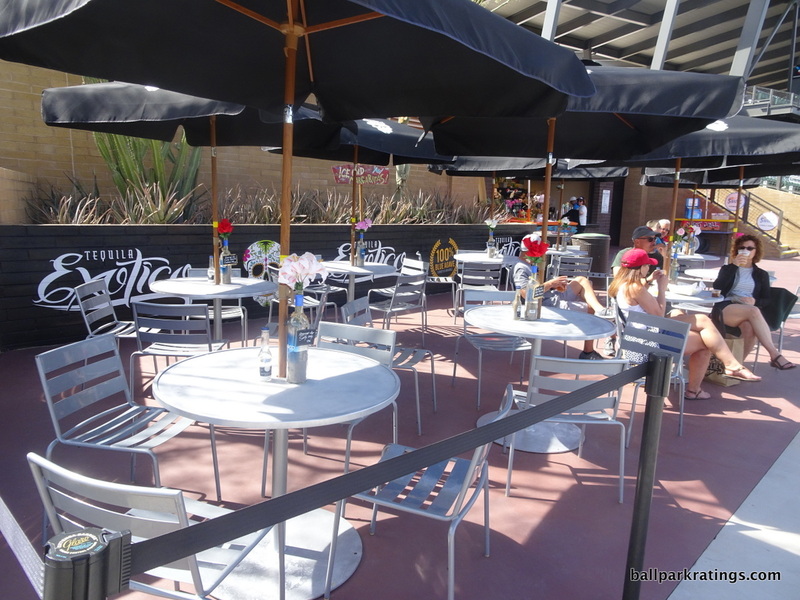 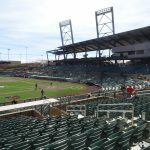 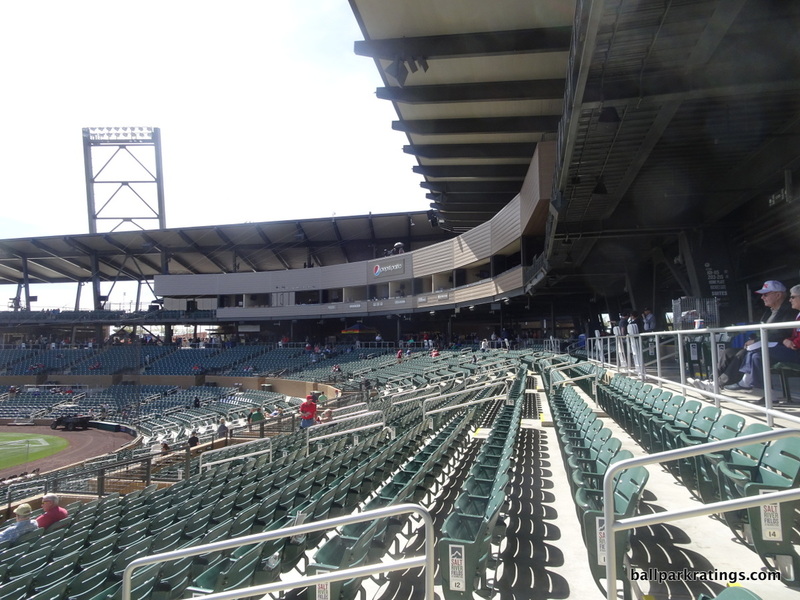 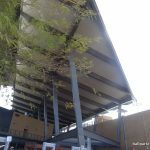 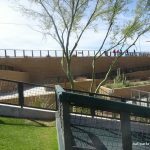 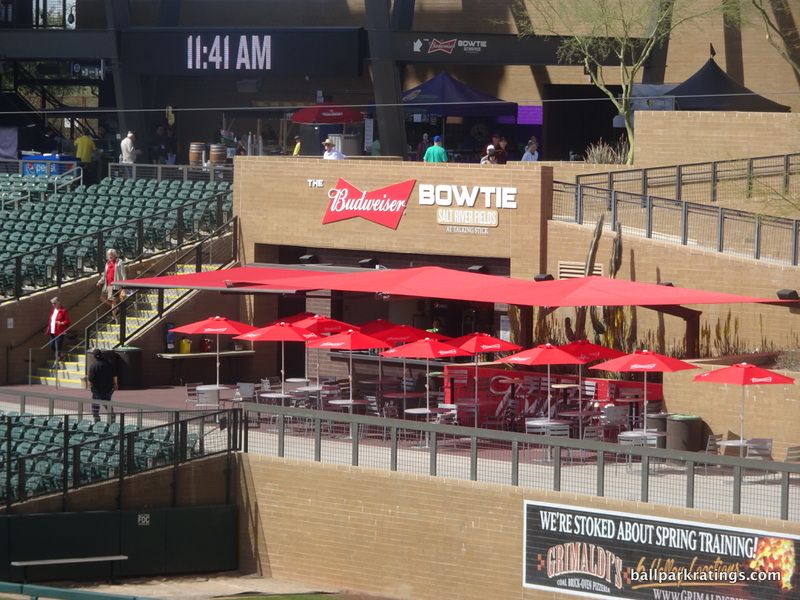 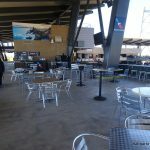 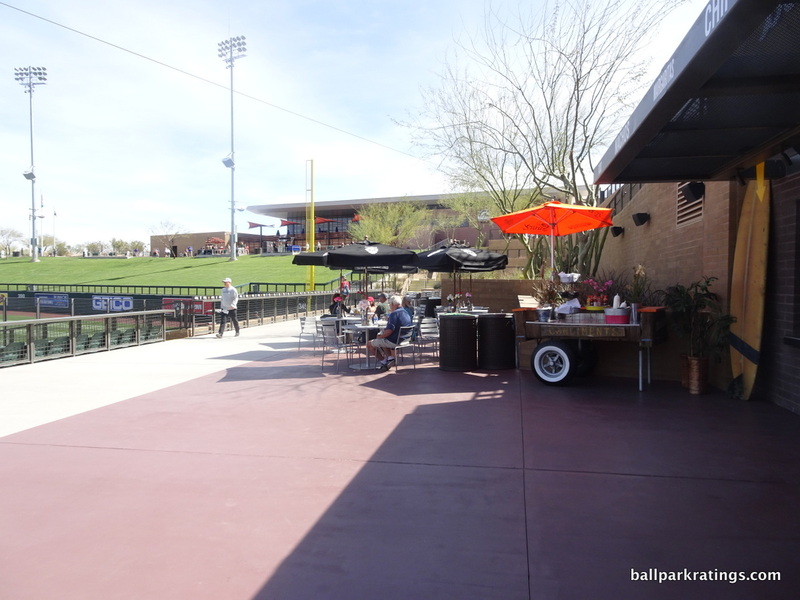 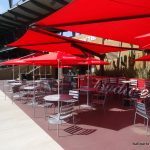 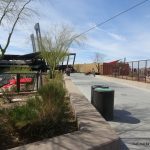 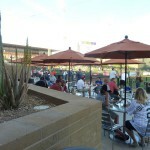 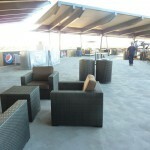 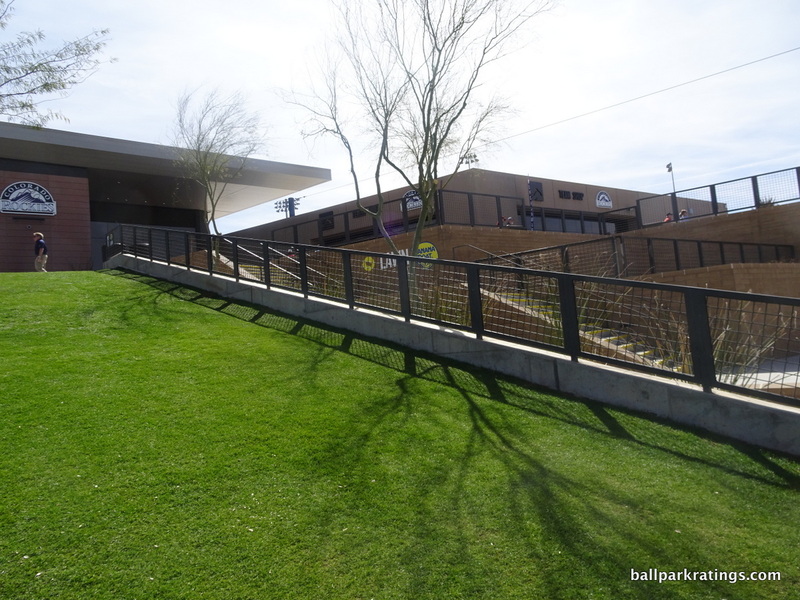 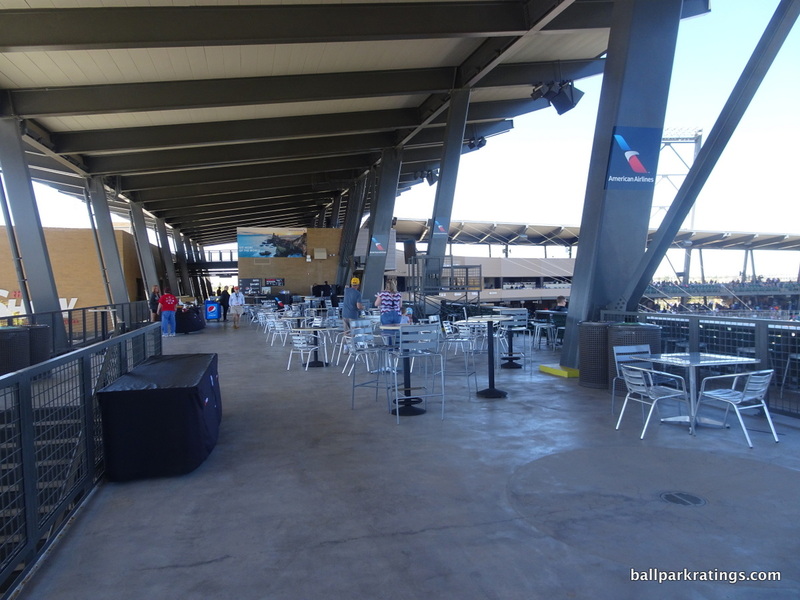 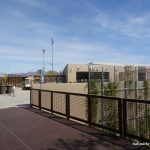 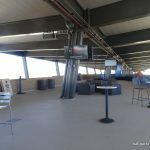 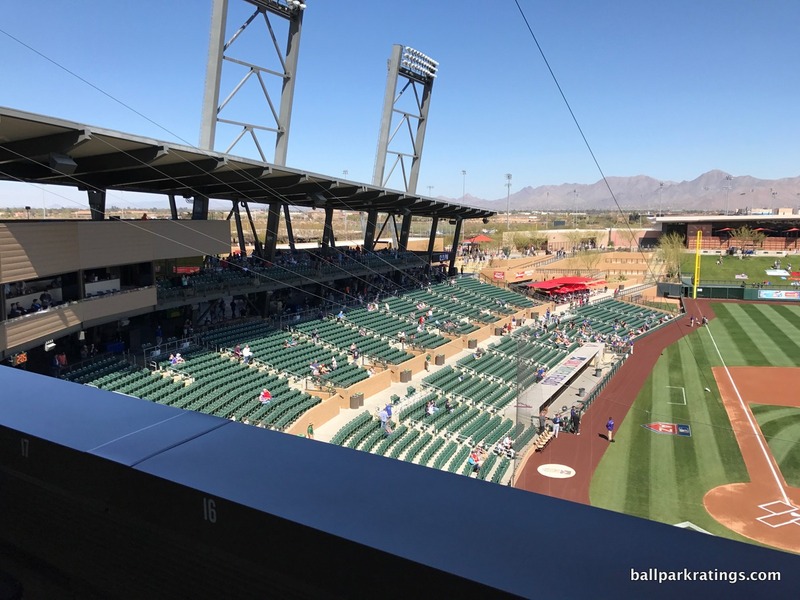 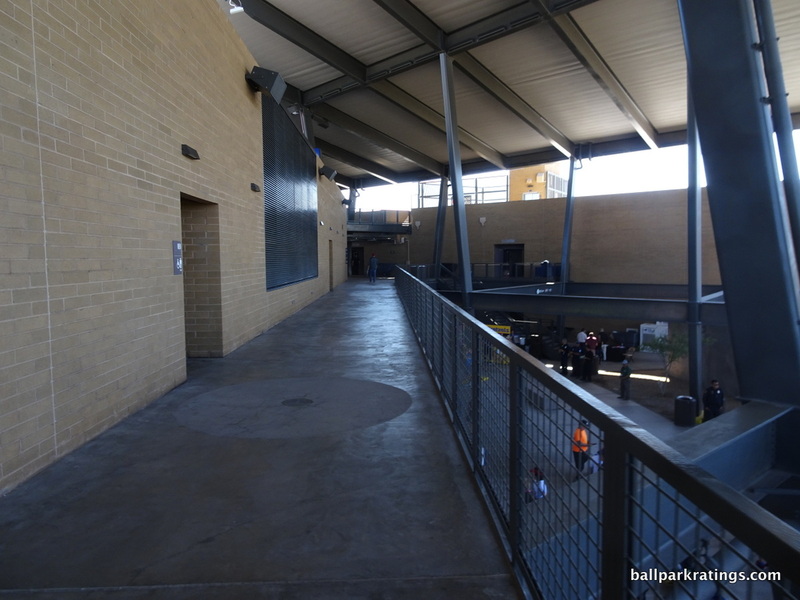 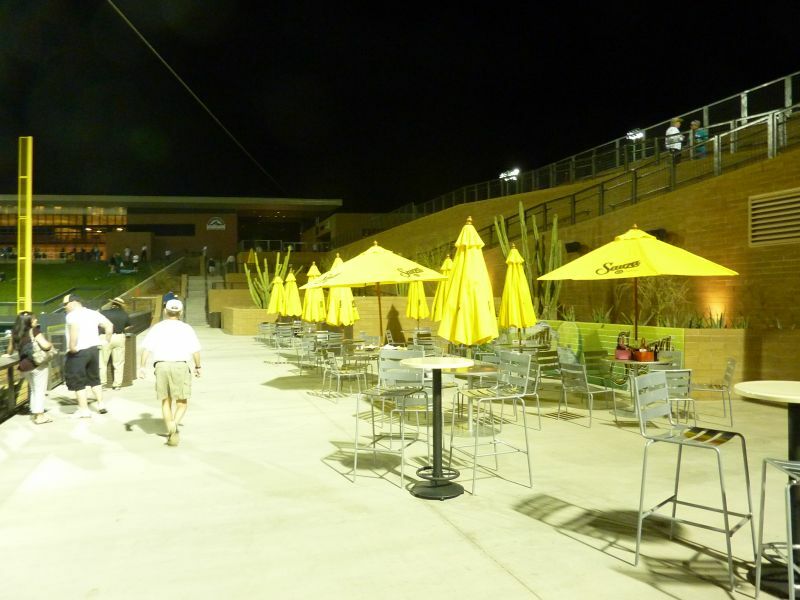 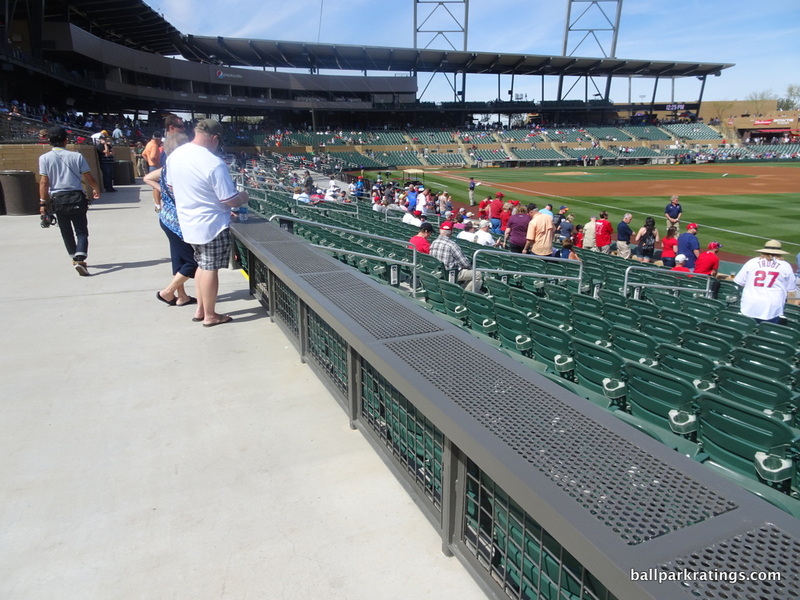 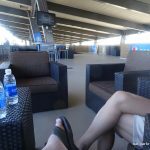 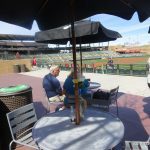 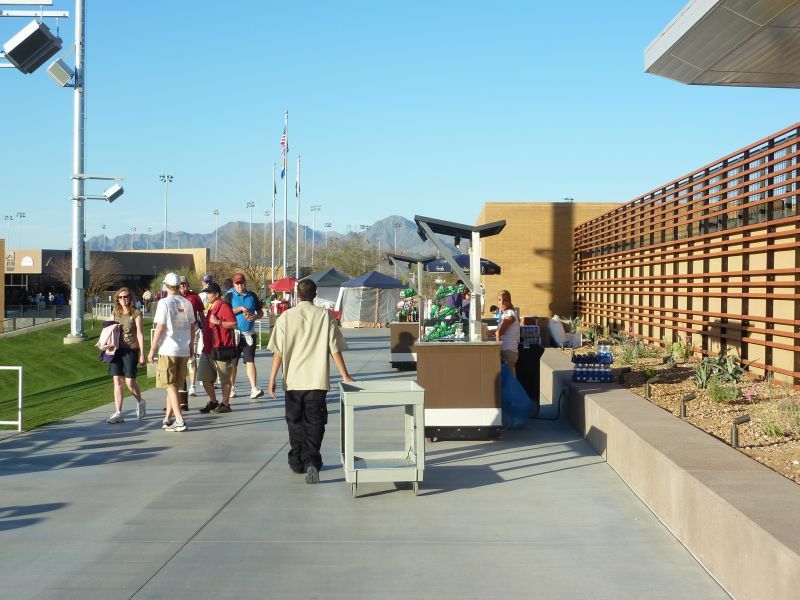 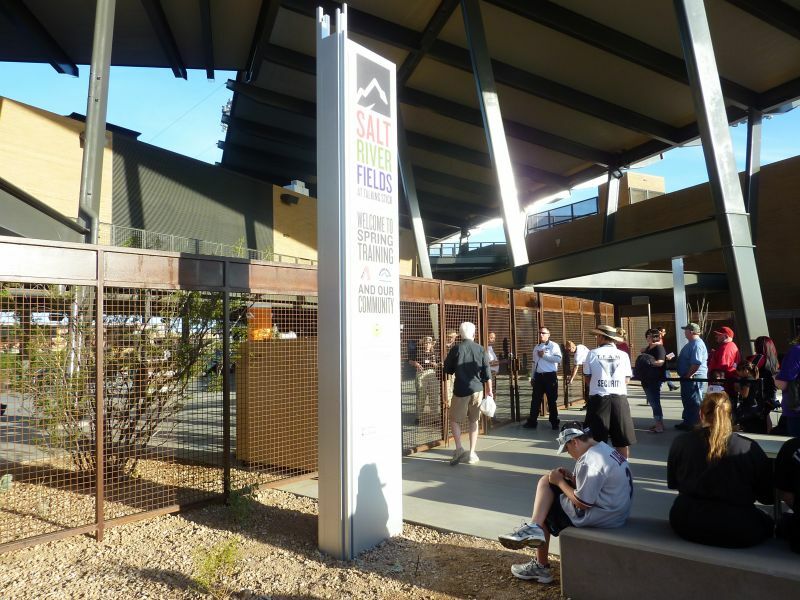 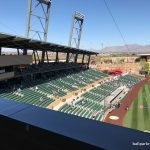 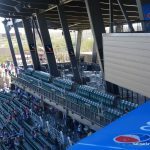 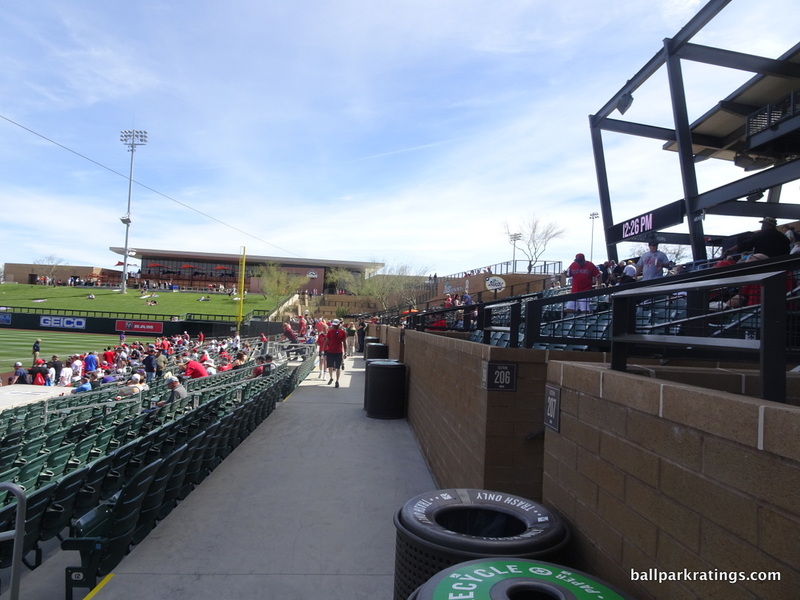 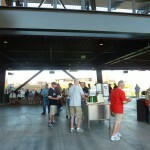 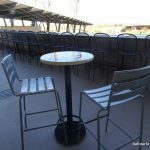 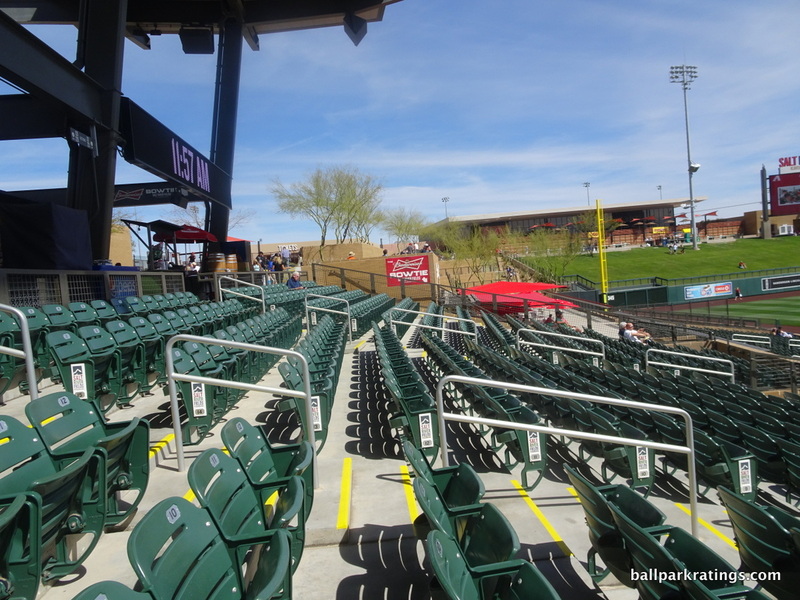 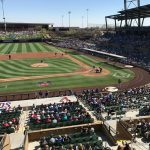 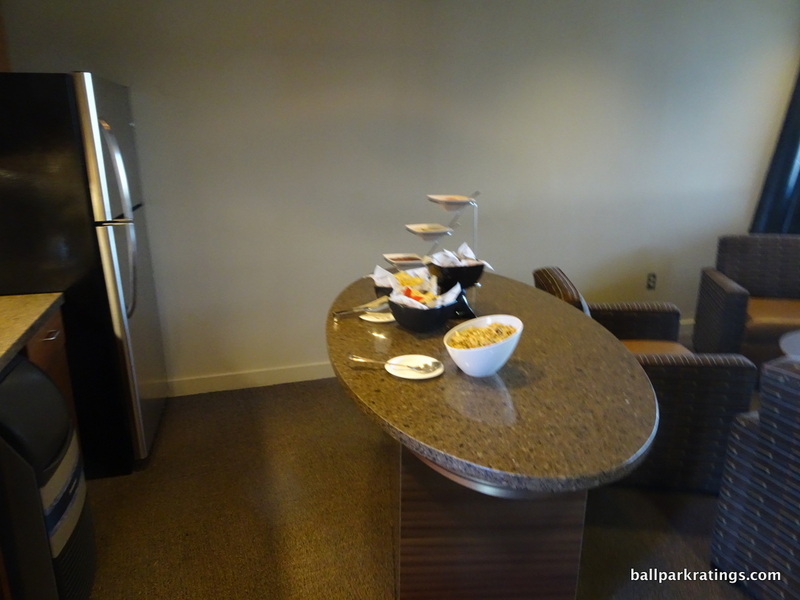 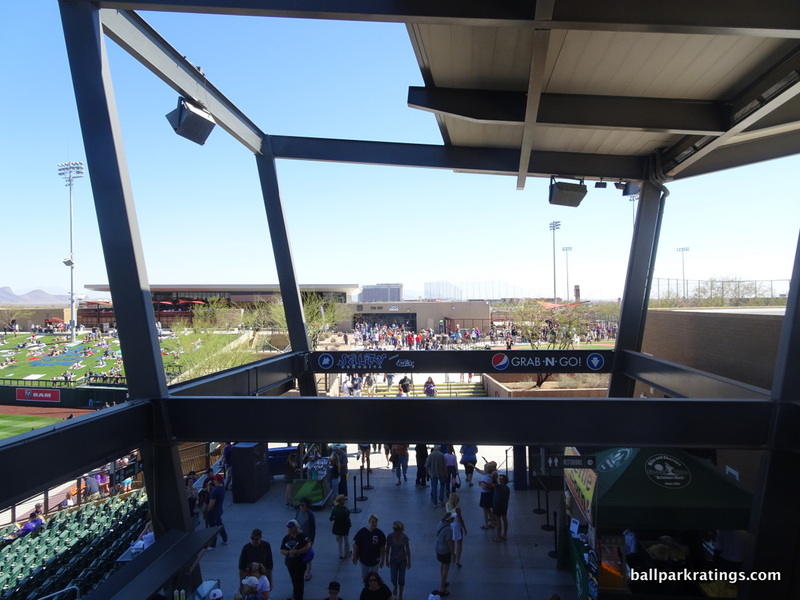 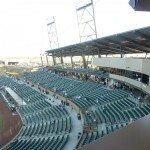 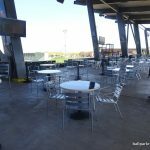 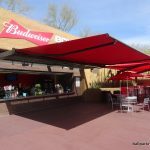 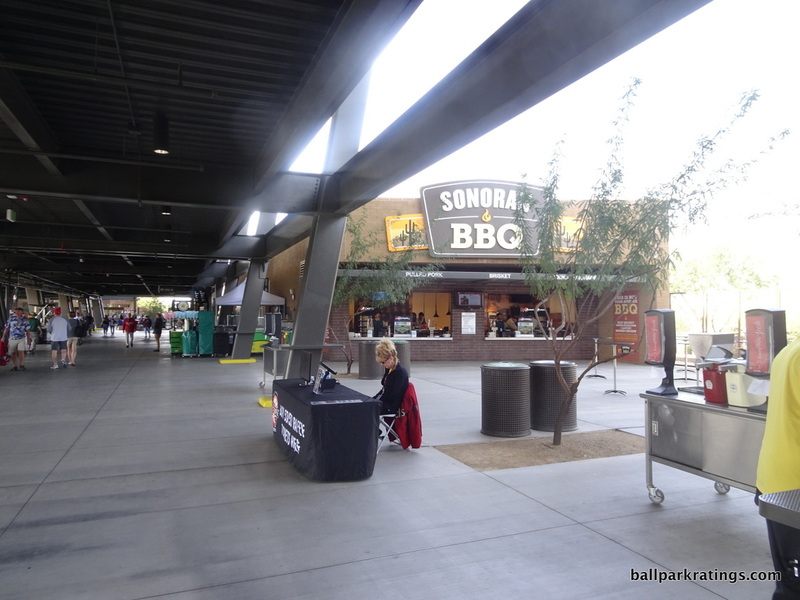 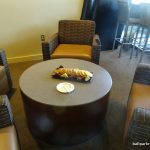 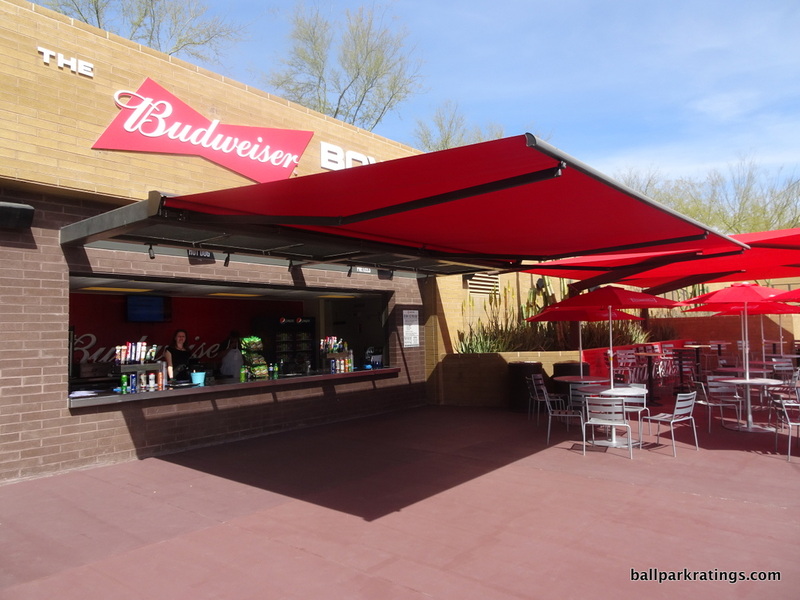 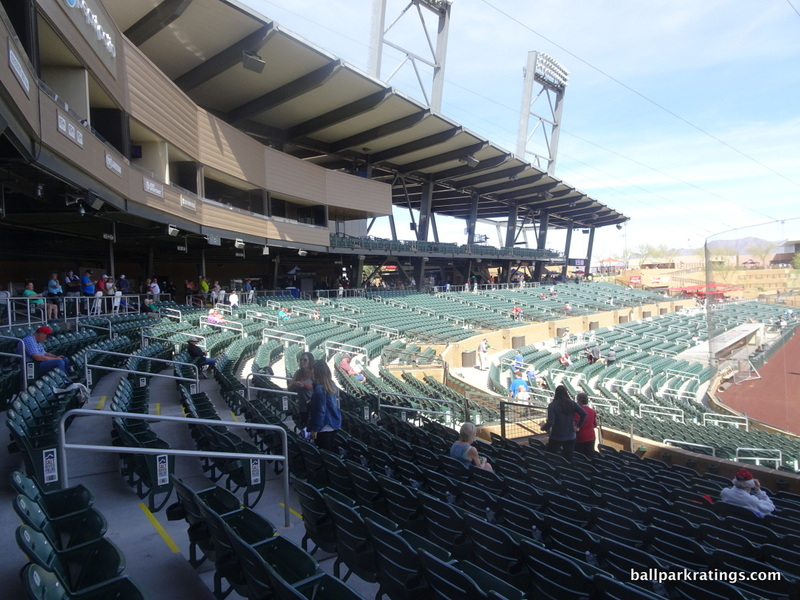 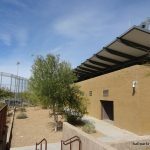 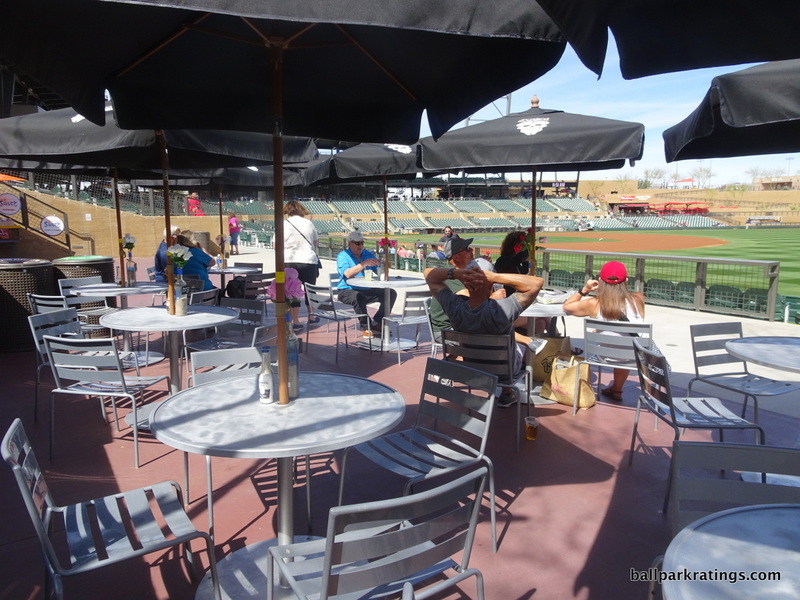 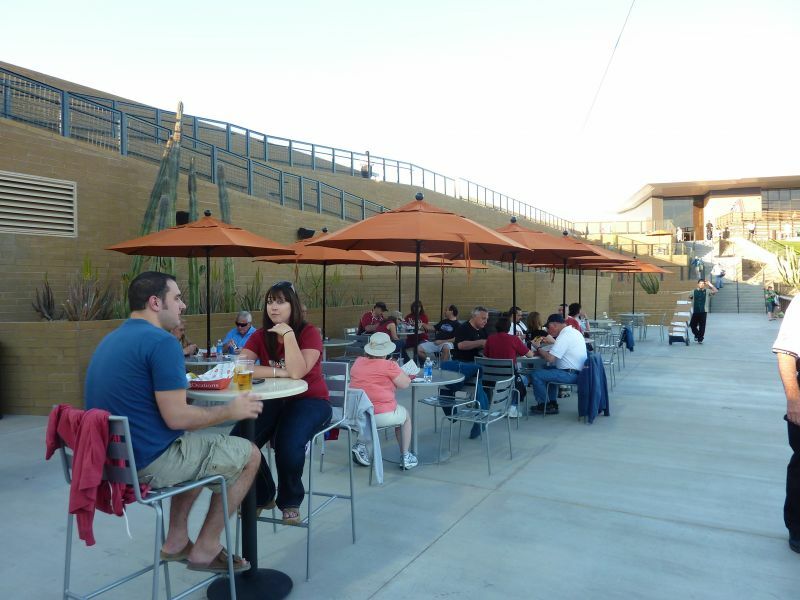 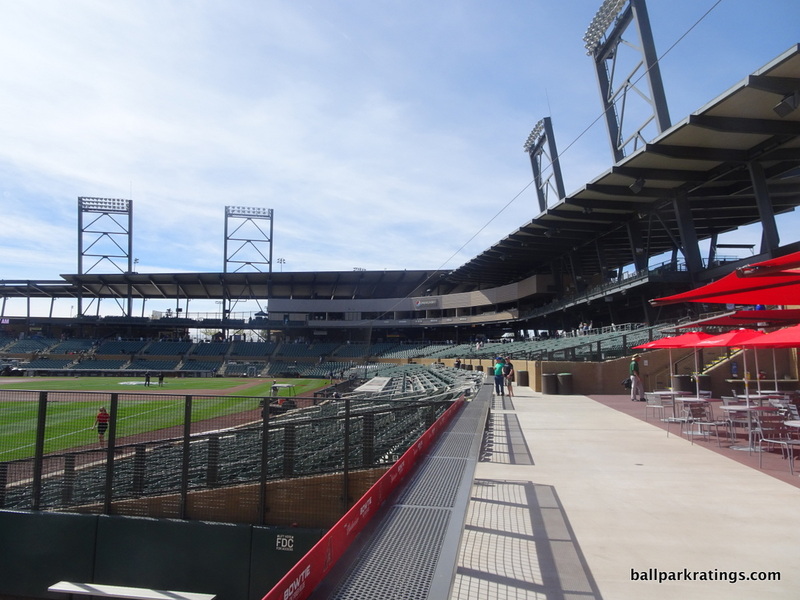 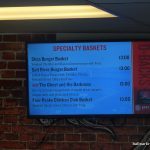 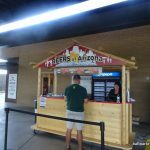 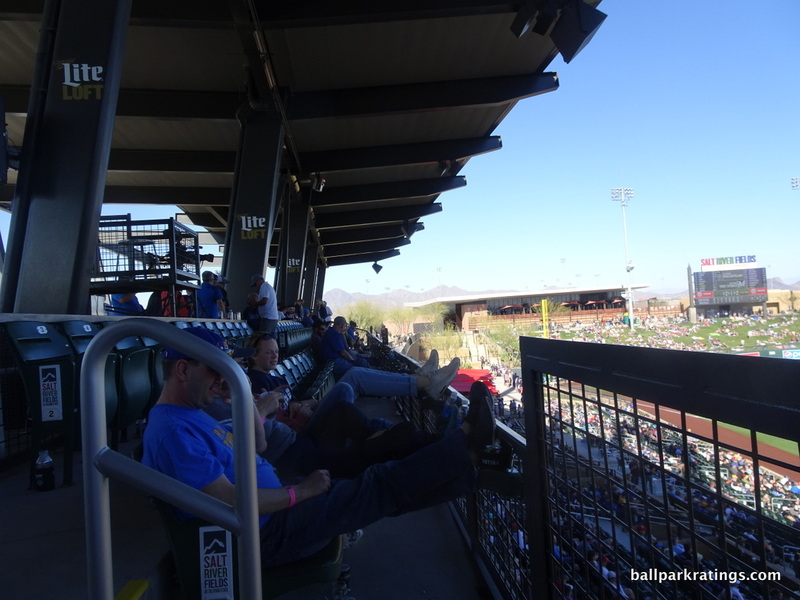 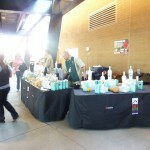 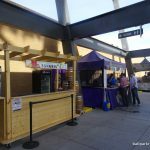 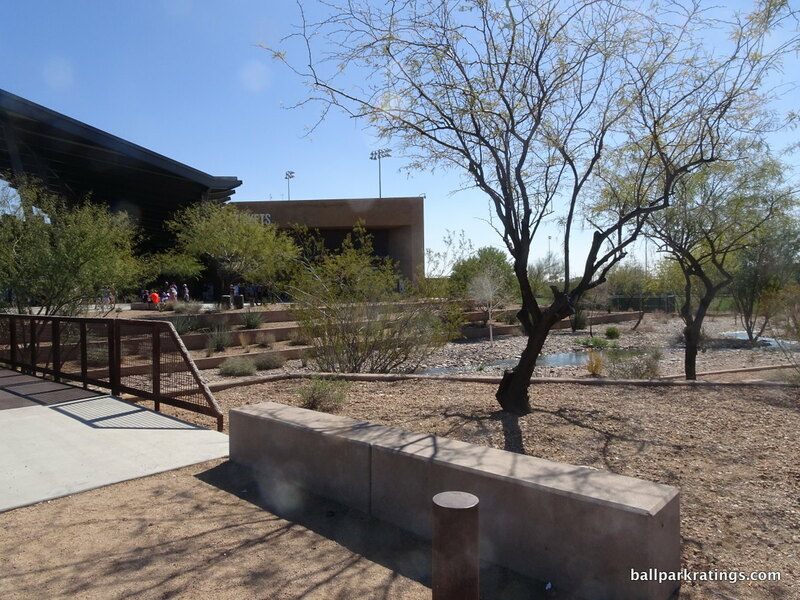 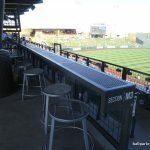 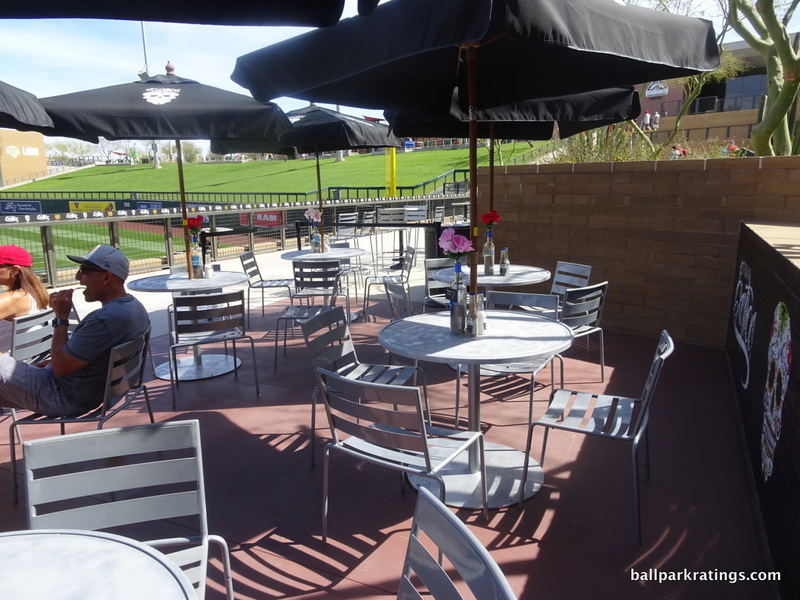 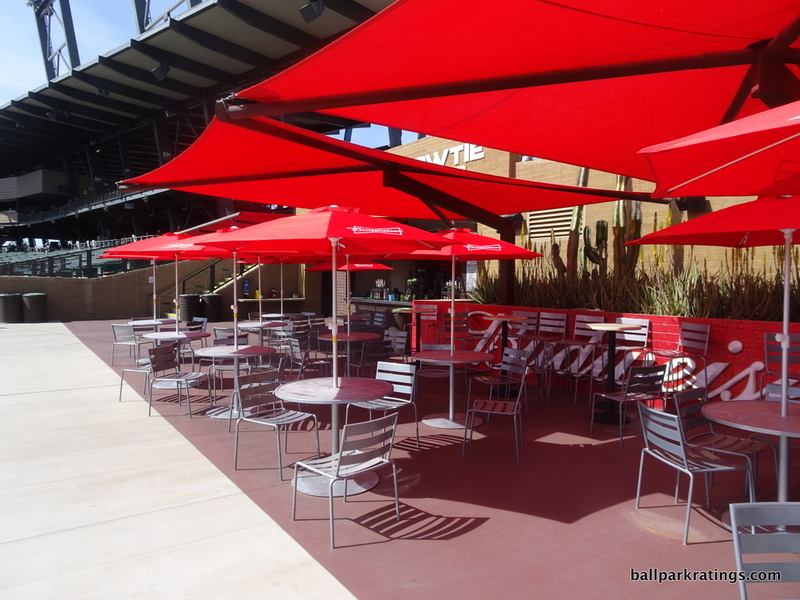 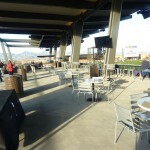 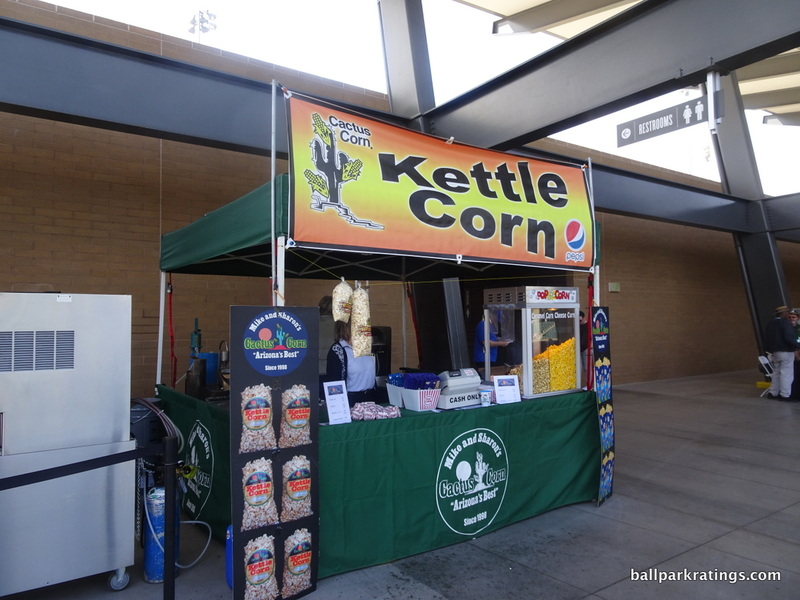 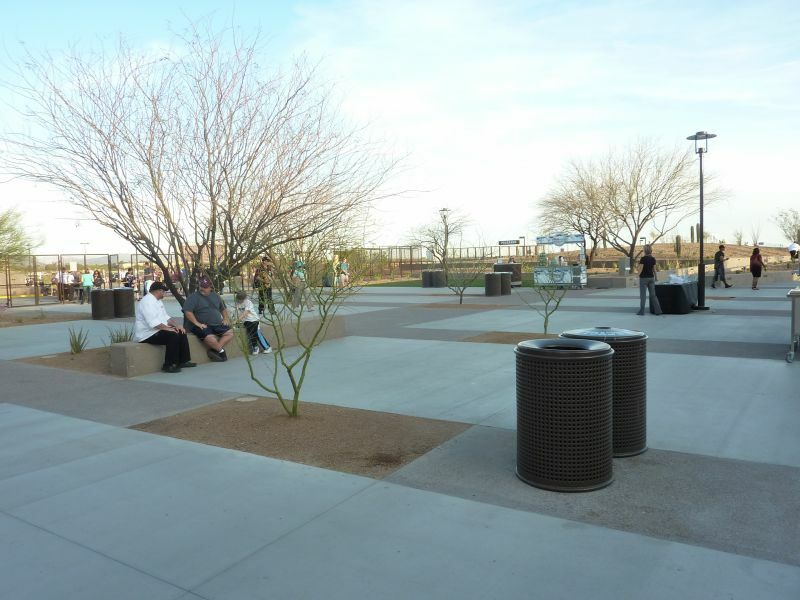 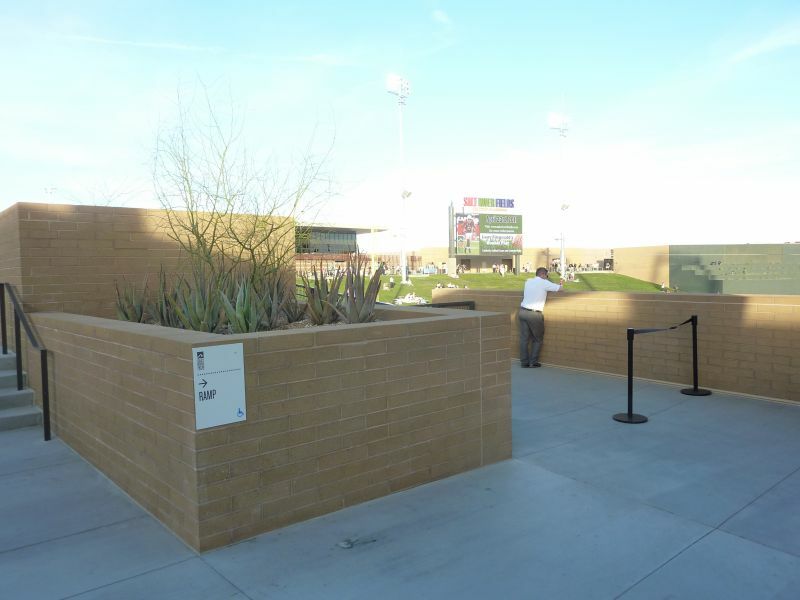 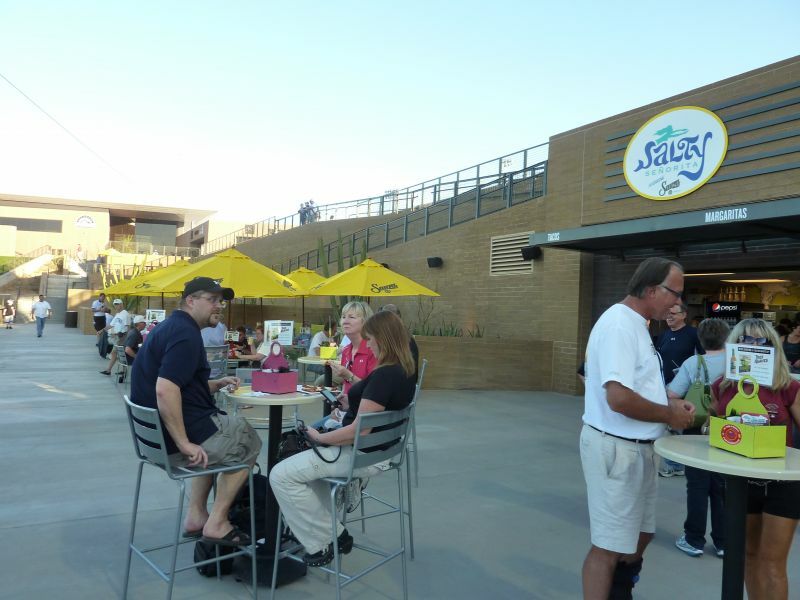 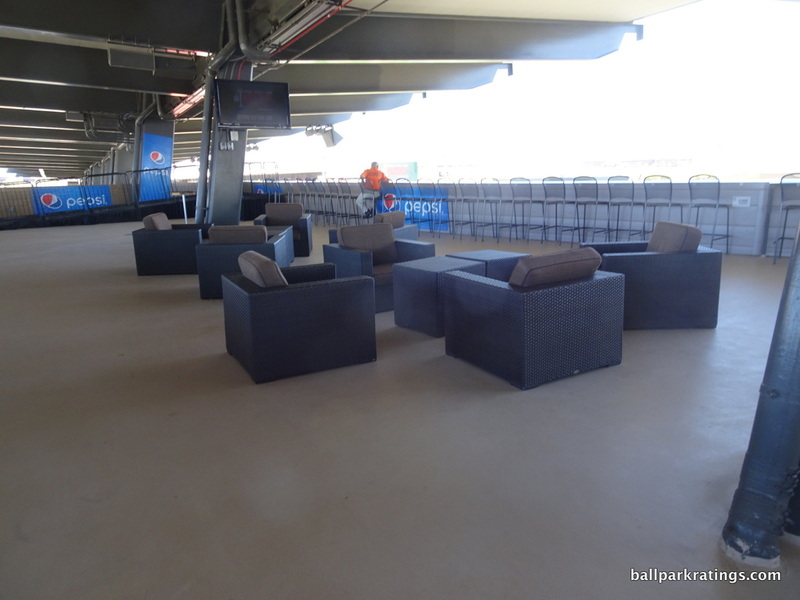 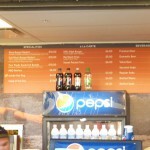 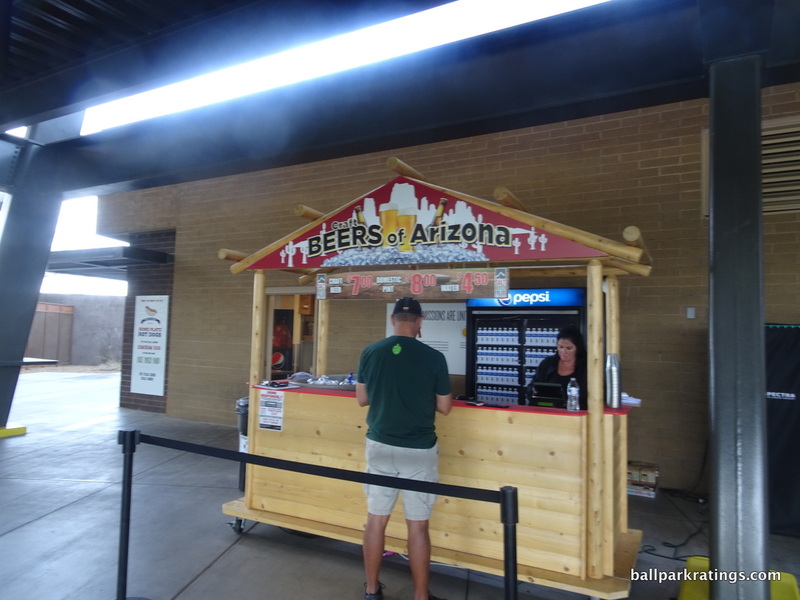 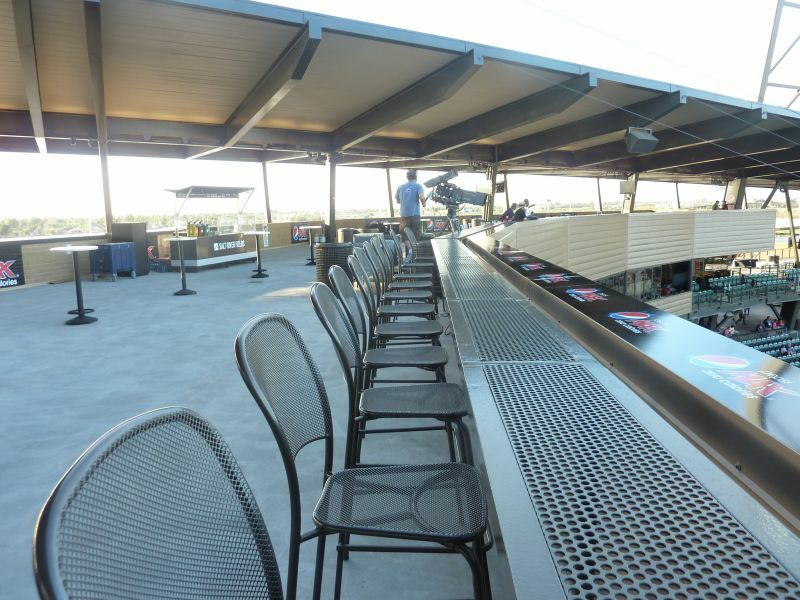 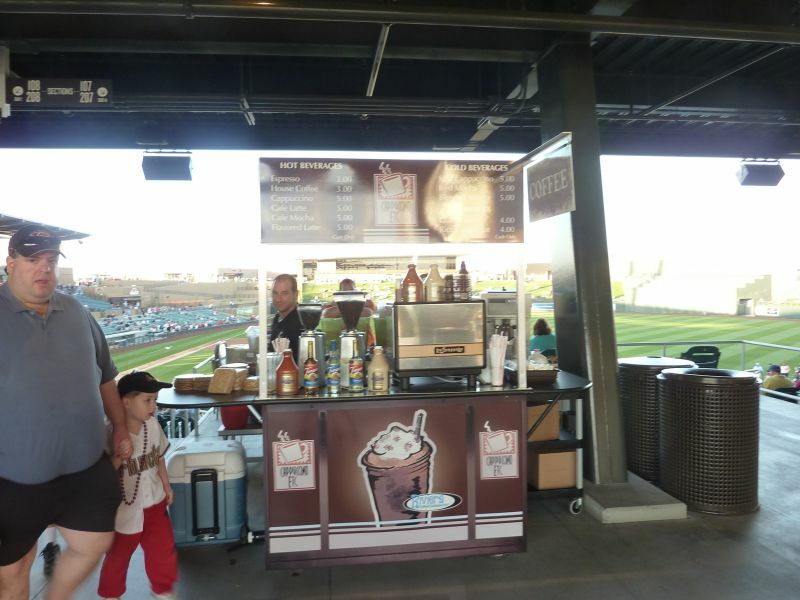 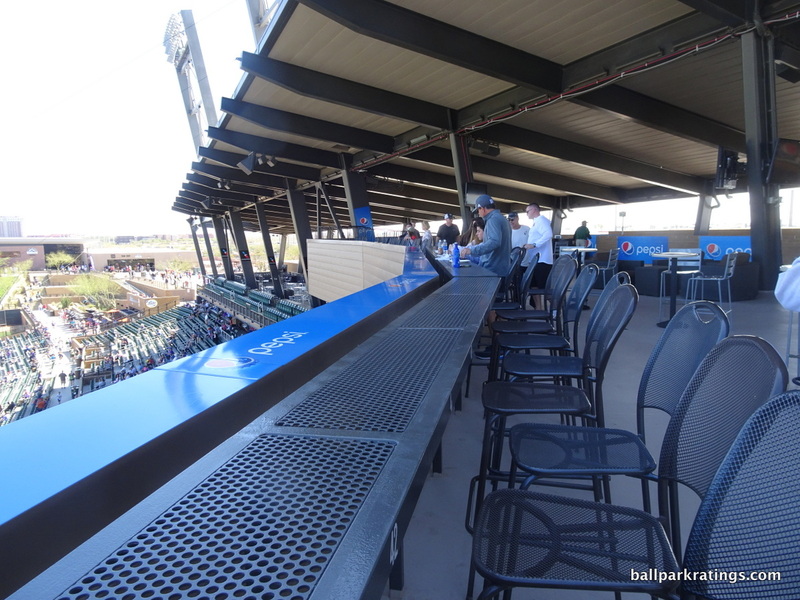 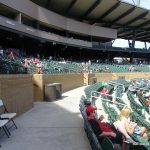 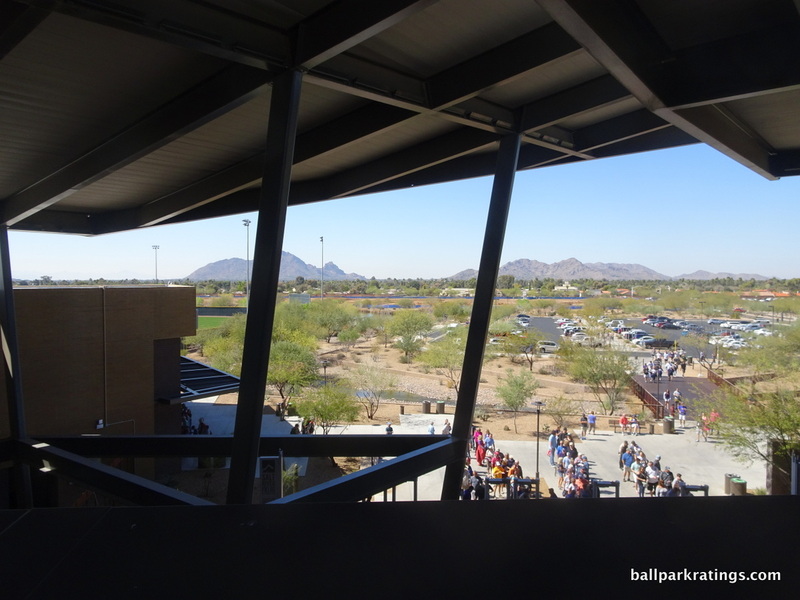 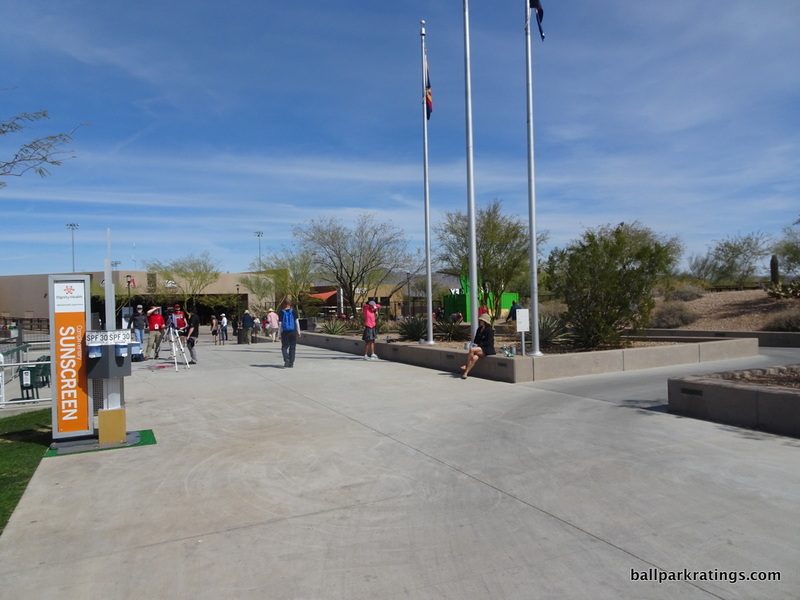 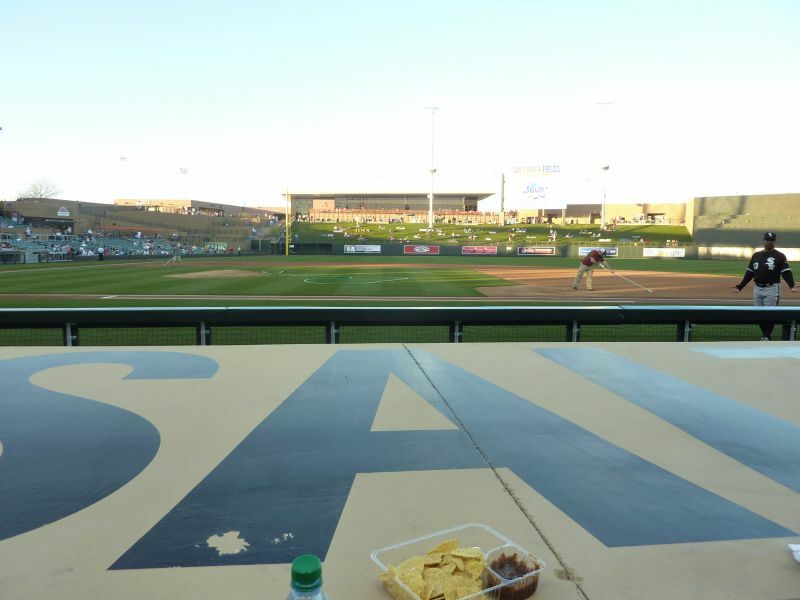 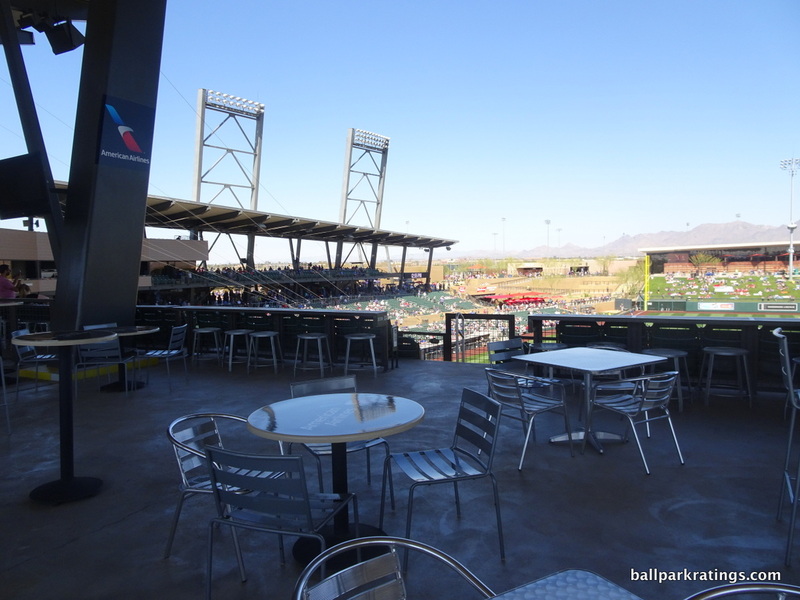 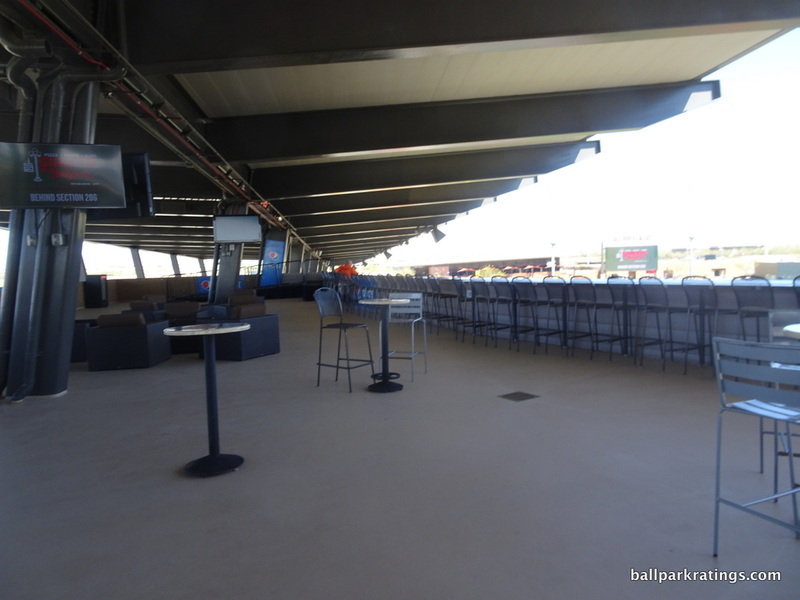 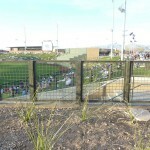 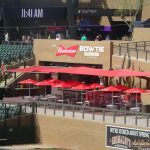 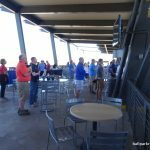 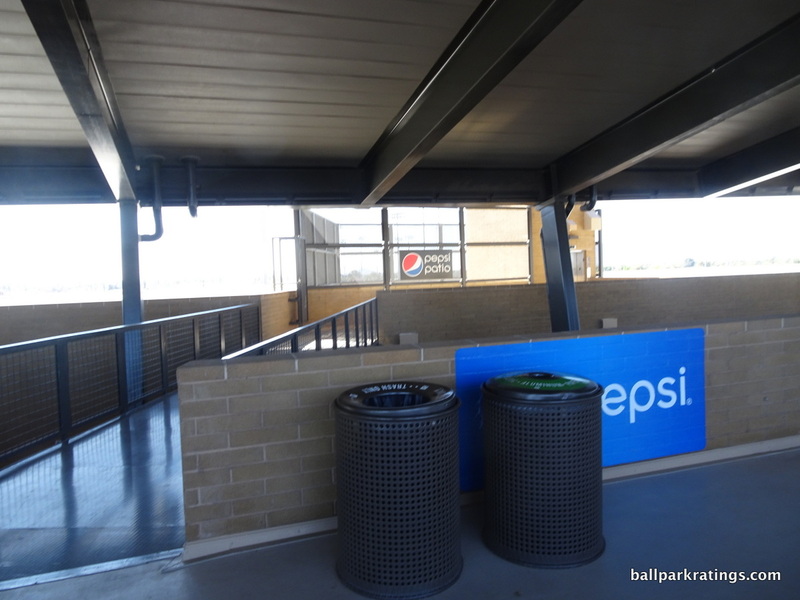 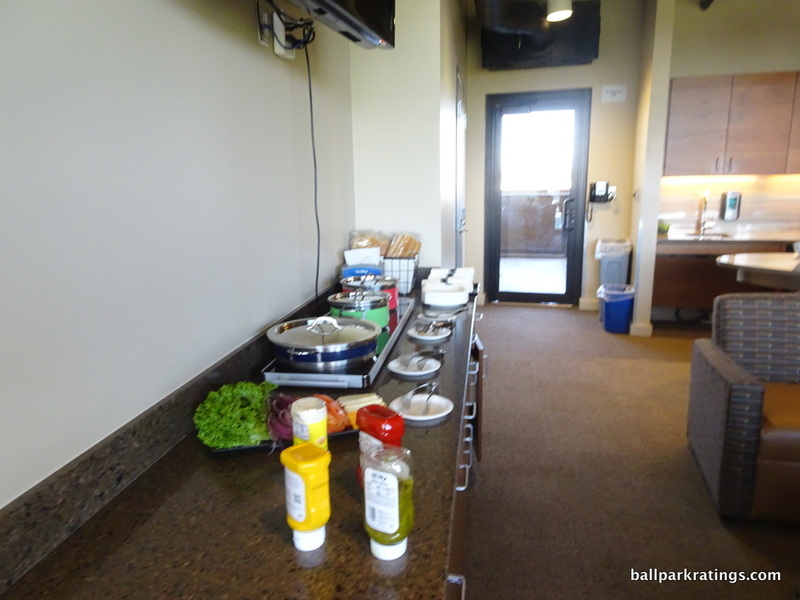 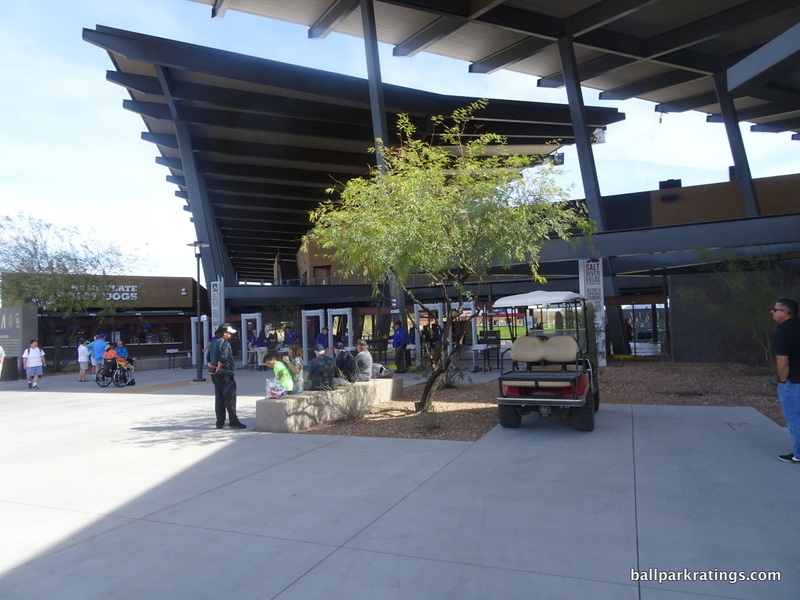 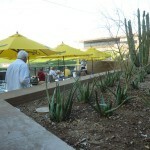 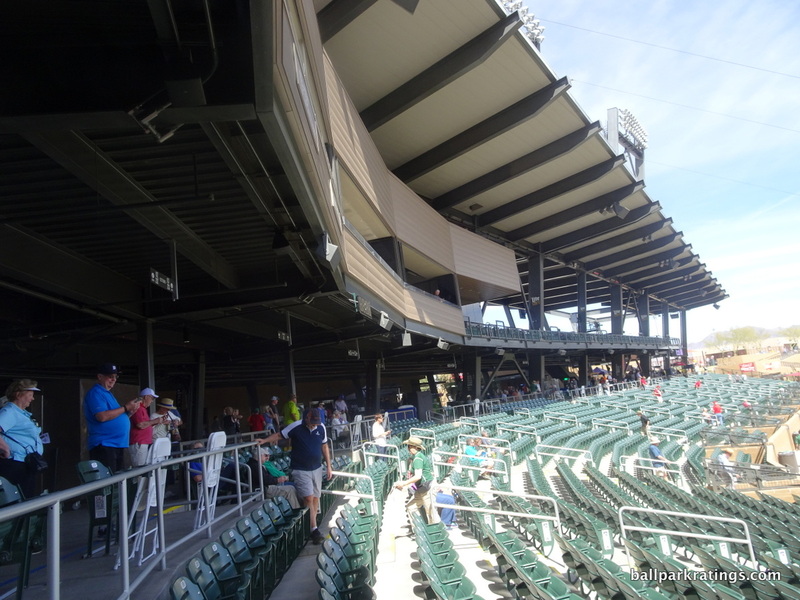 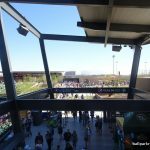 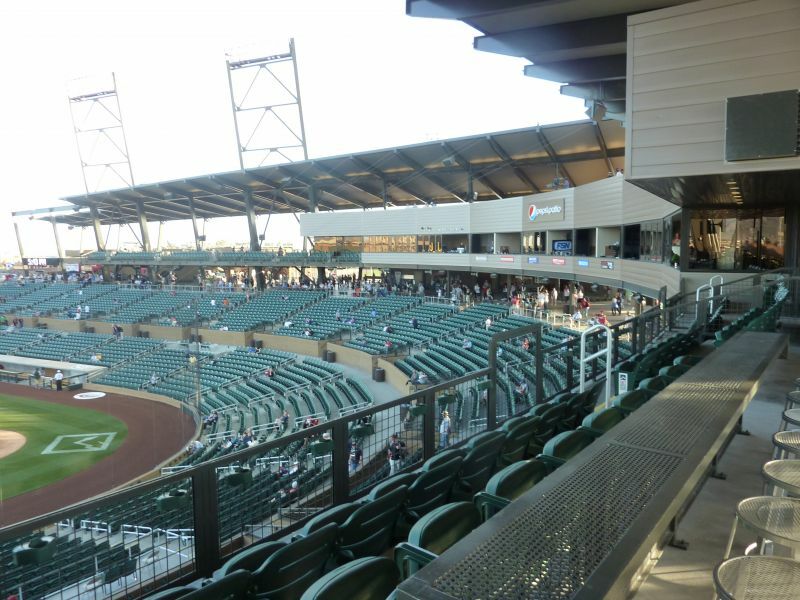 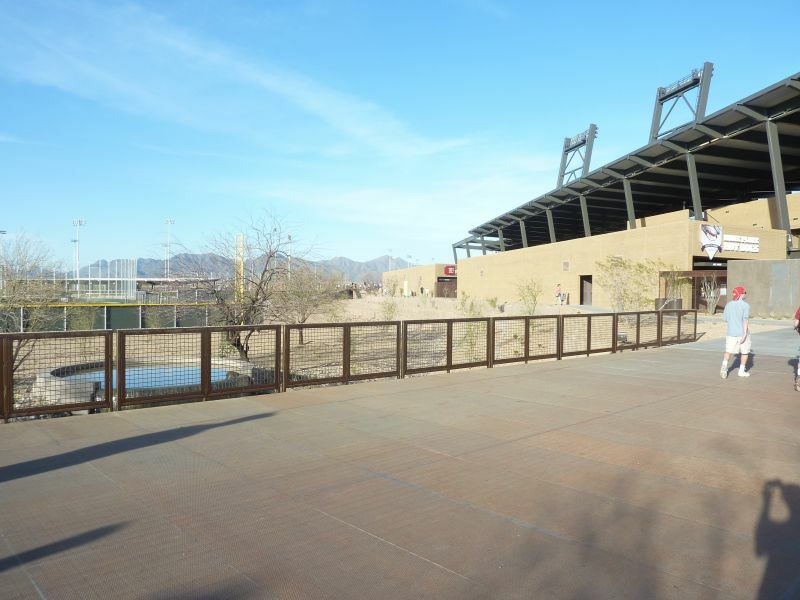 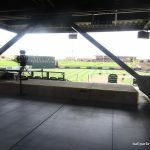 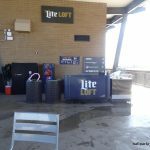 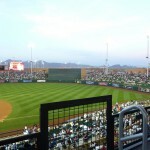 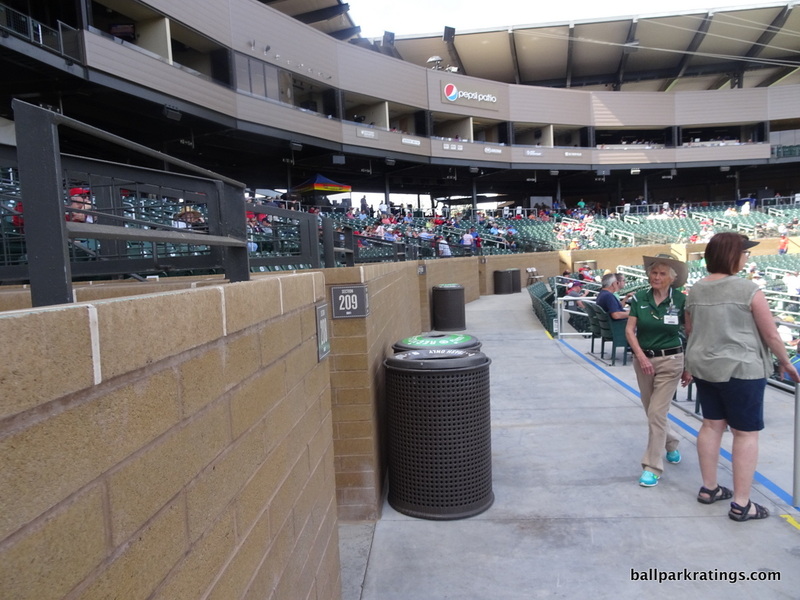 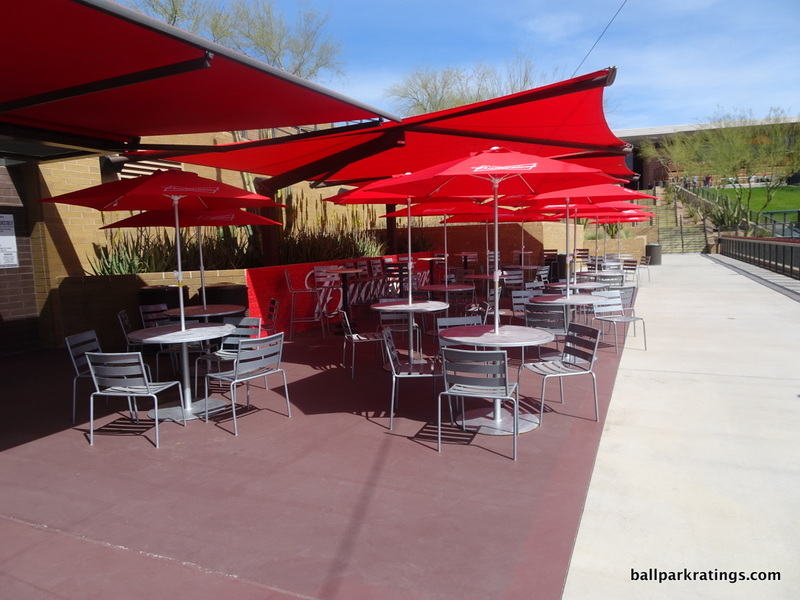 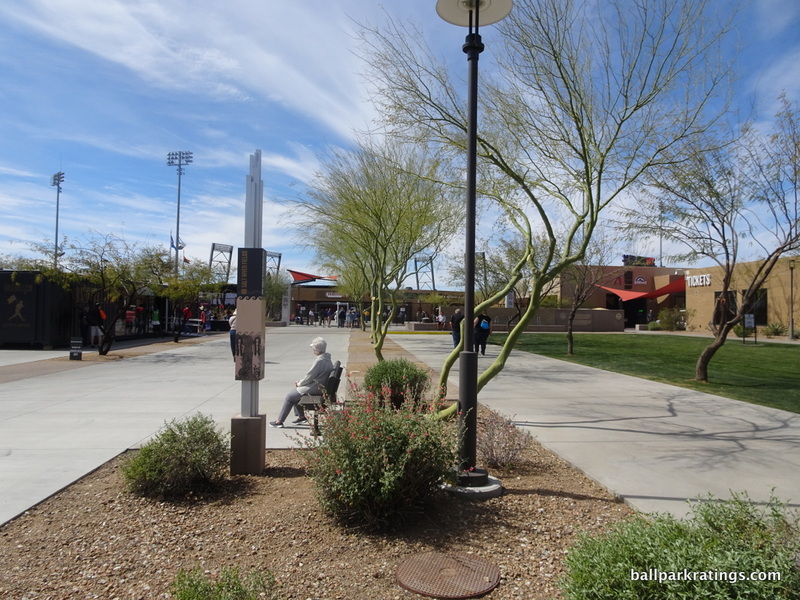 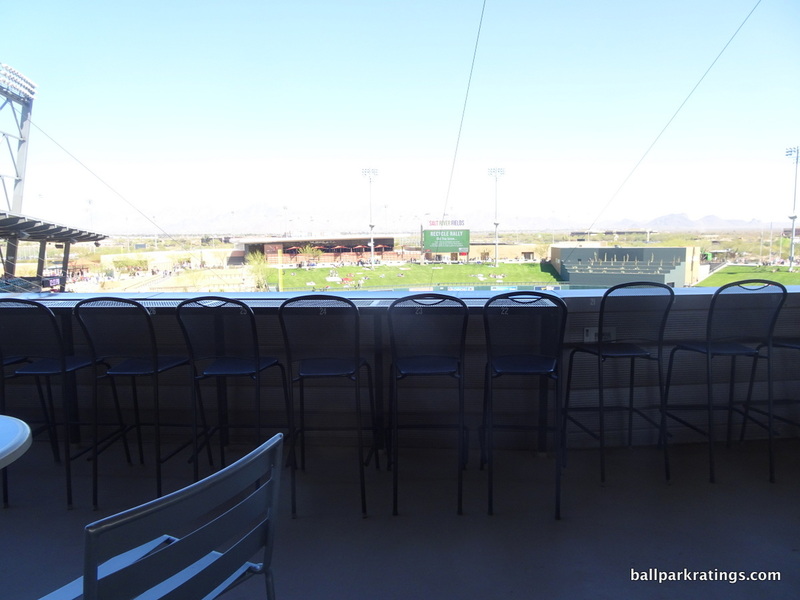 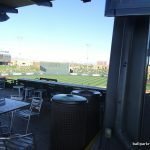 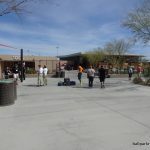 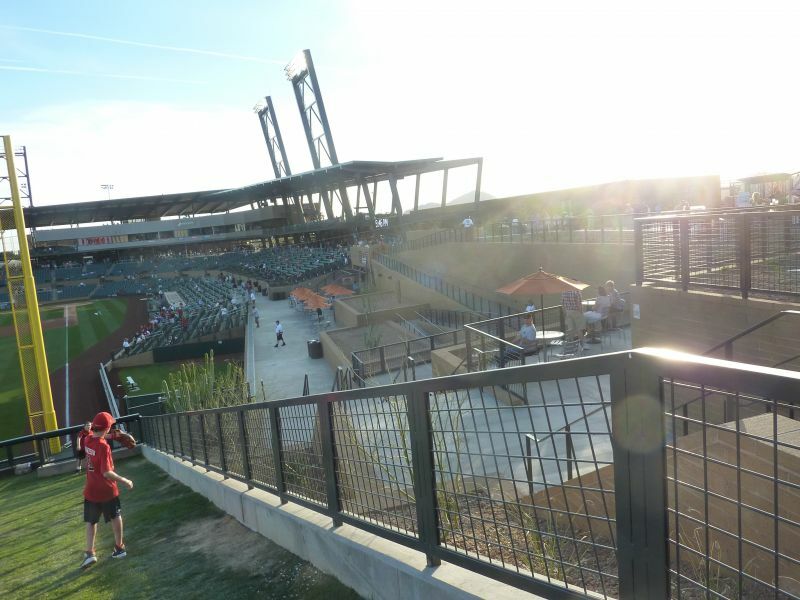 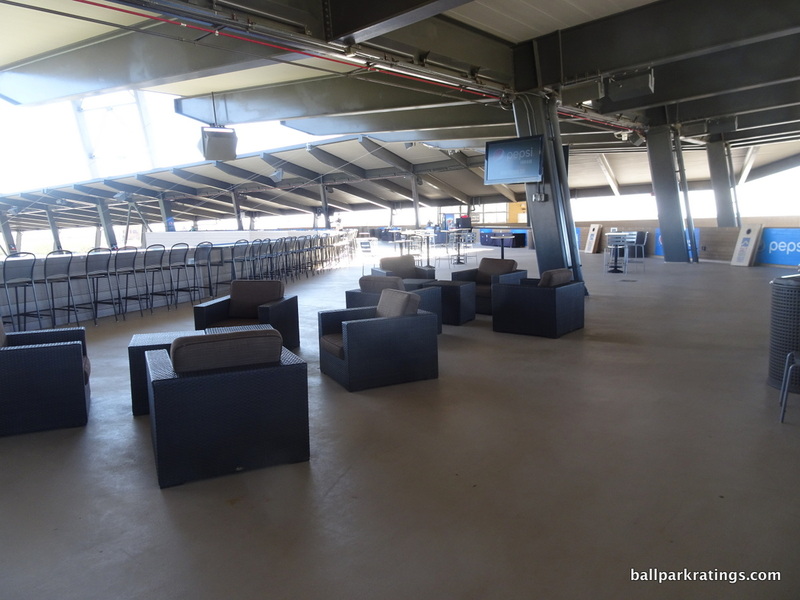 Second of all, the “Pepsi Patio” atop the press box is wonderfully fan-friendly feature, creating a party atmosphere seen nowhere else in the Cactus League. 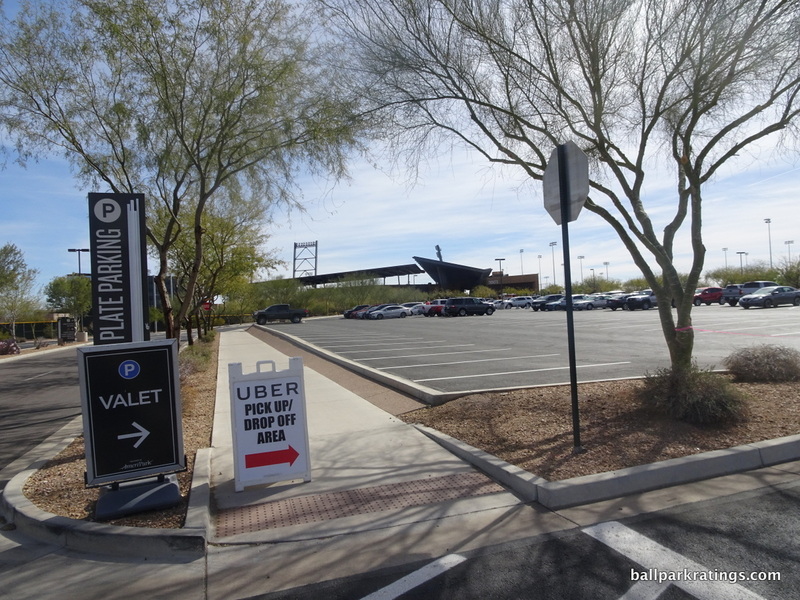 Both are classic black swan, “why didn’t I think of that” ideas. 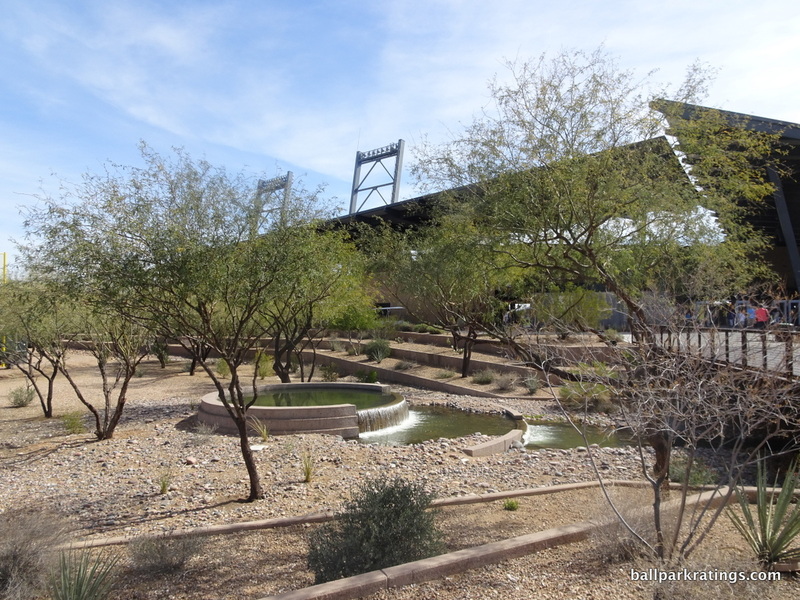 Functionally, and really objectively overall, this is the best ballpark I have ever seen. 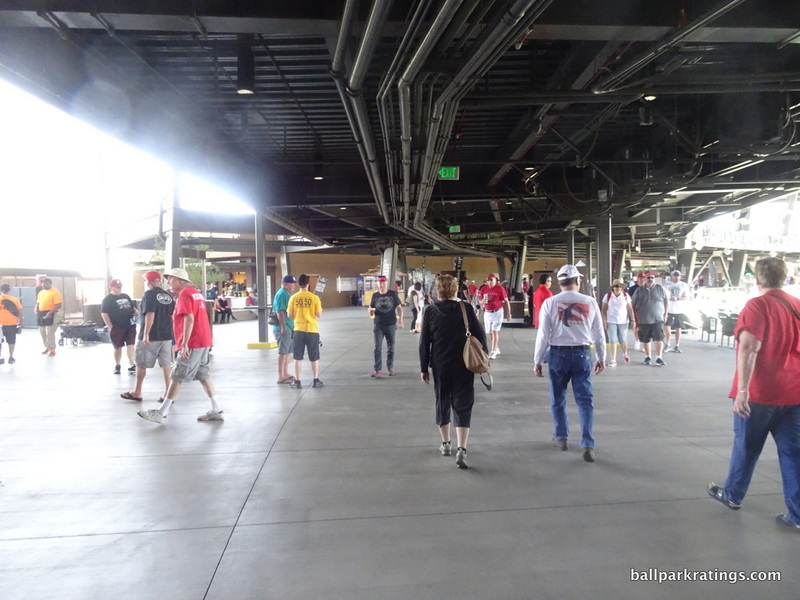 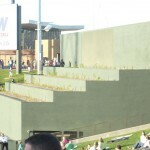 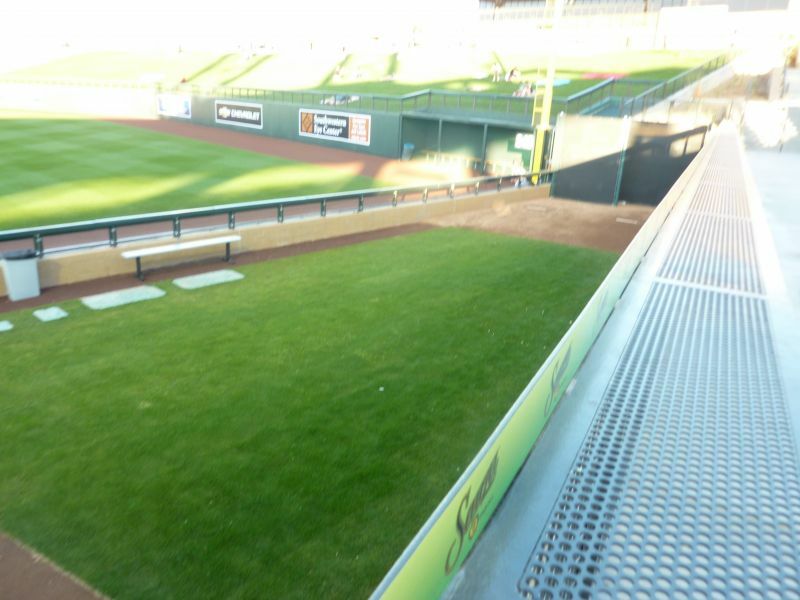 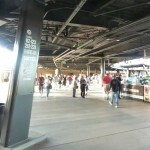 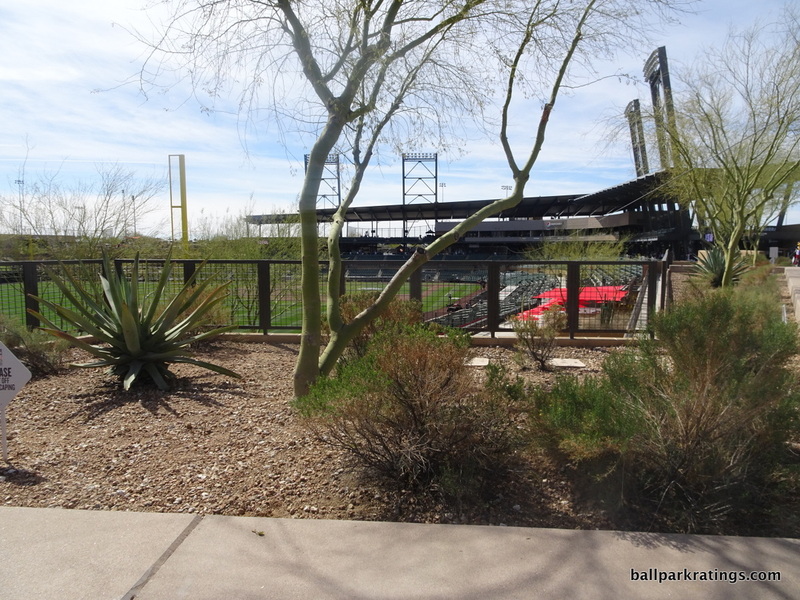 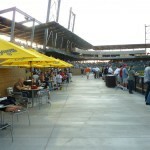 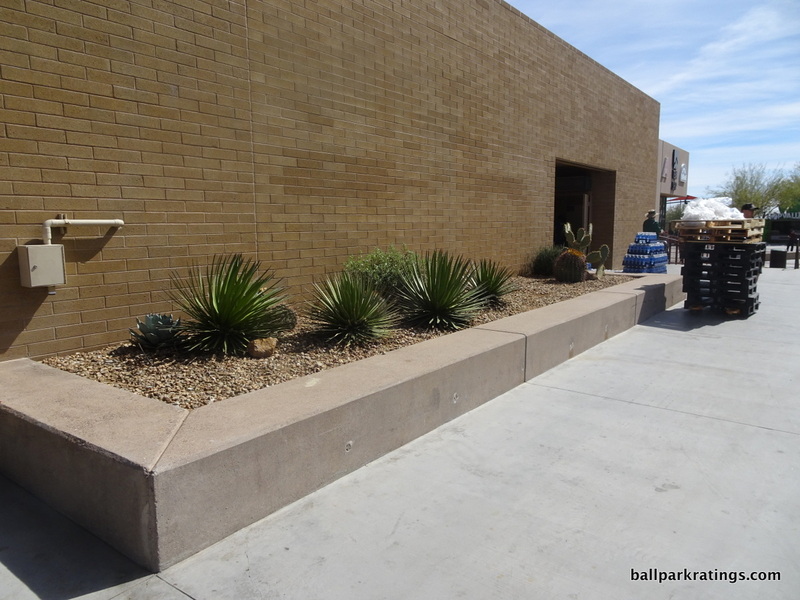 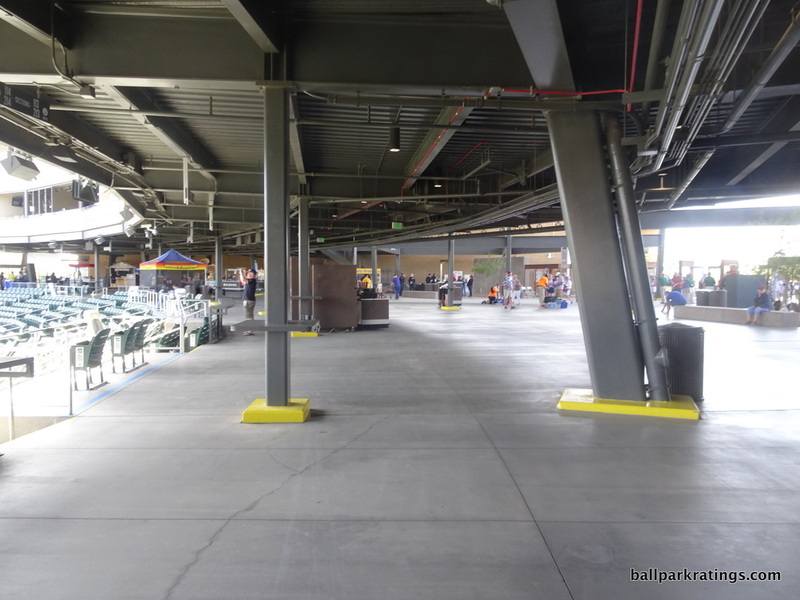 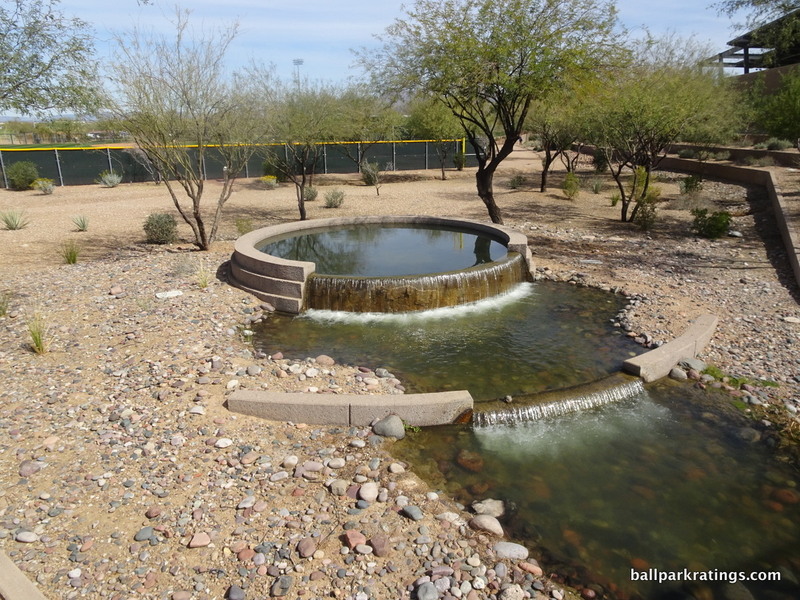 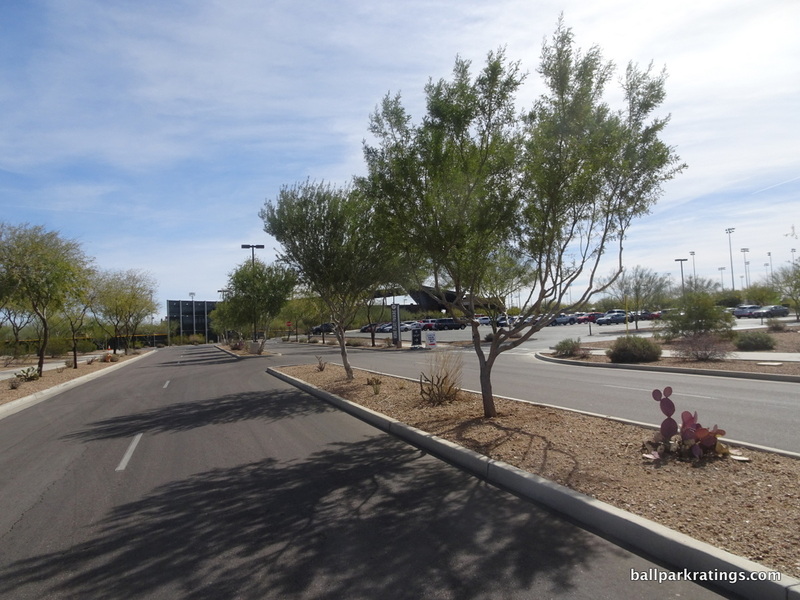 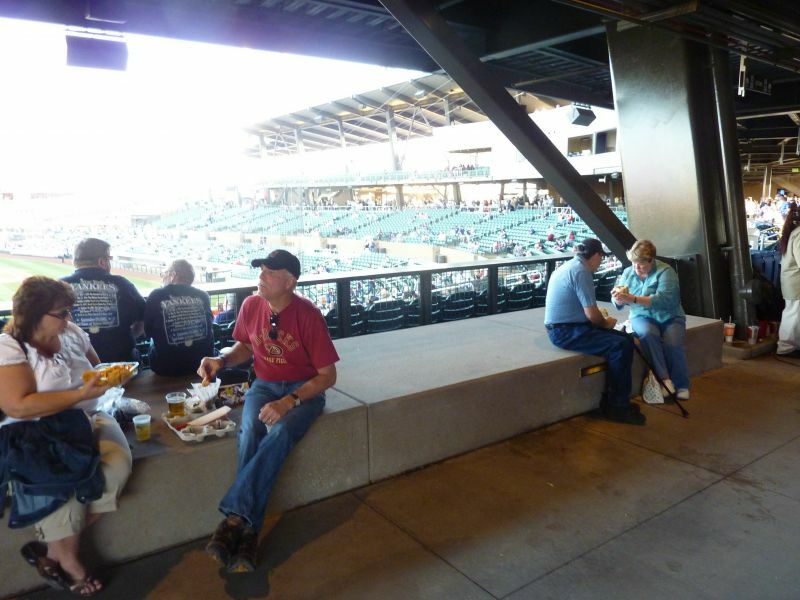 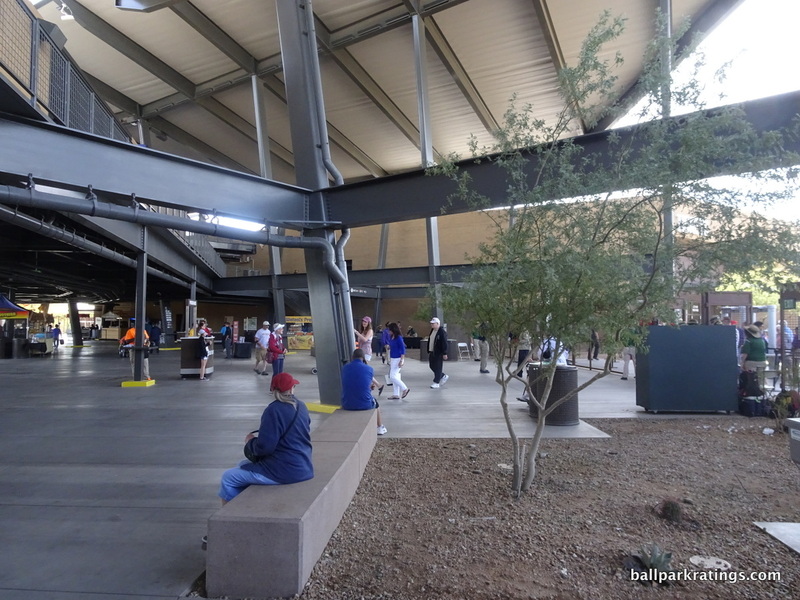 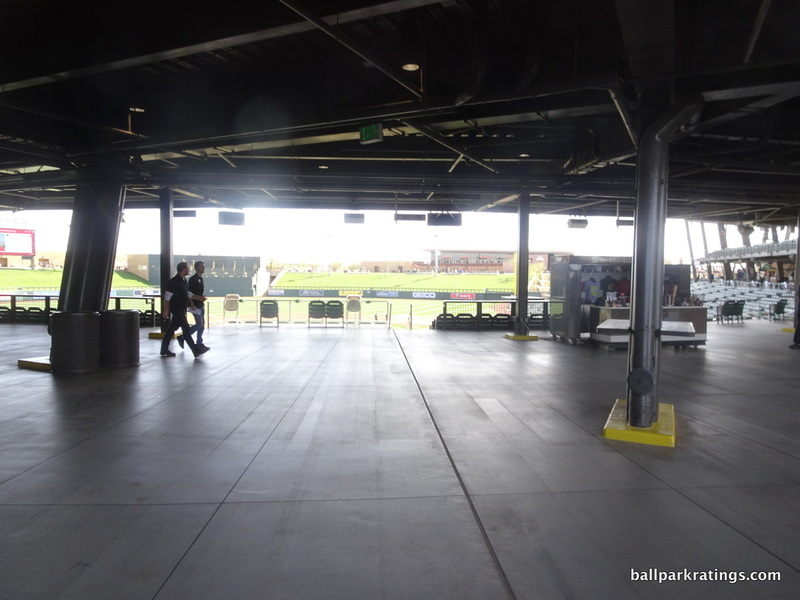 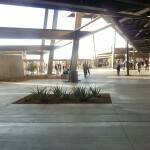 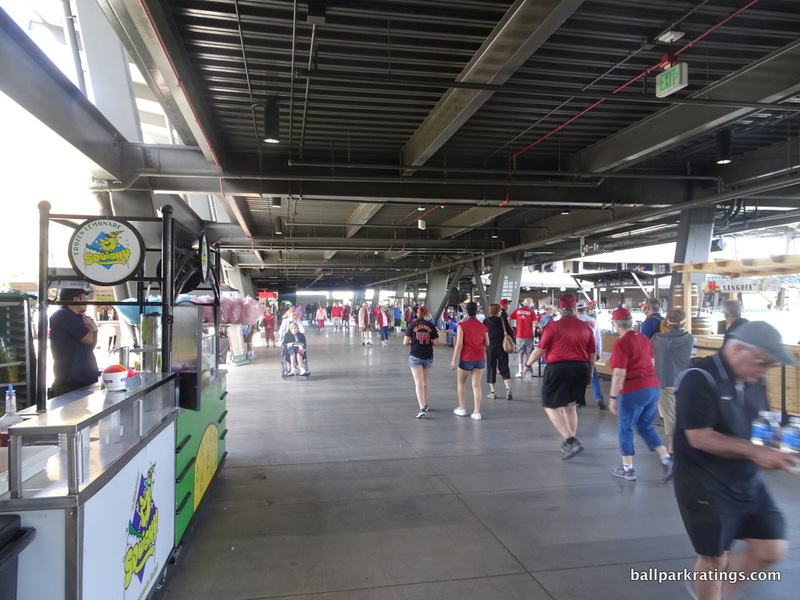 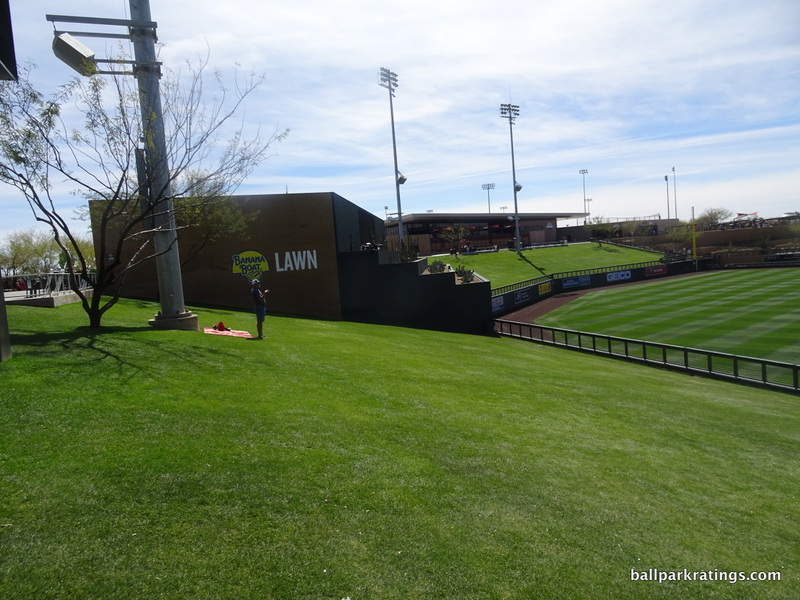 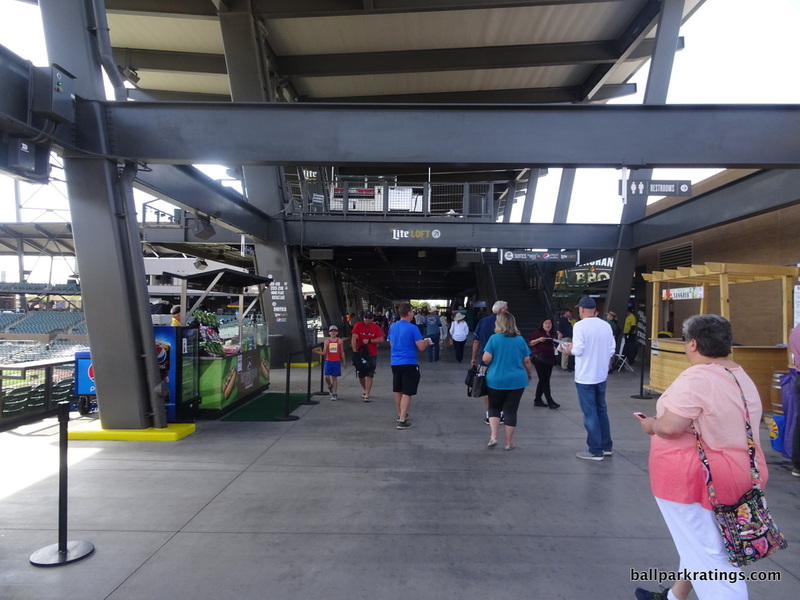 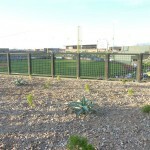 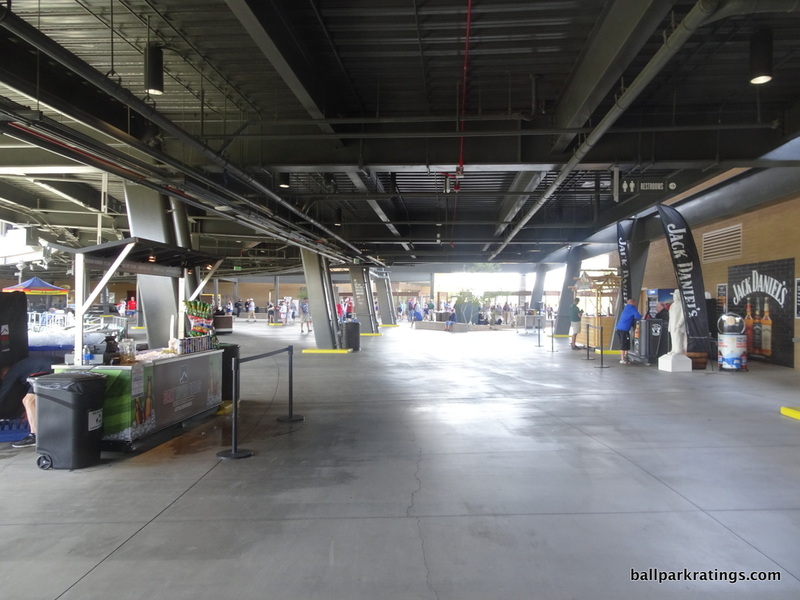 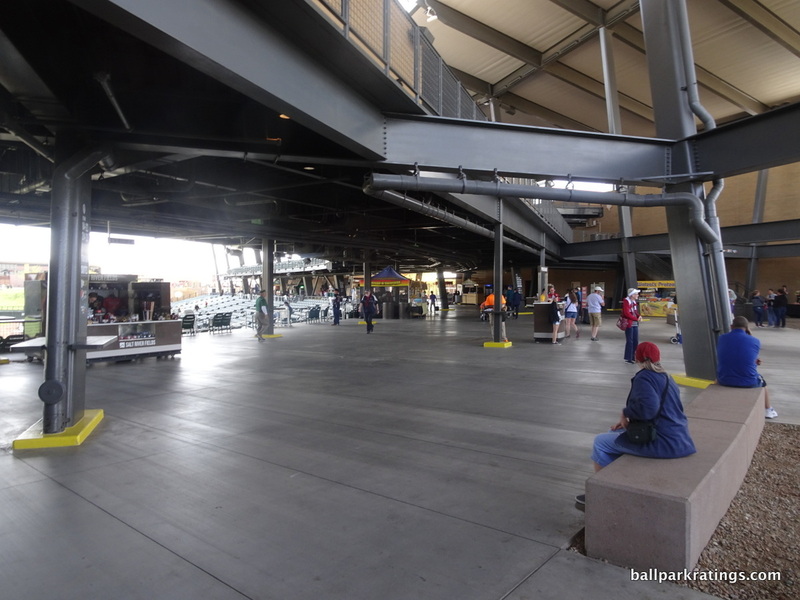 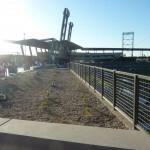 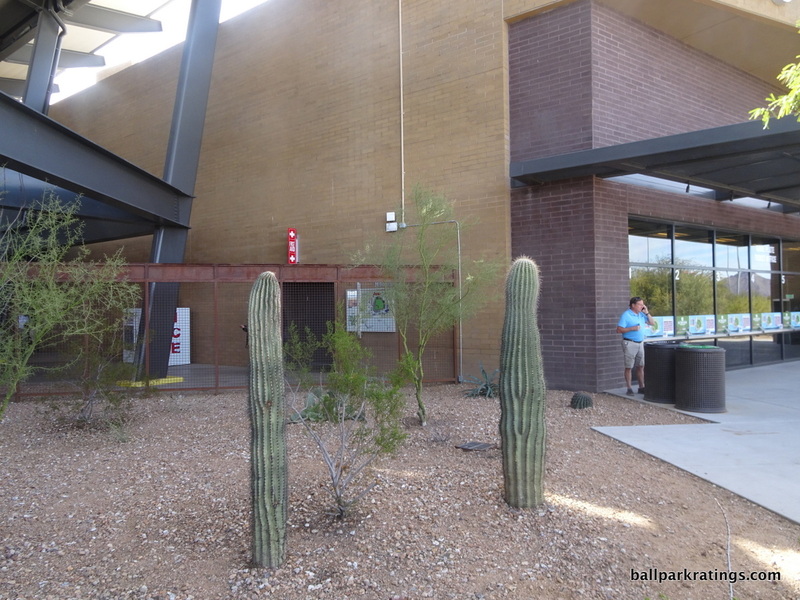 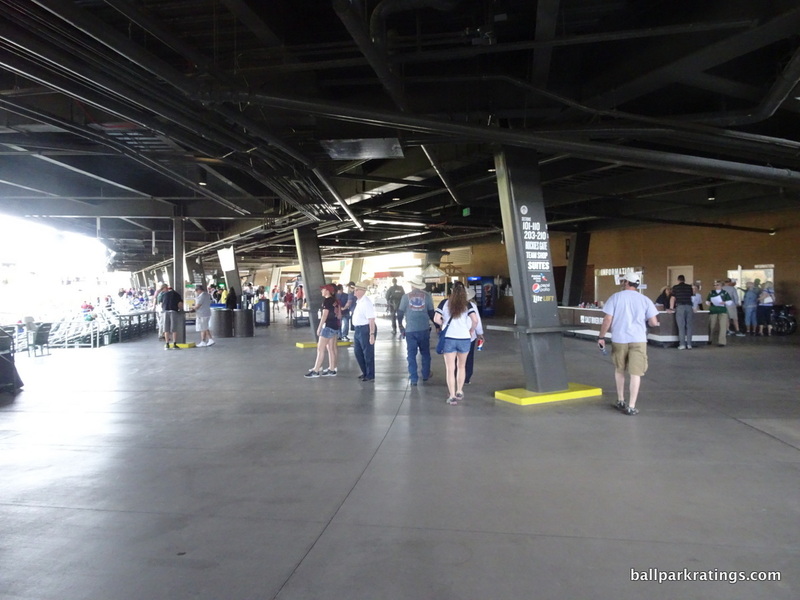 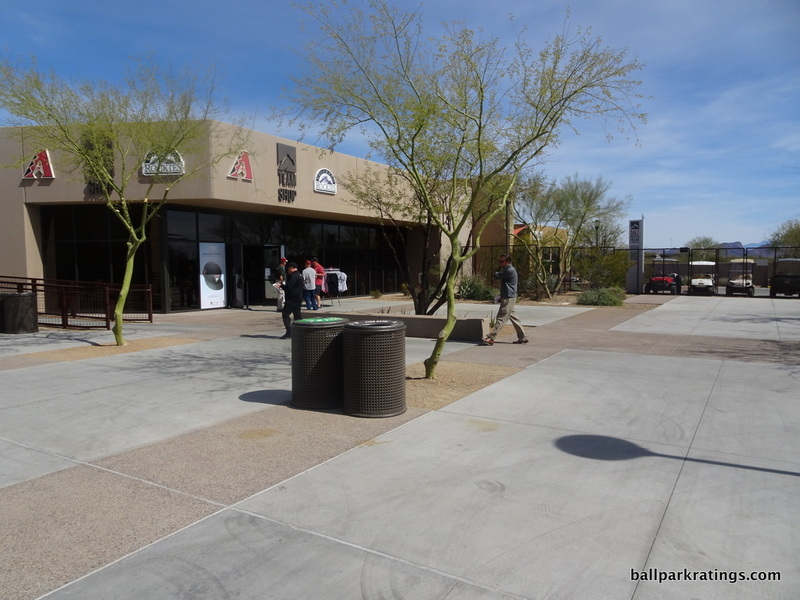 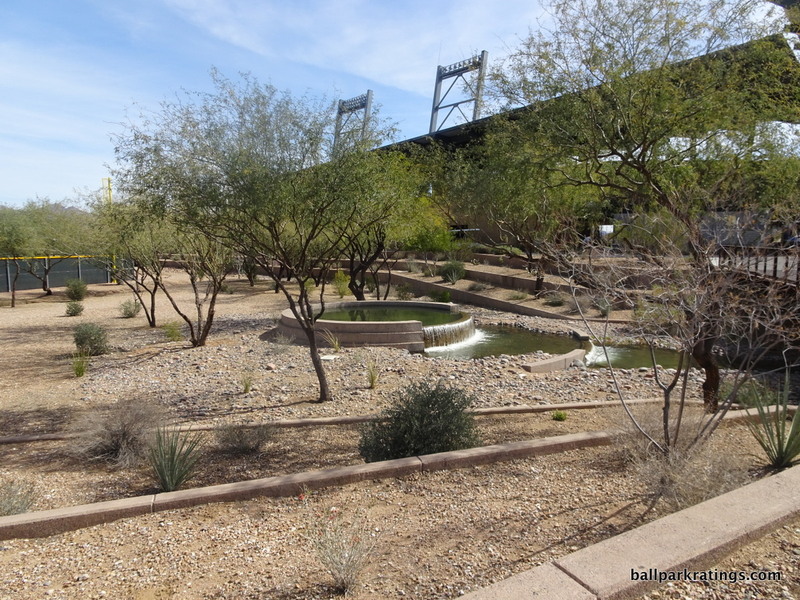 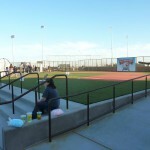 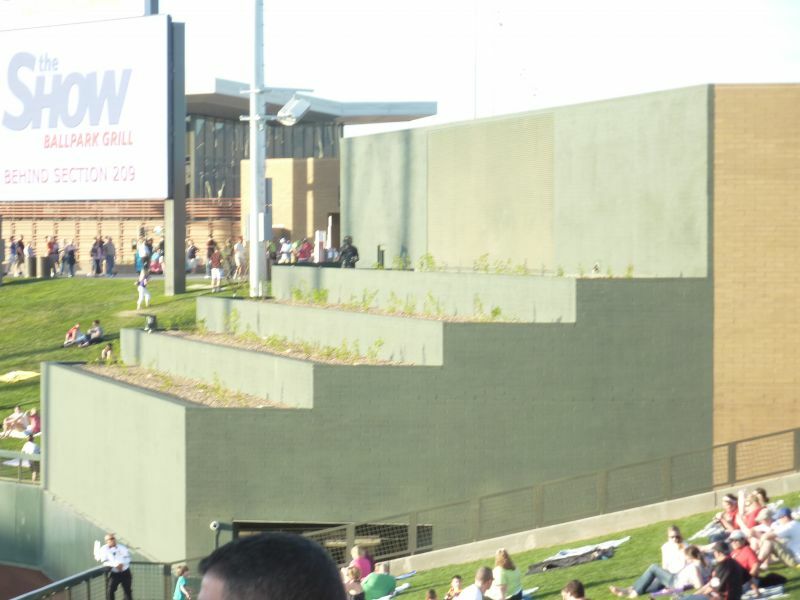 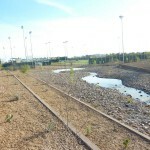 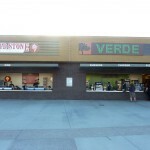 It takes ballpark landscaping both inside and outside to an unbelievably extensive level. 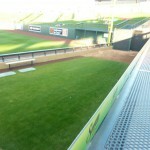 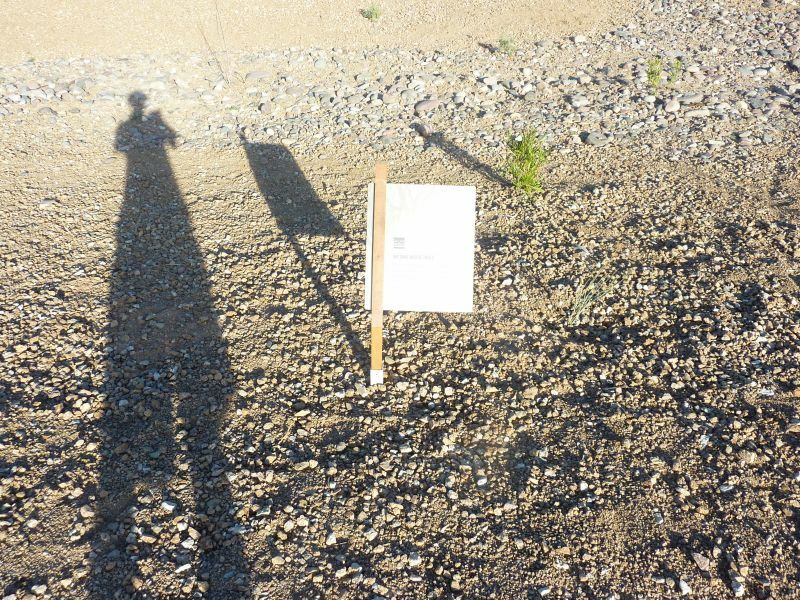 The berm is sloped perfectly. 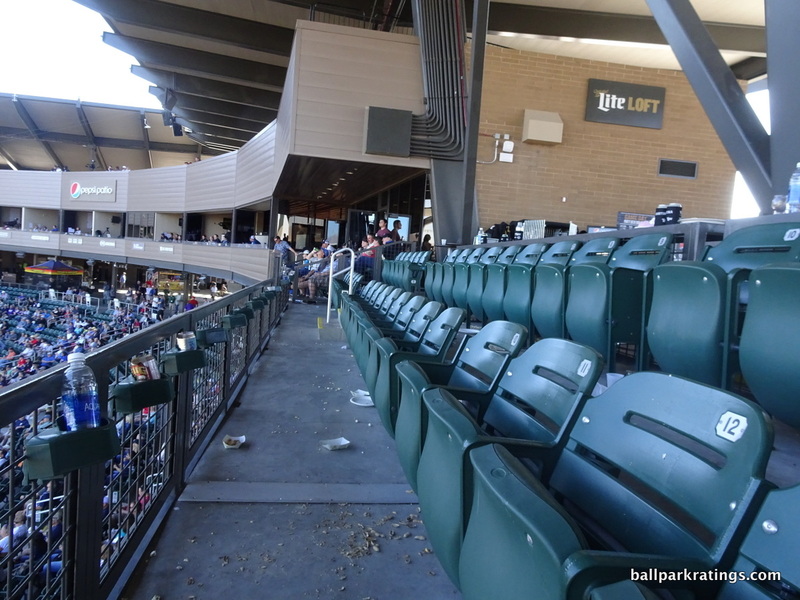 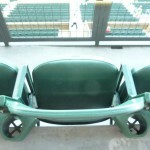 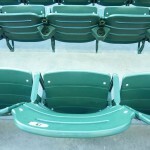 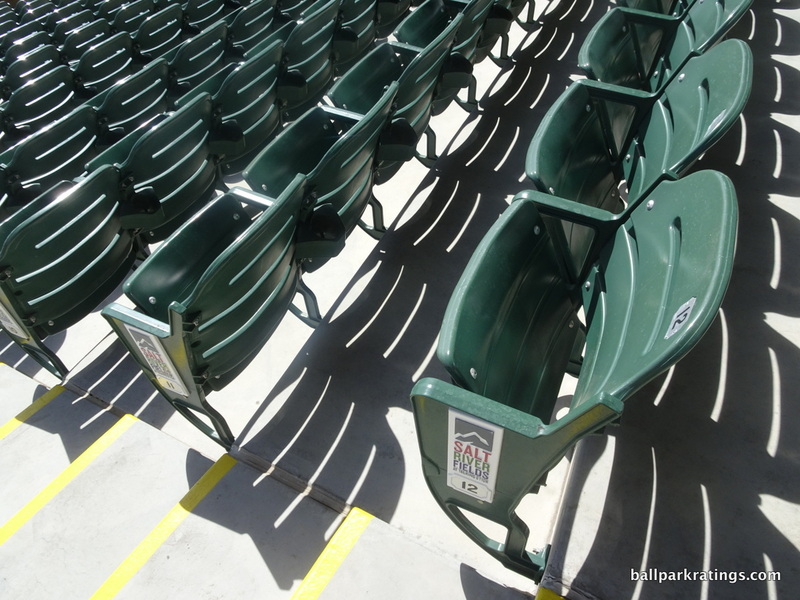 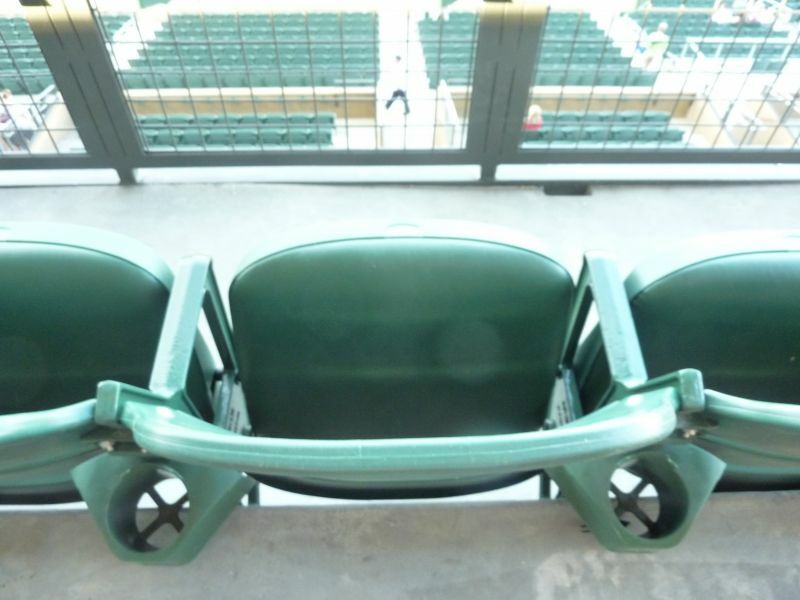 The sightlines are noticeably better in terms of seating geometry. 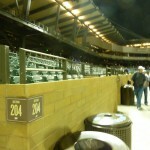 The seats are 21 inches wide. 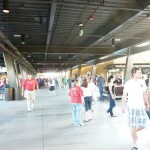 The concourse visibility and circulation somehow take another step forward in functional innovation. 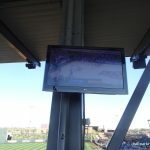 The video board is way above anything we’ve ever seen in spring training. 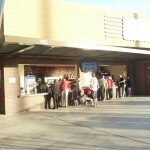 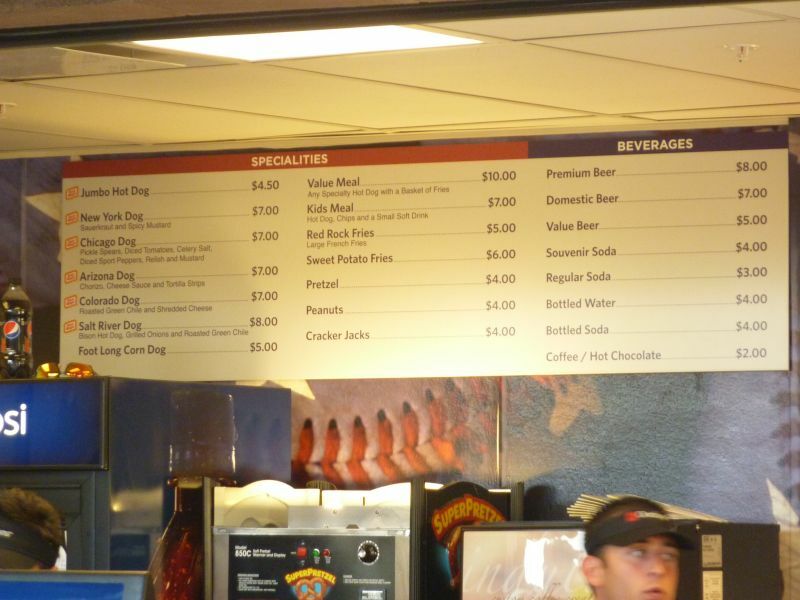 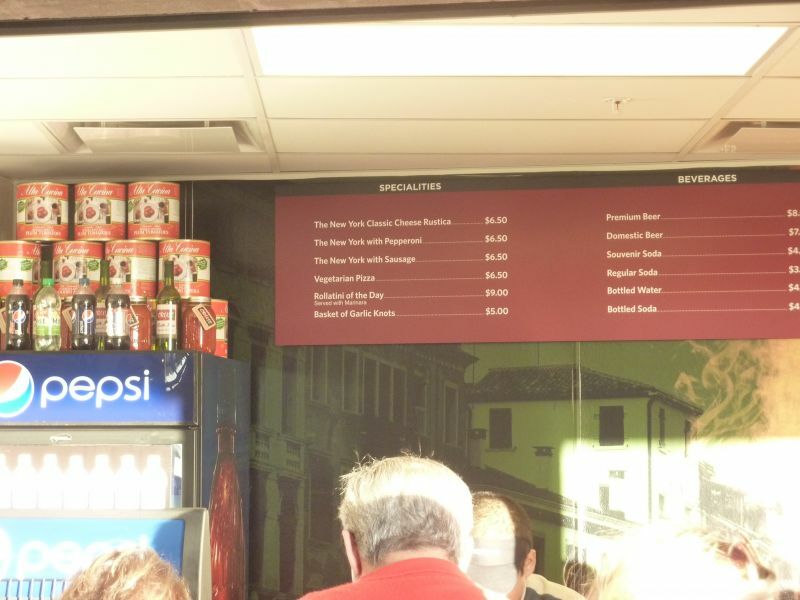 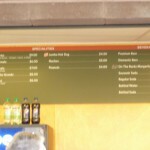 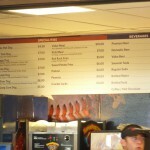 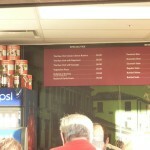 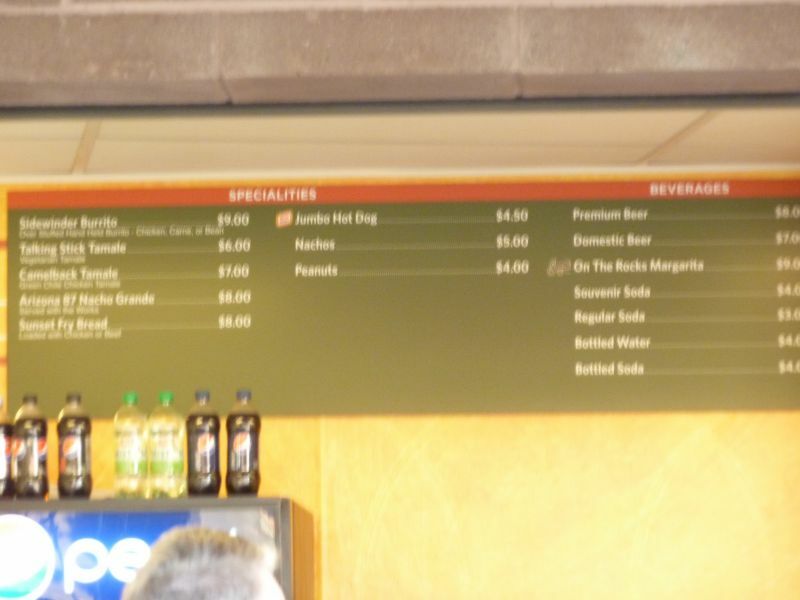 The concessions are fantastic. 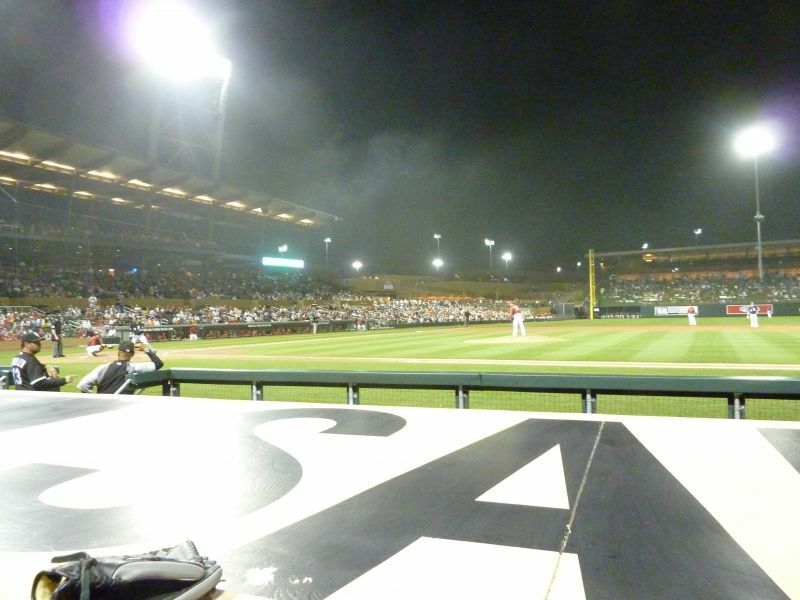 And it goes on and on. 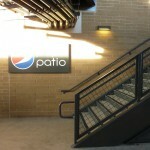 Aesthetically, while not too novel, the attention to detail is remarkable. 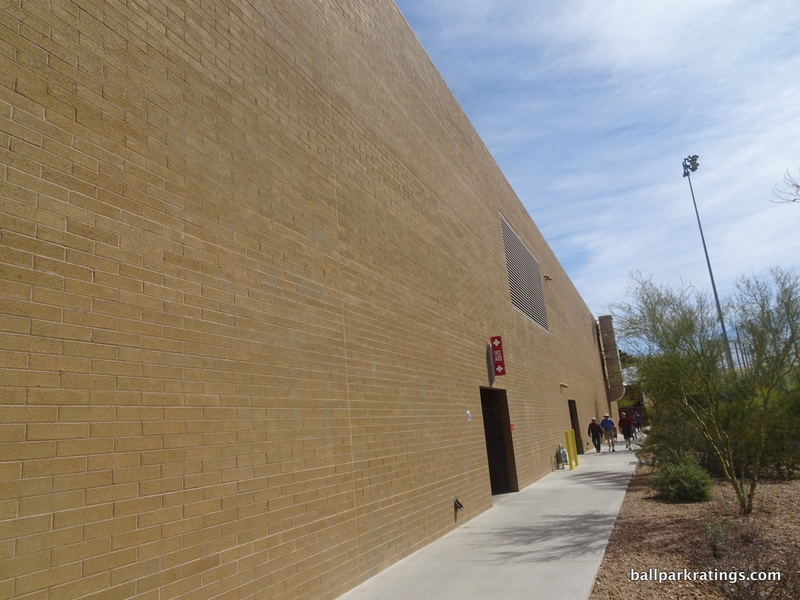 This was the first batters’ eye in center field that attempted to look attractive. 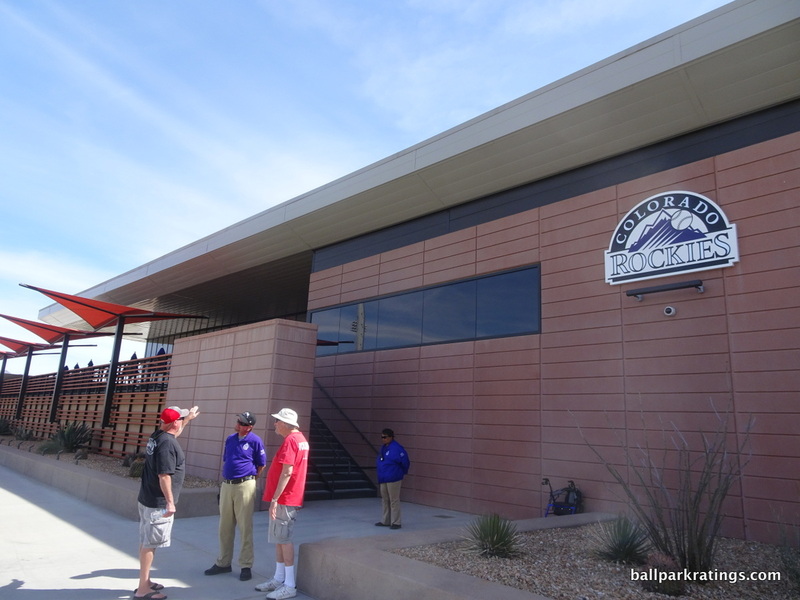 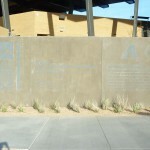 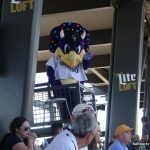 And the more I think about it, they did make some attempts to represent the Diamondbacks and the Rockies. 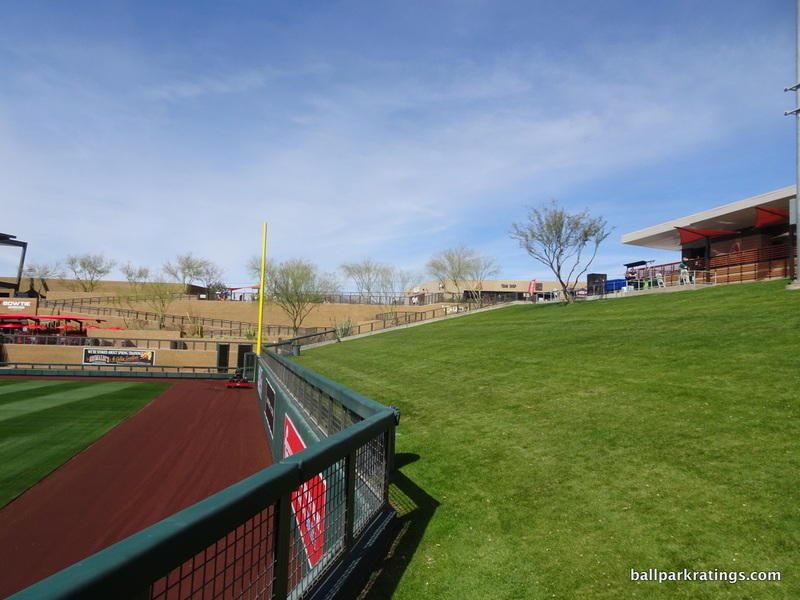 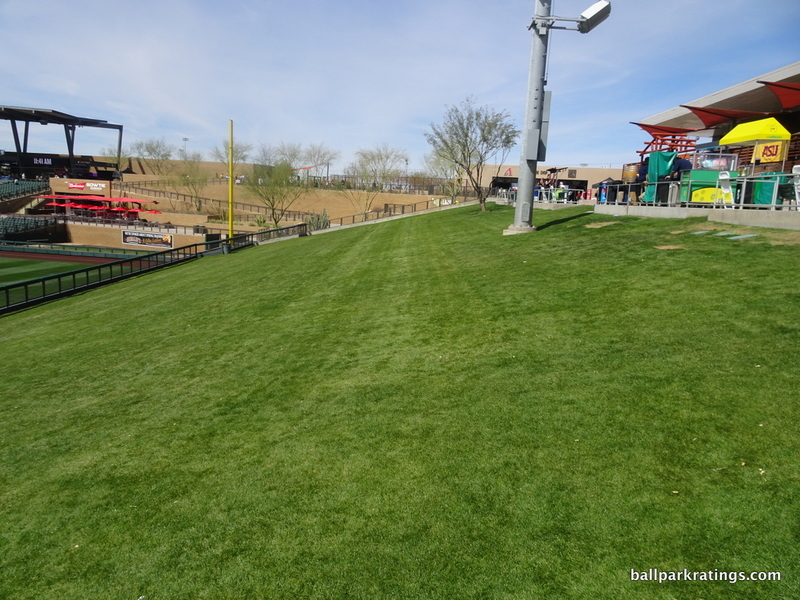 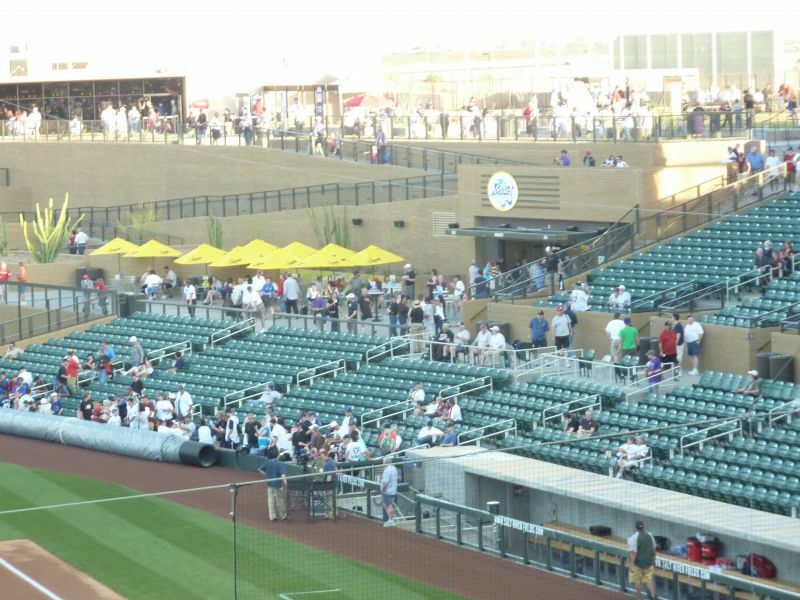 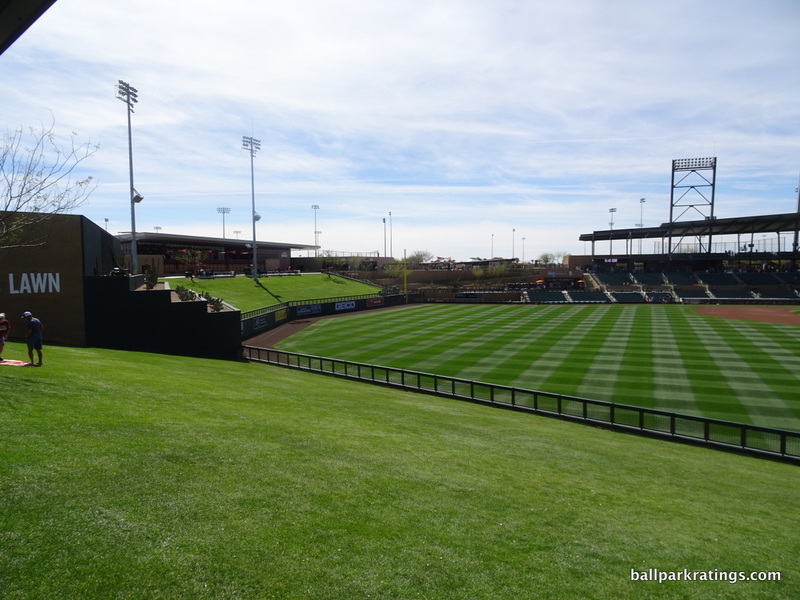 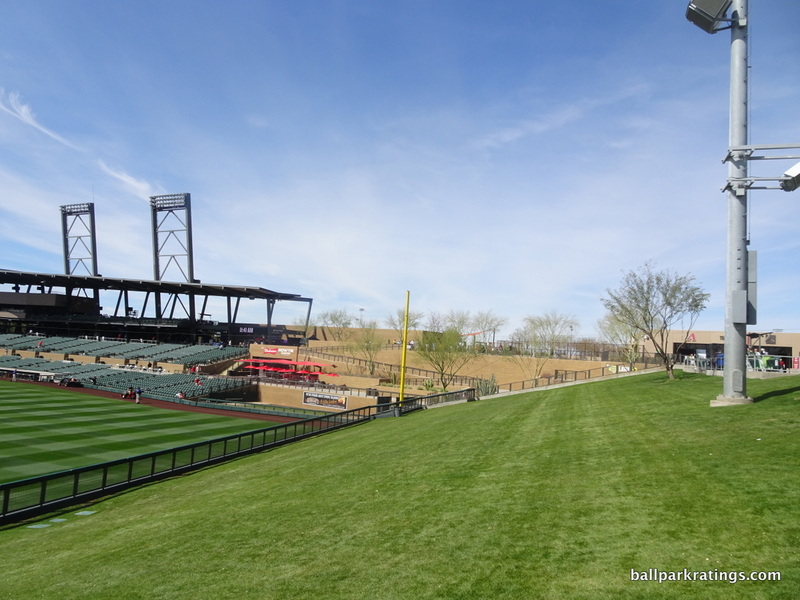 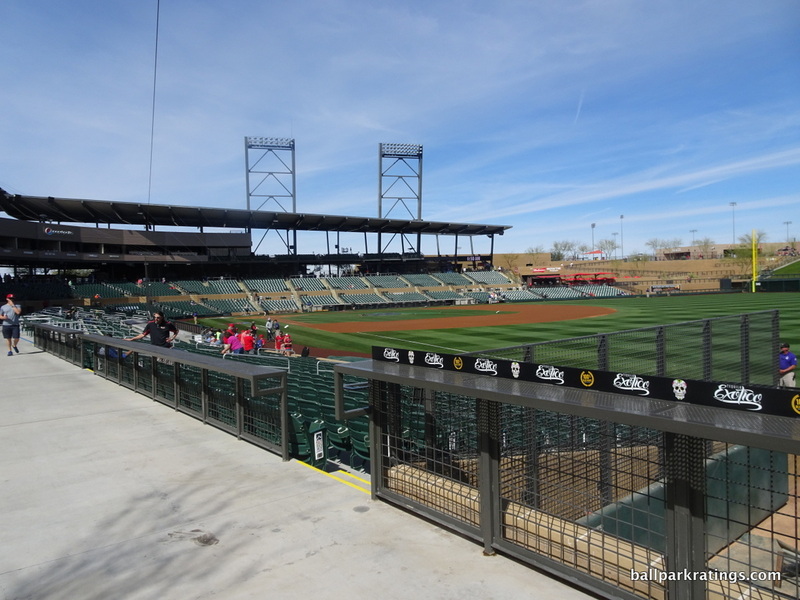 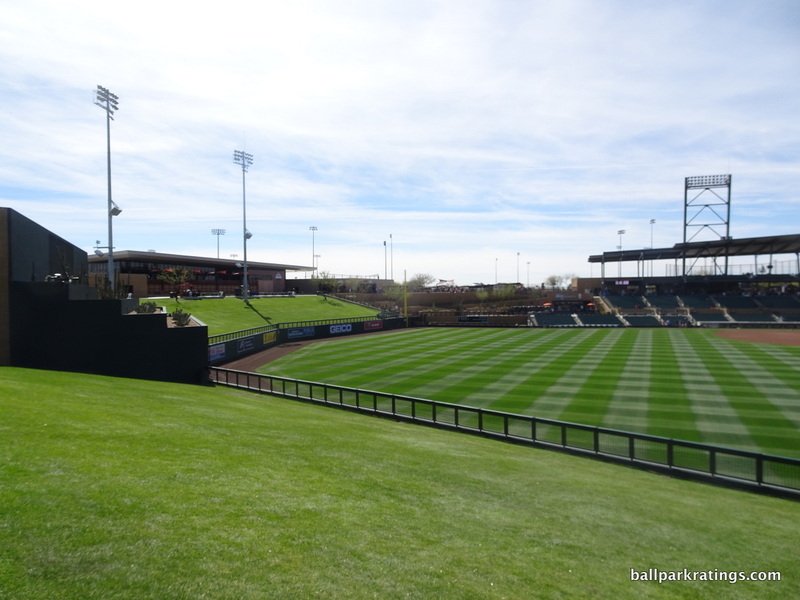 If I had one complaint, even compared to the larger Camelback Ranch, this ballpark is sorely lacking intimacy, primarily because the giant berm eats up so much of the outfield view. 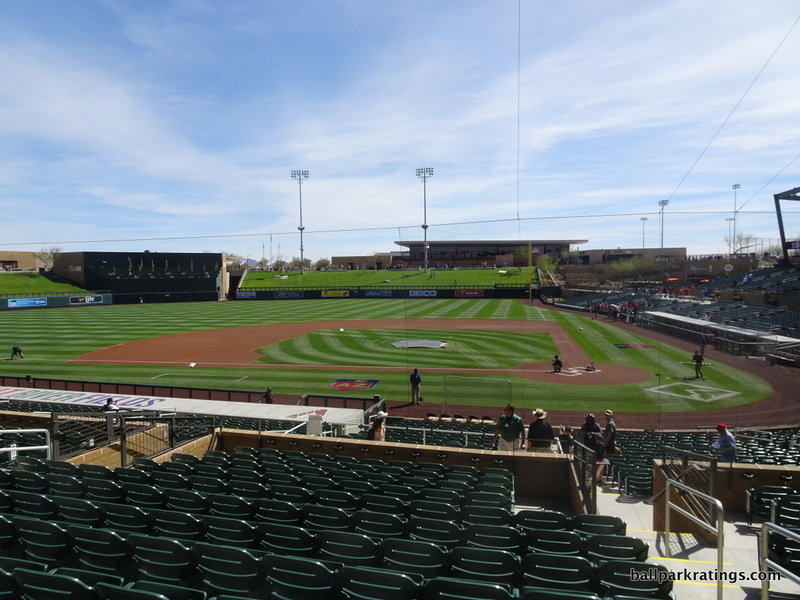 Overall, this is the best ballpark I have ever reviewed, major league or spring training. 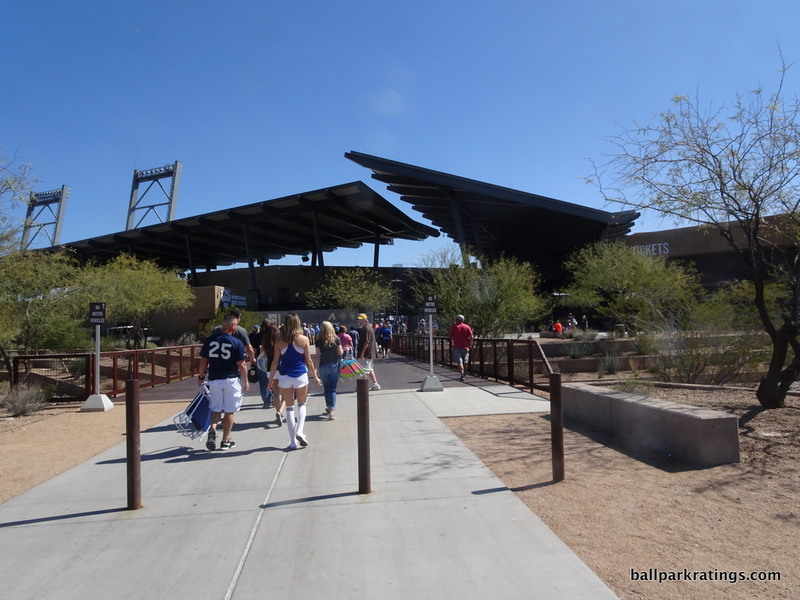 Still I’m wary of these spring training ballparks that attempt to outdo each other without some sort of distinguishing design character. 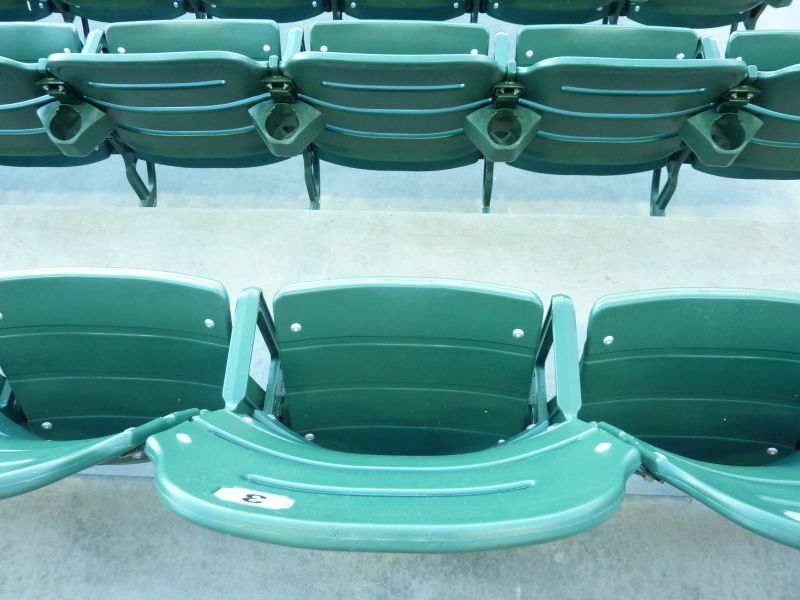 In the past, they end up not looking as good 20 years later. 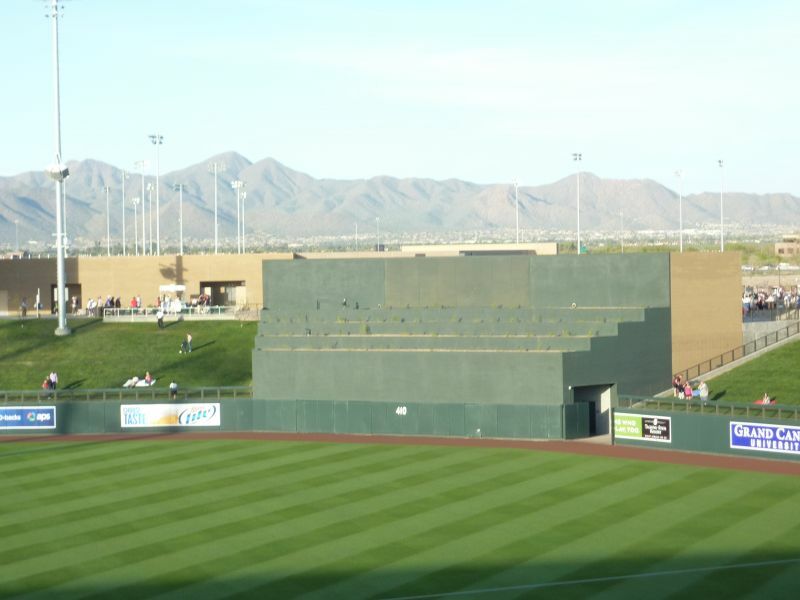 But I think it’s clear spring training ballpark design has finally hit its peak, so my prediction is that won’t be a problem. 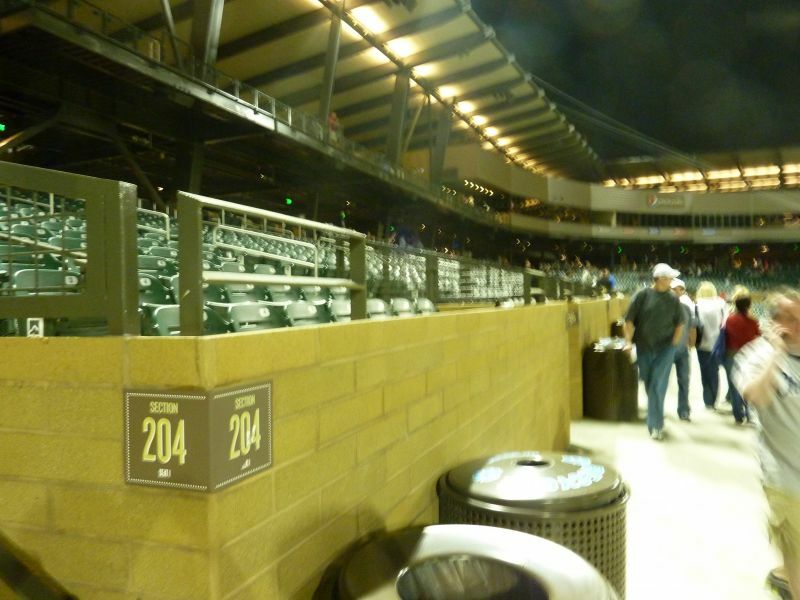 And, heck, just look at the score. 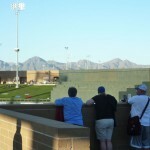 Now you know why all of the other spring training ballpark scores are so low. 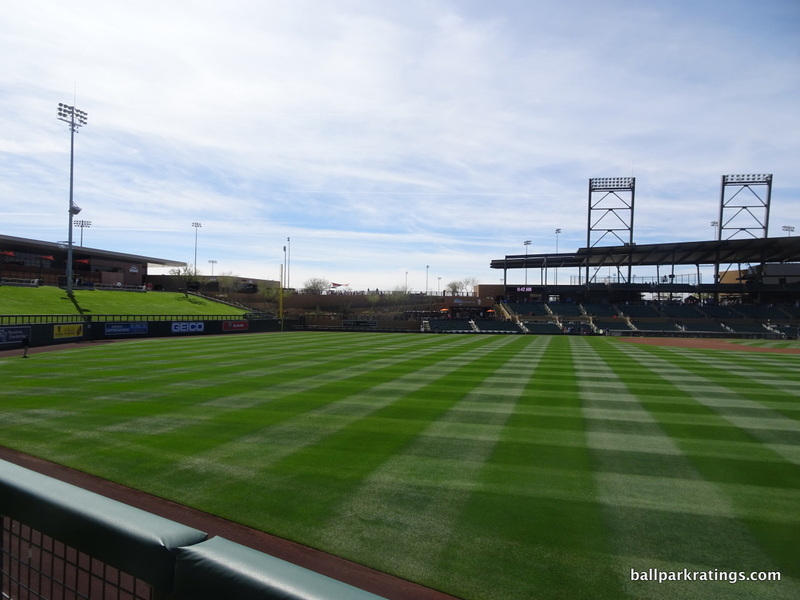 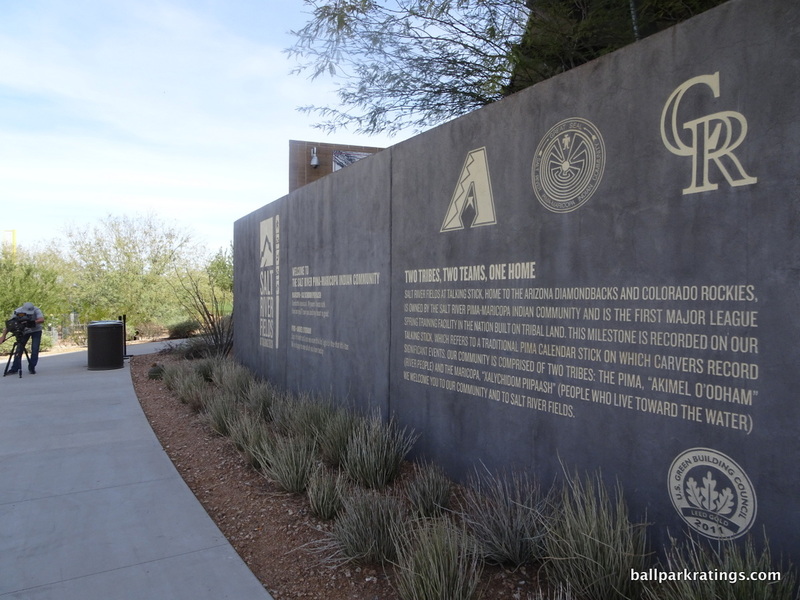 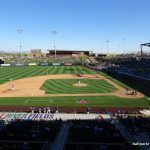 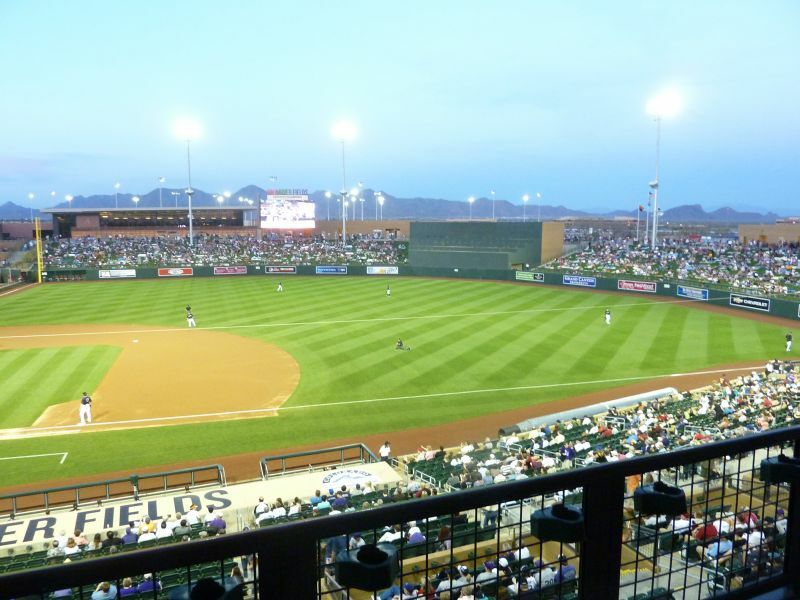 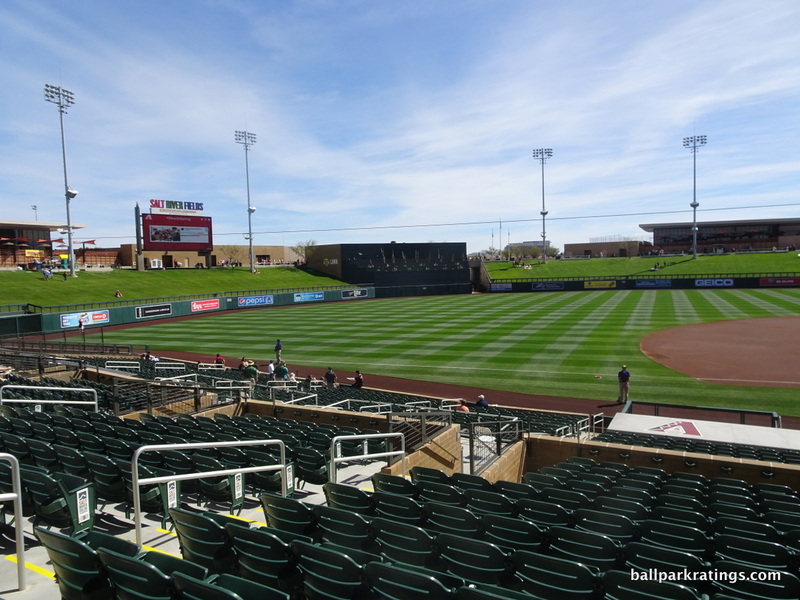 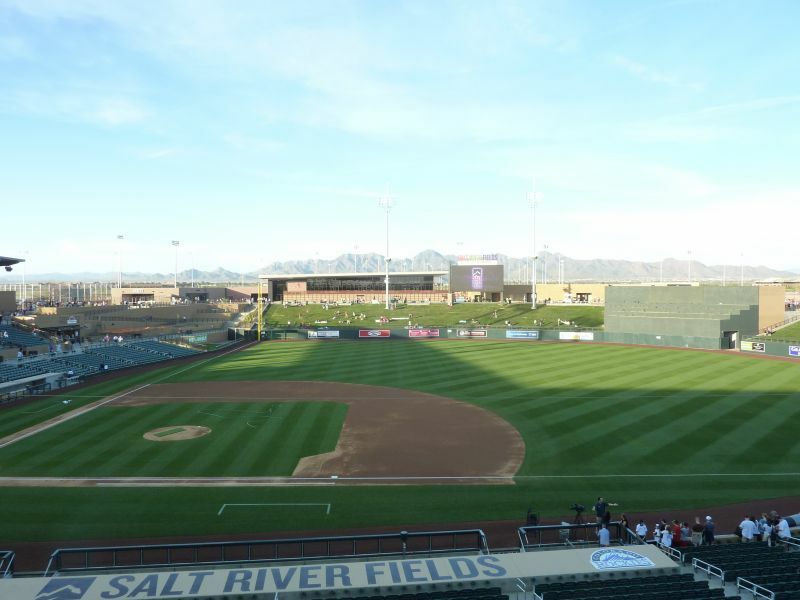 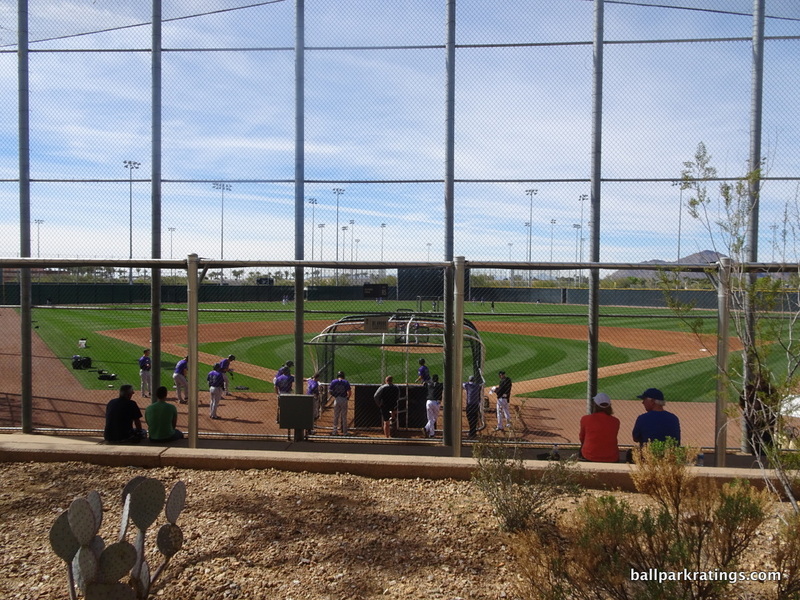 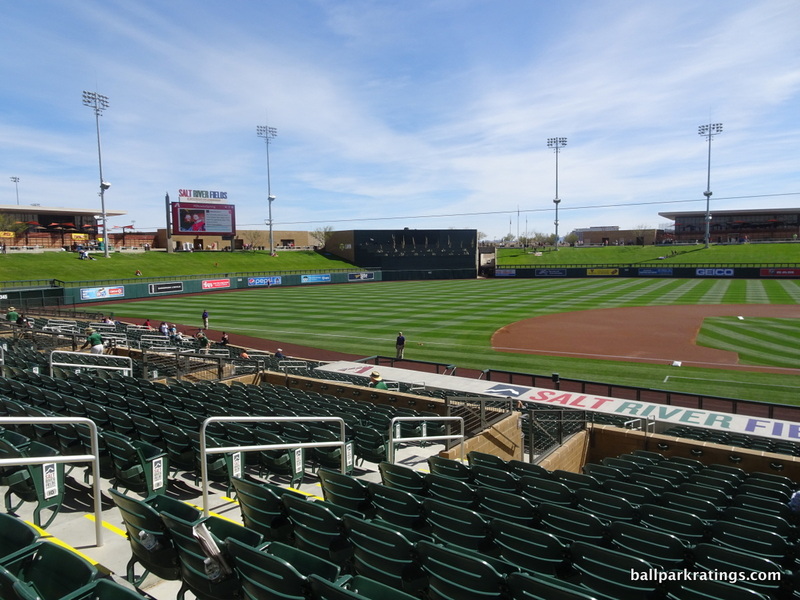 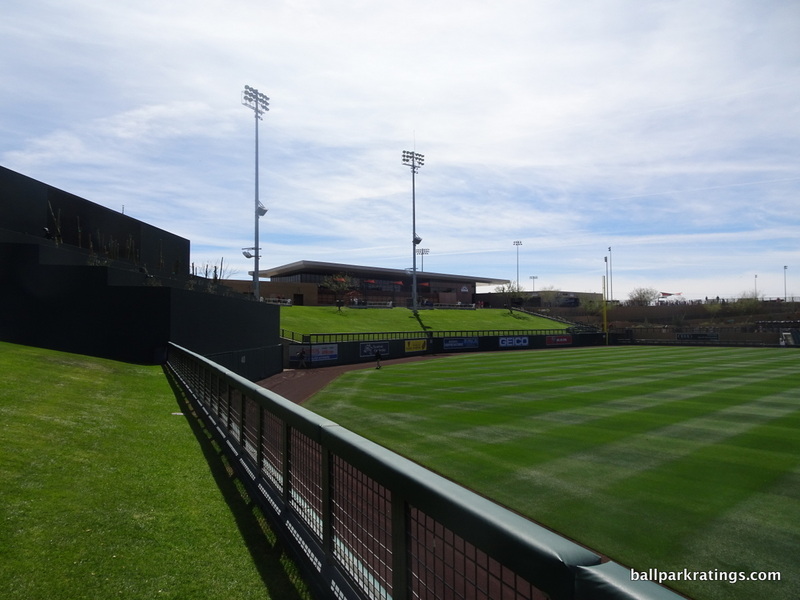 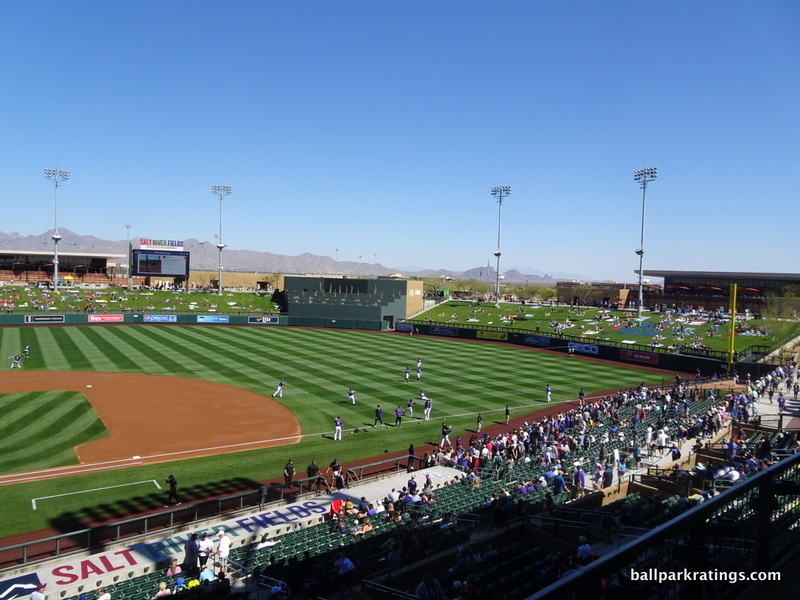 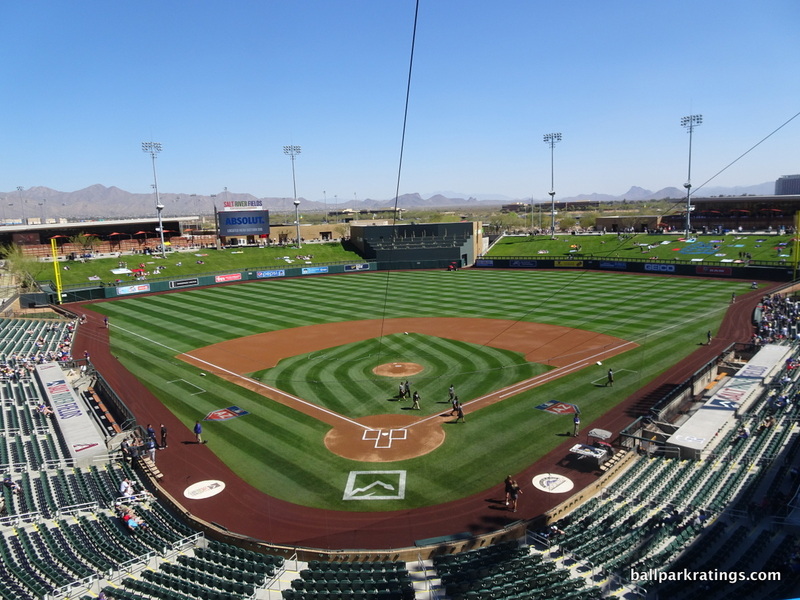 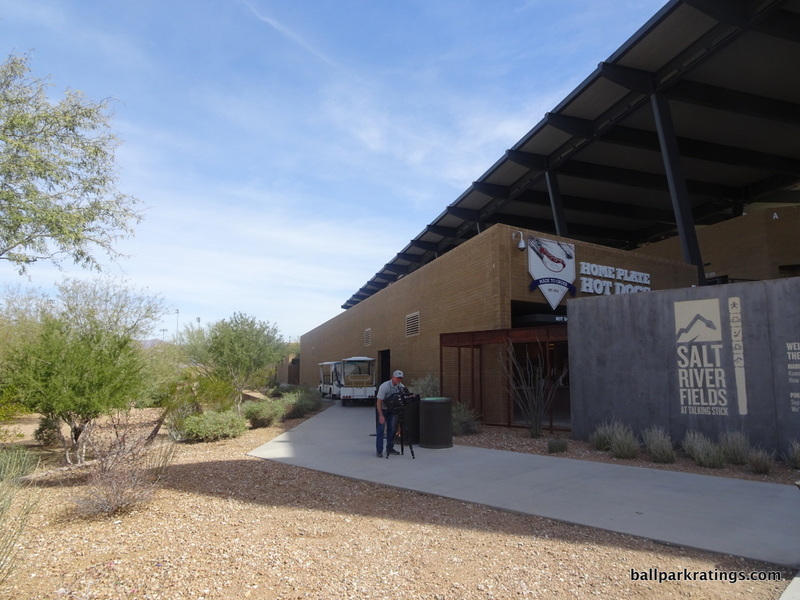 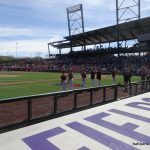 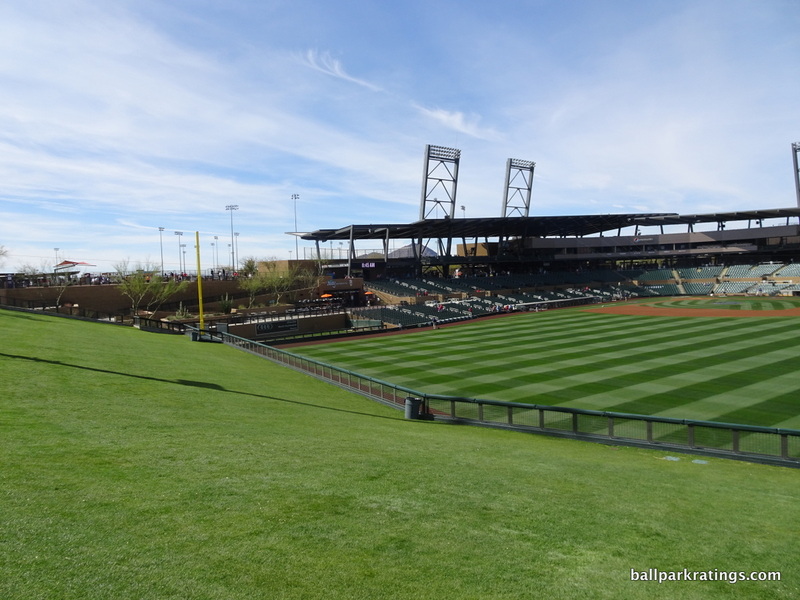 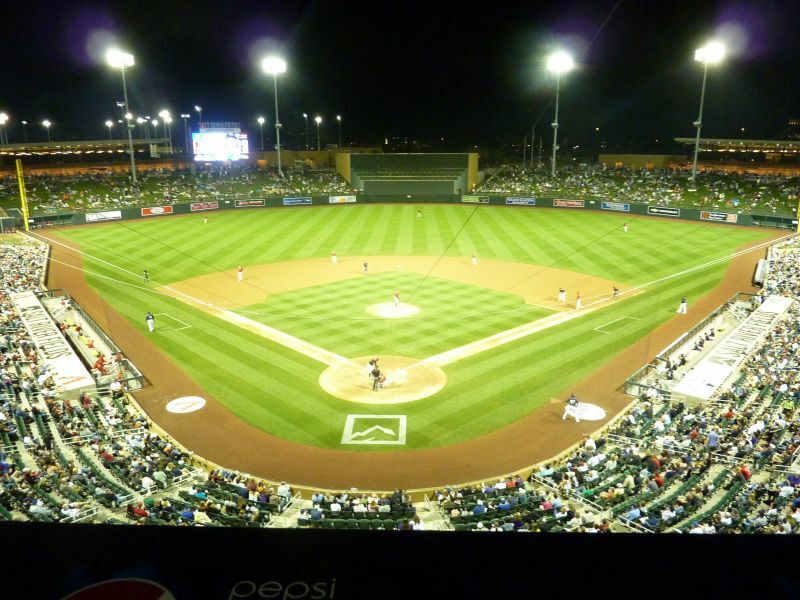 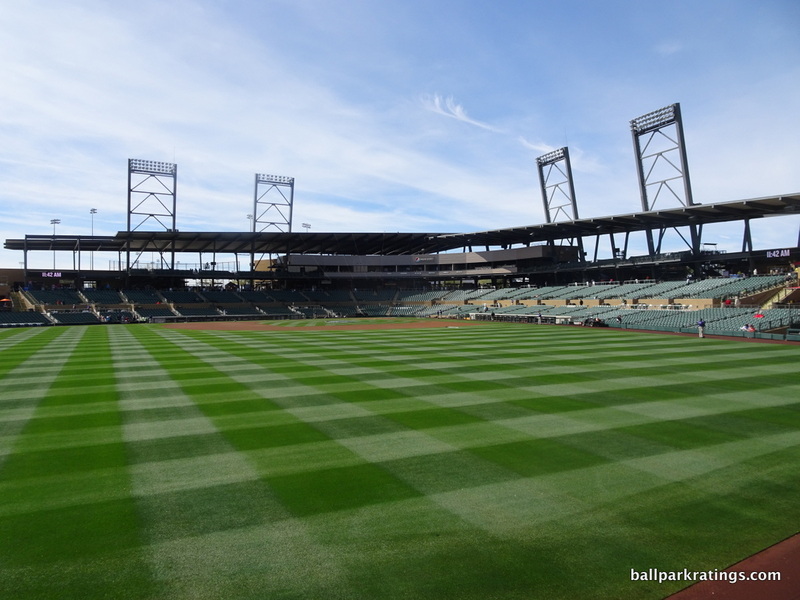 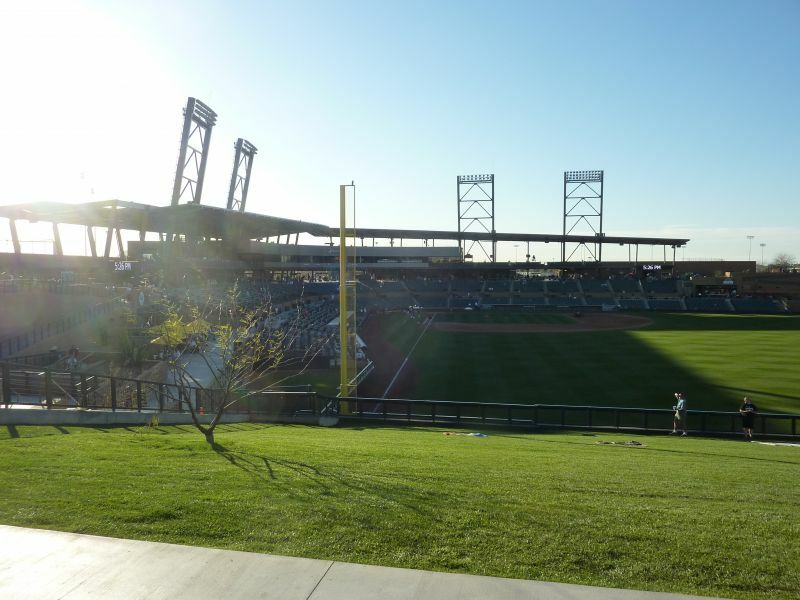 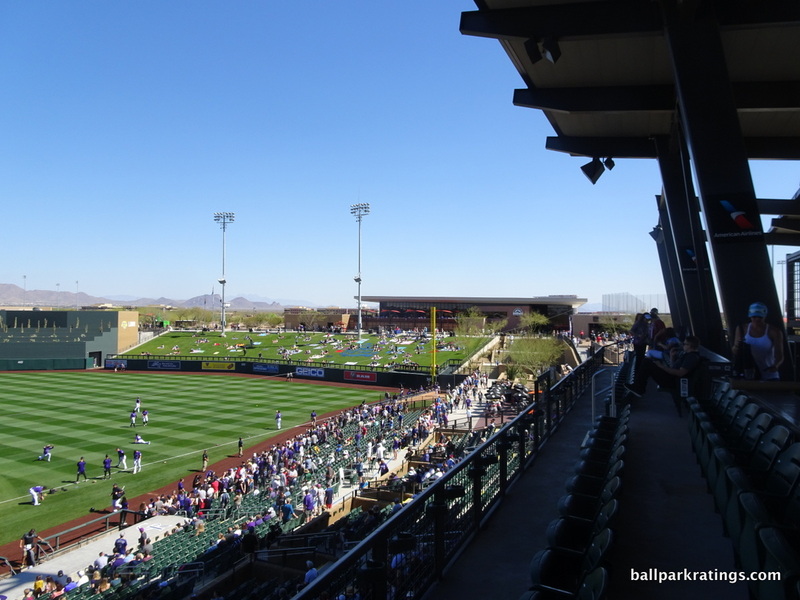 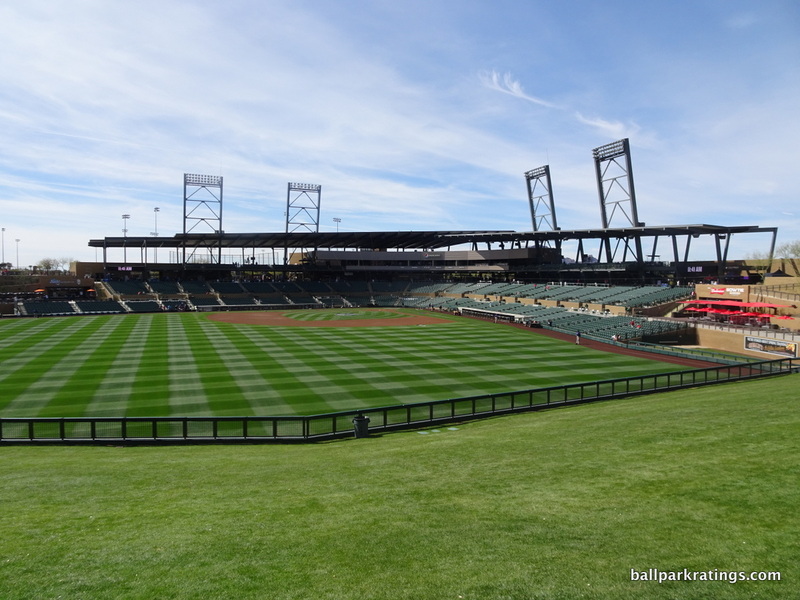 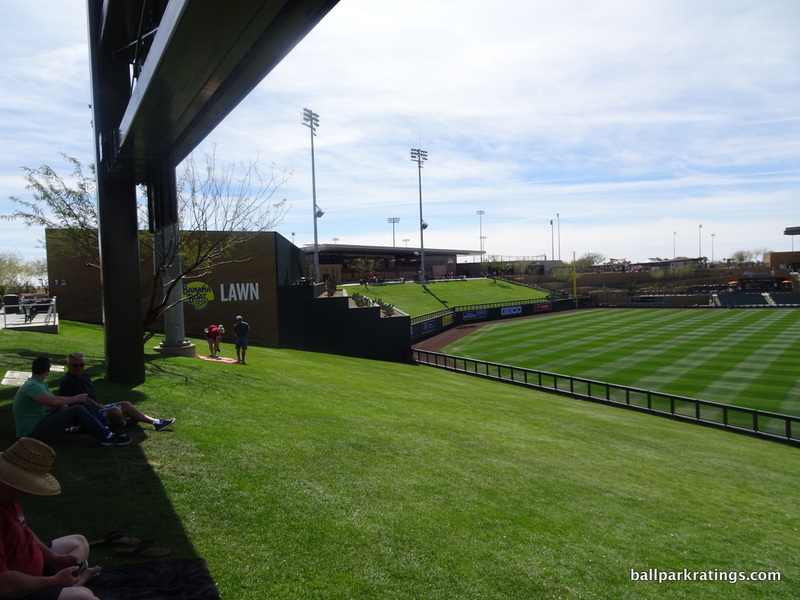 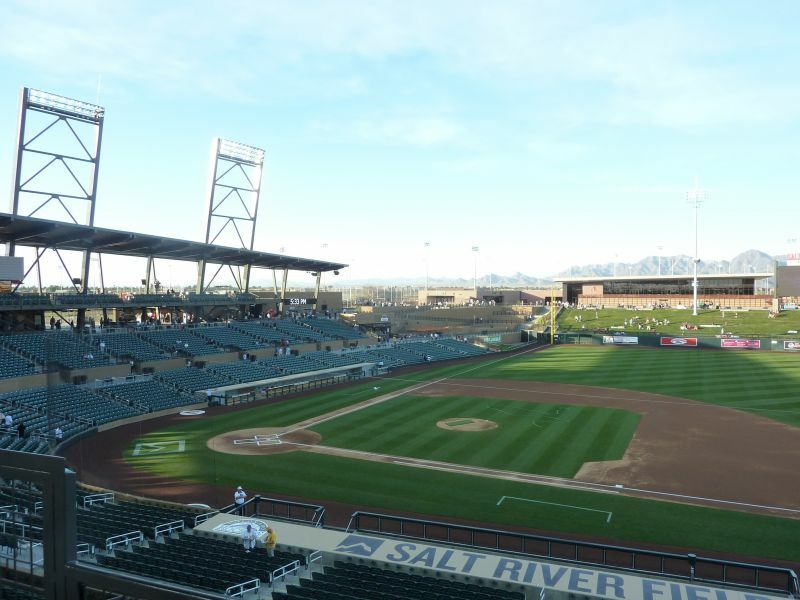 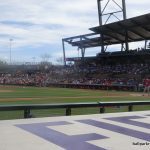 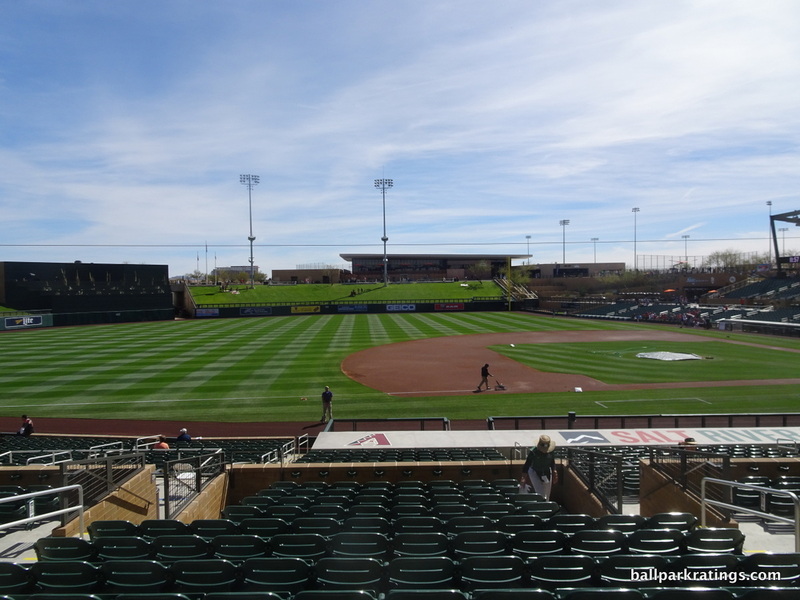 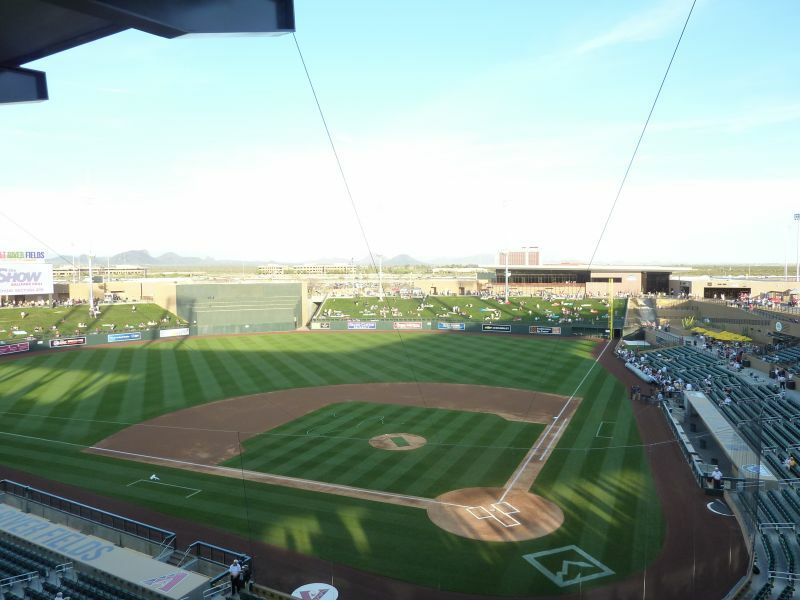 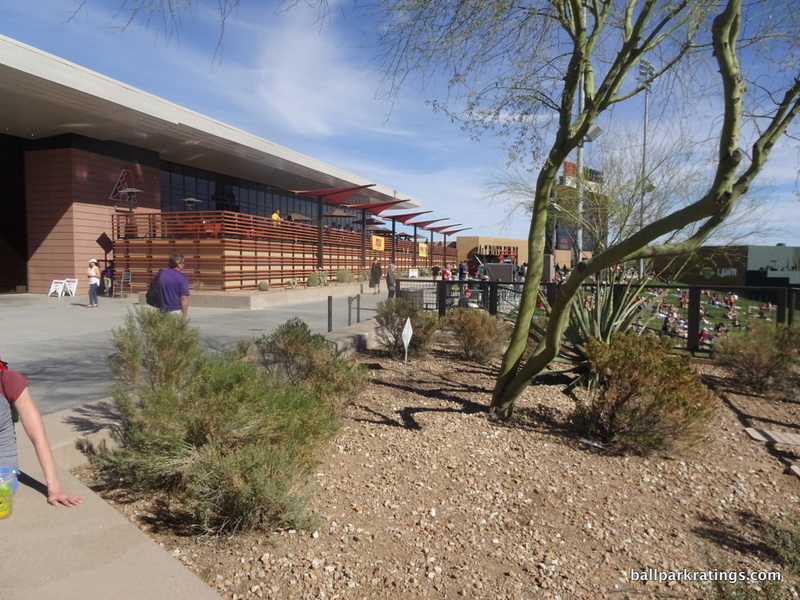 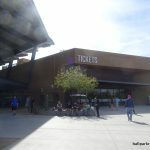 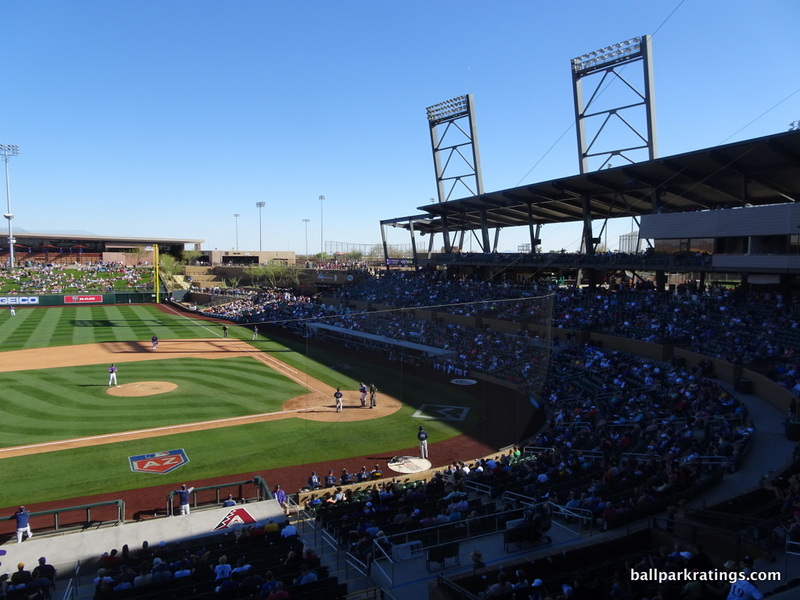 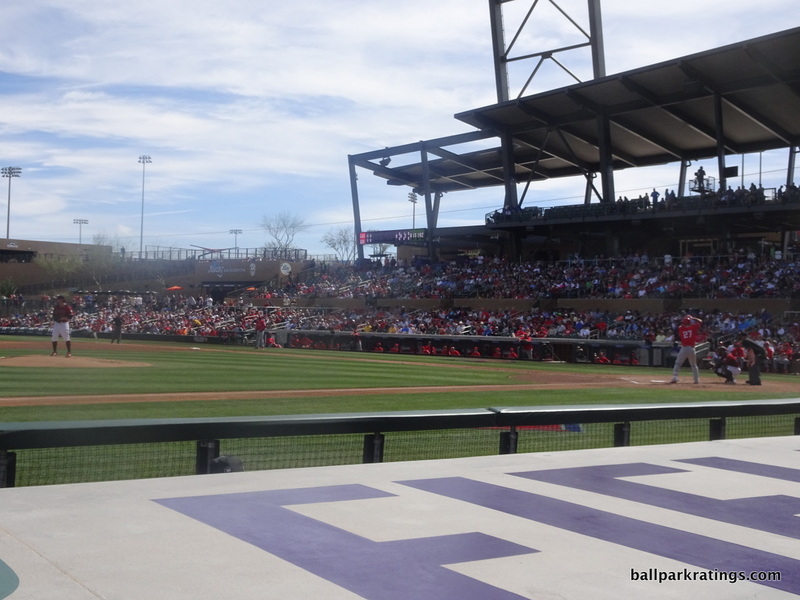 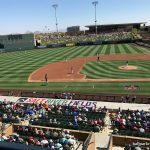 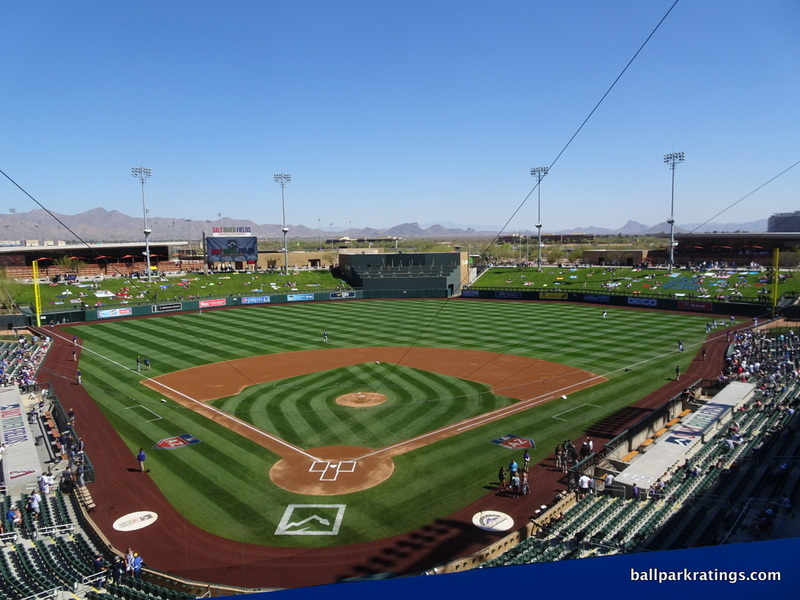 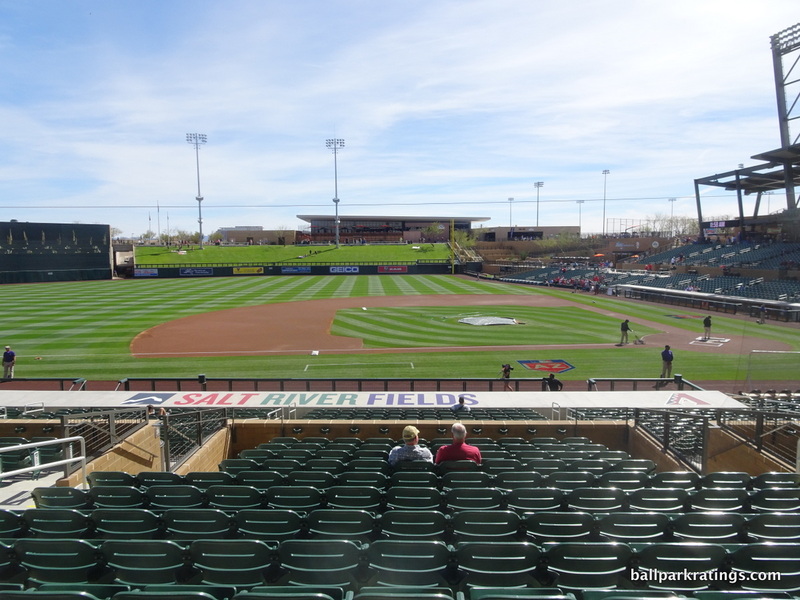 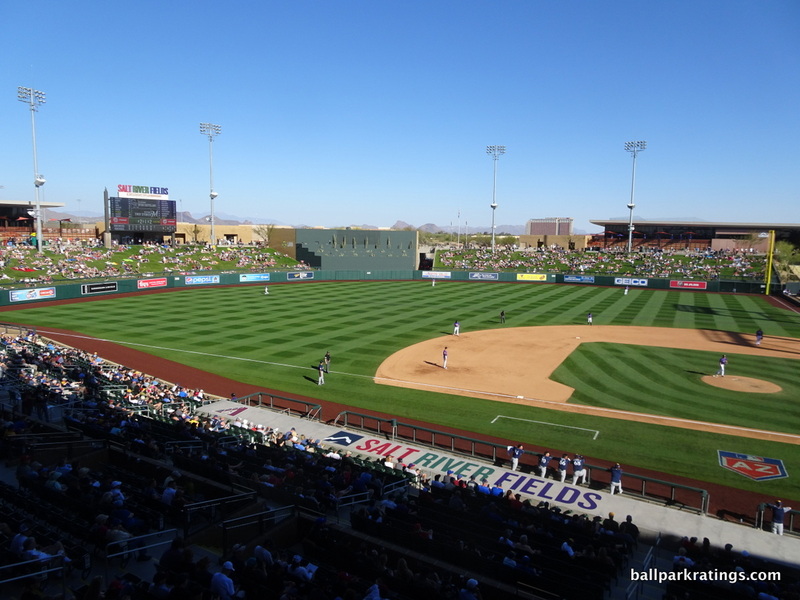 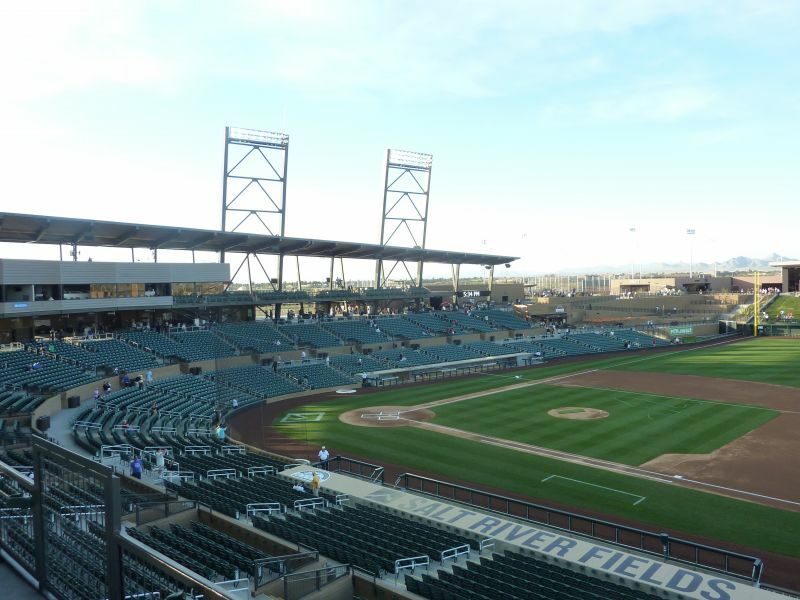 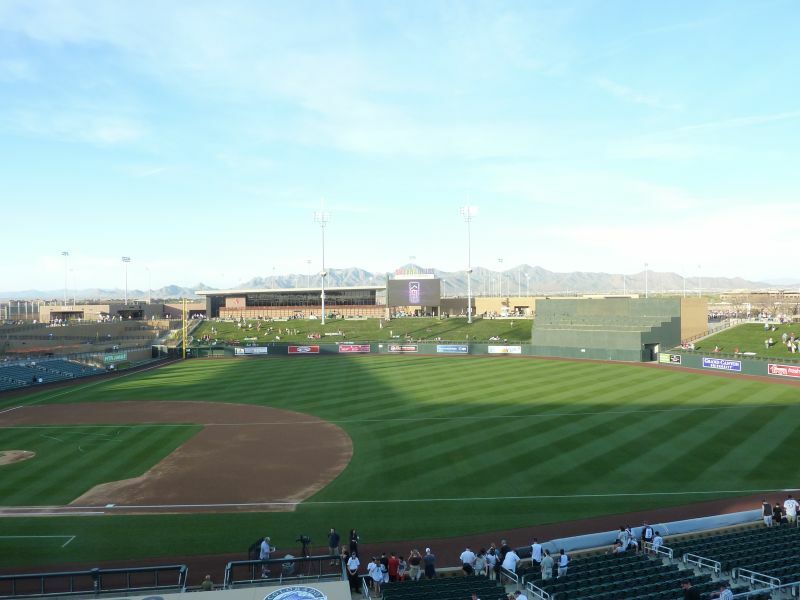 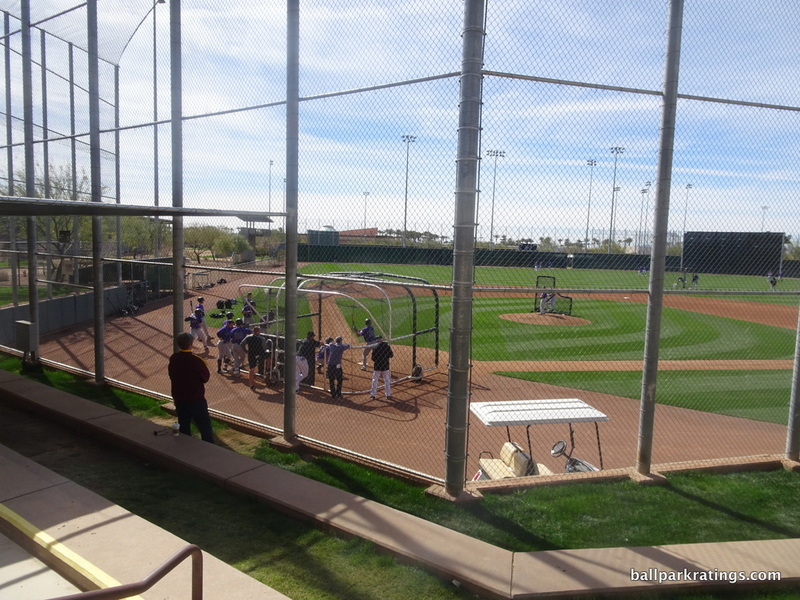 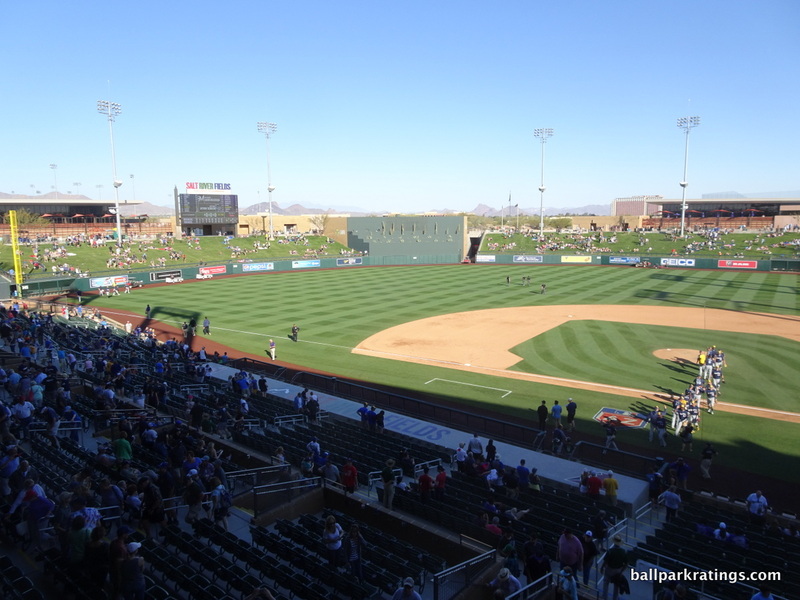 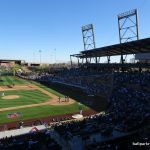 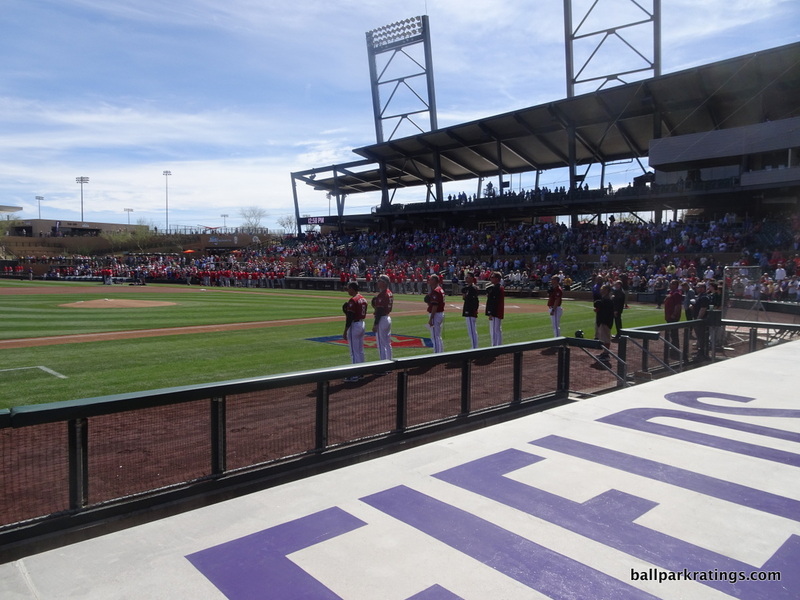 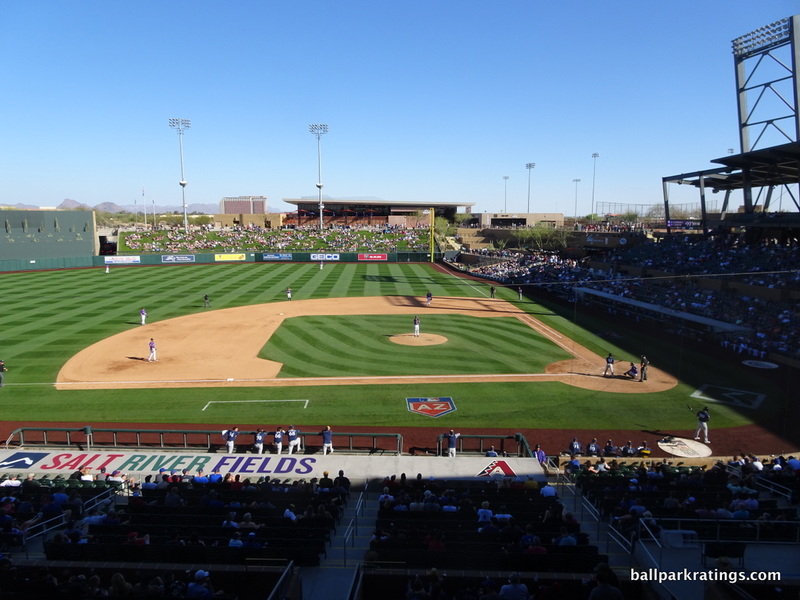 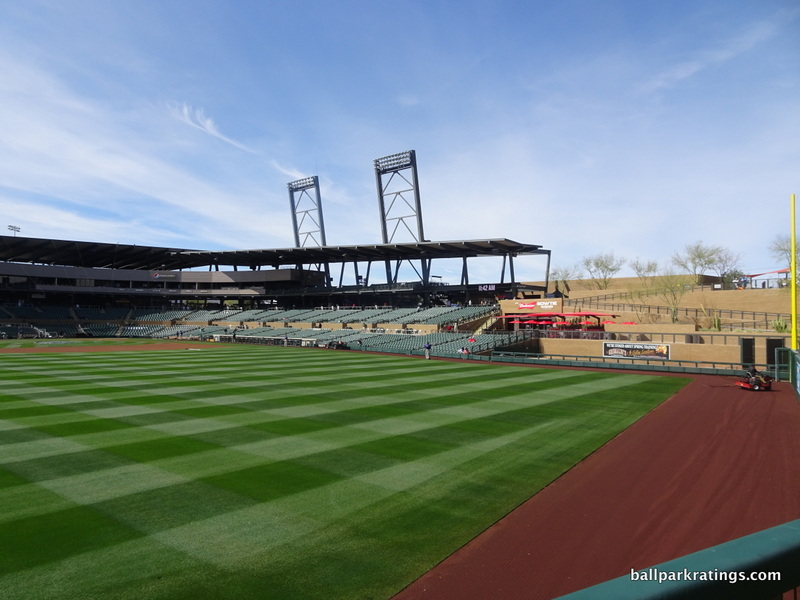 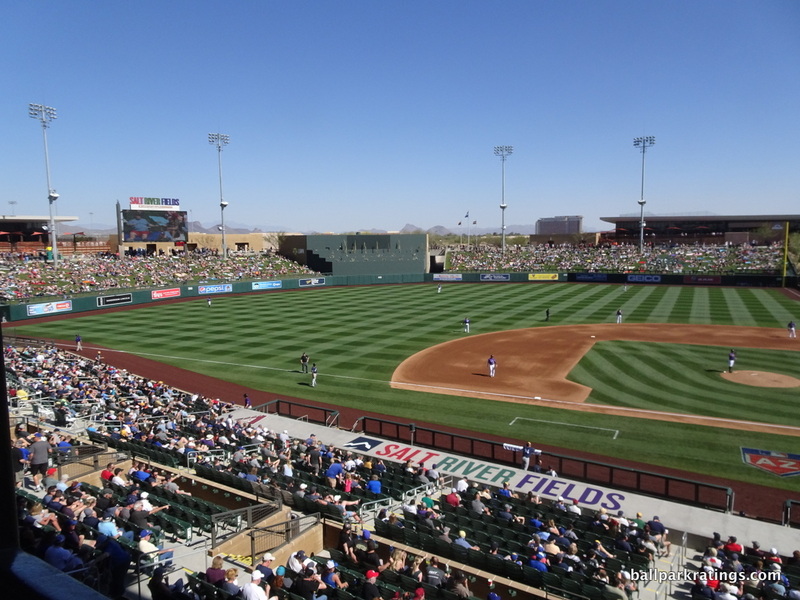 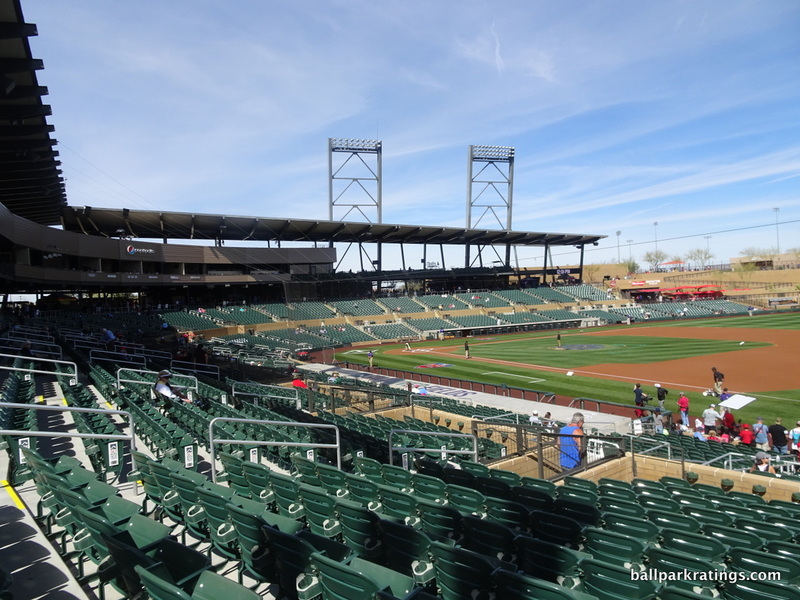 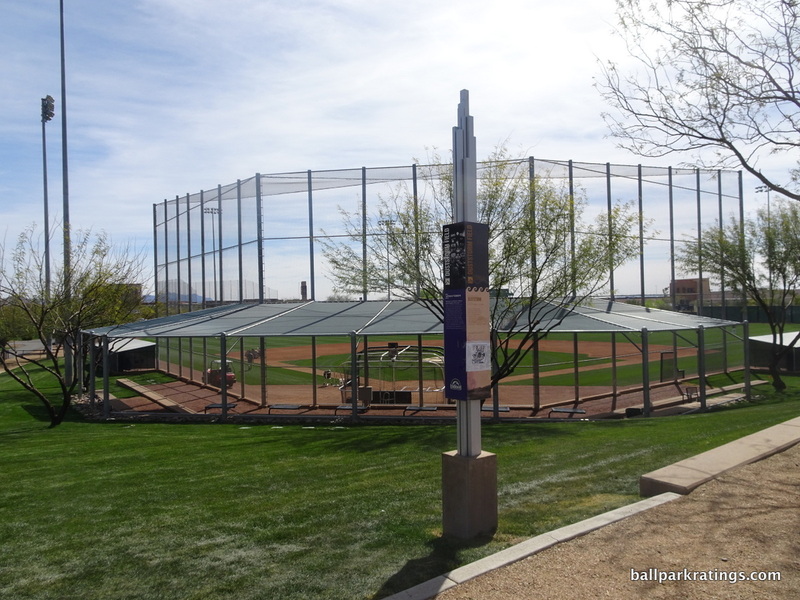 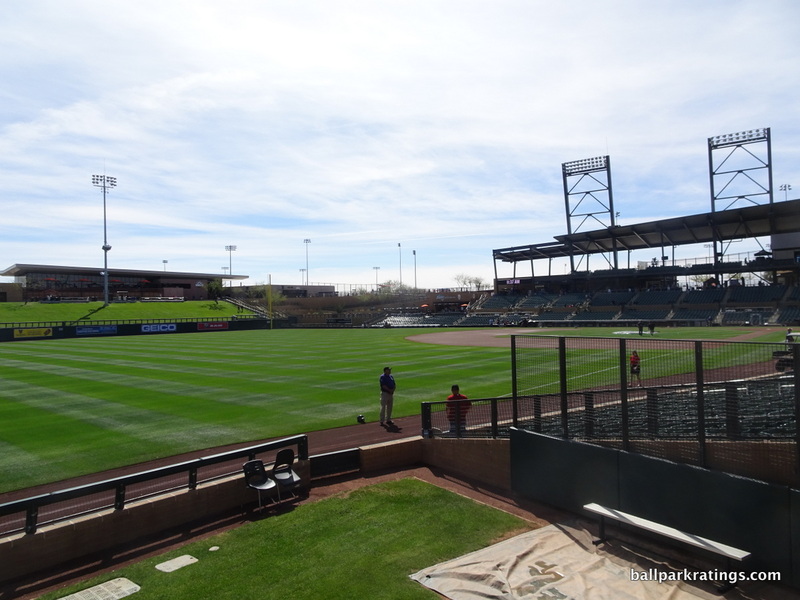 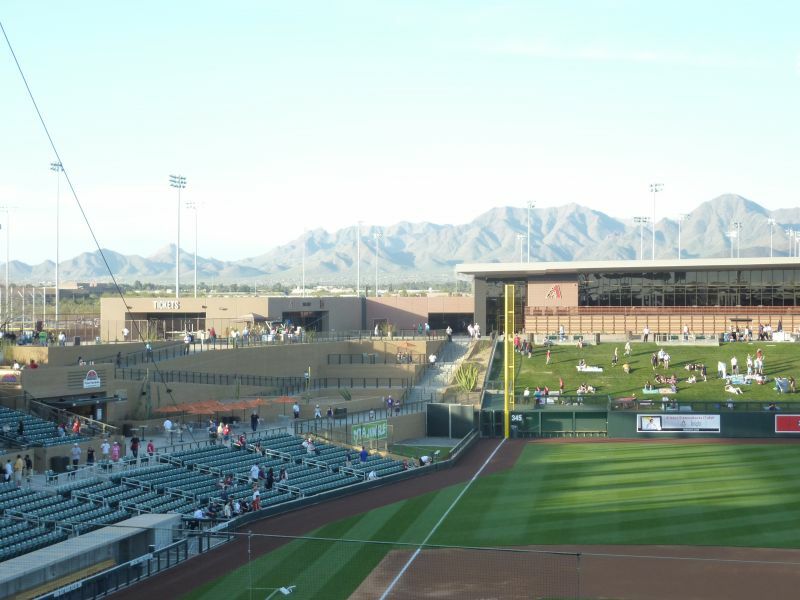 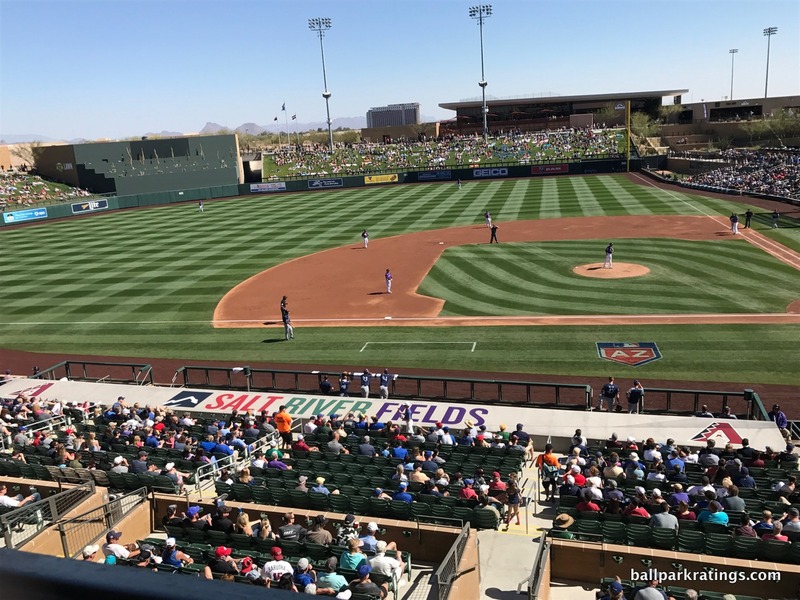 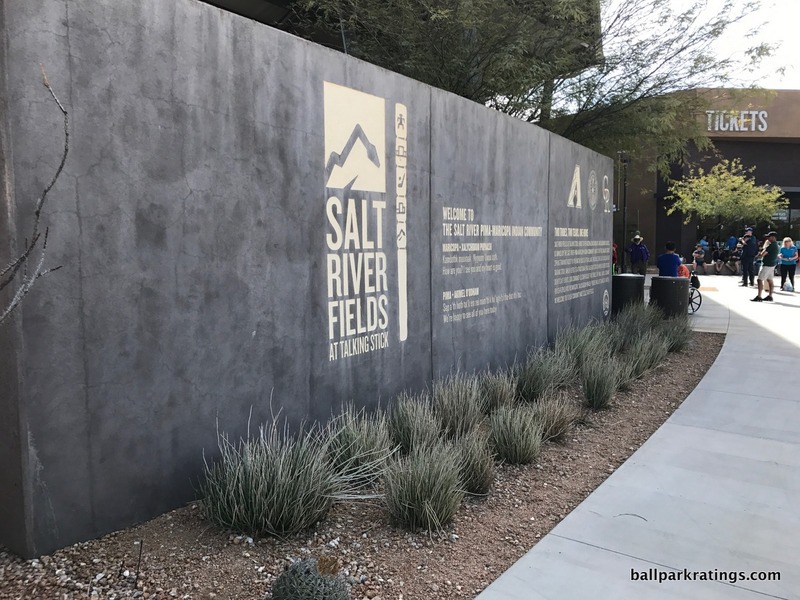 Arguably two of the best ballparks in America period, Salt River Fields at Talking Stick and Camelback Ranch have set the standard, towering far above anything spring training has ever seen. 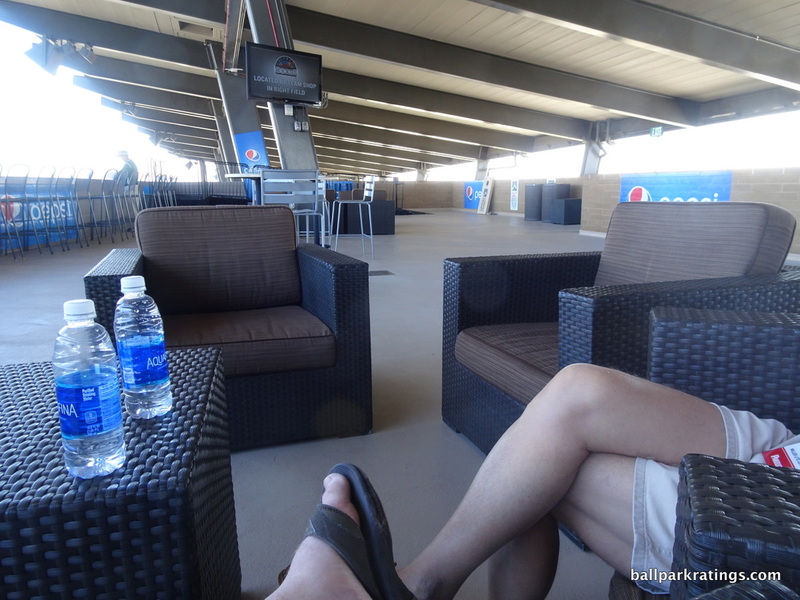 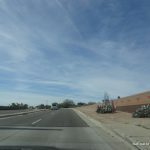 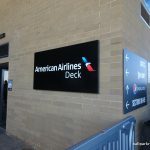 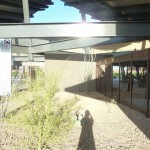 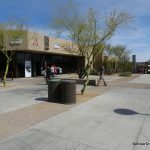 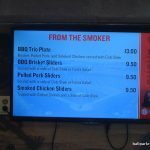 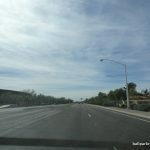 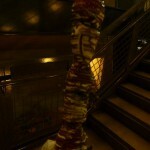 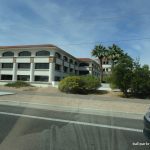 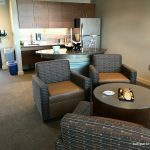 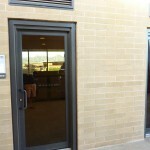 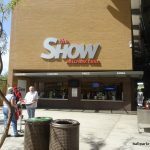 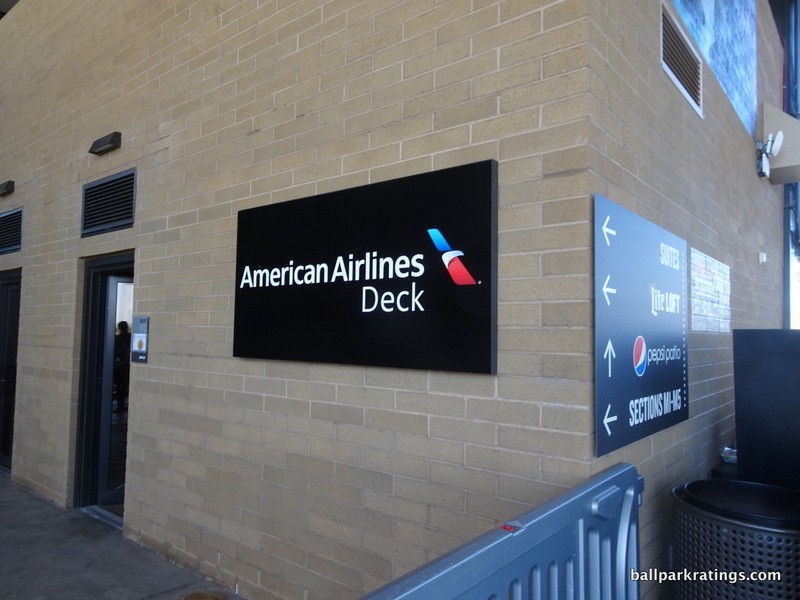 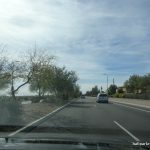 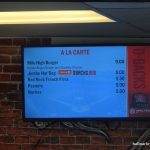 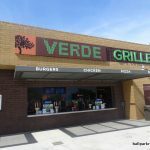 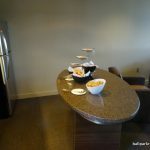 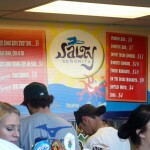 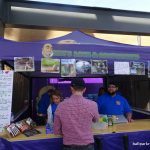 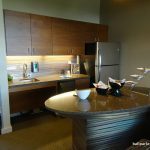 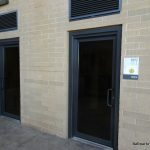 Check out the photo gallery and come back soon for an epic review!